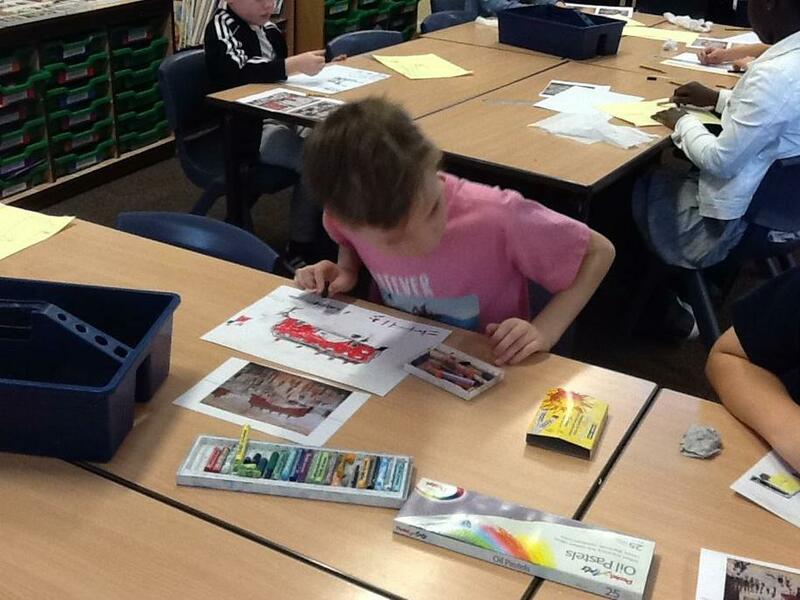 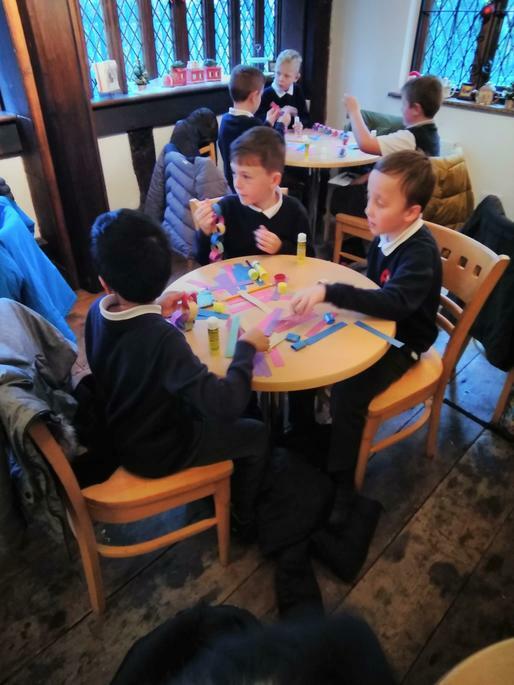 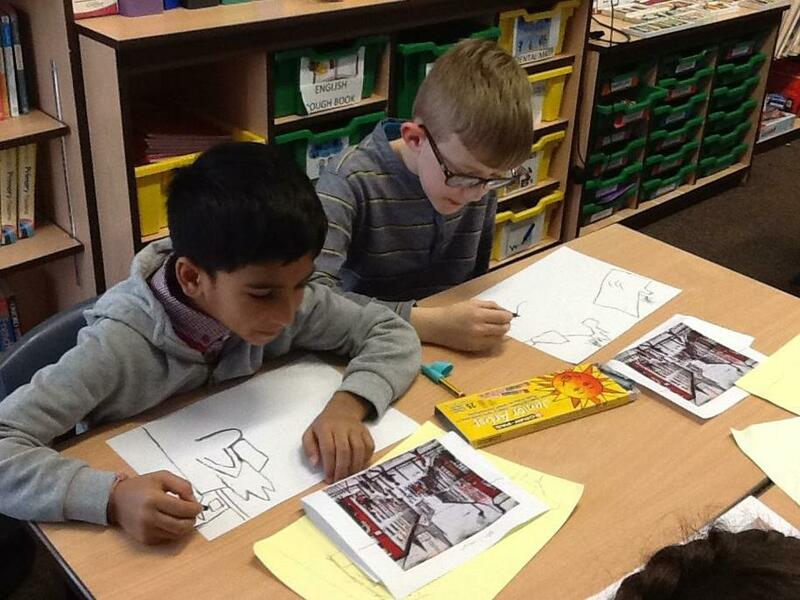 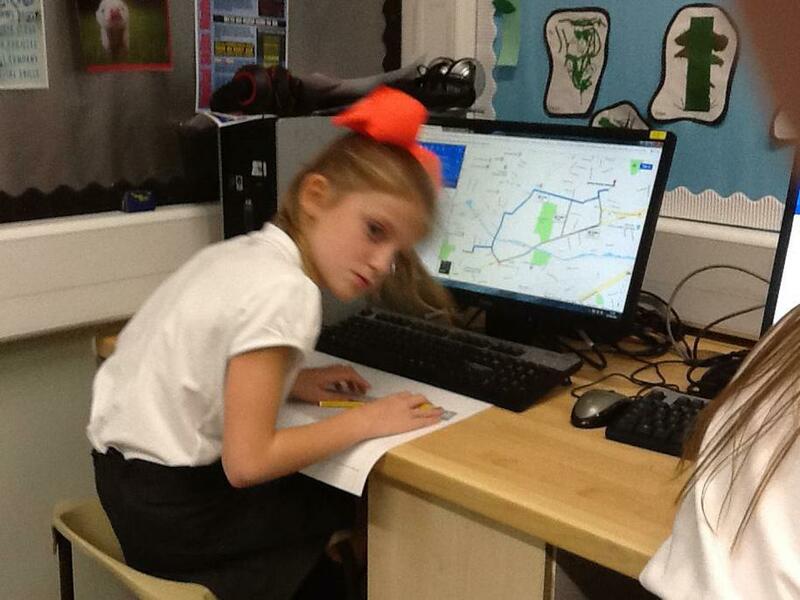 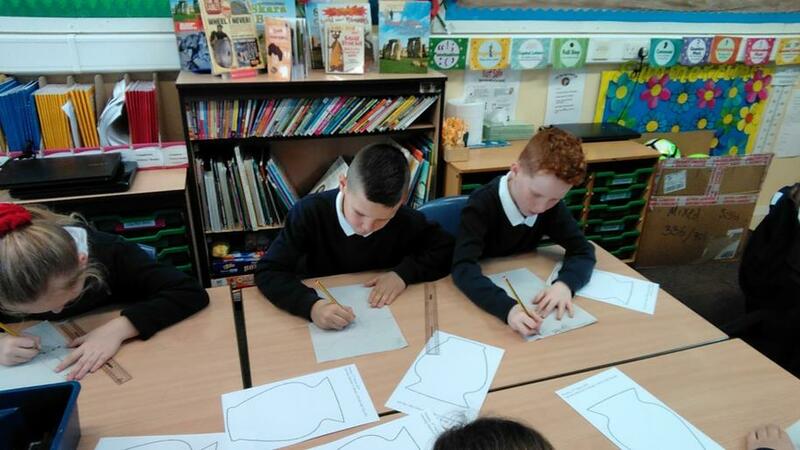 This term, we are learning about our local area. 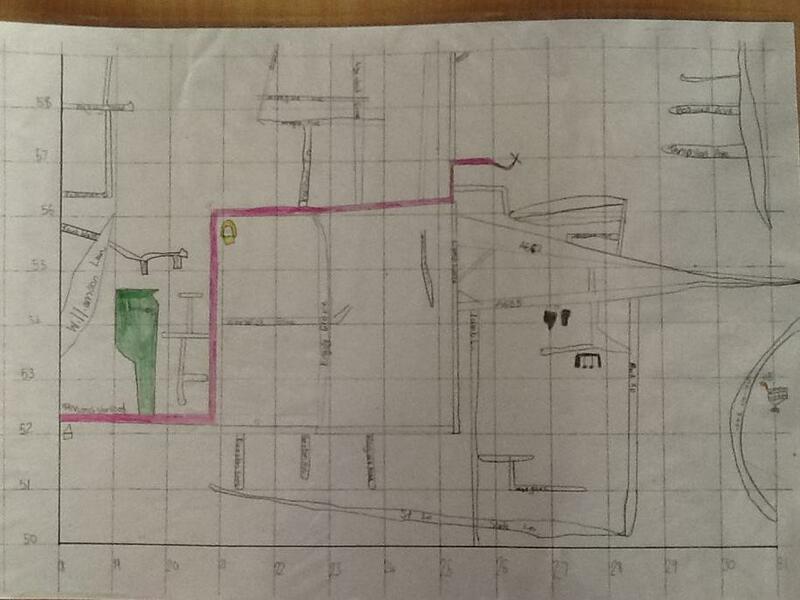 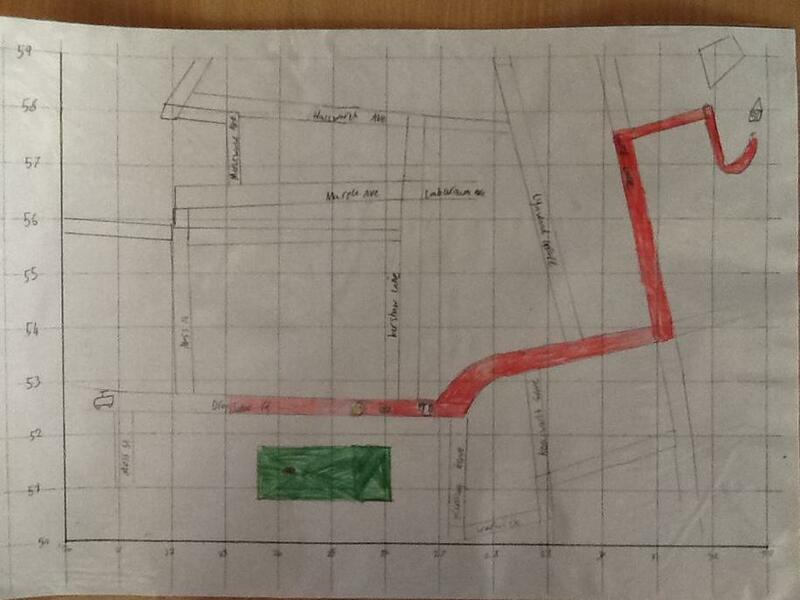 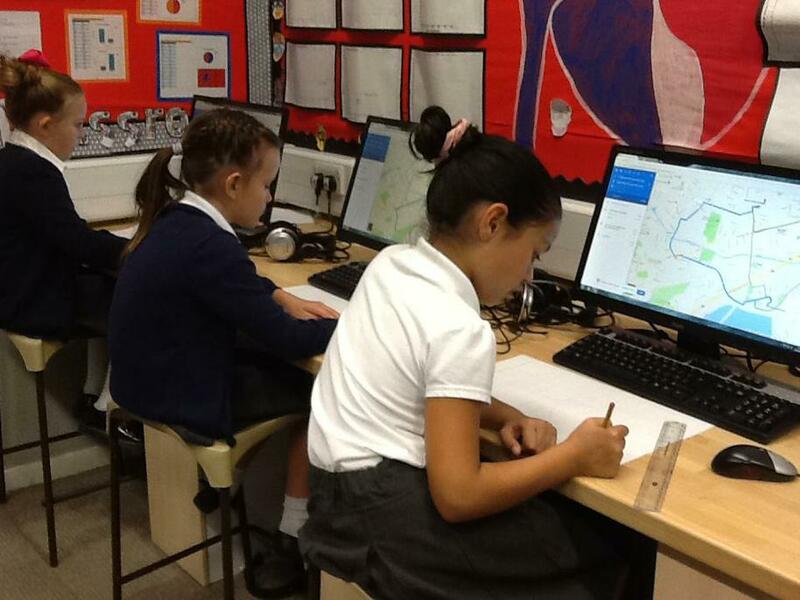 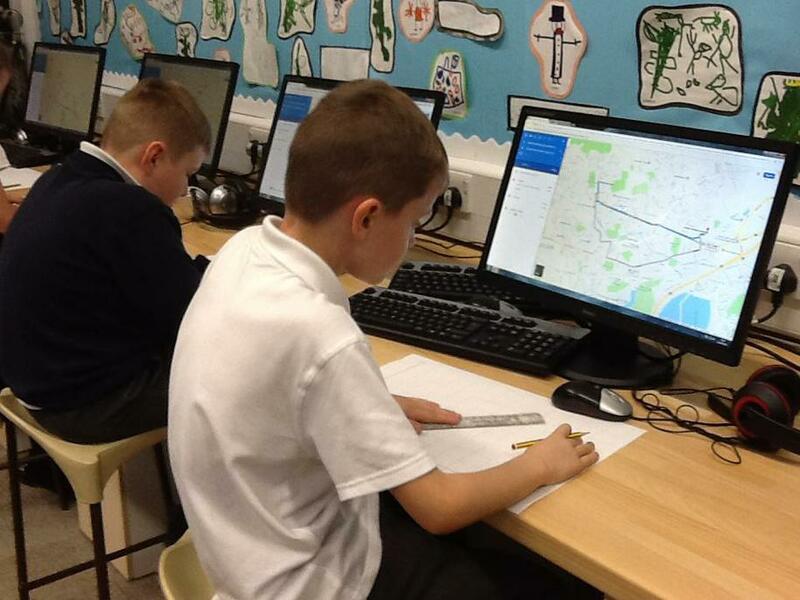 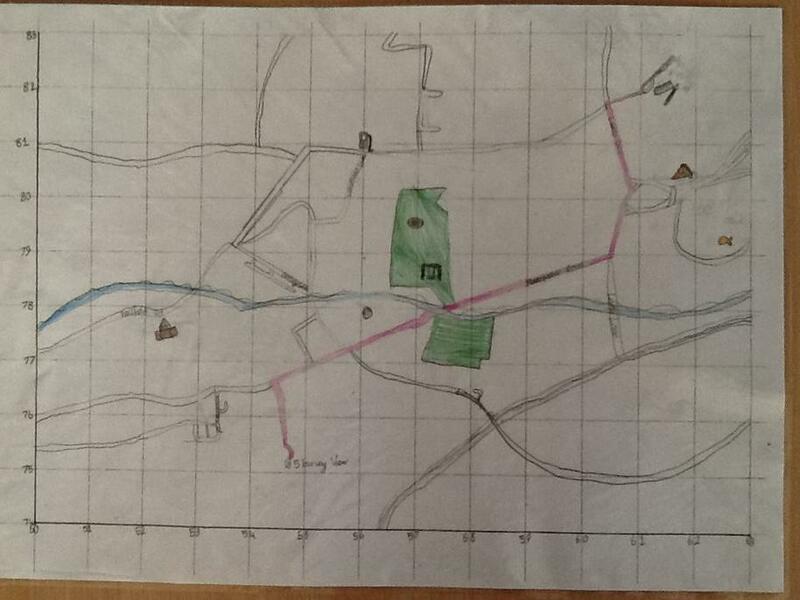 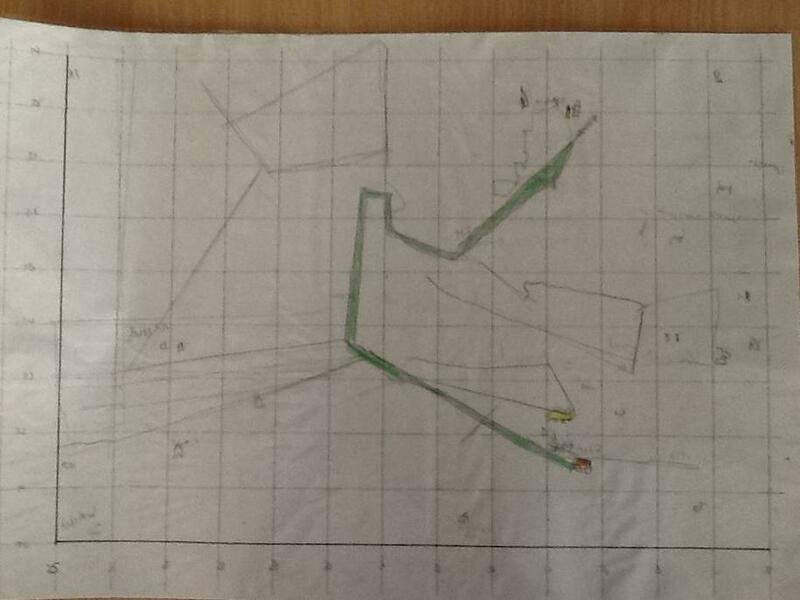 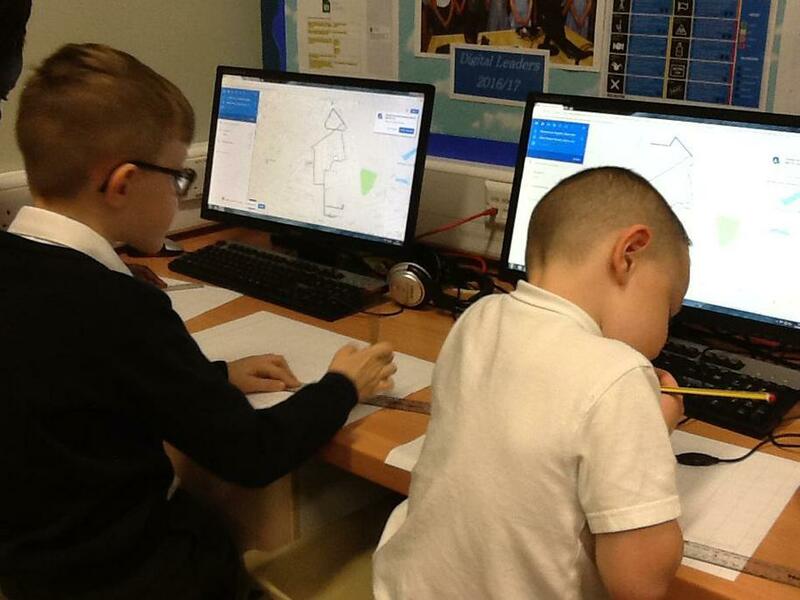 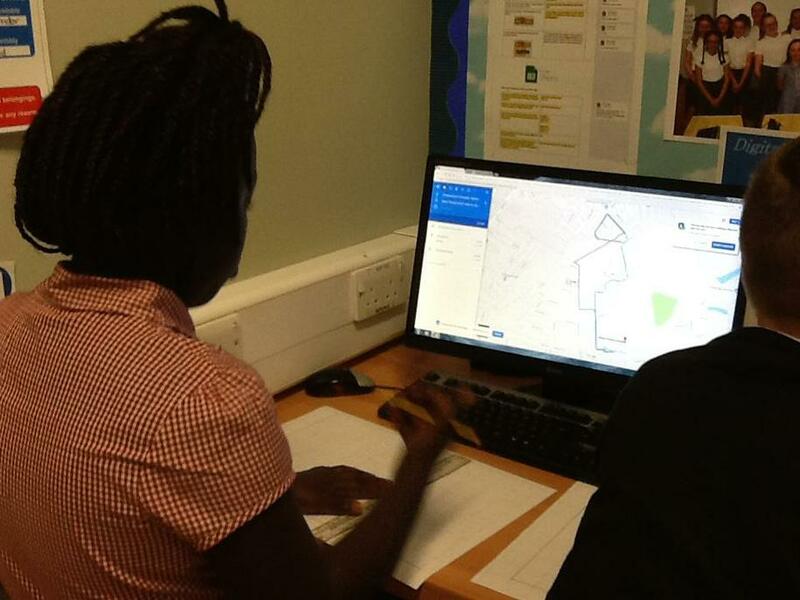 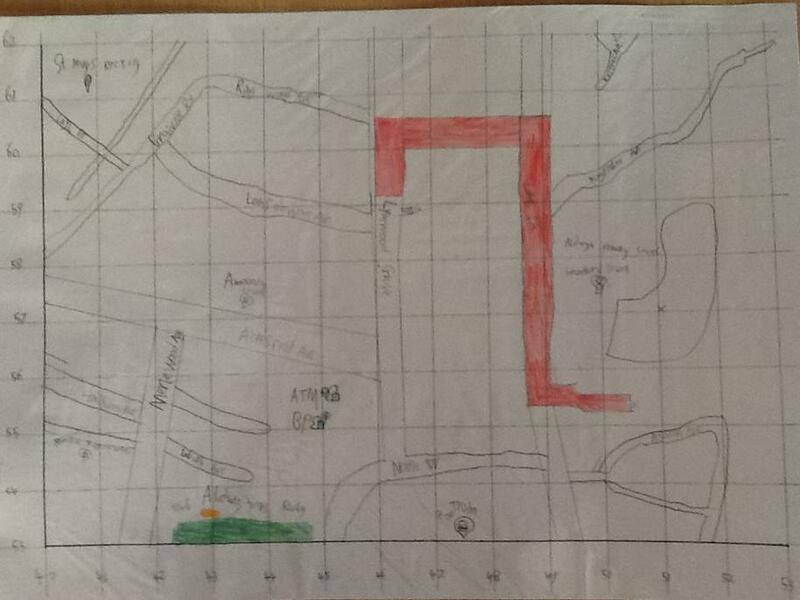 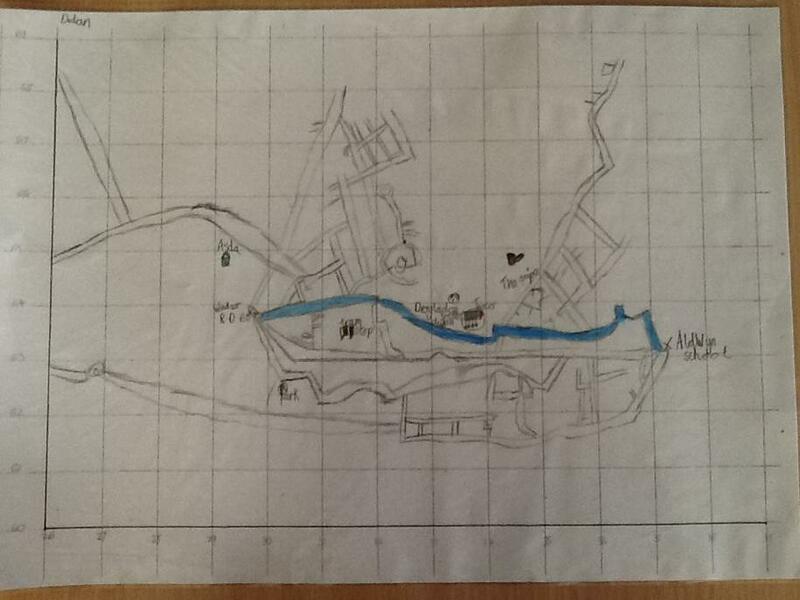 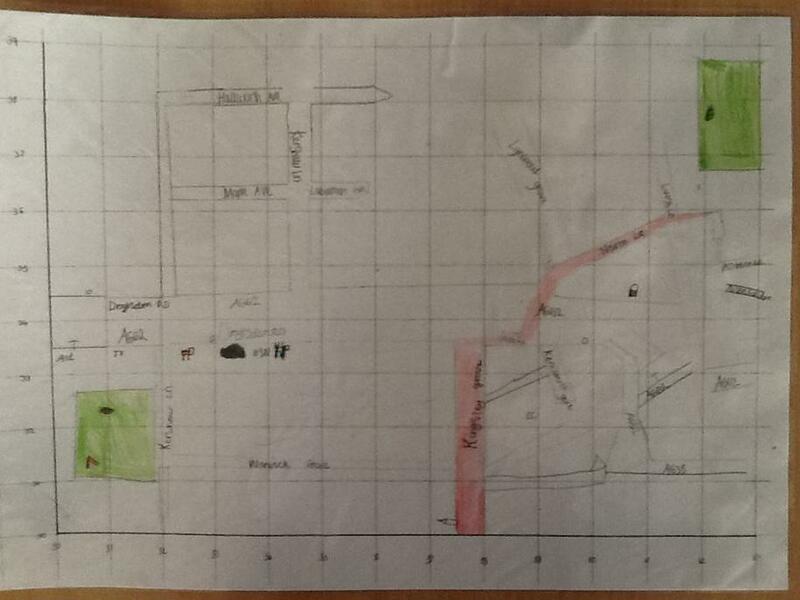 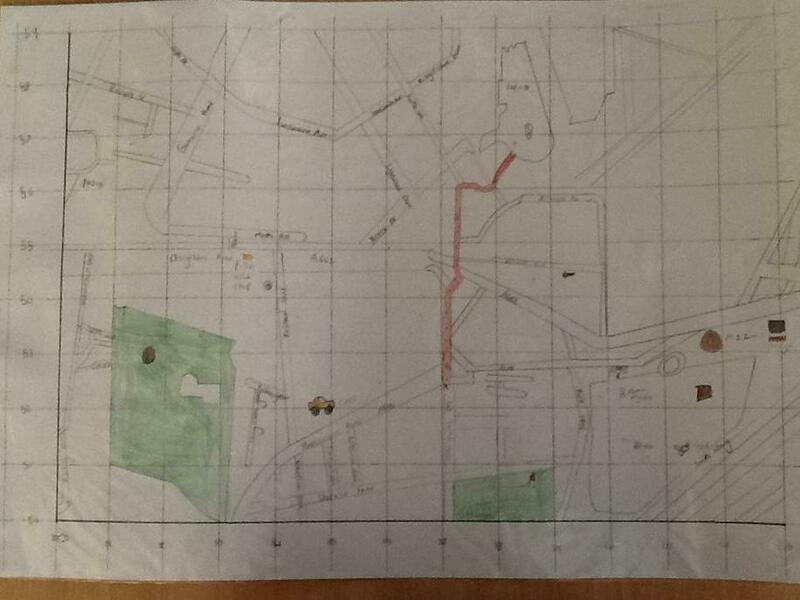 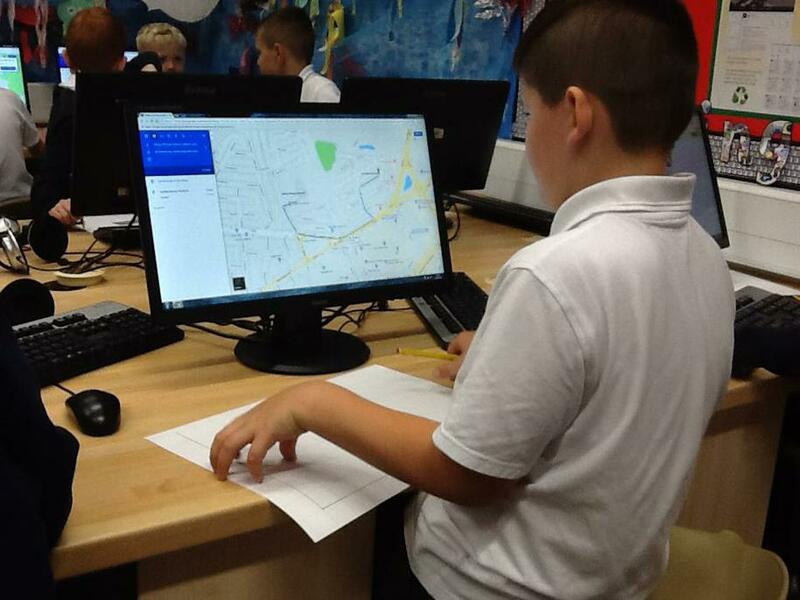 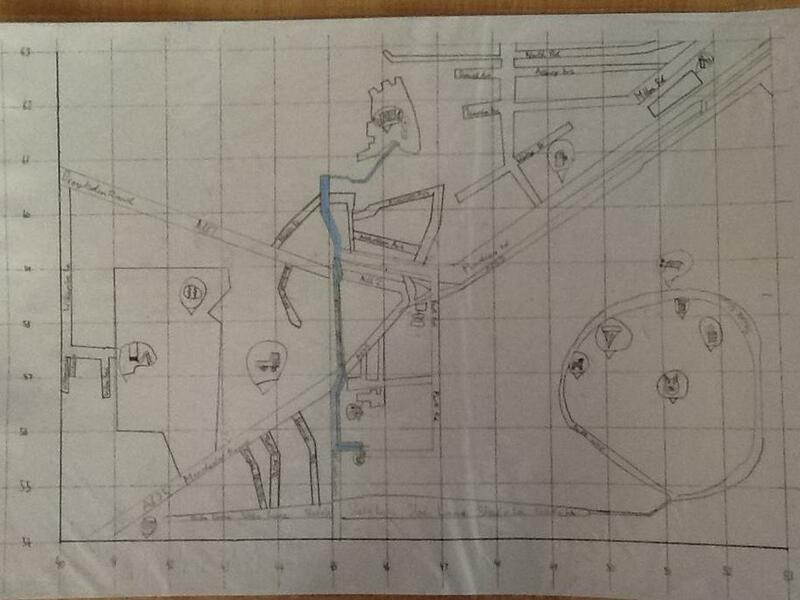 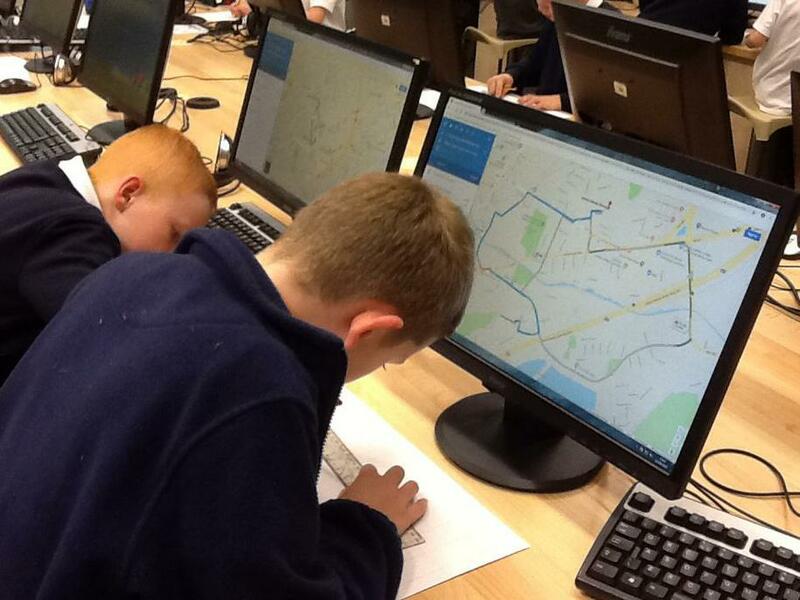 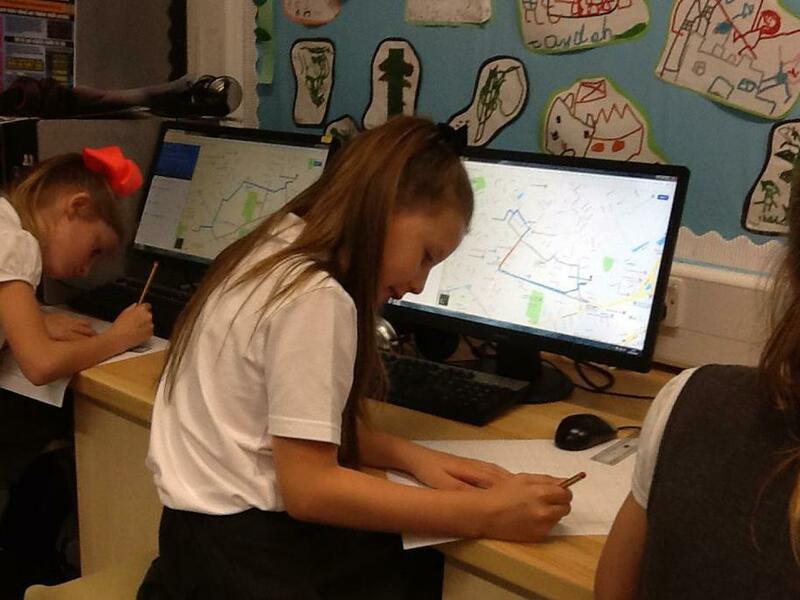 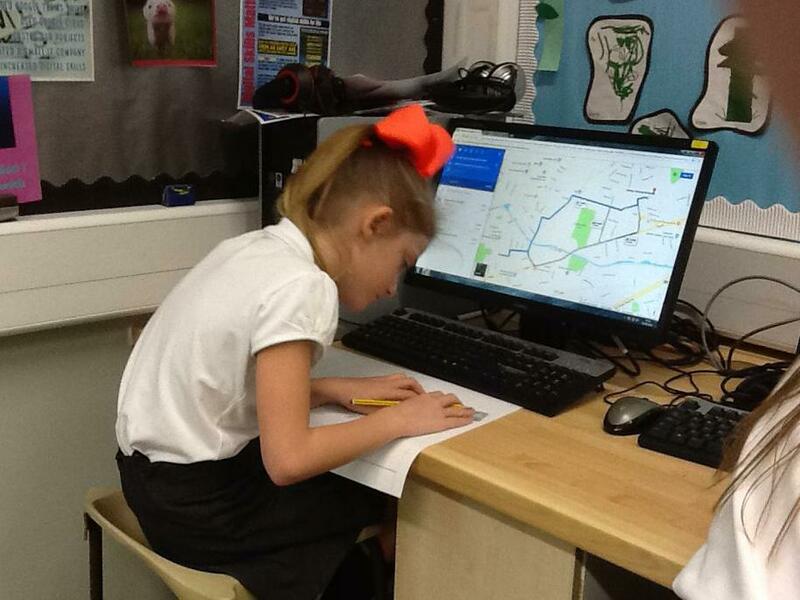 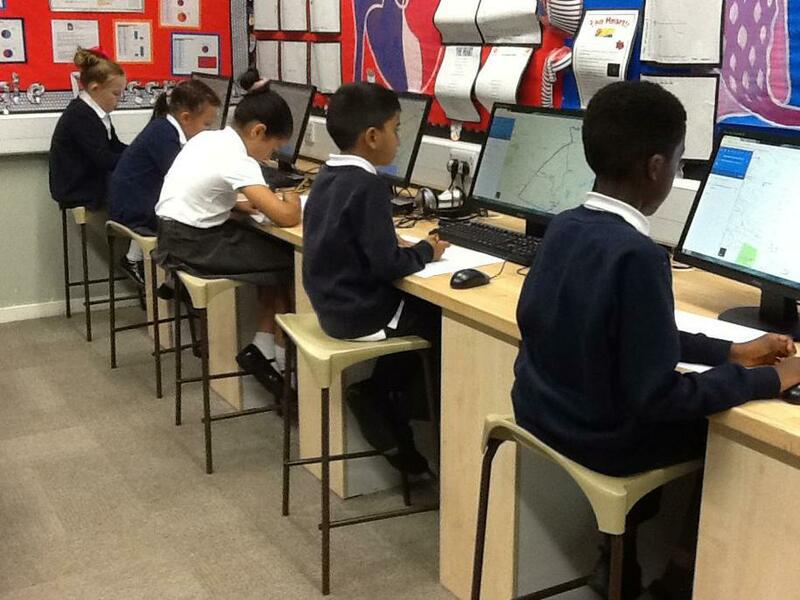 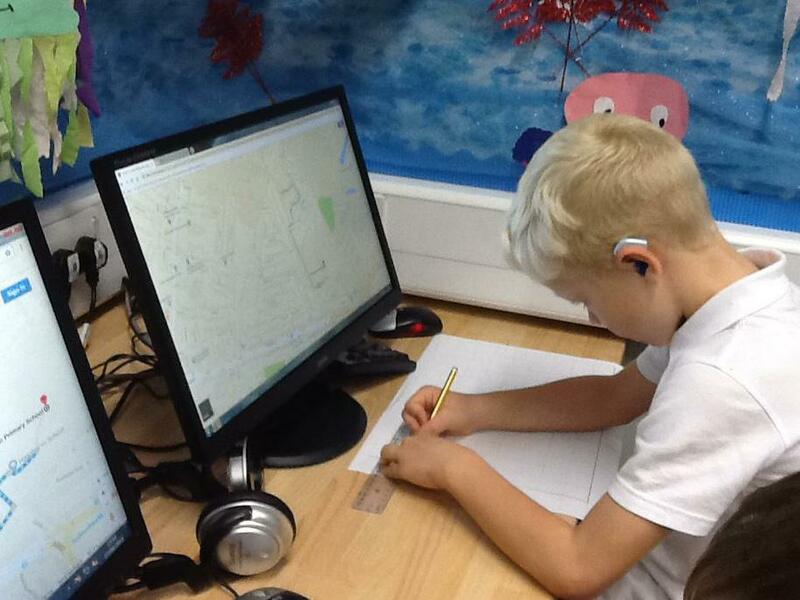 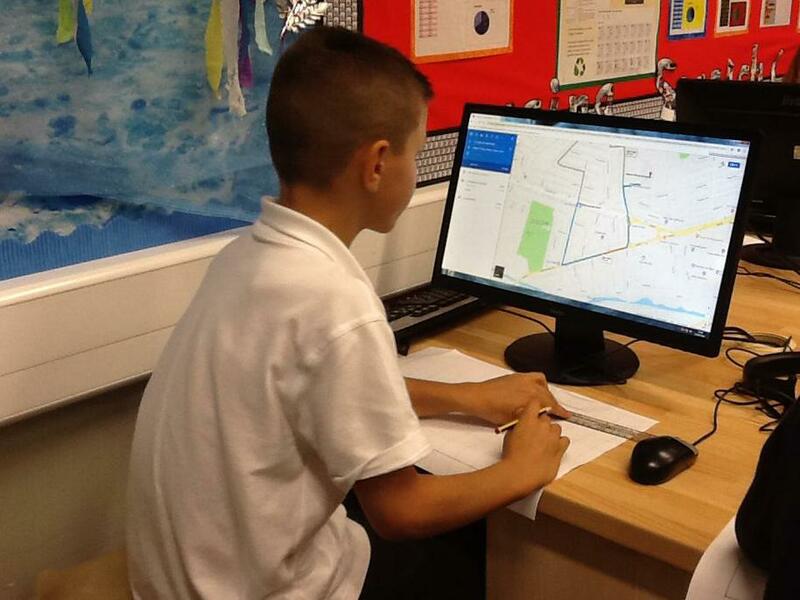 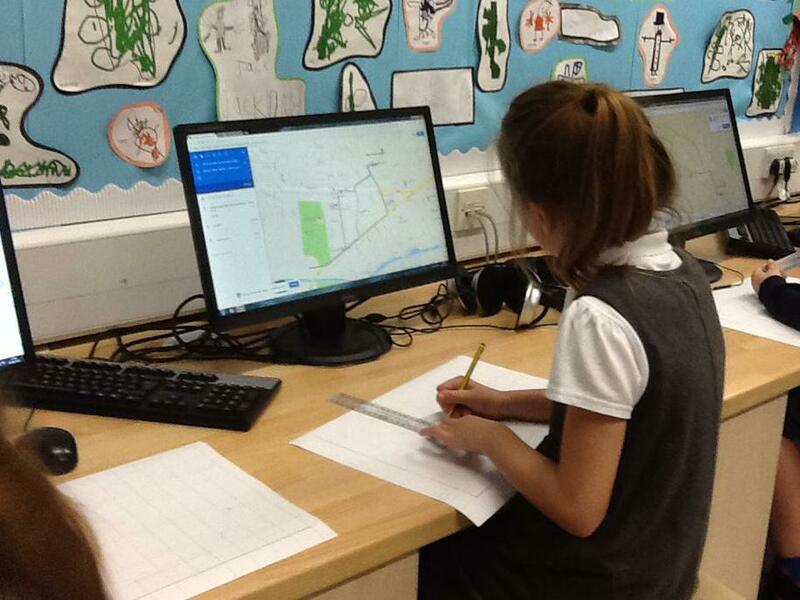 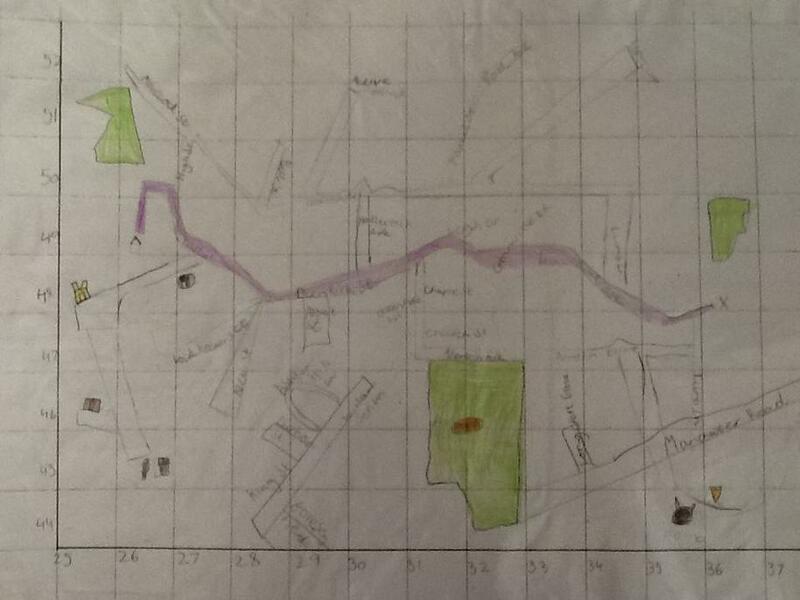 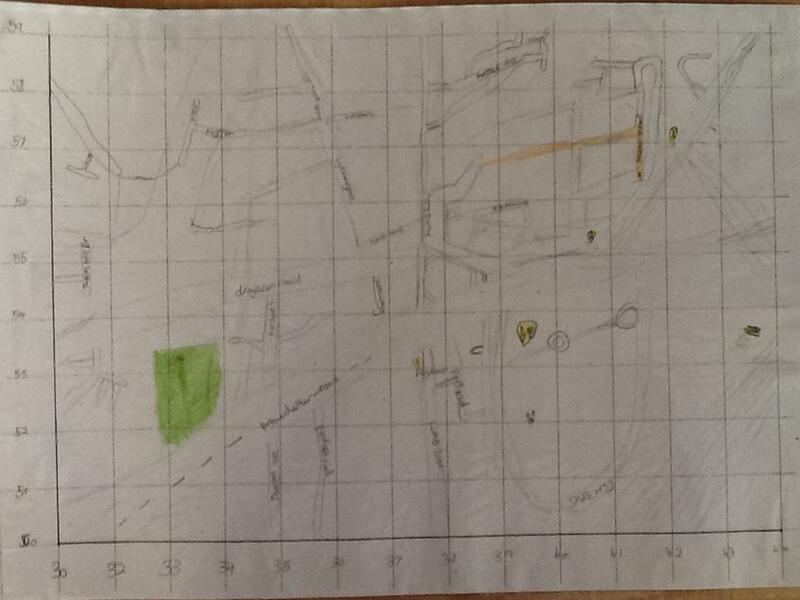 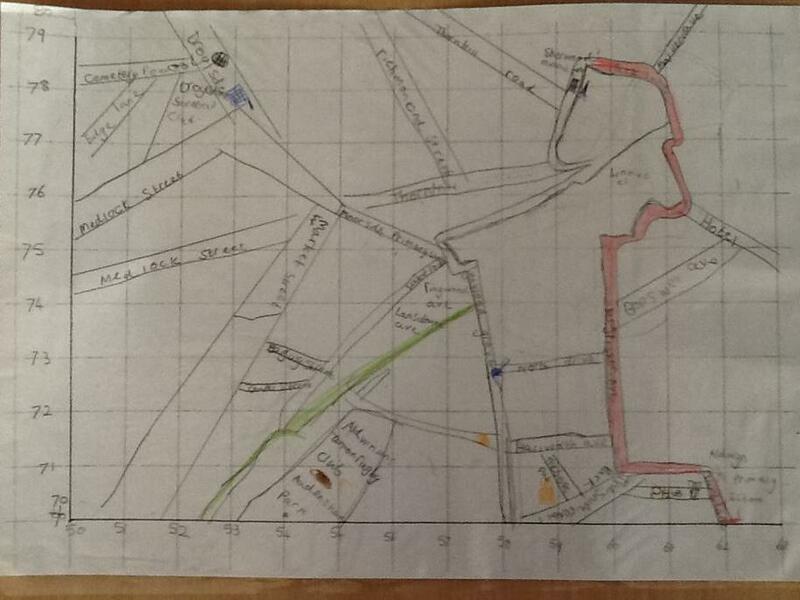 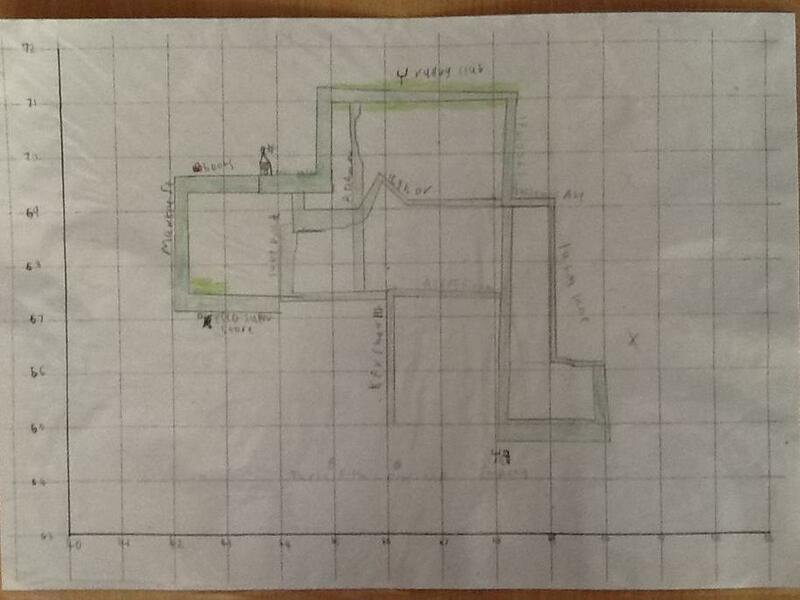 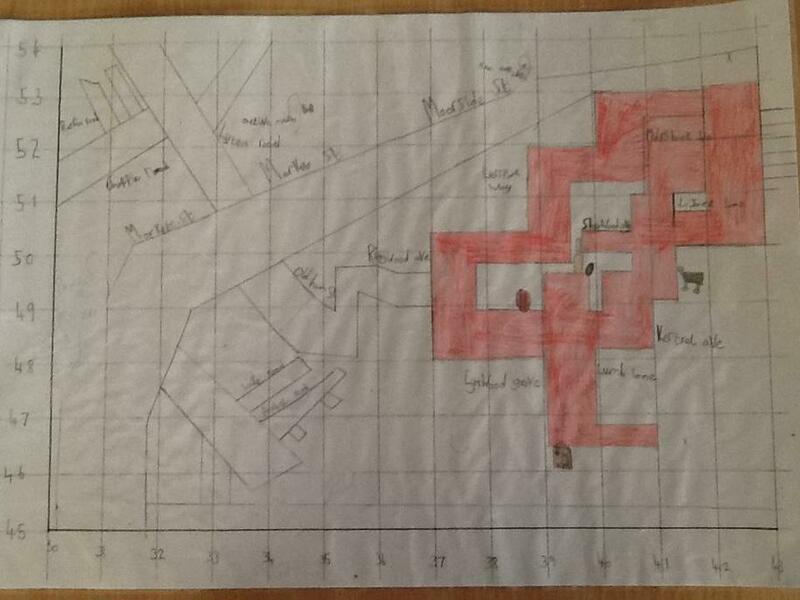 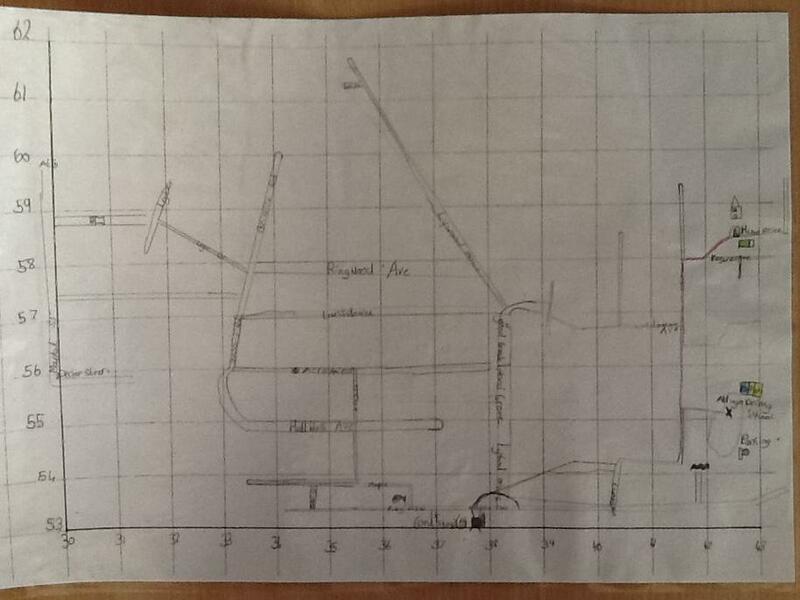 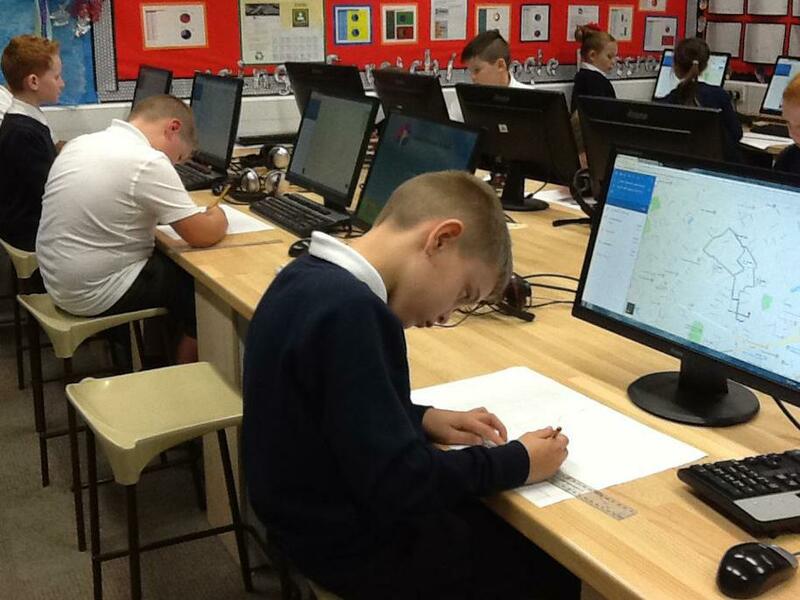 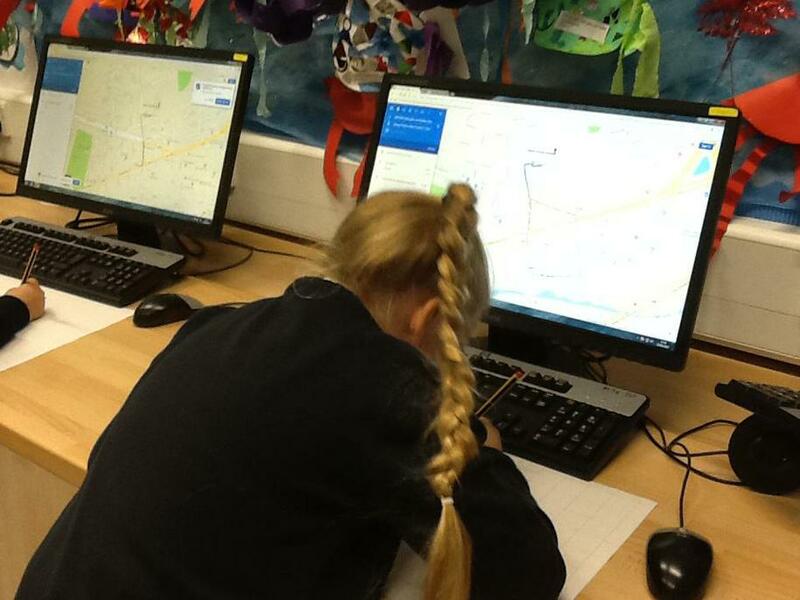 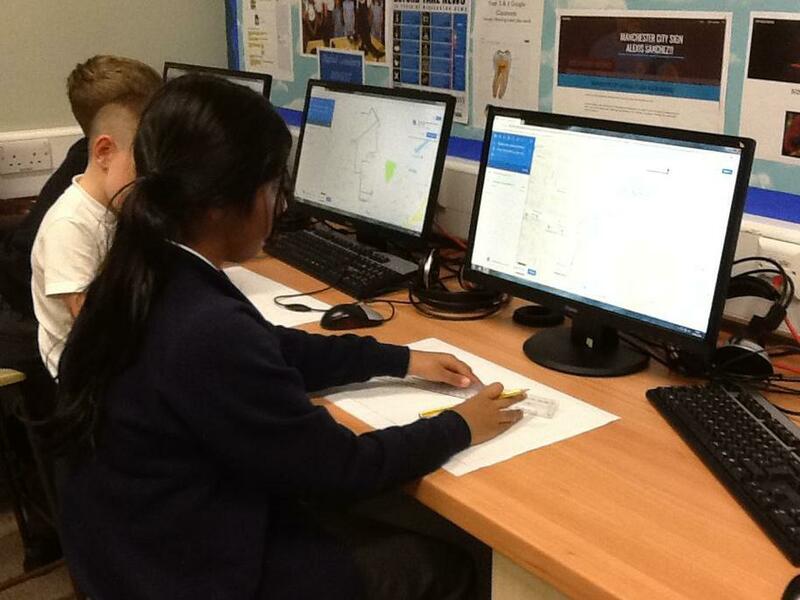 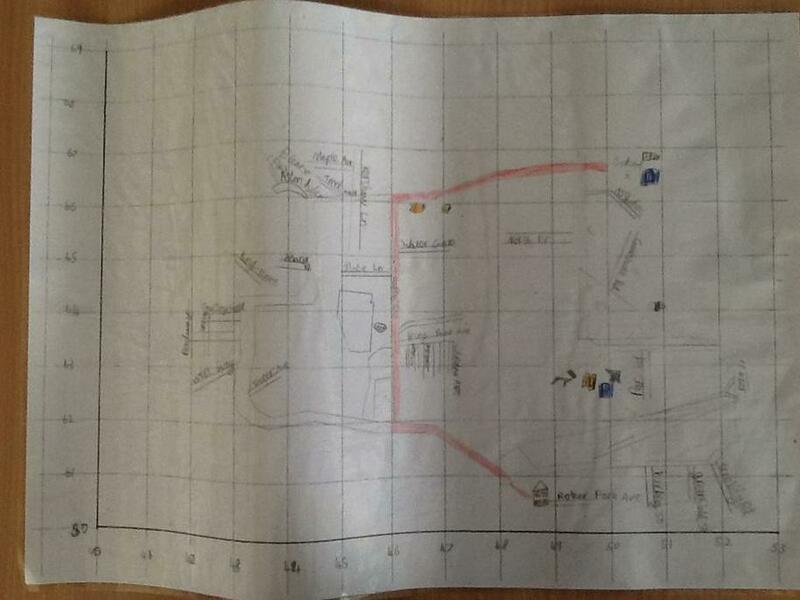 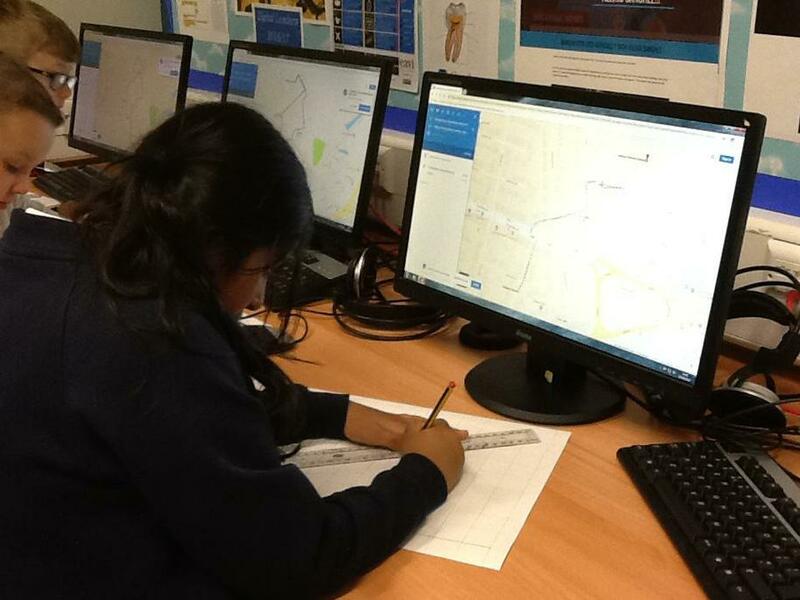 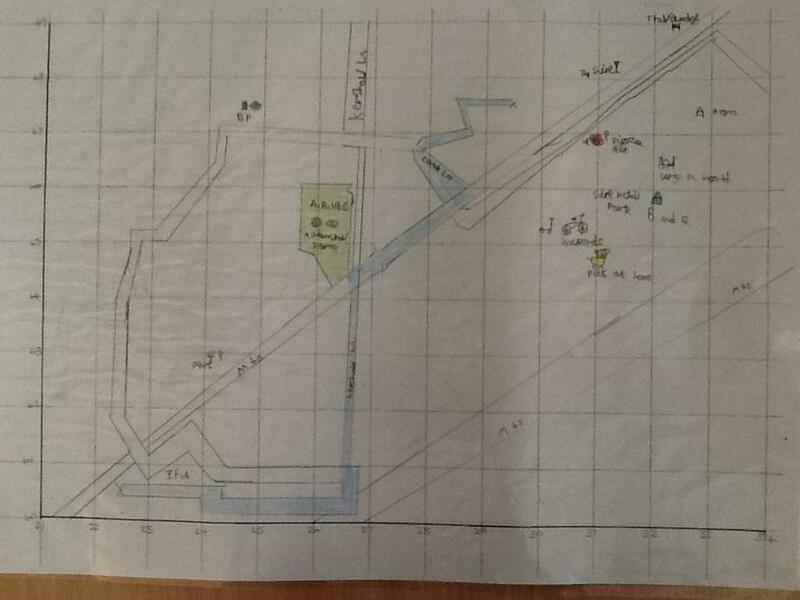 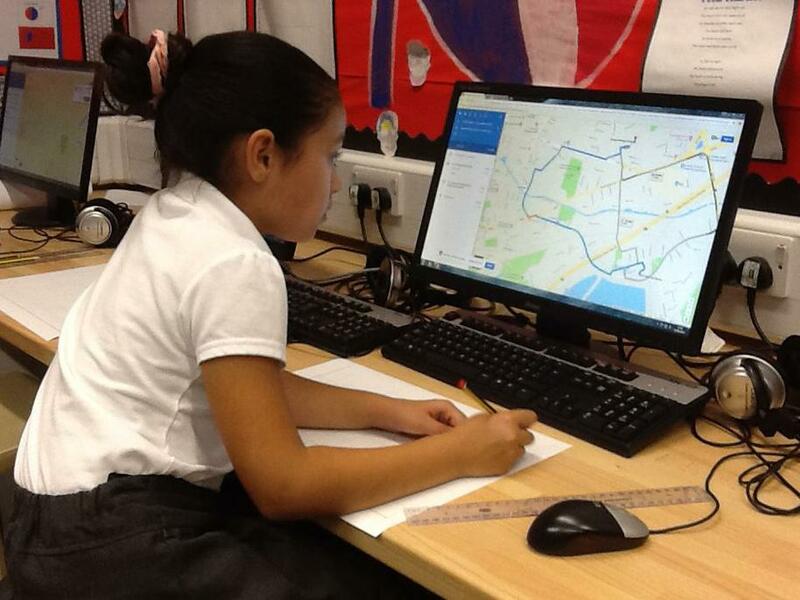 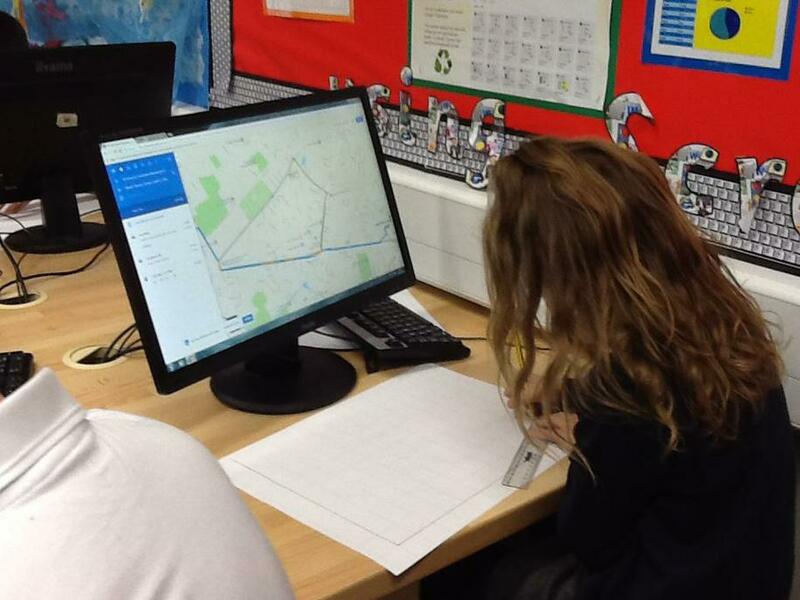 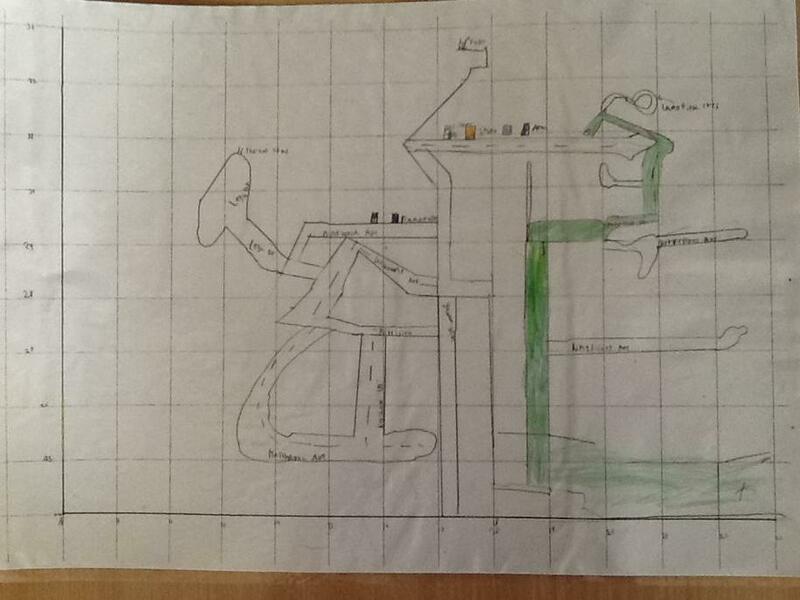 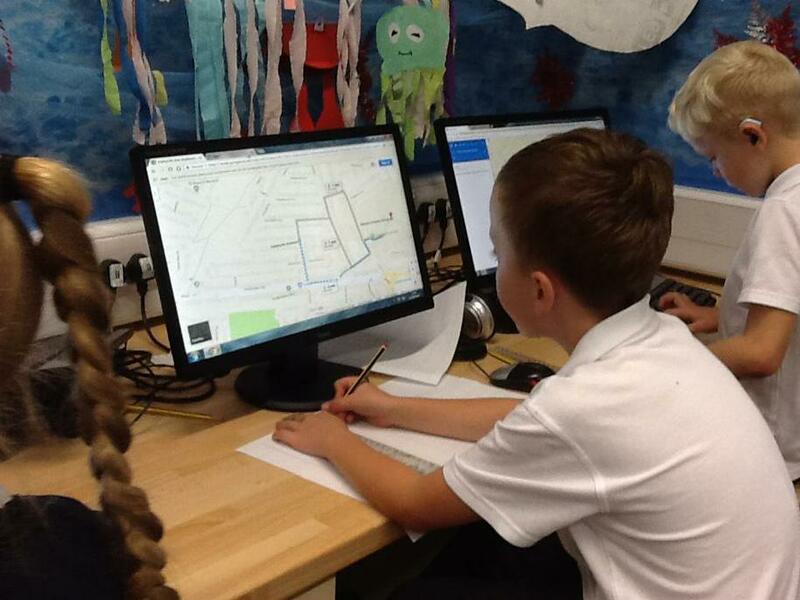 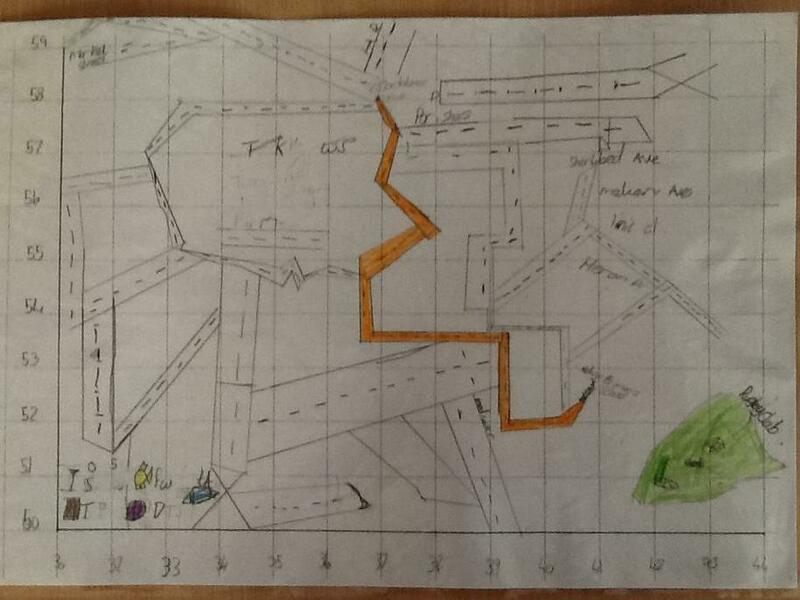 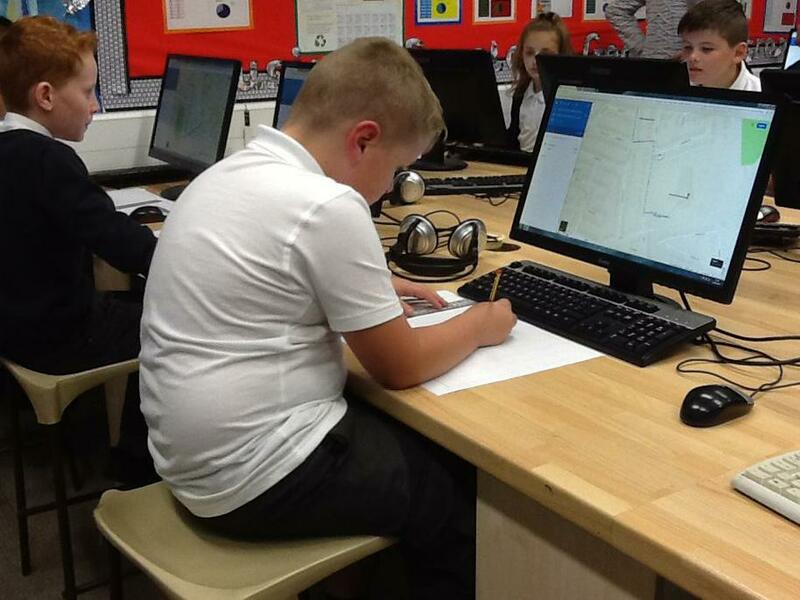 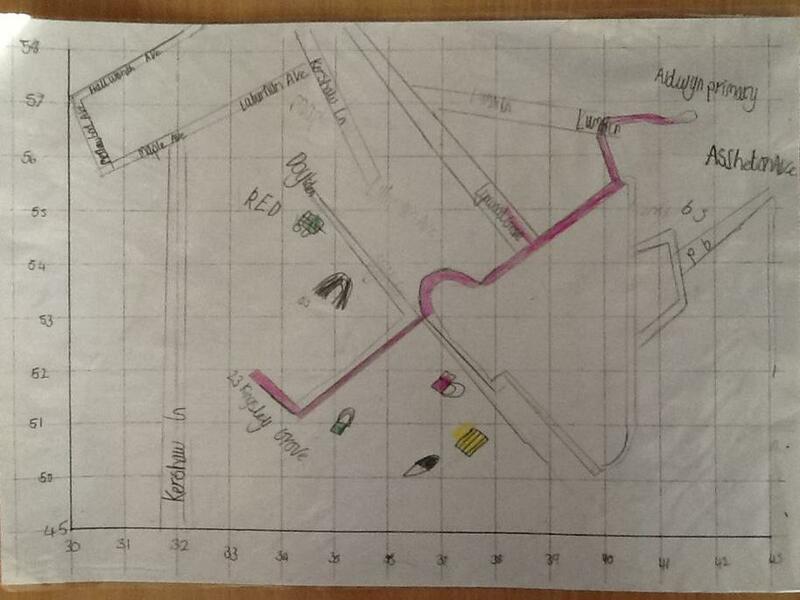 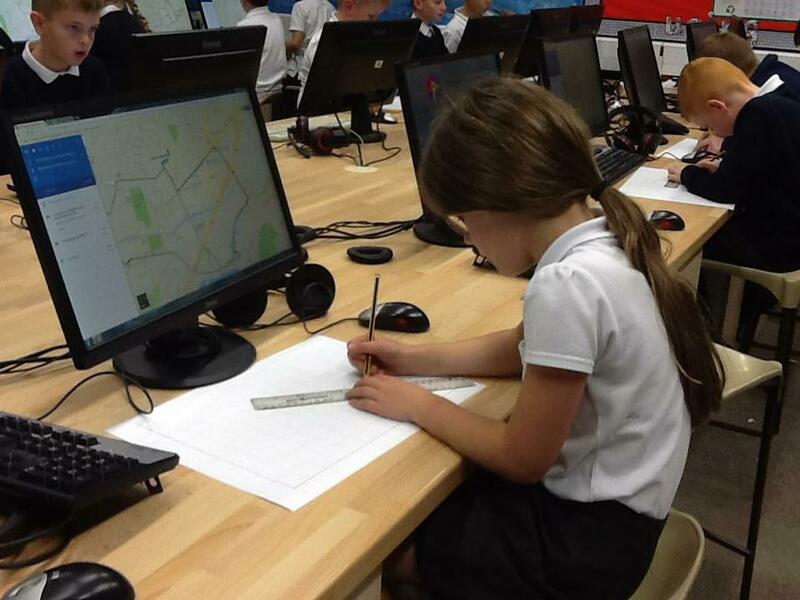 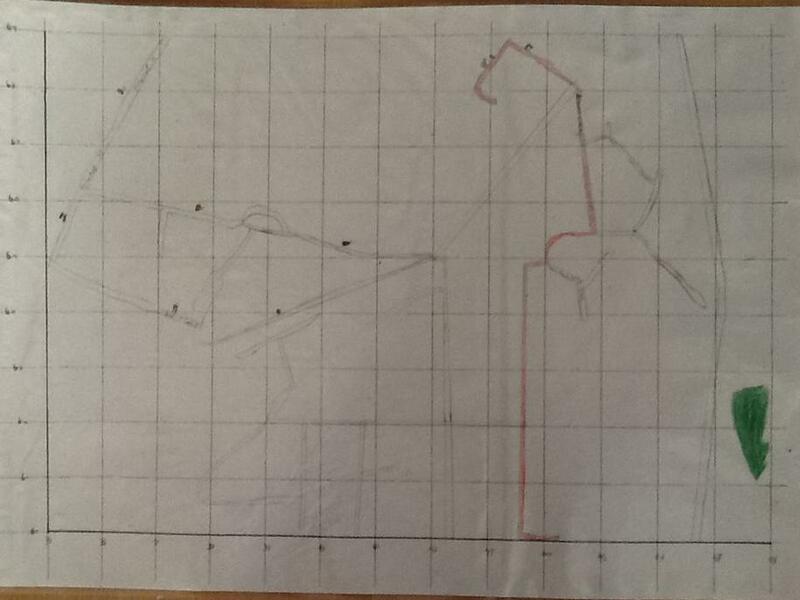 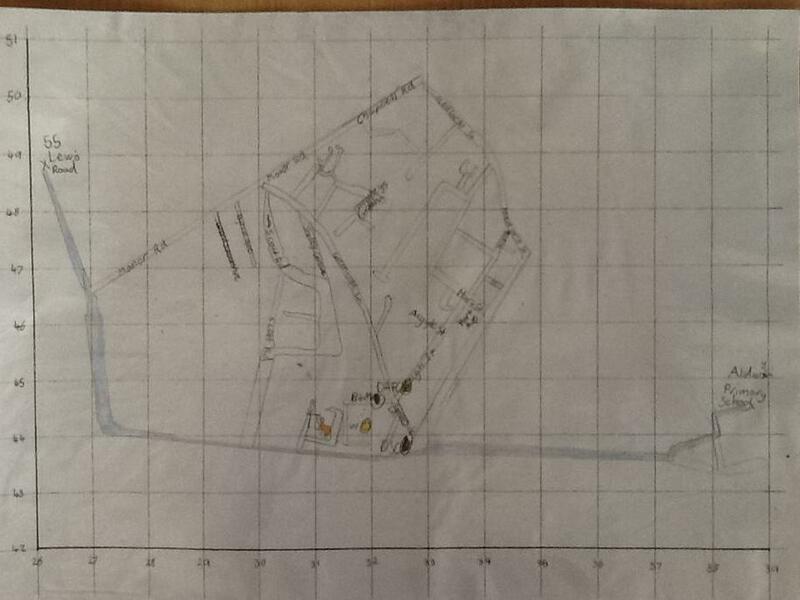 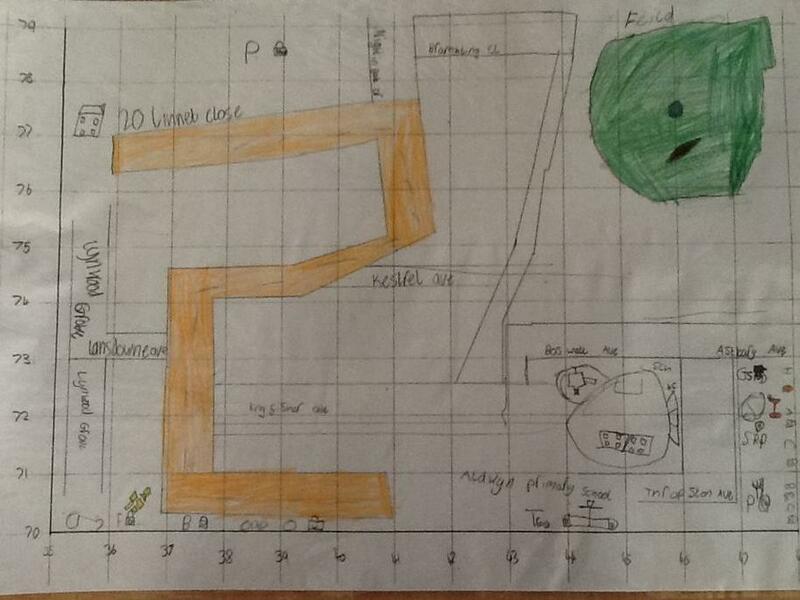 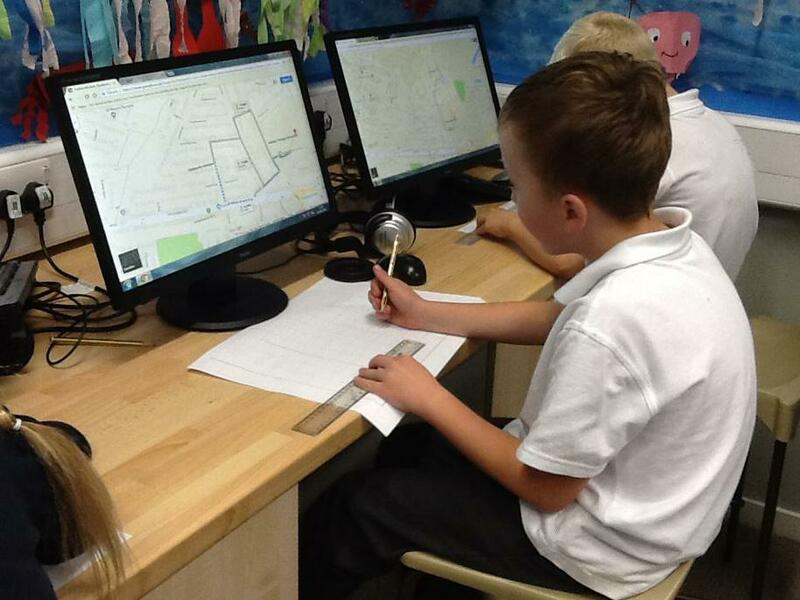 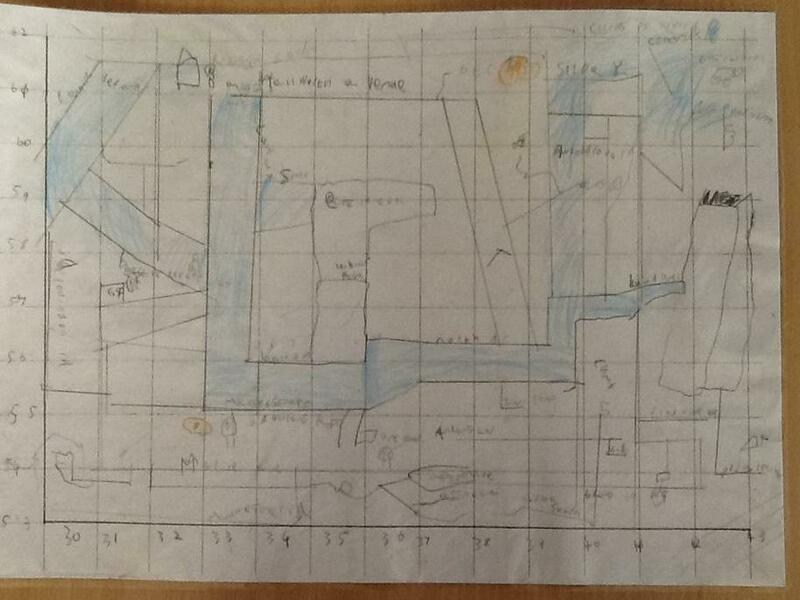 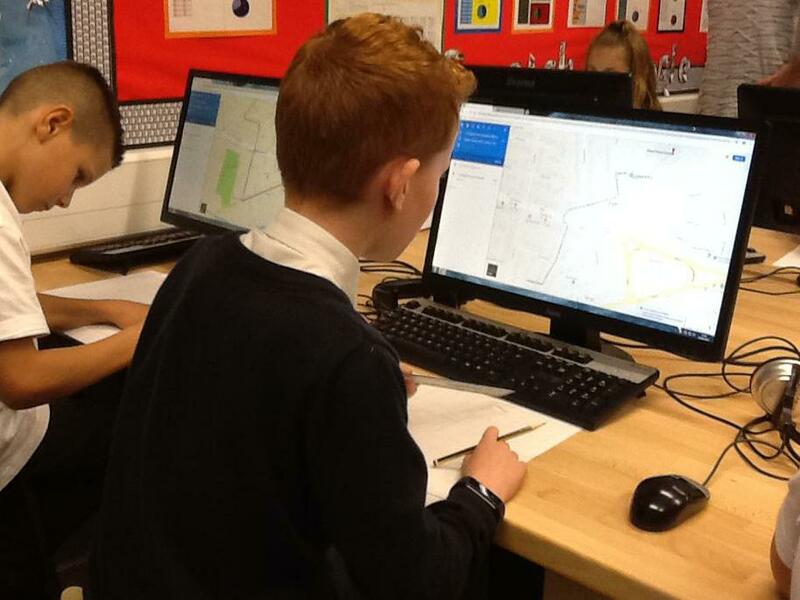 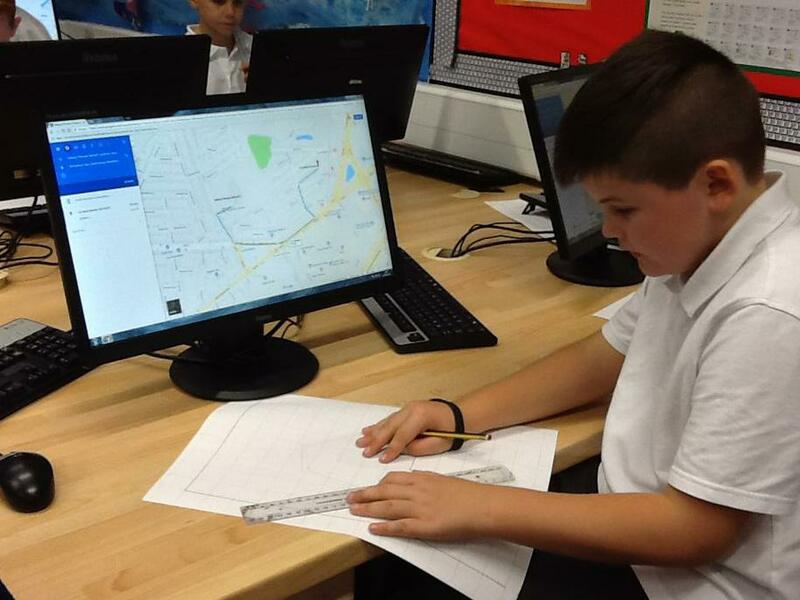 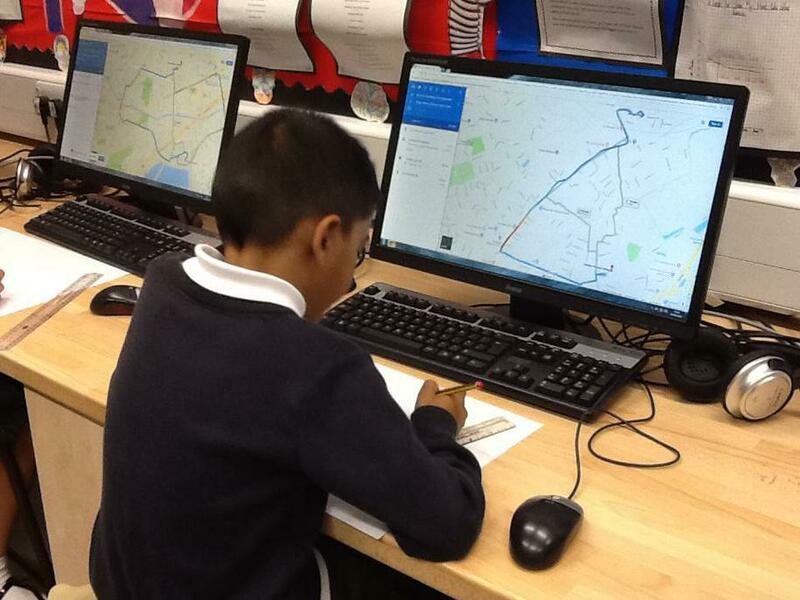 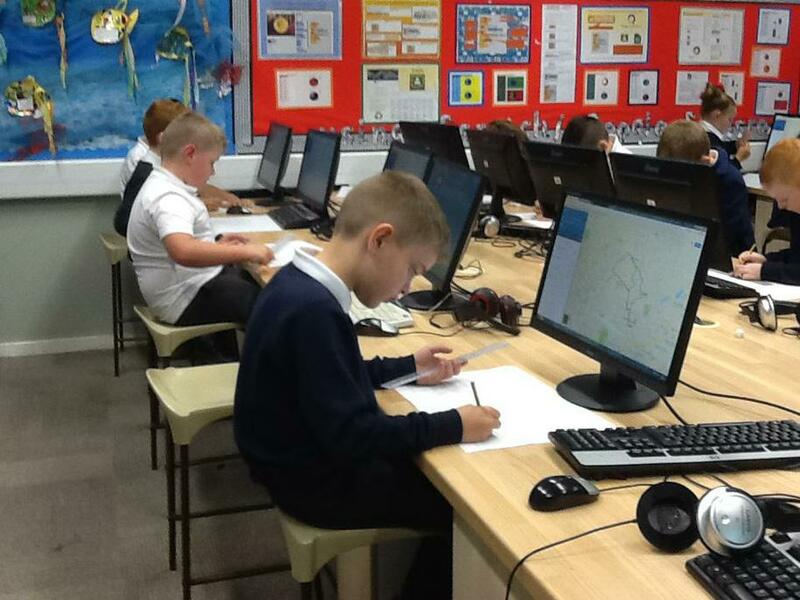 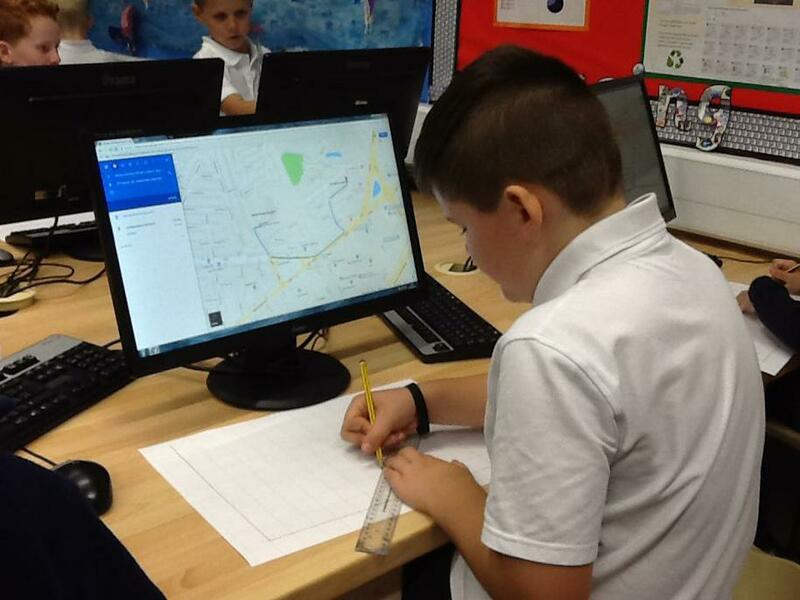 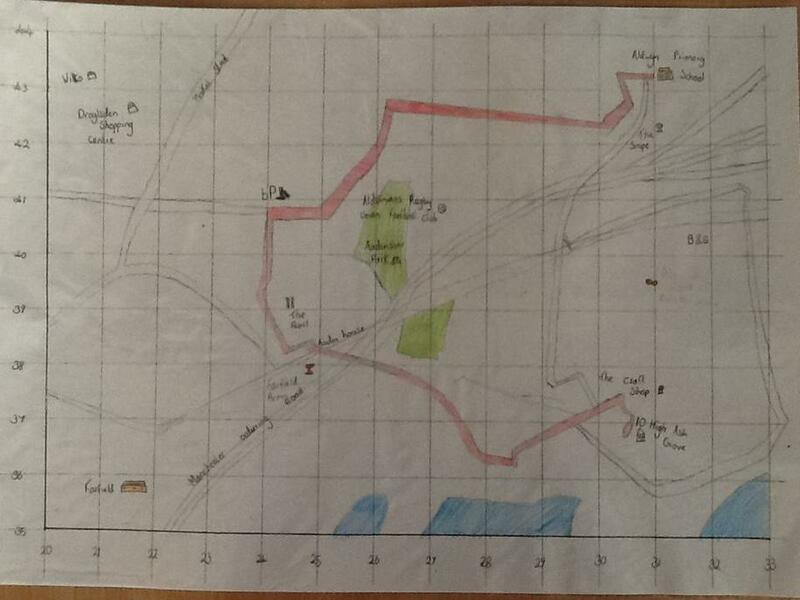 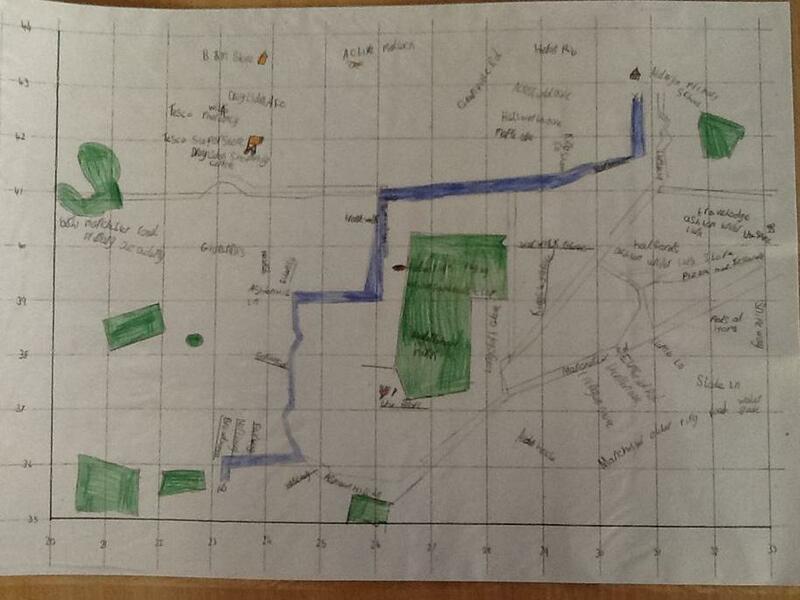 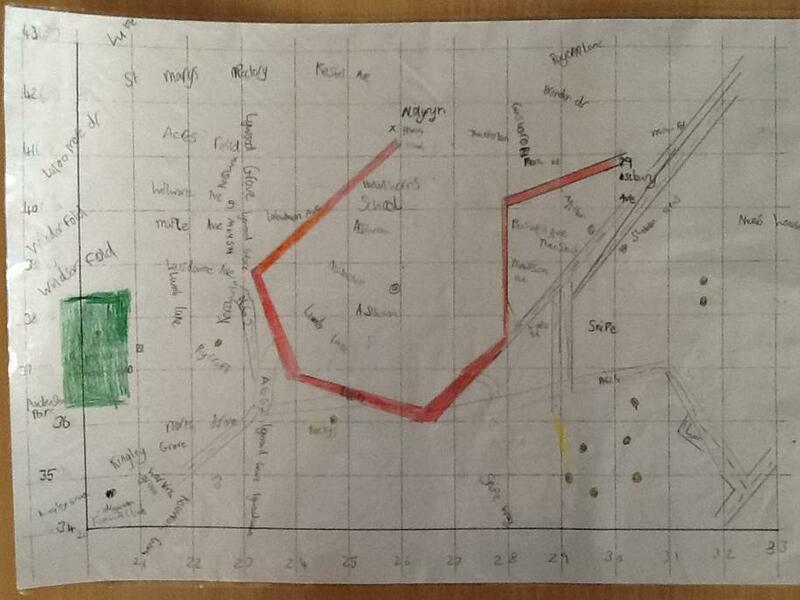 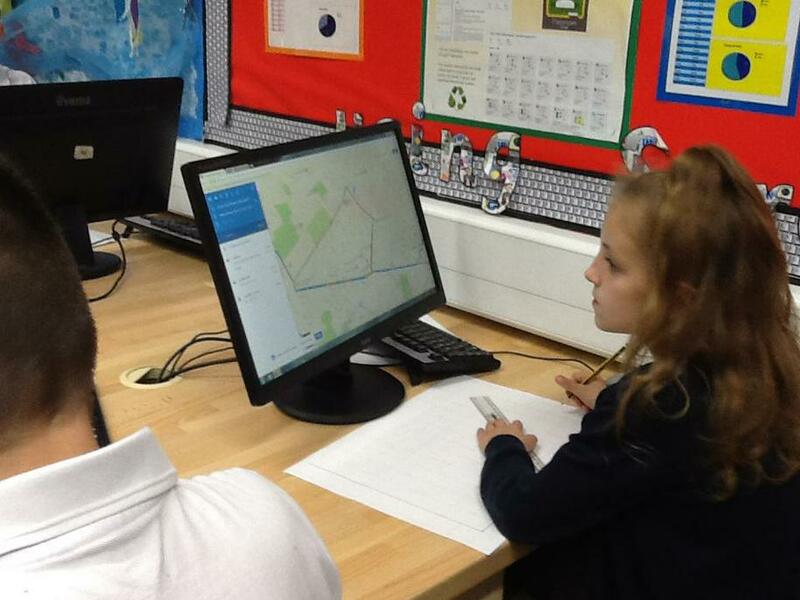 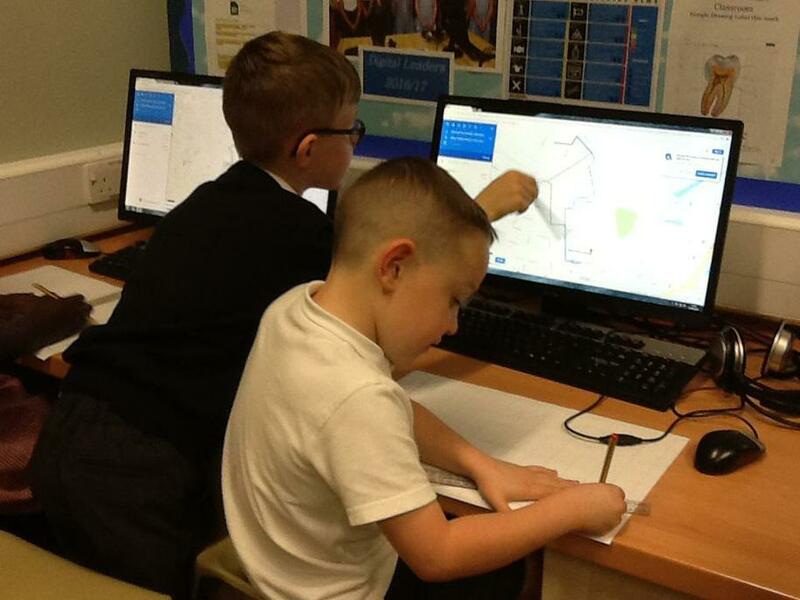 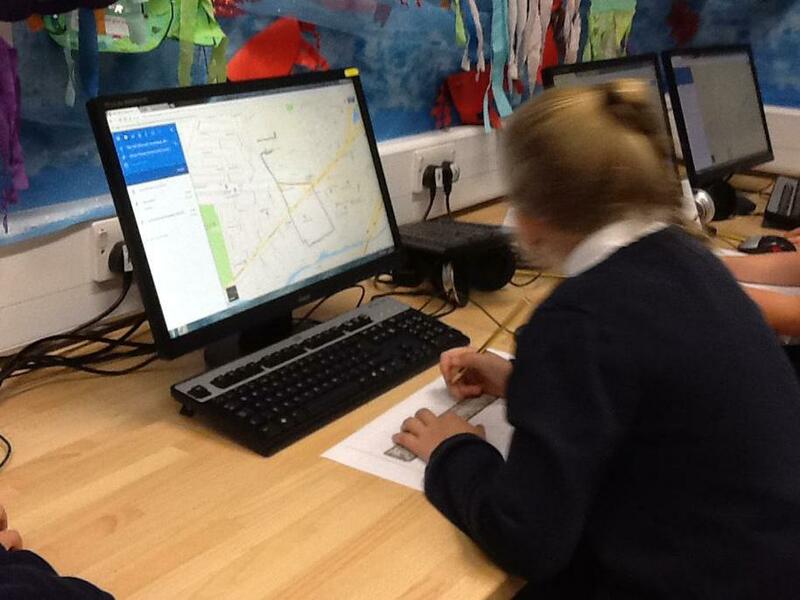 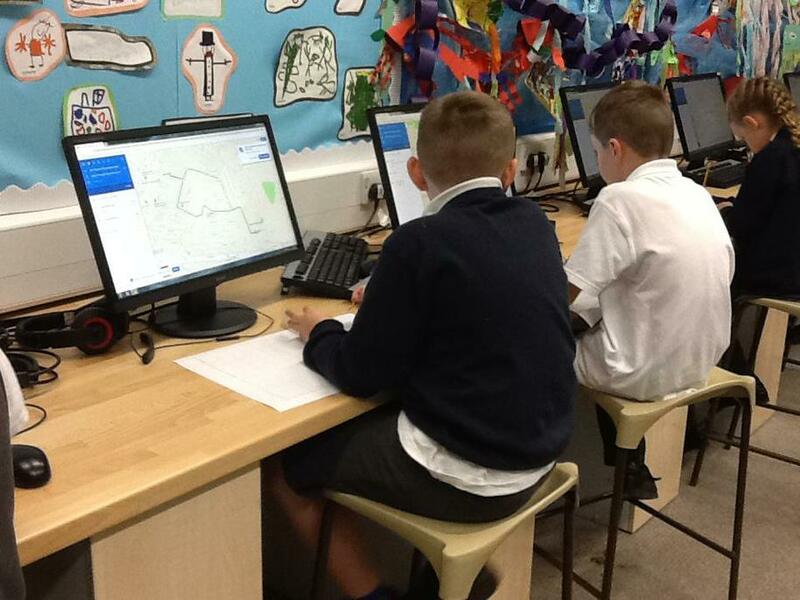 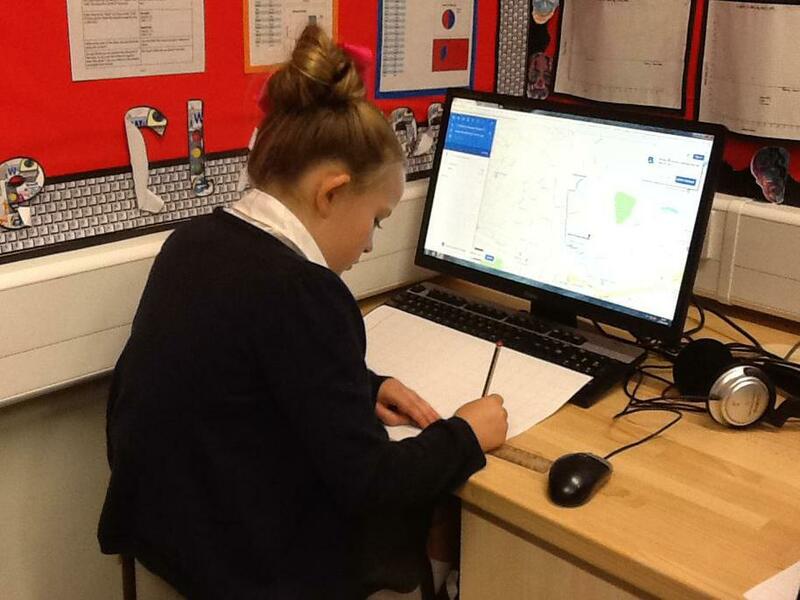 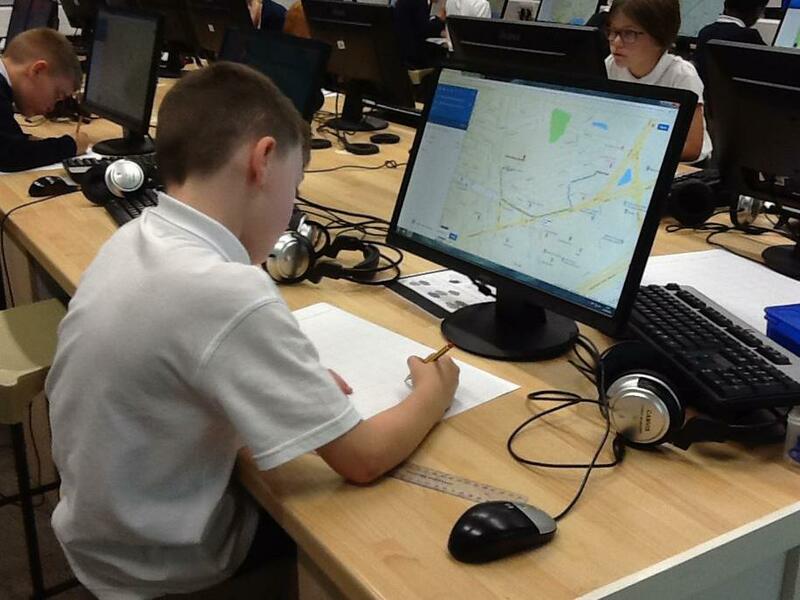 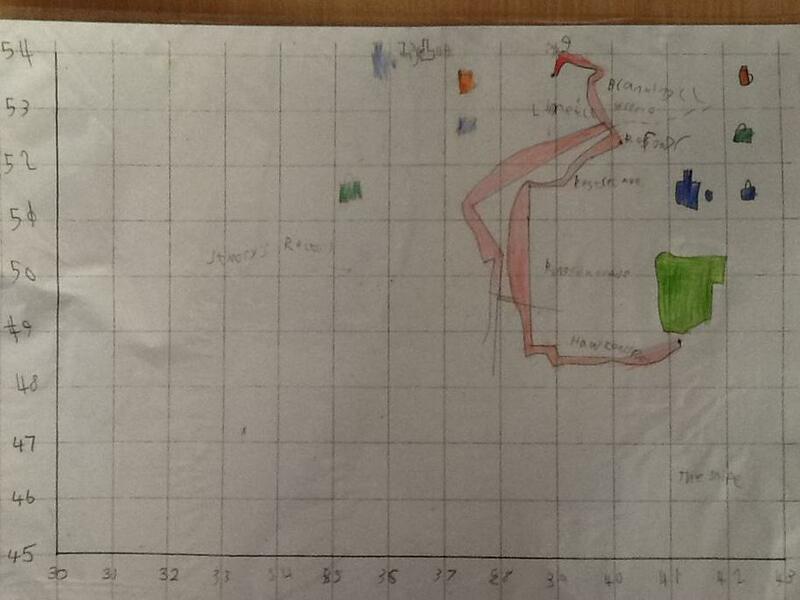 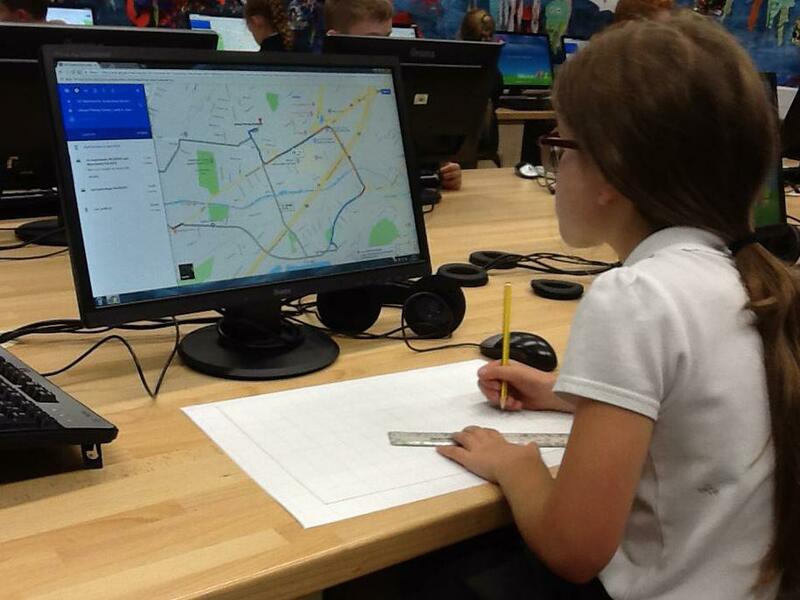 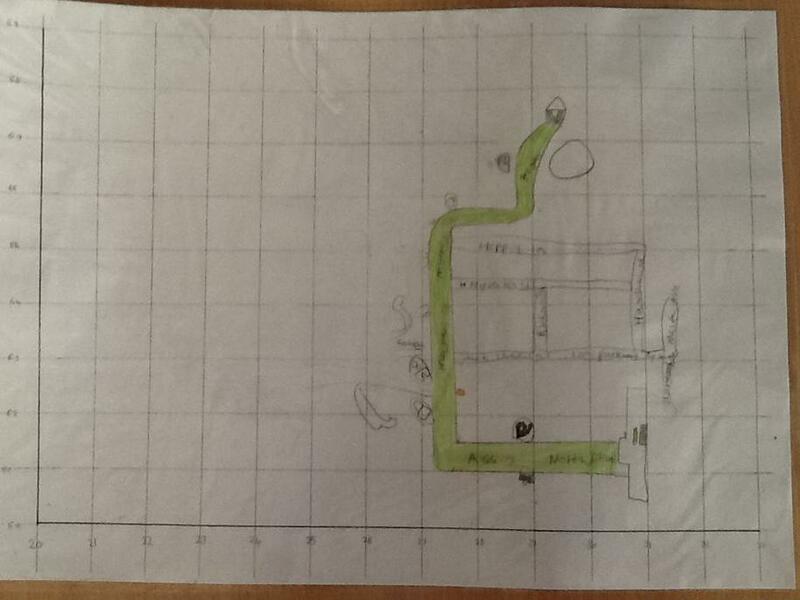 In Computing, we have been using google maps to plot our route from home to school. 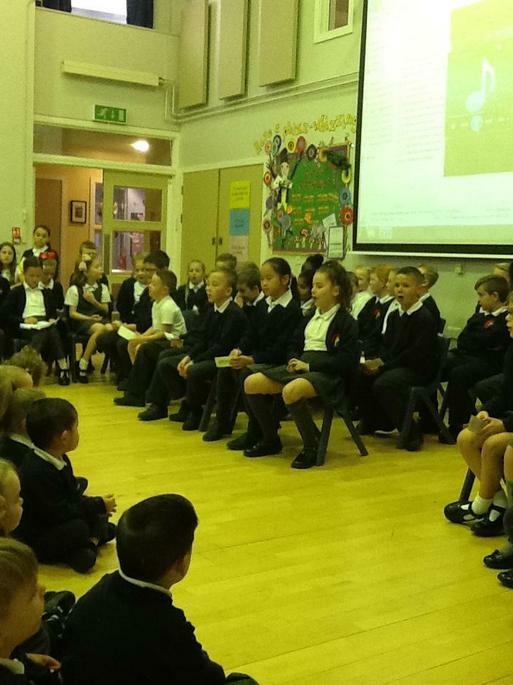 Today, we have been learning about Remembrance Day. 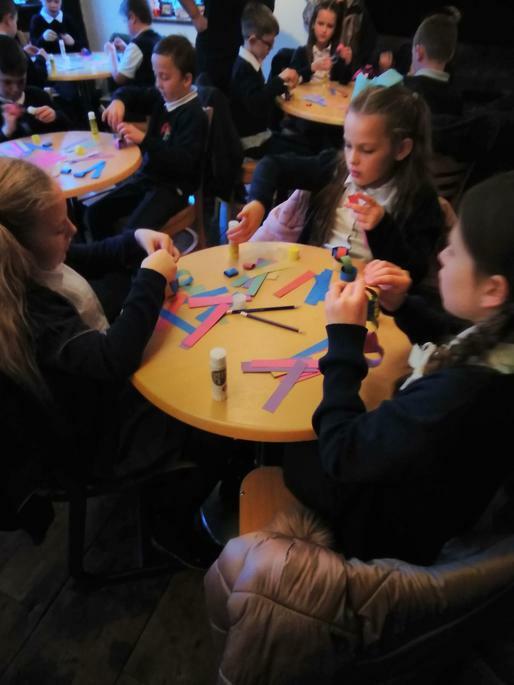 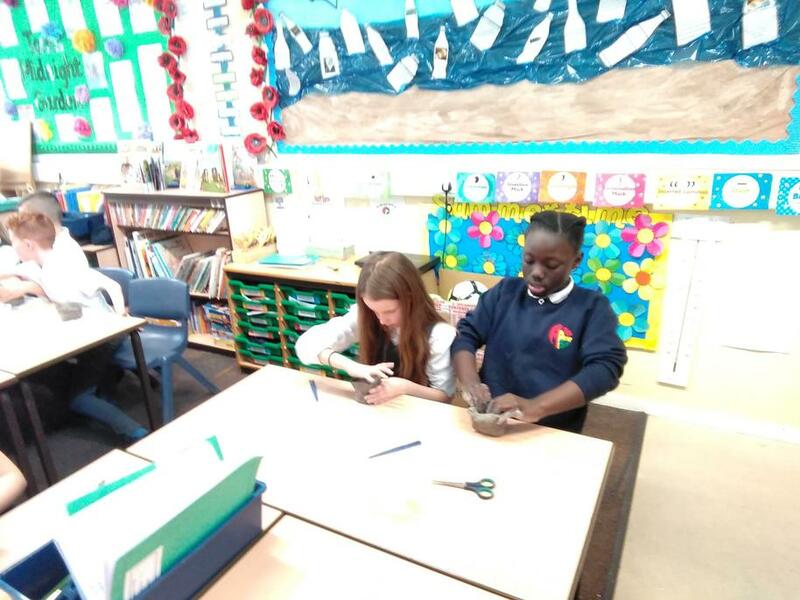 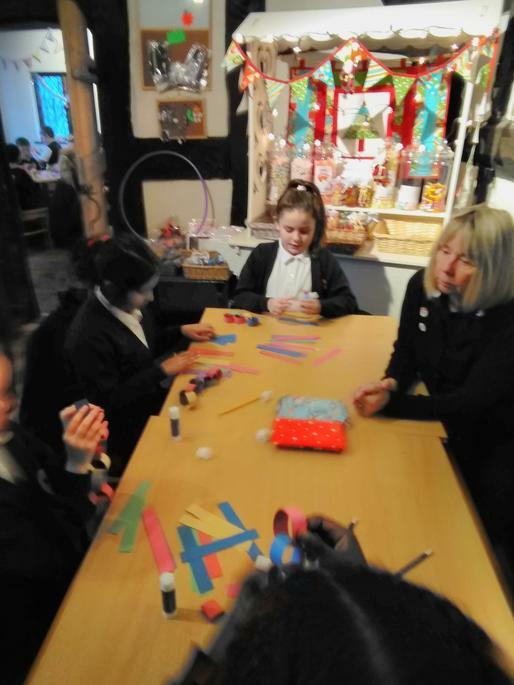 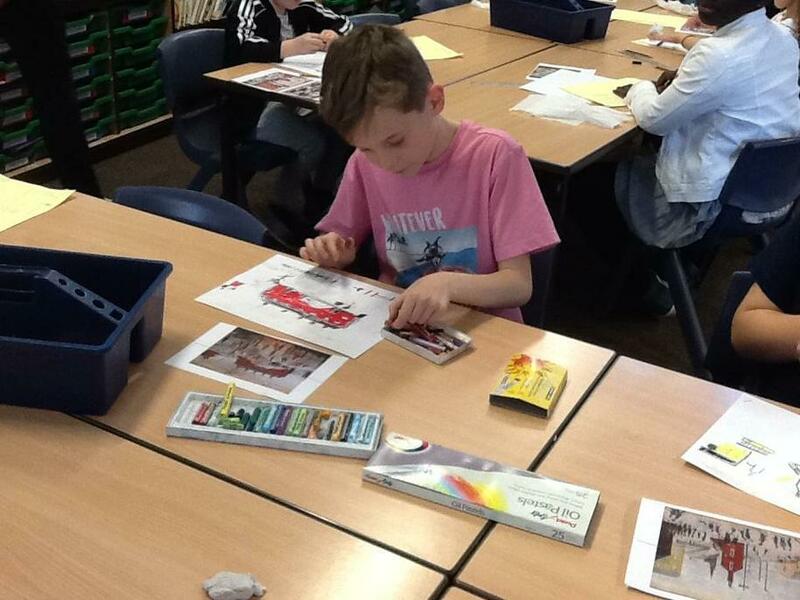 We have made poppies to remember the people who have been injured and died since World War I. 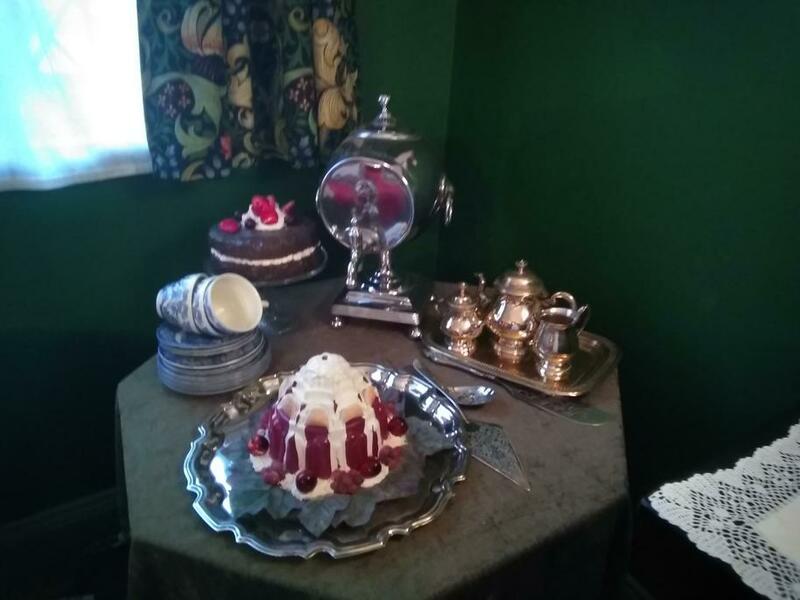 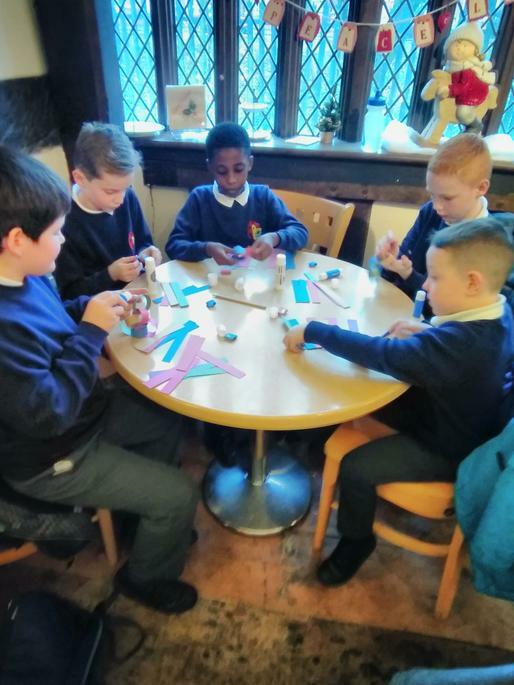 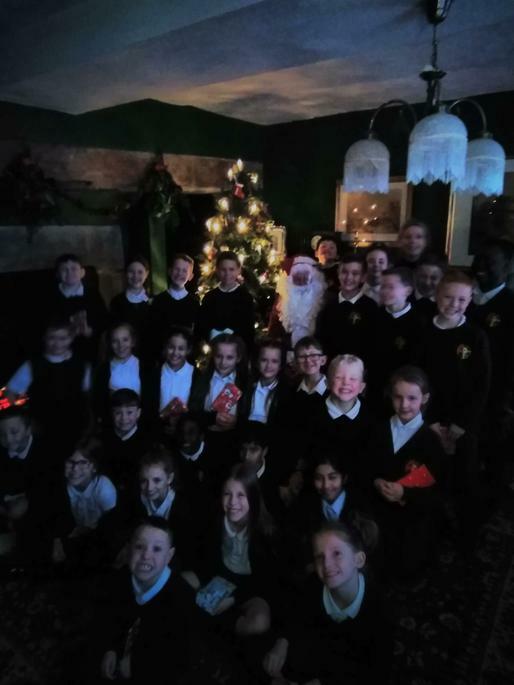 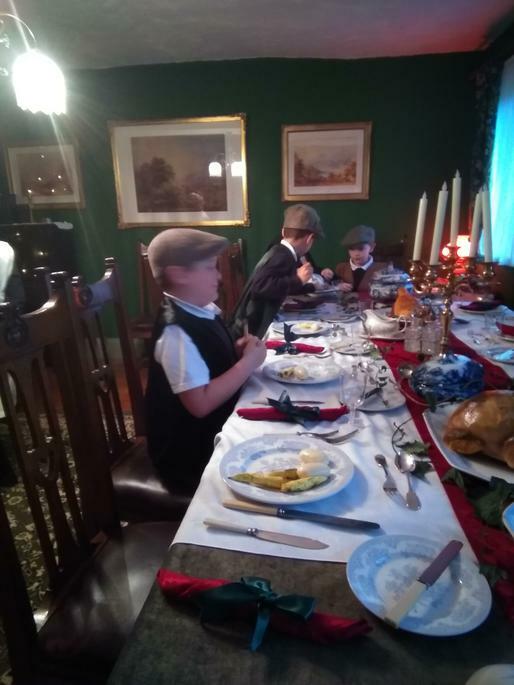 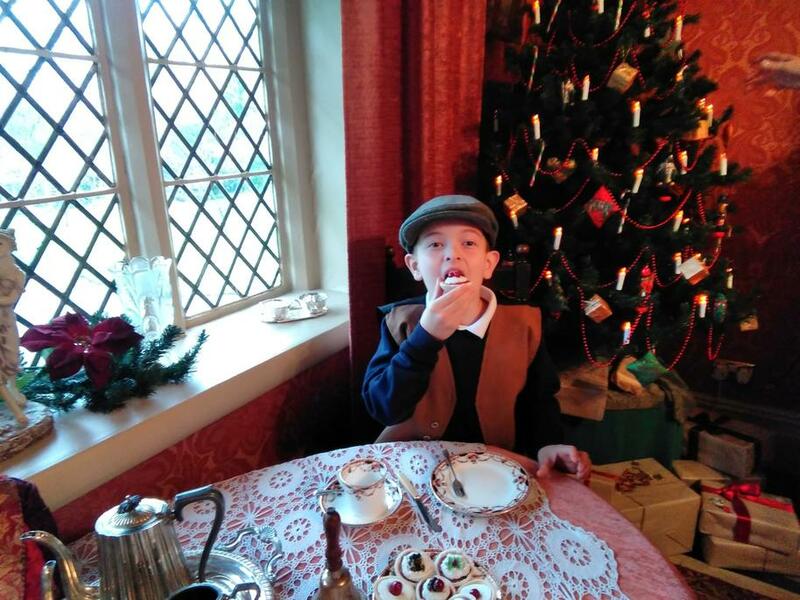 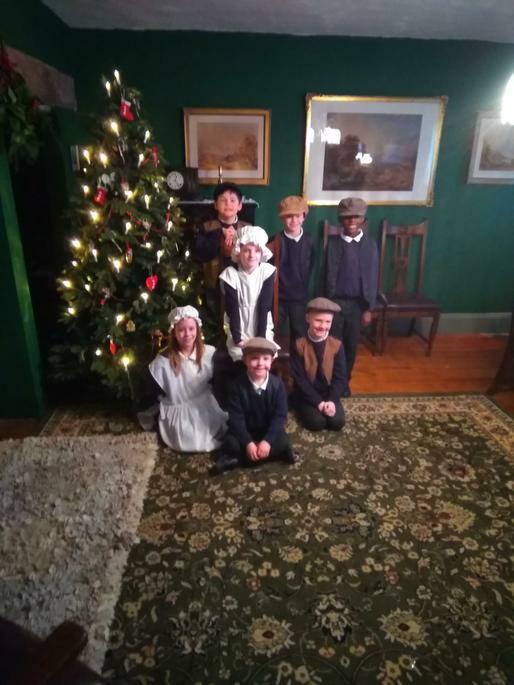 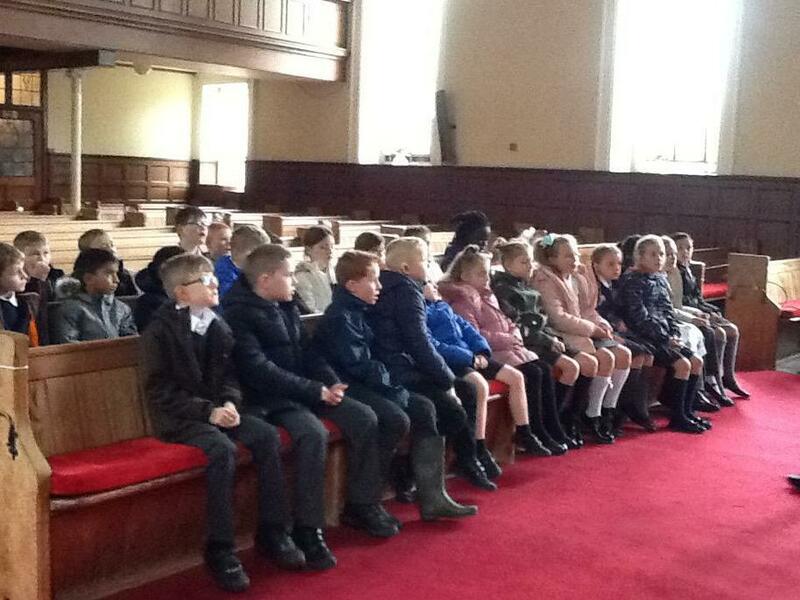 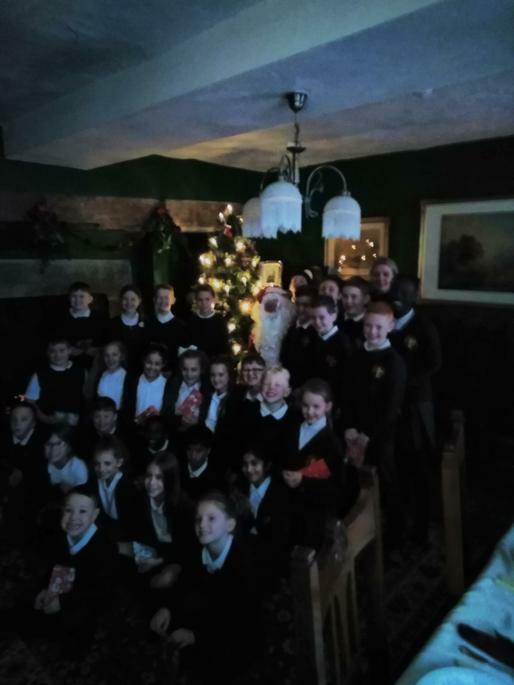 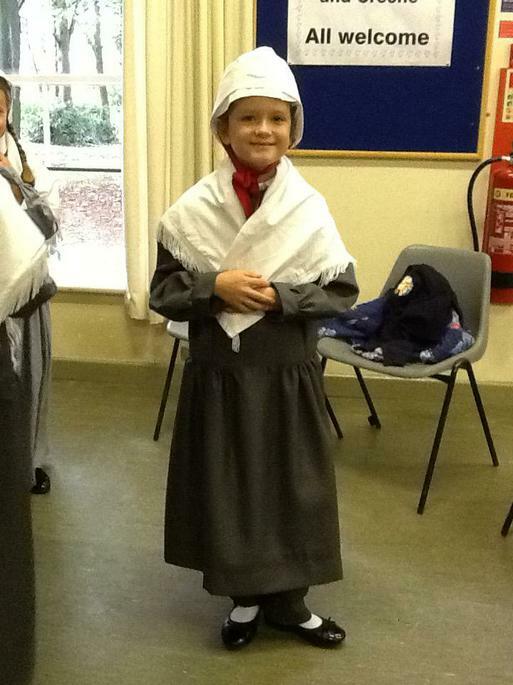 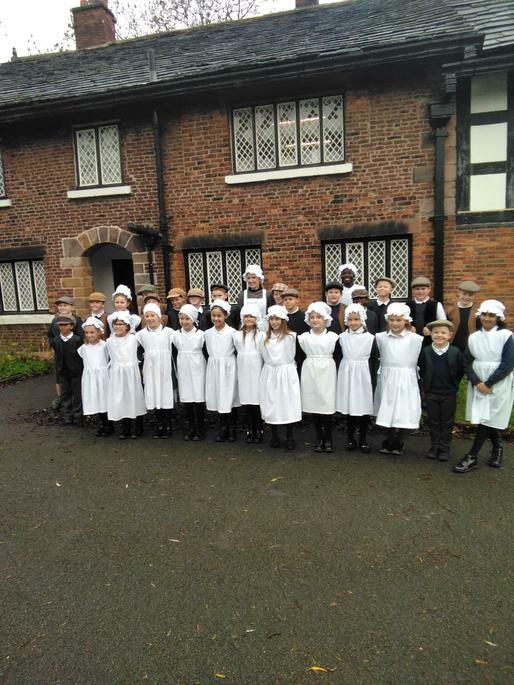 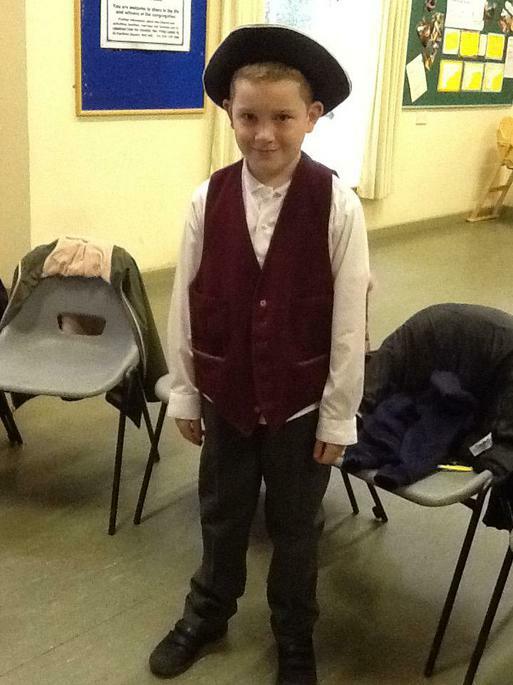 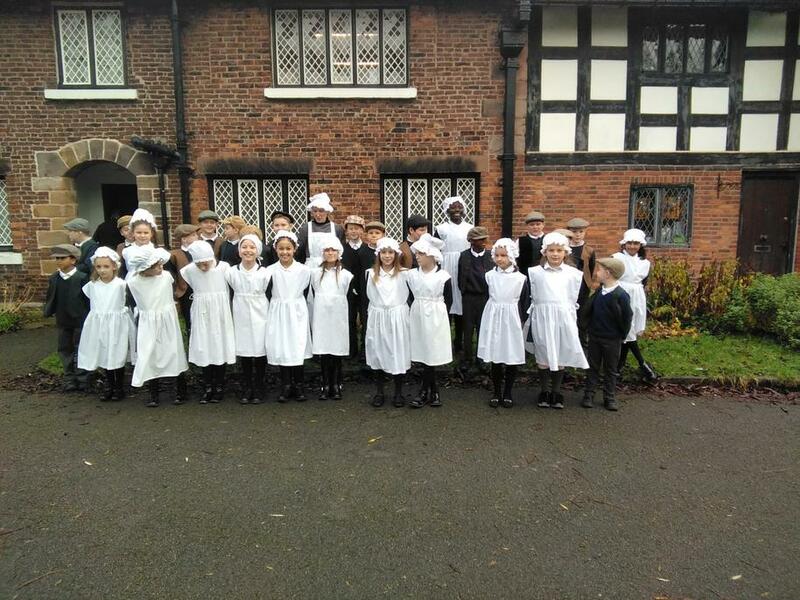 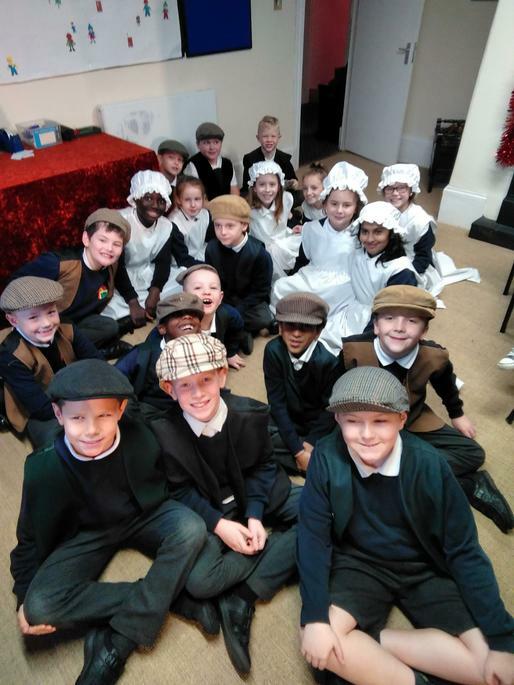 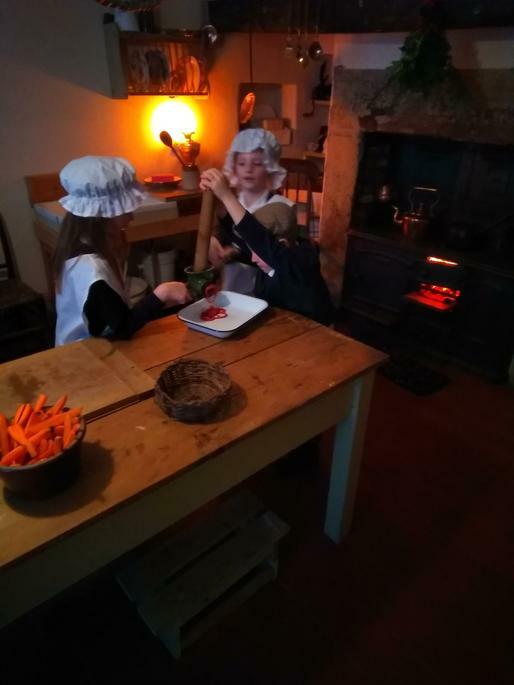 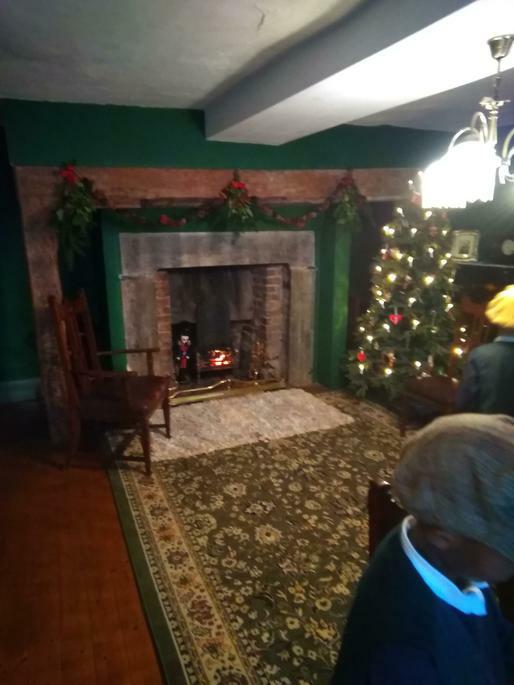 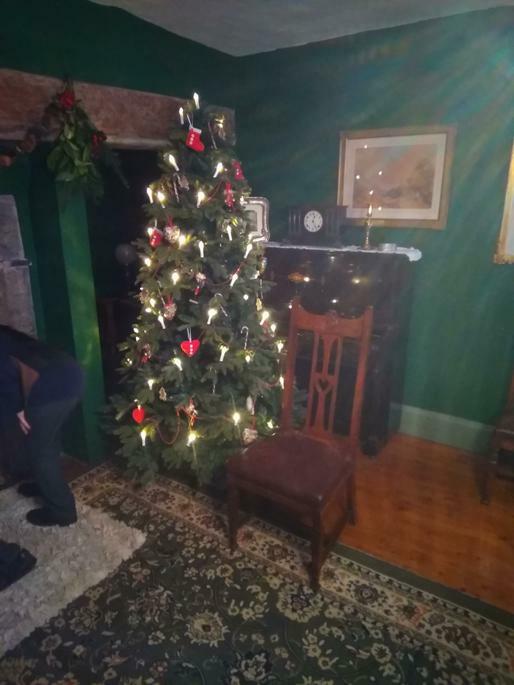 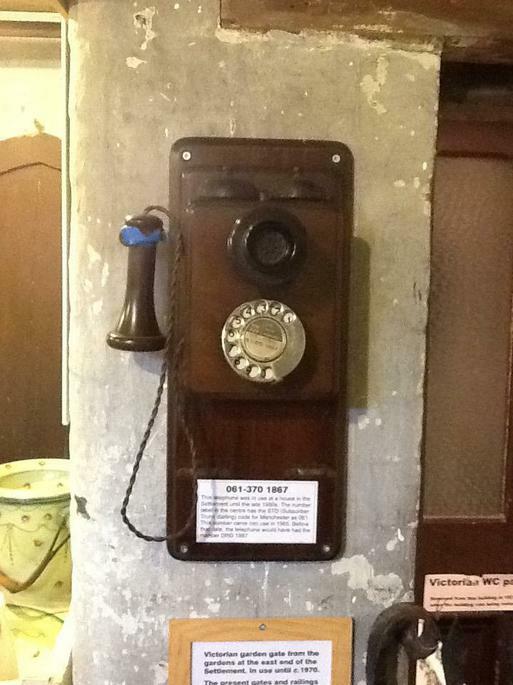 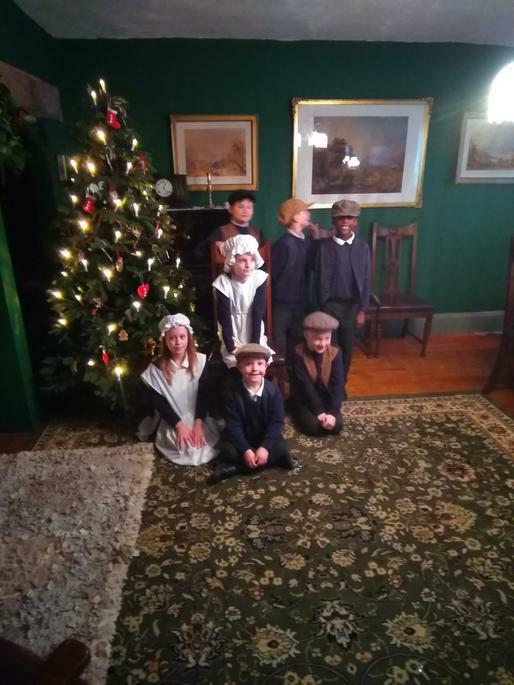 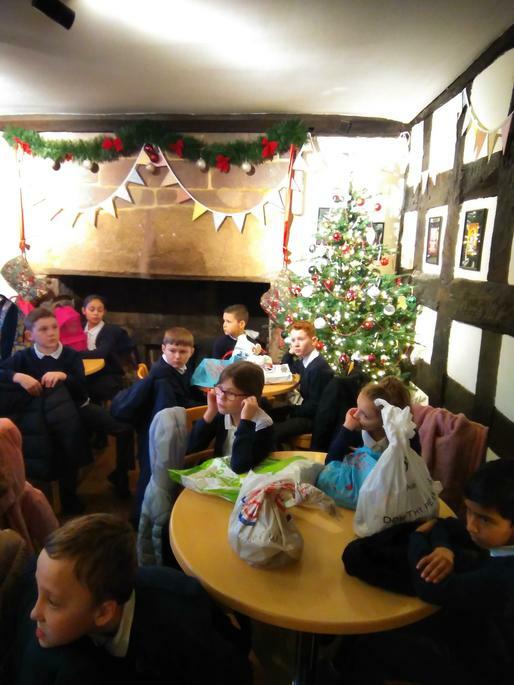 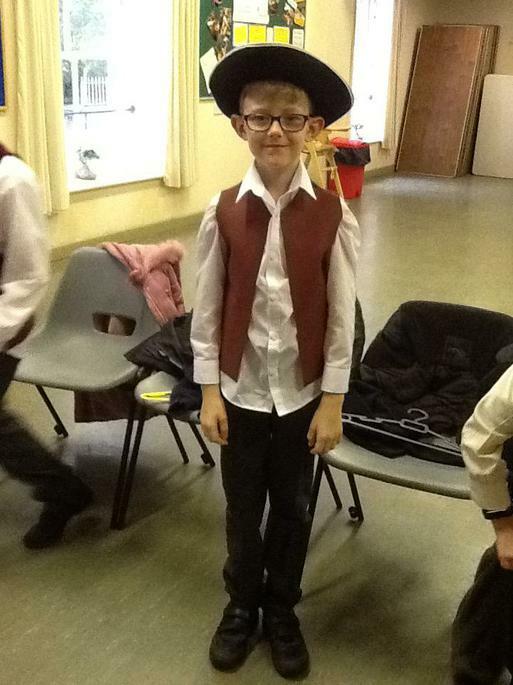 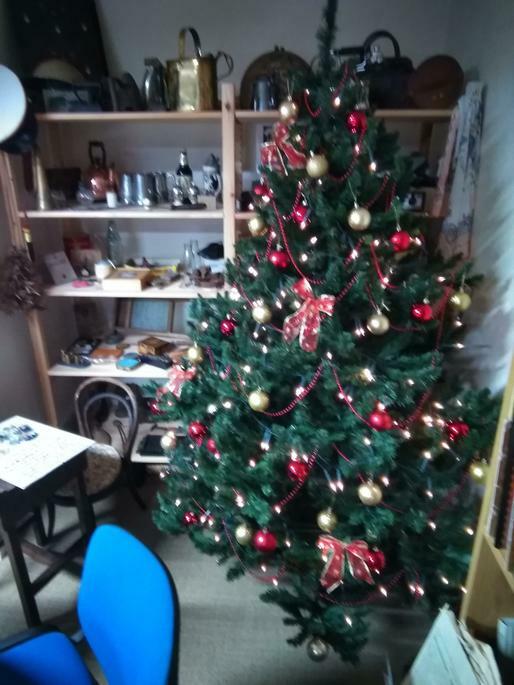 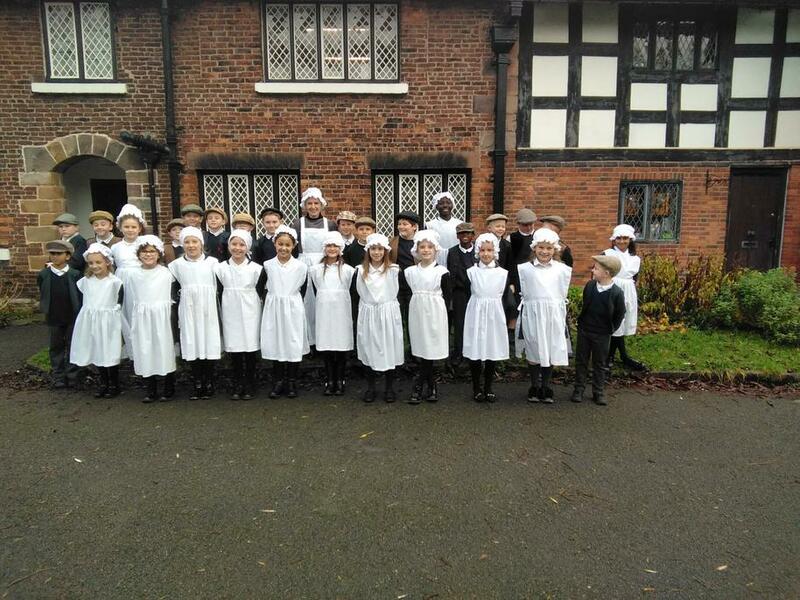 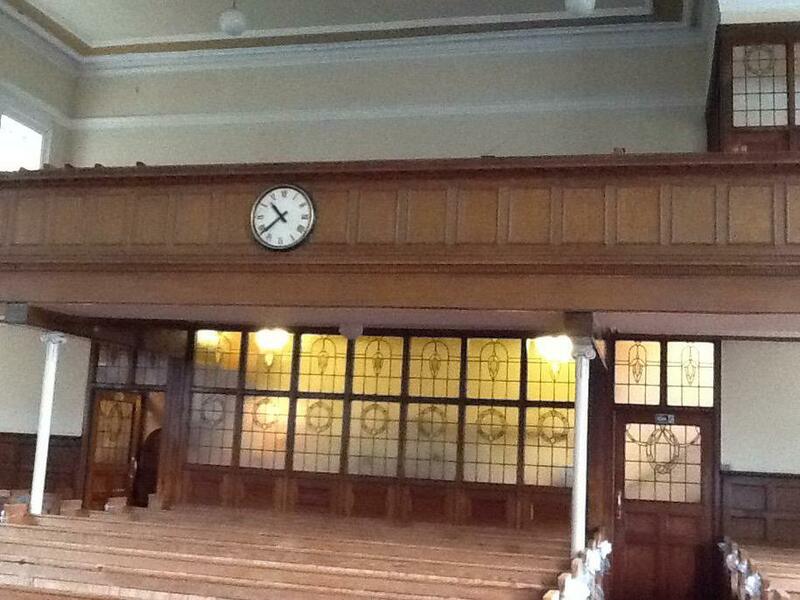 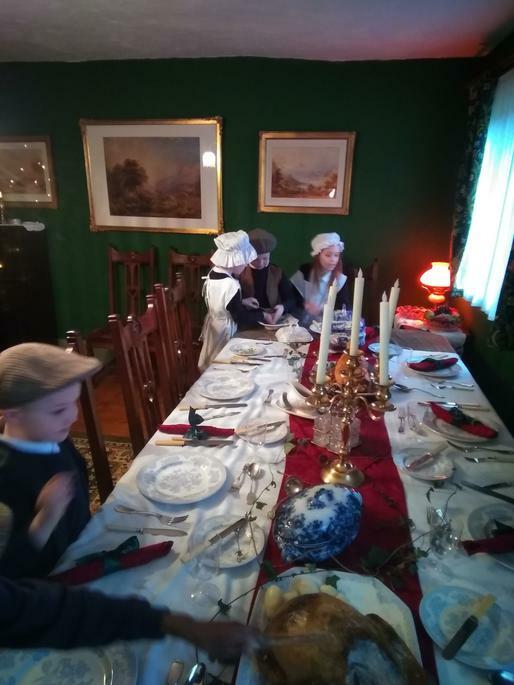 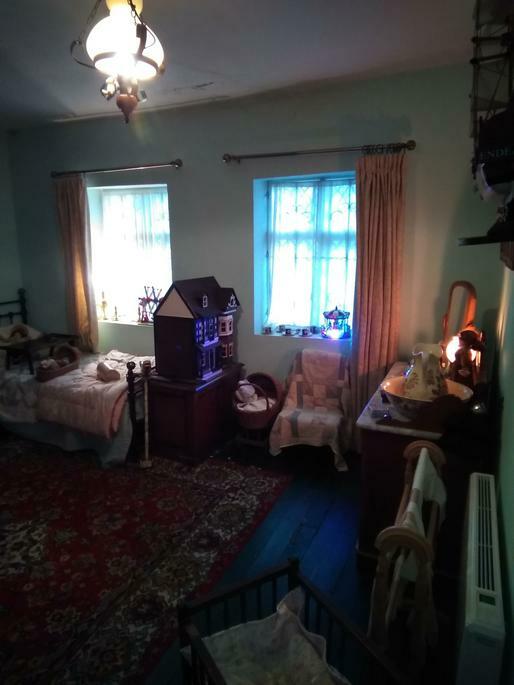 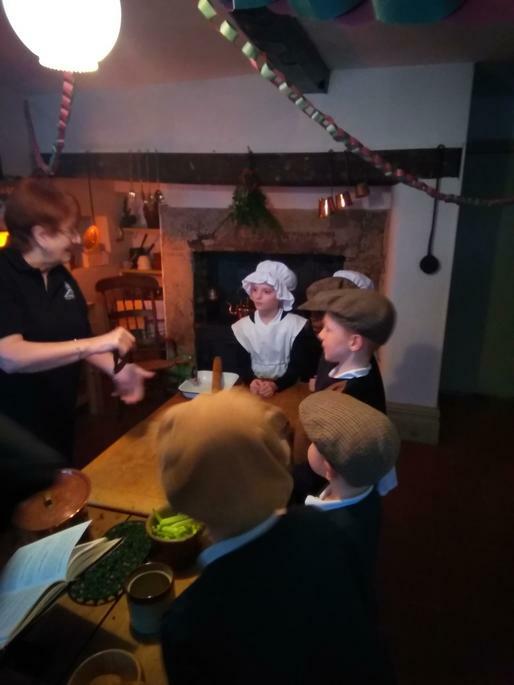 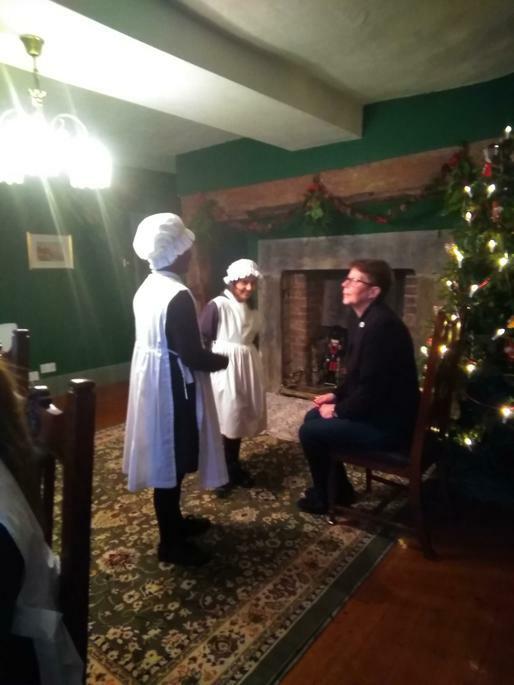 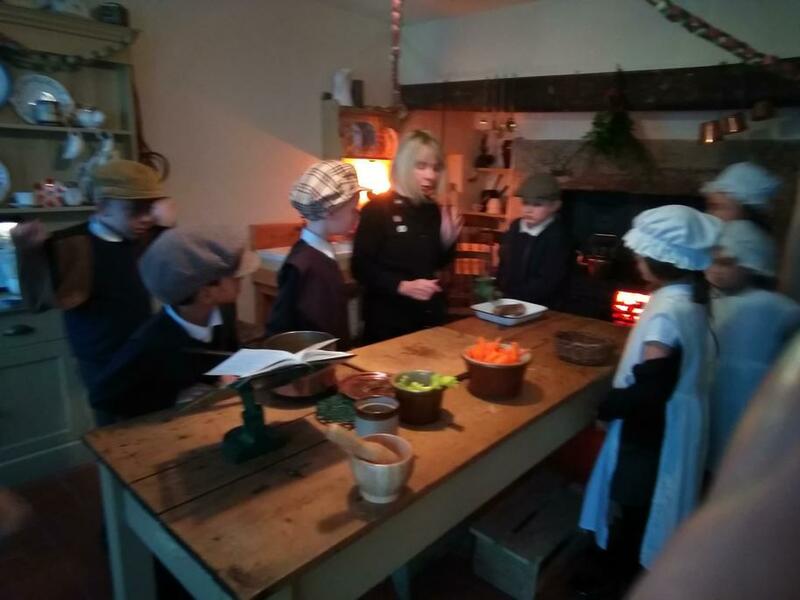 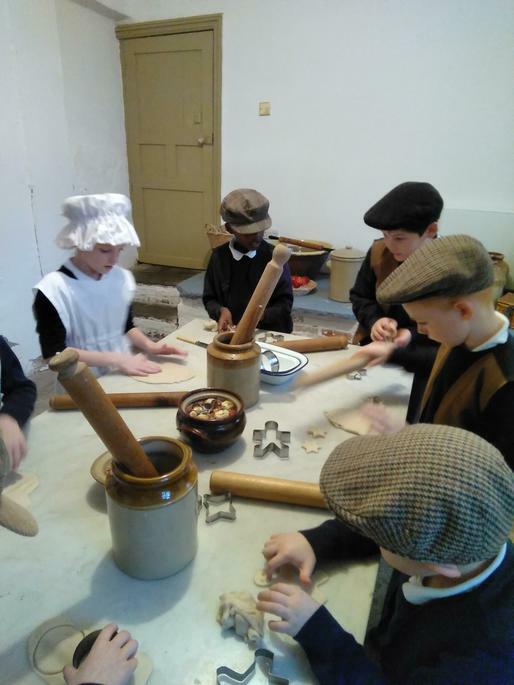 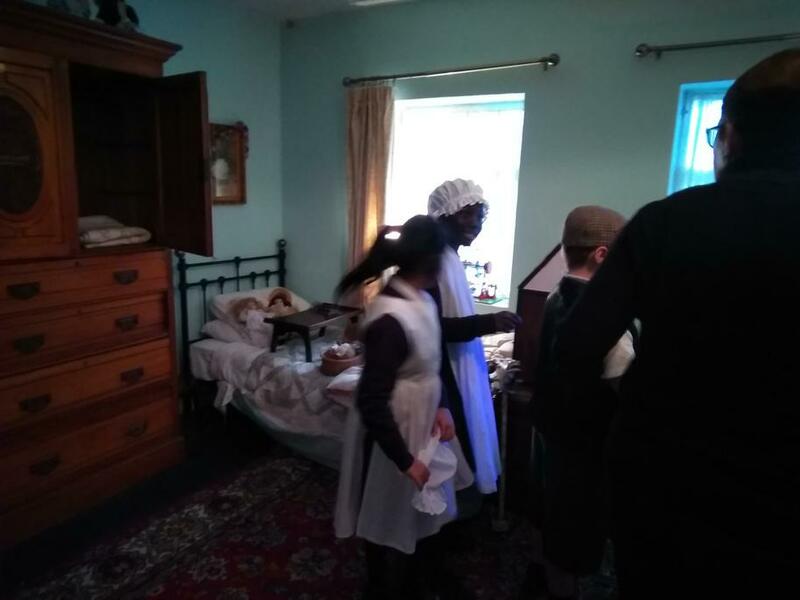 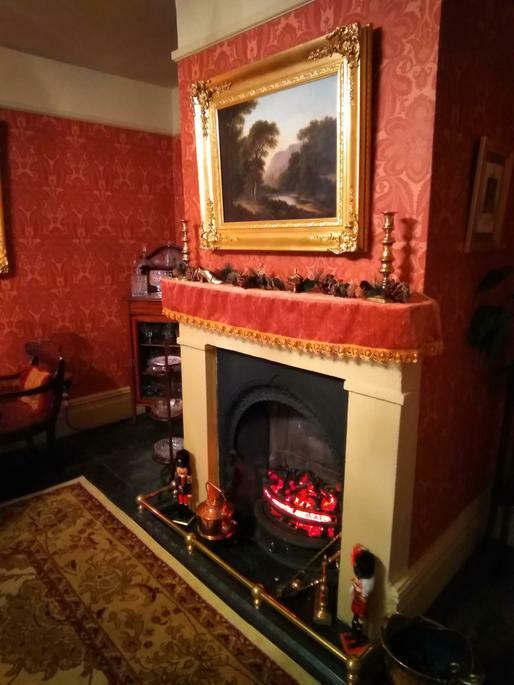 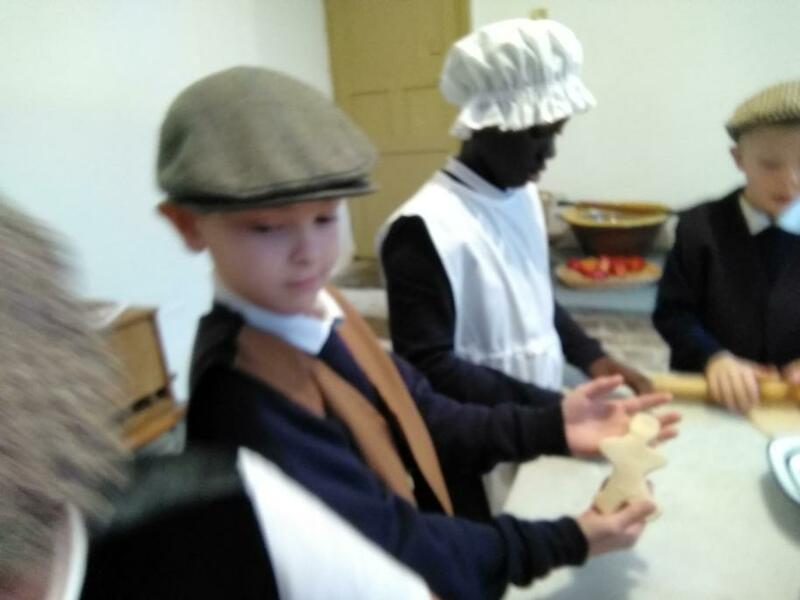 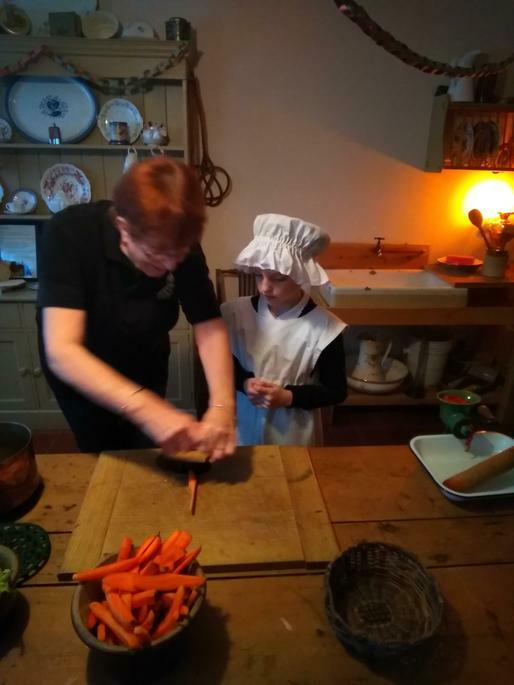 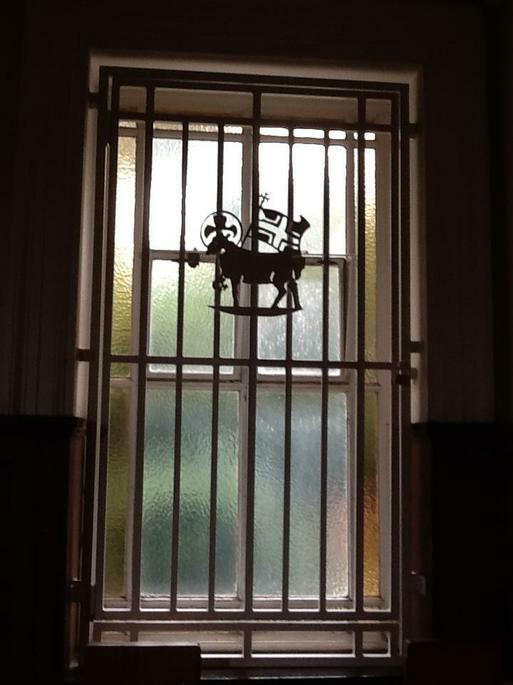 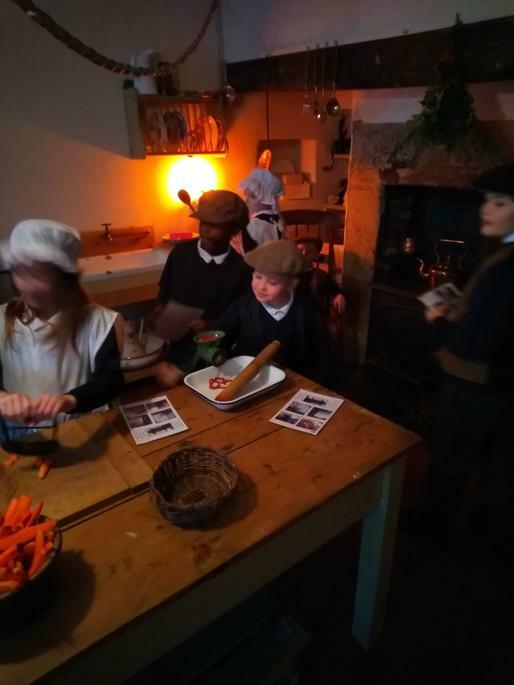 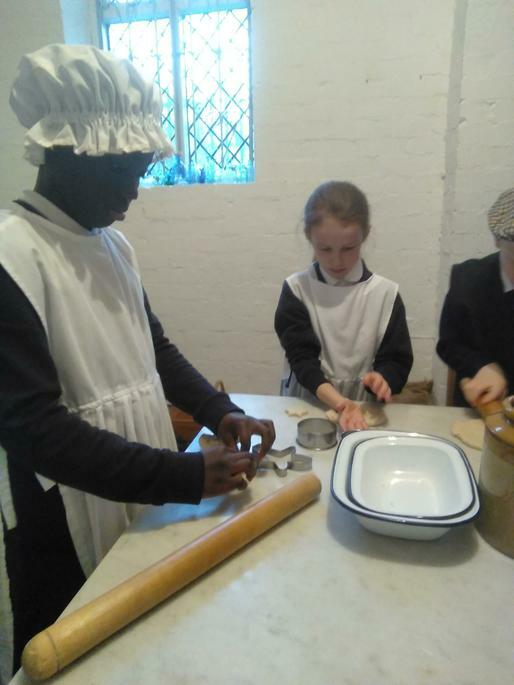 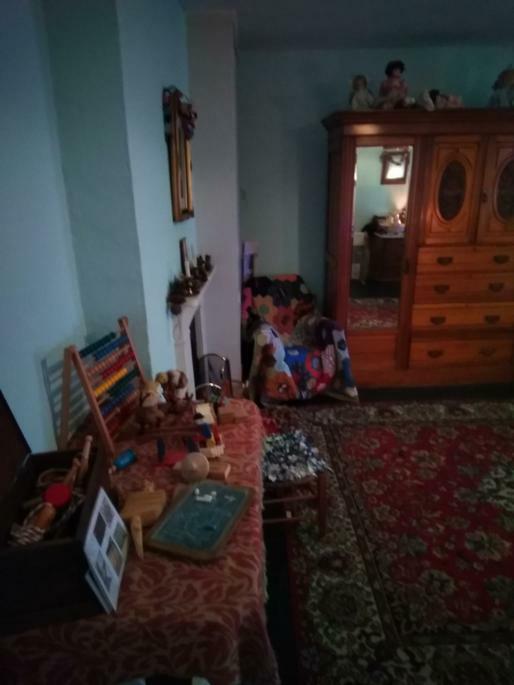 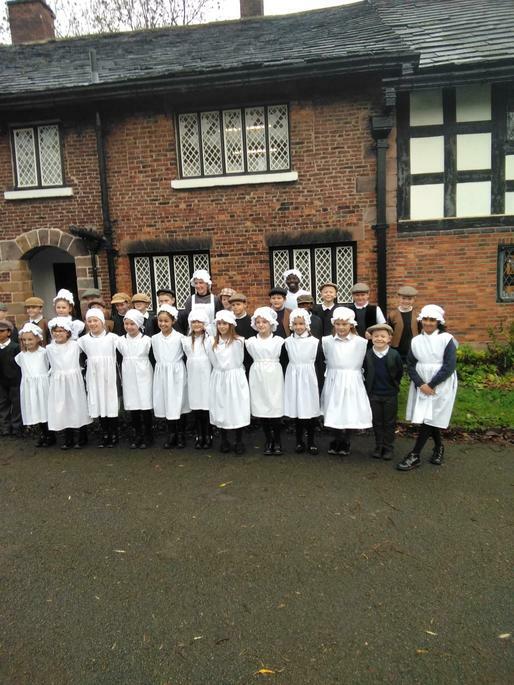 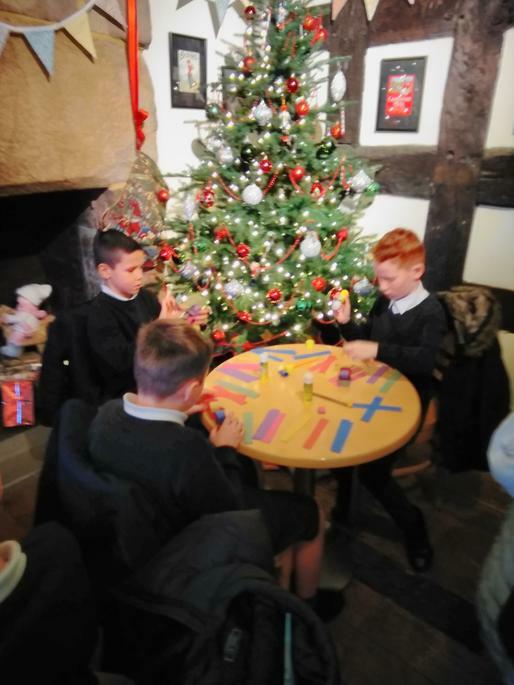 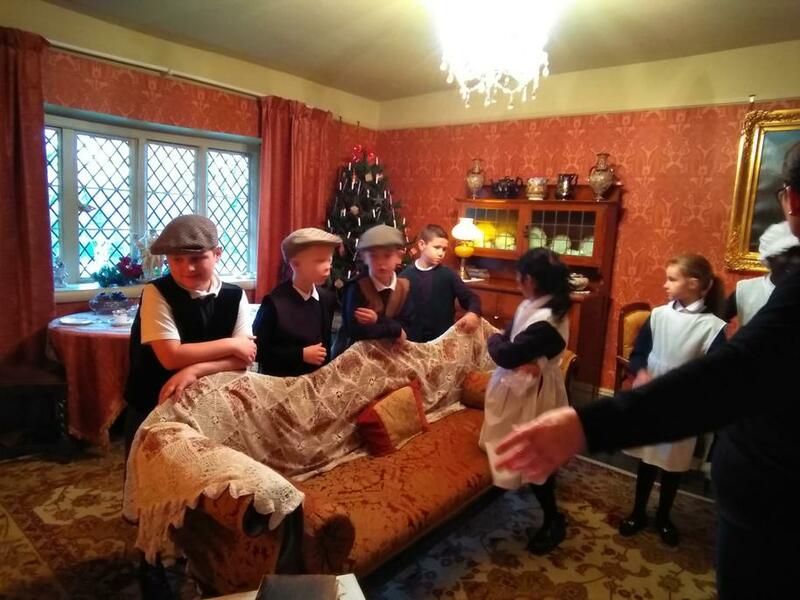 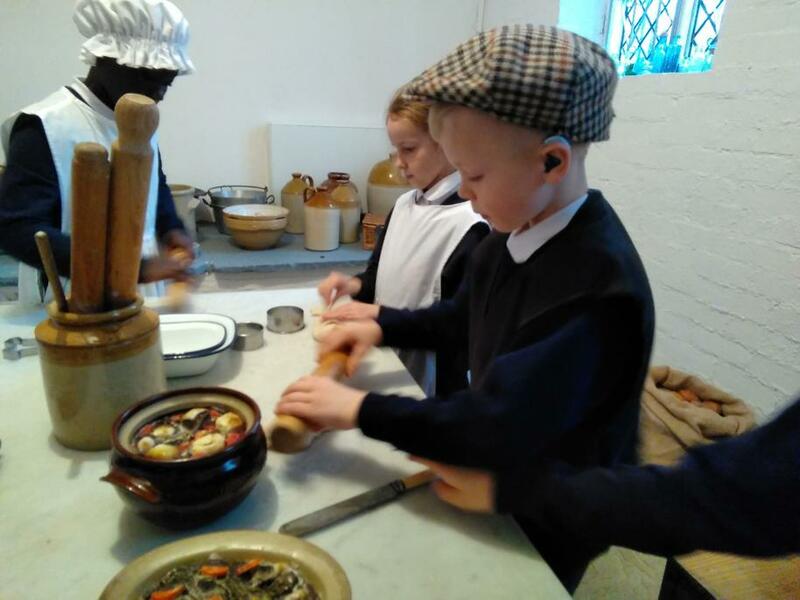 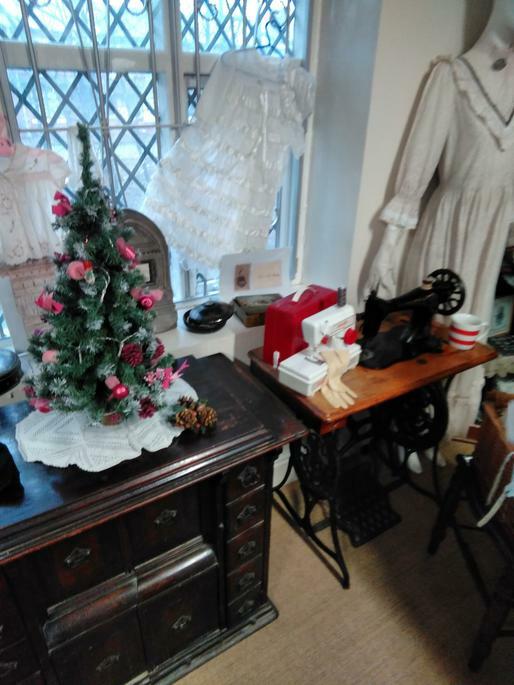 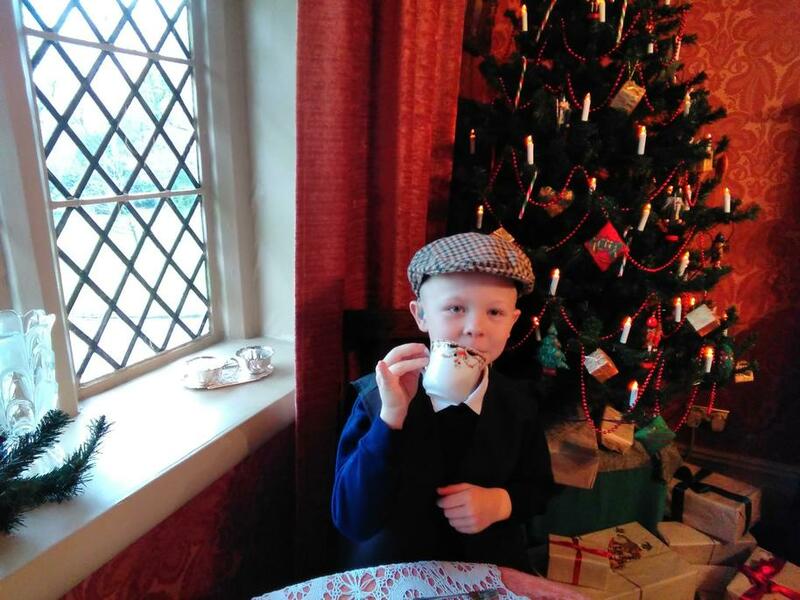 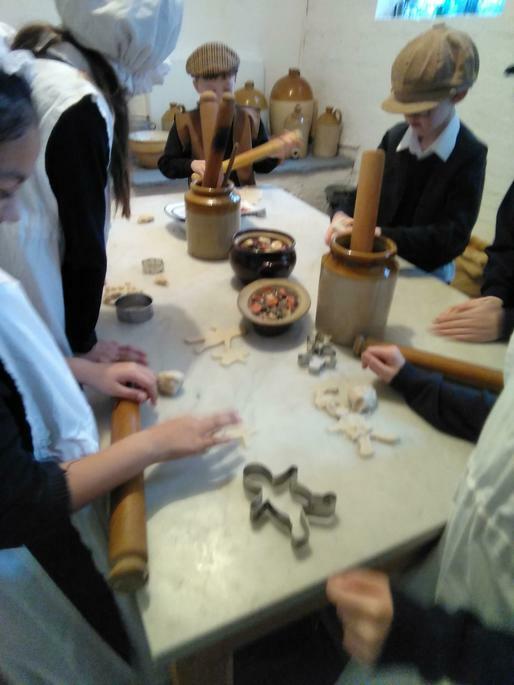 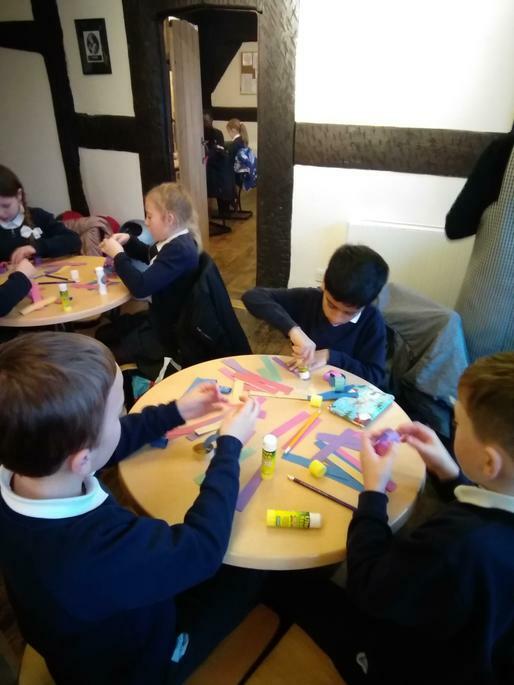 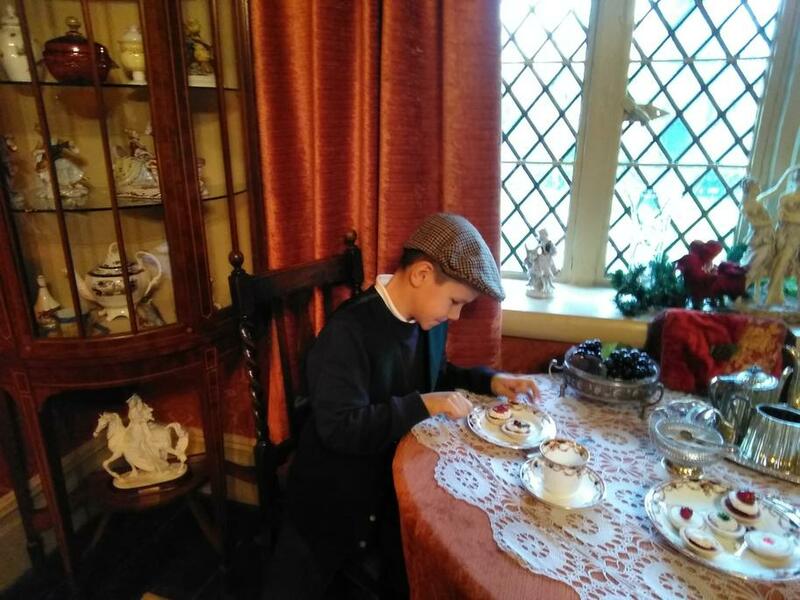 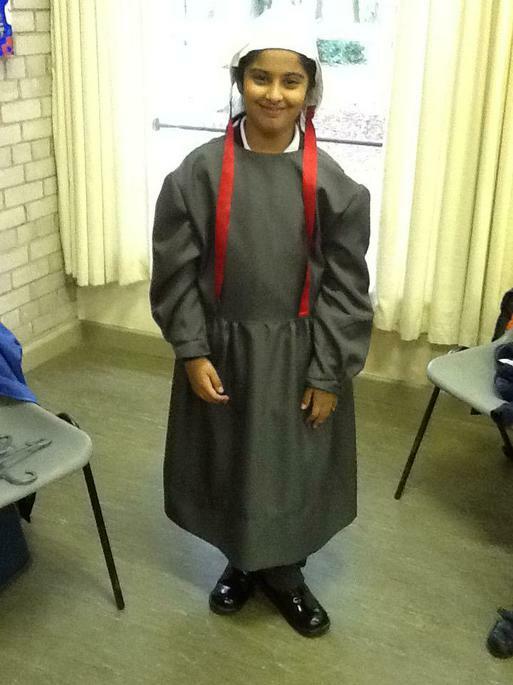 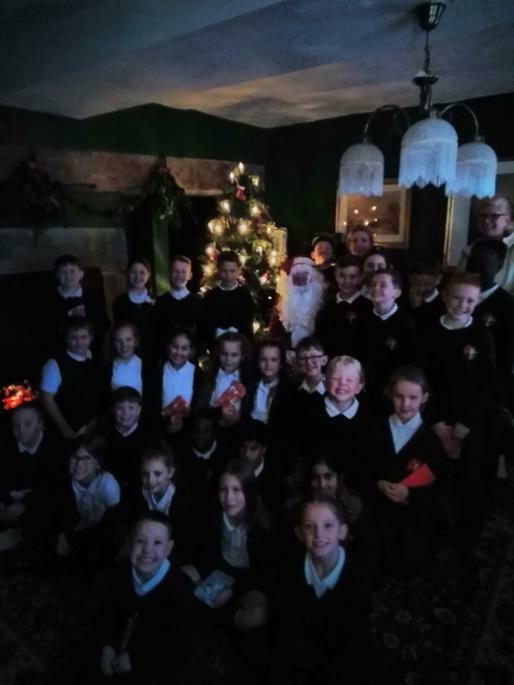 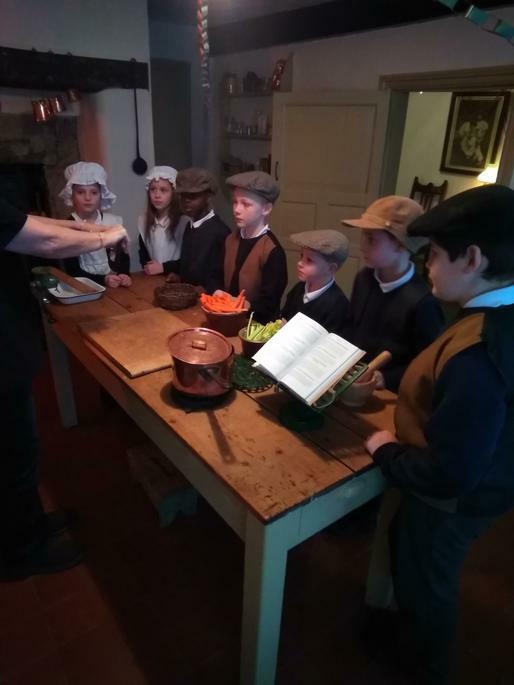 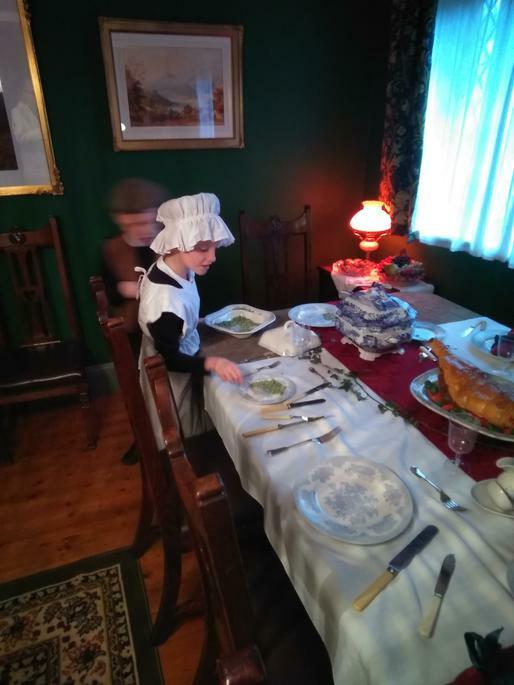 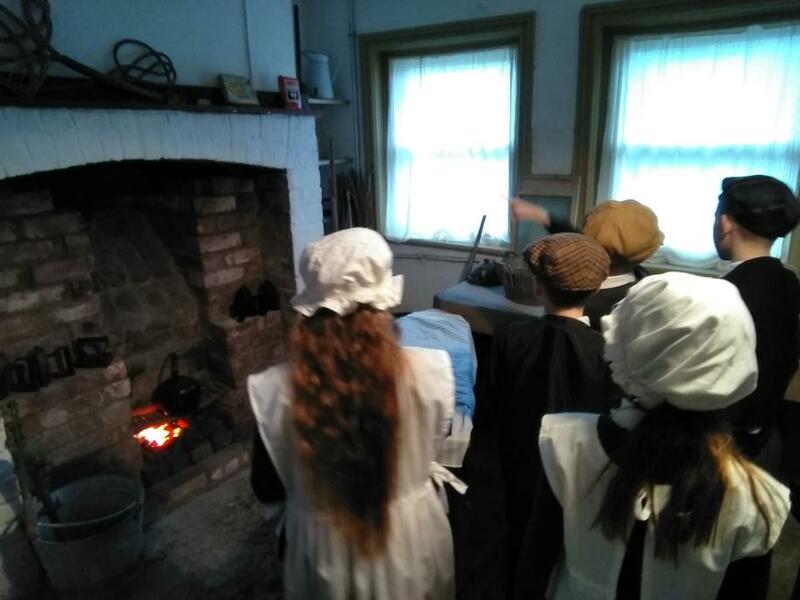 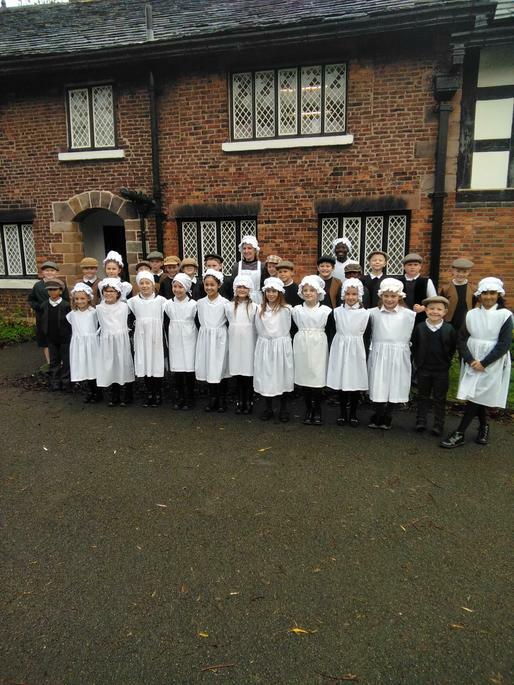 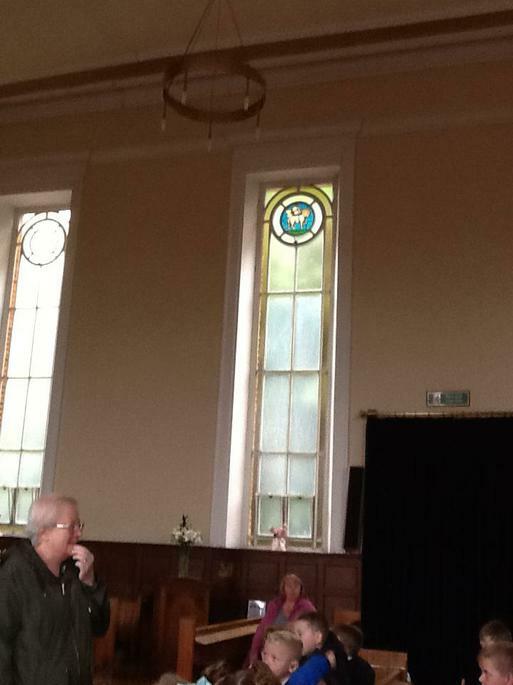 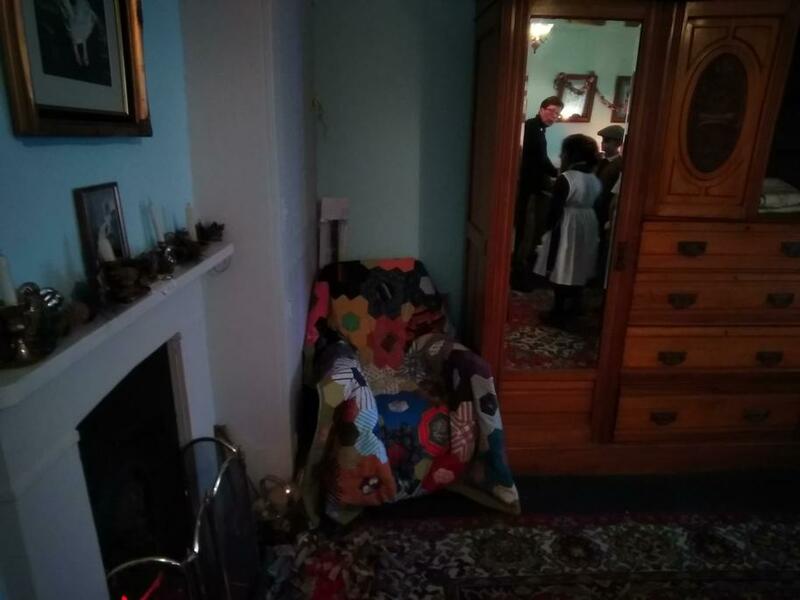 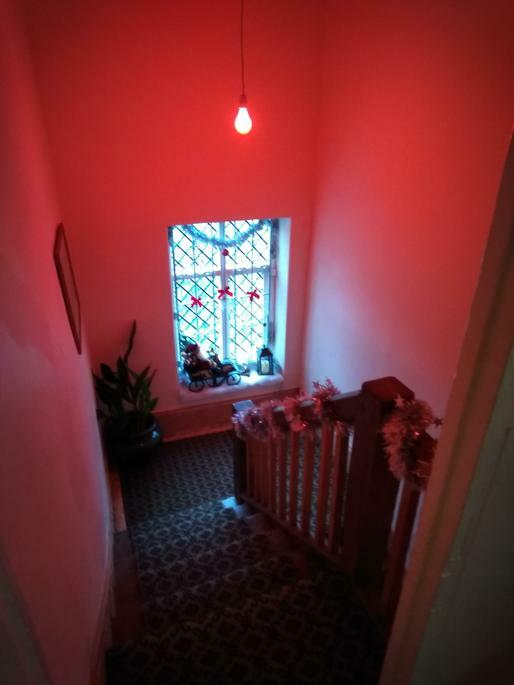 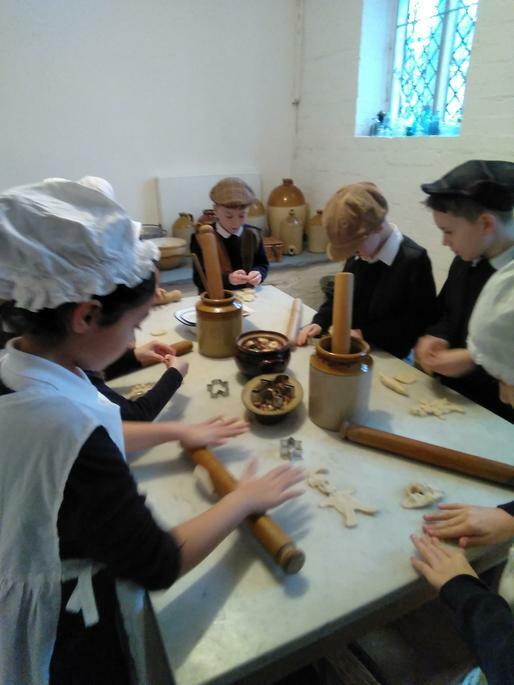 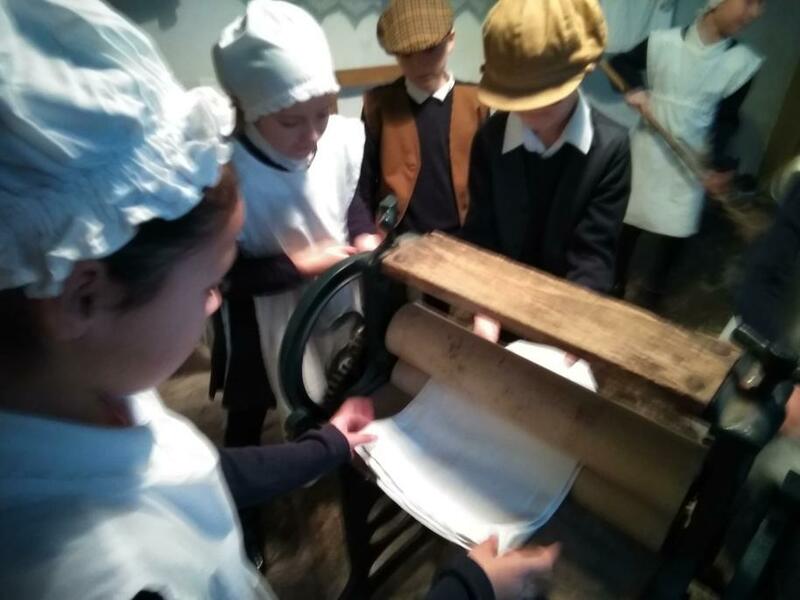 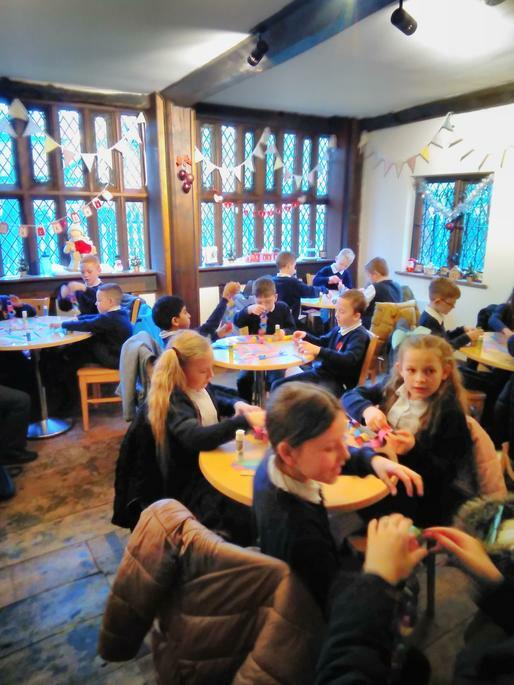 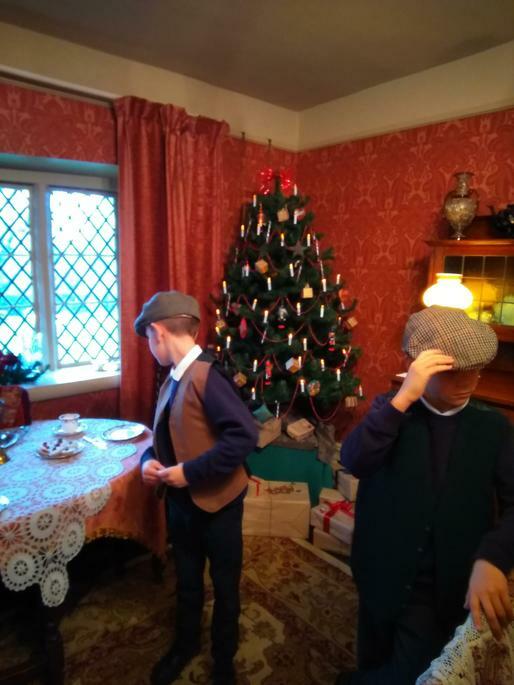 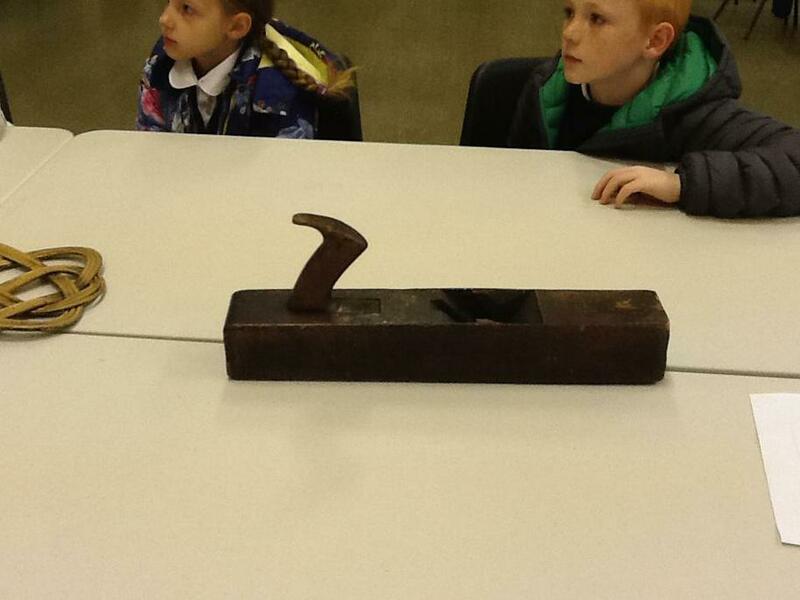 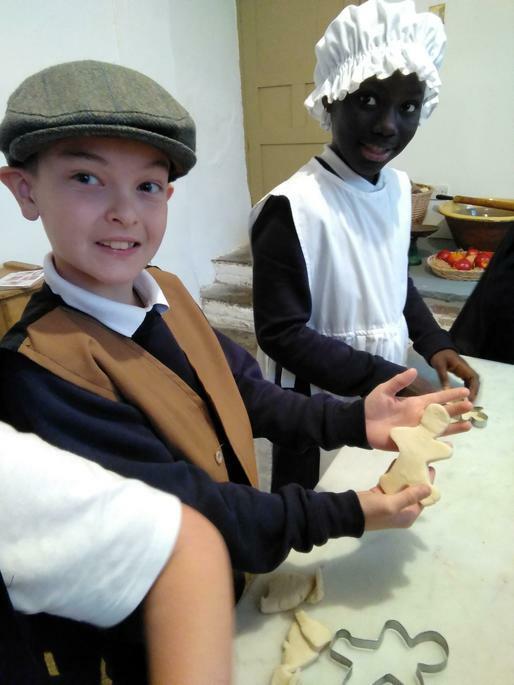 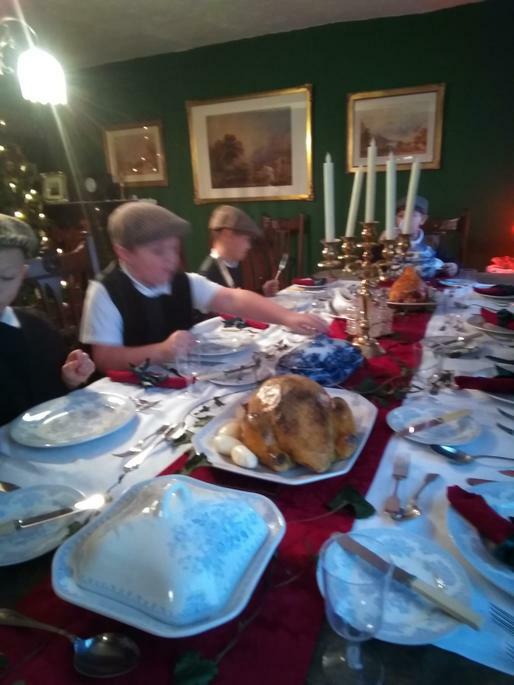 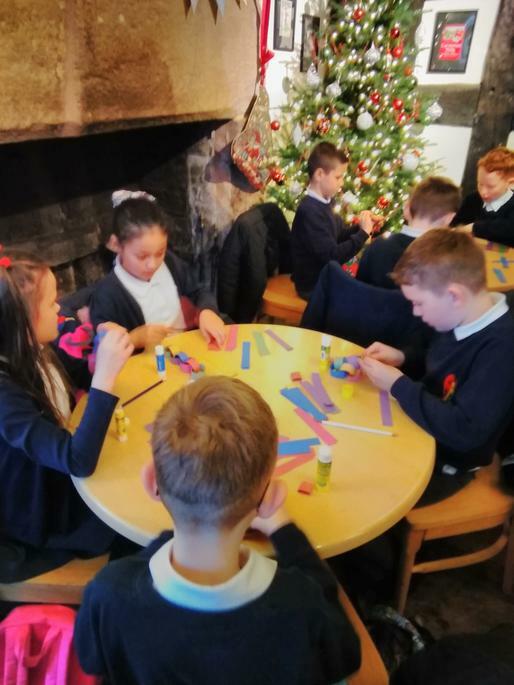 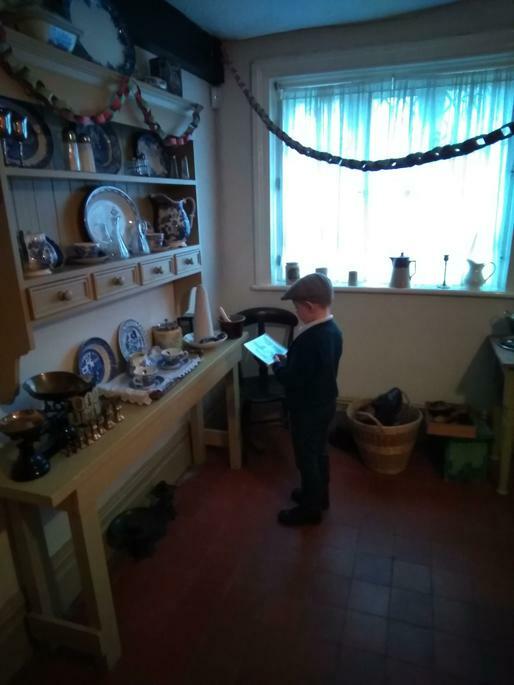 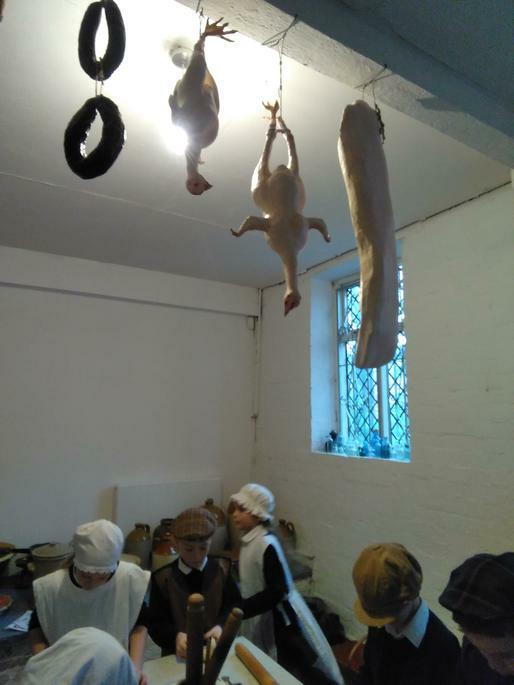 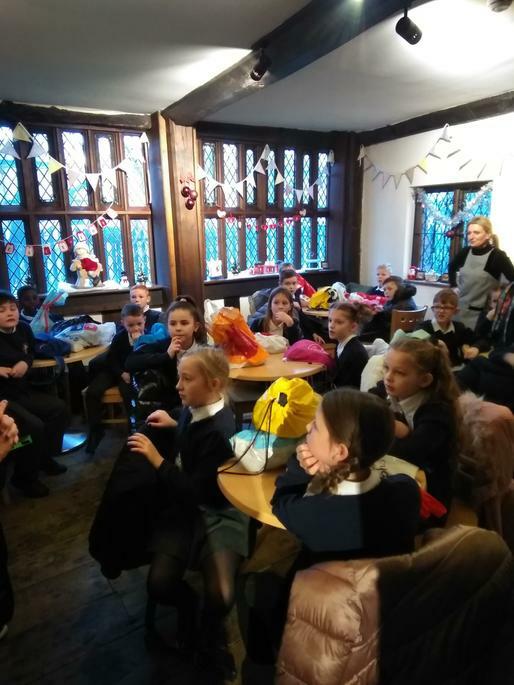 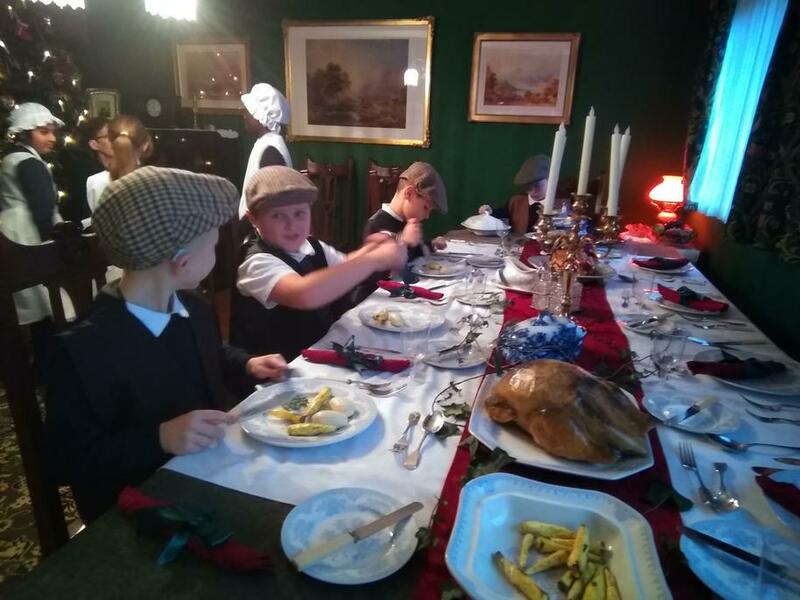 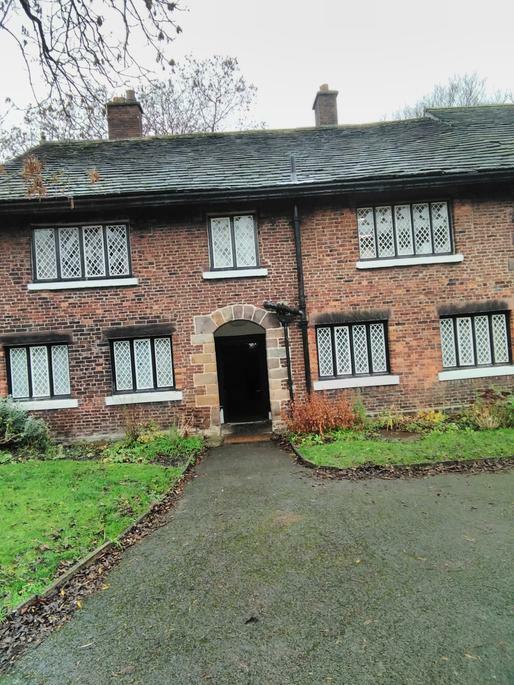 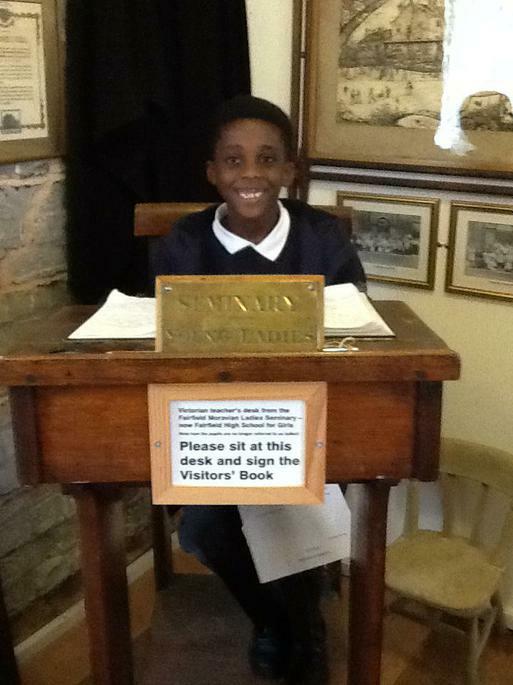 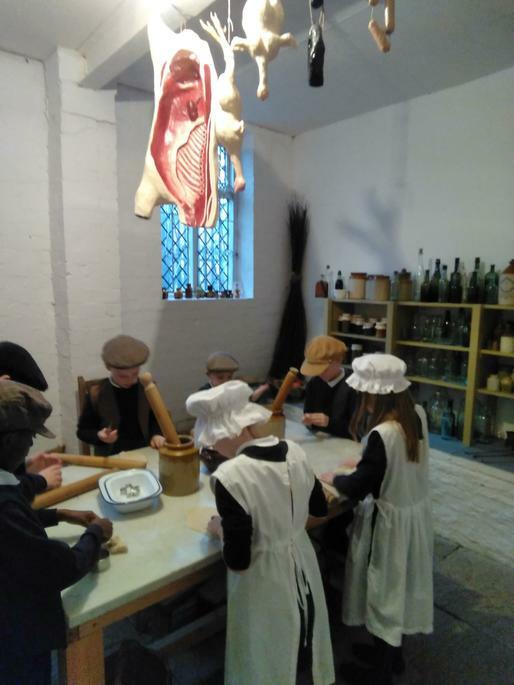 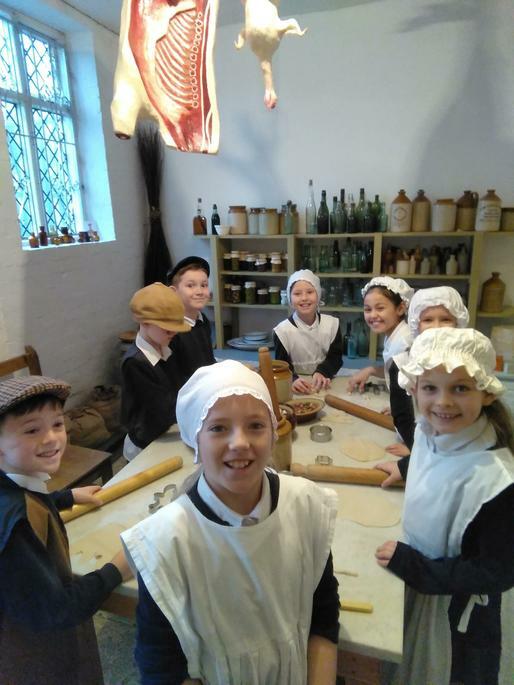 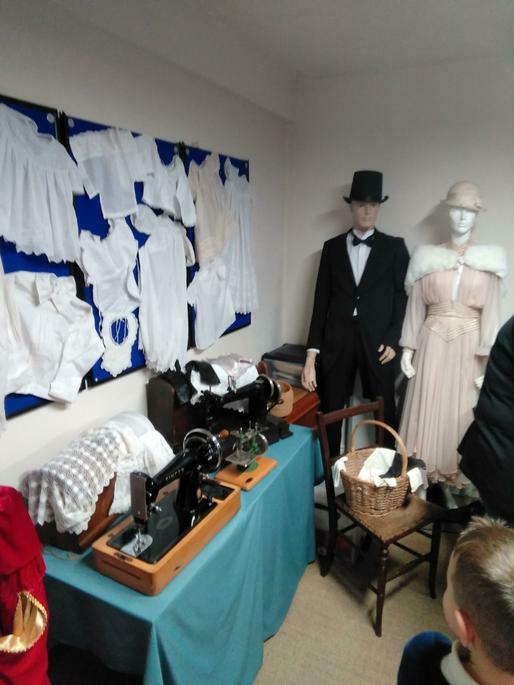 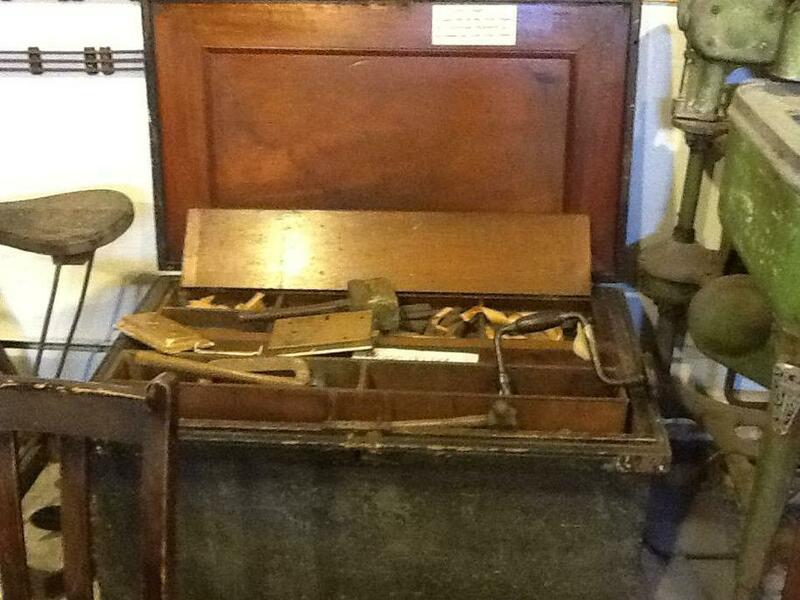 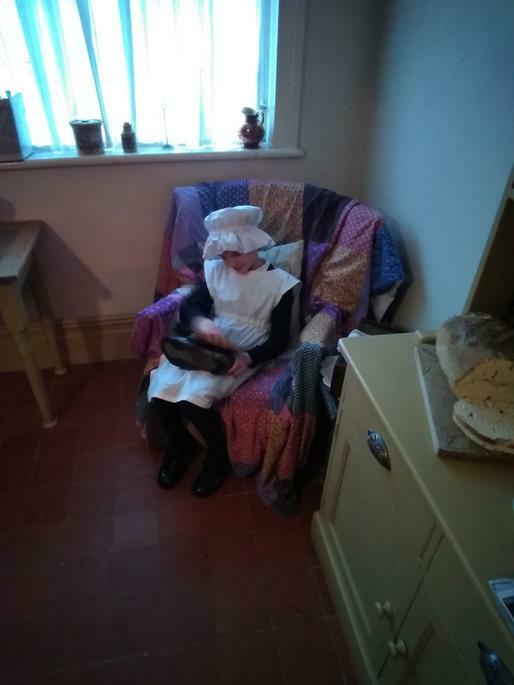 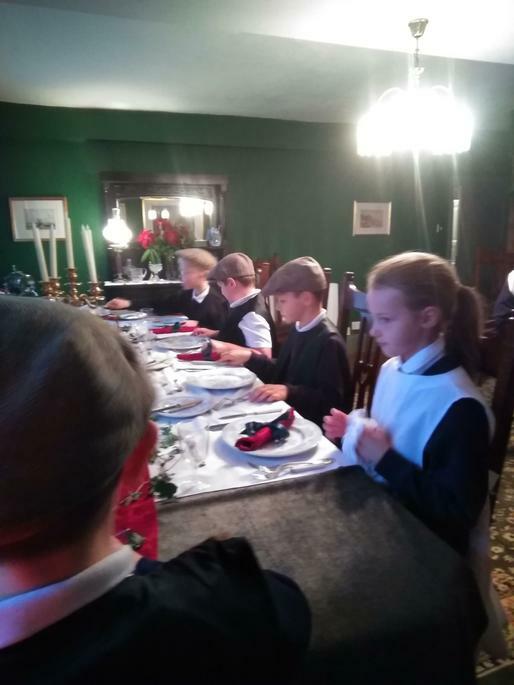 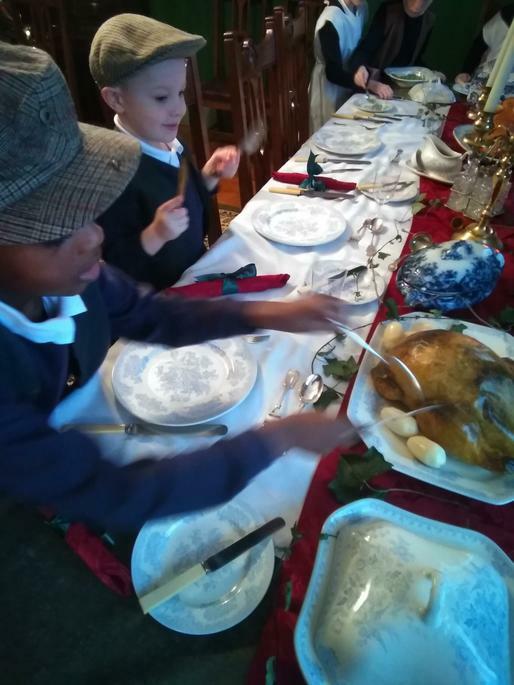 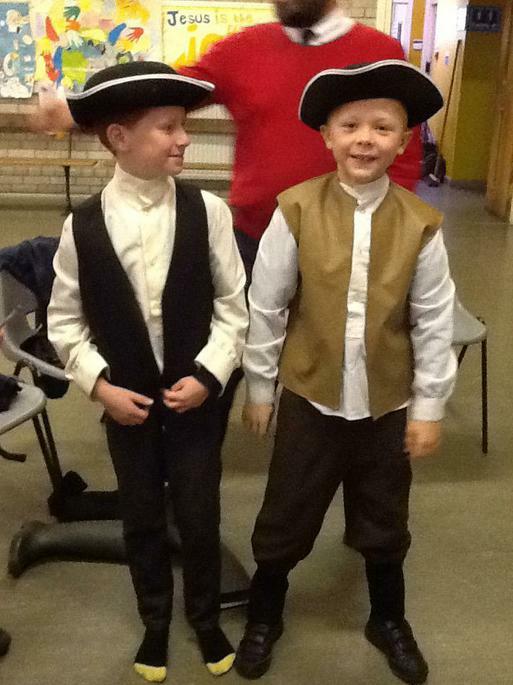 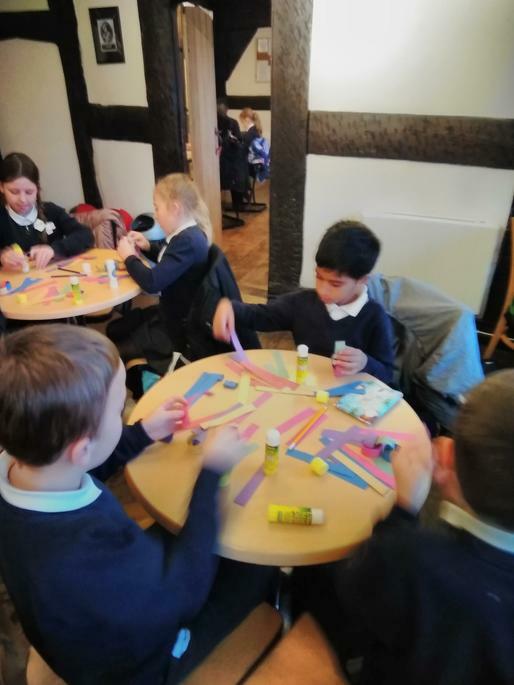 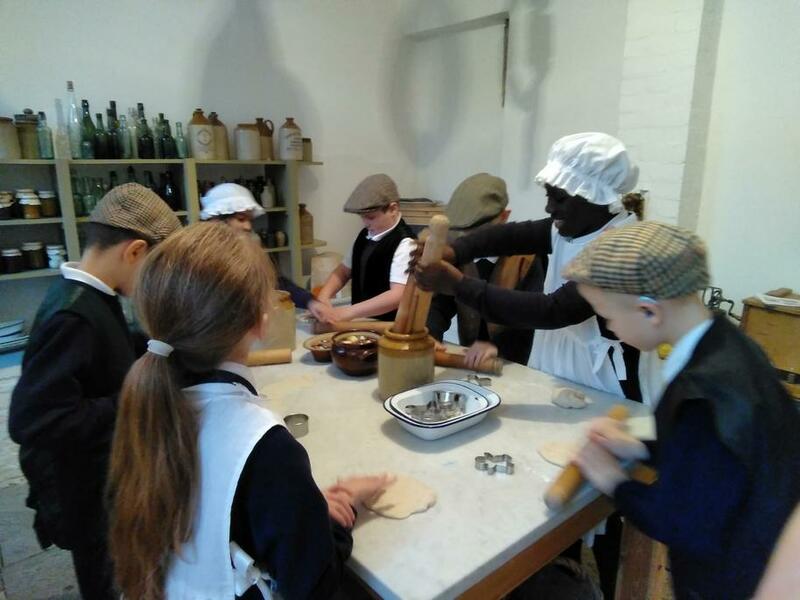 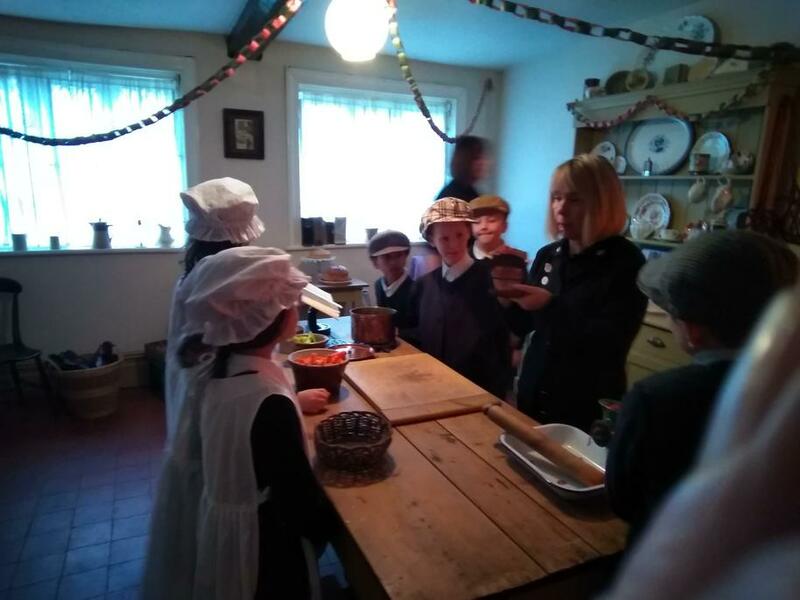 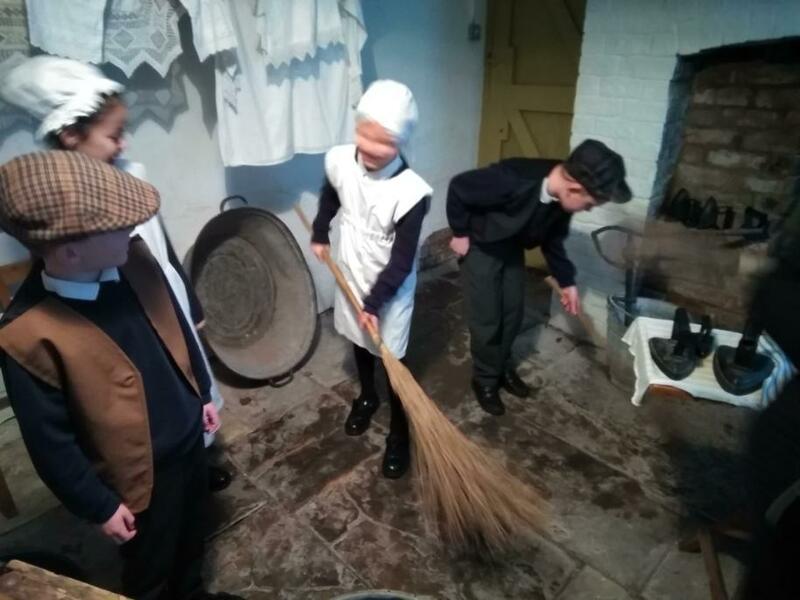 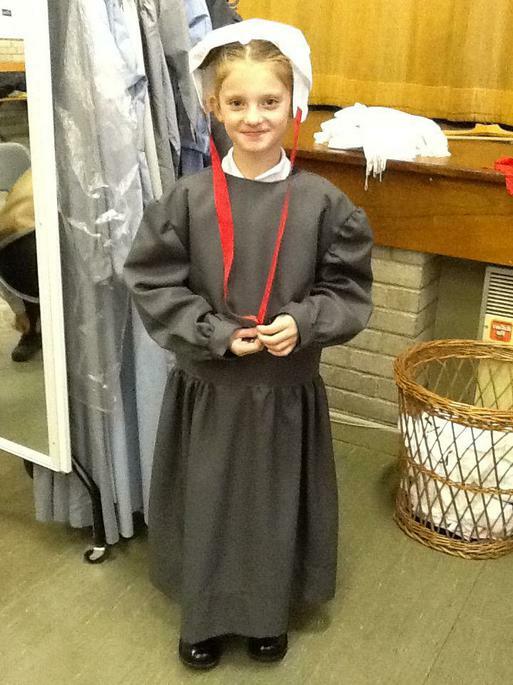 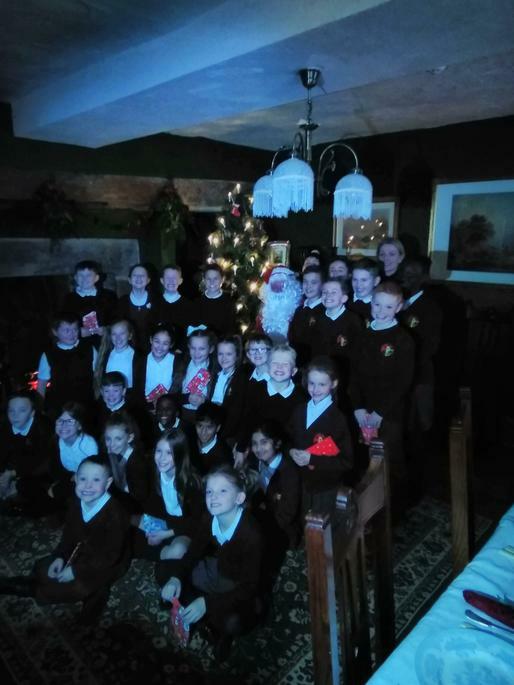 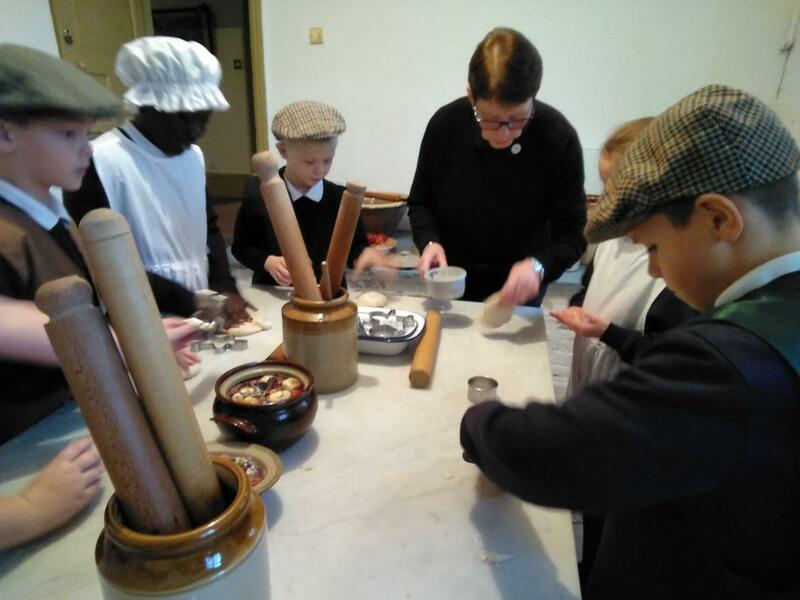 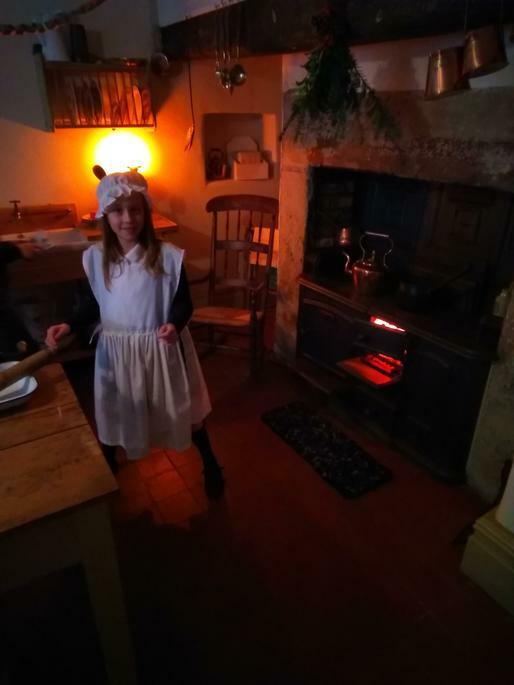 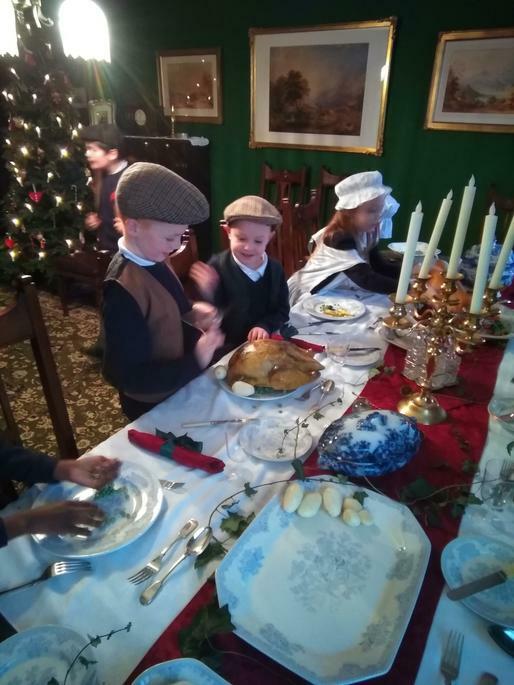 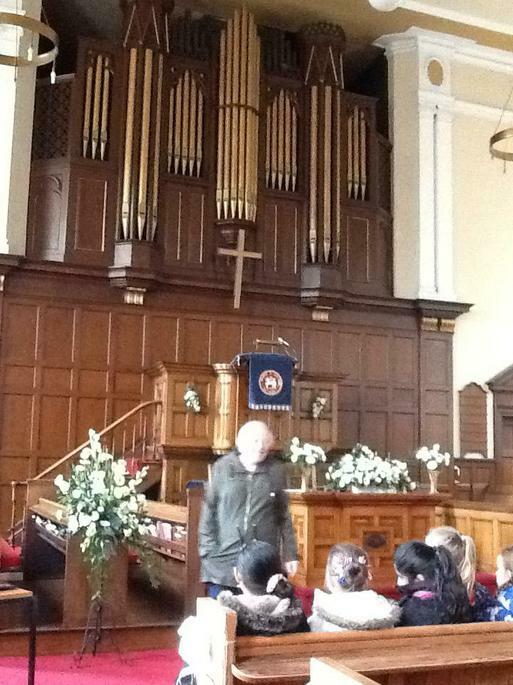 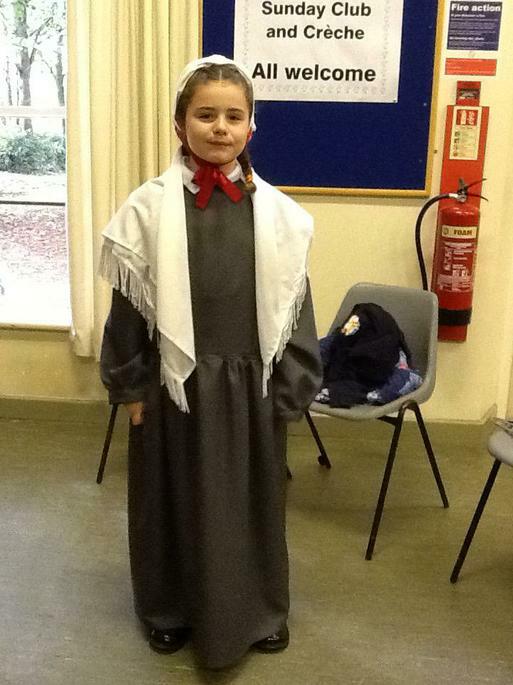 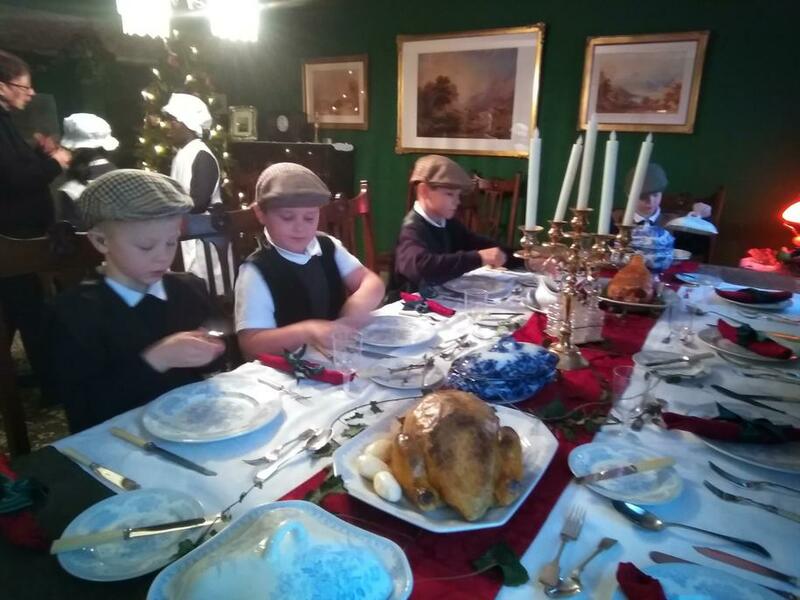 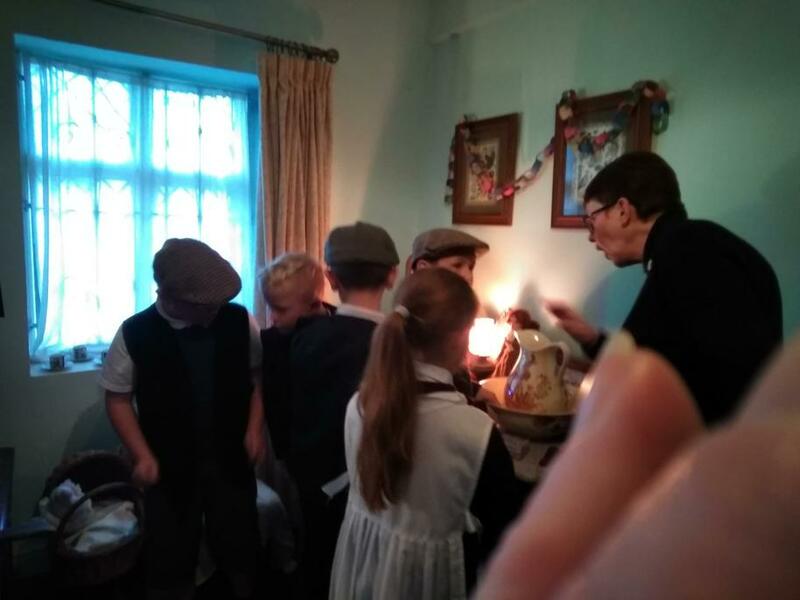 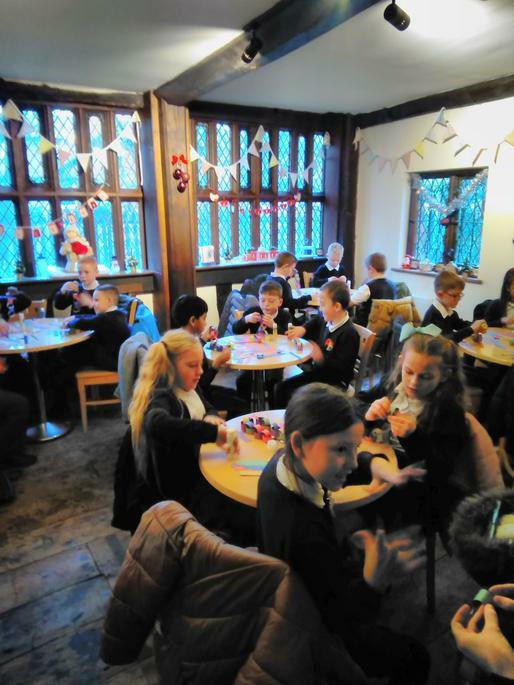 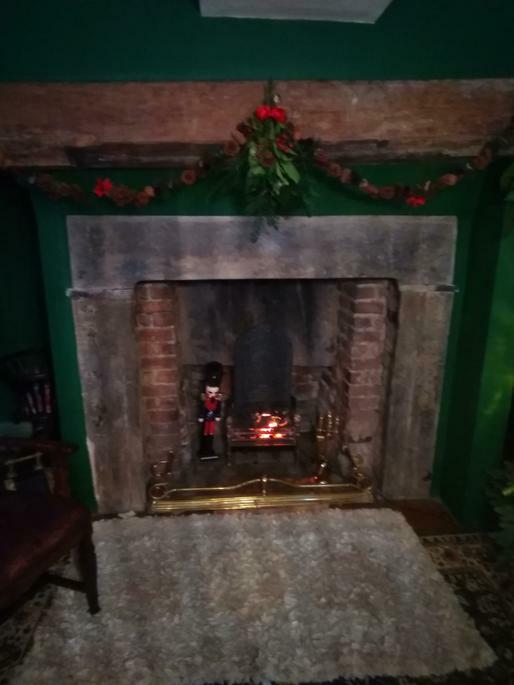 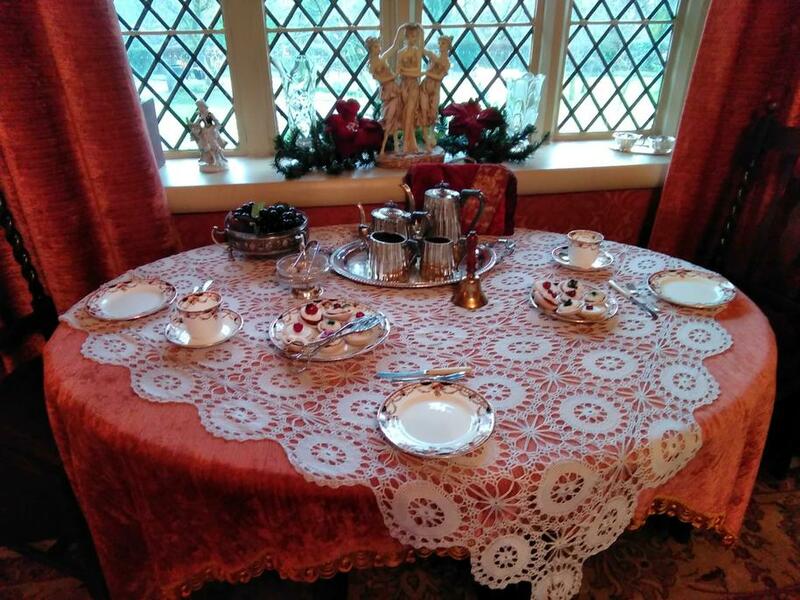 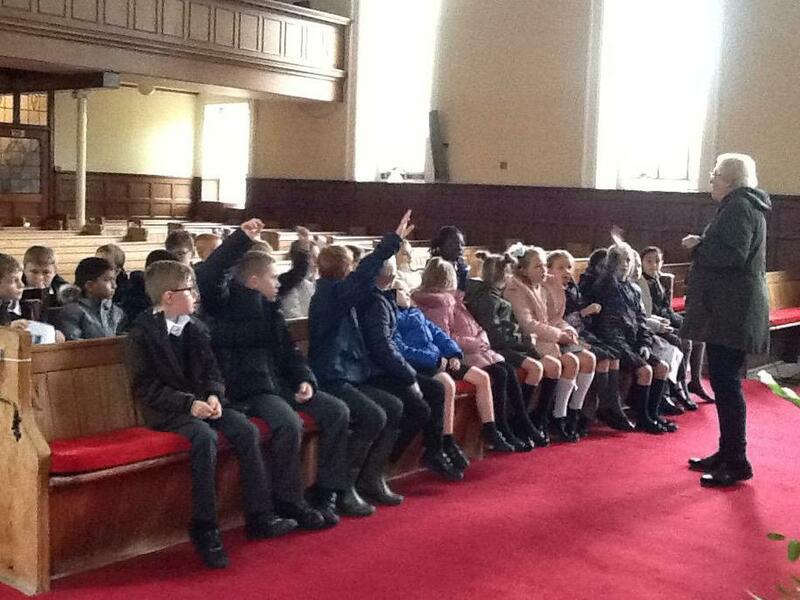 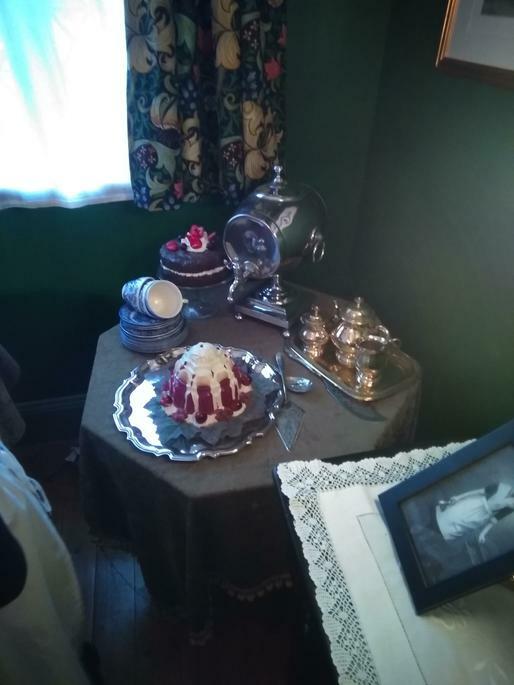 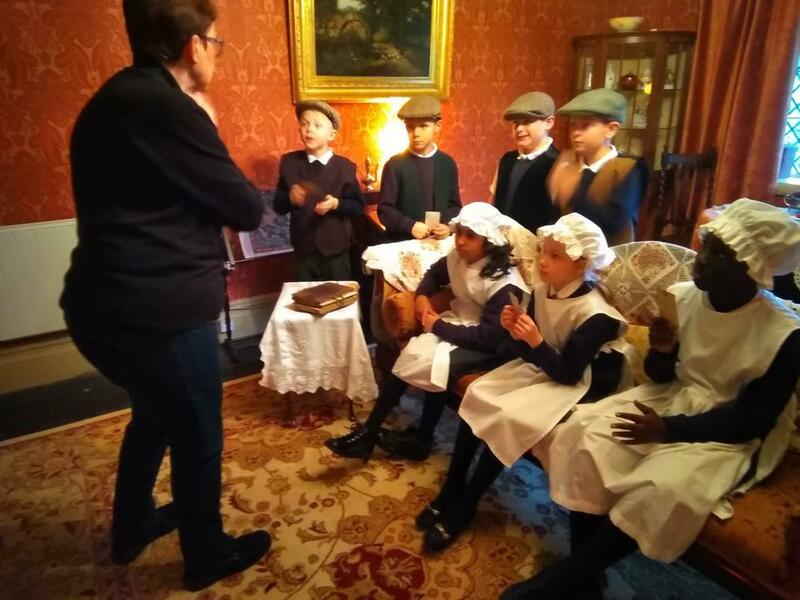 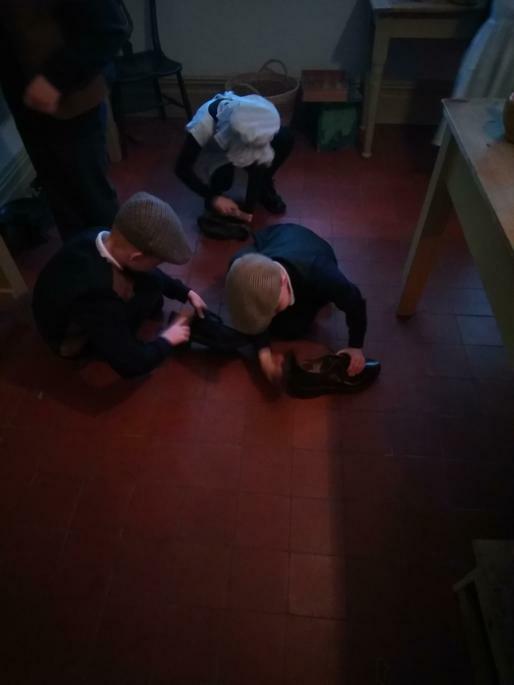 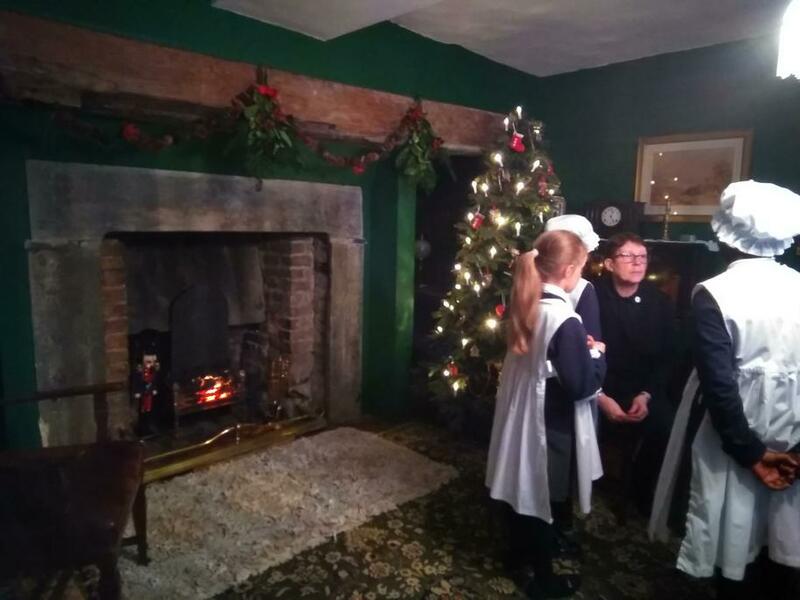 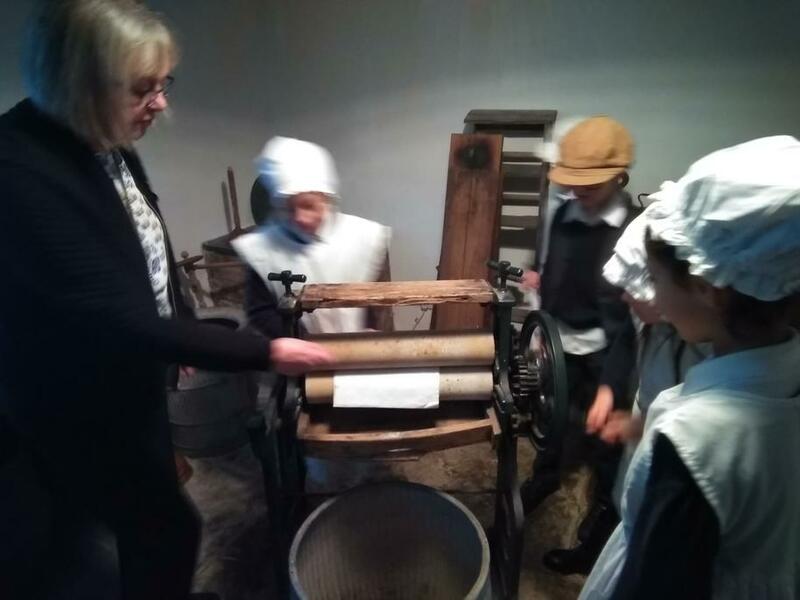 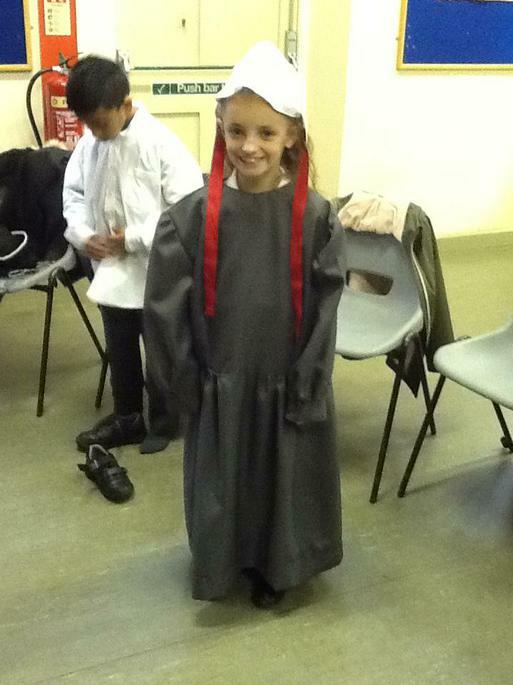 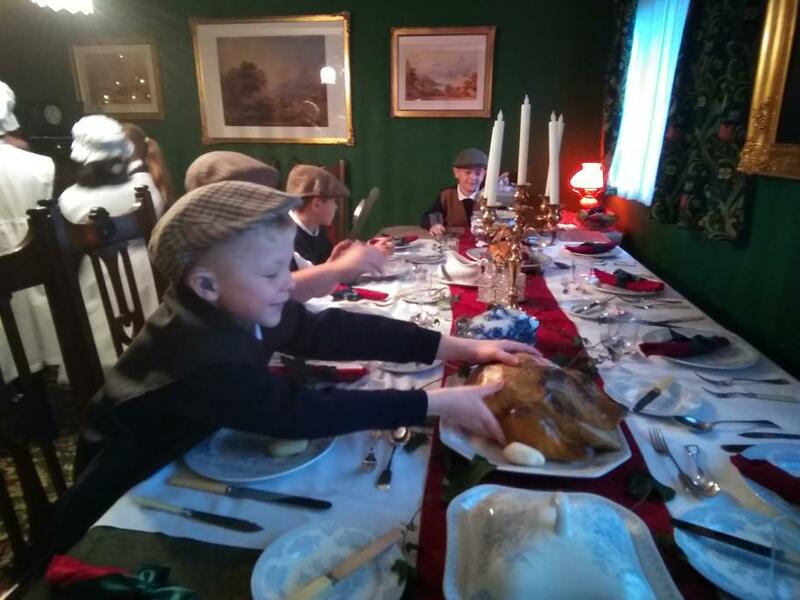 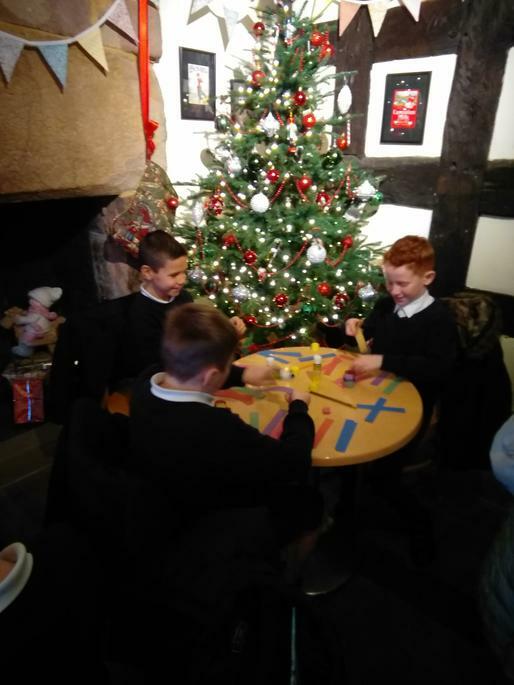 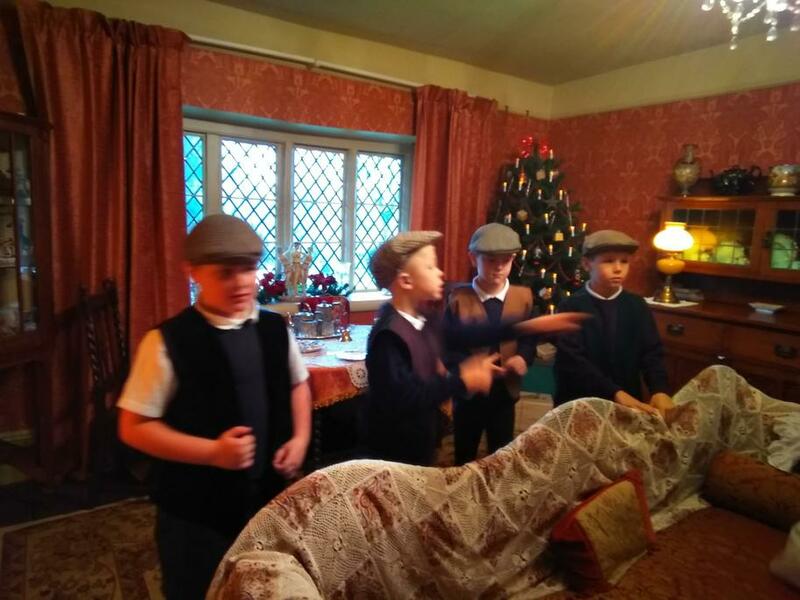 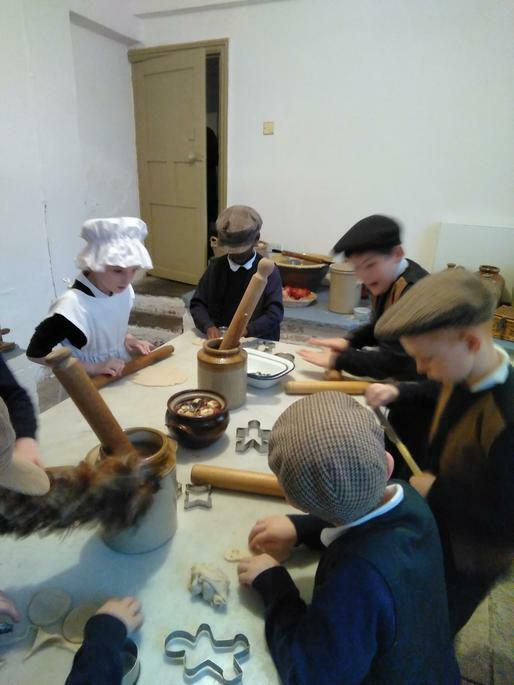 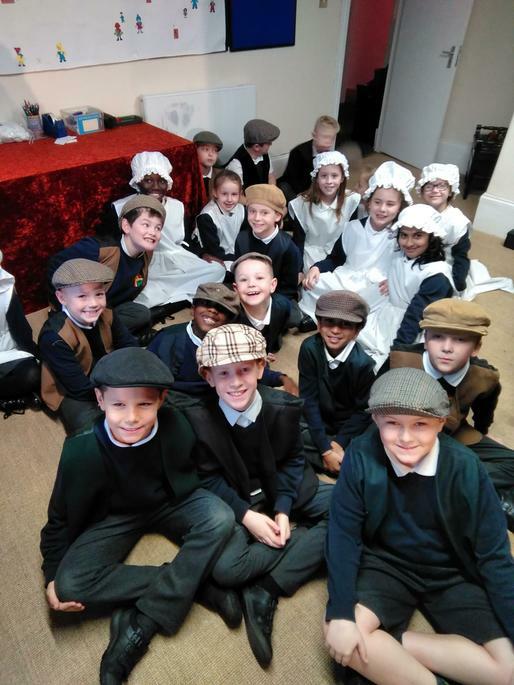 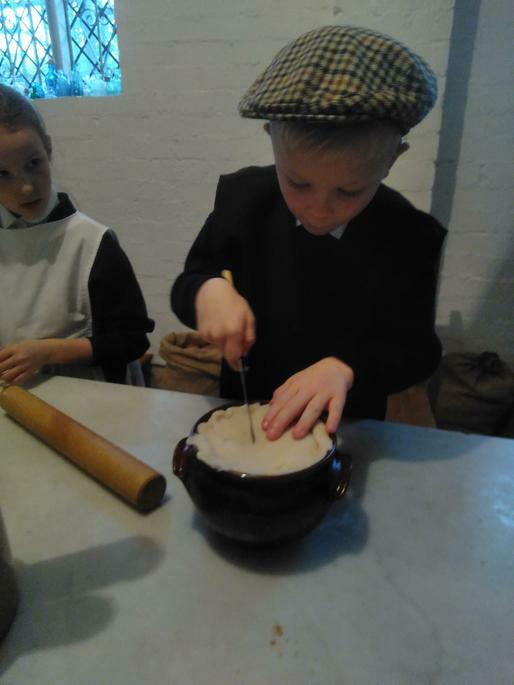 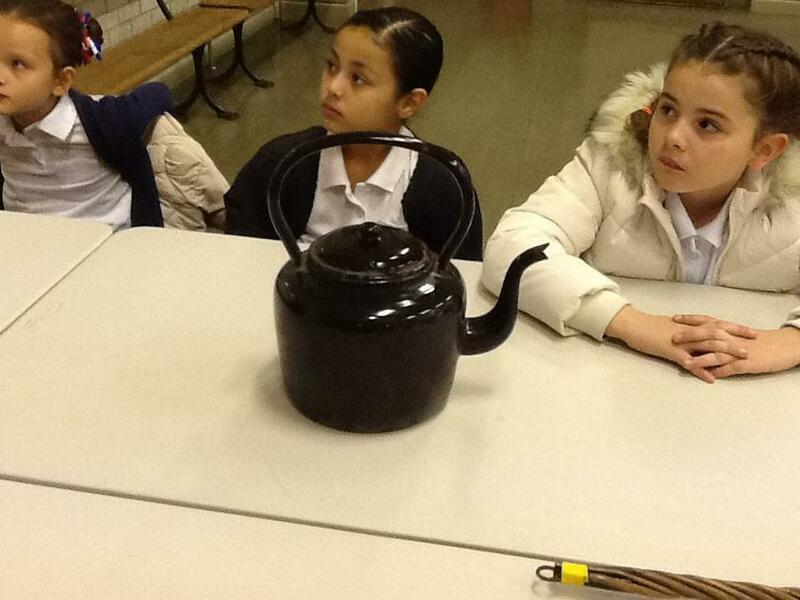 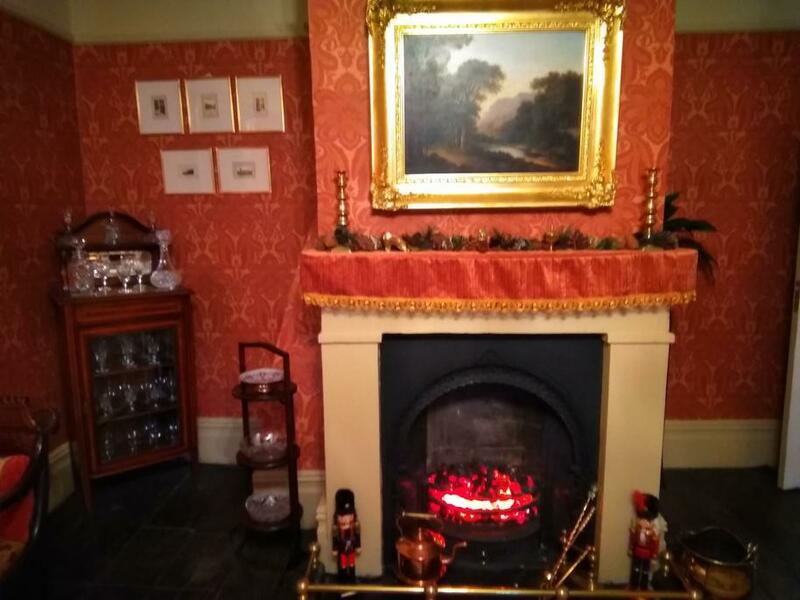 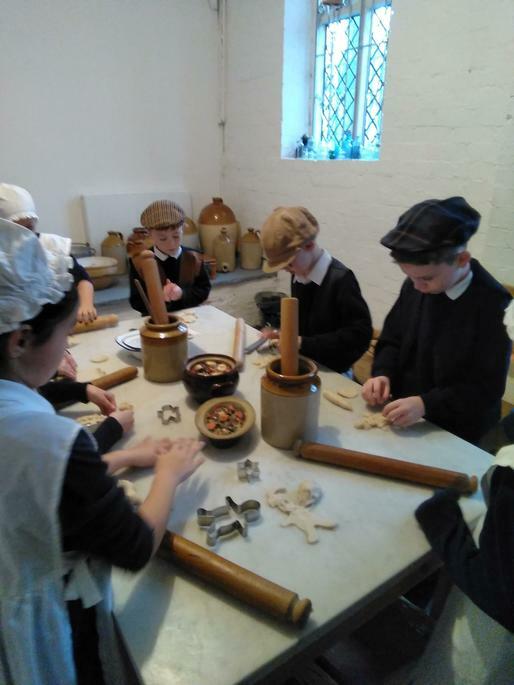 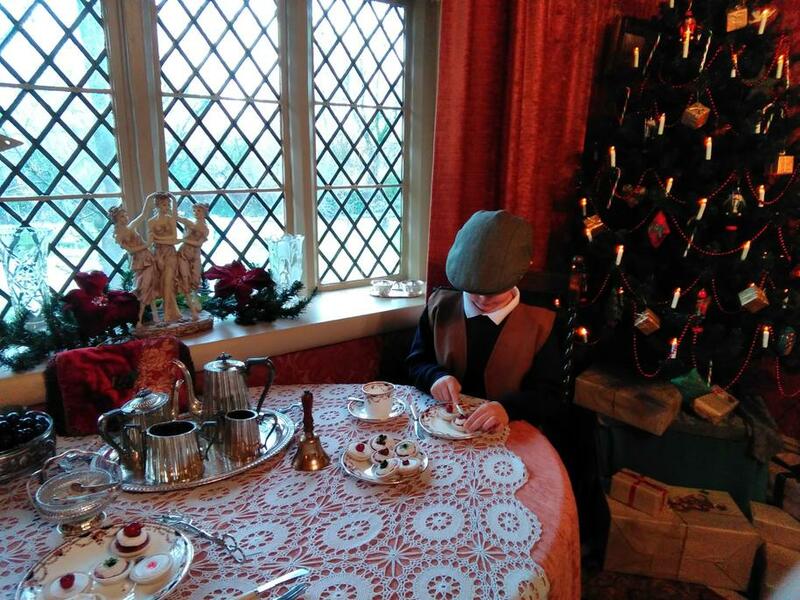 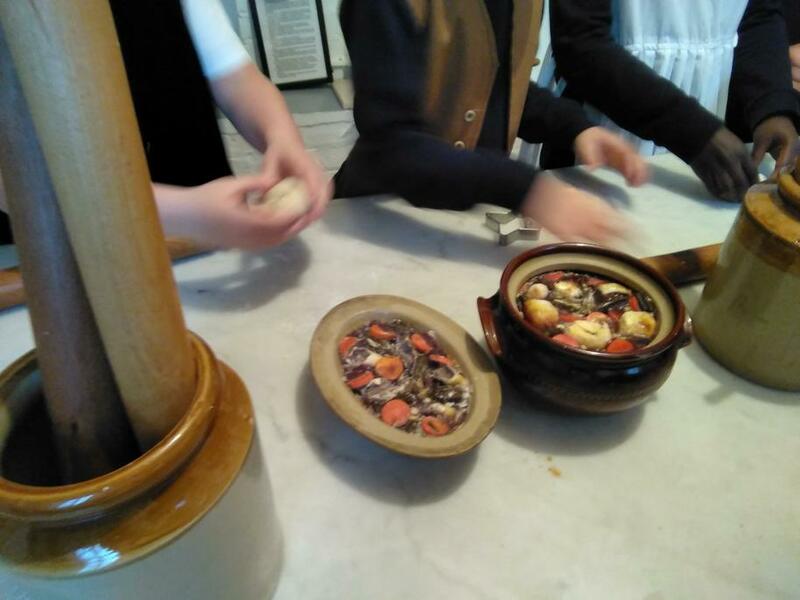 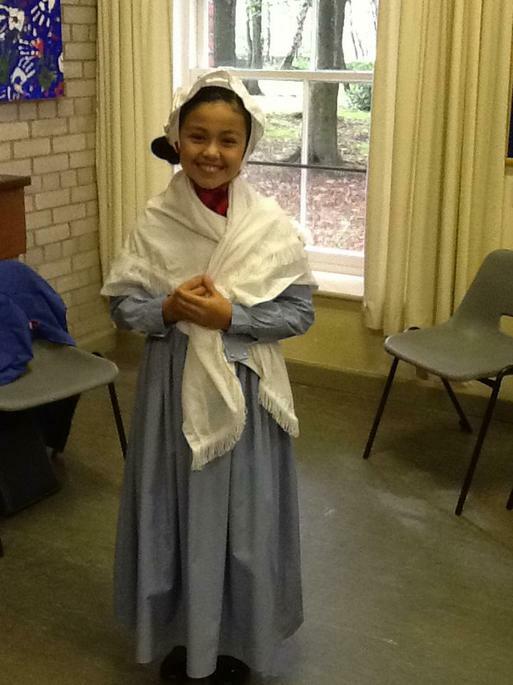 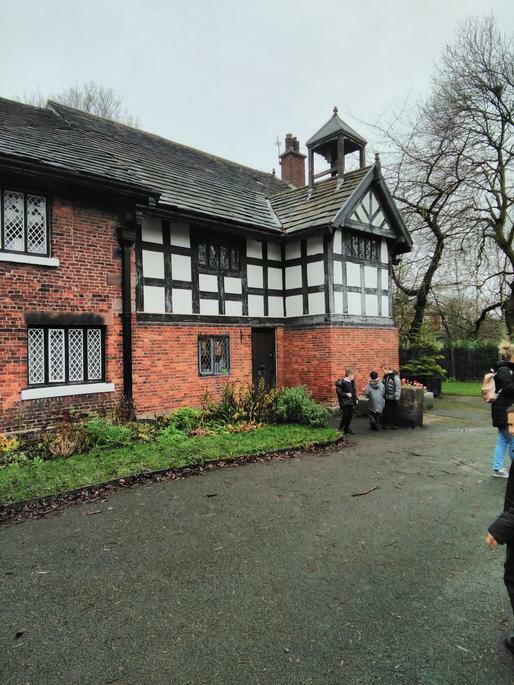 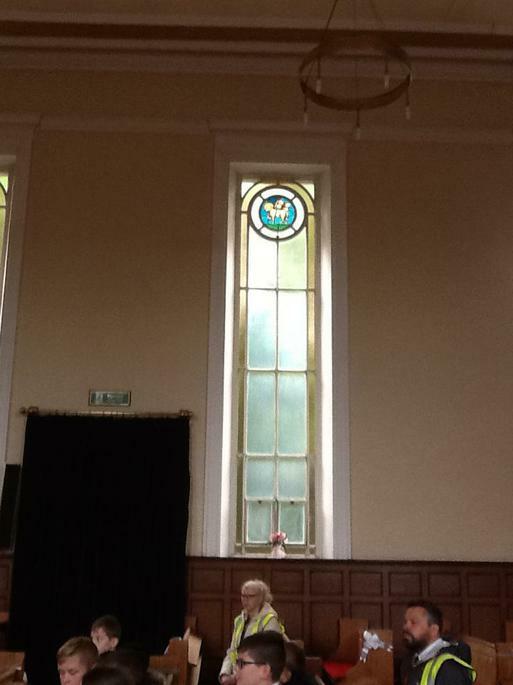 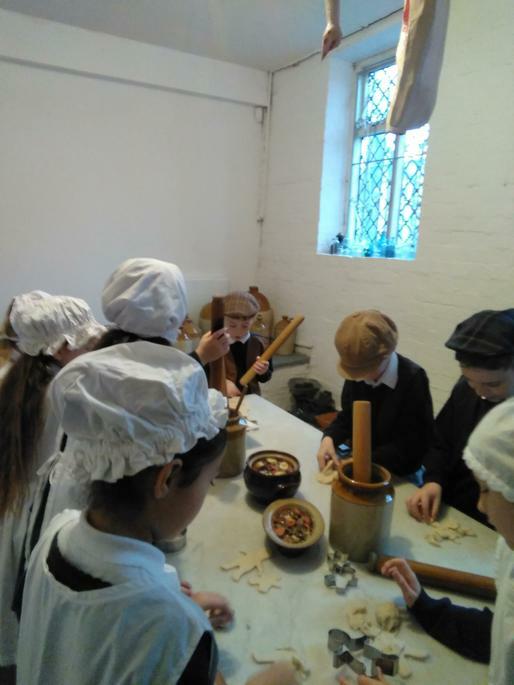 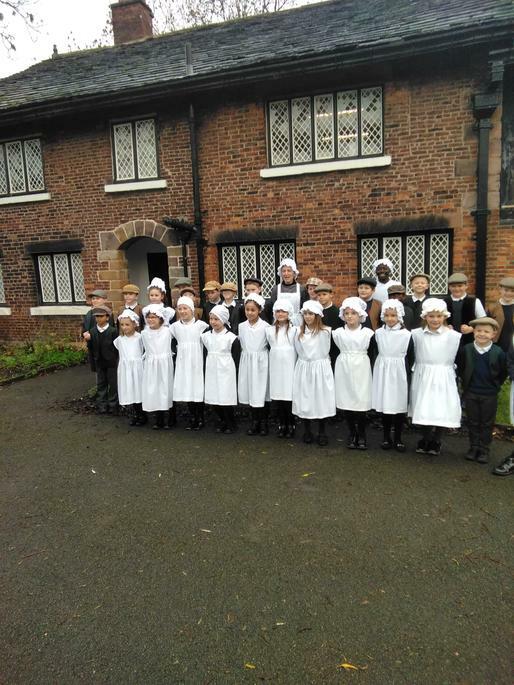 Today, our class visited Clayton Hall to experience a traditional Victorian Christmas. 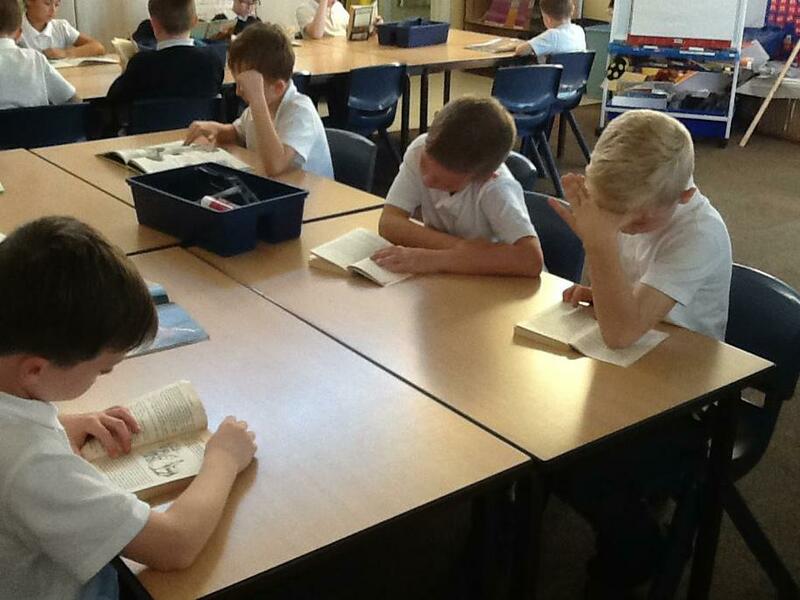 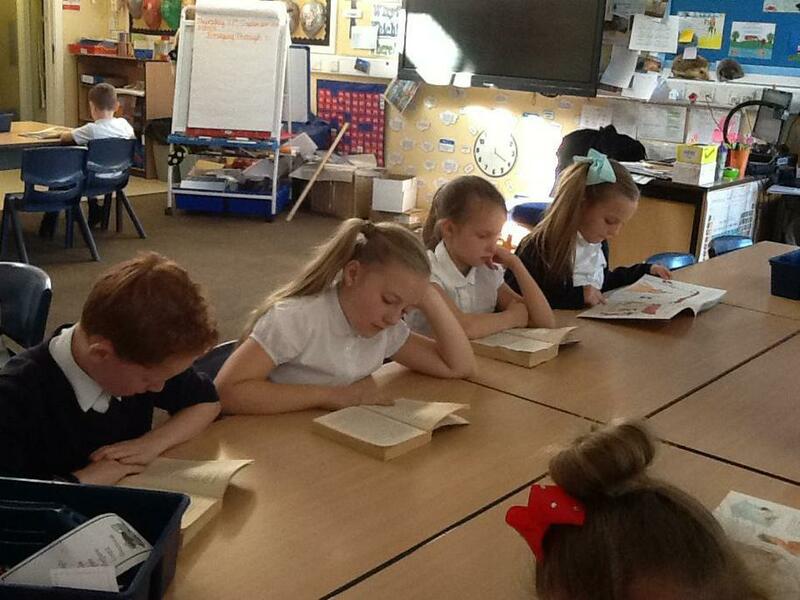 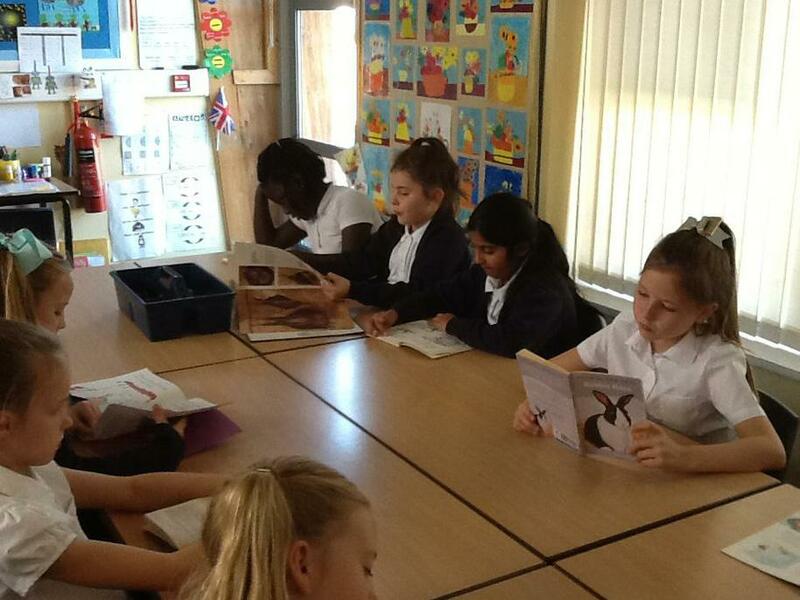 This term, our class are reading the book 'Tom's Midnight Garden.' 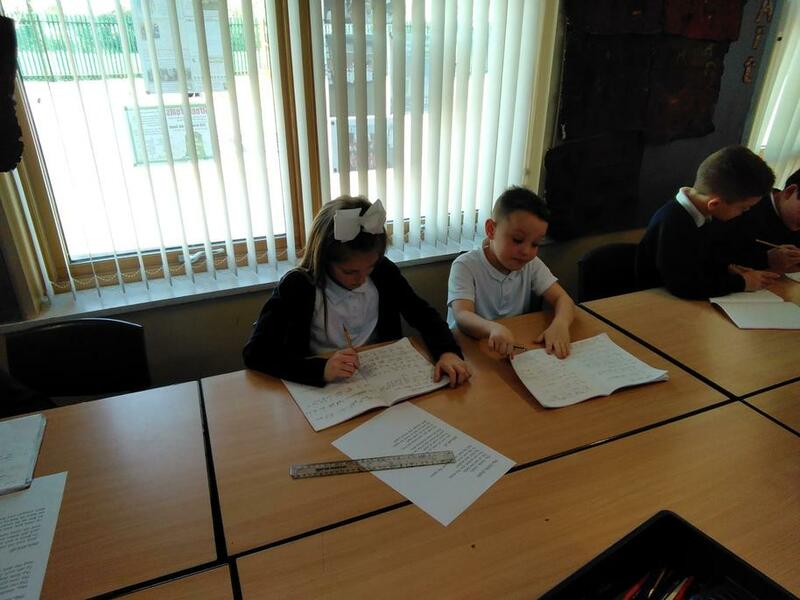 We are writing a new chapter for the story where Tom has an adventure with Hattie in the garden. 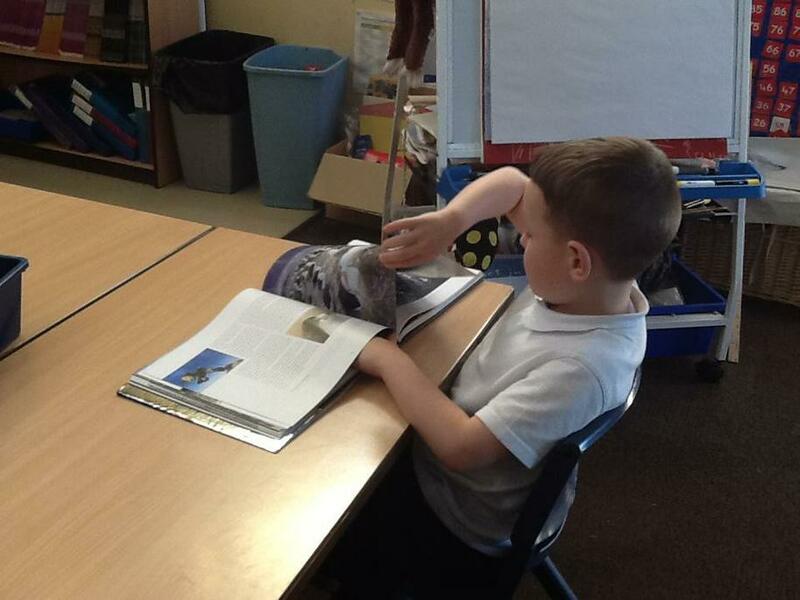 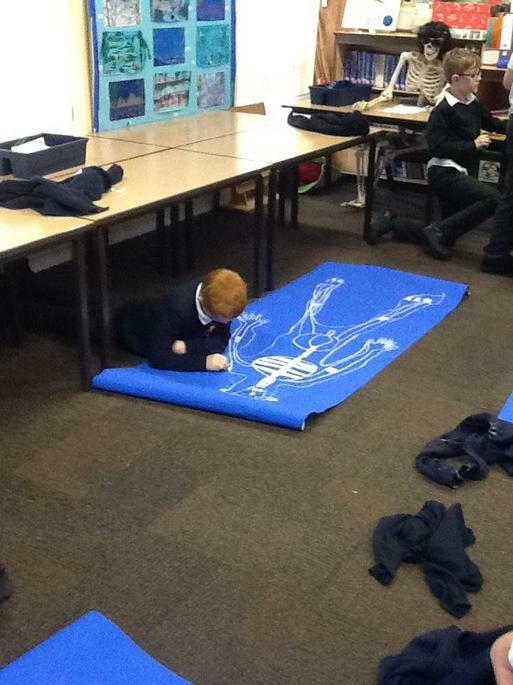 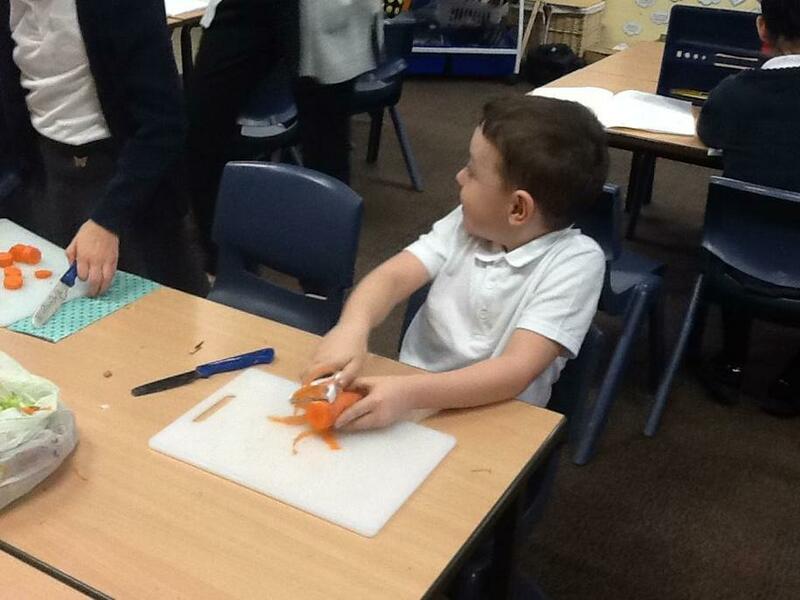 This term, our class are learning about the features of instructions. 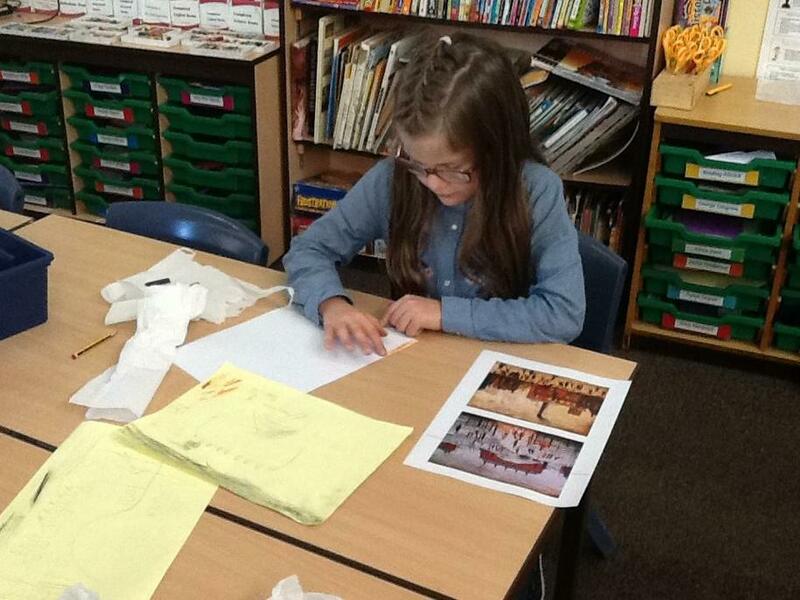 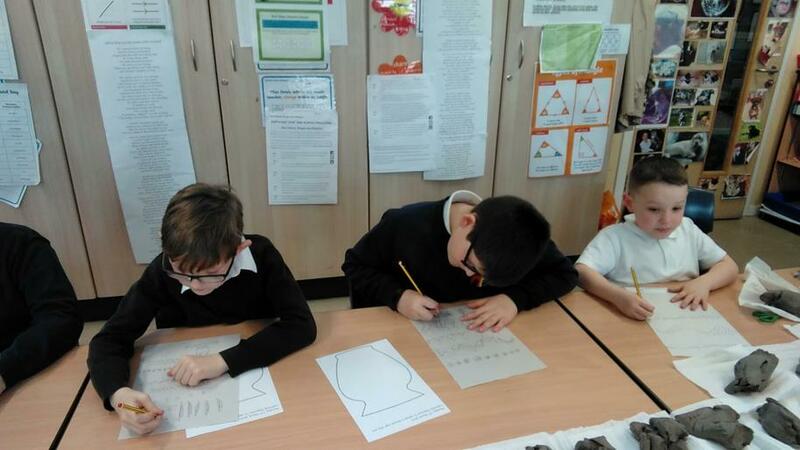 We have used the features to write instructions for magic potions. 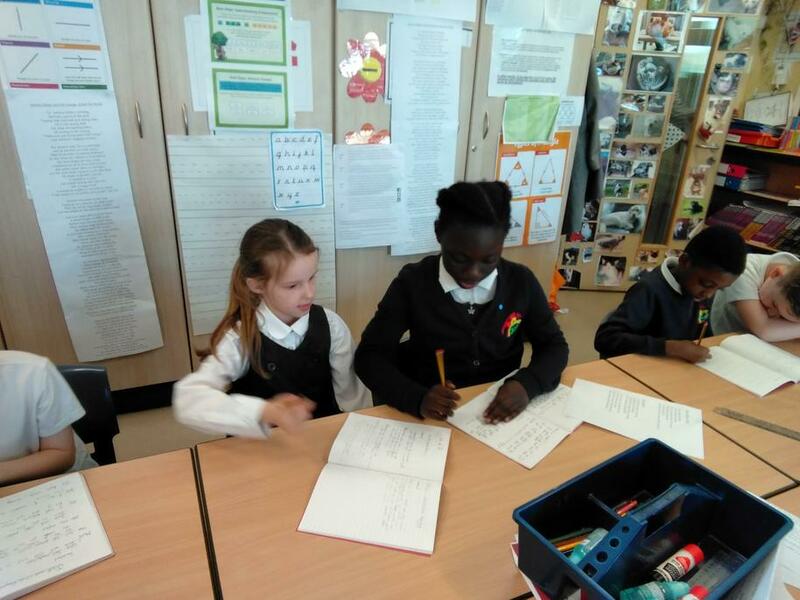 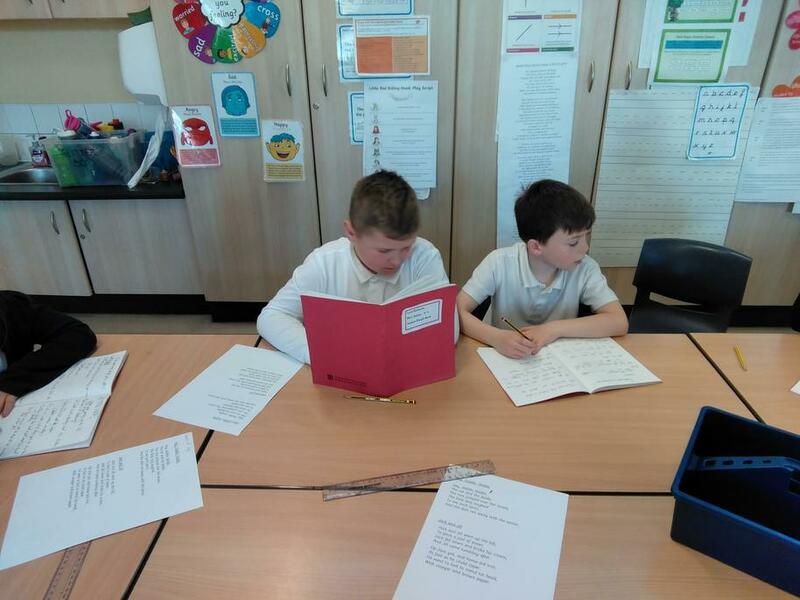 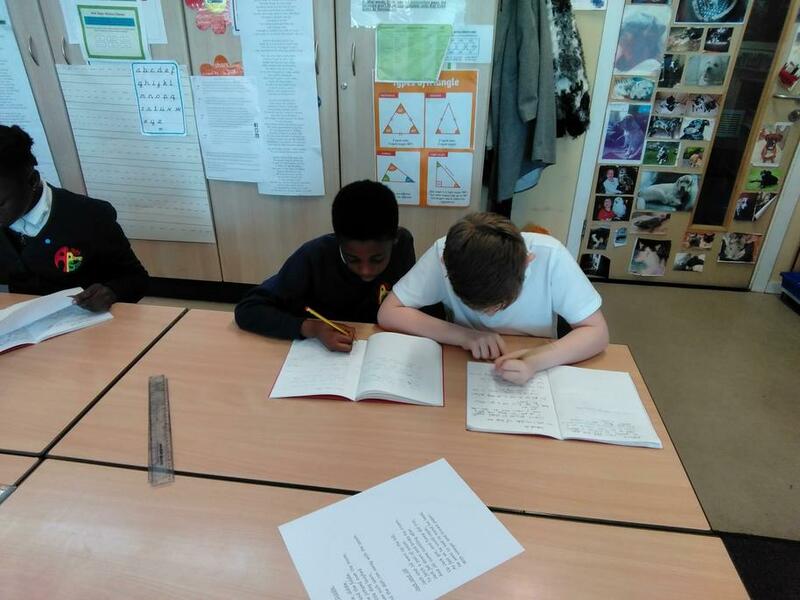 This week, as part of our curriculum links with Science and Design and Technology, our class have composed poems about vegetables. 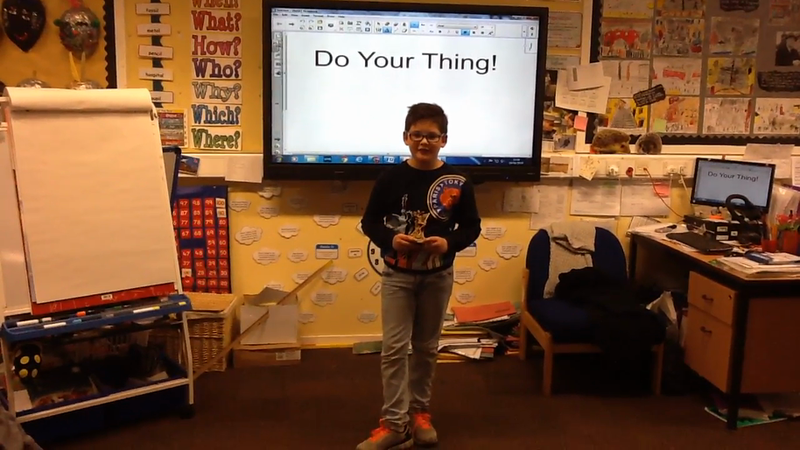 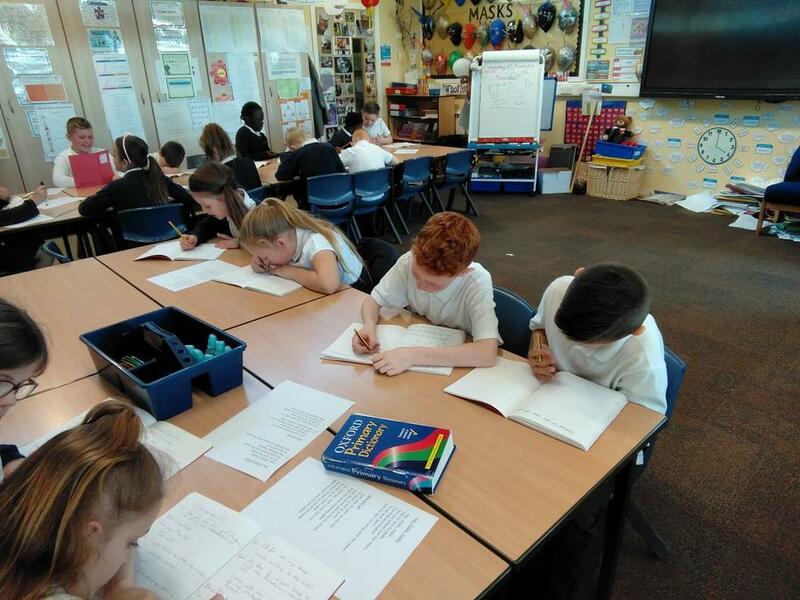 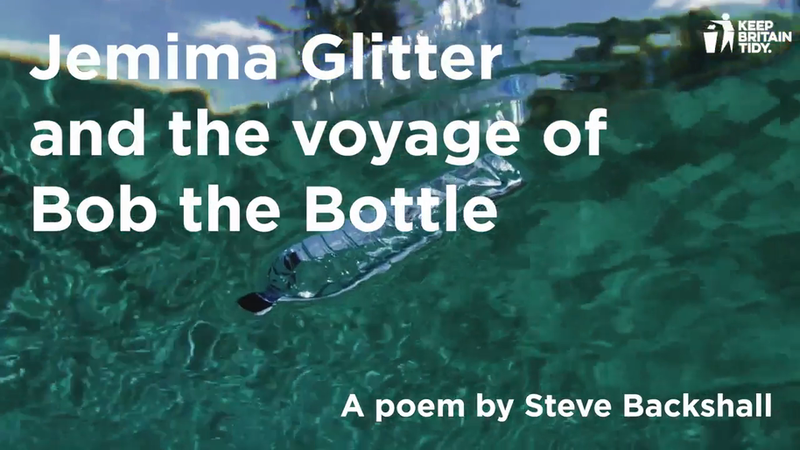 This week, we have listened to the poem: Jemima Glitter and the Voyage of Bob the Bottle by Steve Backshall as the inspiration to write our own poems about the devastating effects plastic pollution is having on our environment. 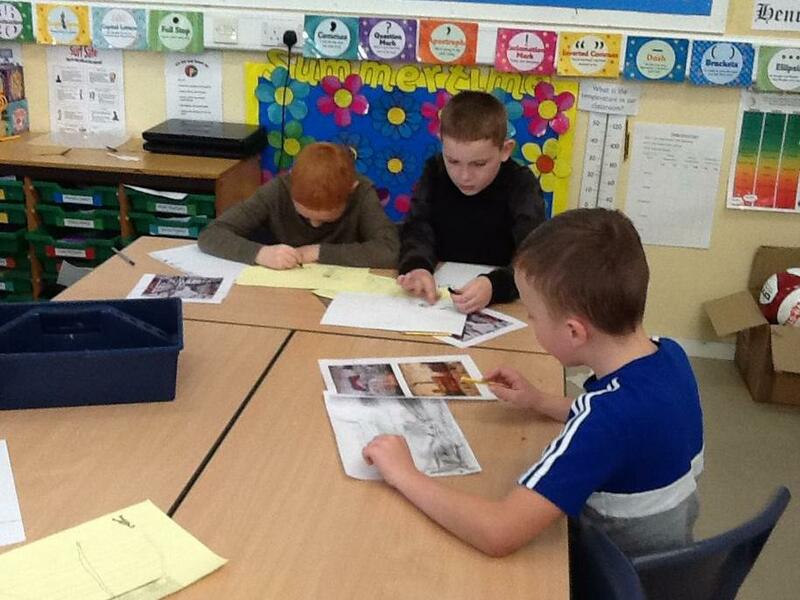 This term, our class are learning about the features of explanation texts. 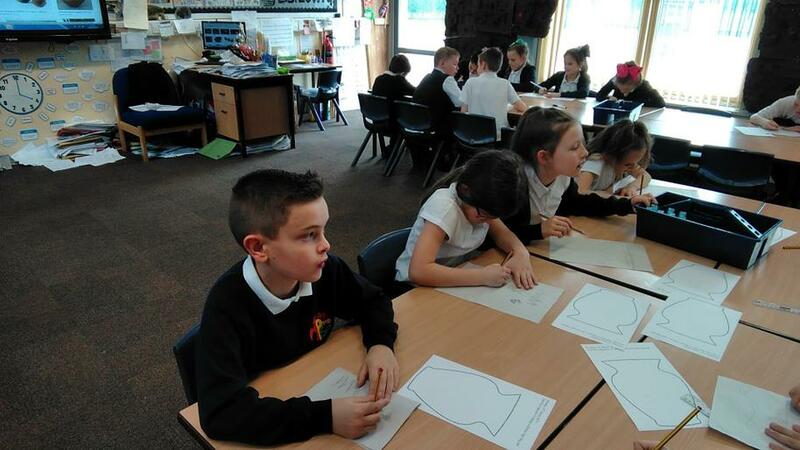 Today, in groups, we brainstormed ideas for 'How a Washing Machine Works. 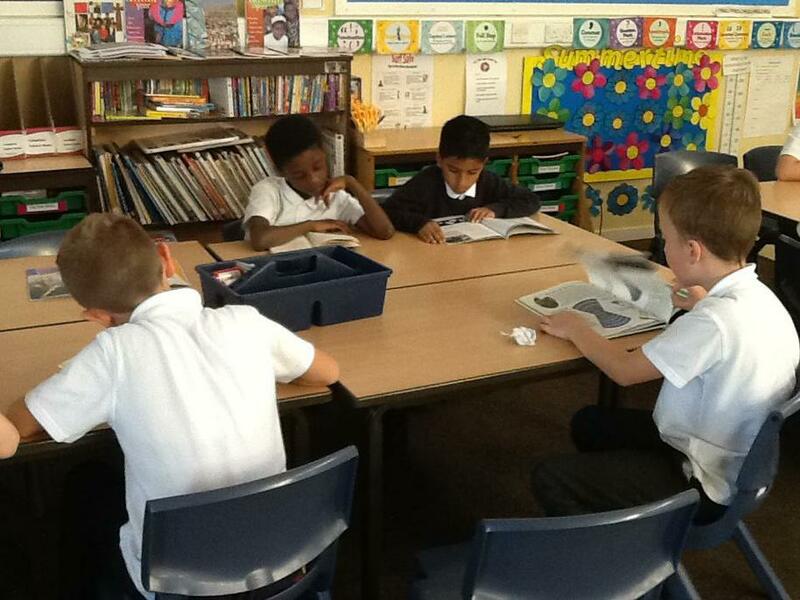 Play scripts is the genre we are learning about this term. 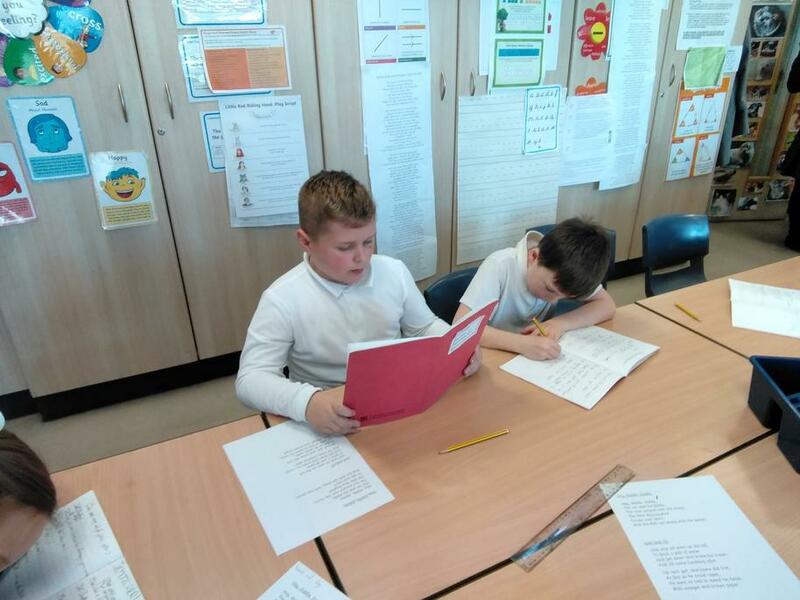 We have learned and identified the features of a play script. 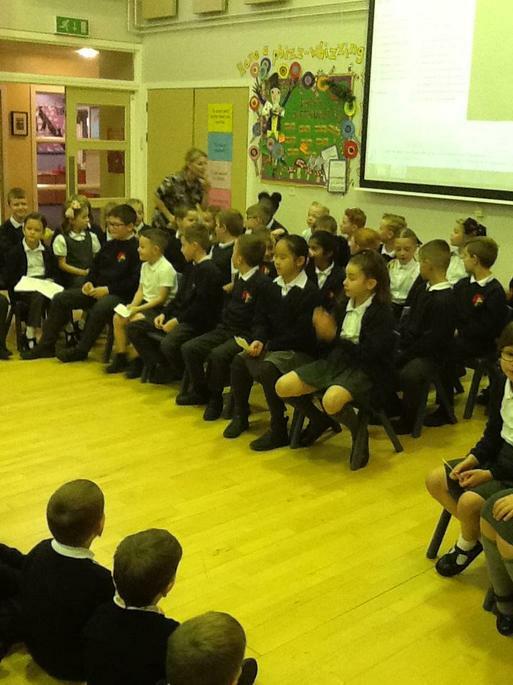 In small groups, we have also performed Little, Red, Riding Hood. 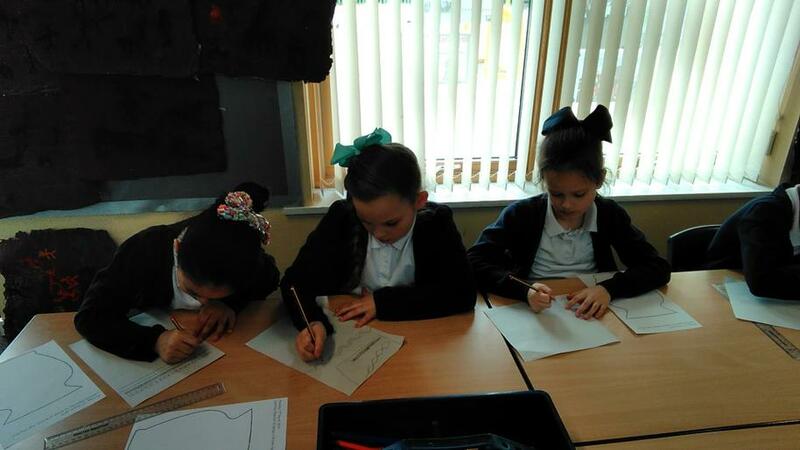 We are now writing our own play scripts using the nursery rhymes: Hey, Diddle, Diddle and Jack and Jill. 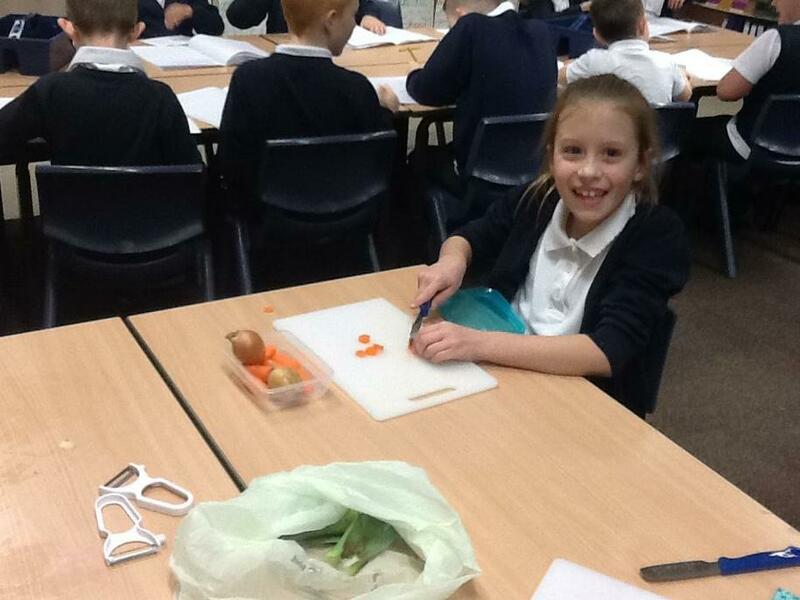 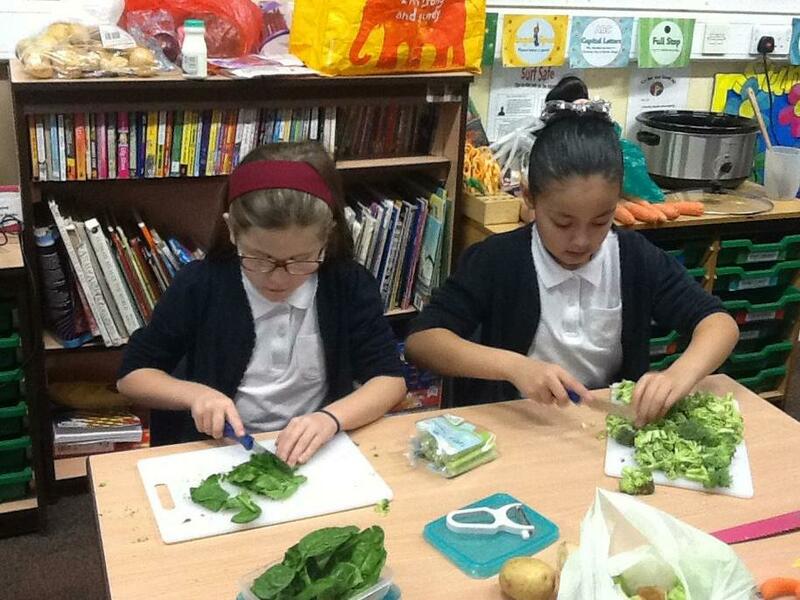 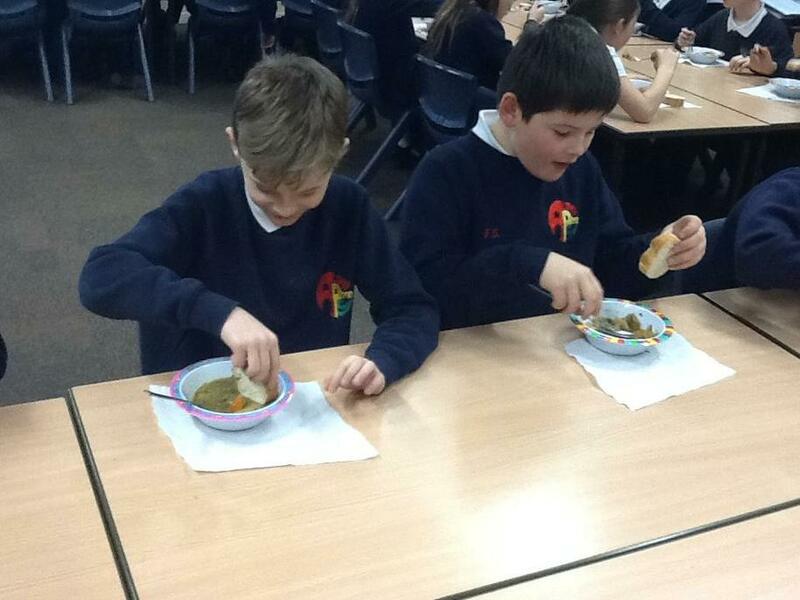 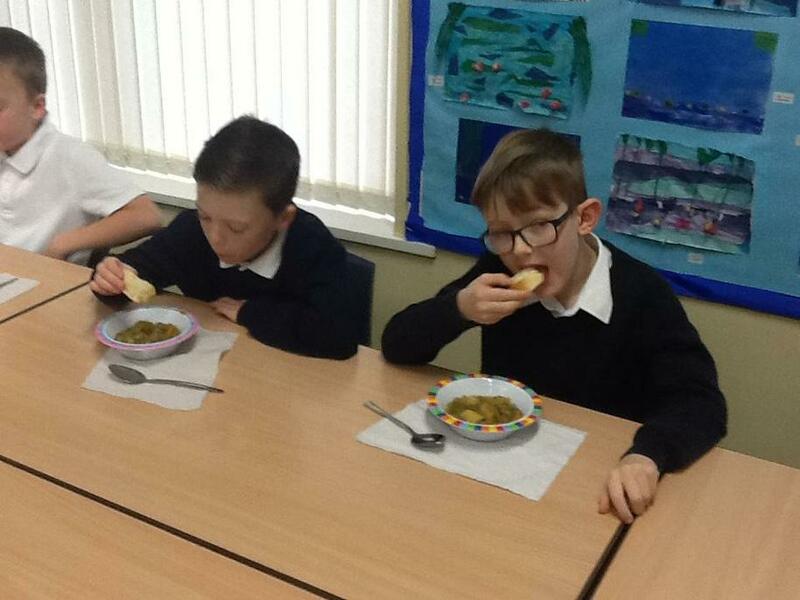 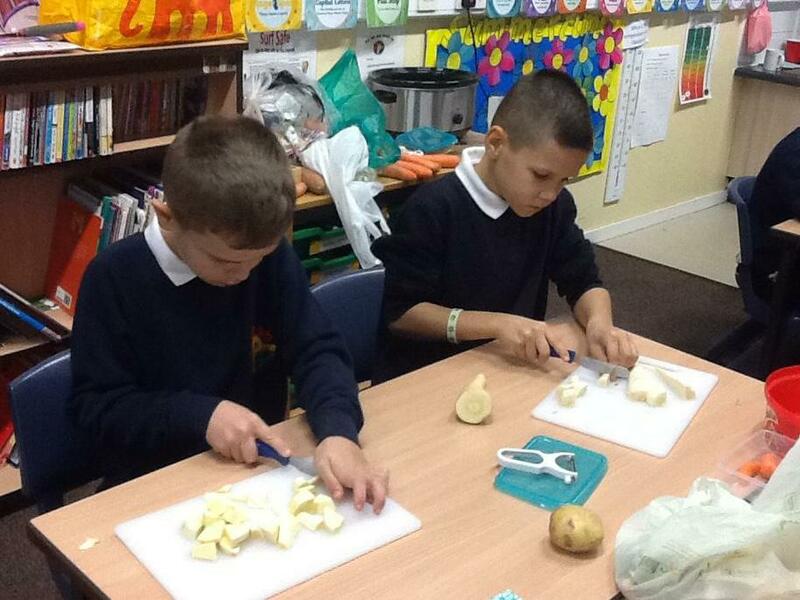 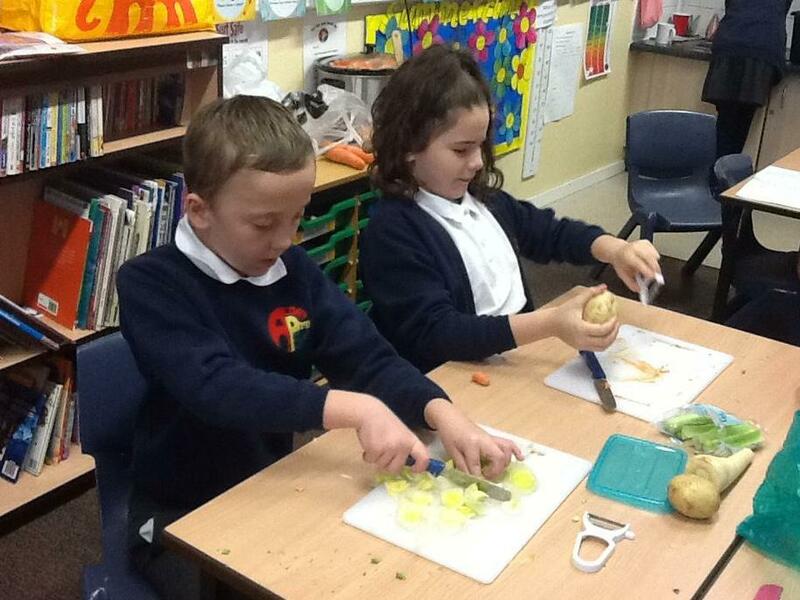 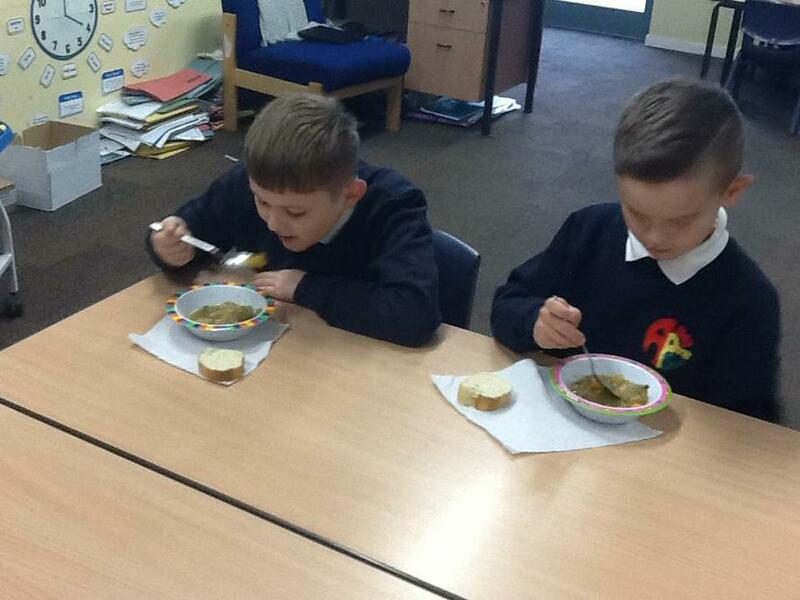 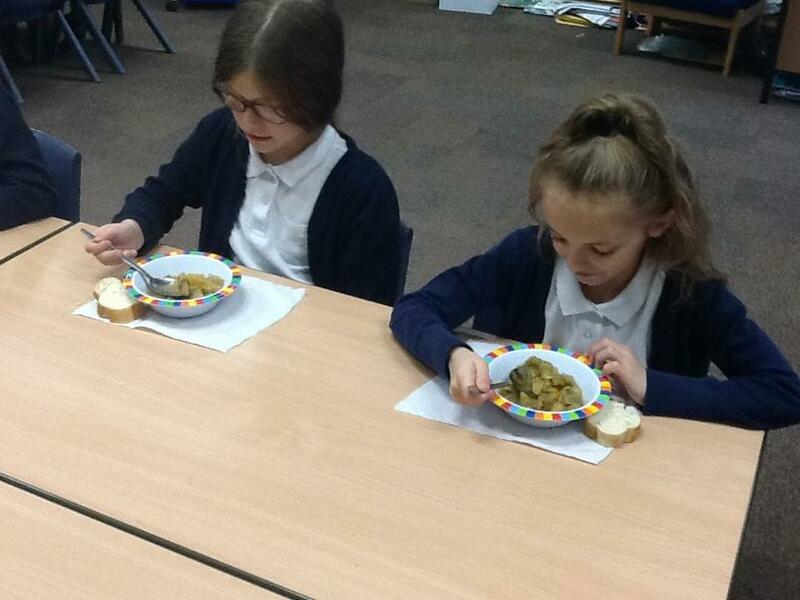 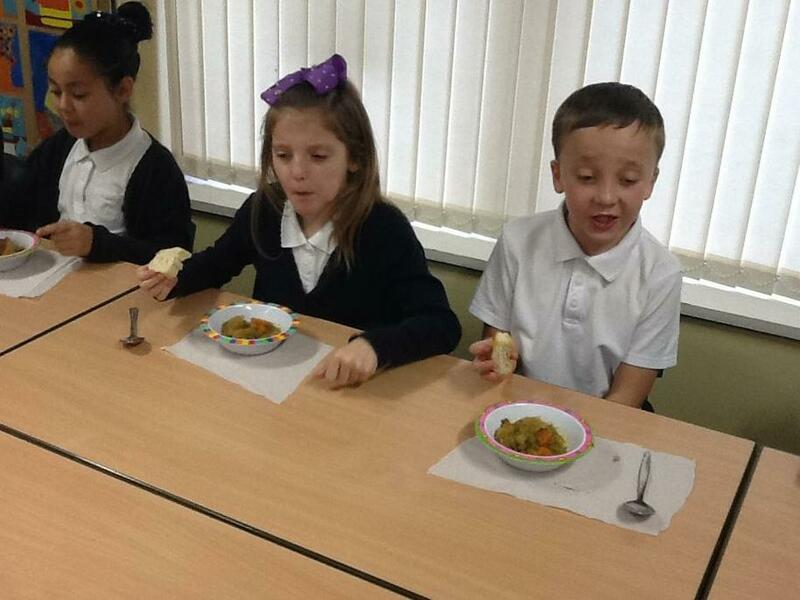 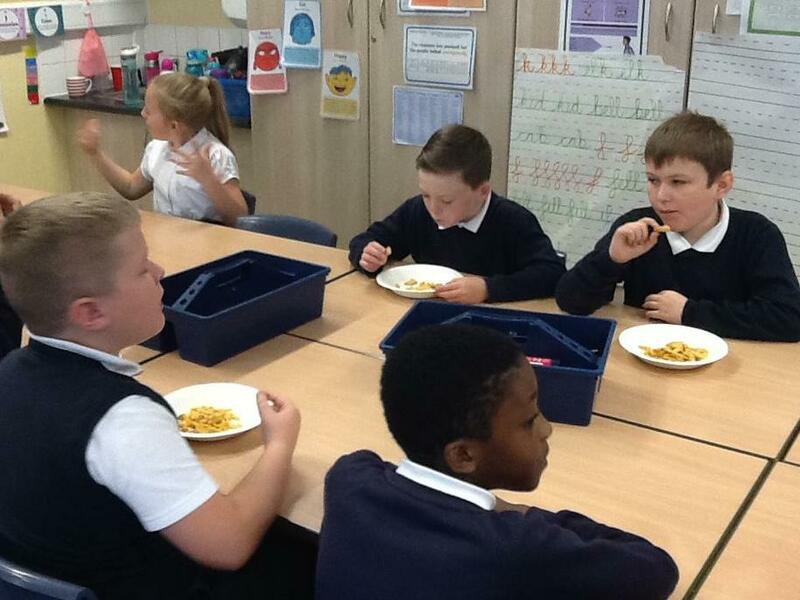 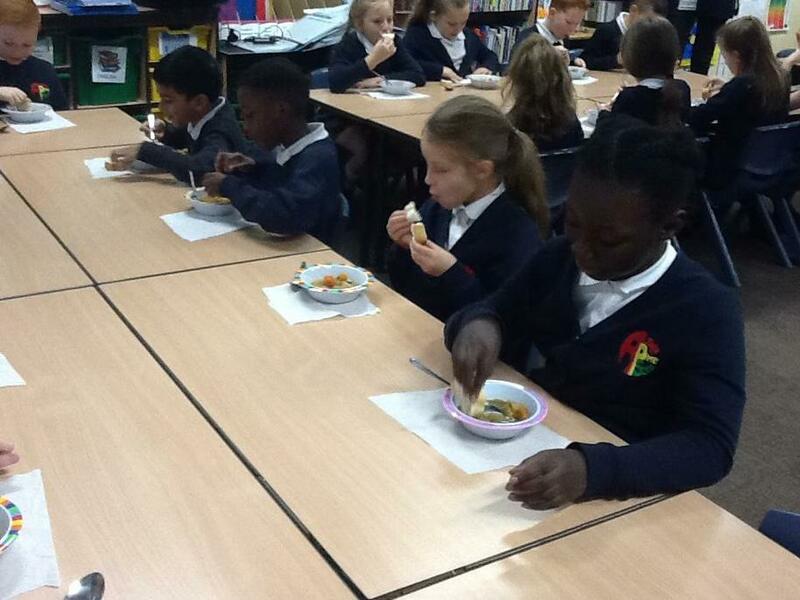 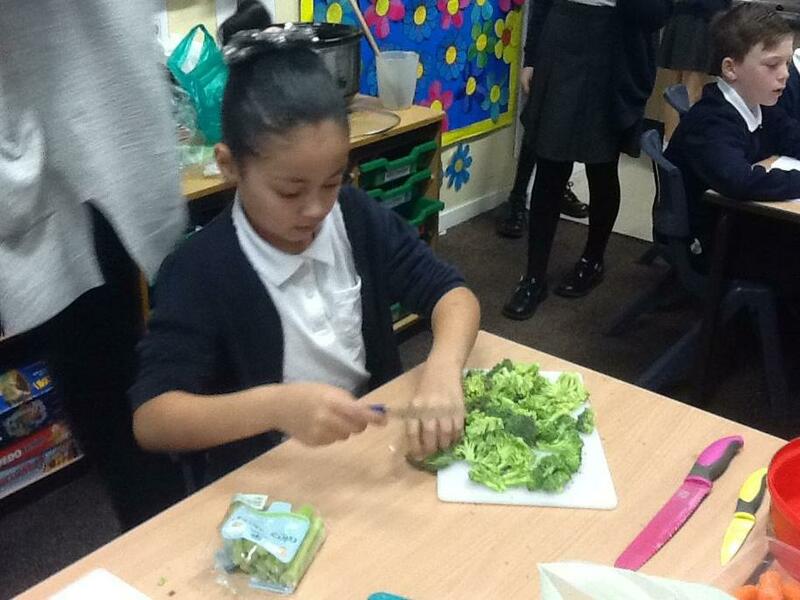 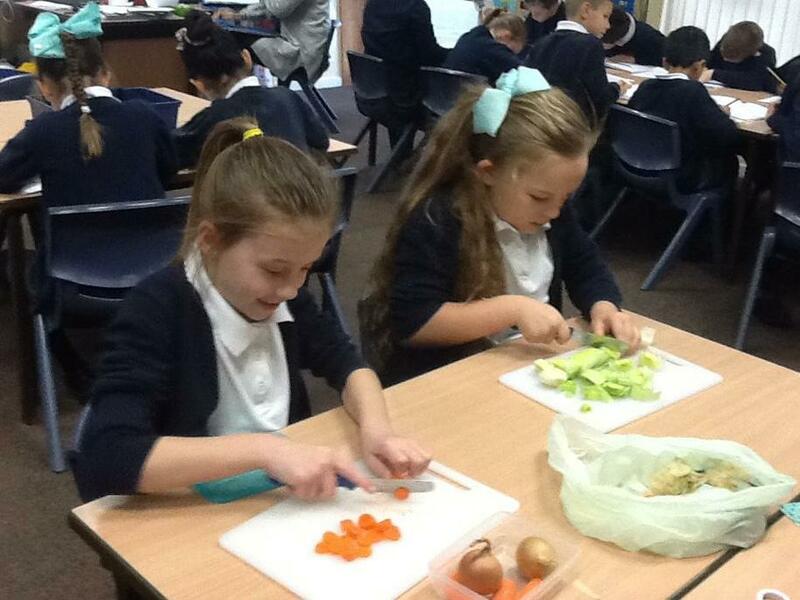 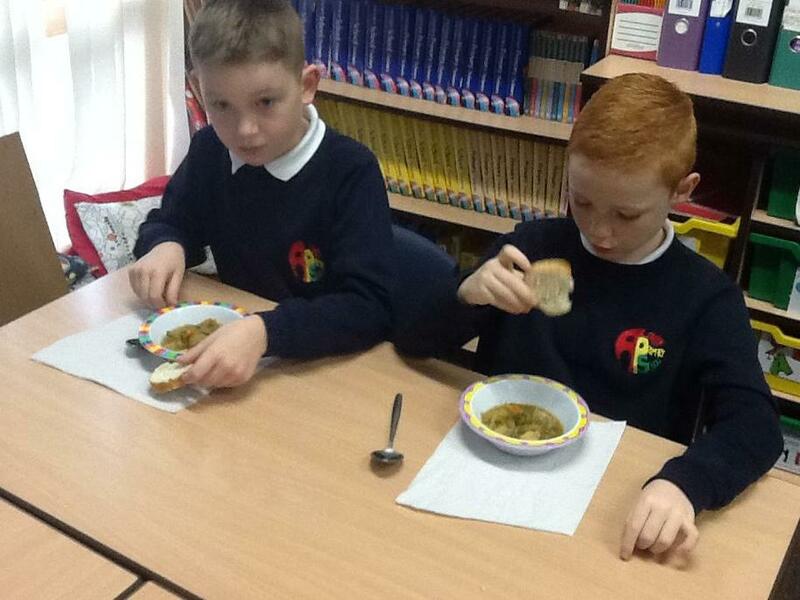 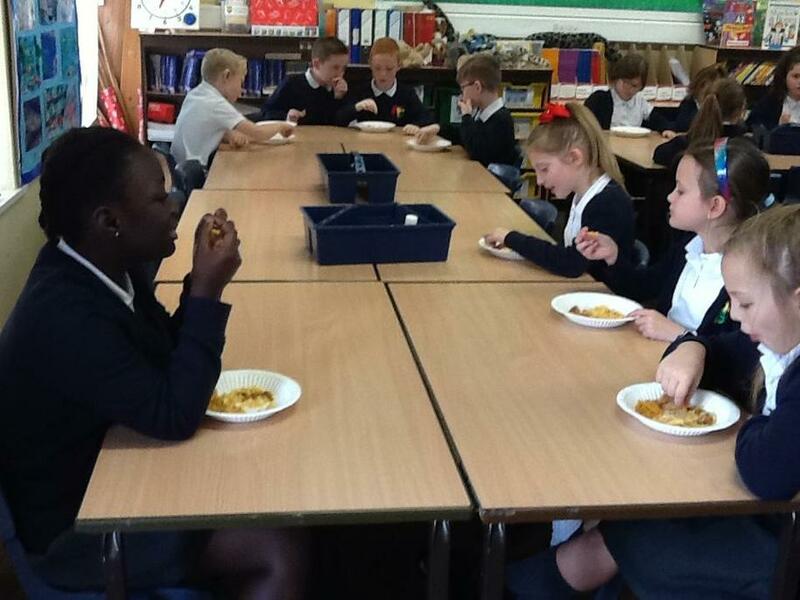 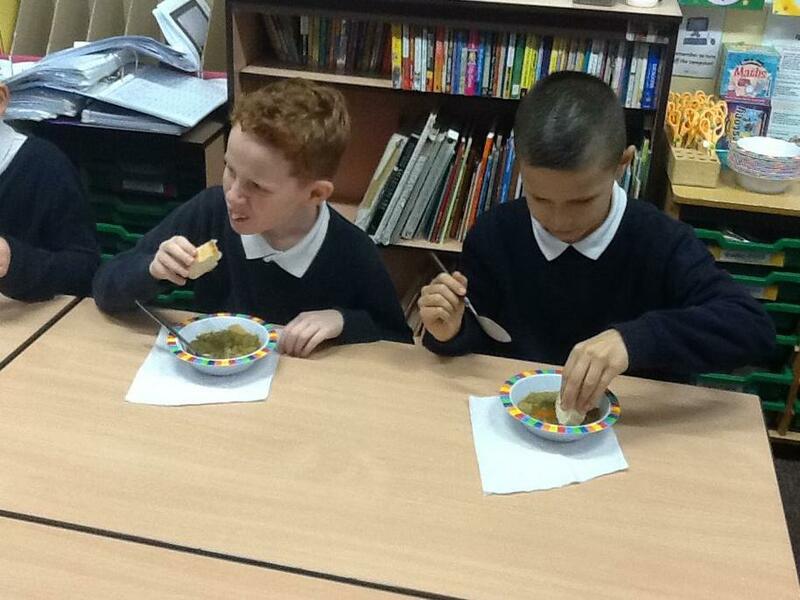 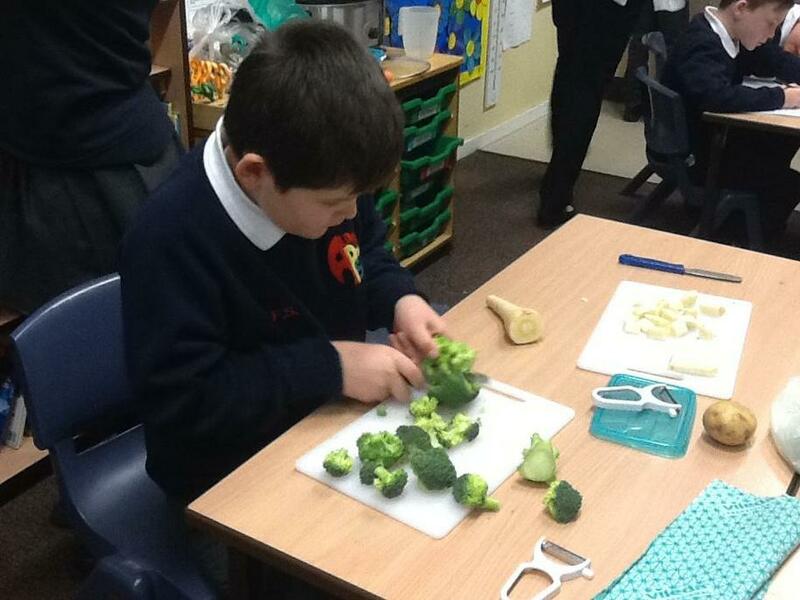 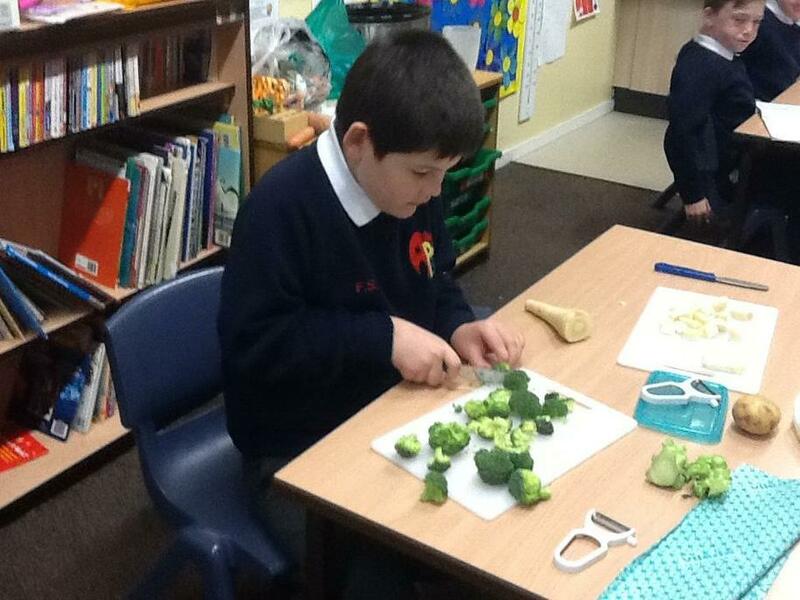 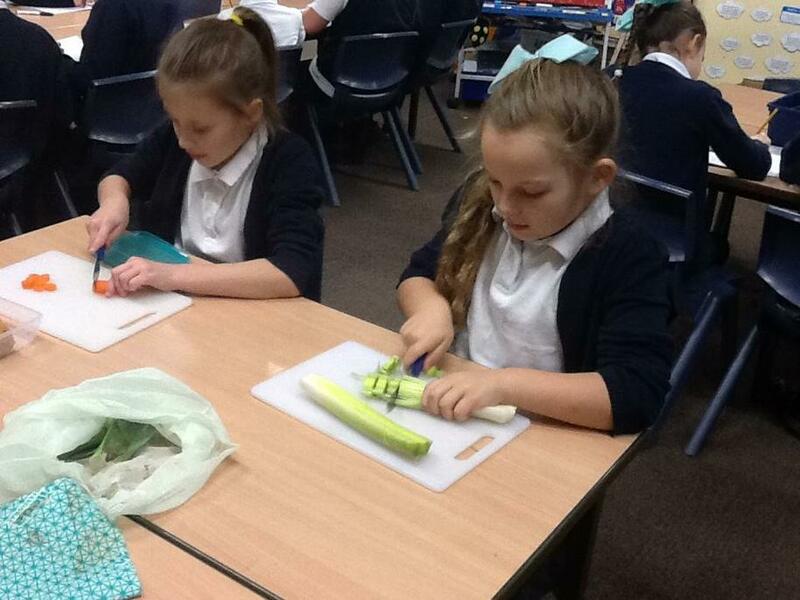 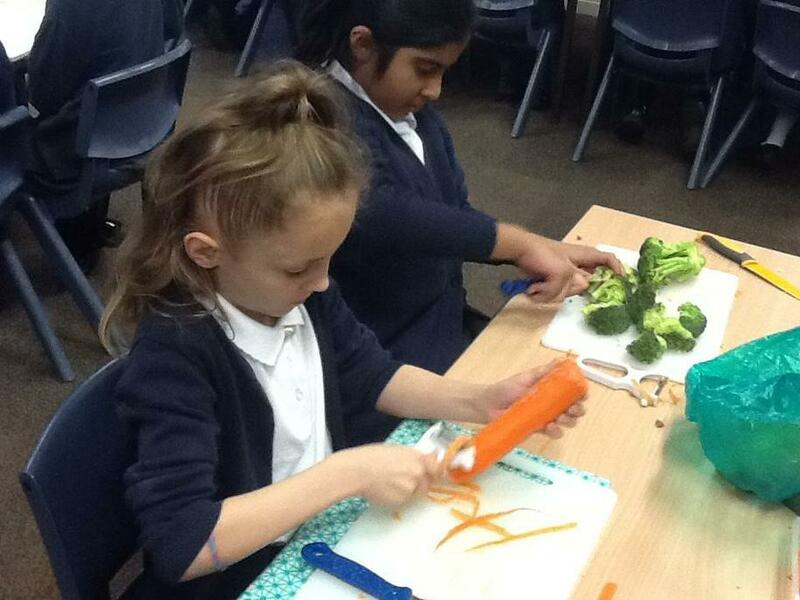 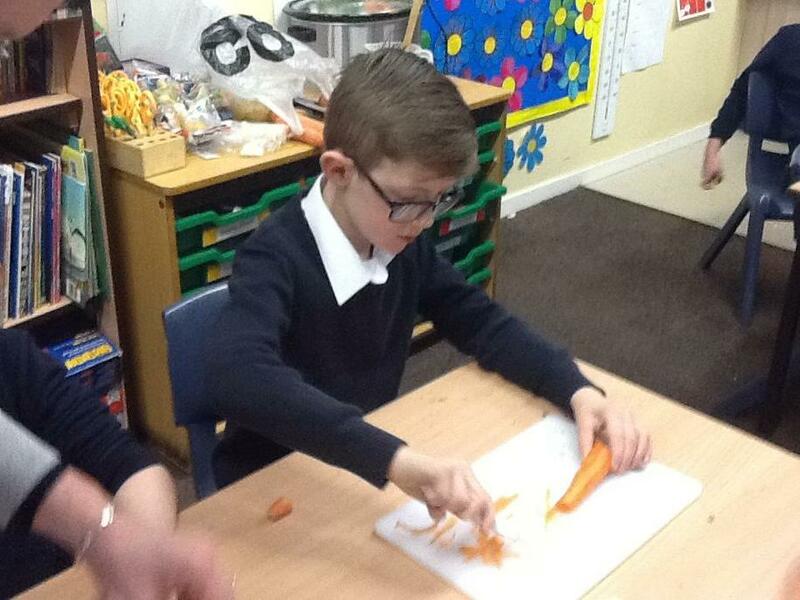 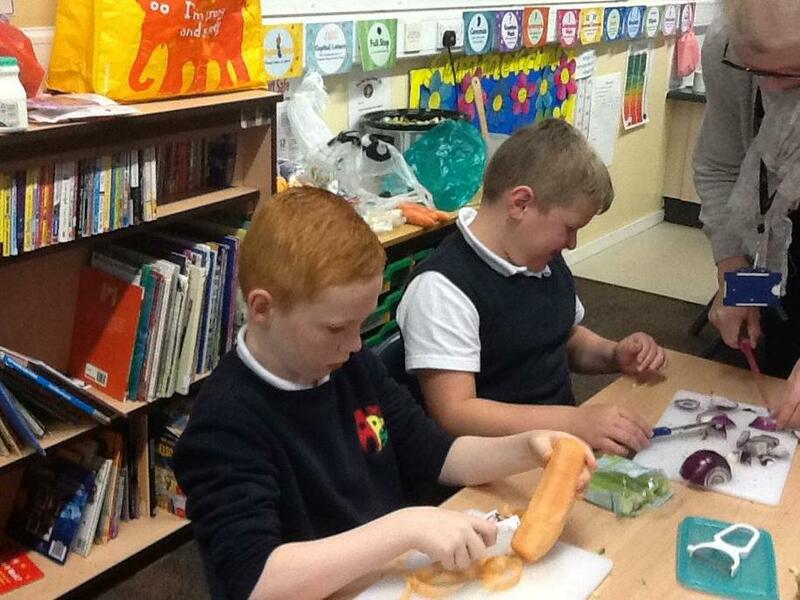 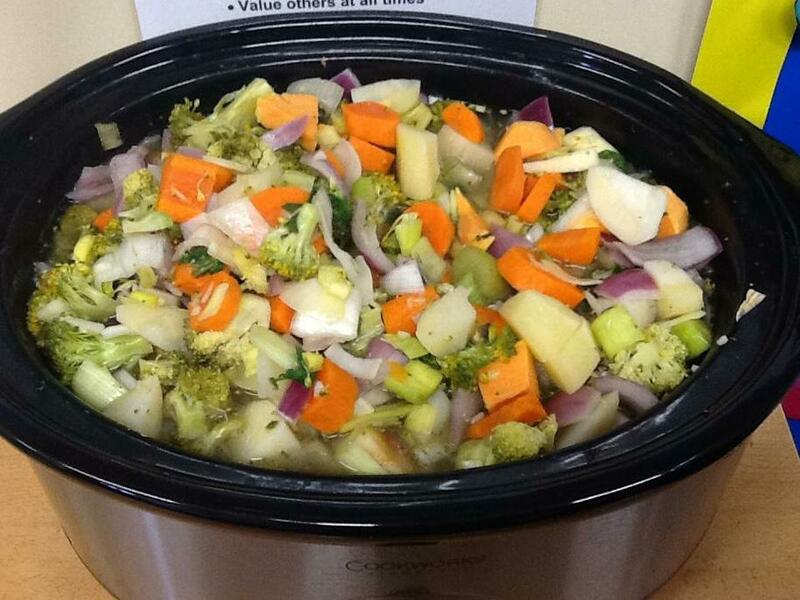 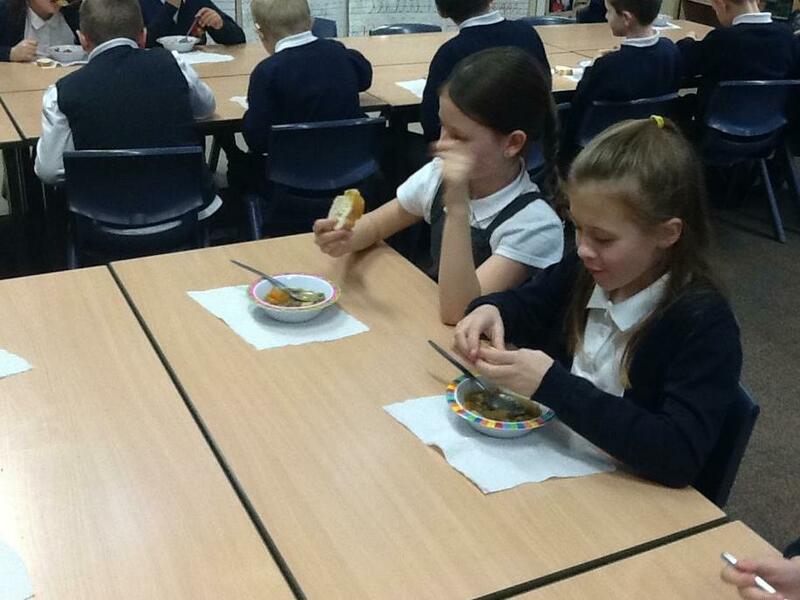 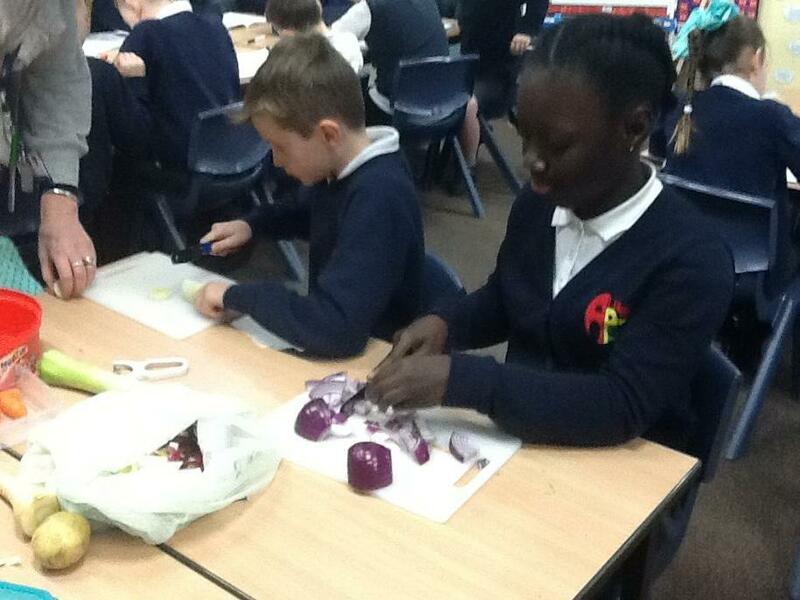 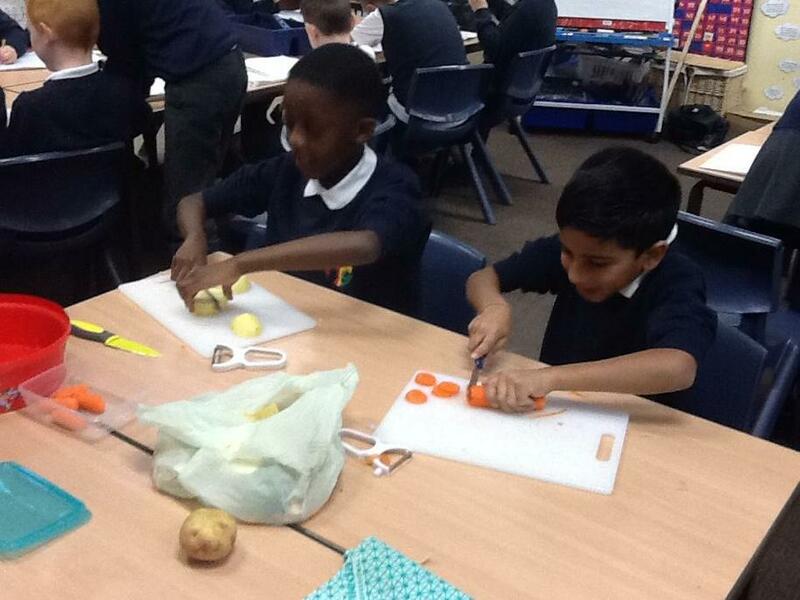 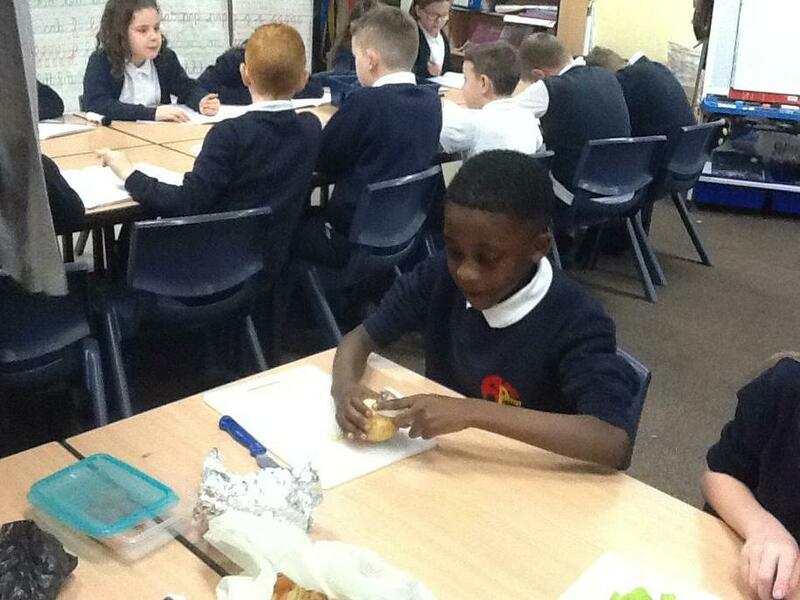 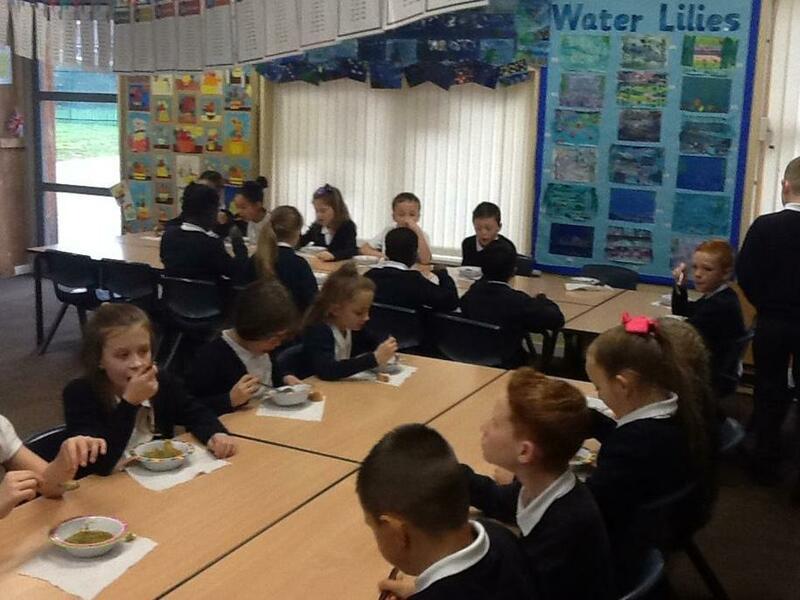 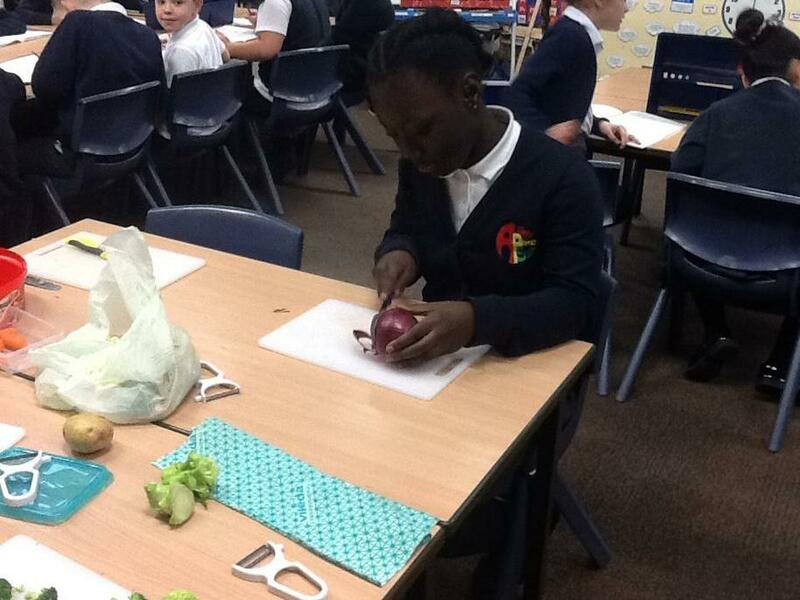 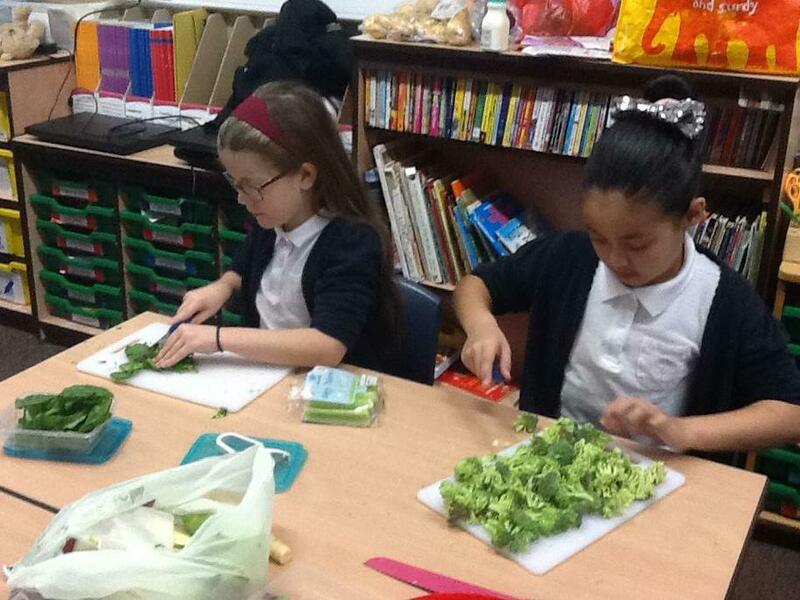 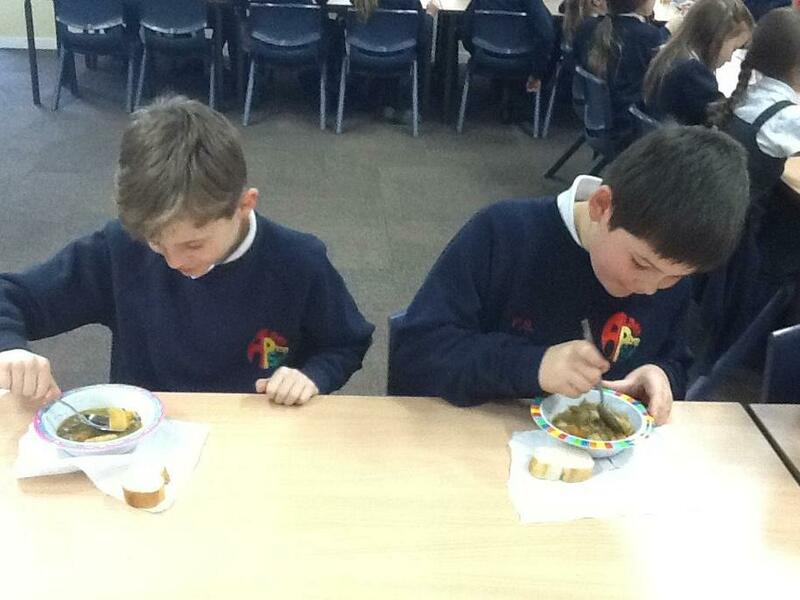 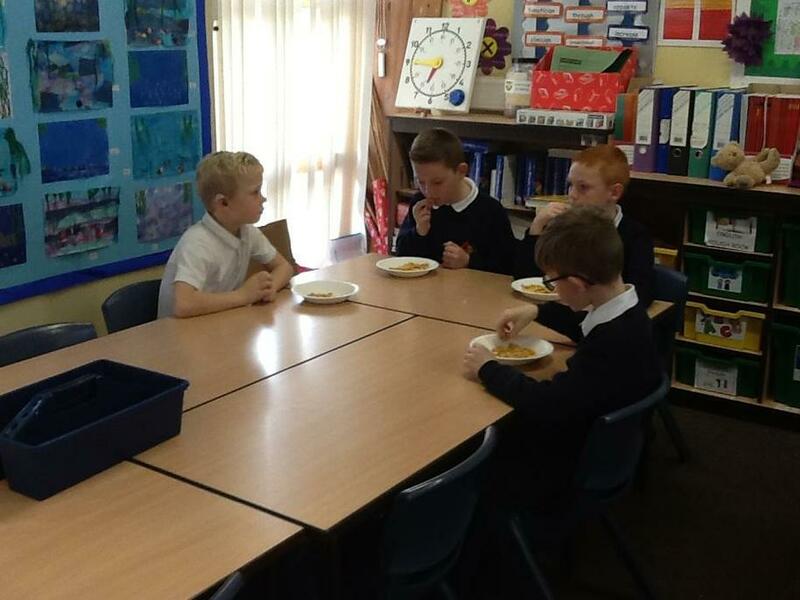 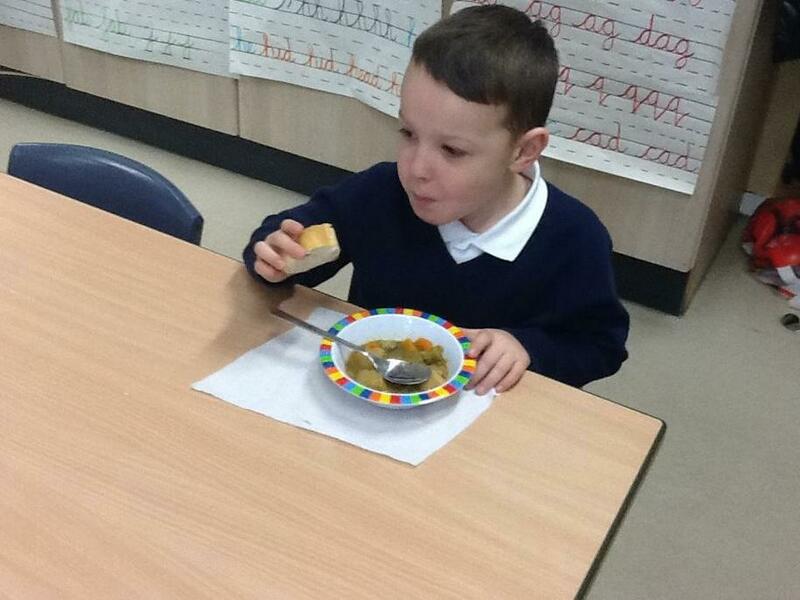 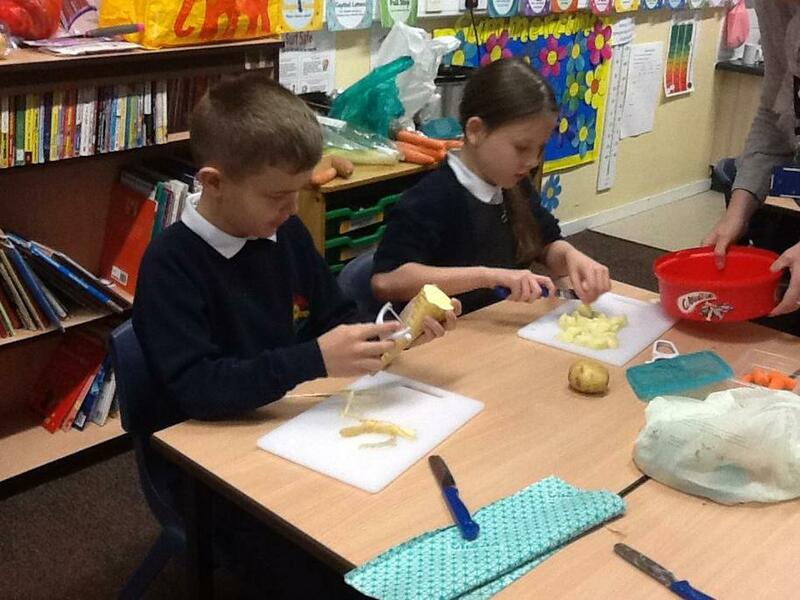 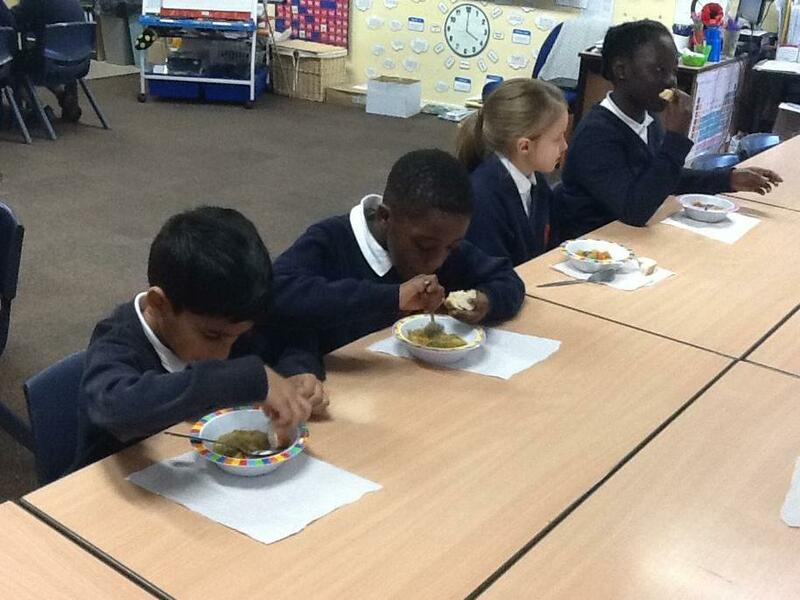 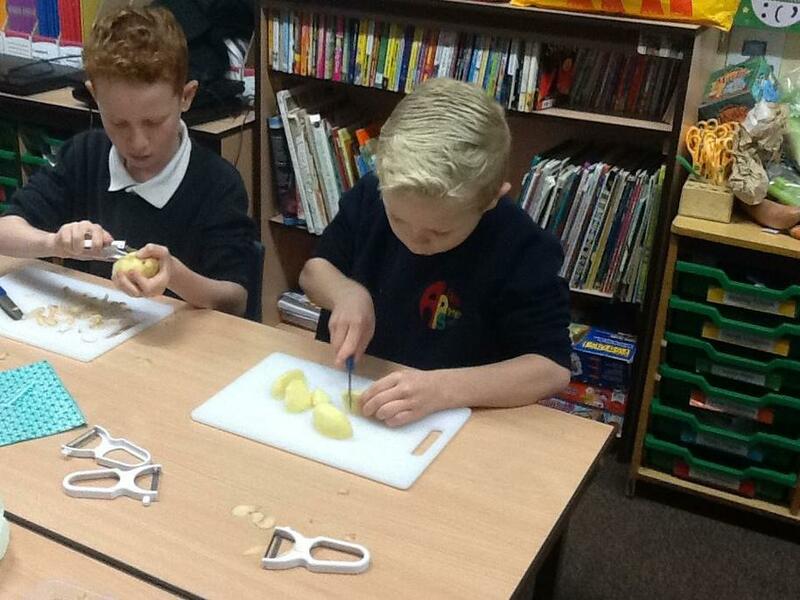 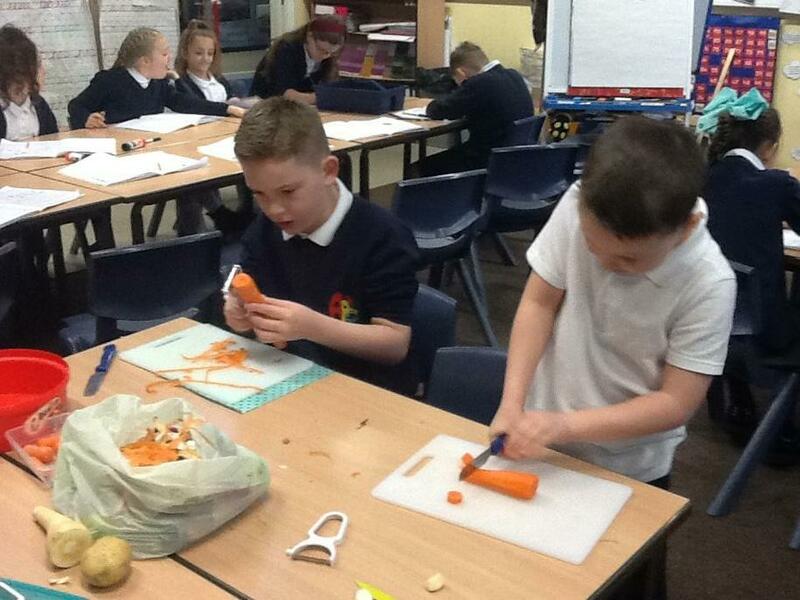 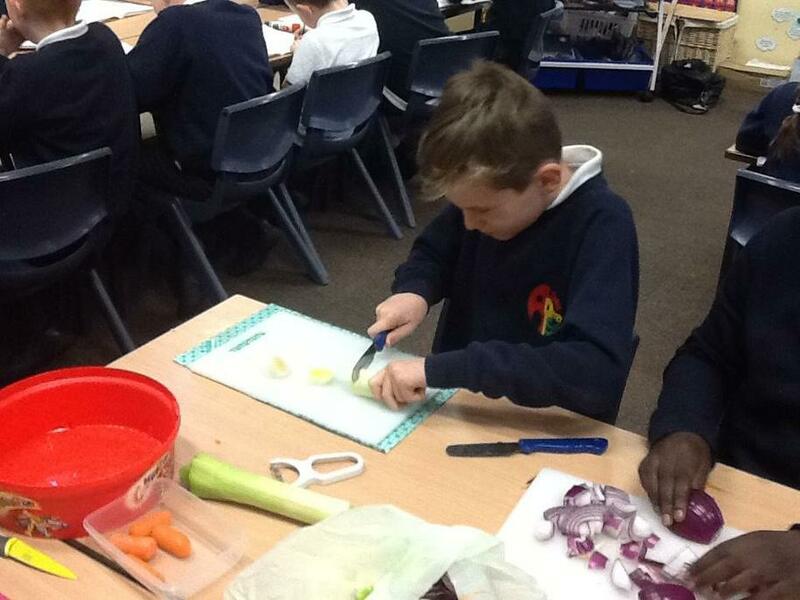 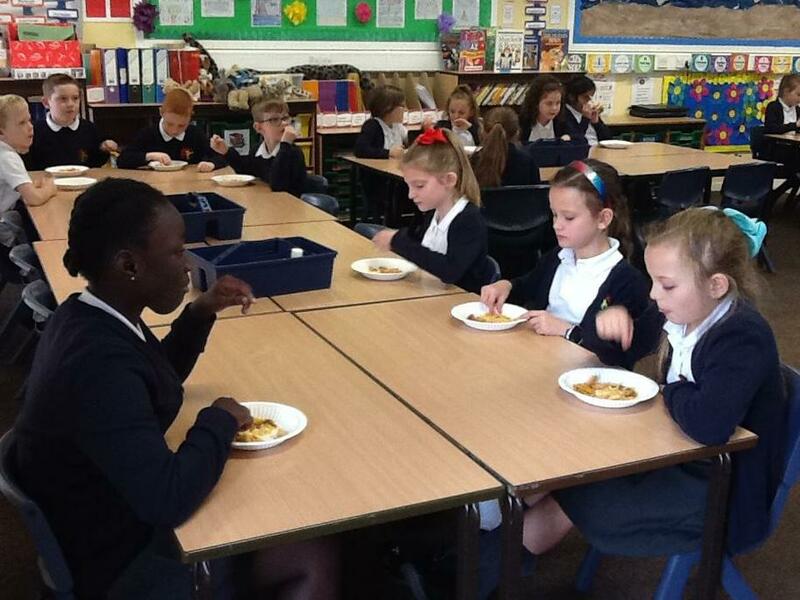 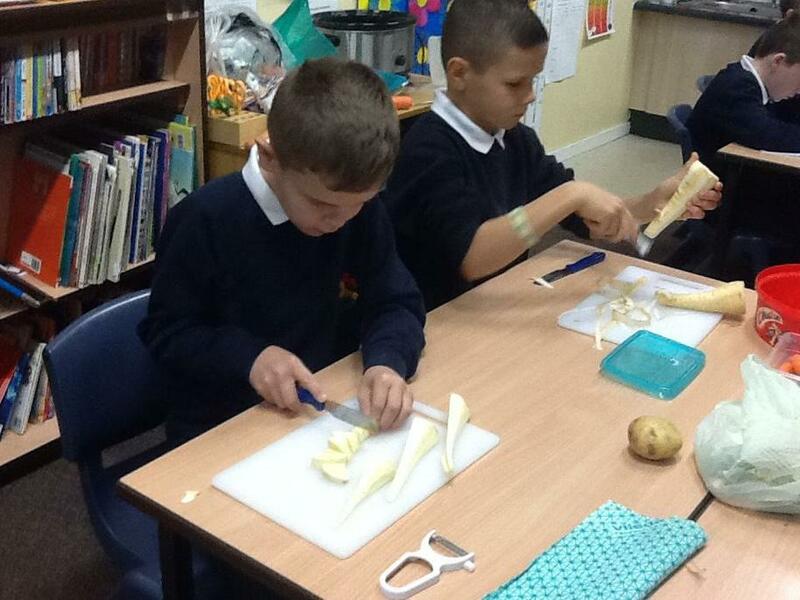 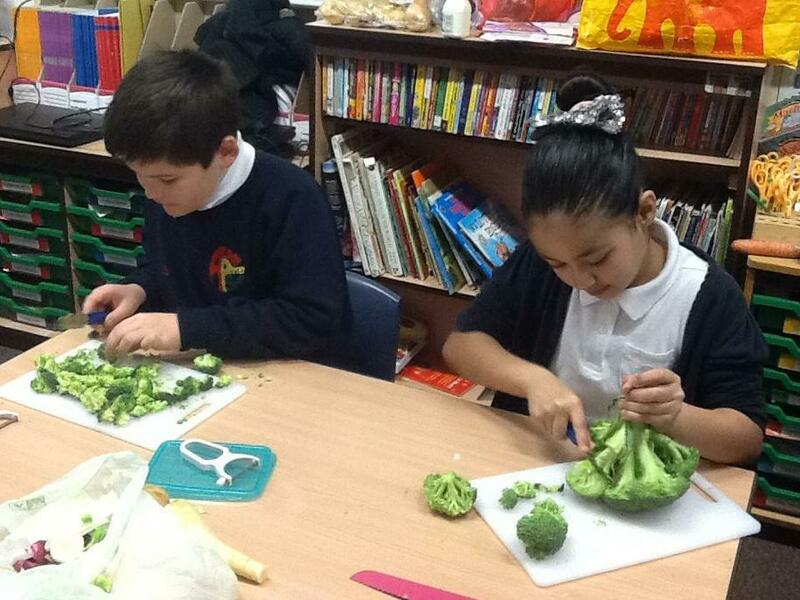 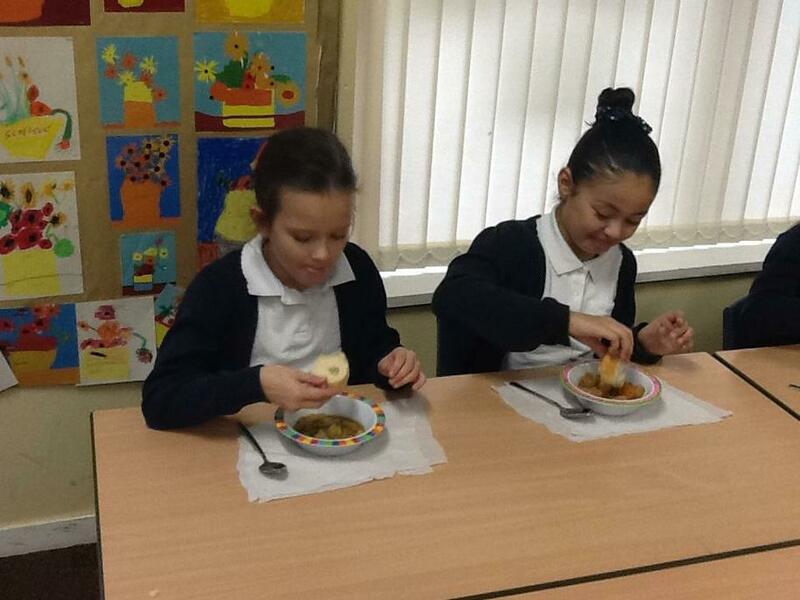 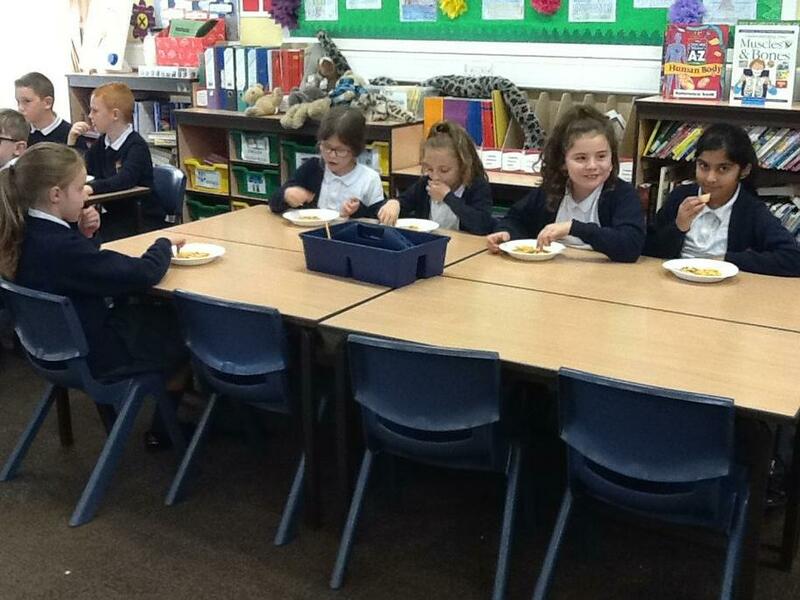 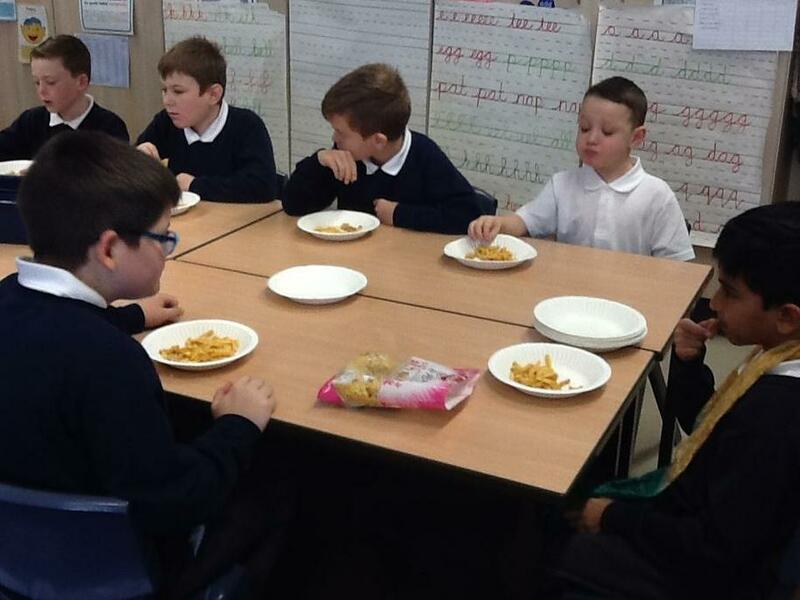 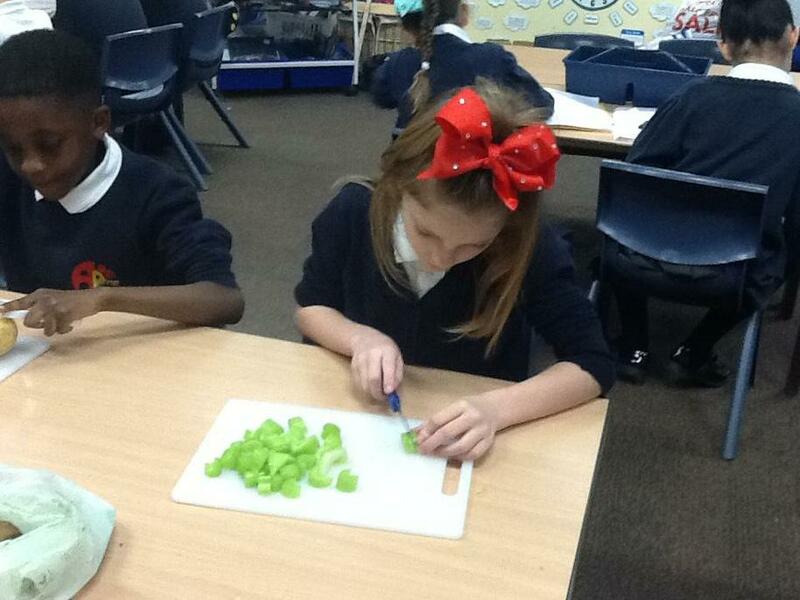 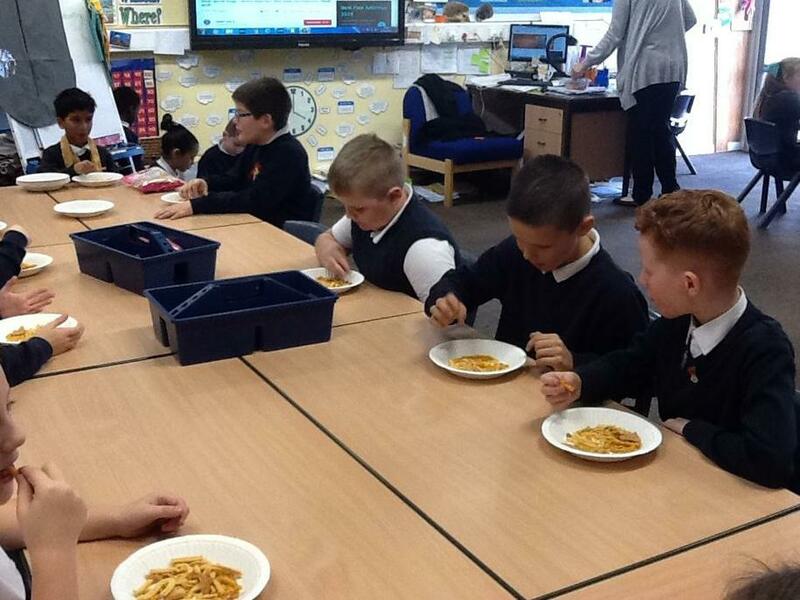 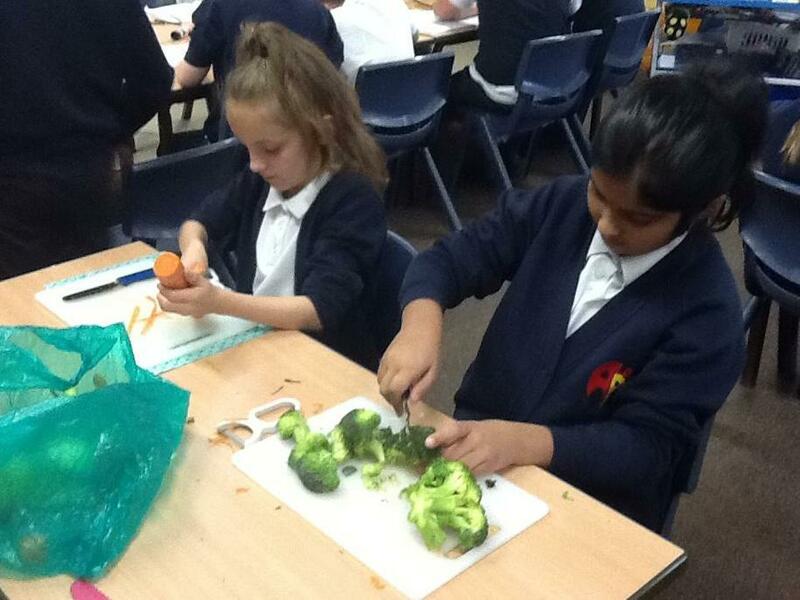 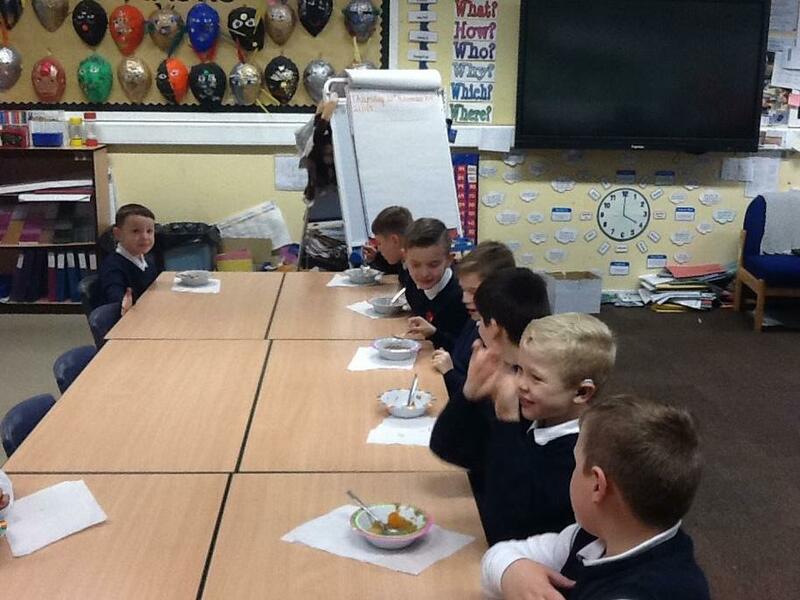 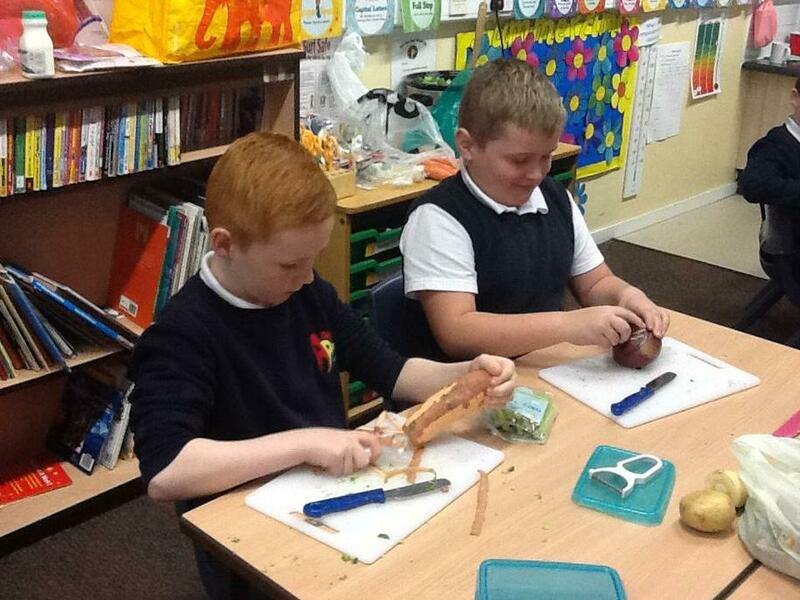 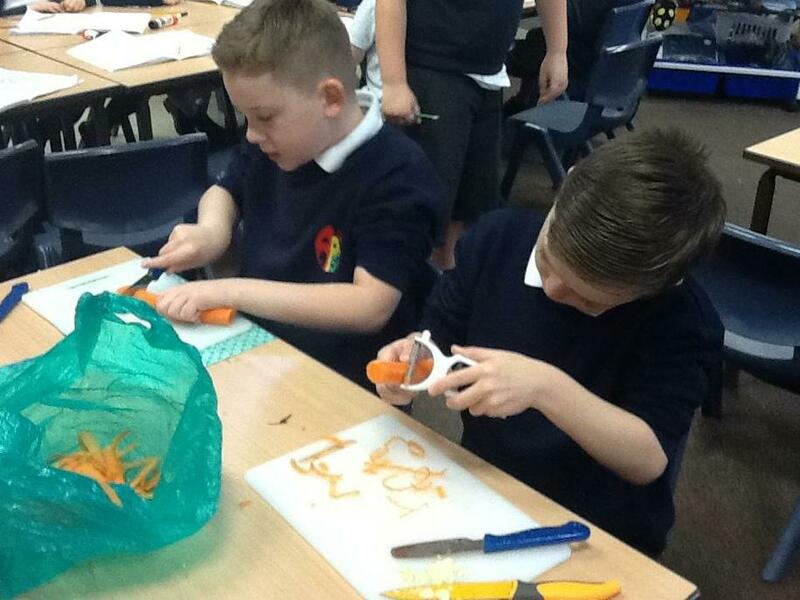 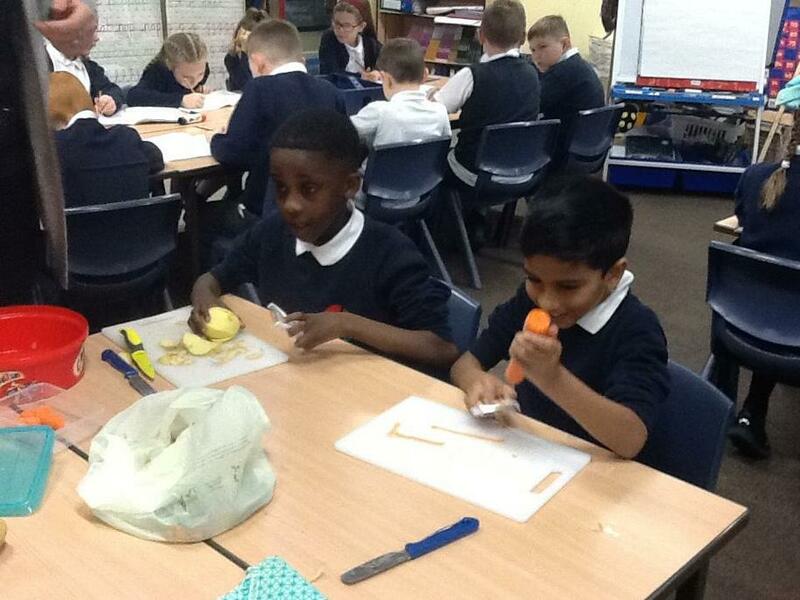 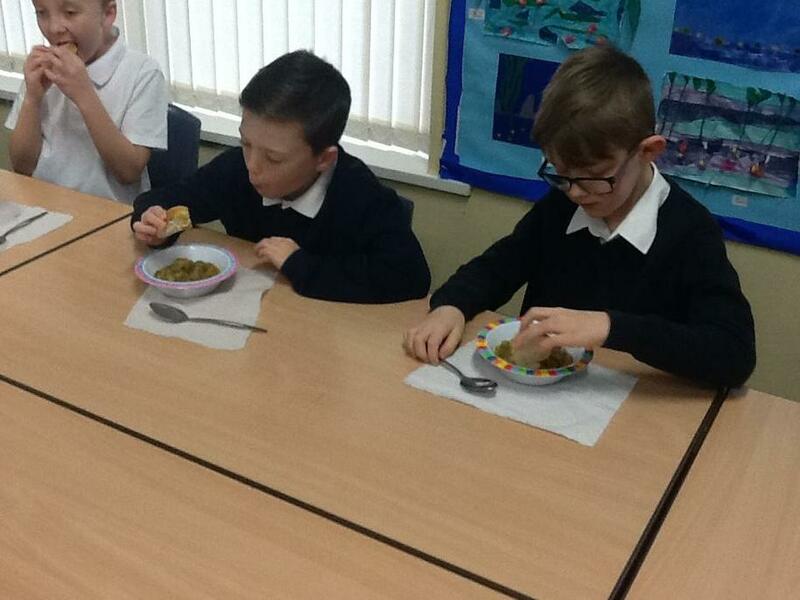 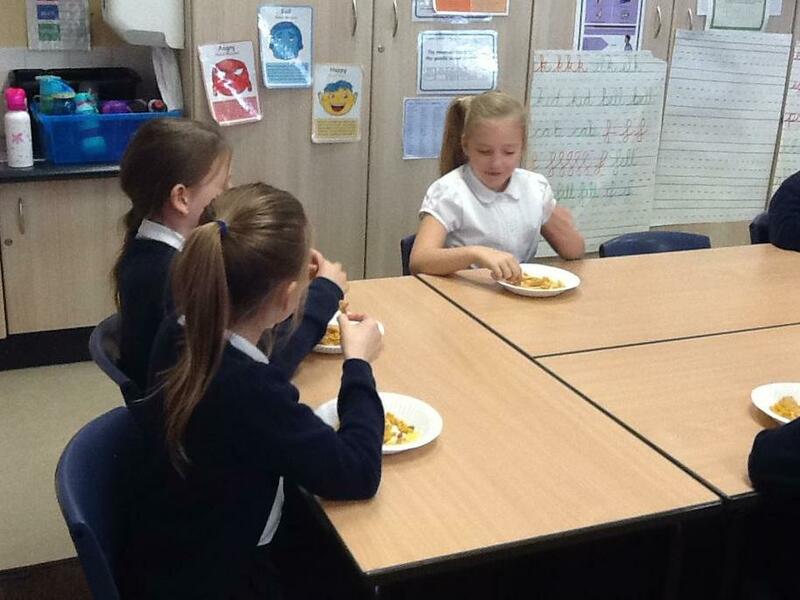 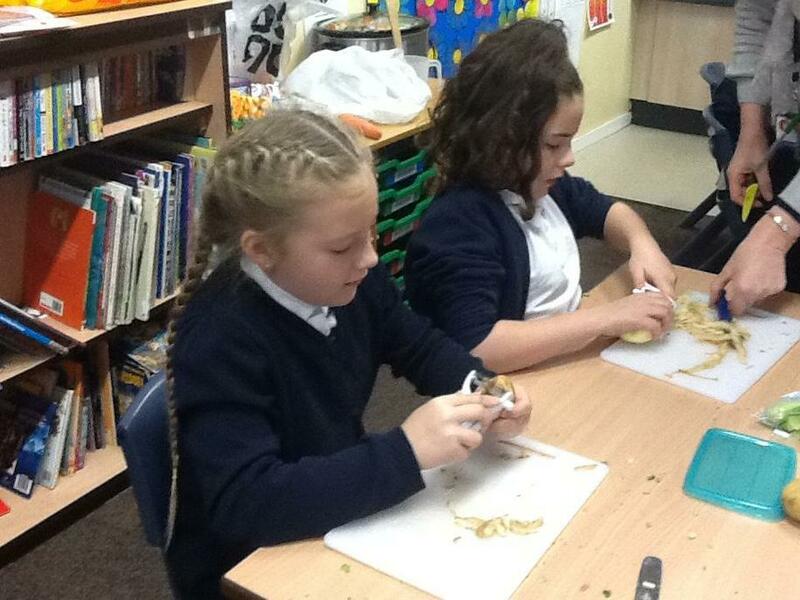 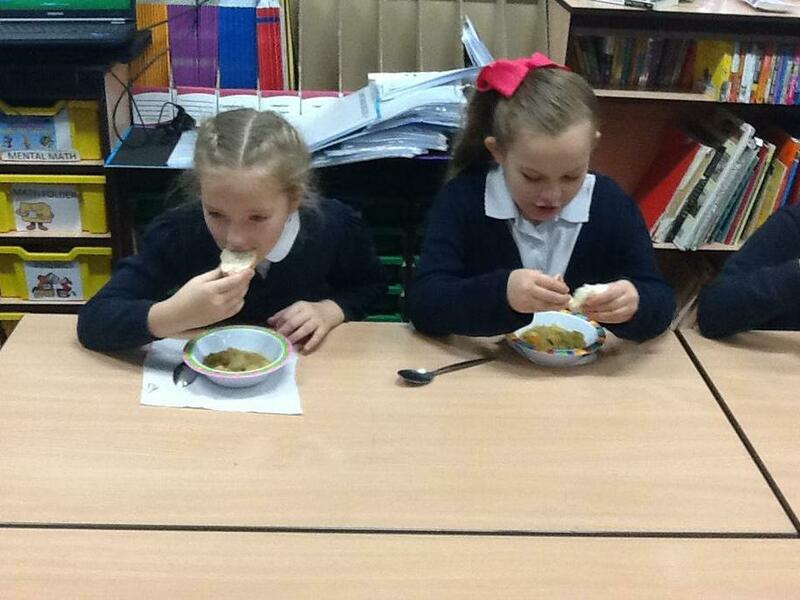 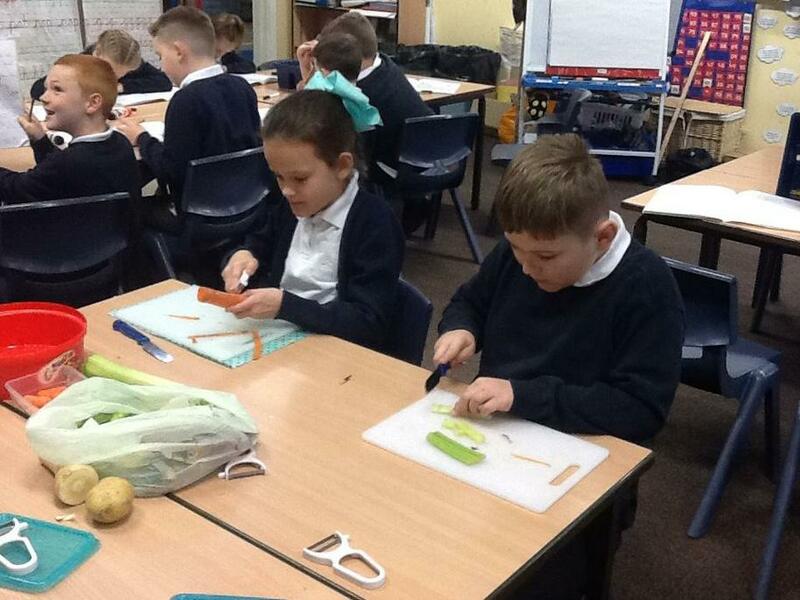 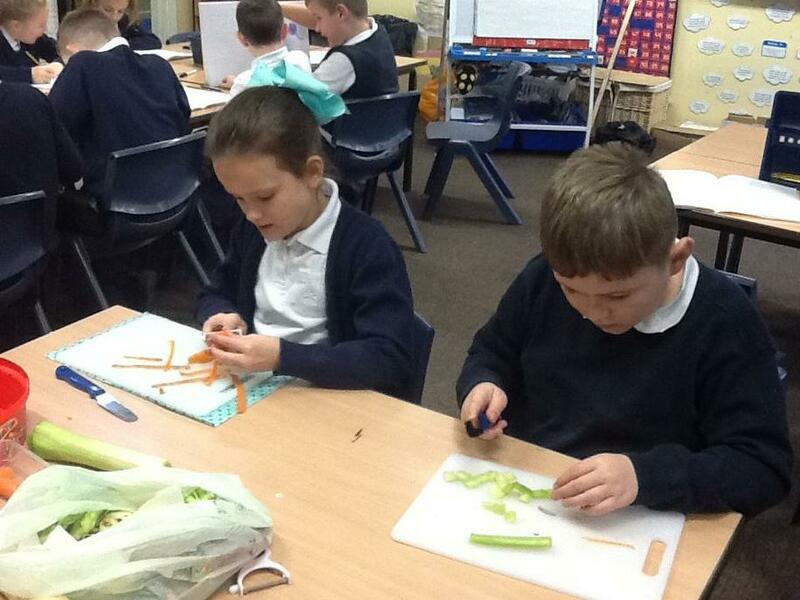 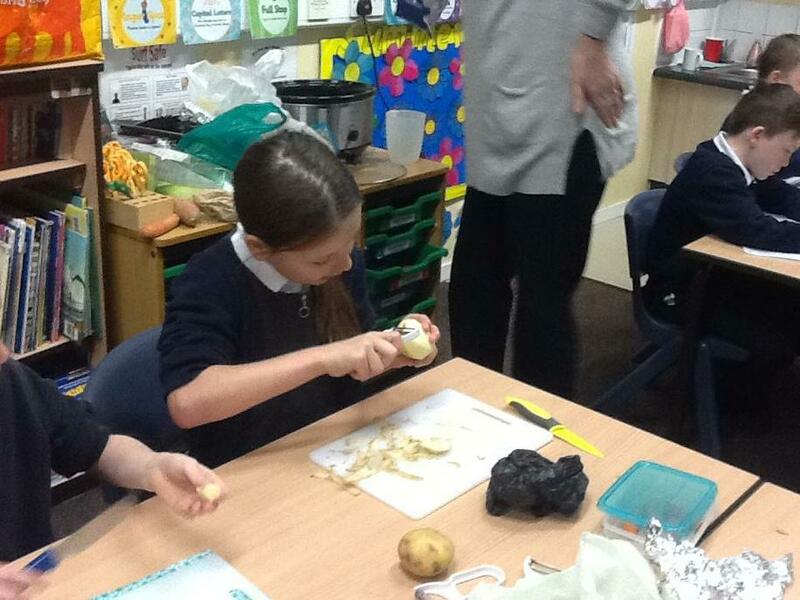 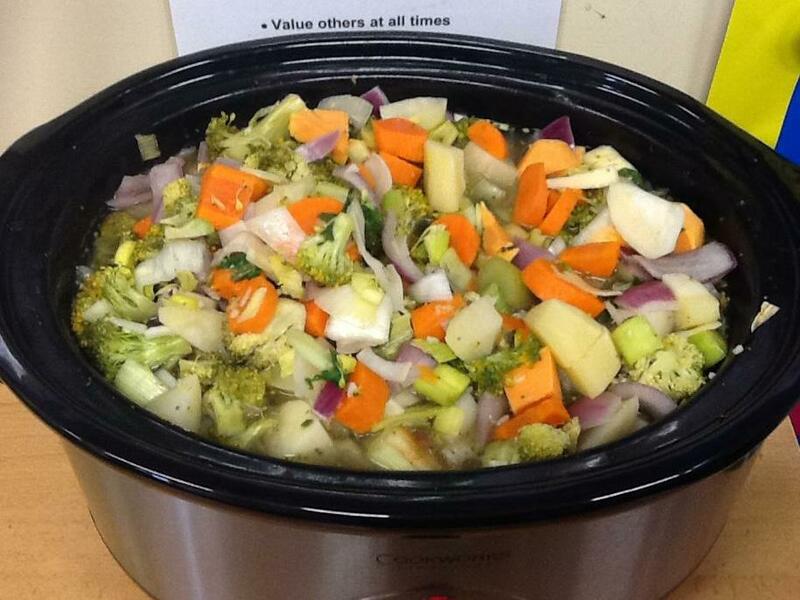 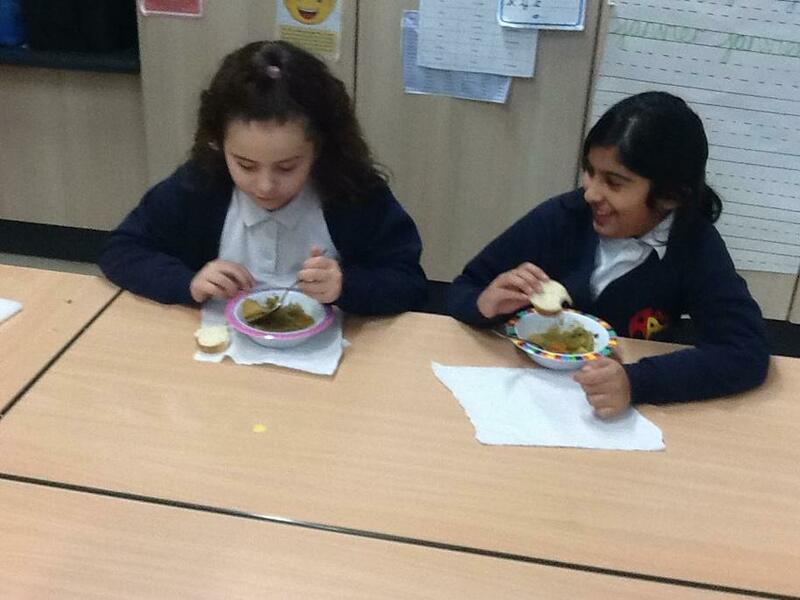 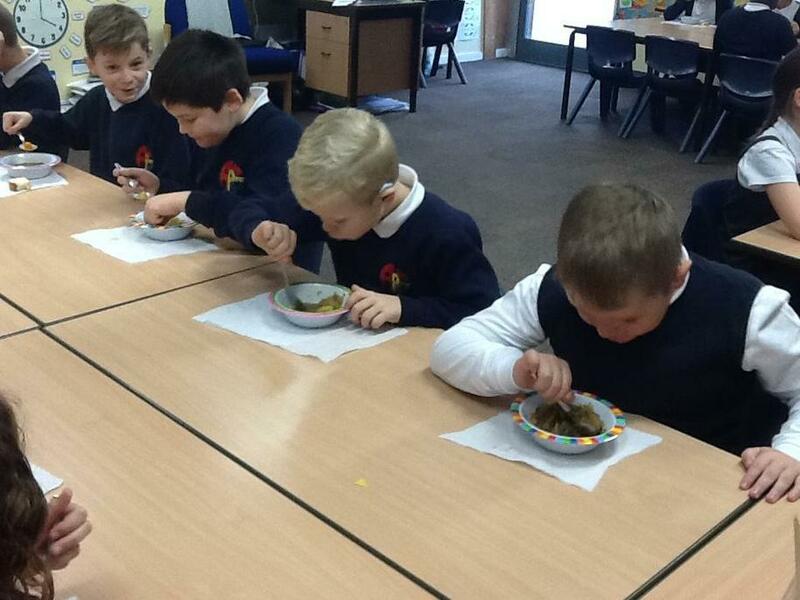 This term, we are learning about nutrition and eating a healthy diet. 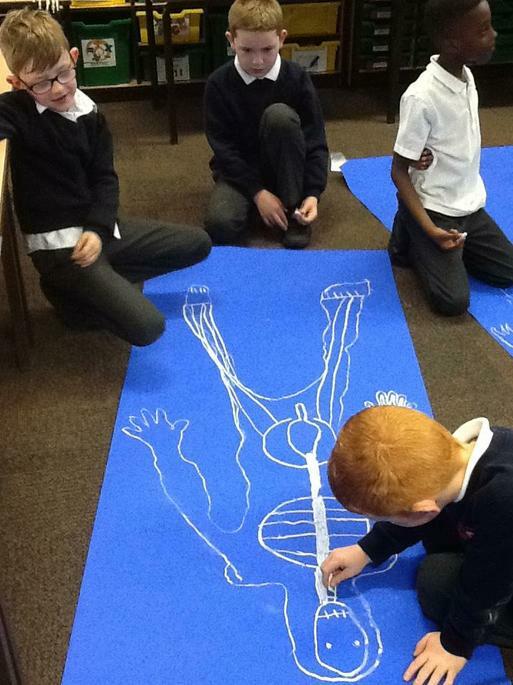 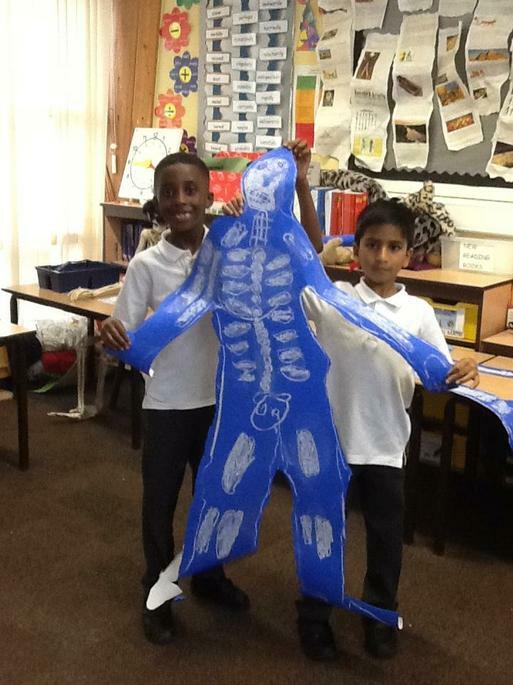 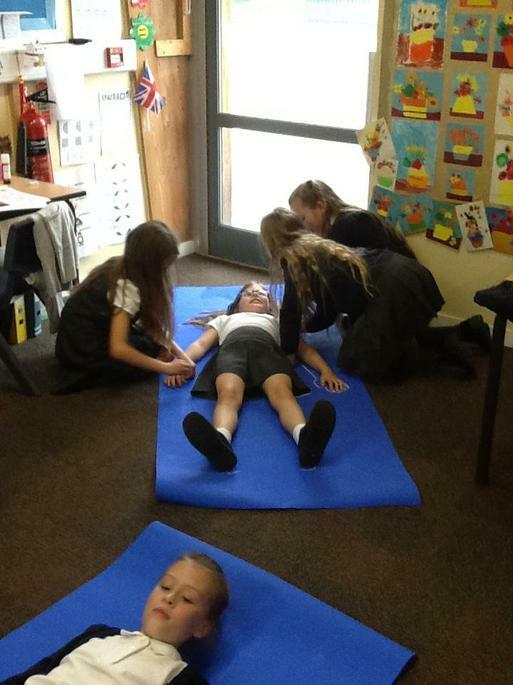 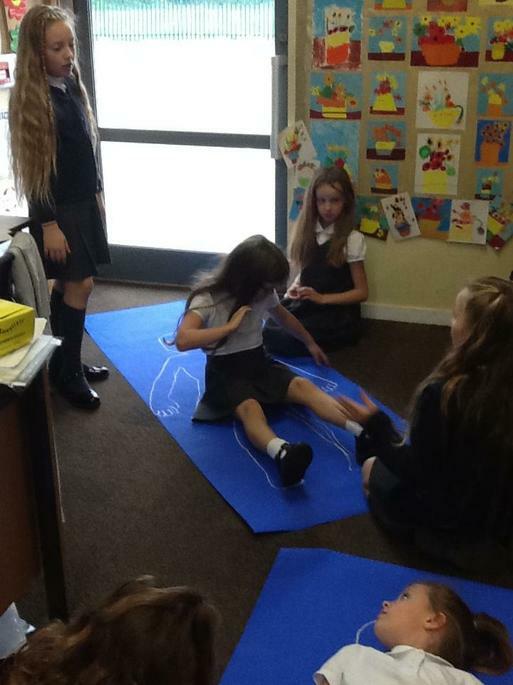 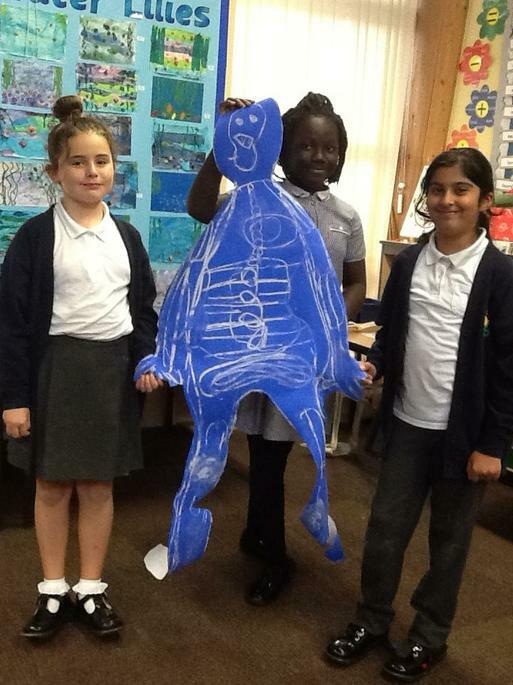 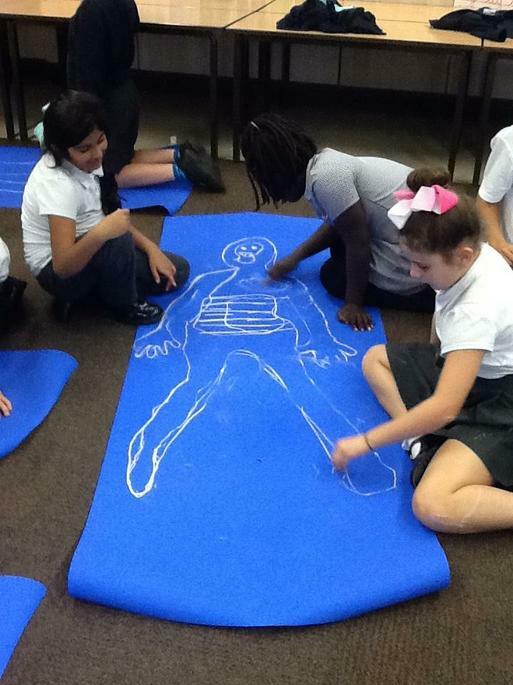 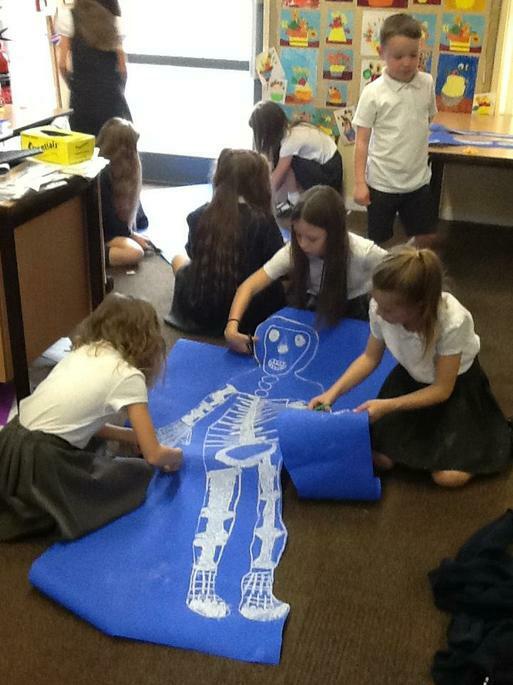 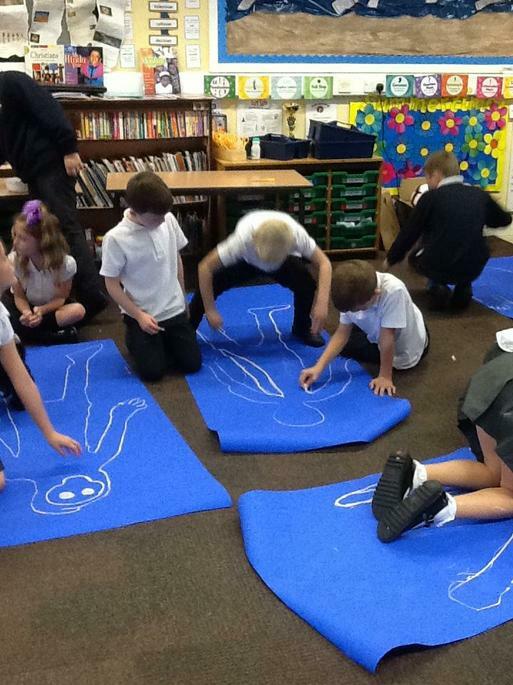 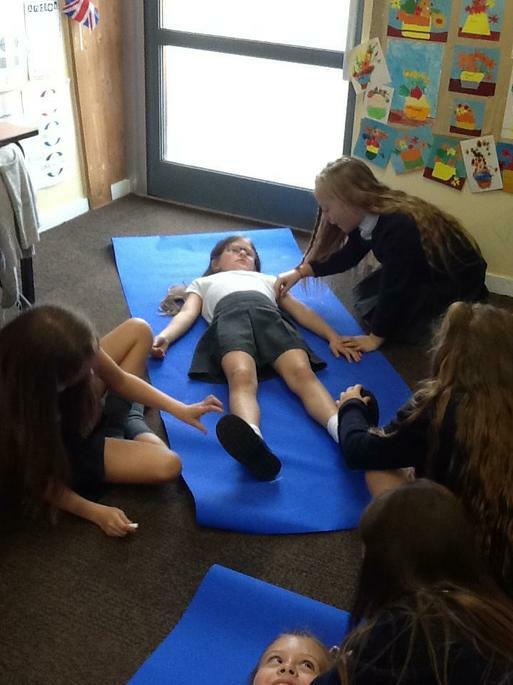 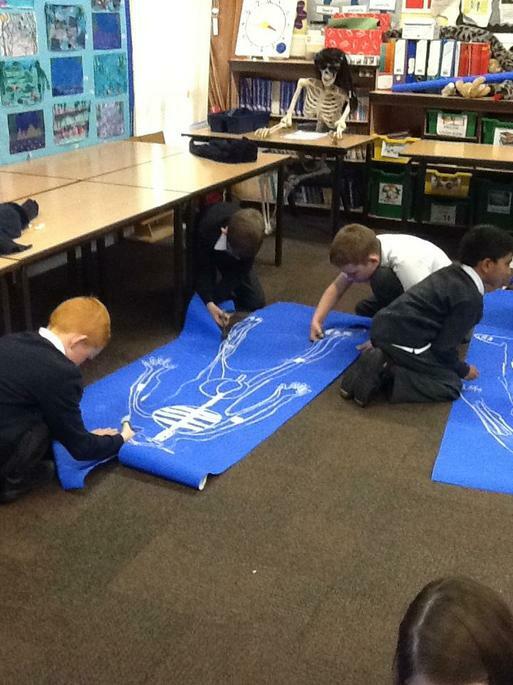 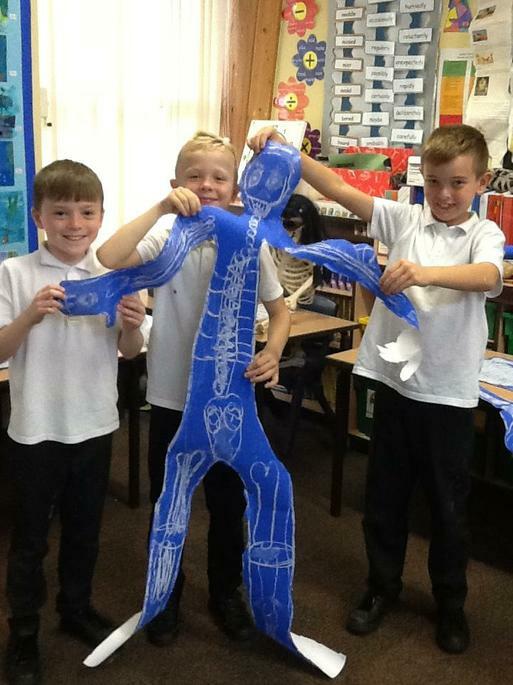 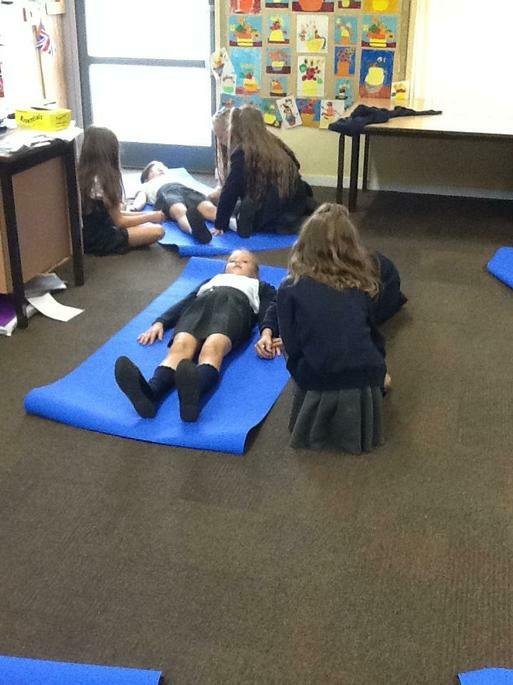 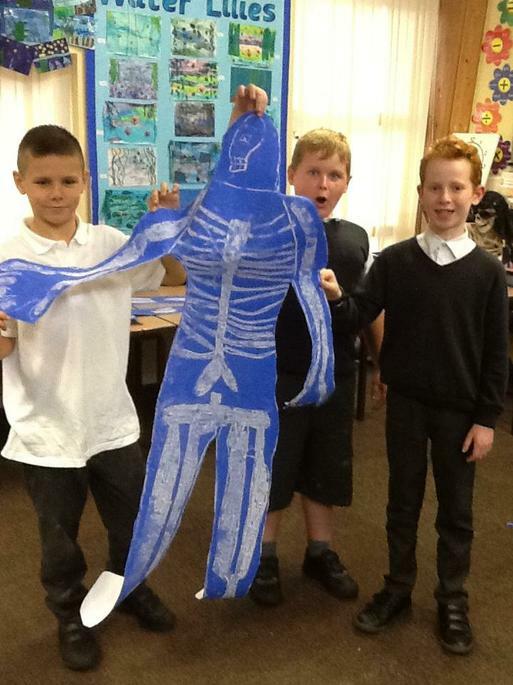 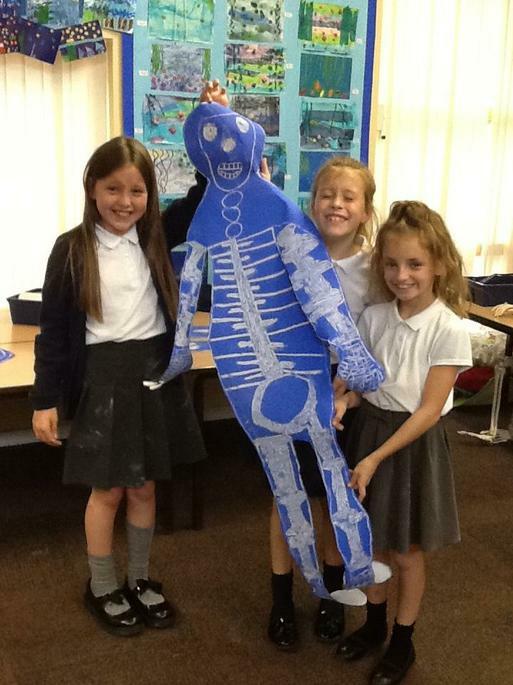 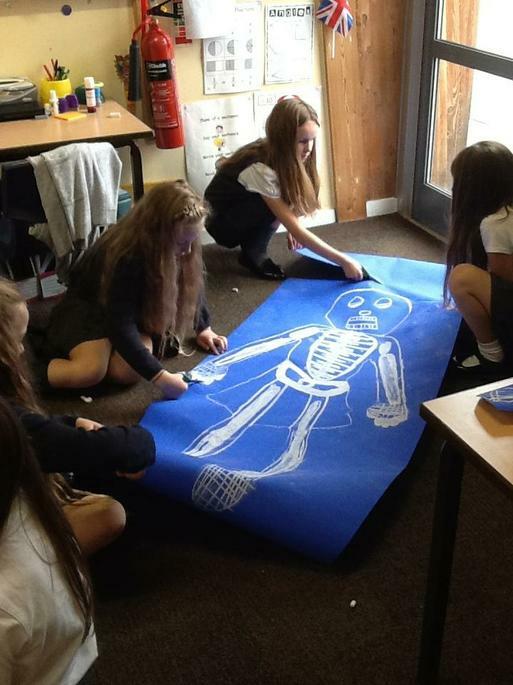 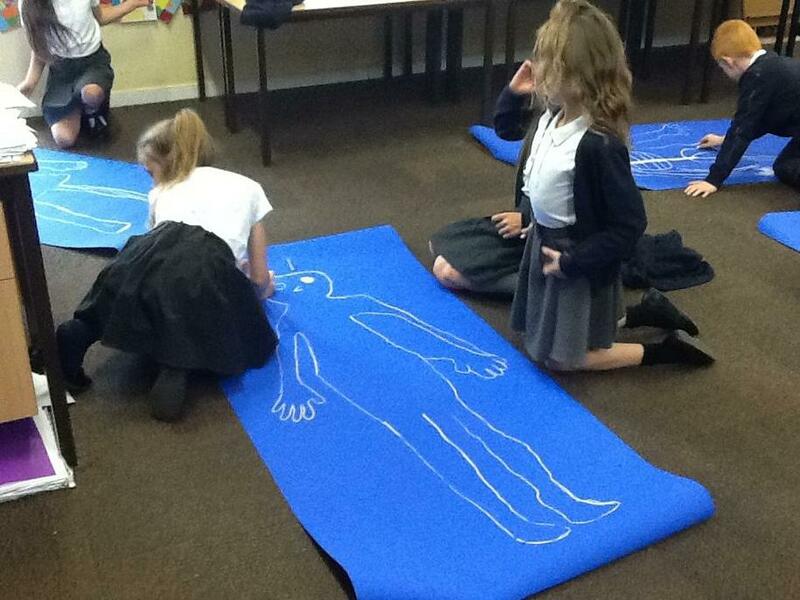 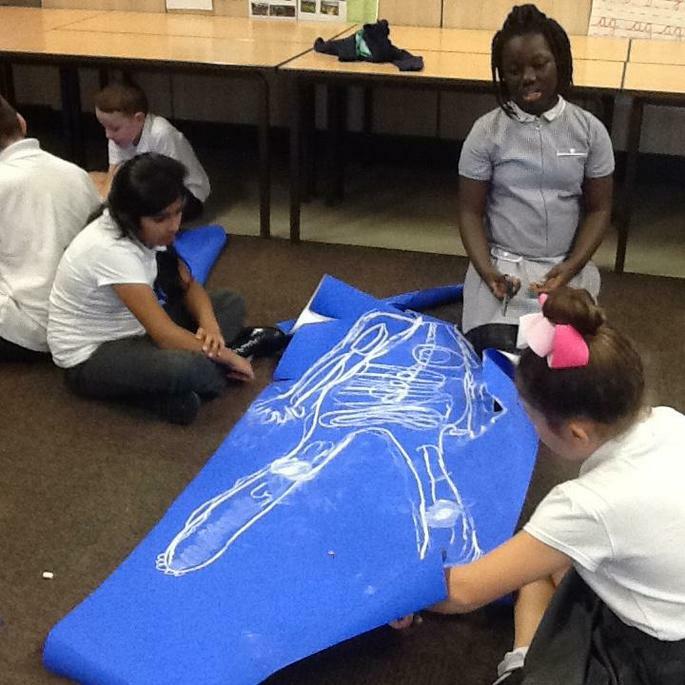 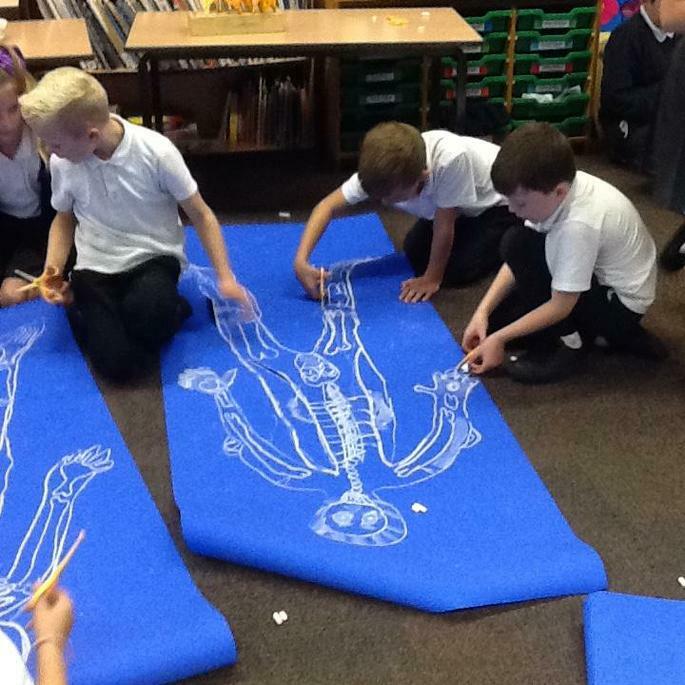 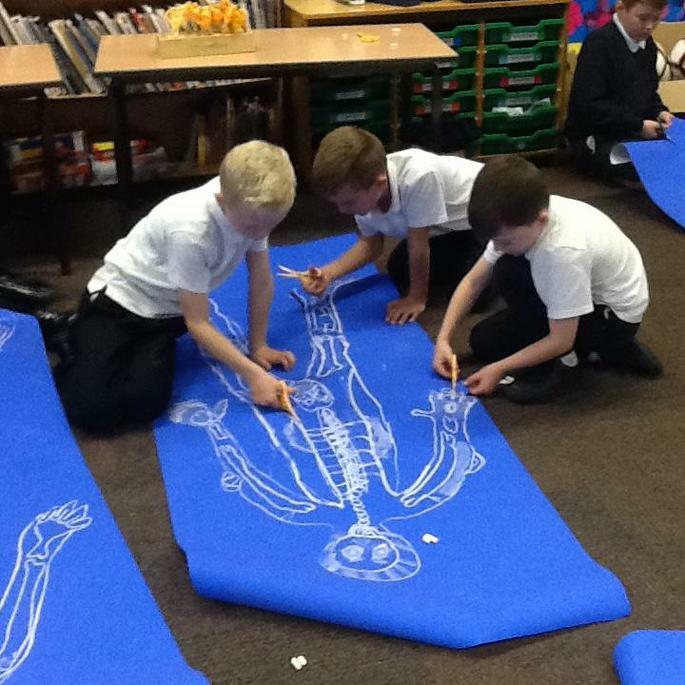 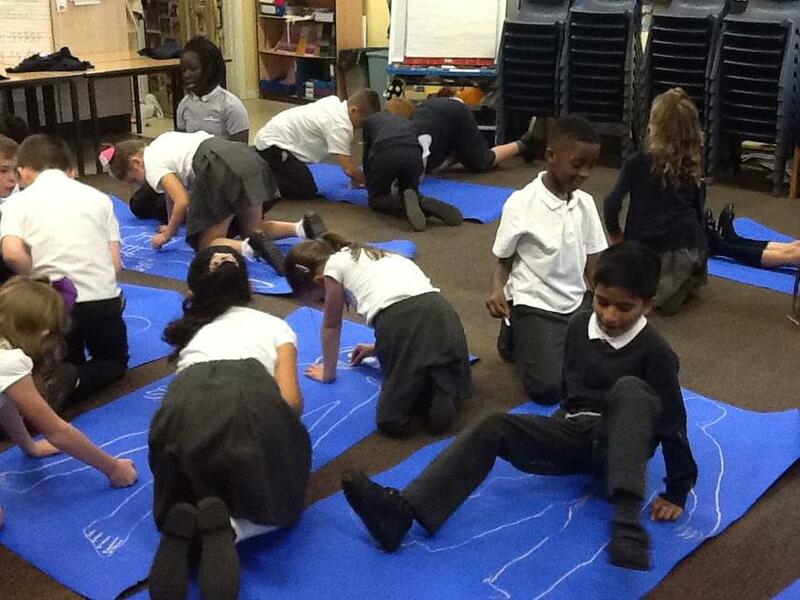 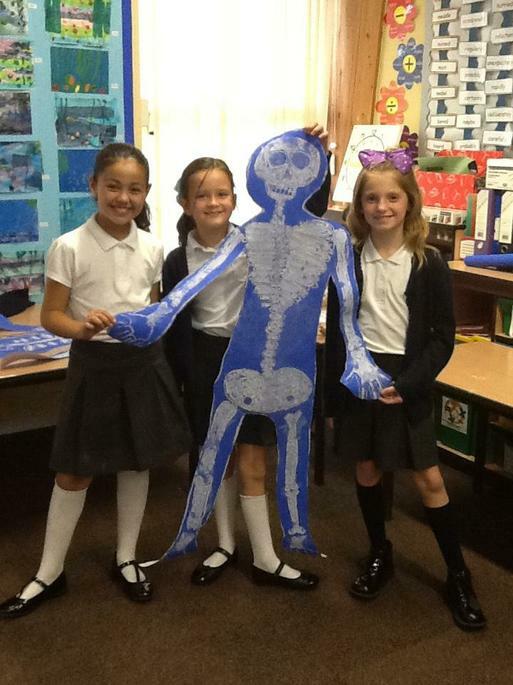 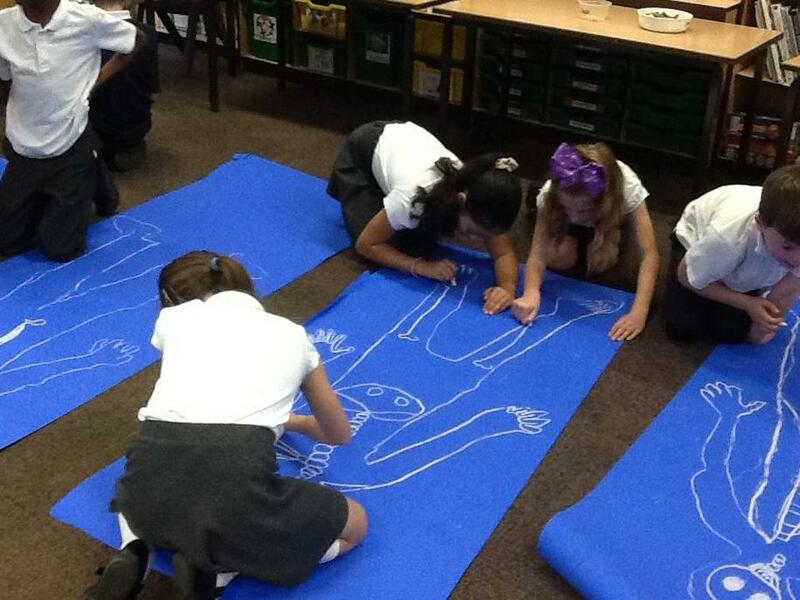 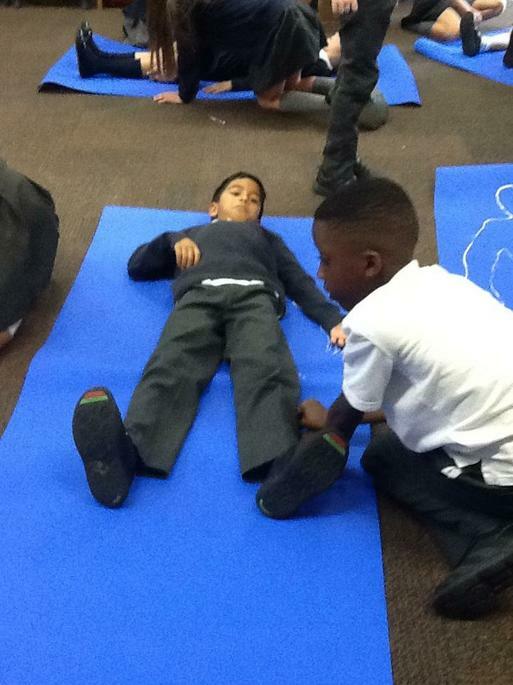 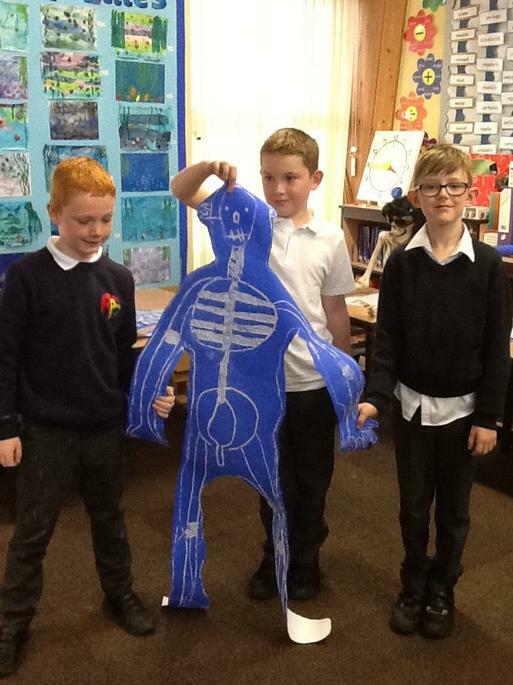 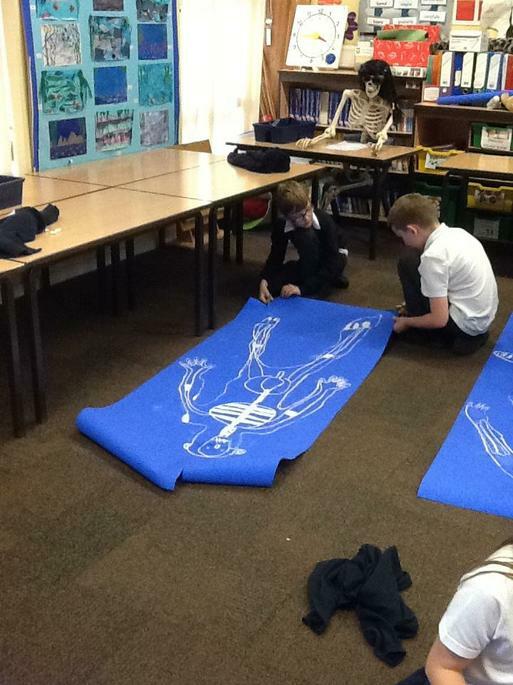 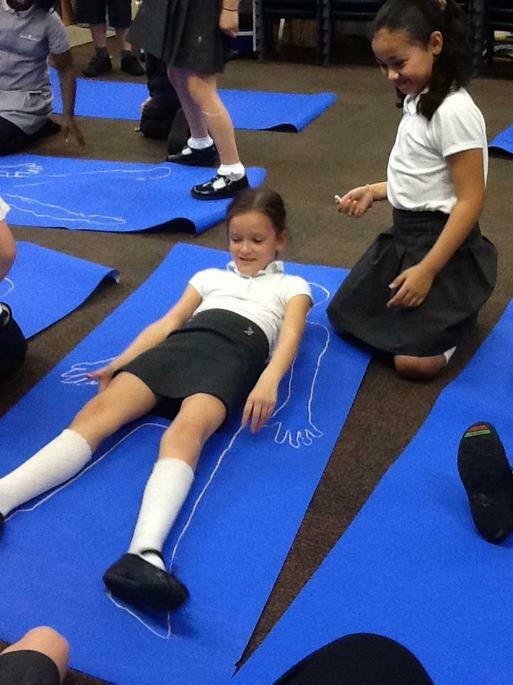 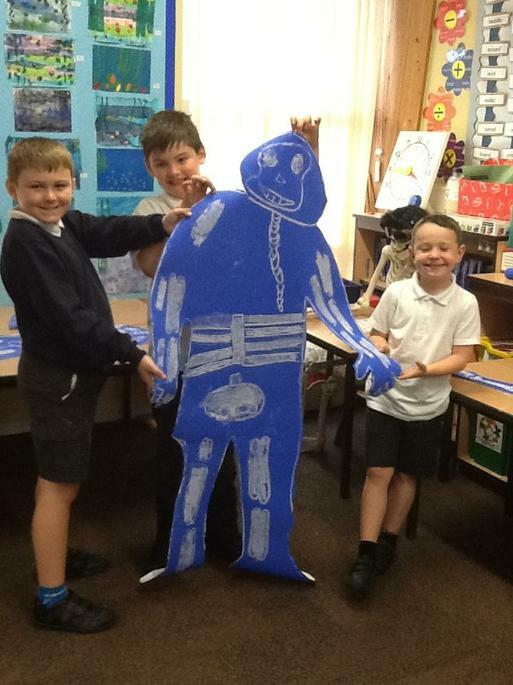 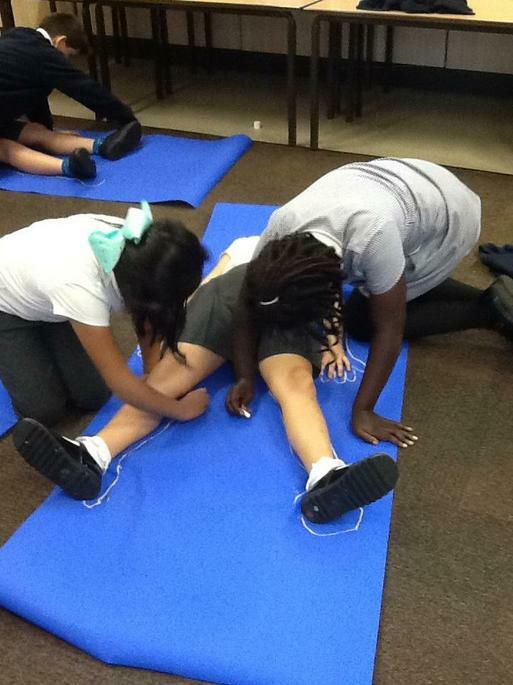 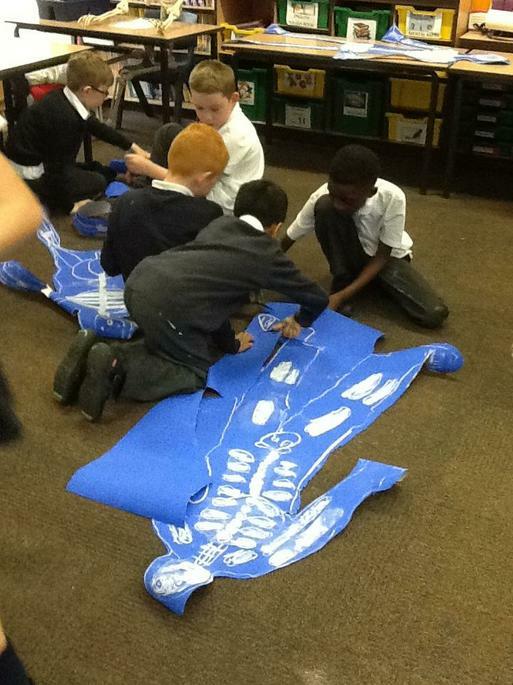 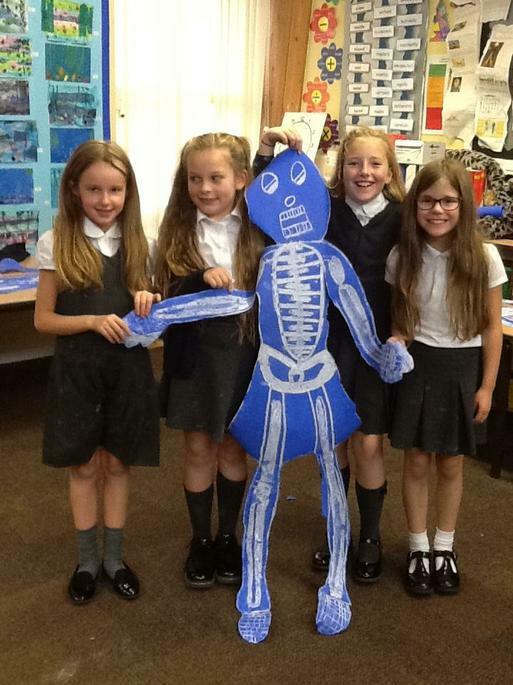 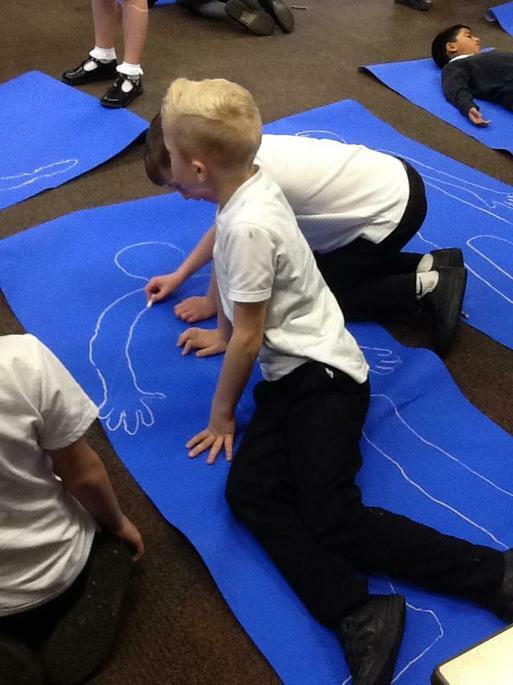 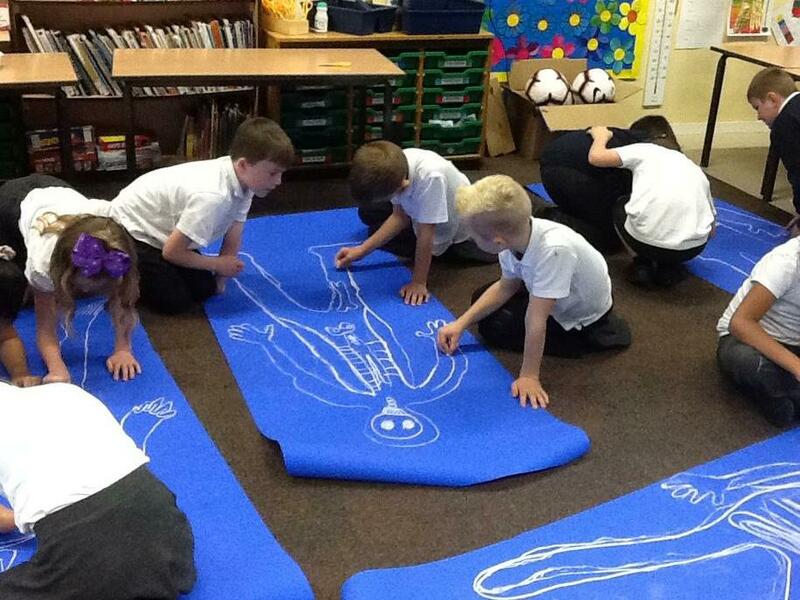 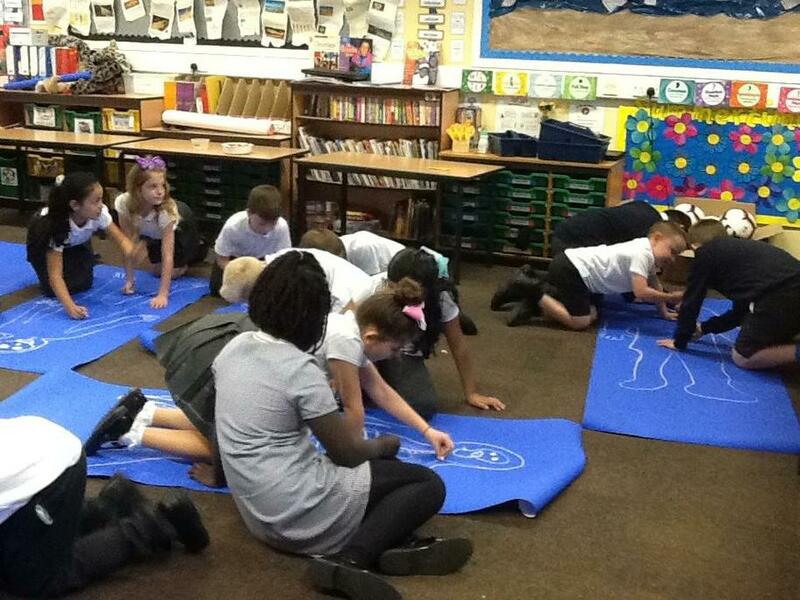 We are also learning about the human skeleton. 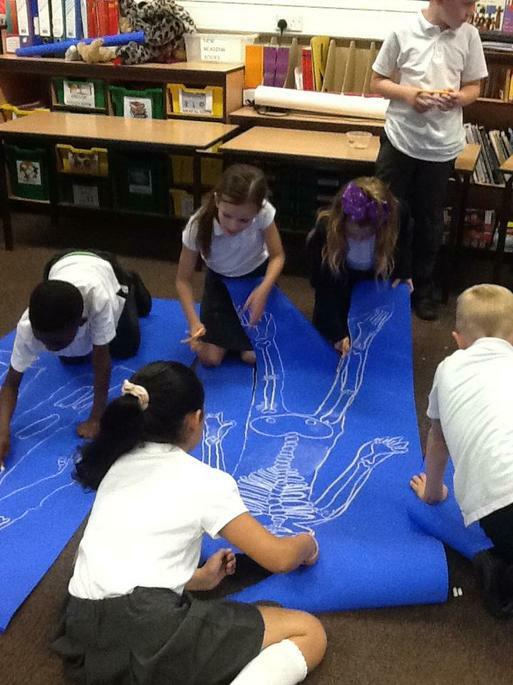 Today, we have drawn around our body and drawn in our bones. 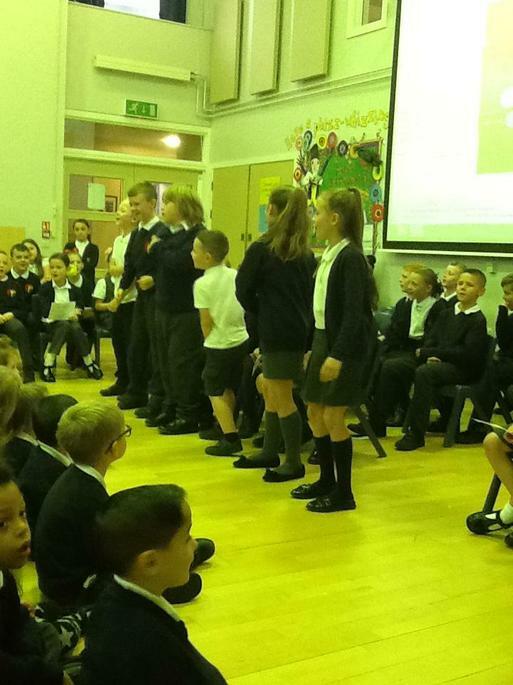 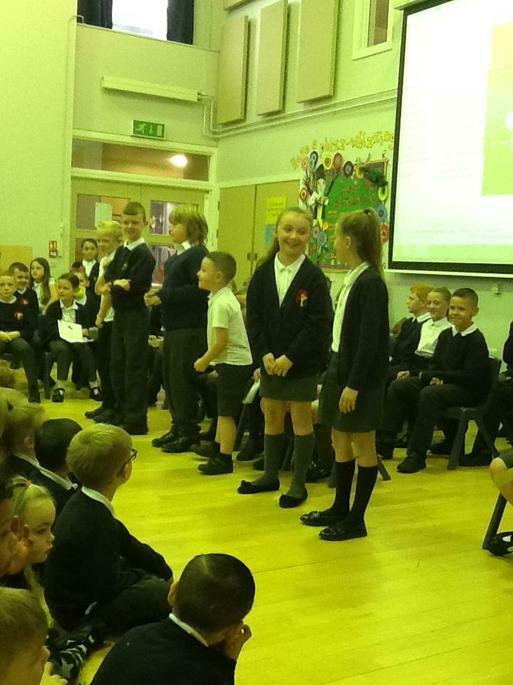 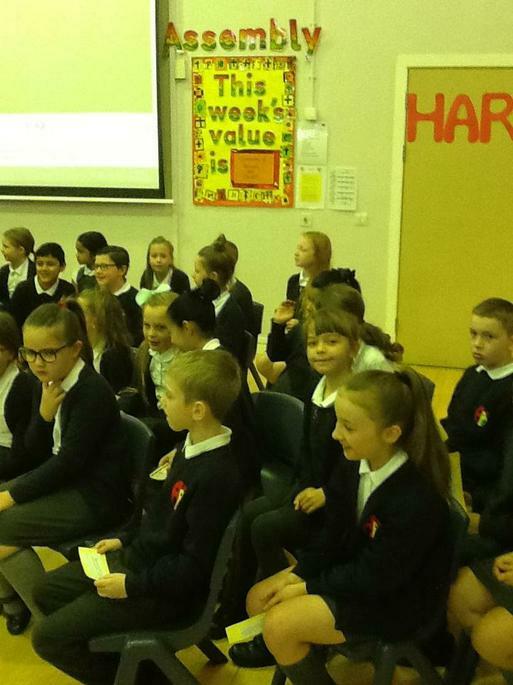 As part of our nutrition and healthy eating unit, we performed an assembly for the whole school combing healthy eating with the harvest festival. 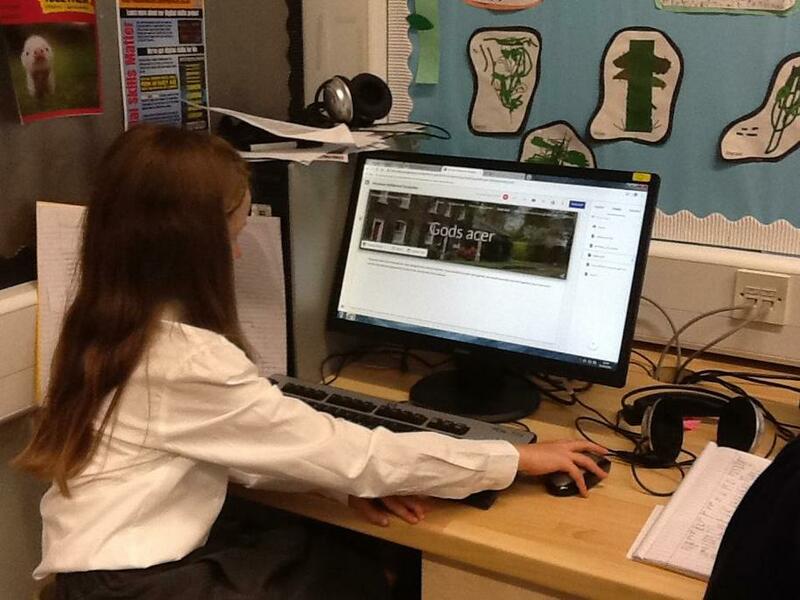 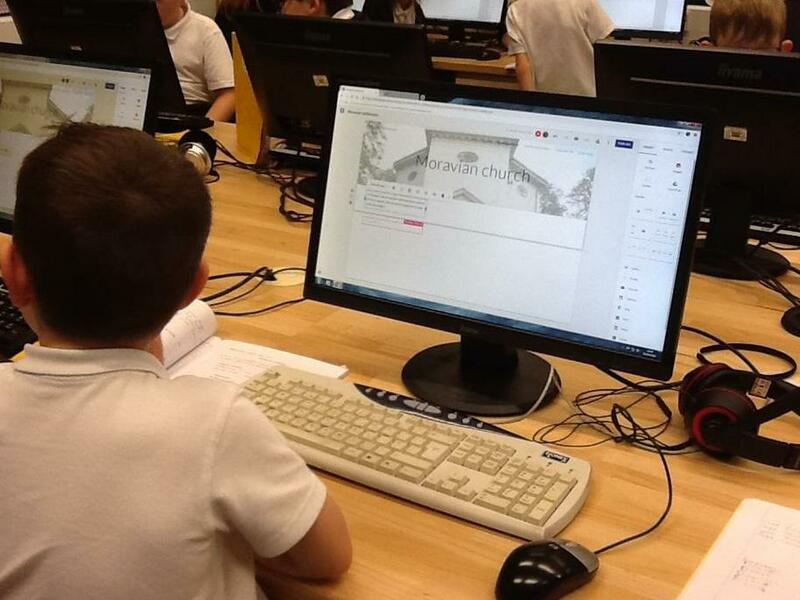 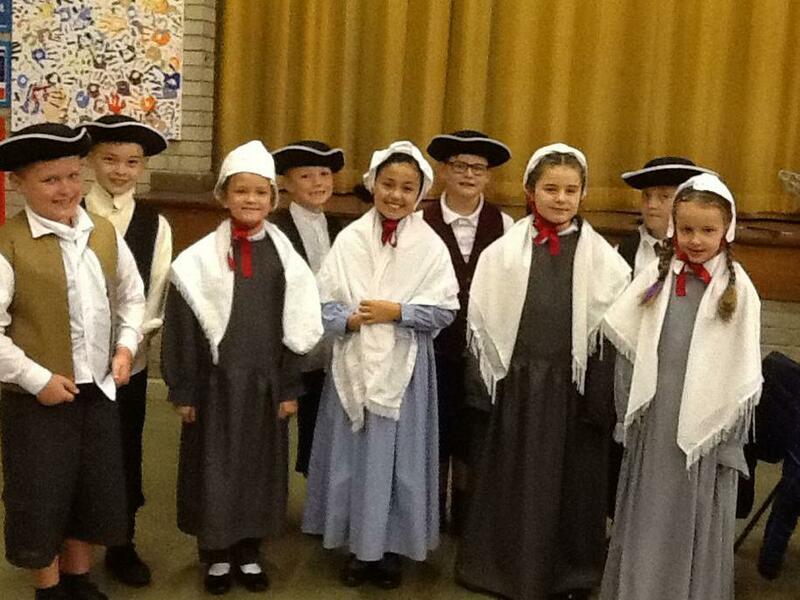 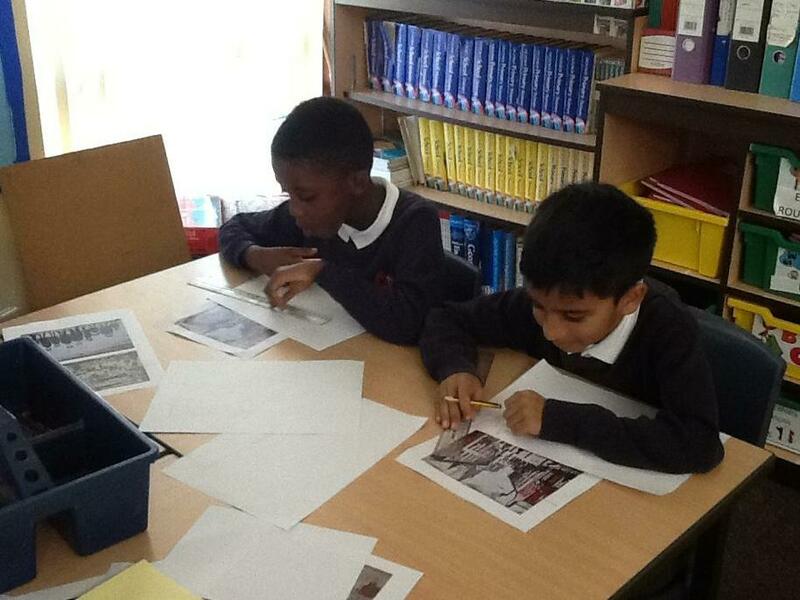 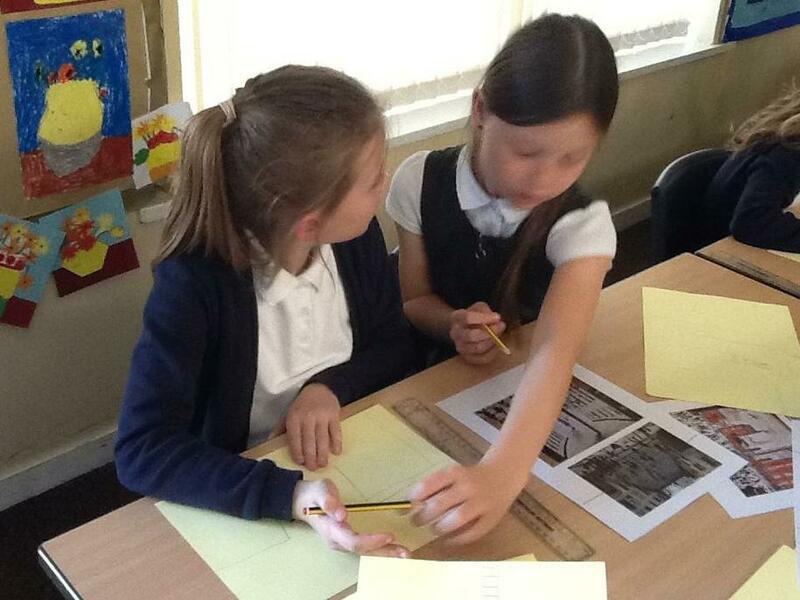 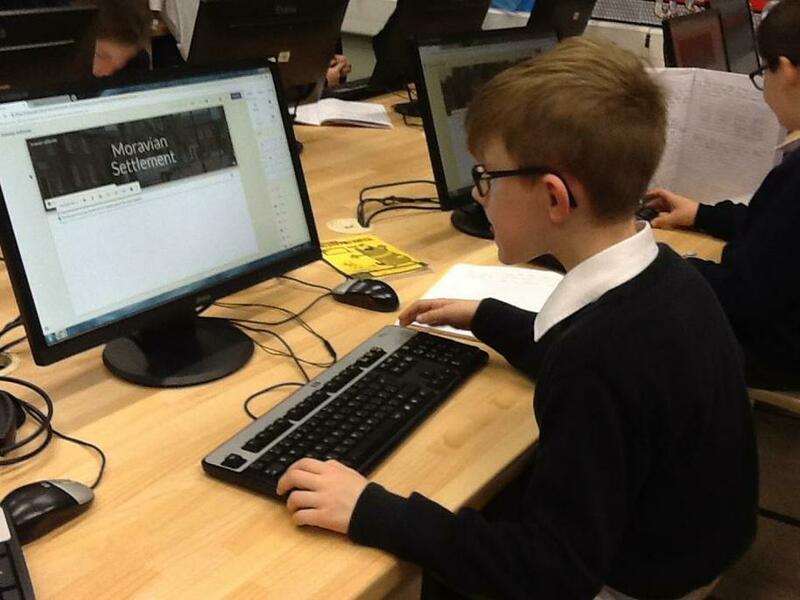 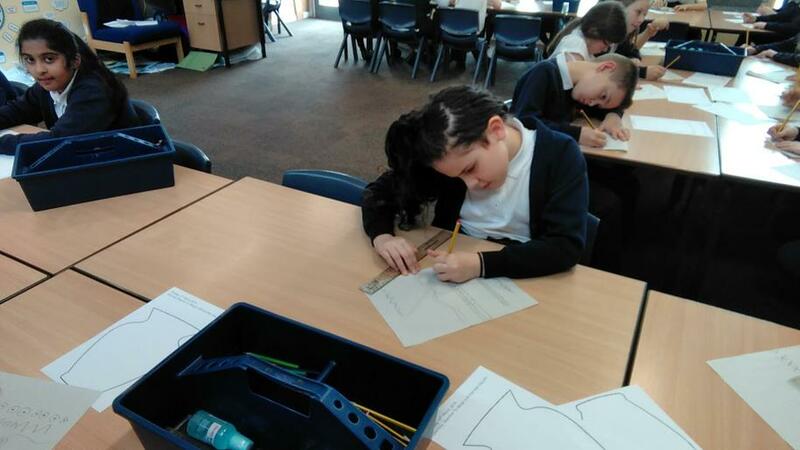 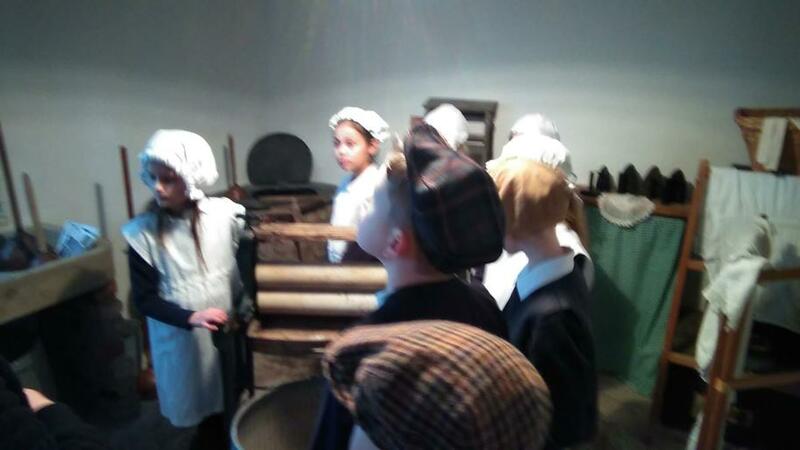 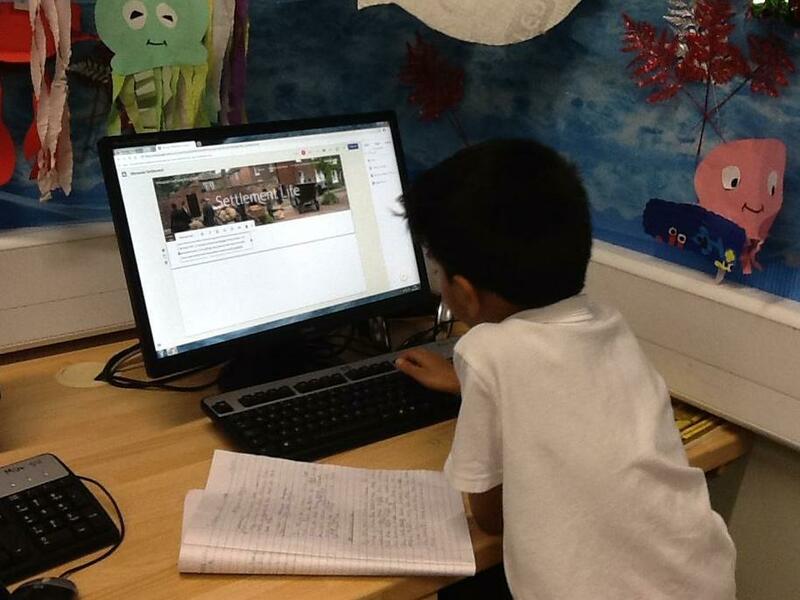 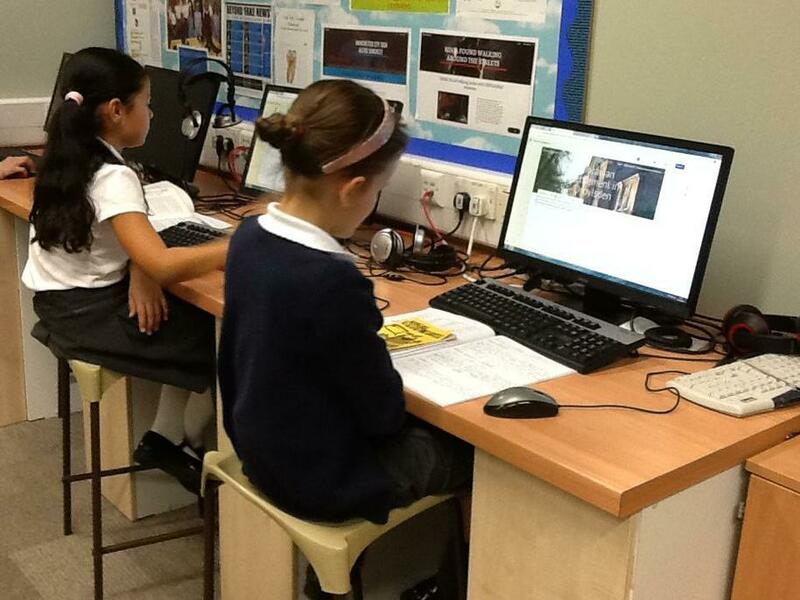 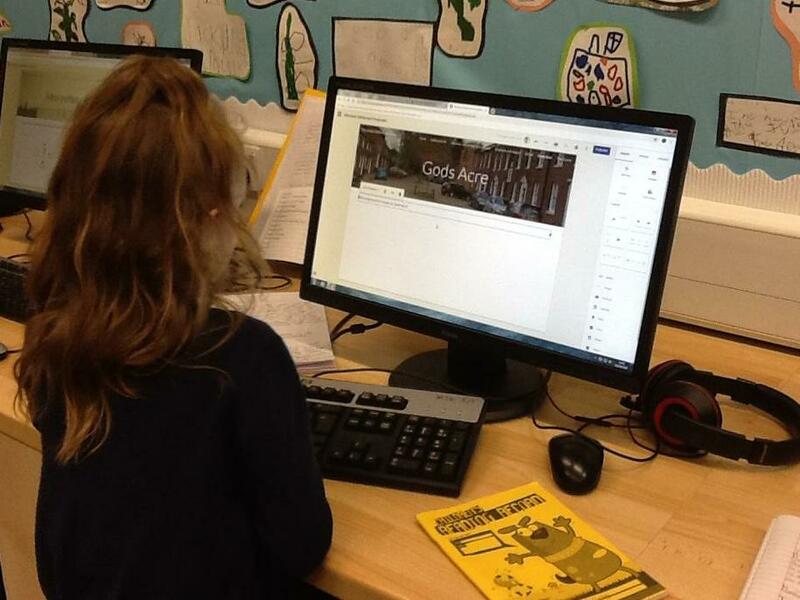 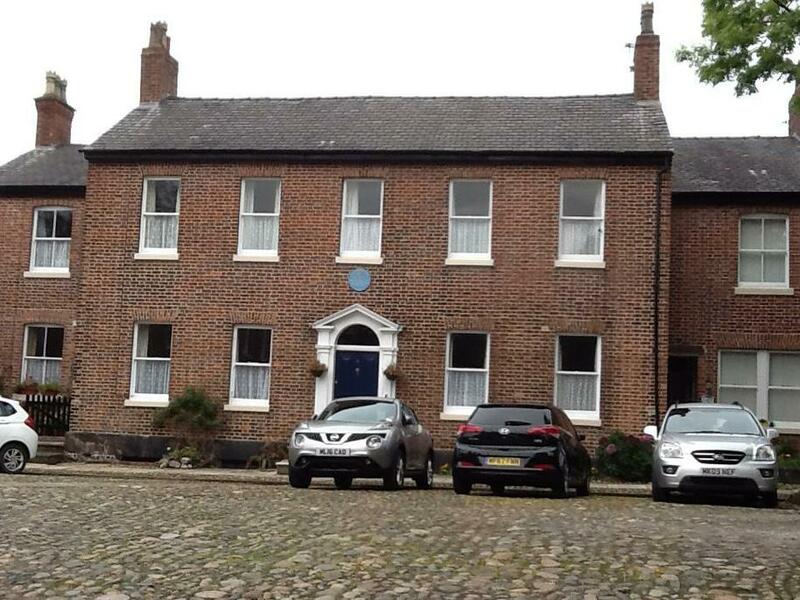 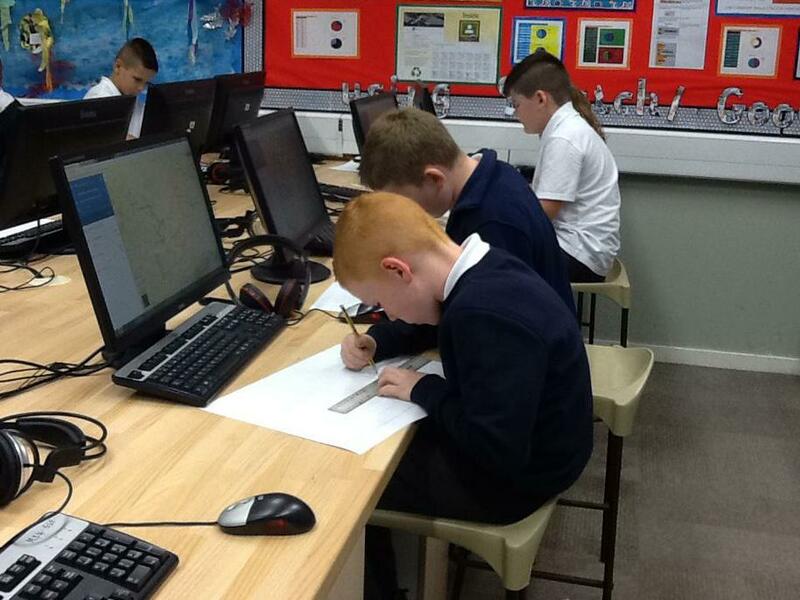 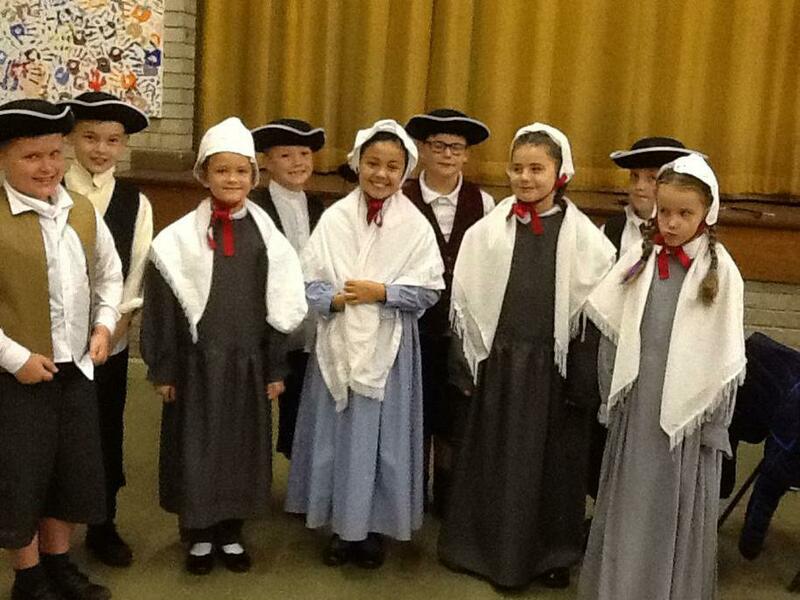 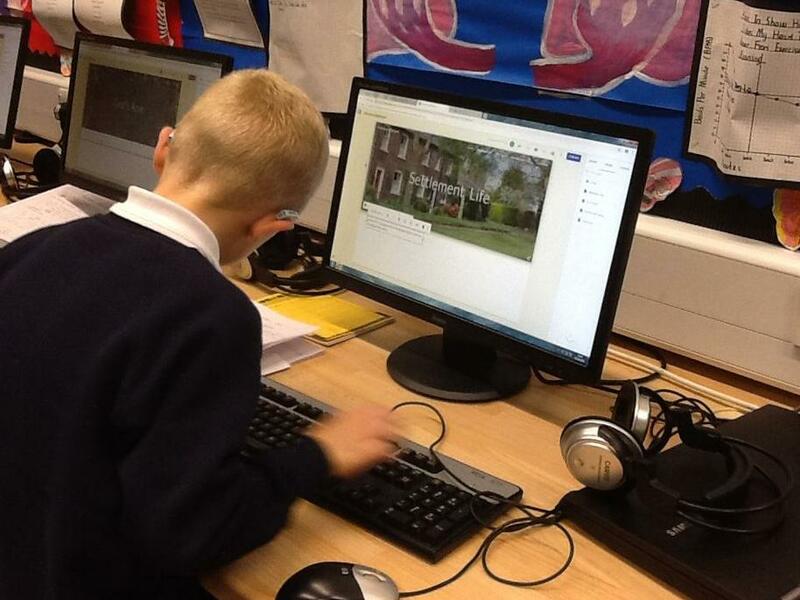 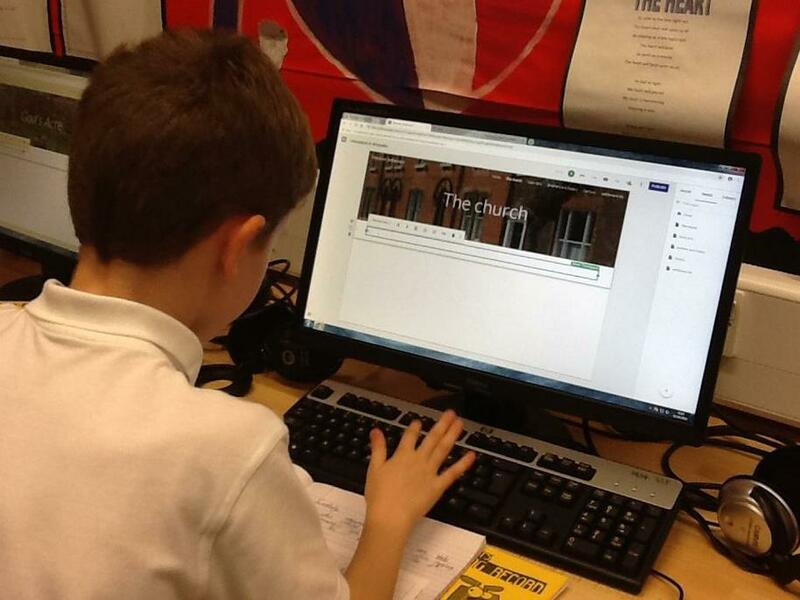 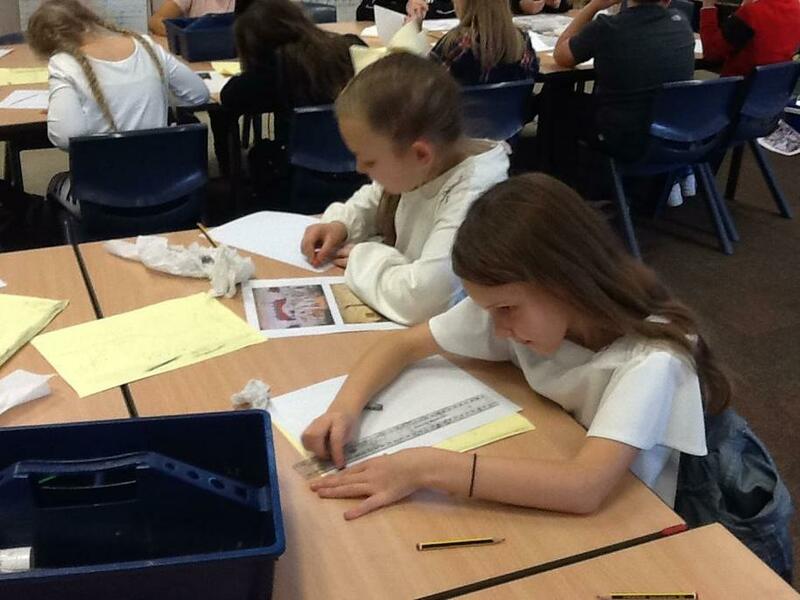 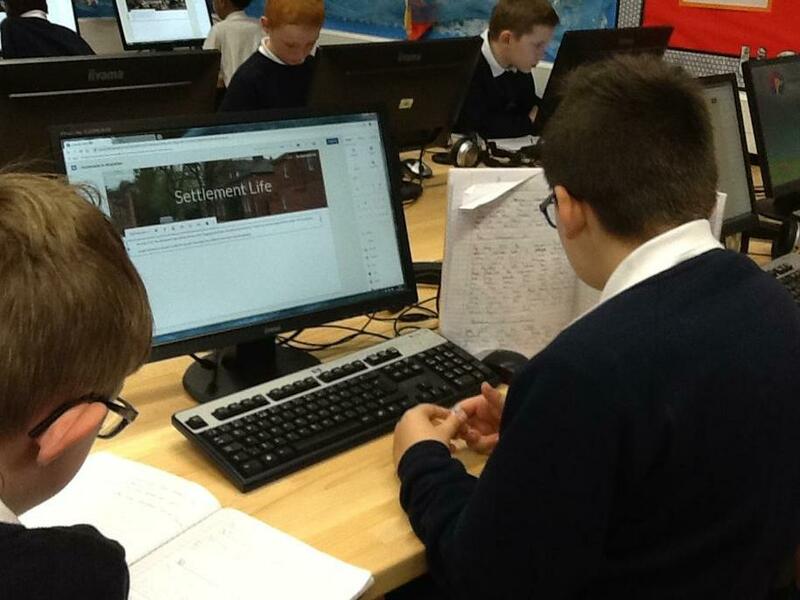 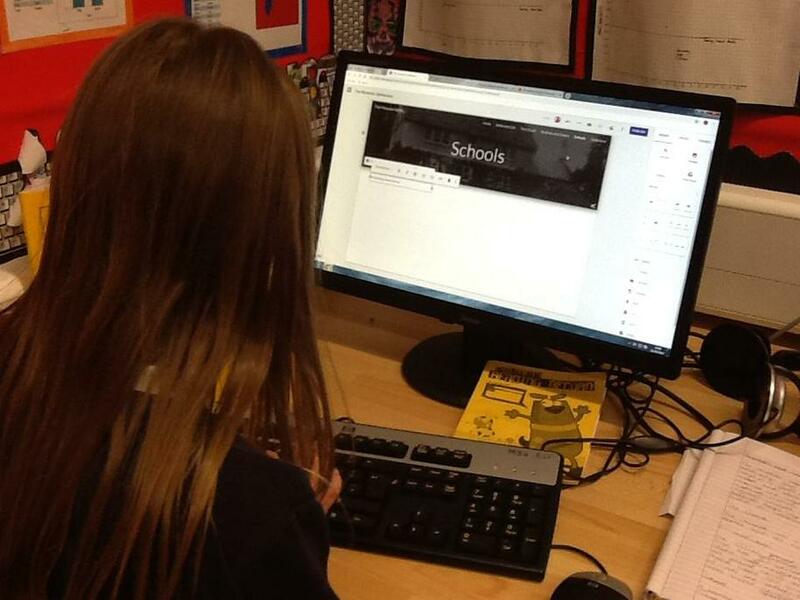 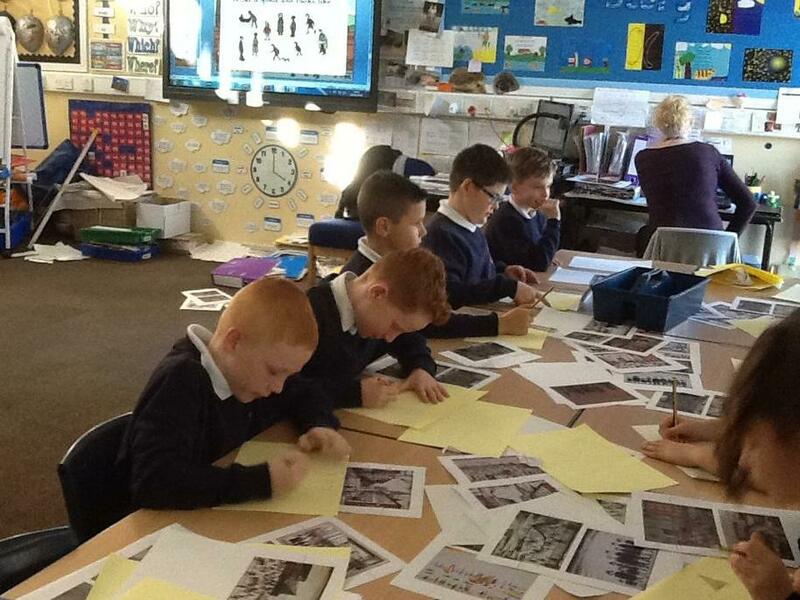 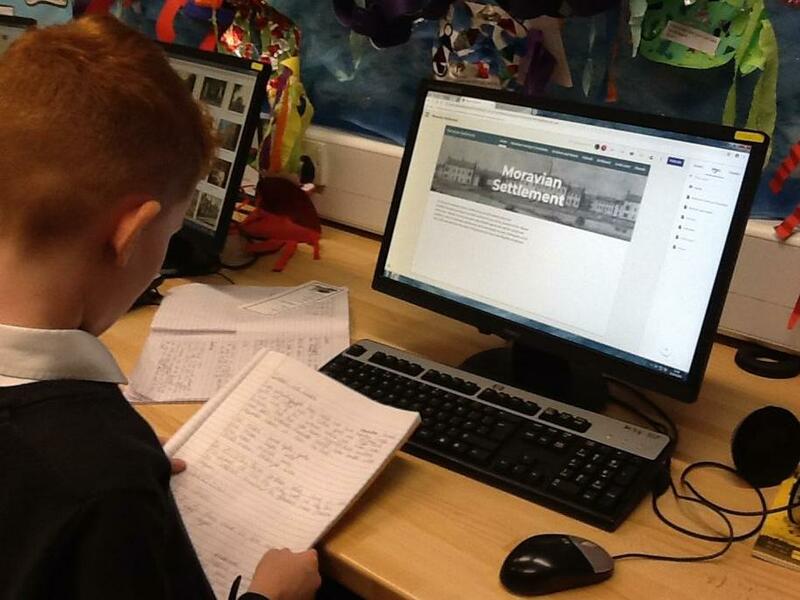 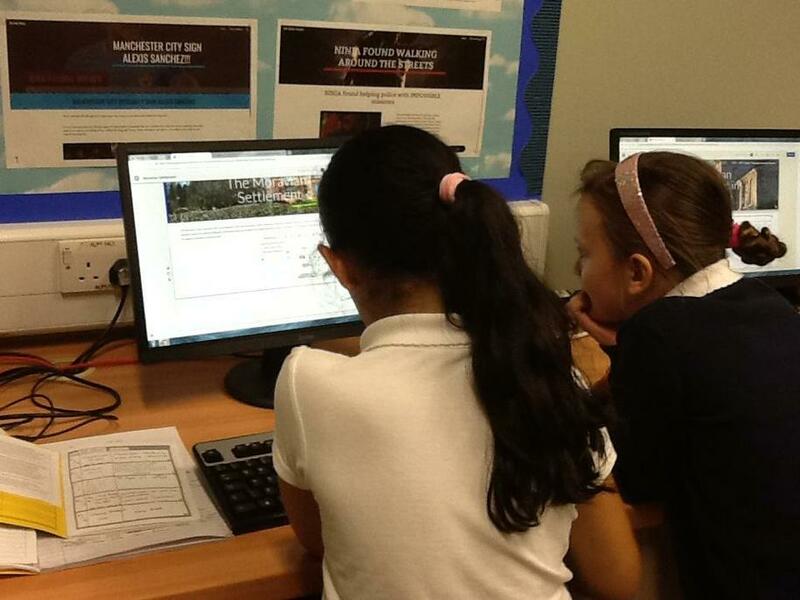 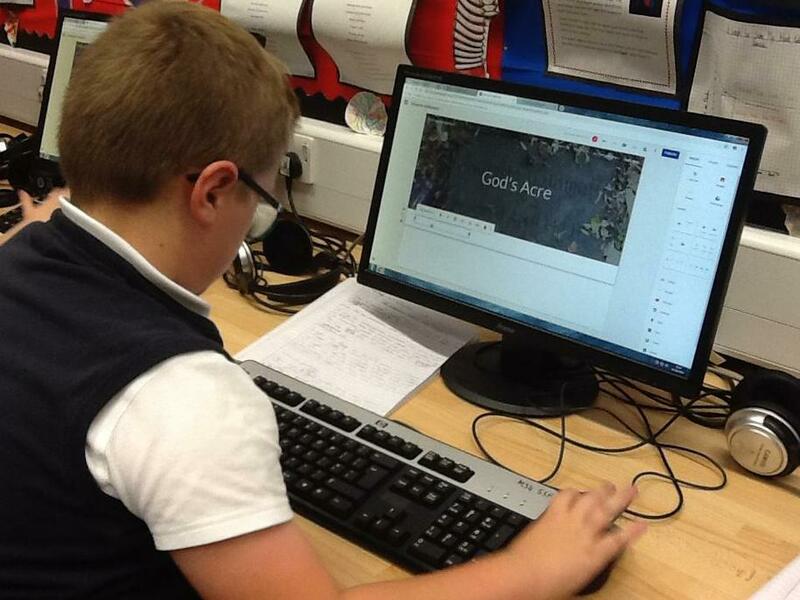 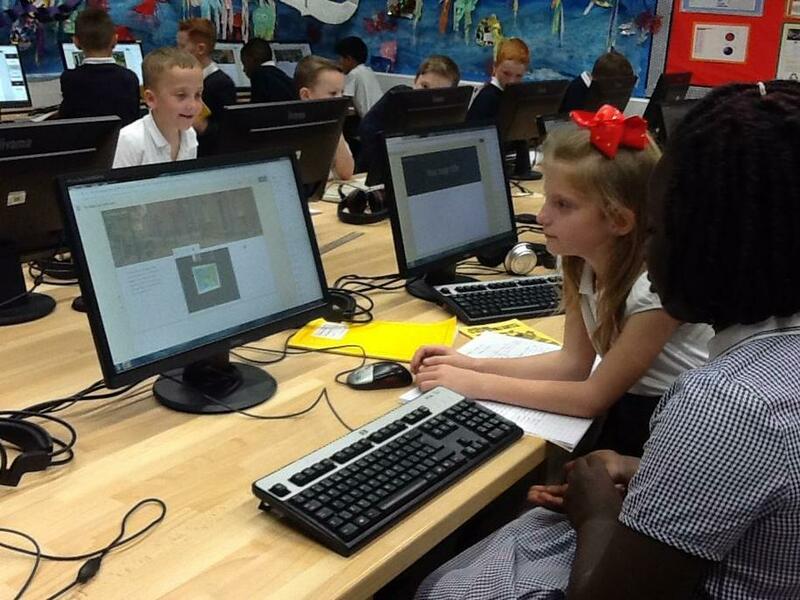 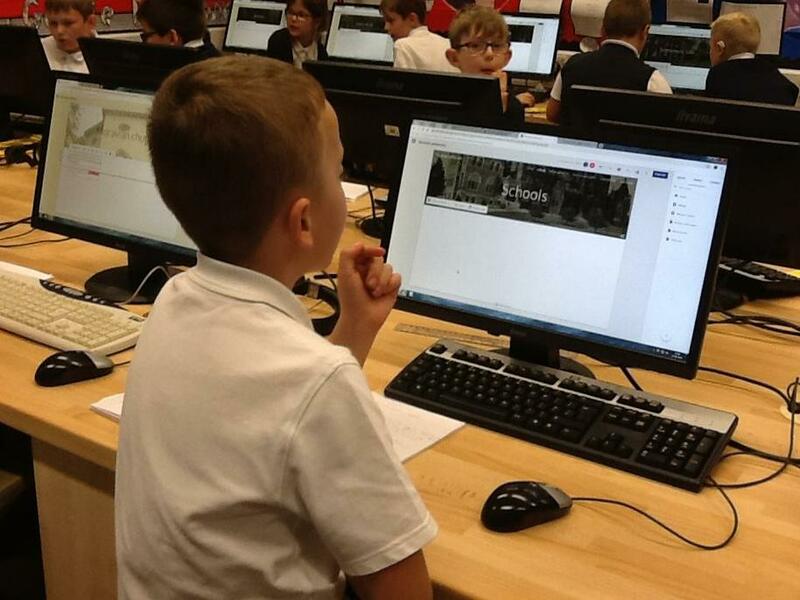 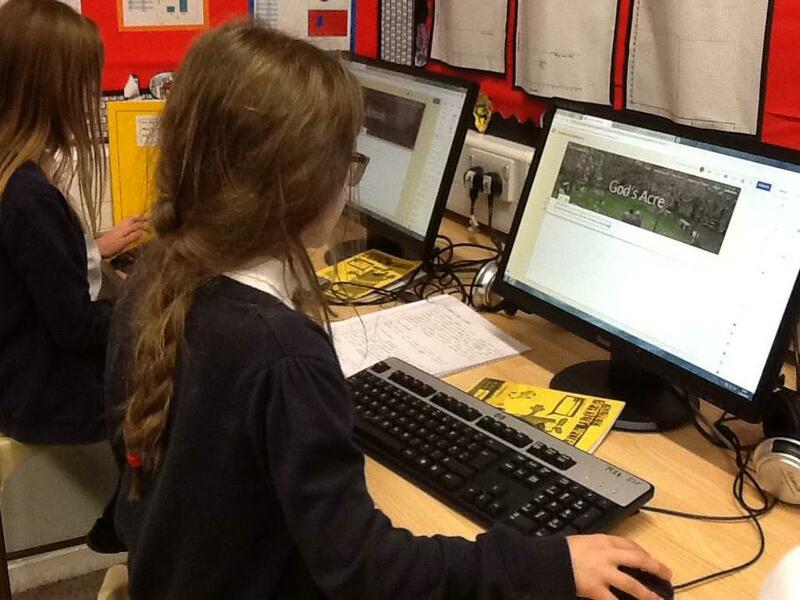 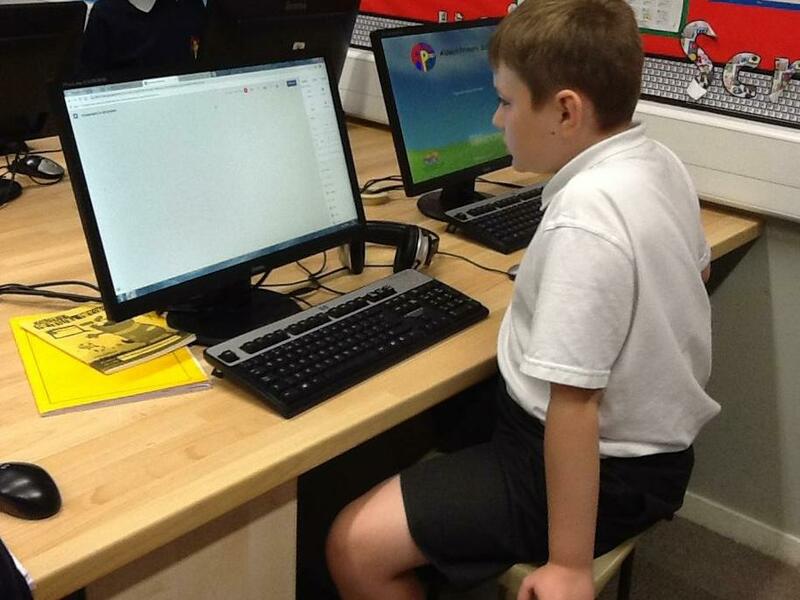 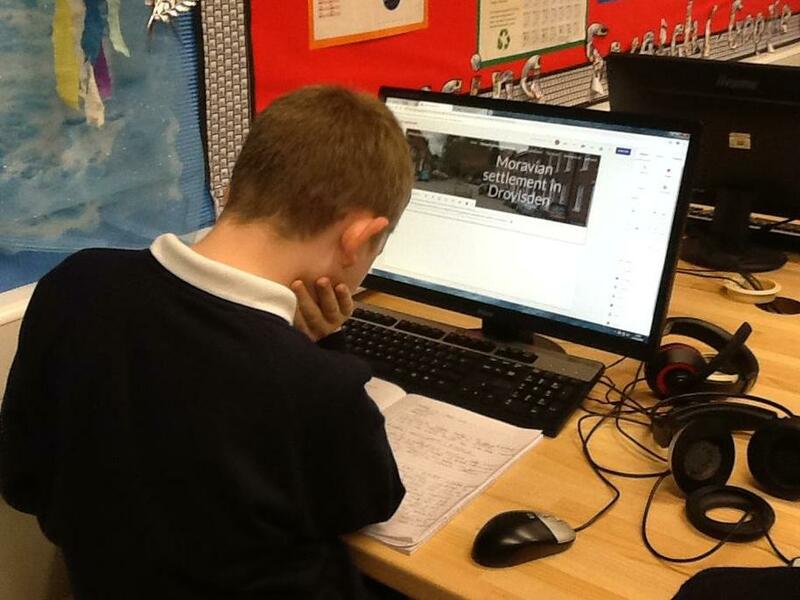 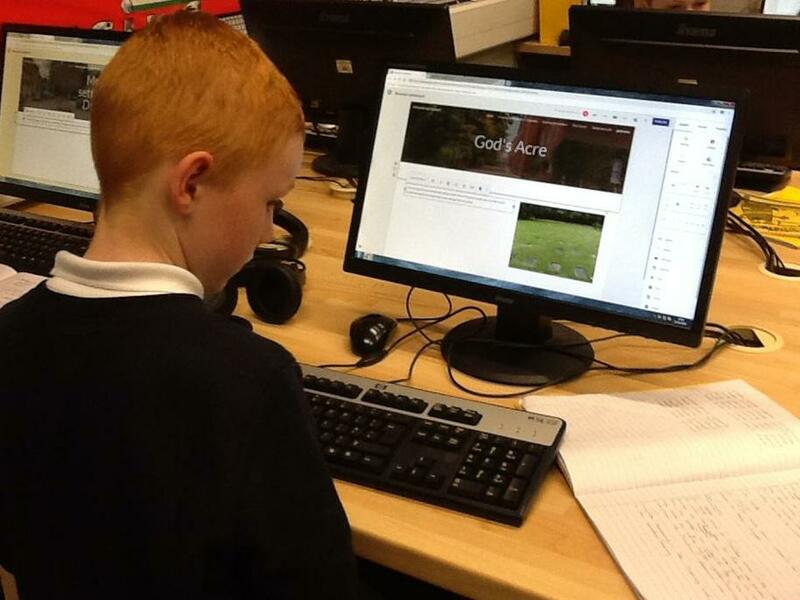 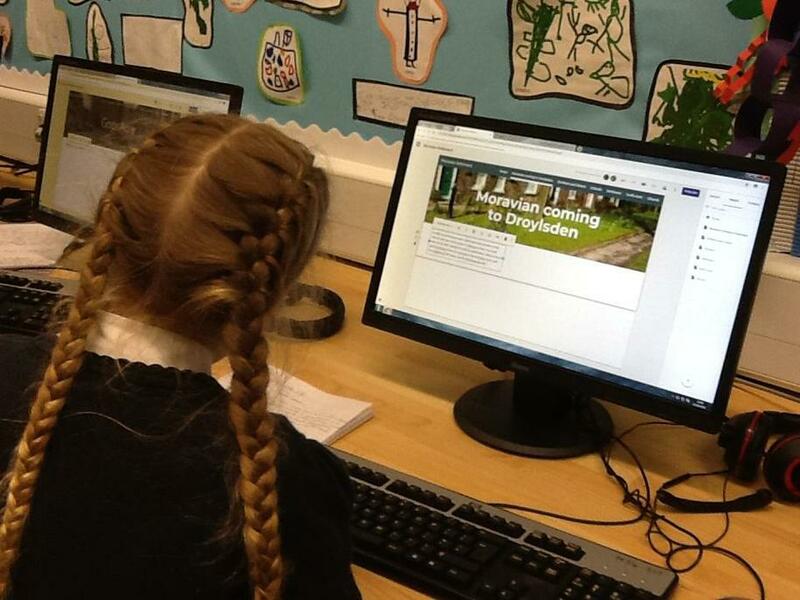 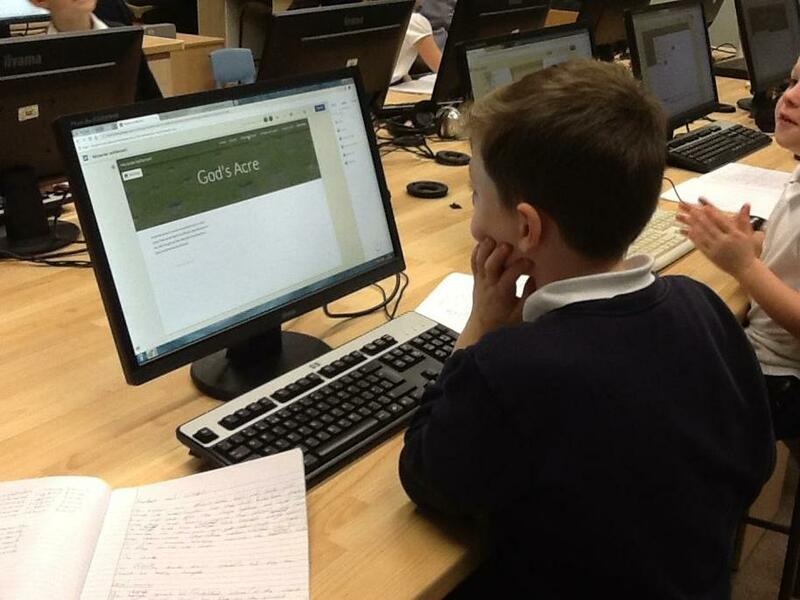 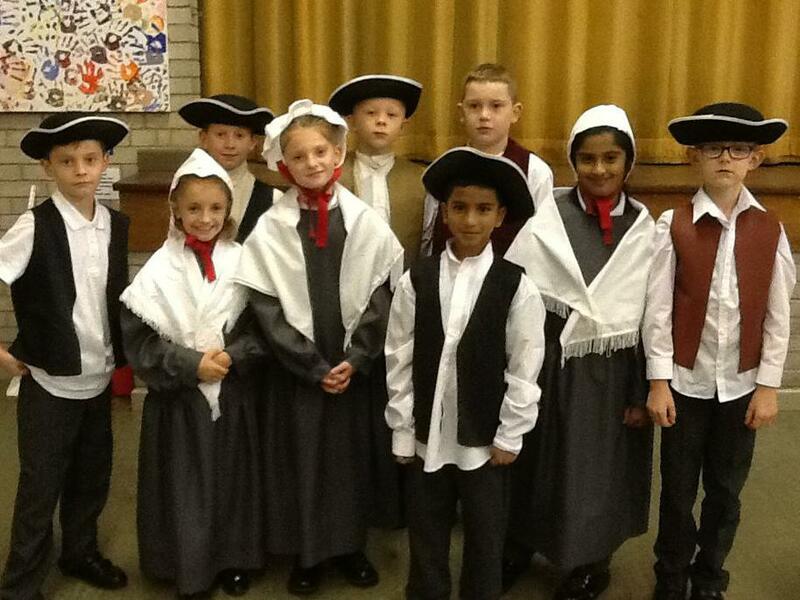 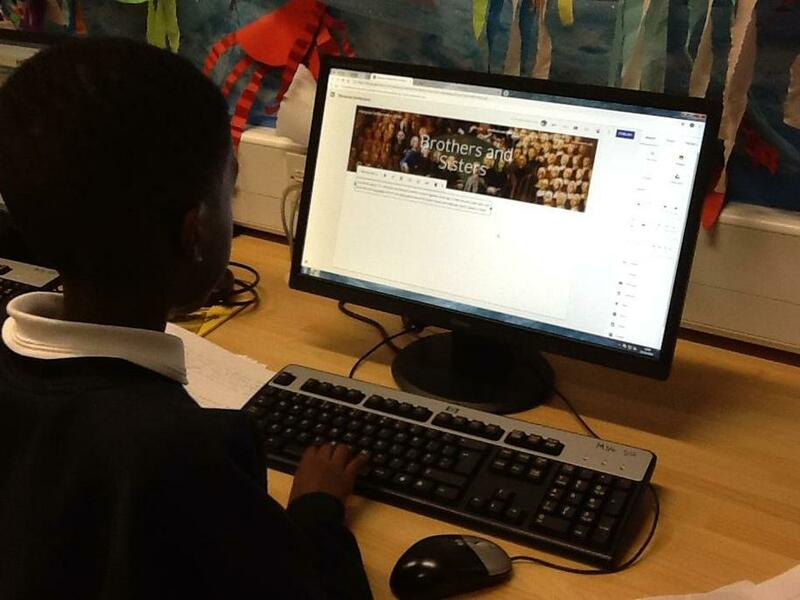 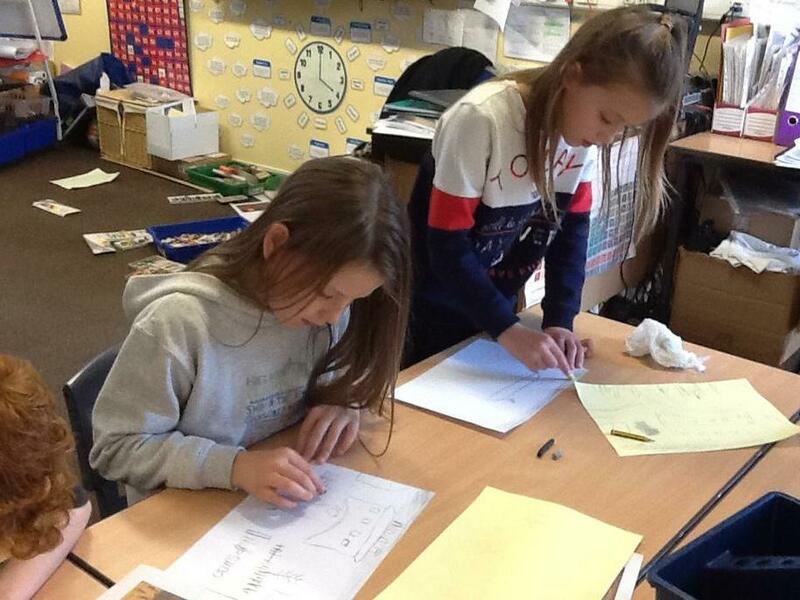 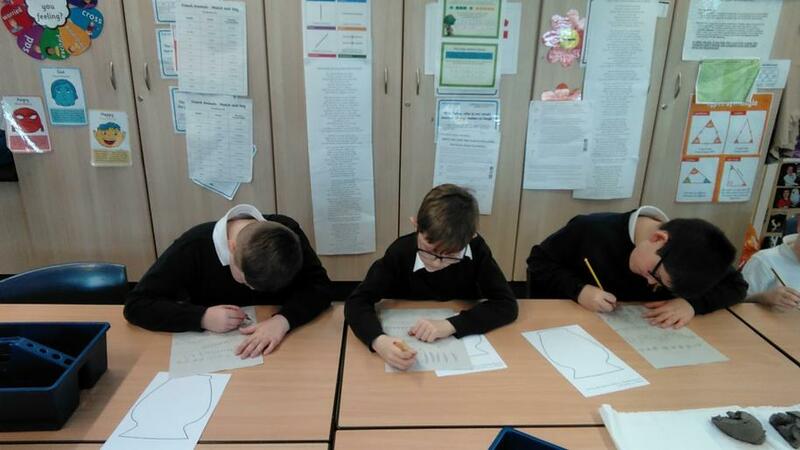 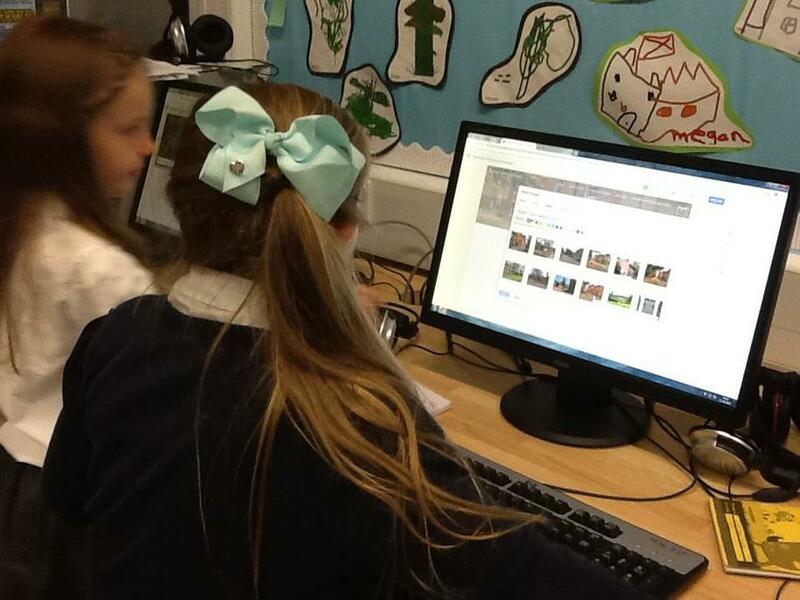 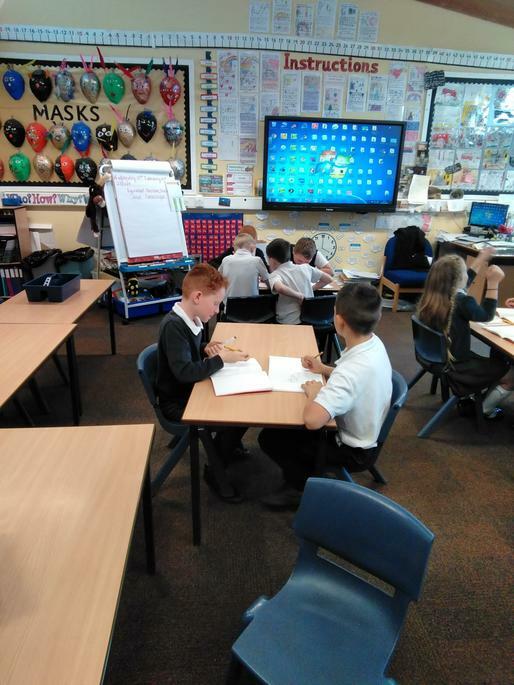 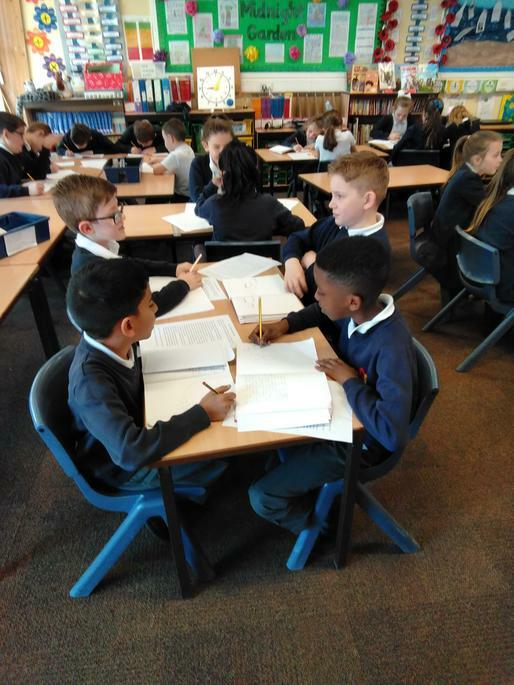 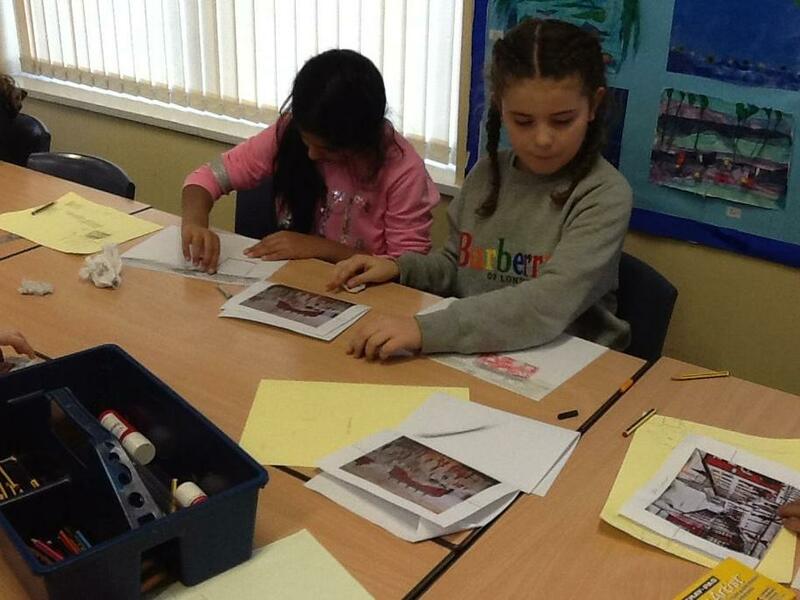 With a partner, we are using Google Docs to create a web-site about the Moravian Settlement in Droylsden. 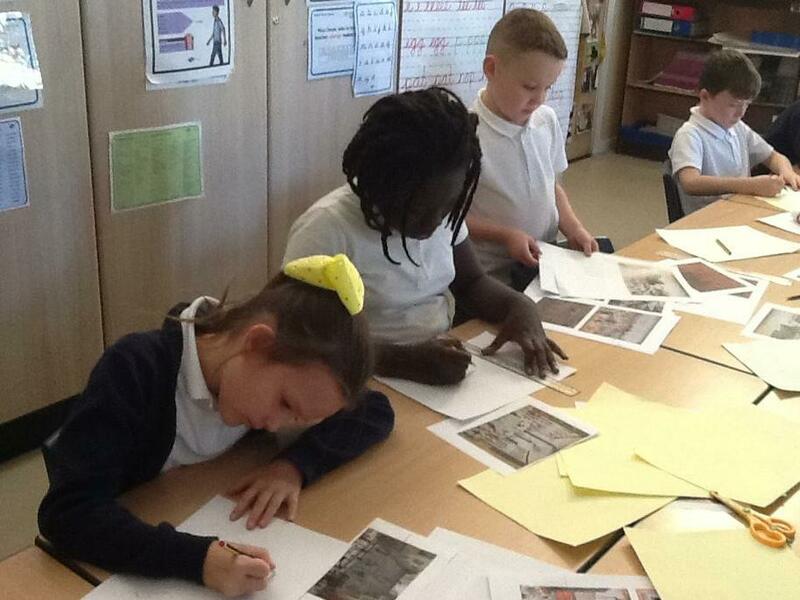 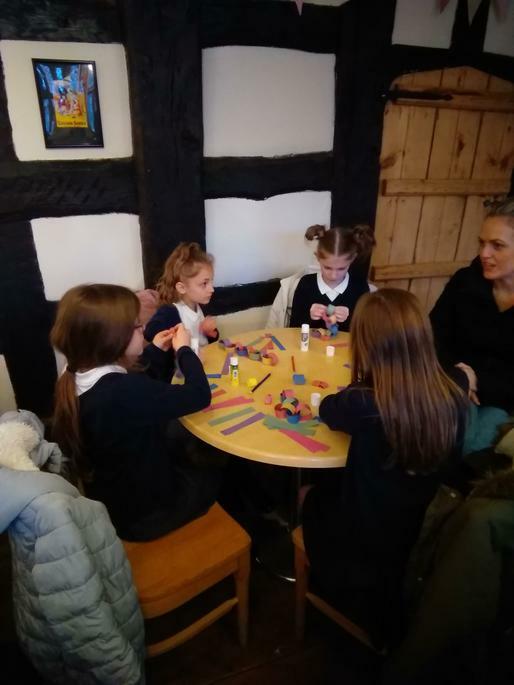 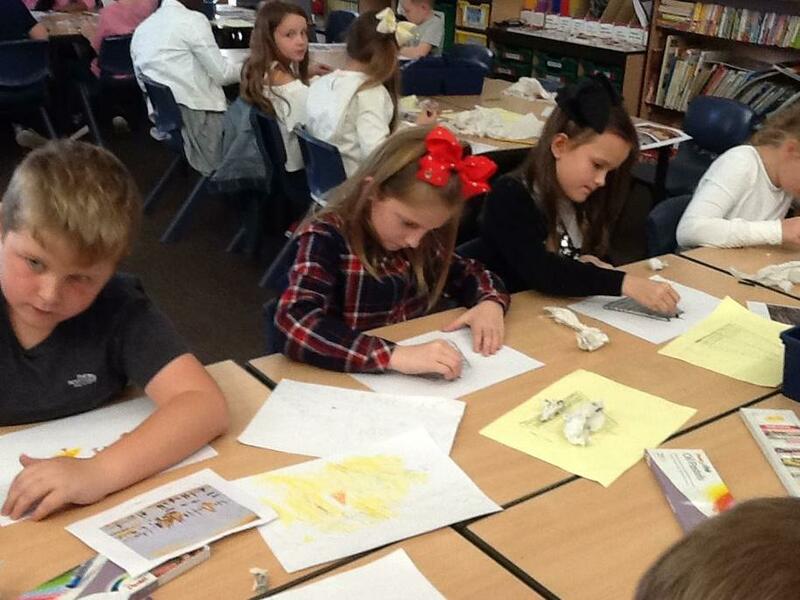 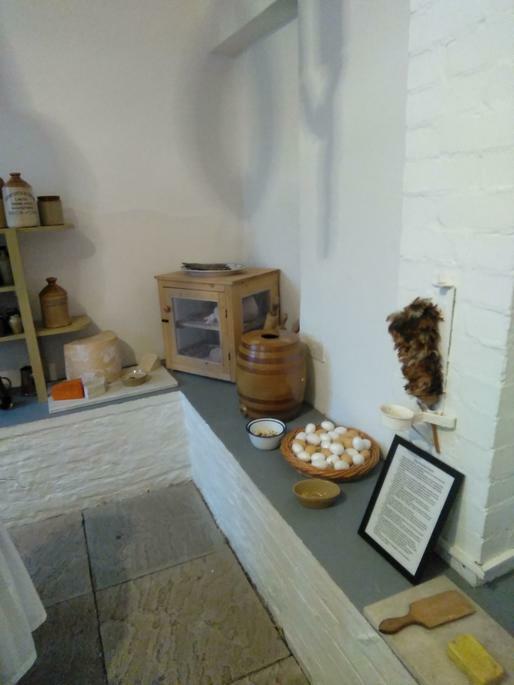 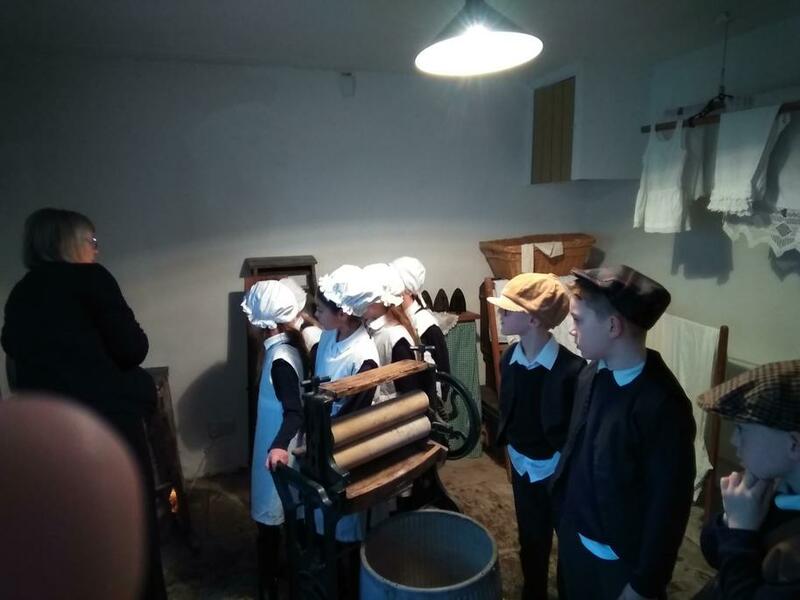 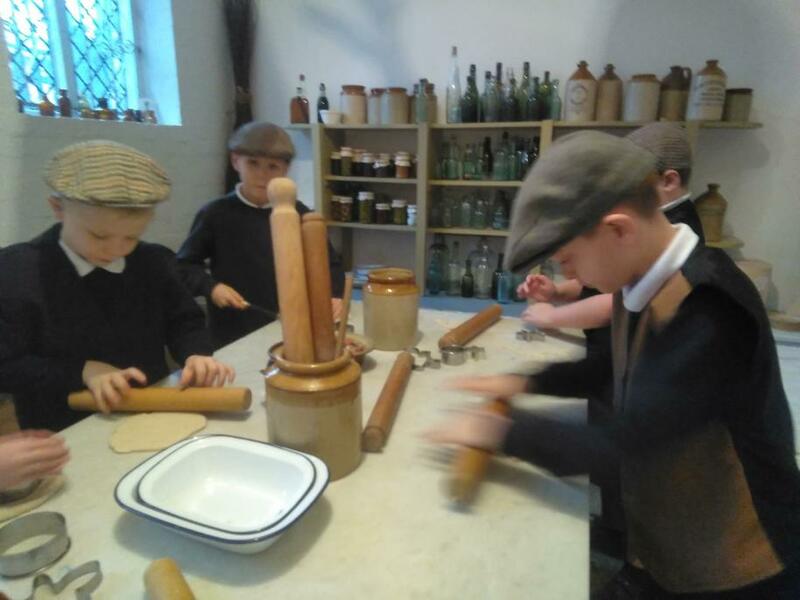 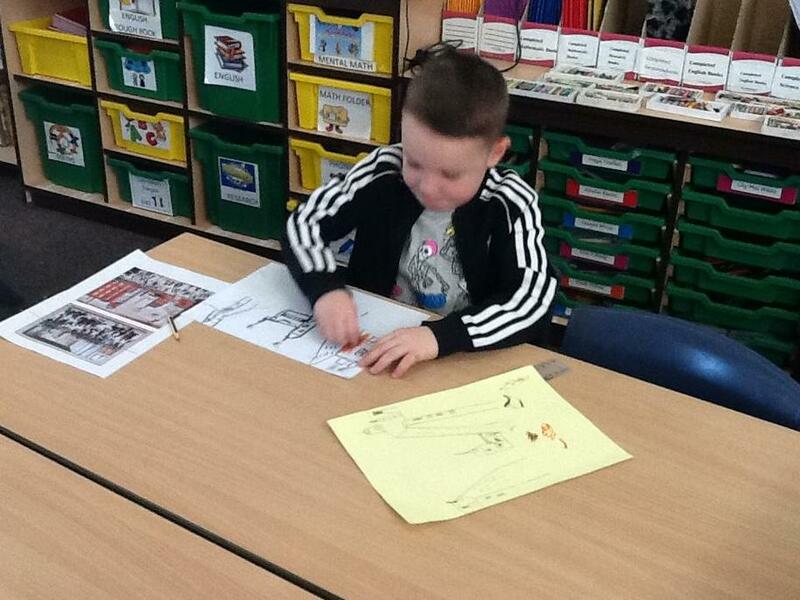 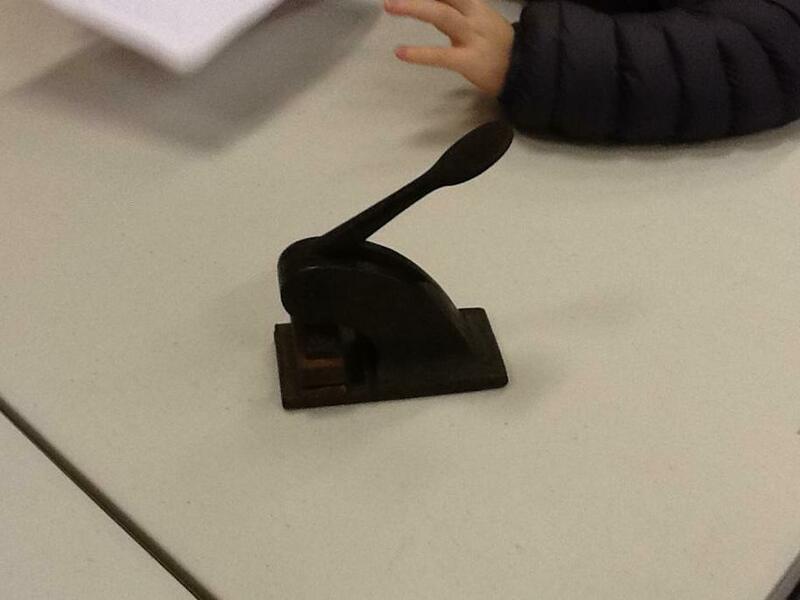 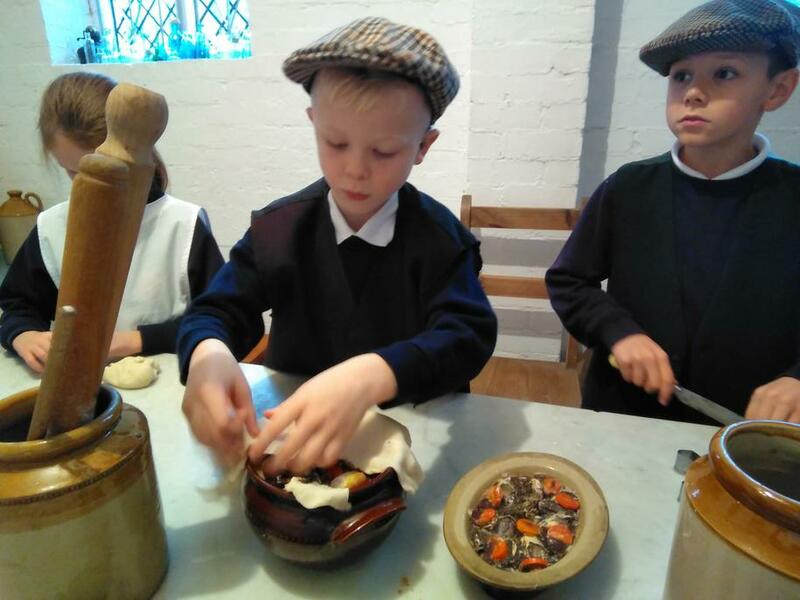 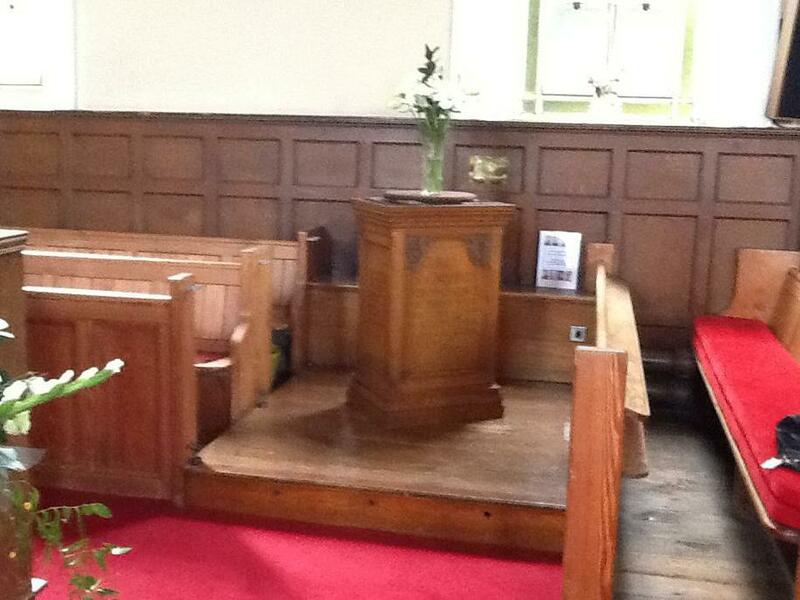 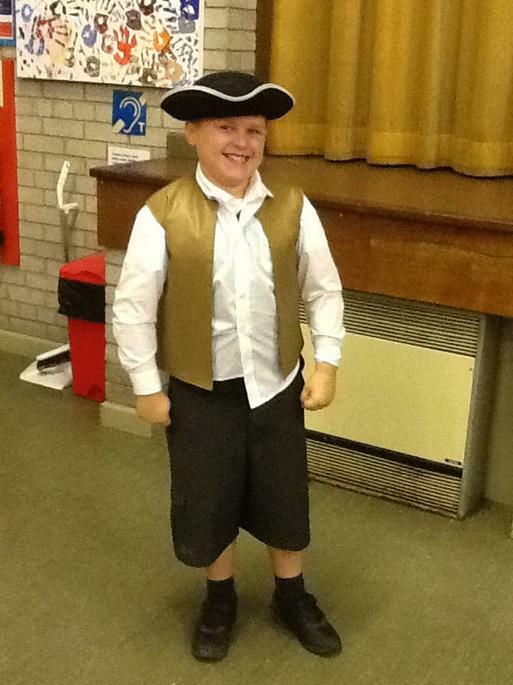 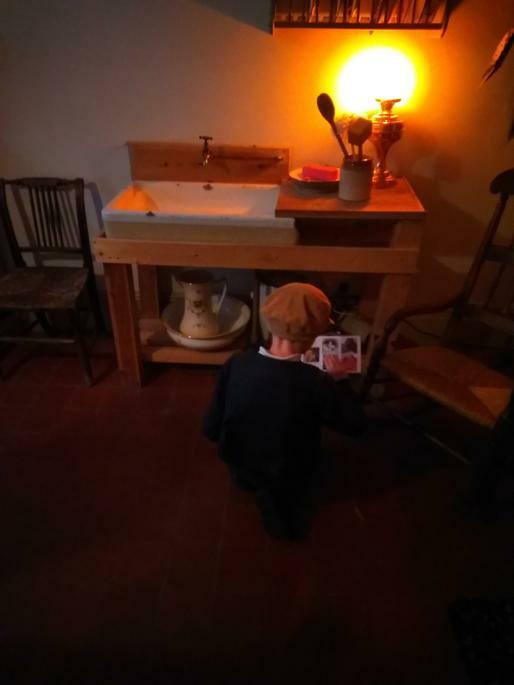 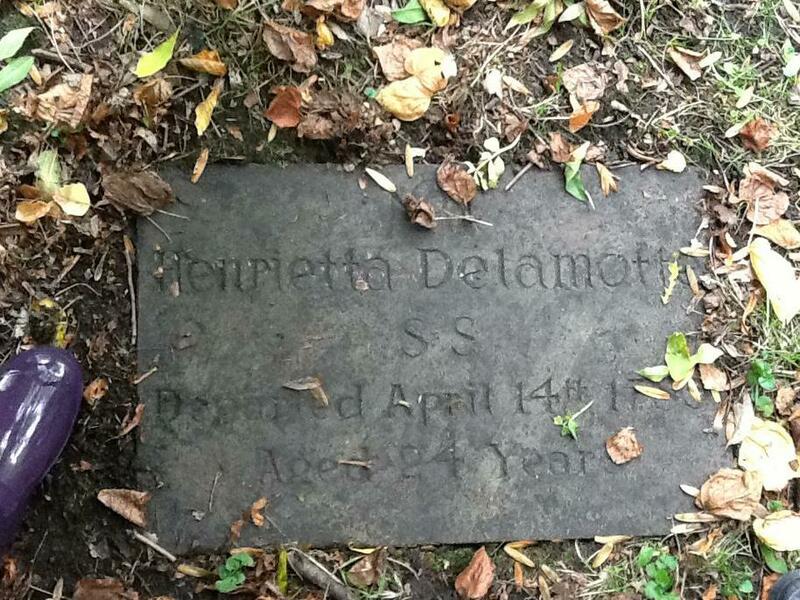 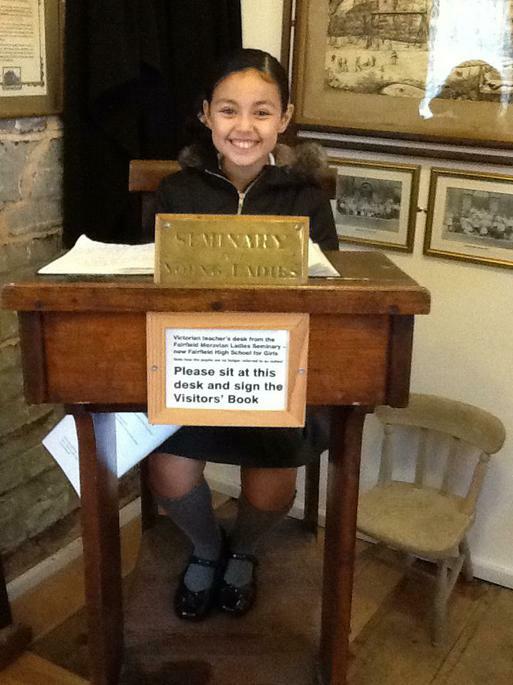 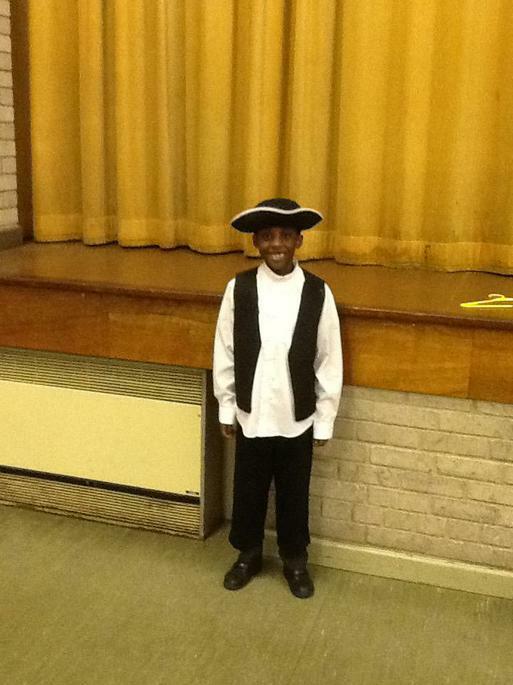 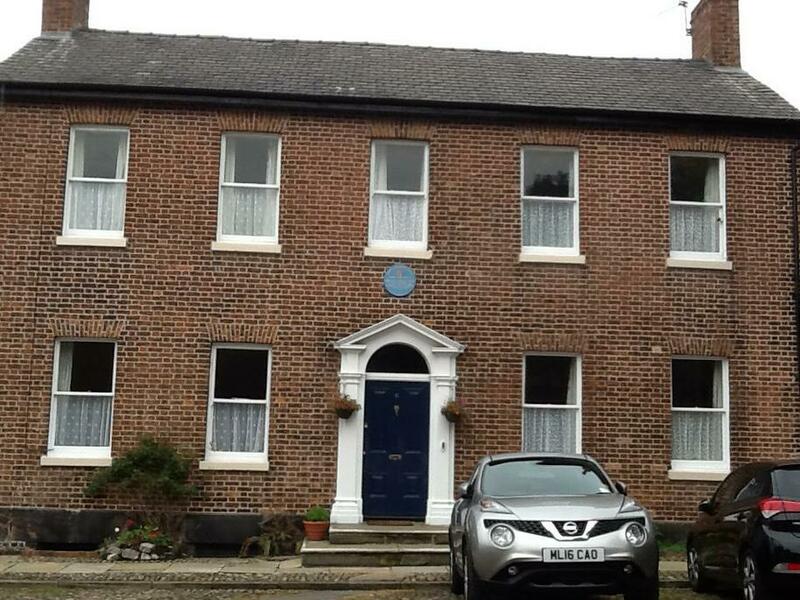 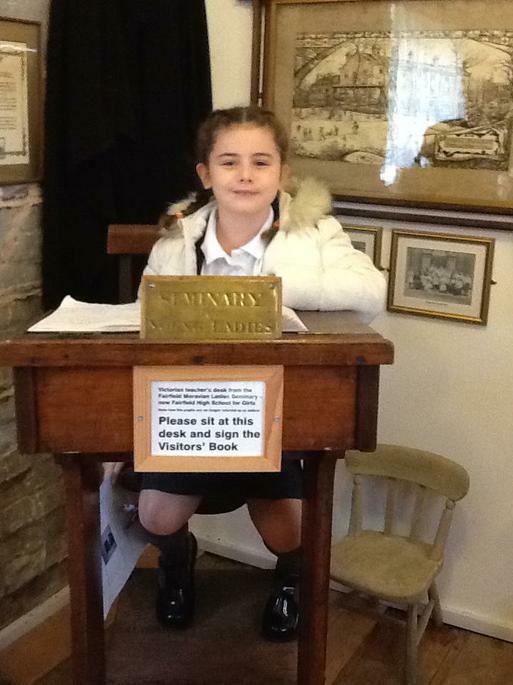 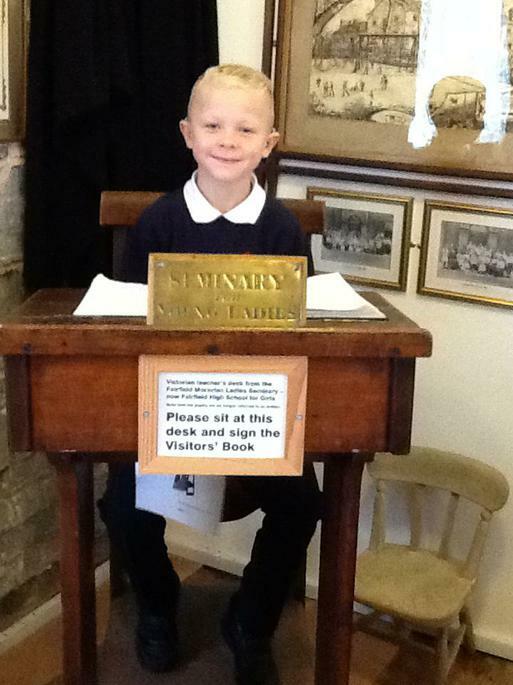 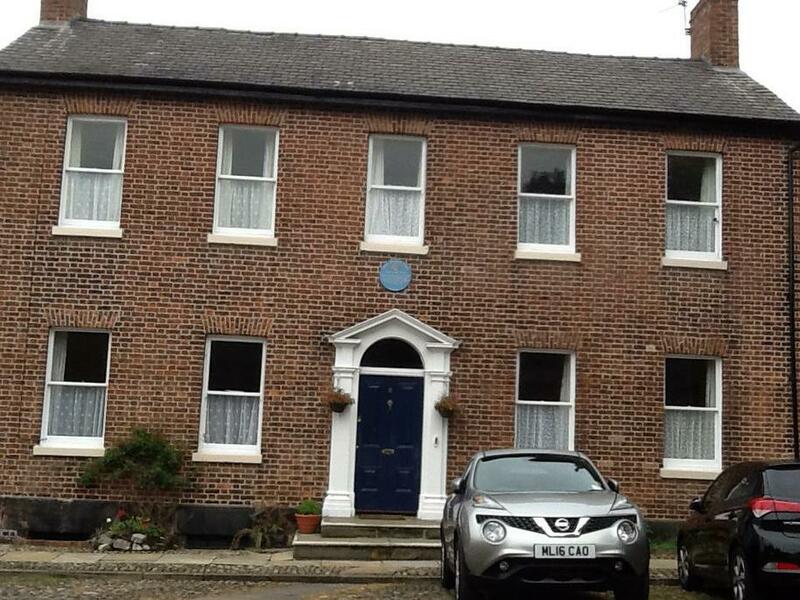 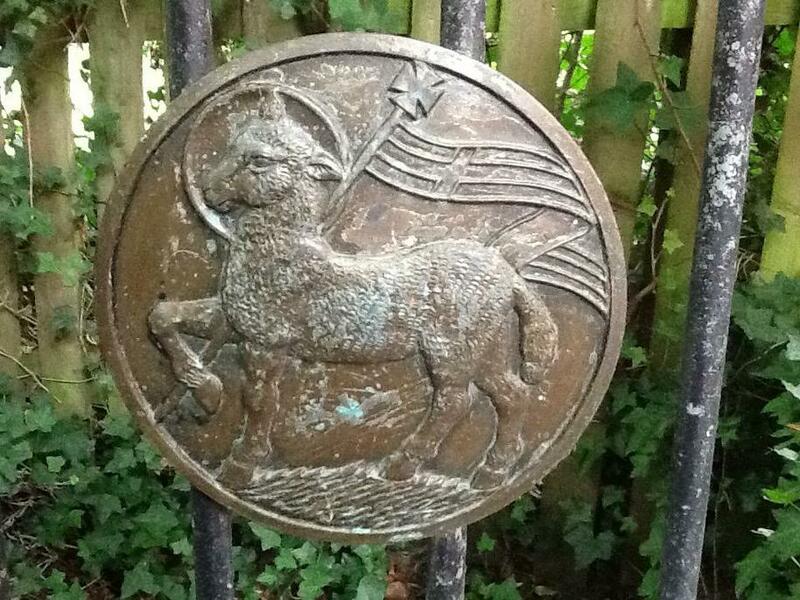 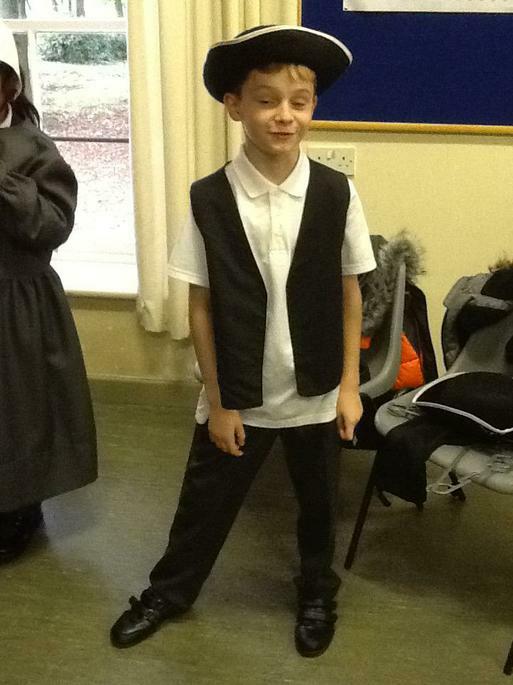 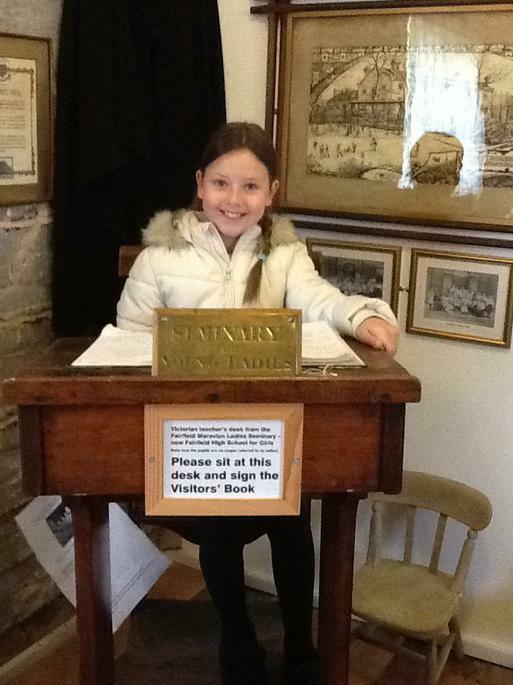 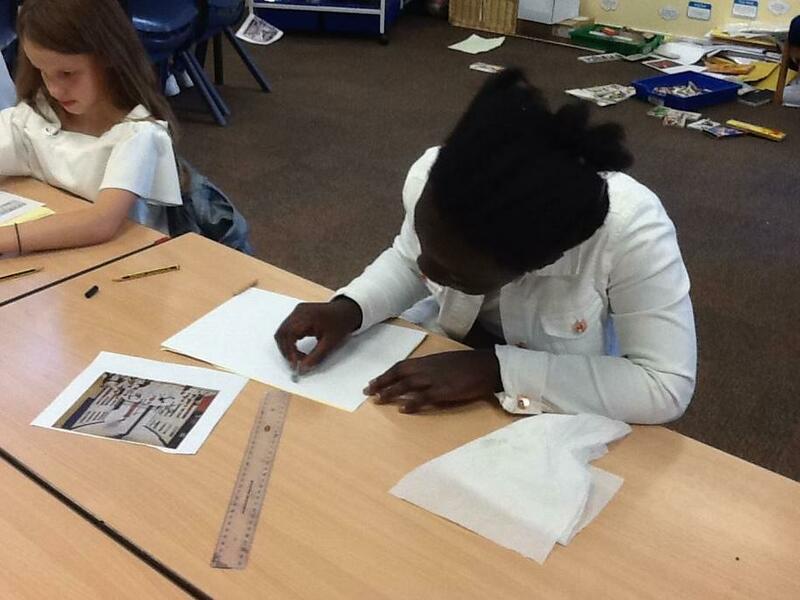 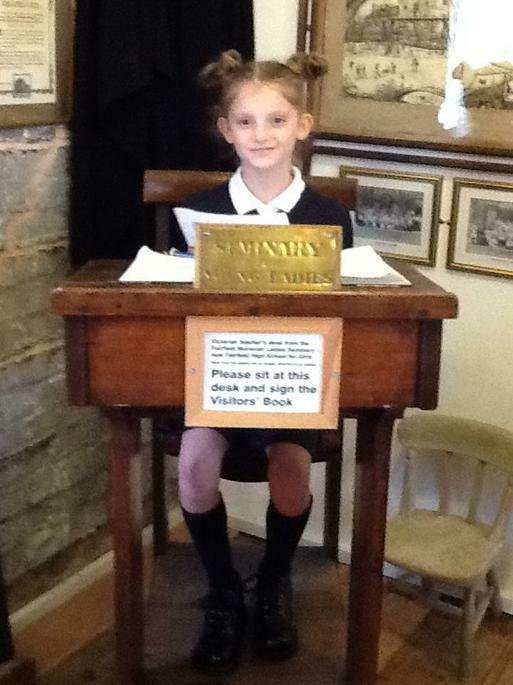 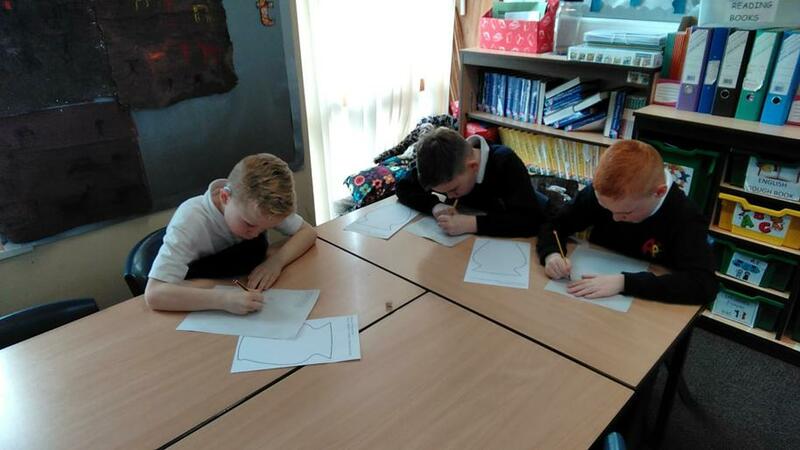 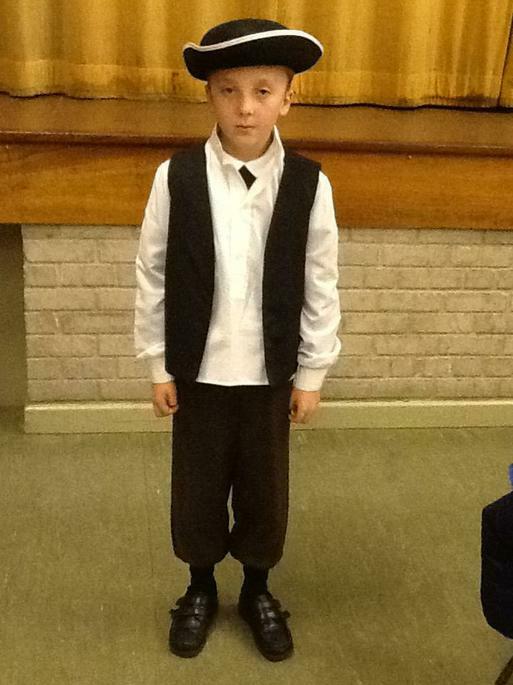 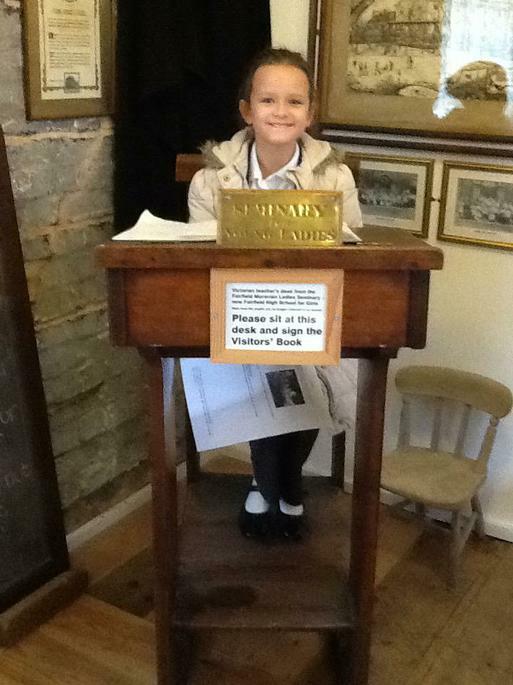 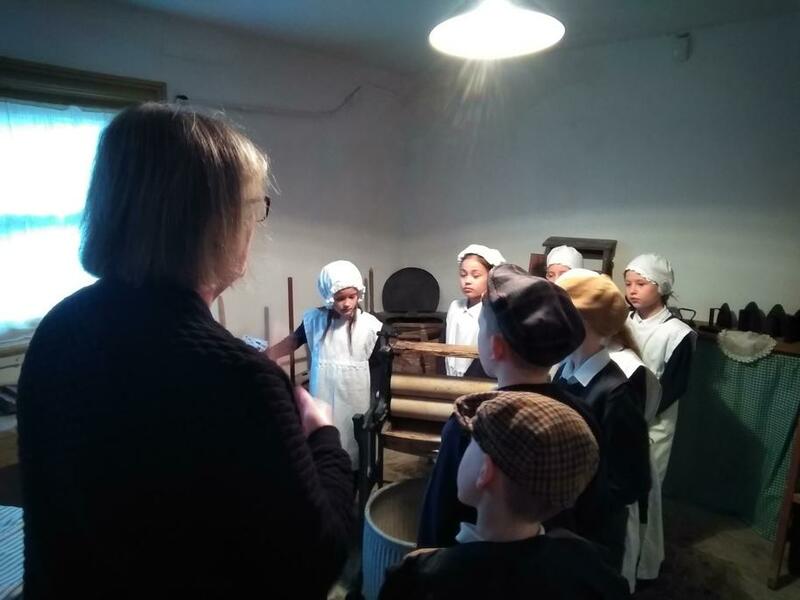 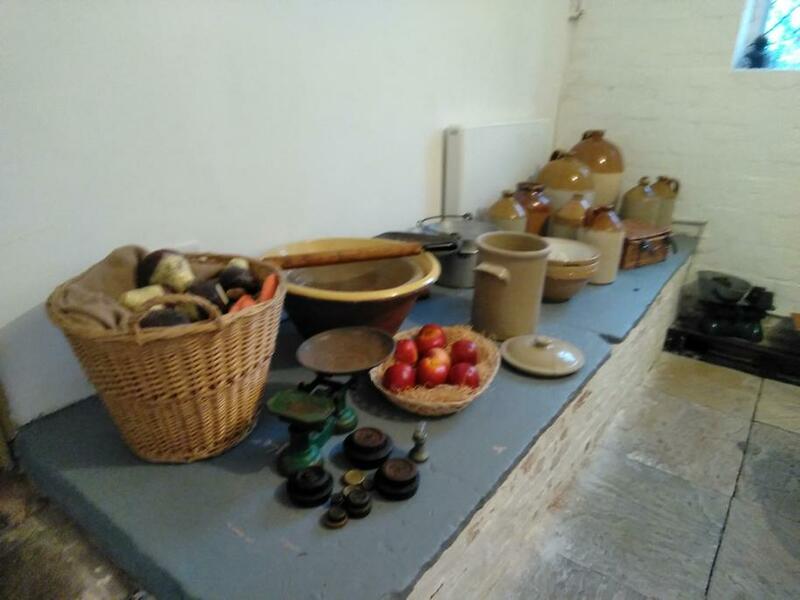 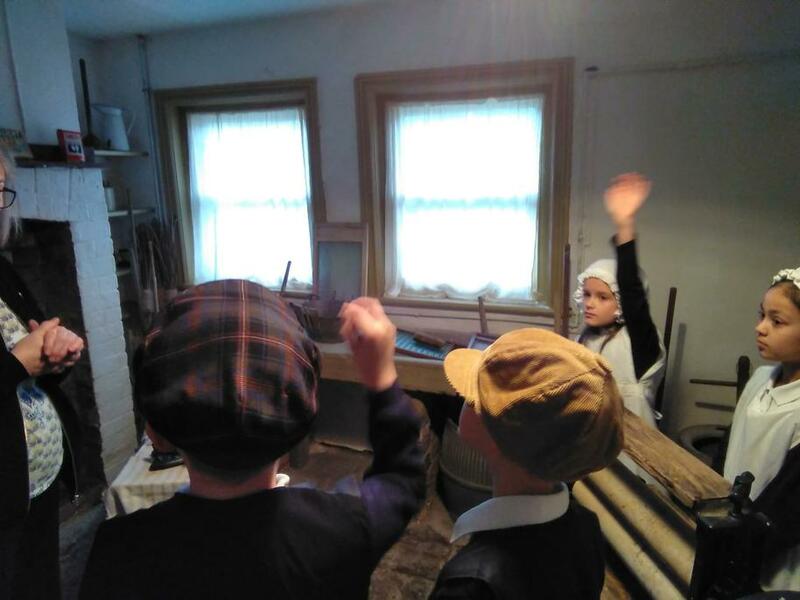 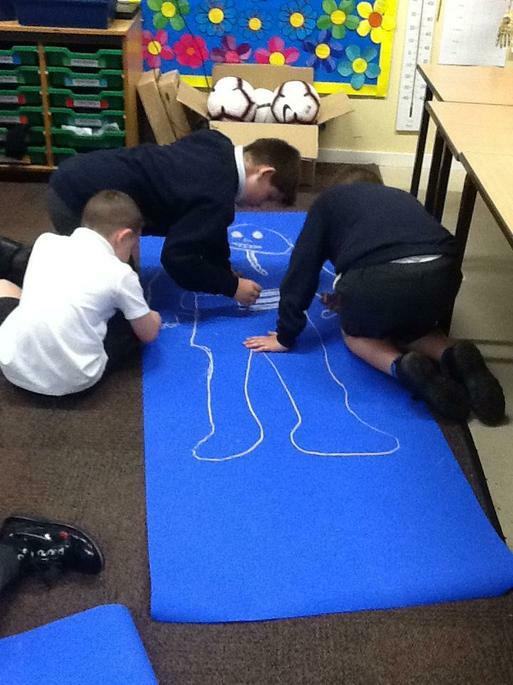 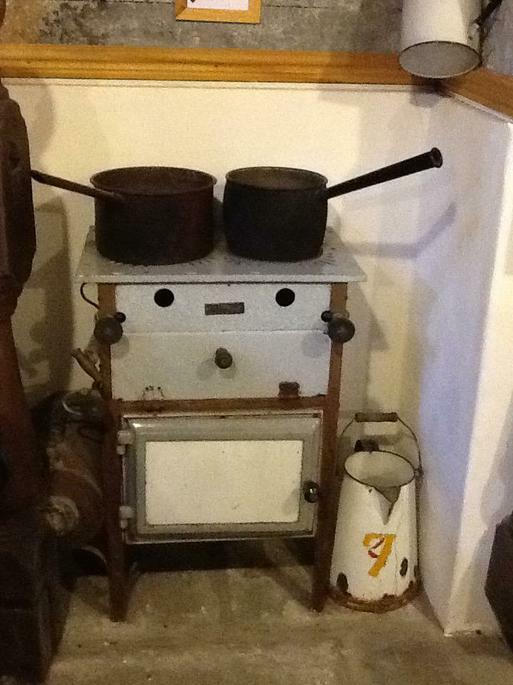 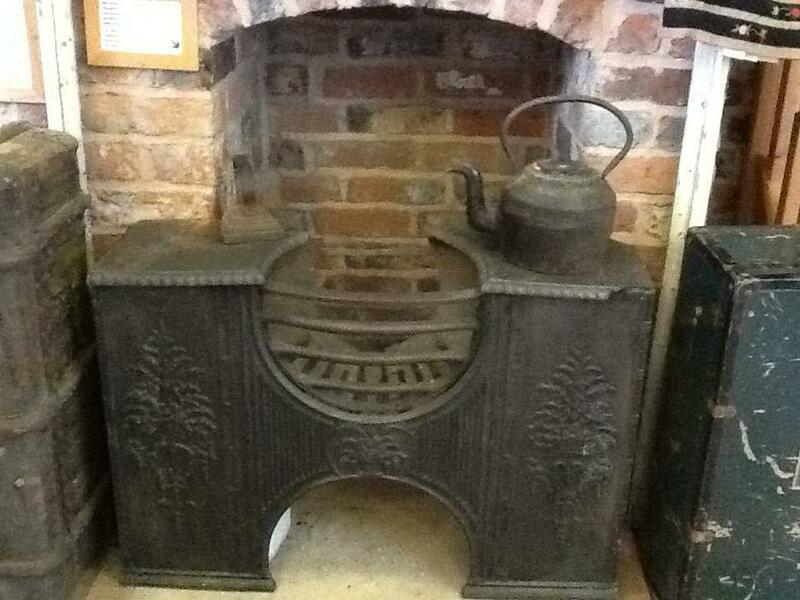 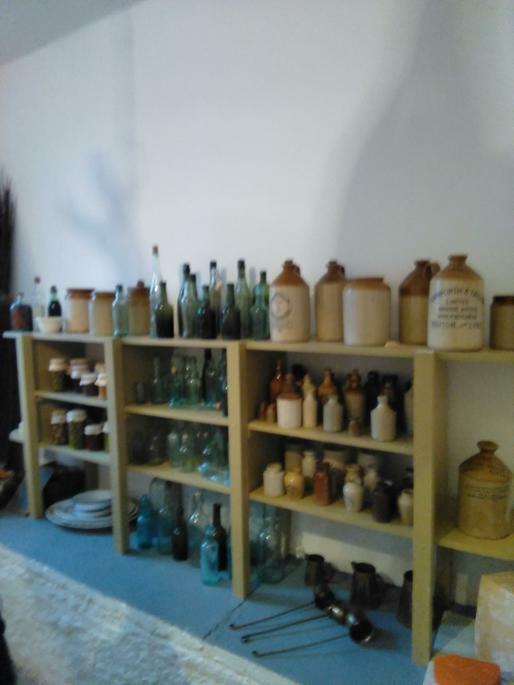 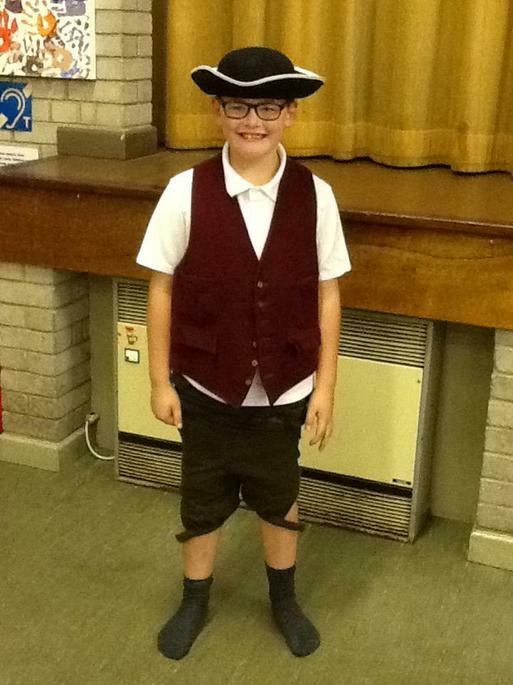 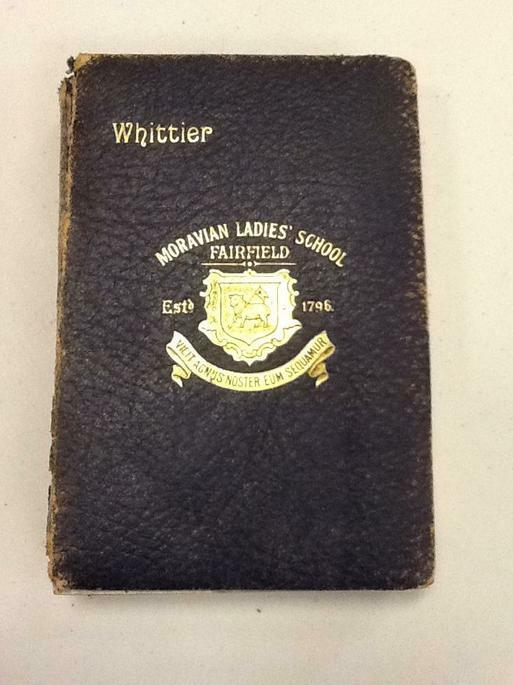 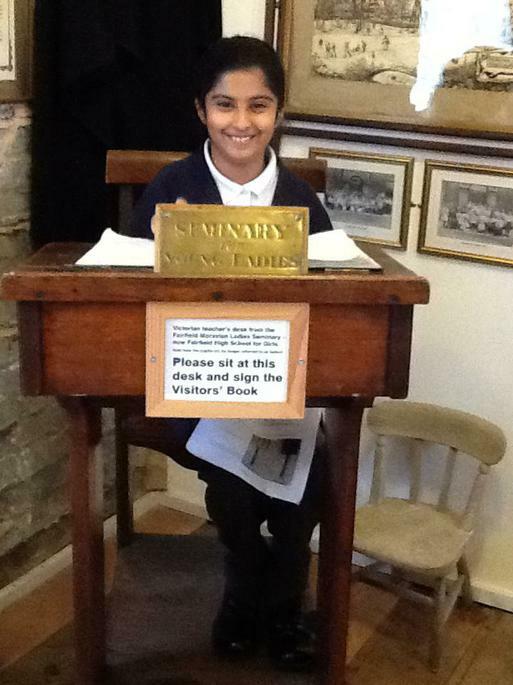 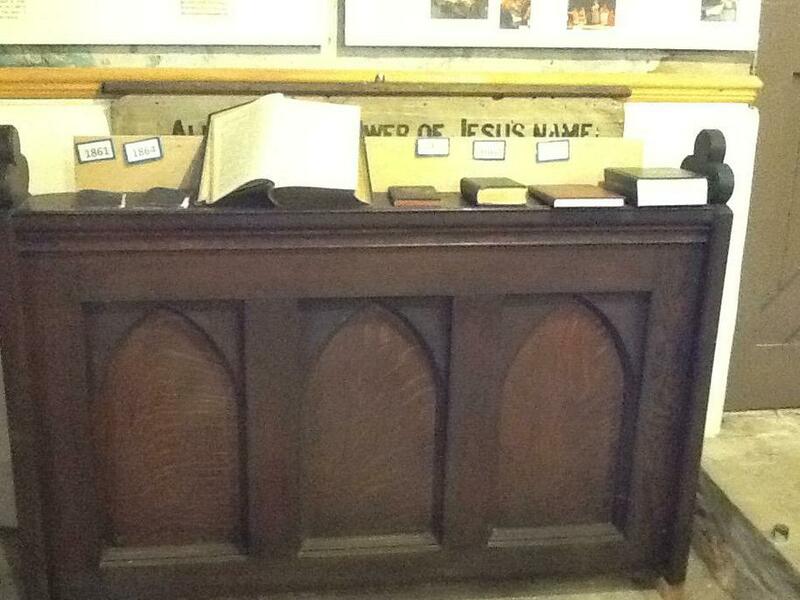 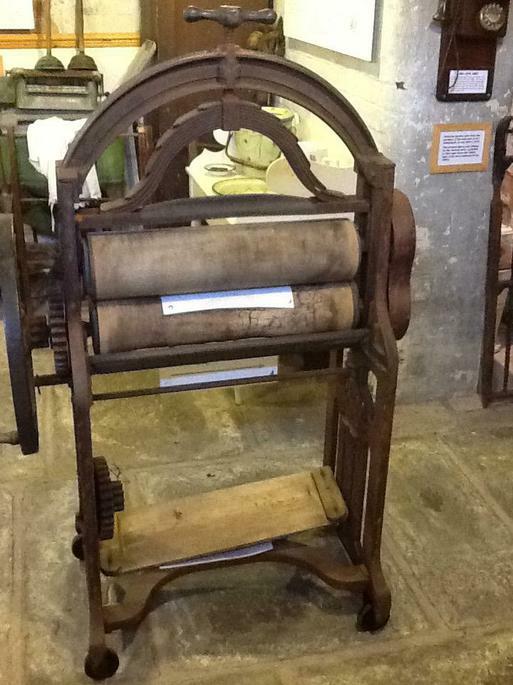 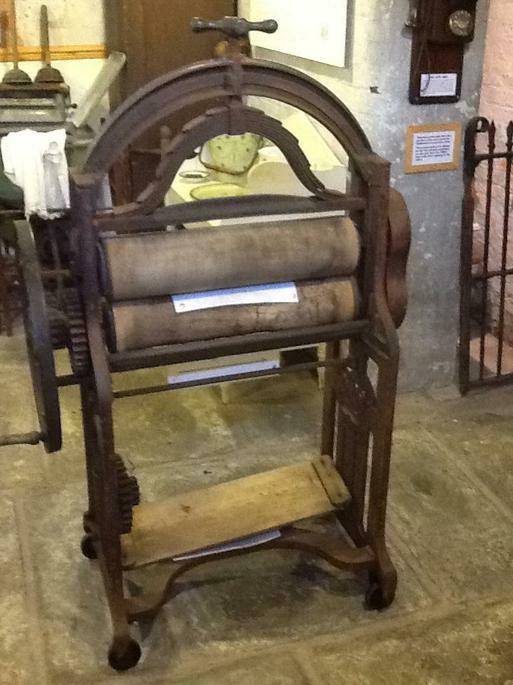 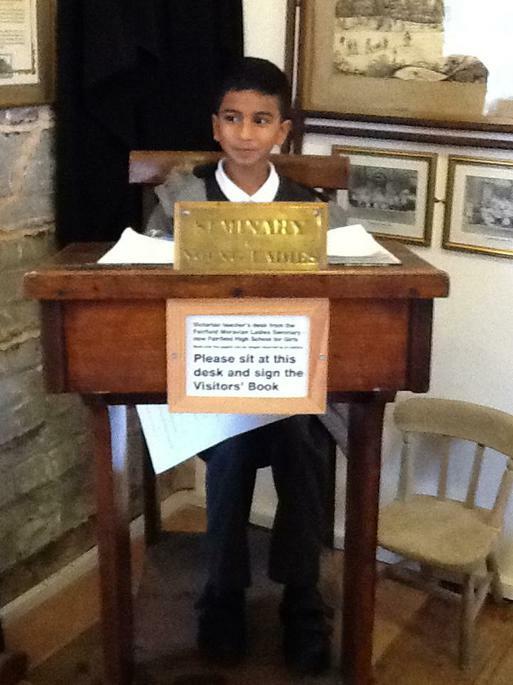 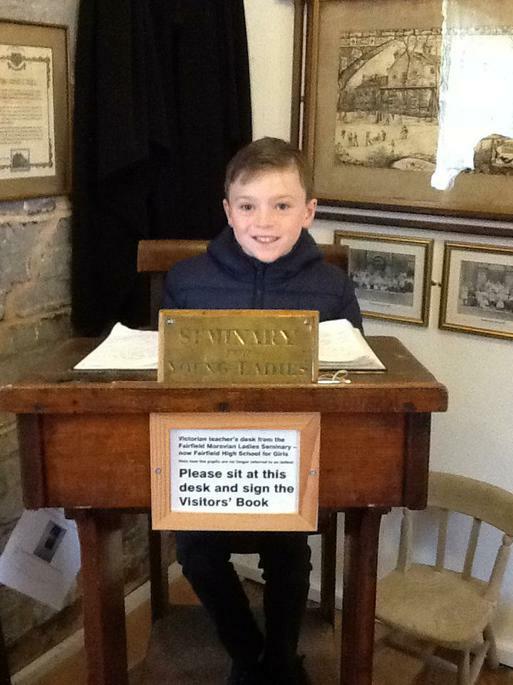 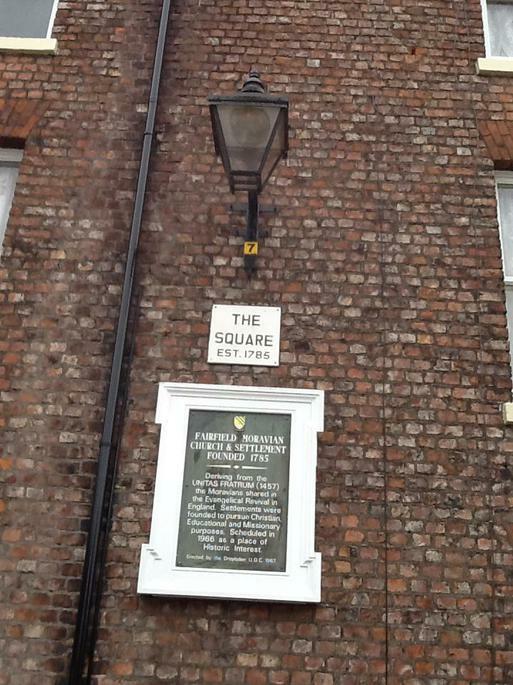 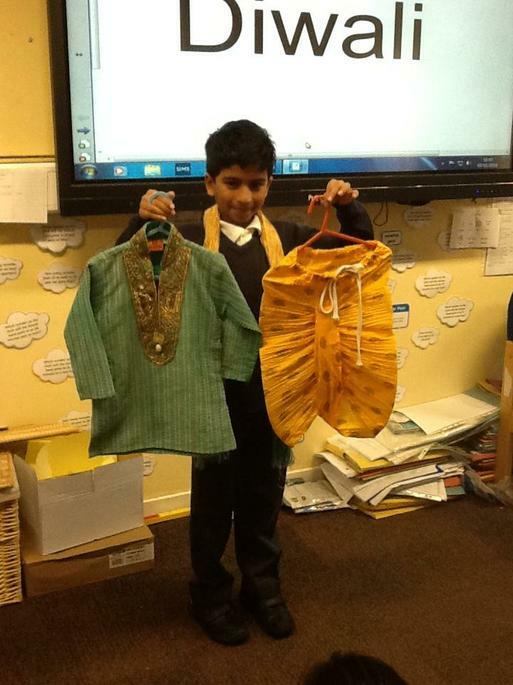 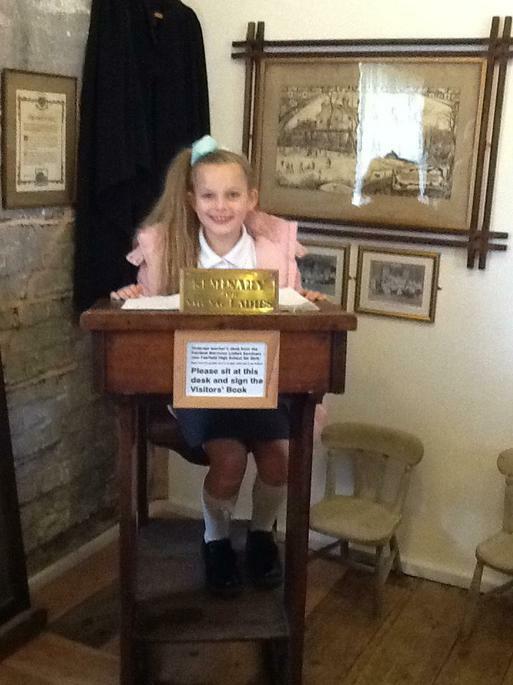 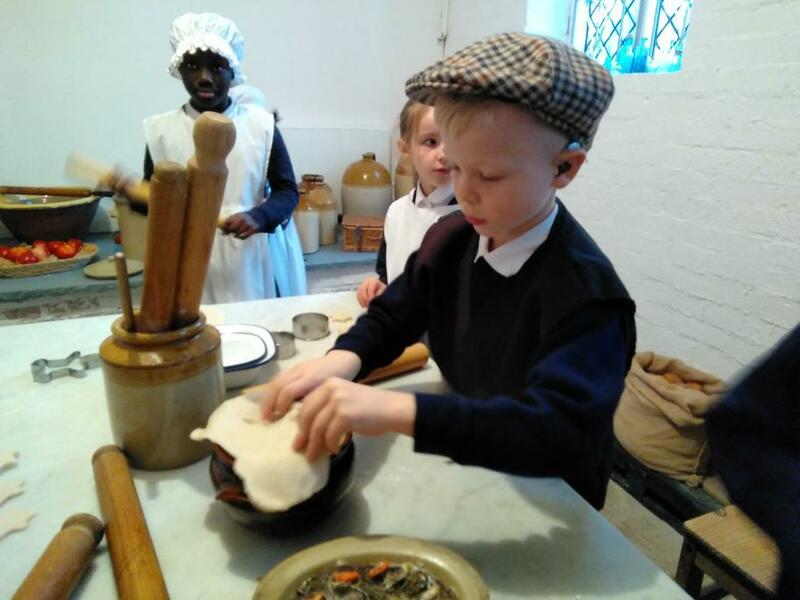 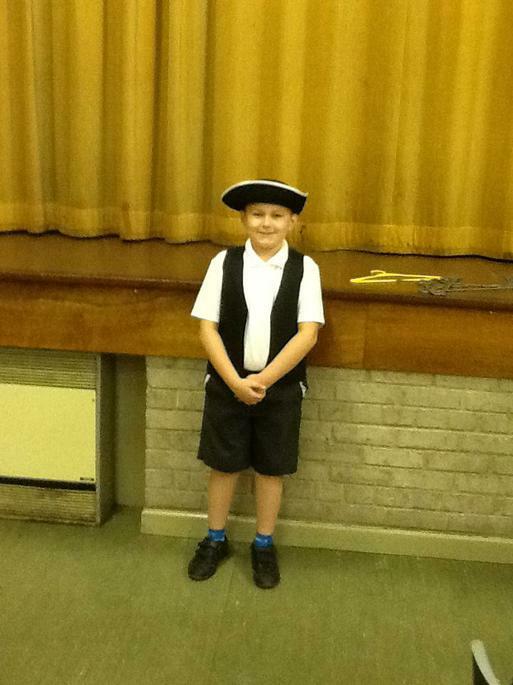 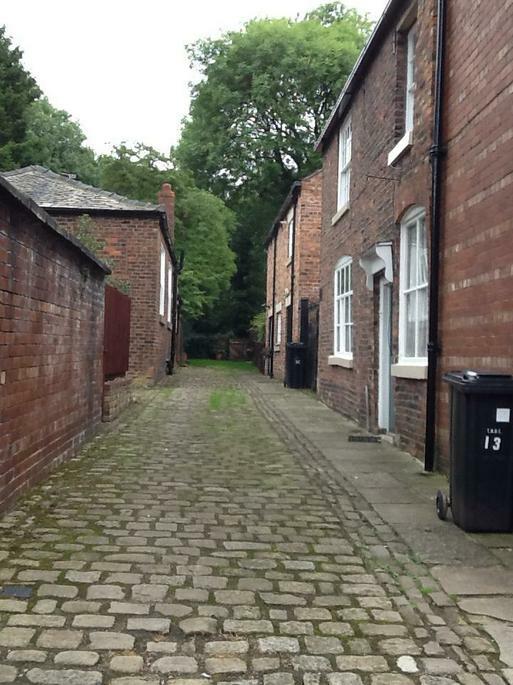 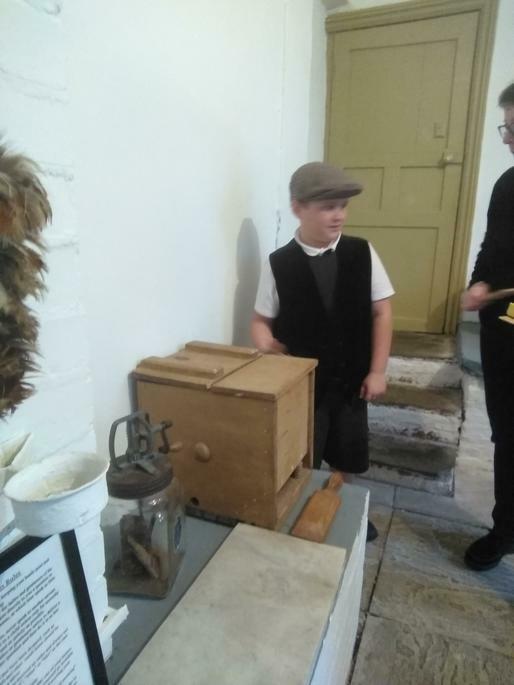 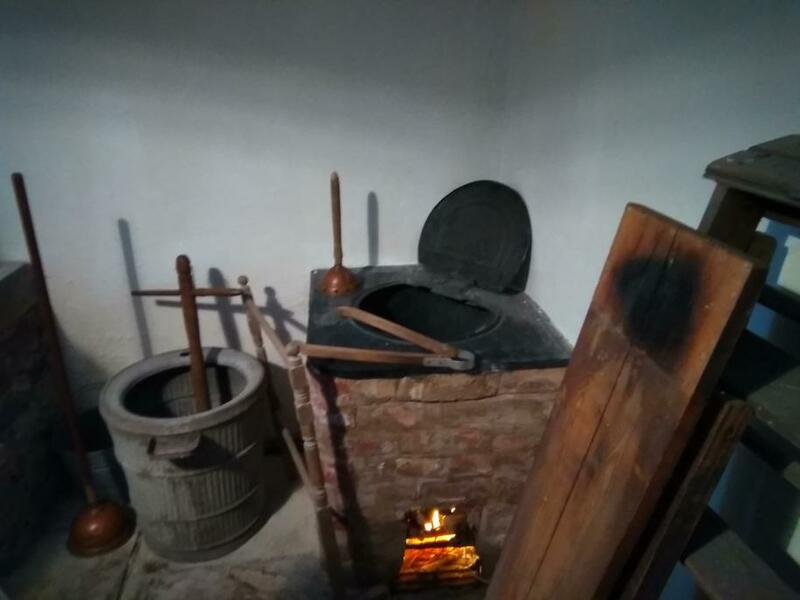 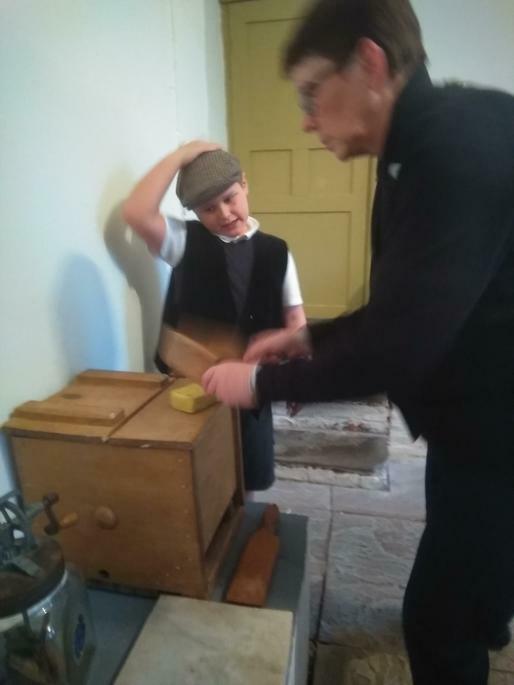 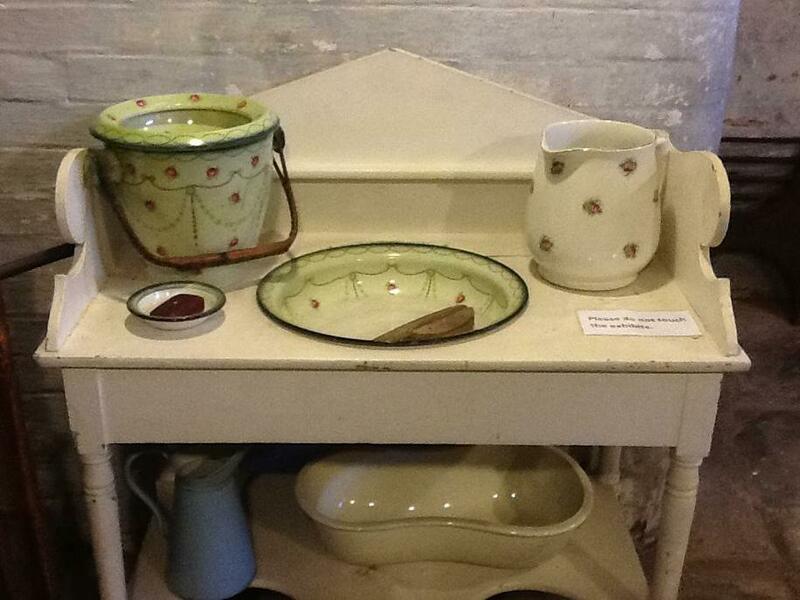 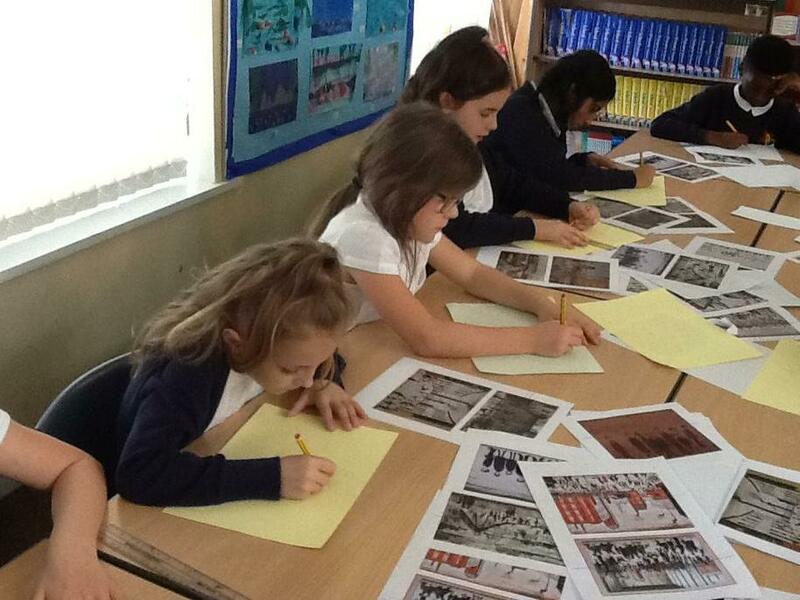 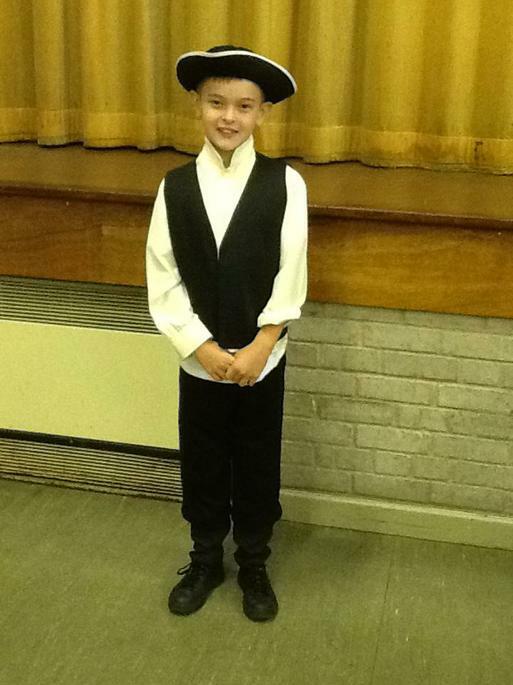 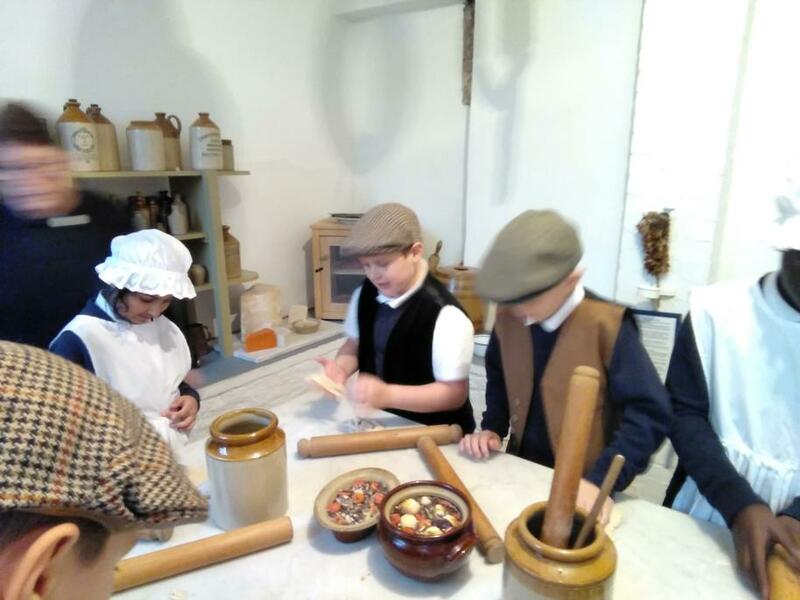 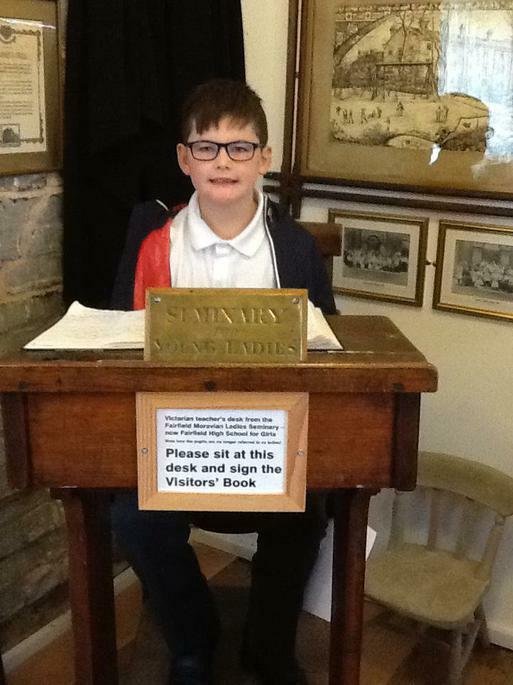 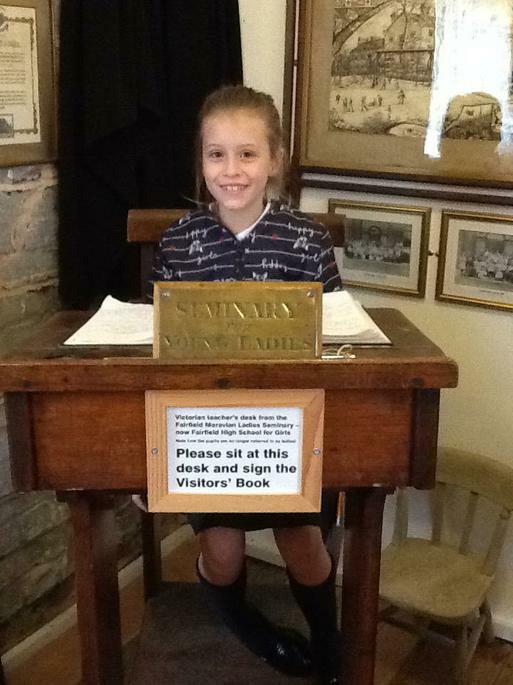 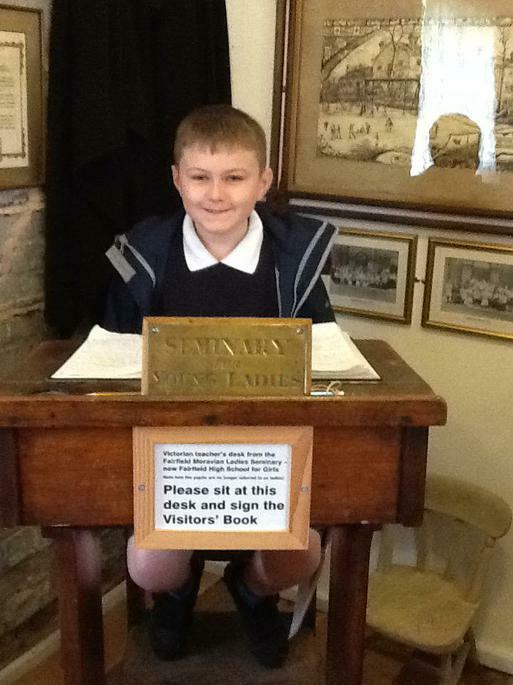 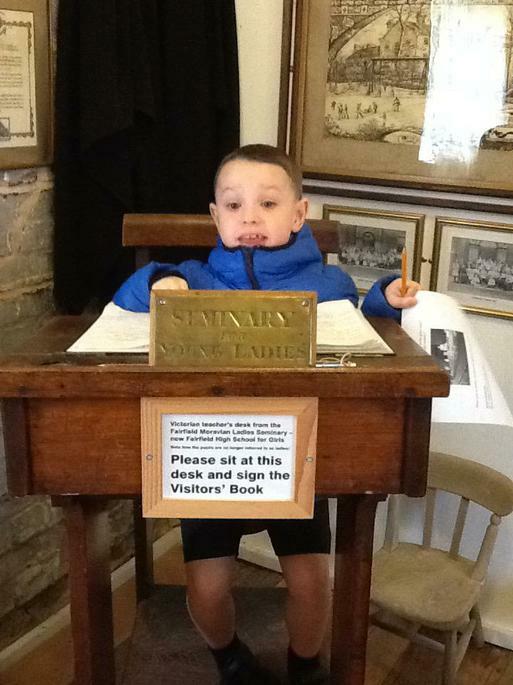 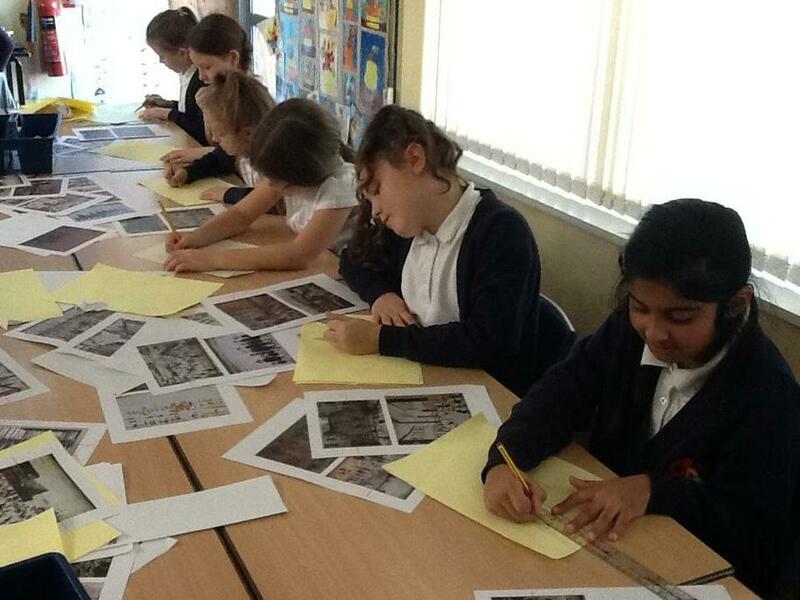 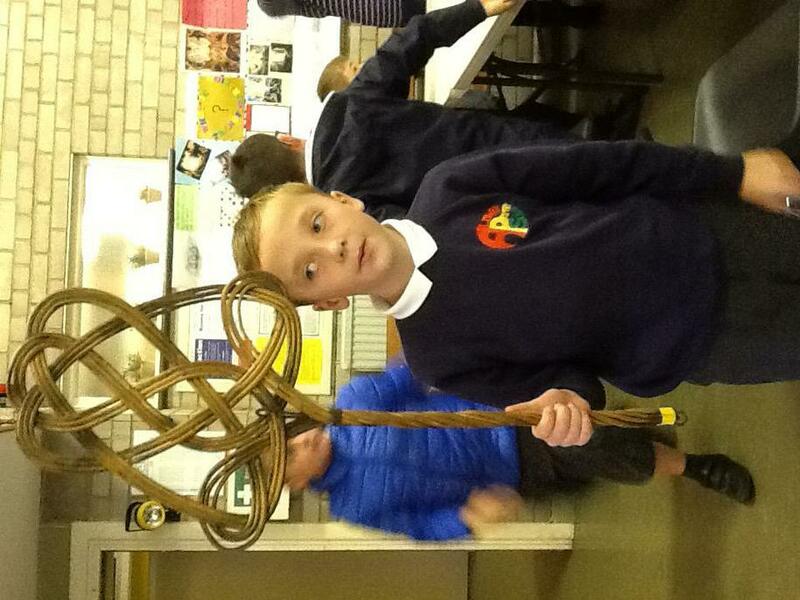 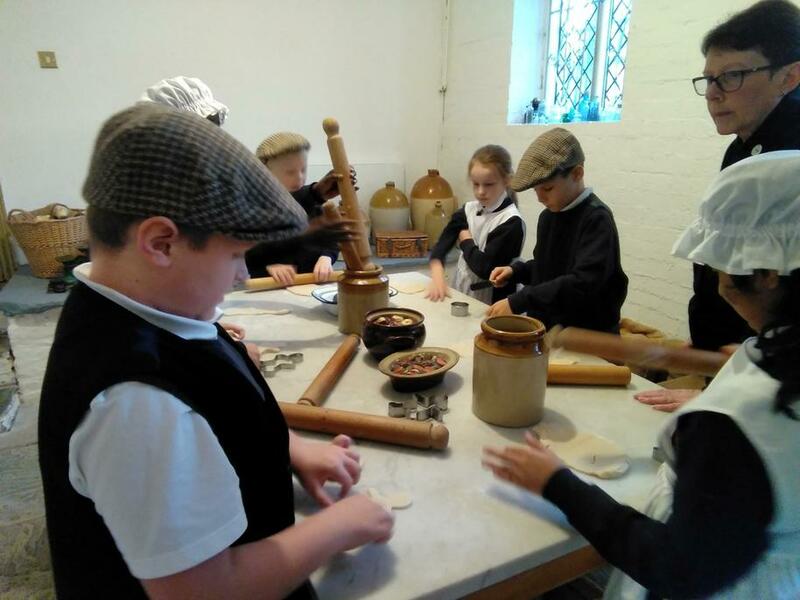 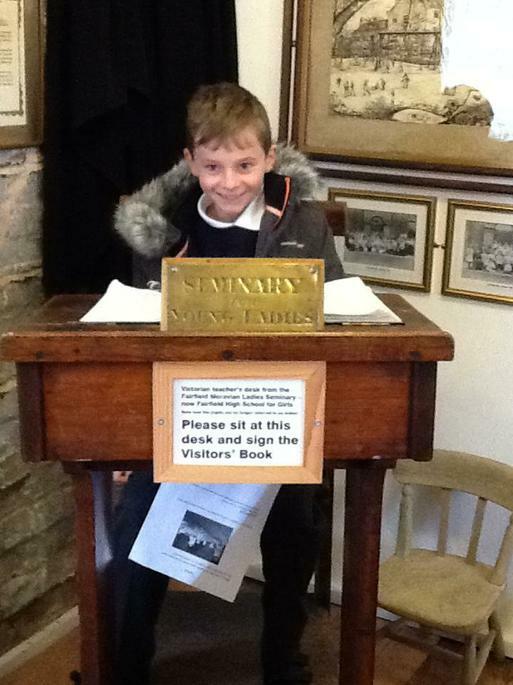 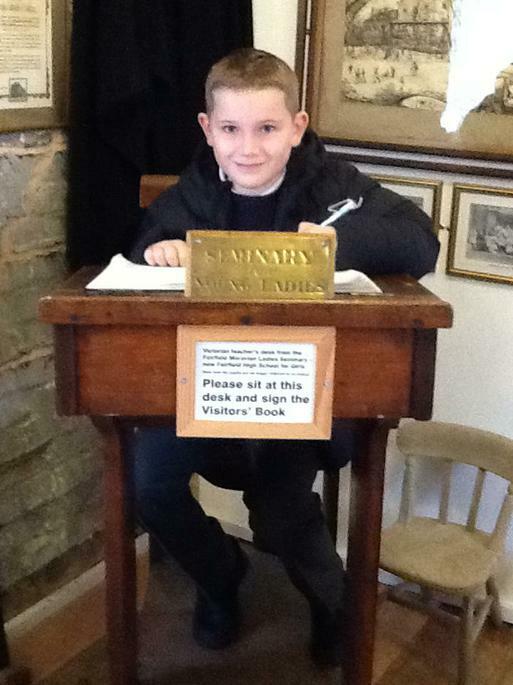 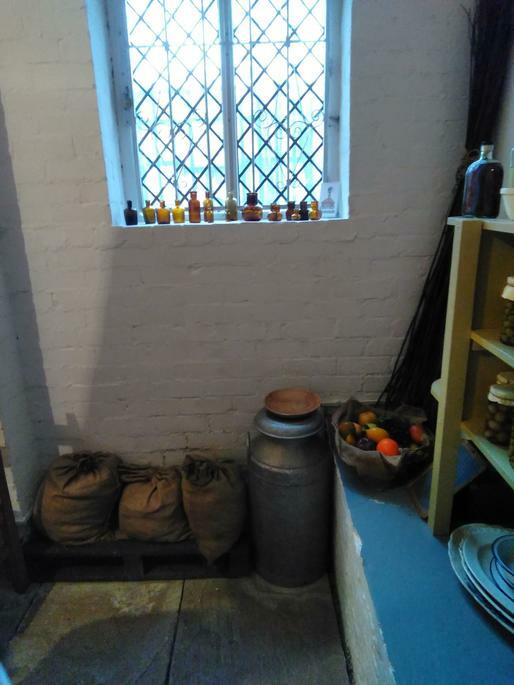 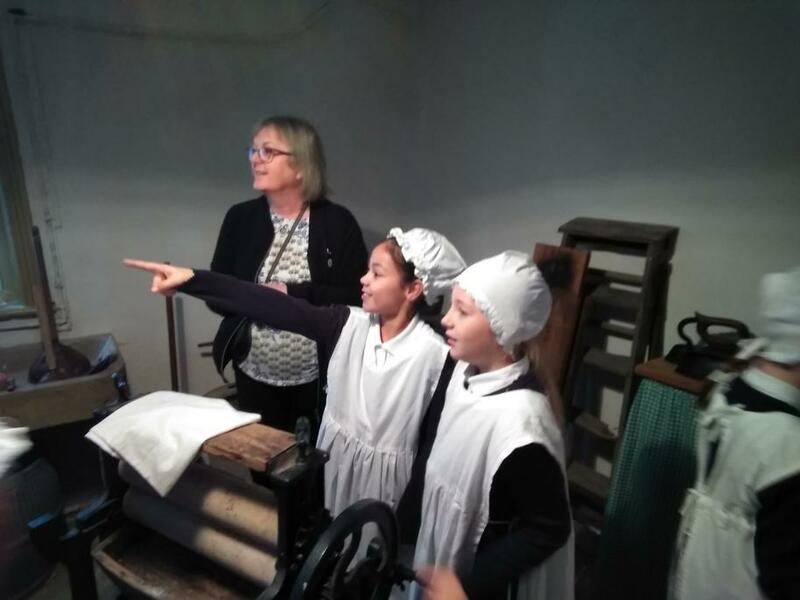 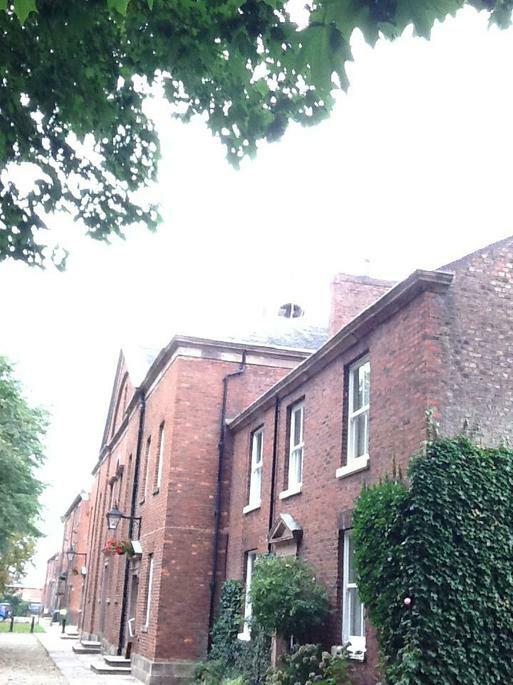 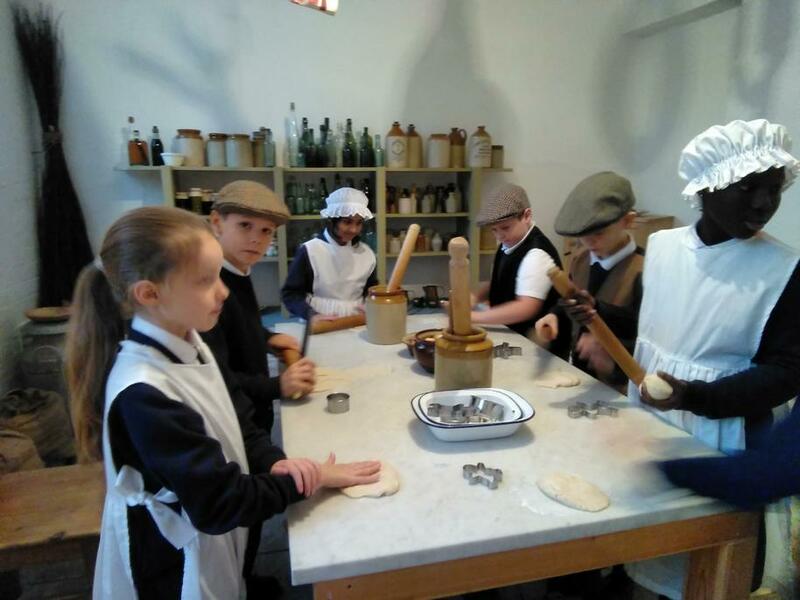 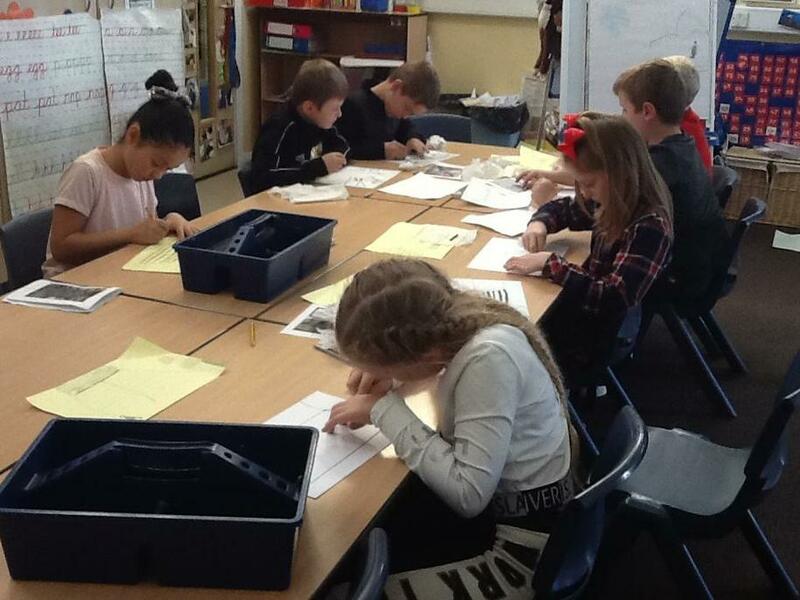 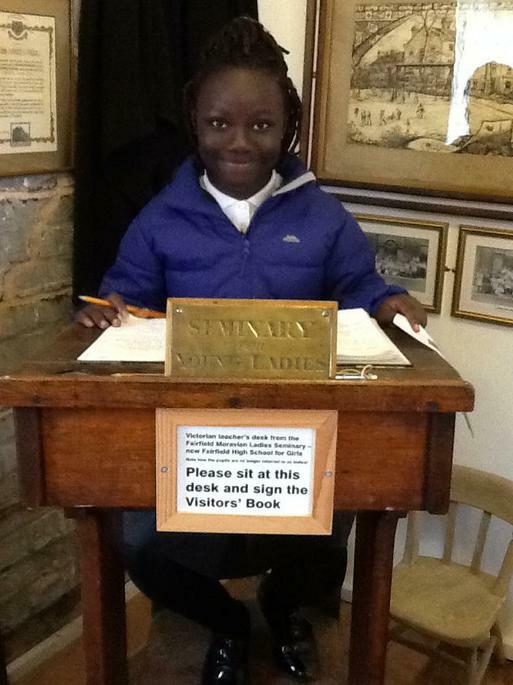 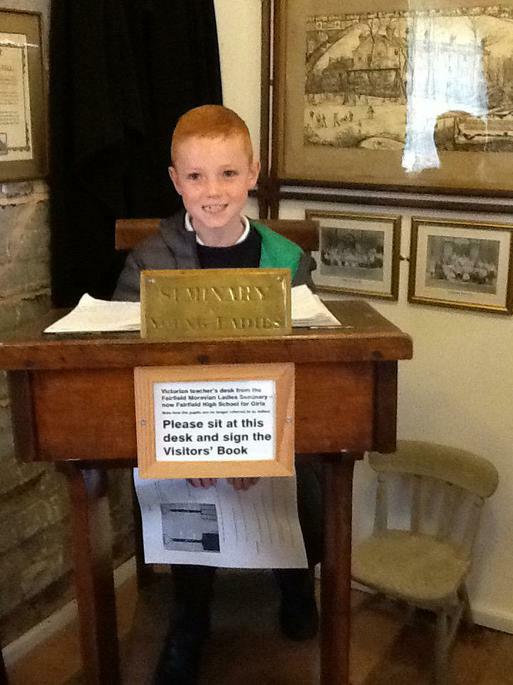 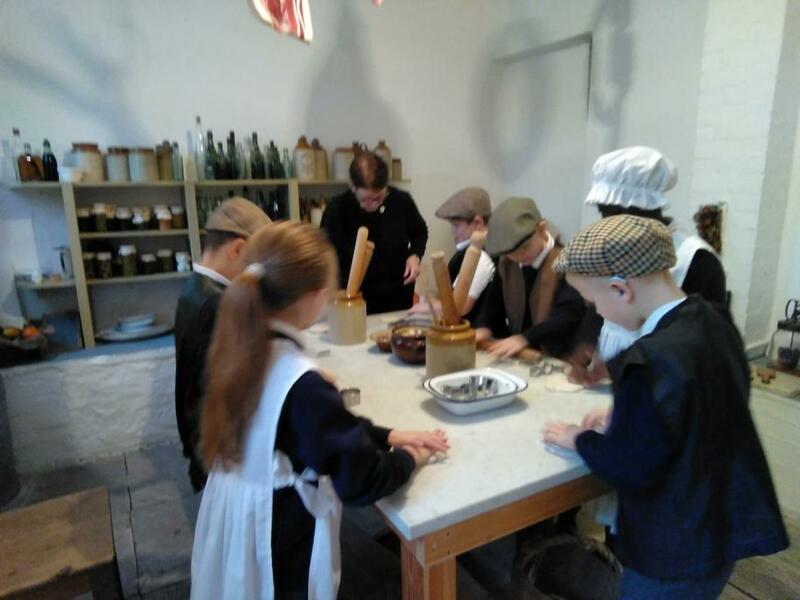 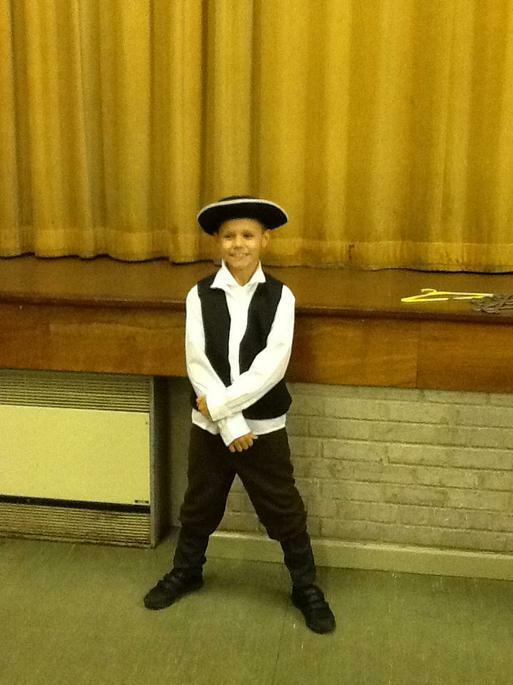 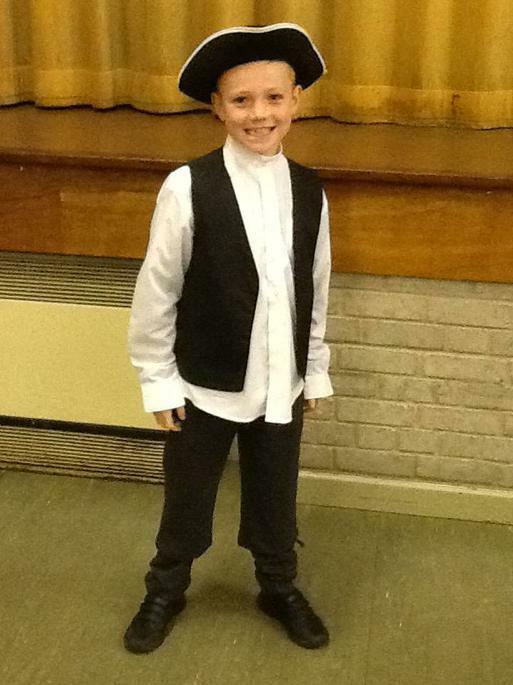 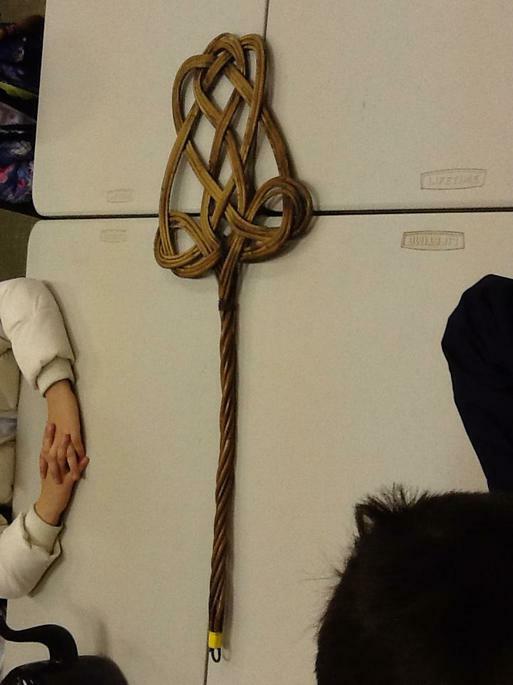 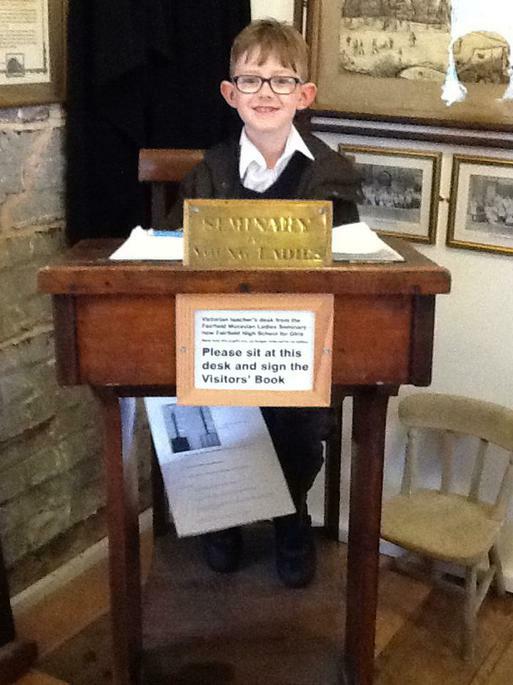 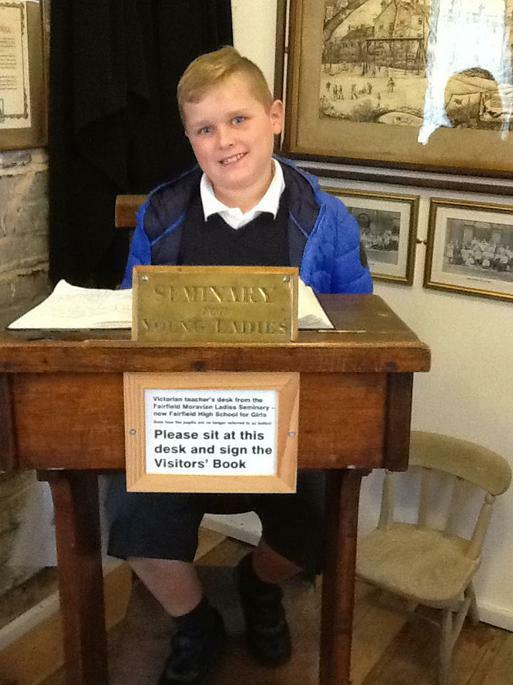 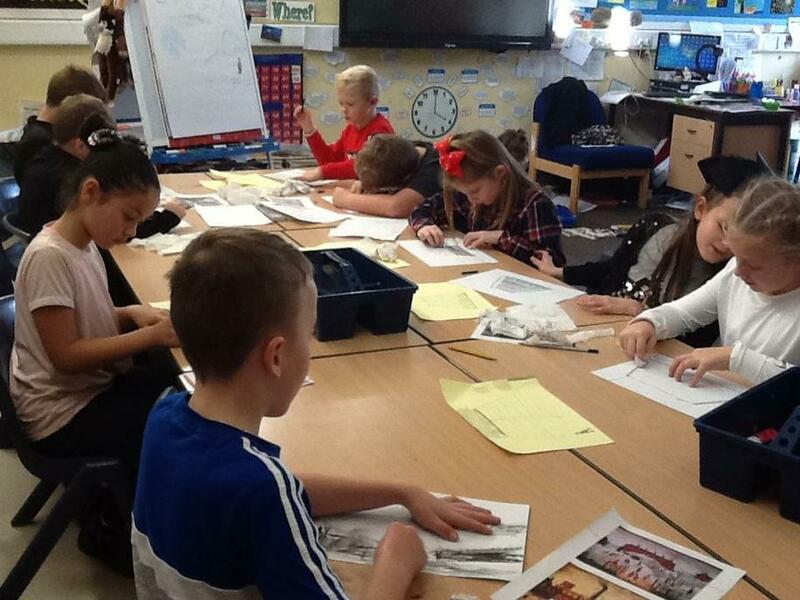 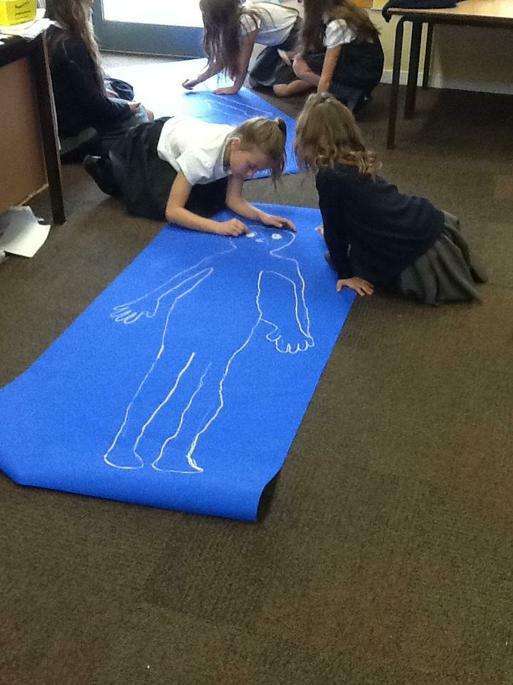 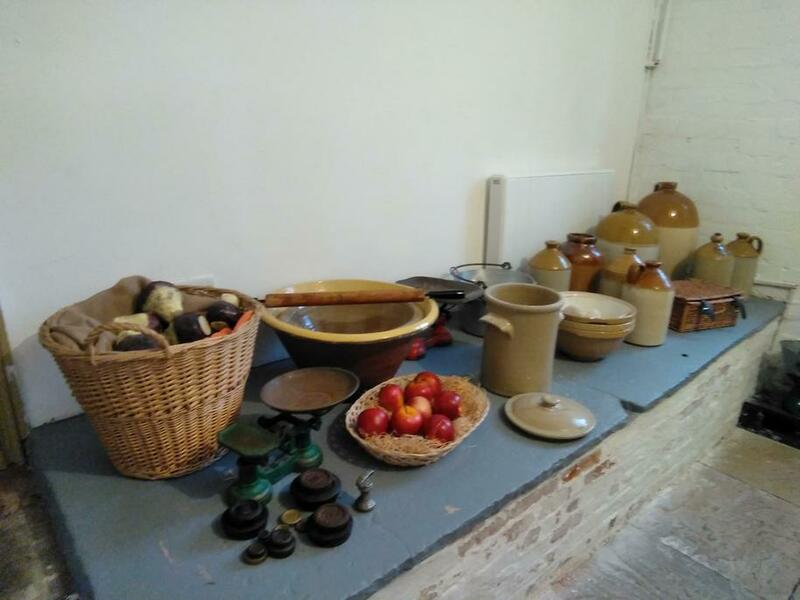 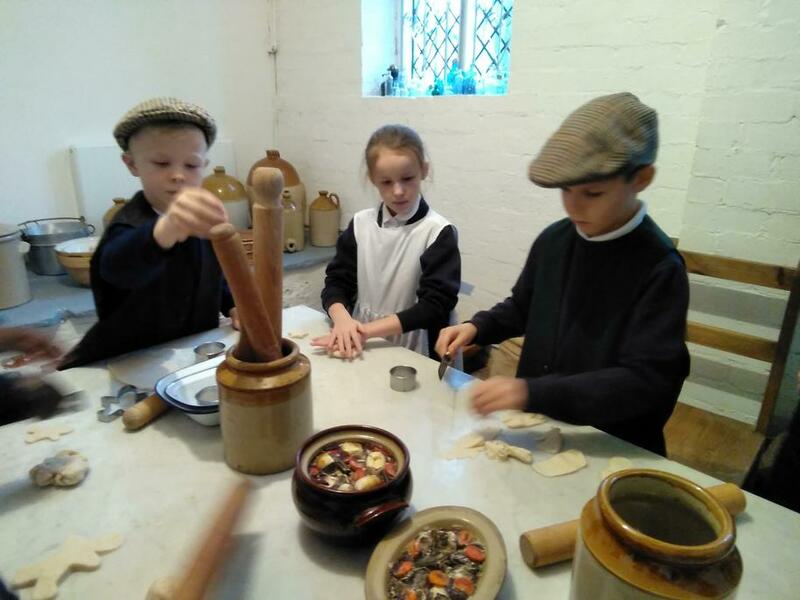 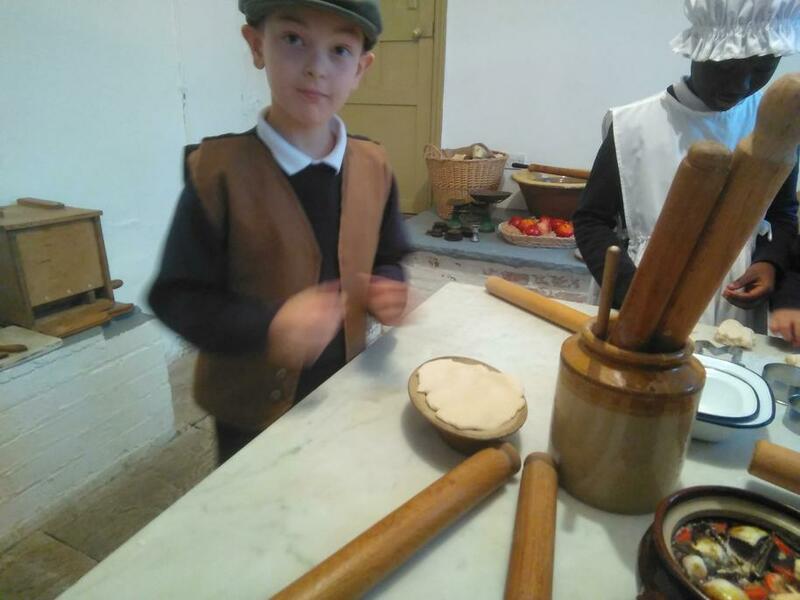 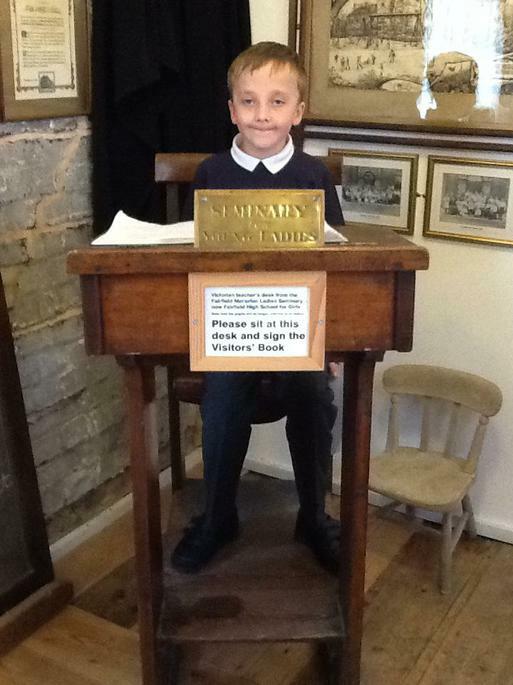 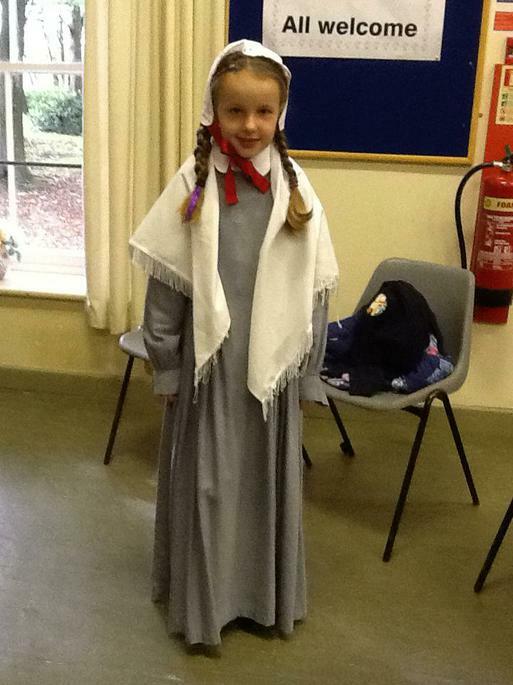 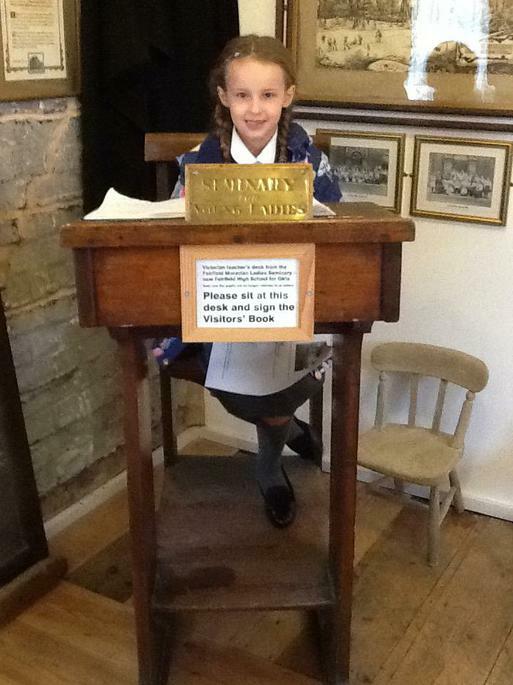 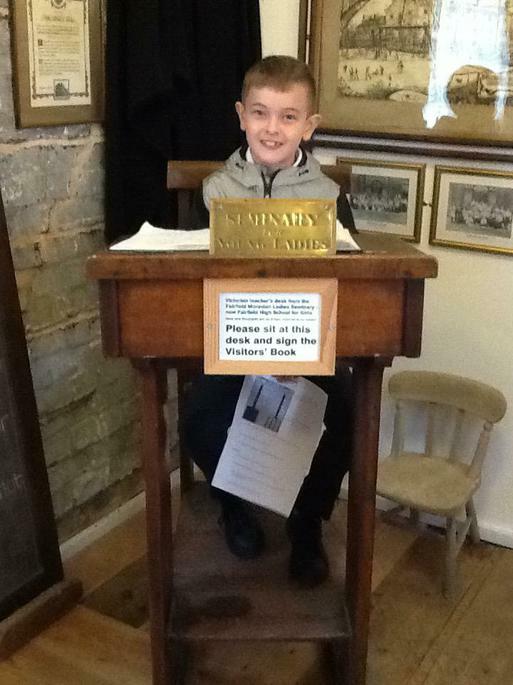 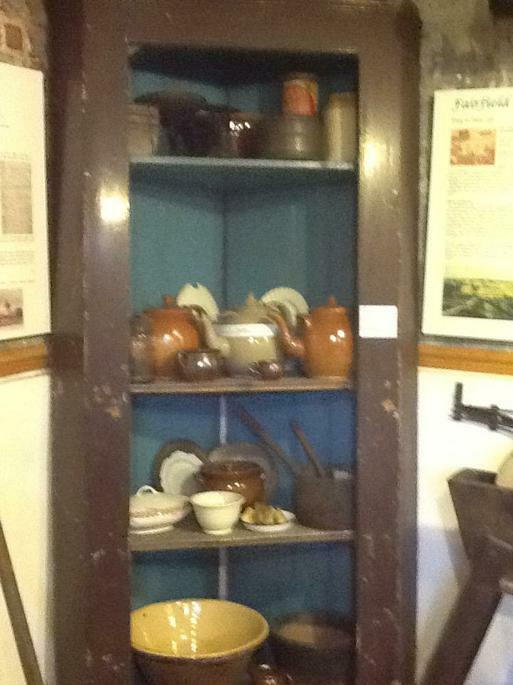 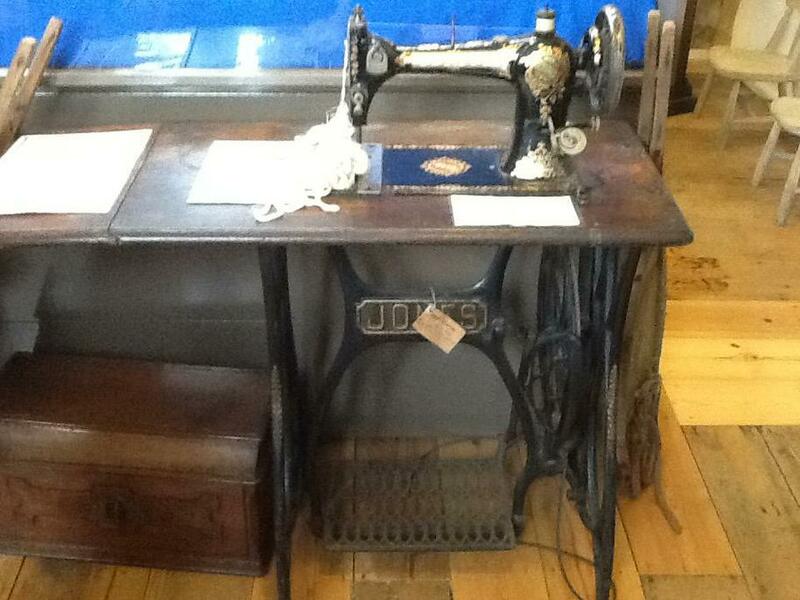 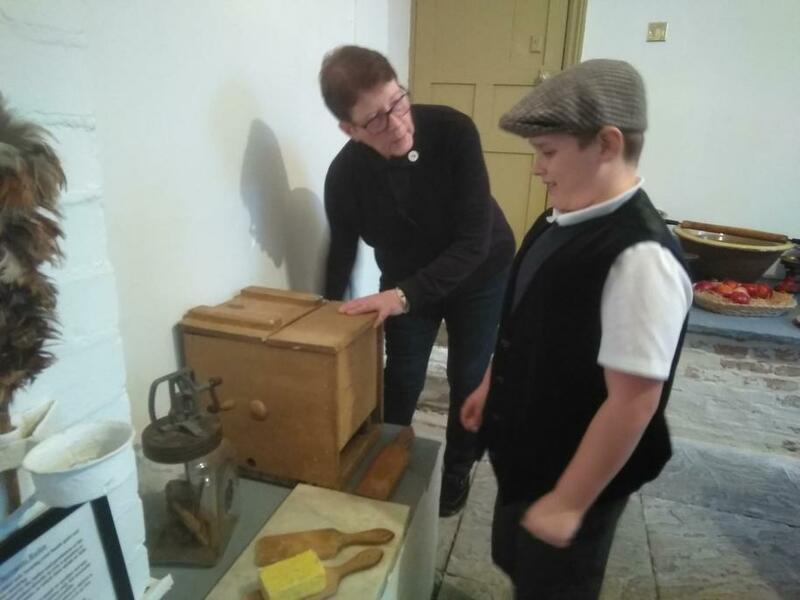 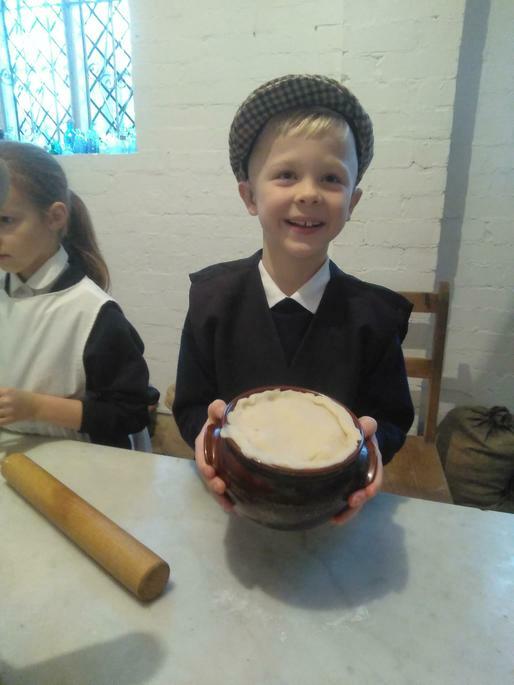 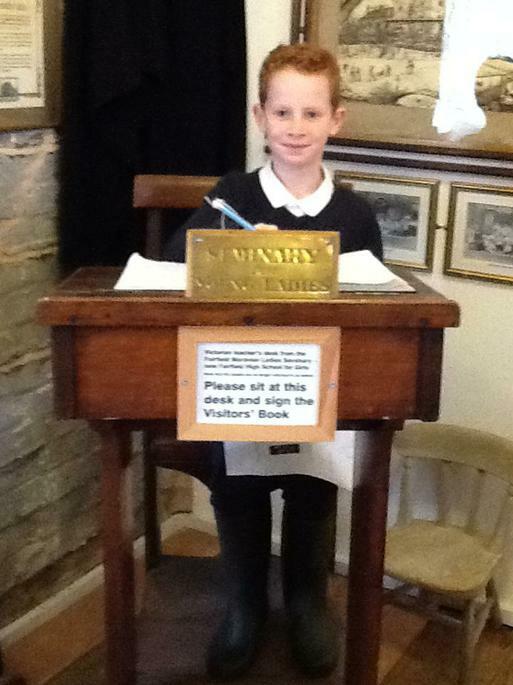 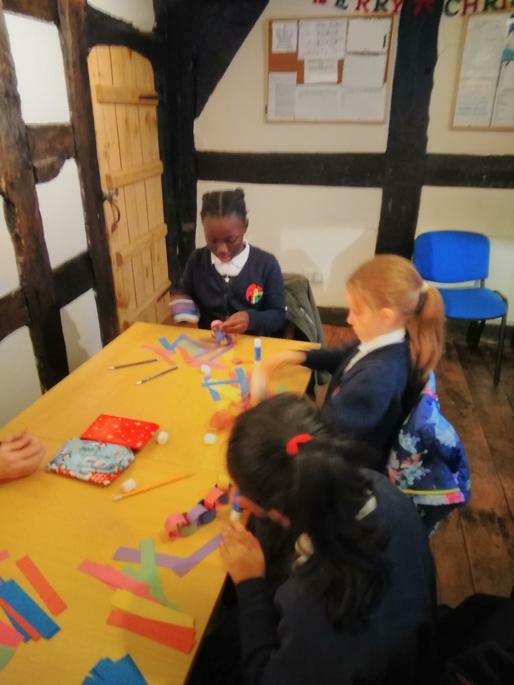 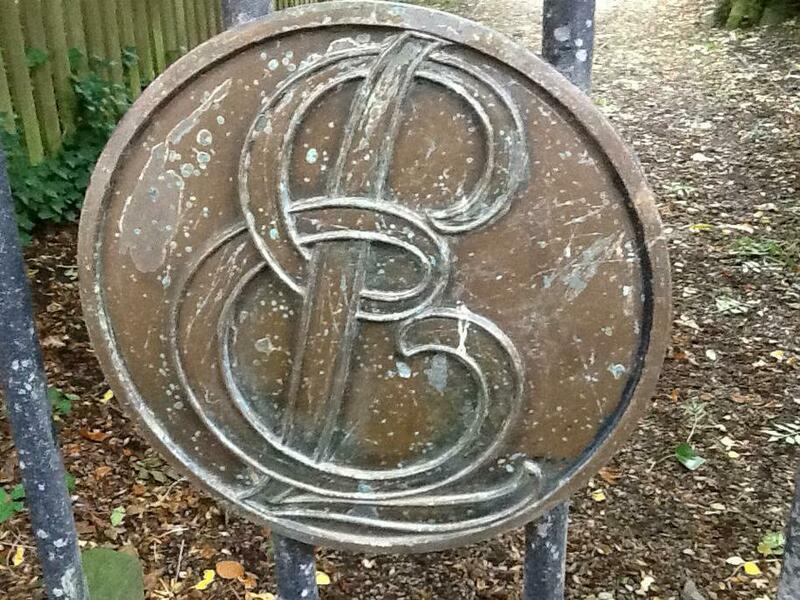 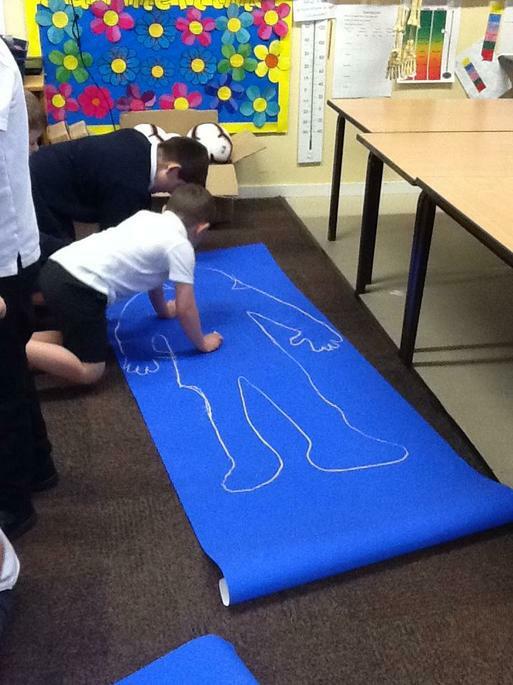 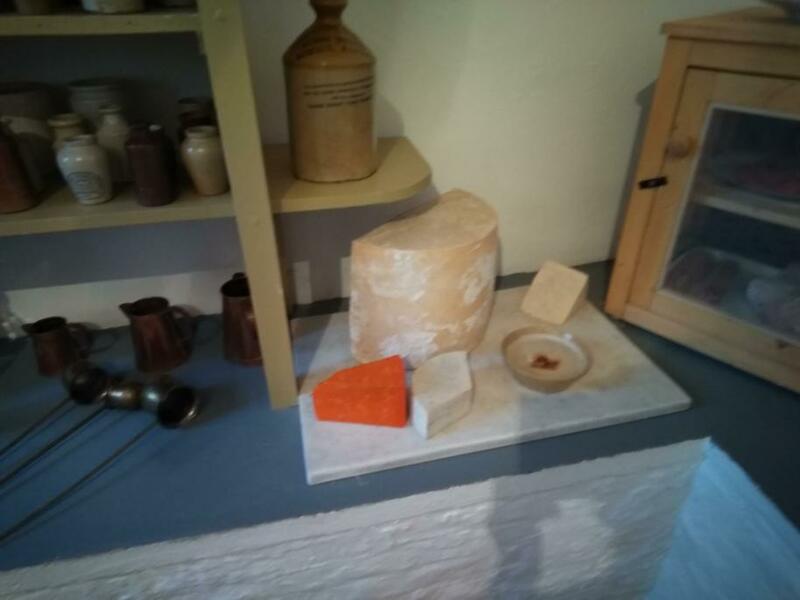 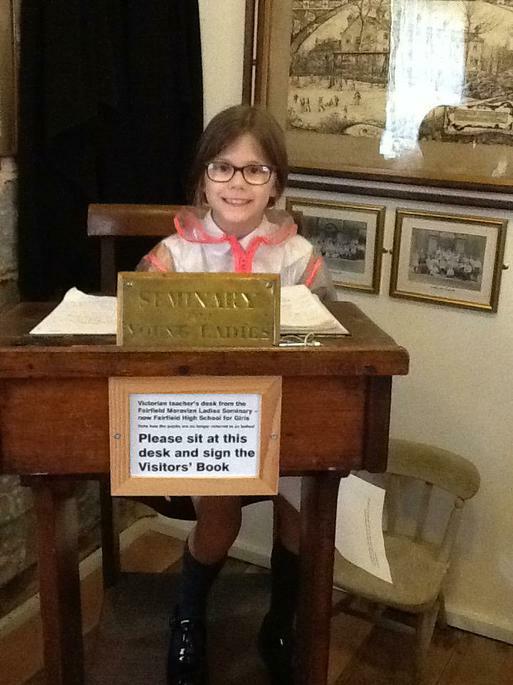 This term, as part of our local area studies, we have learned about the life of L.S. 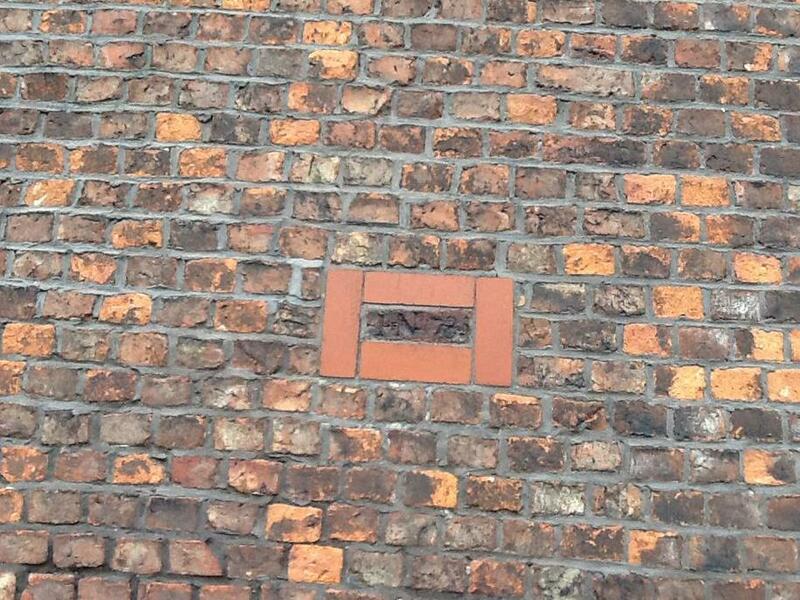 Lowry. 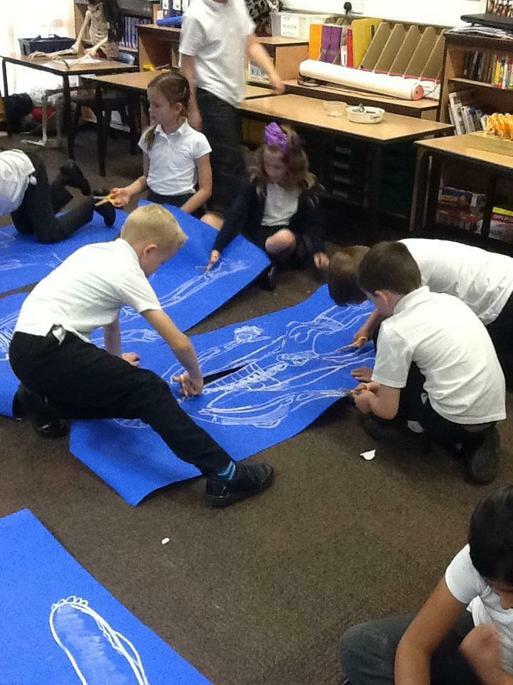 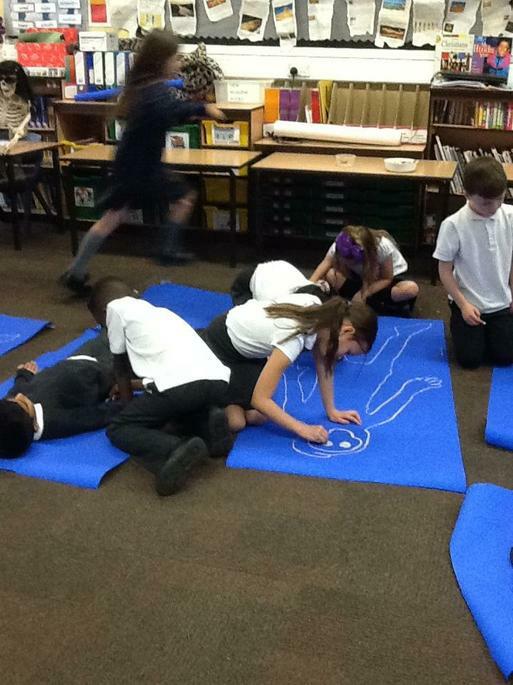 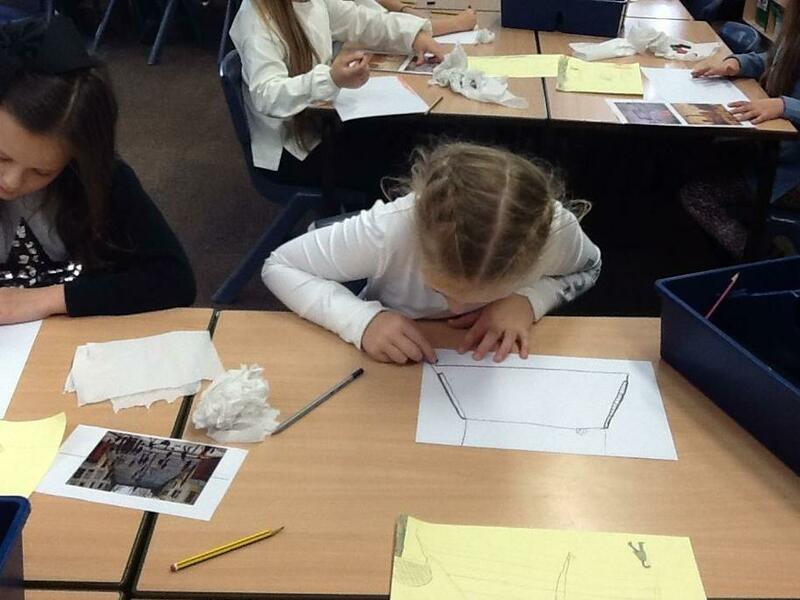 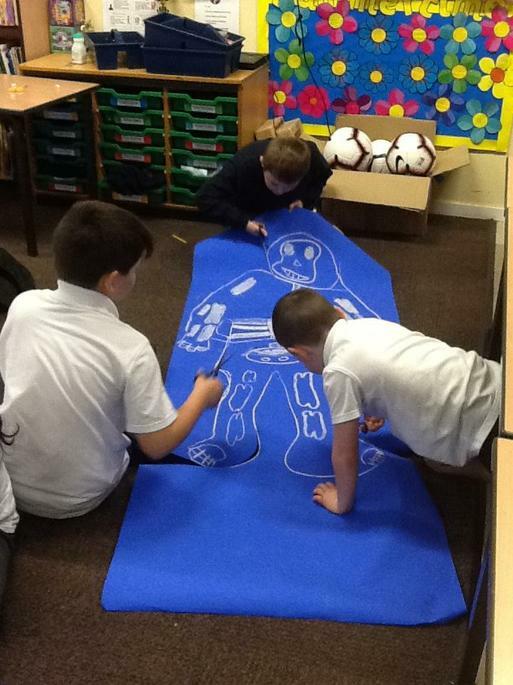 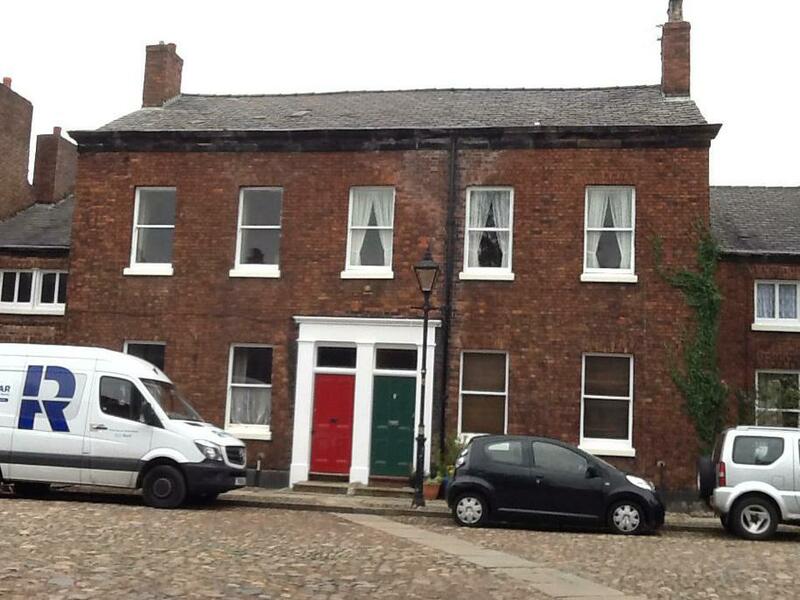 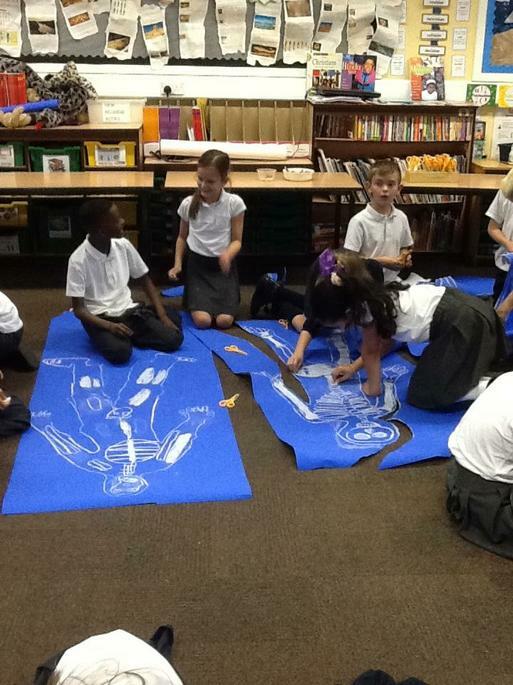 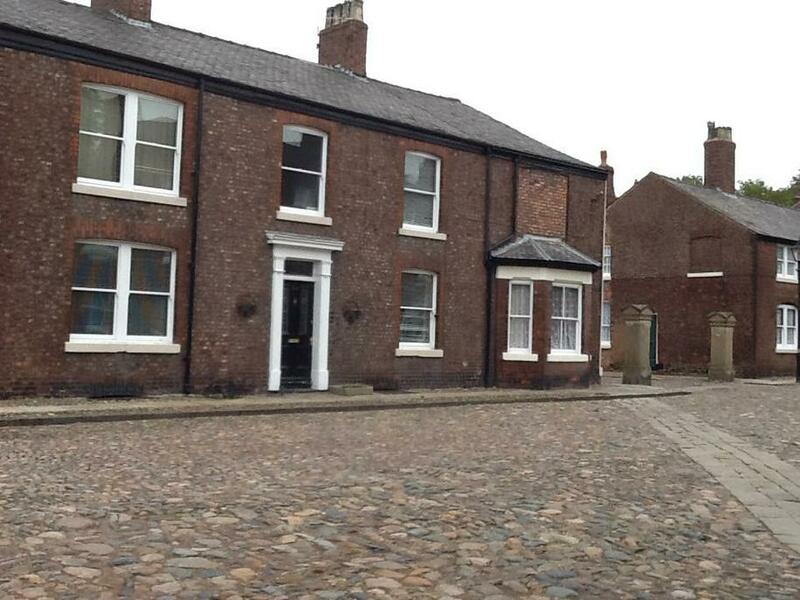 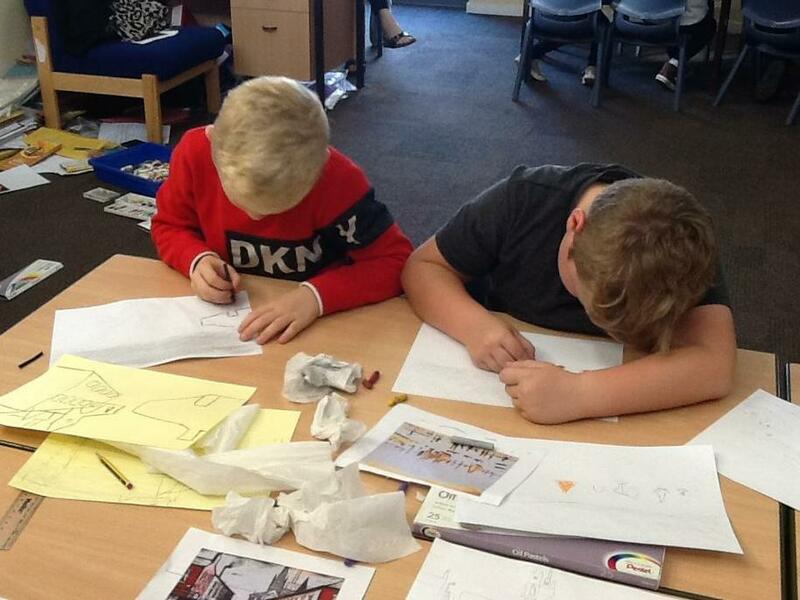 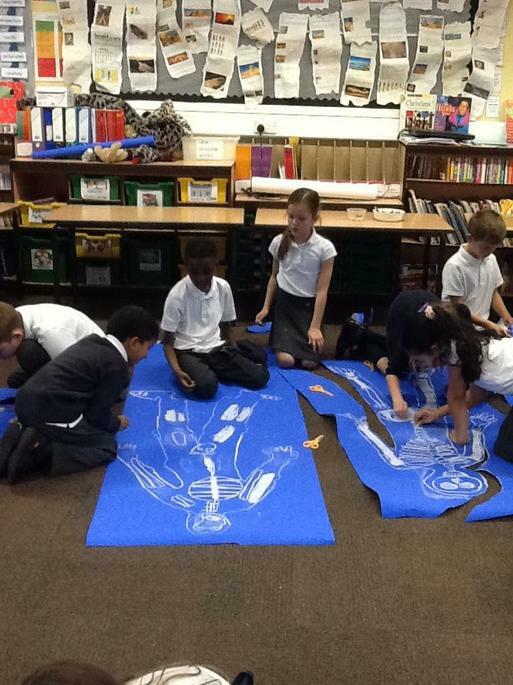 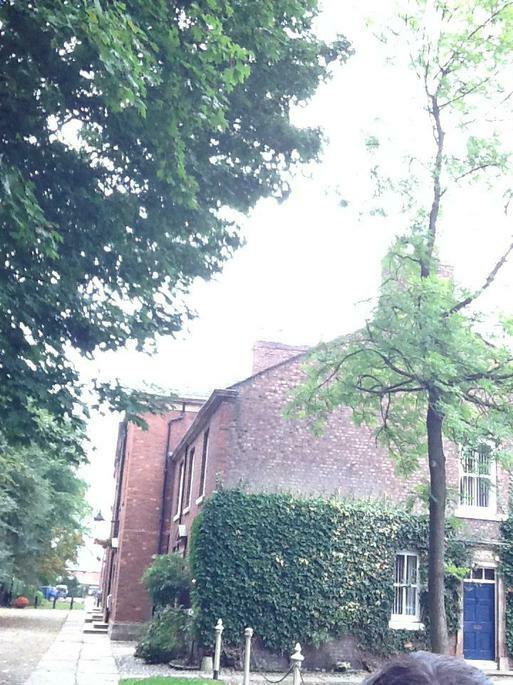 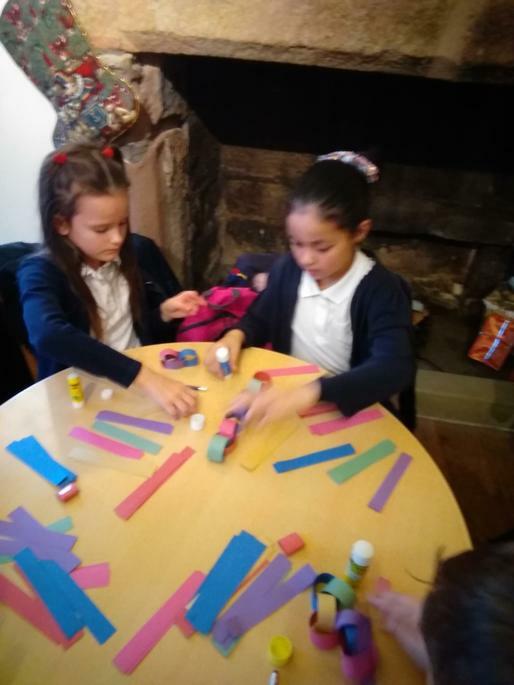 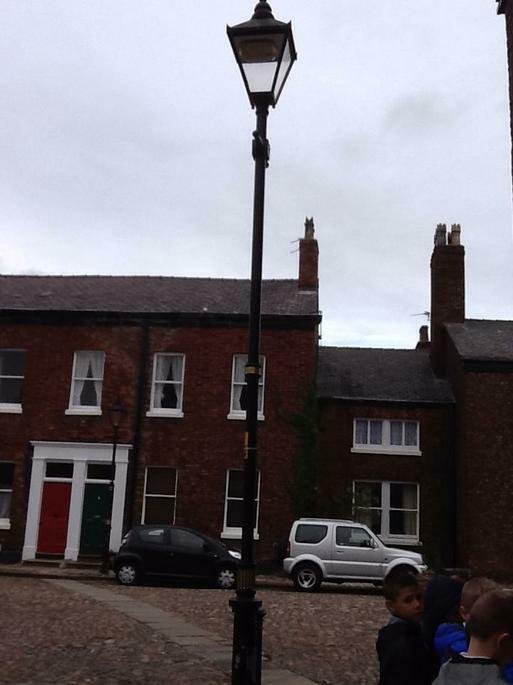 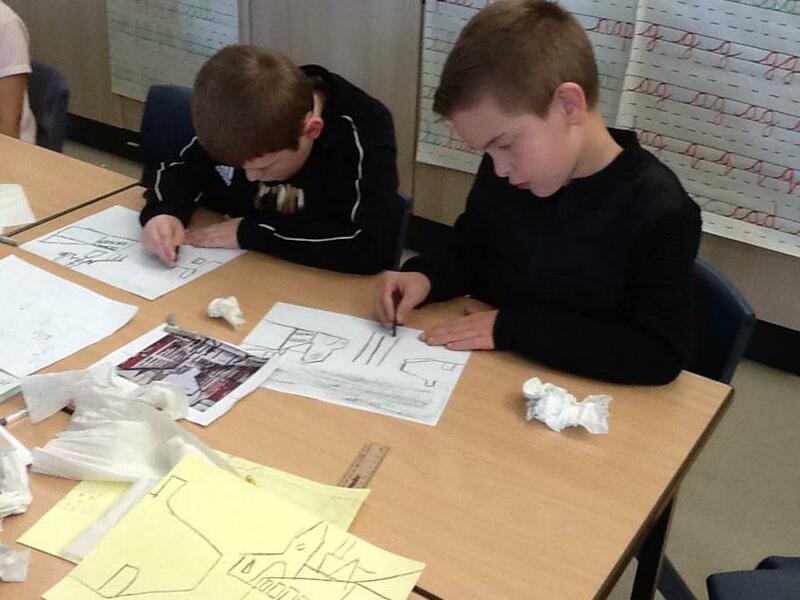 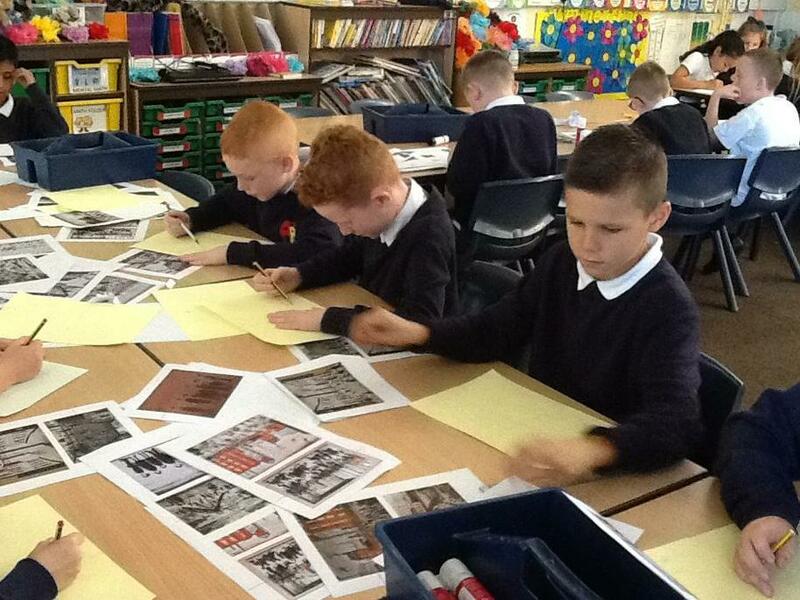 We are re-creating scenes that Lowry painted. 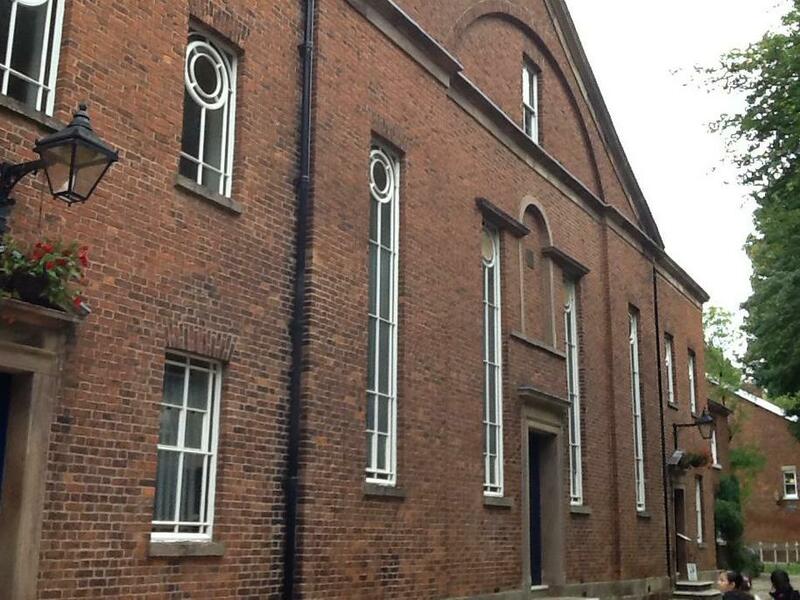 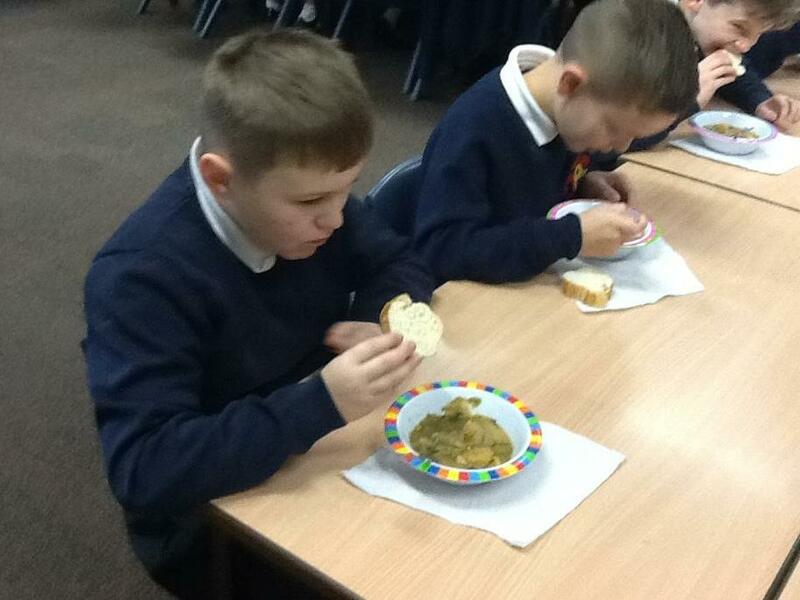 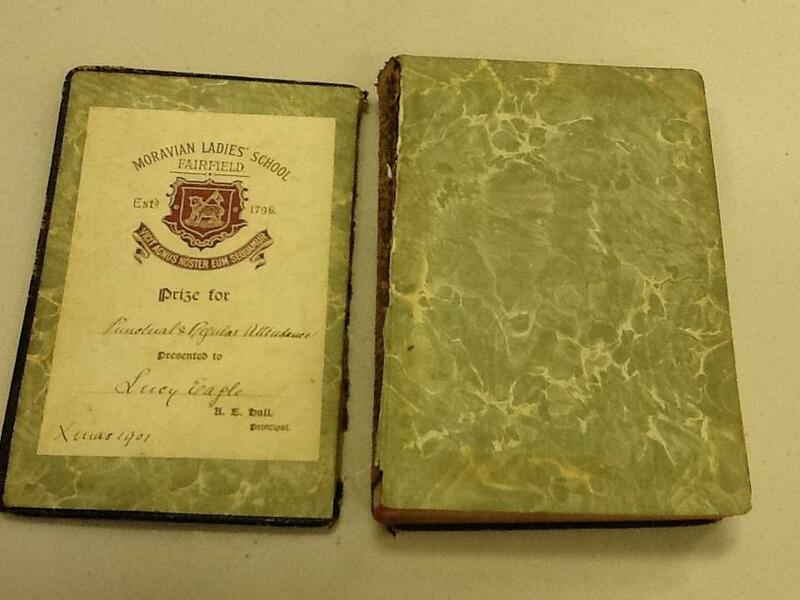 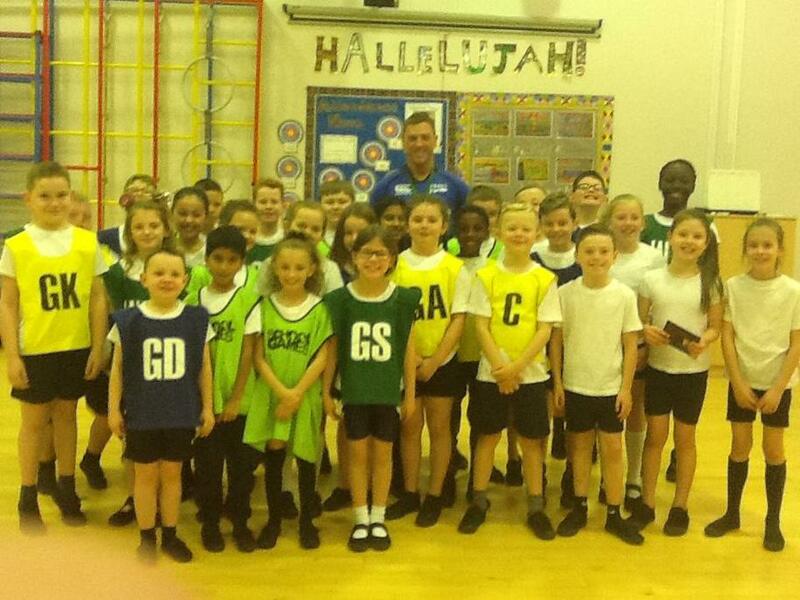 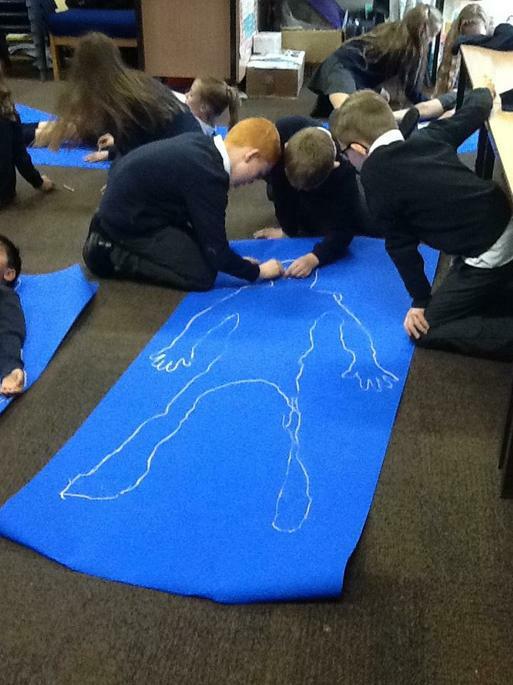 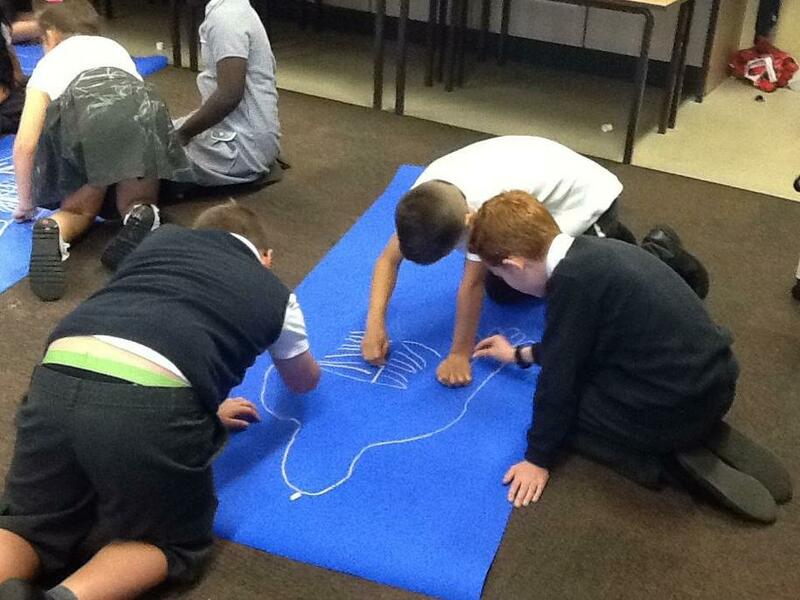 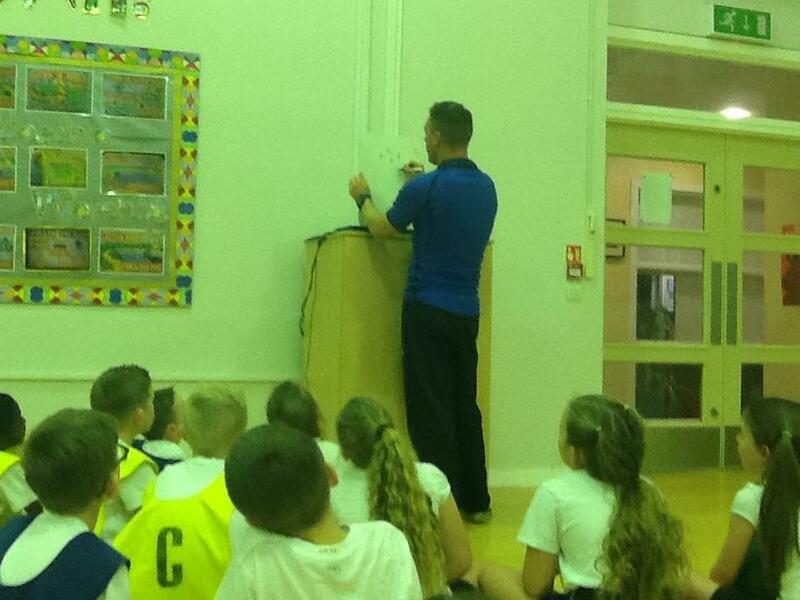 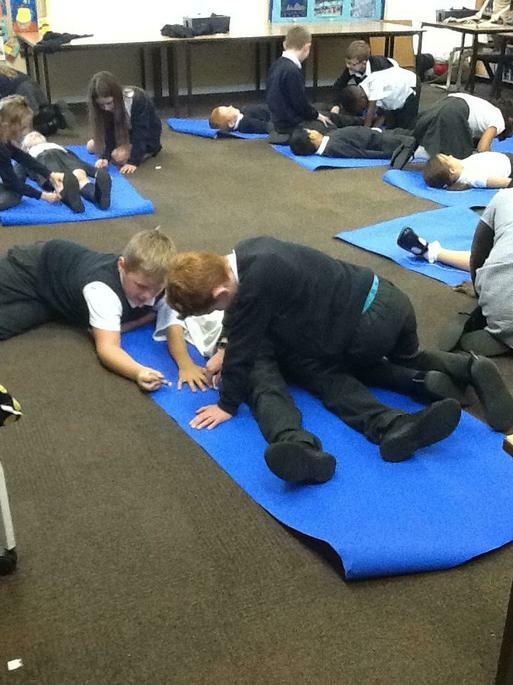 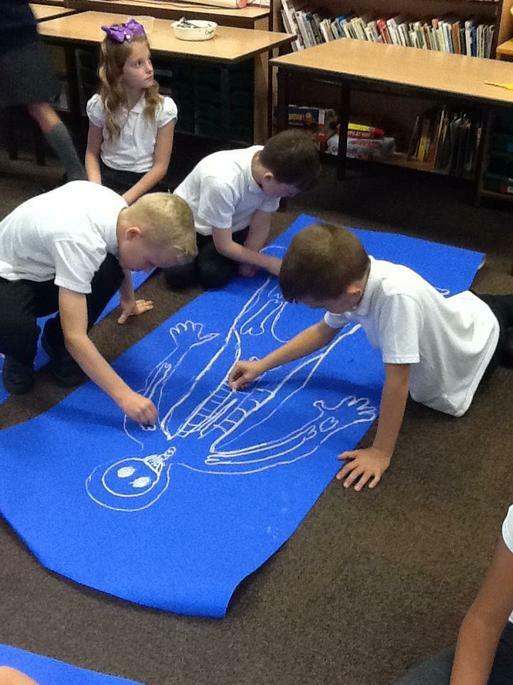 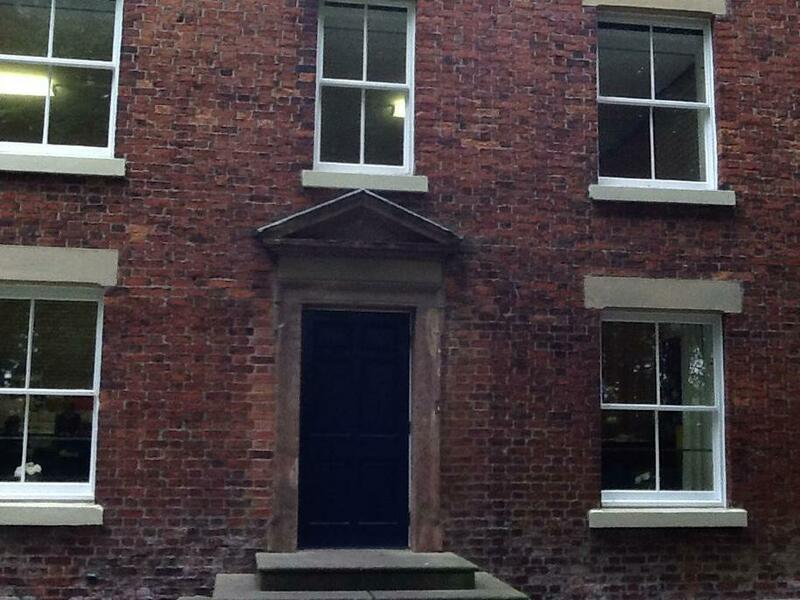 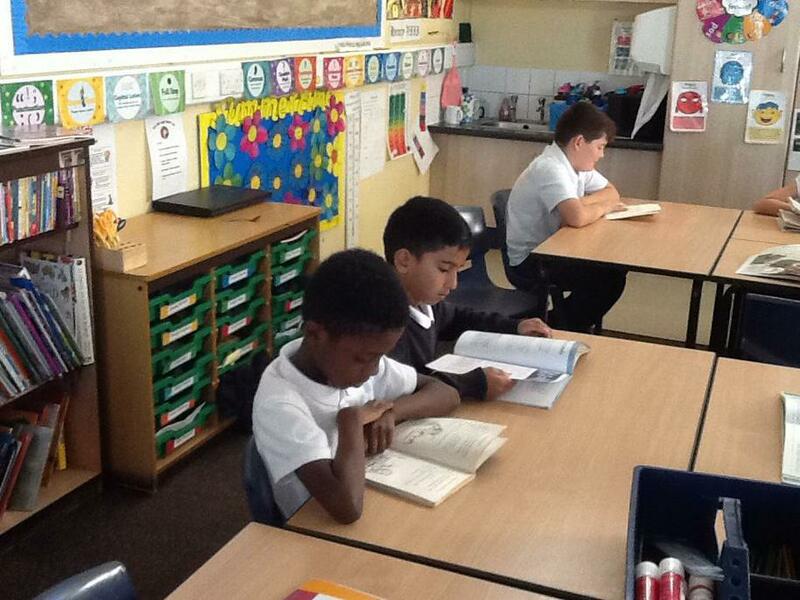 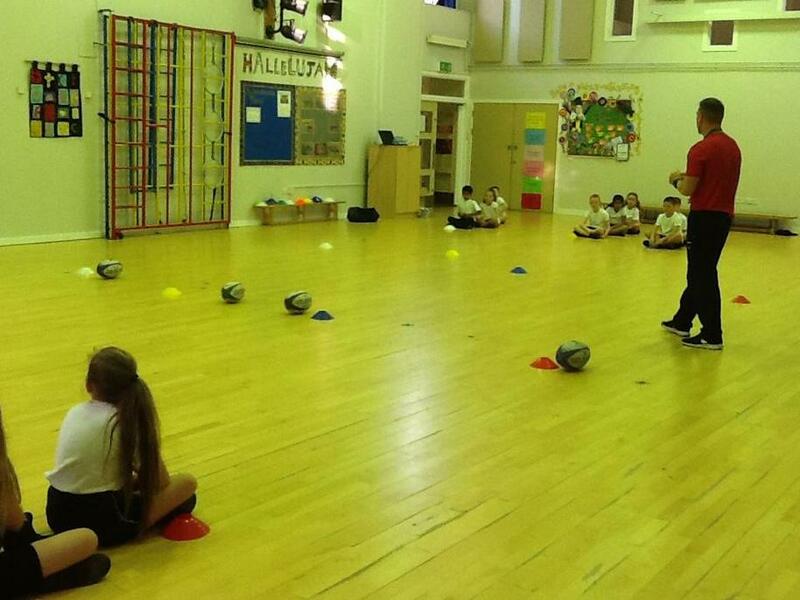 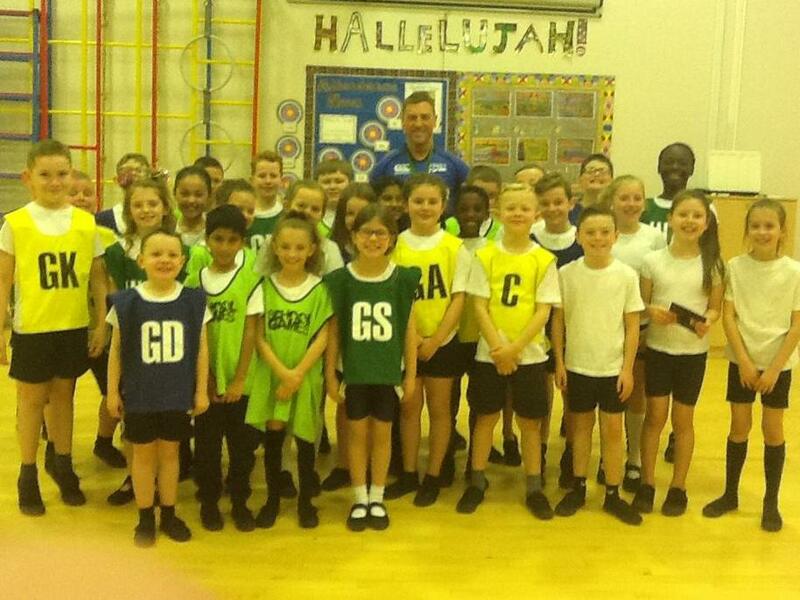 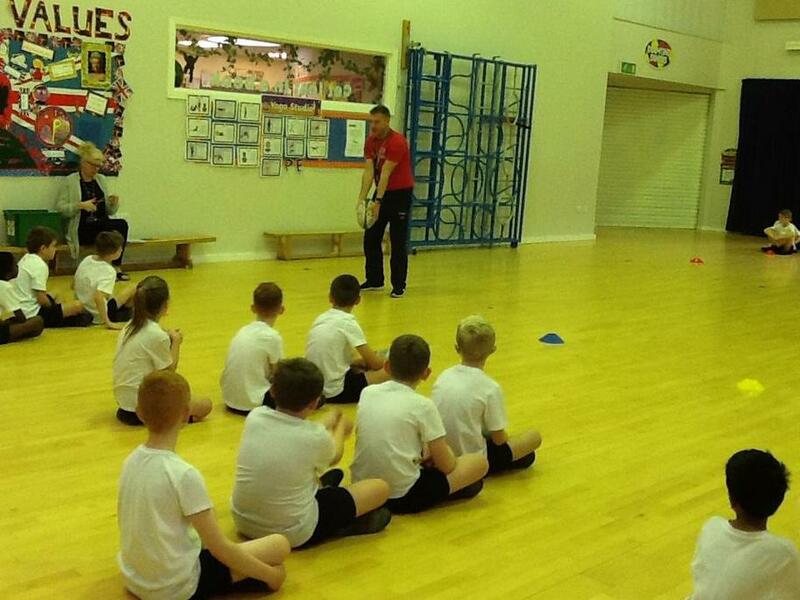 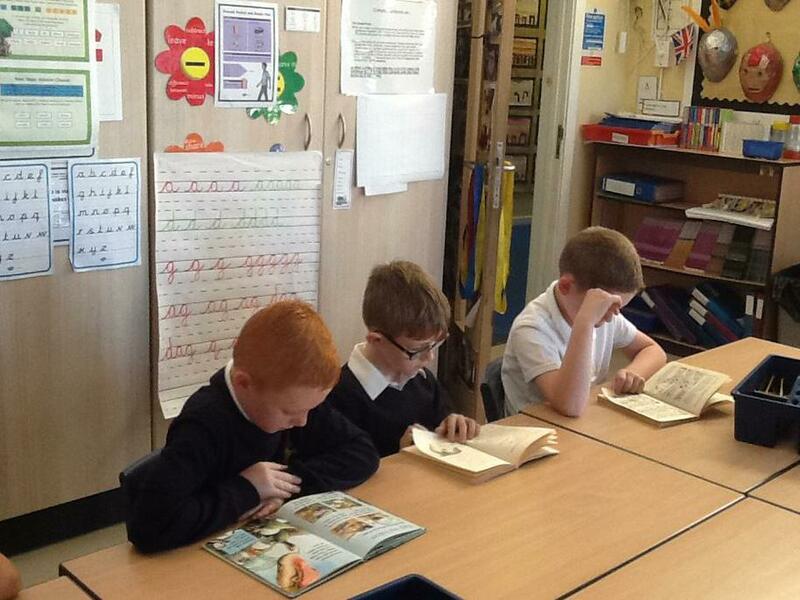 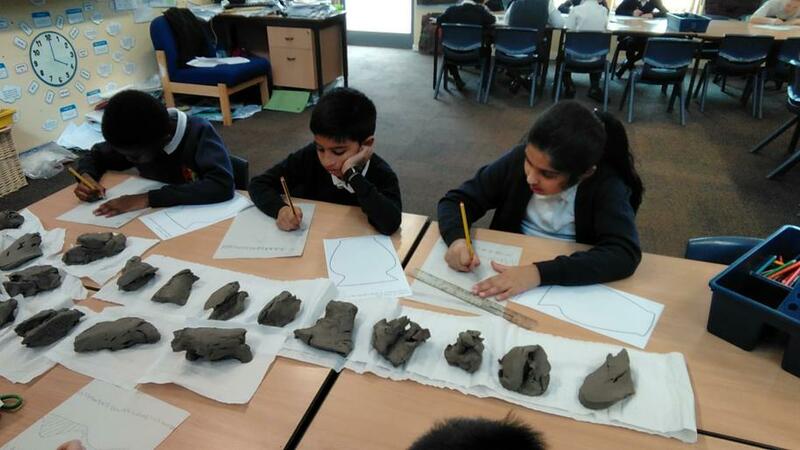 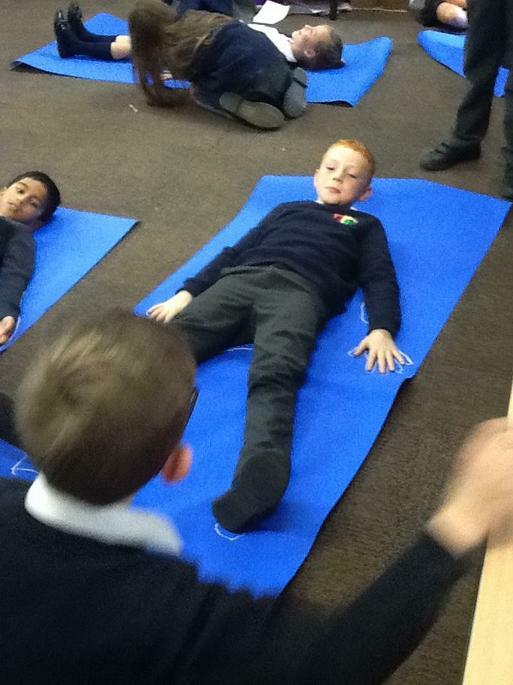 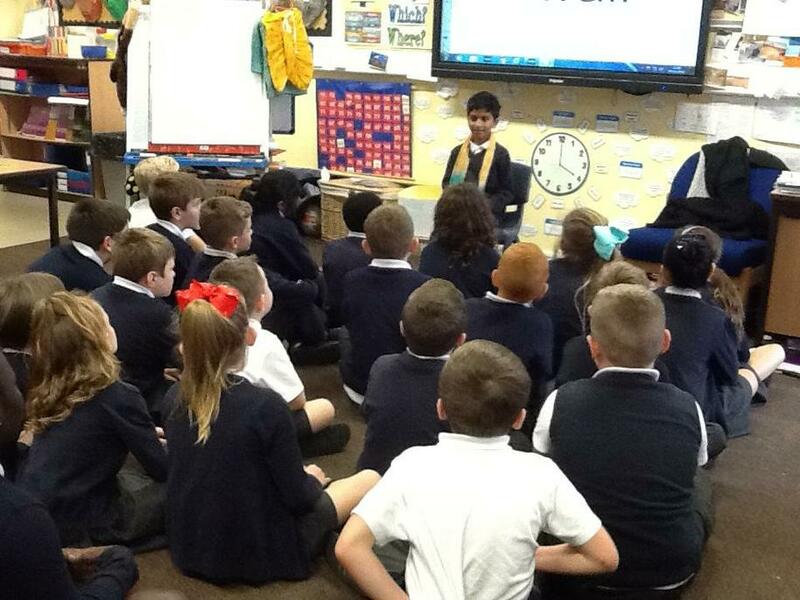 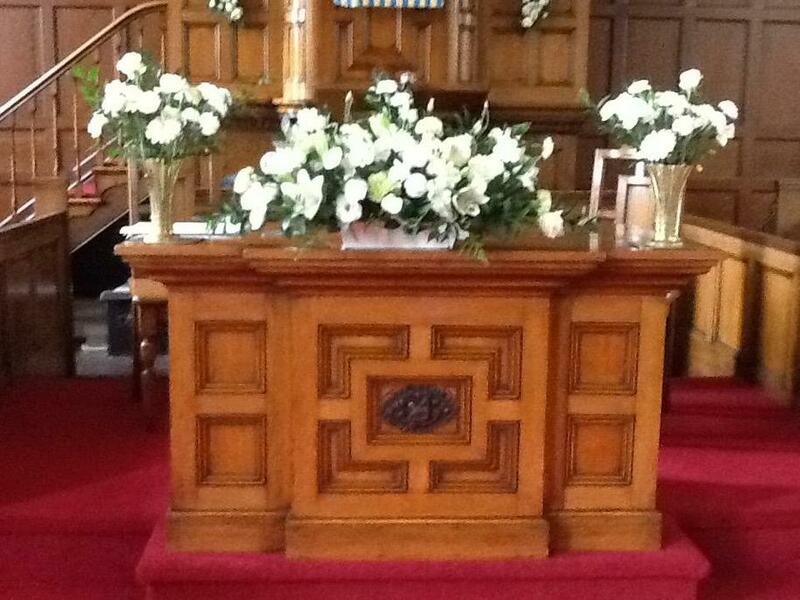 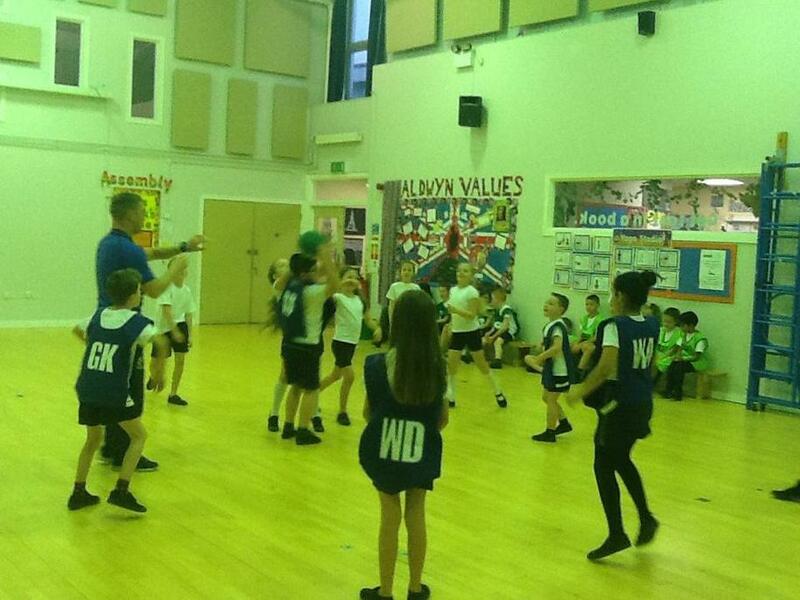 This term, we are working with Mr Rose from Audenshaw Boys School. 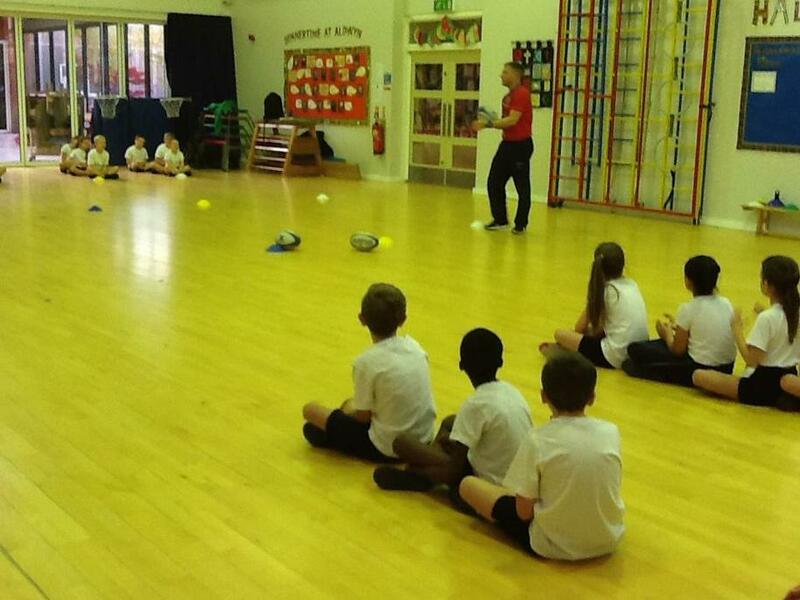 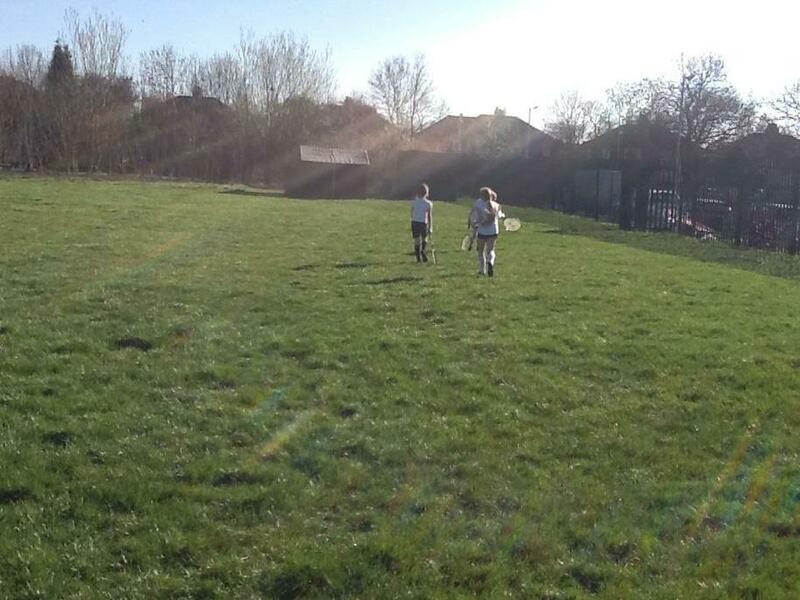 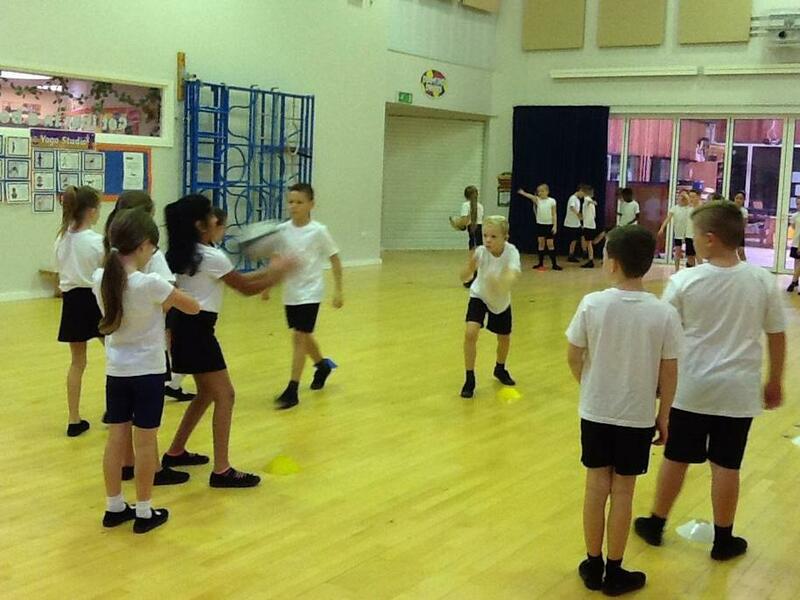 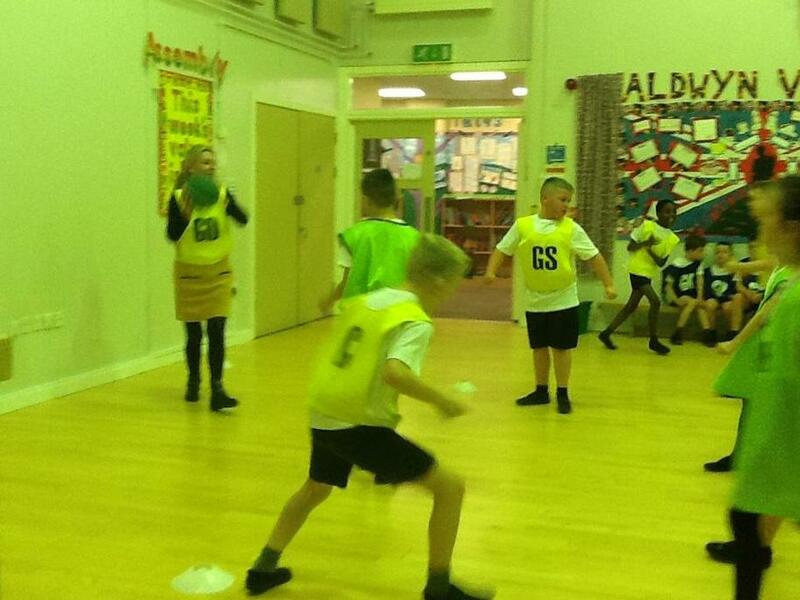 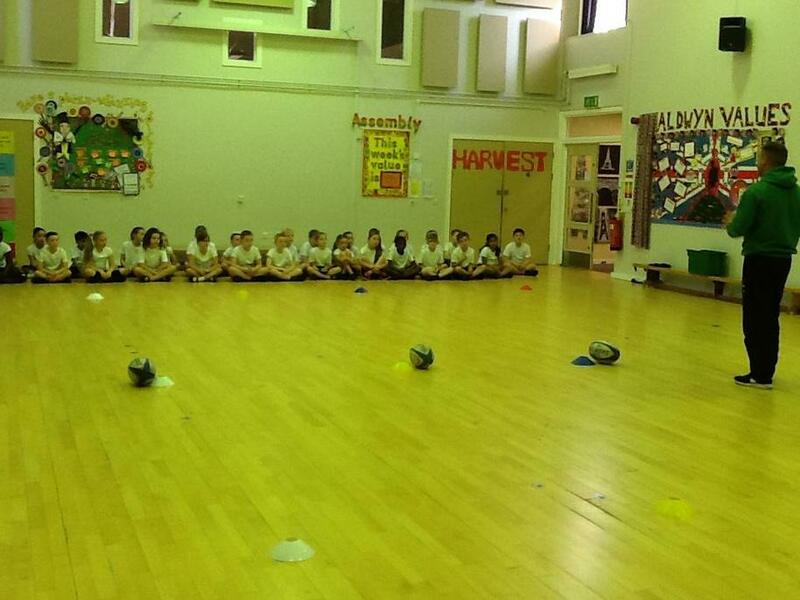 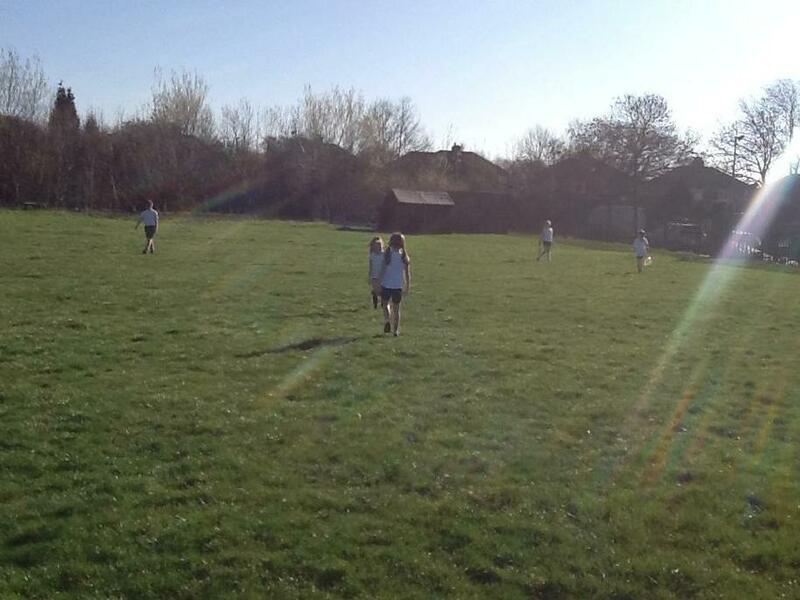 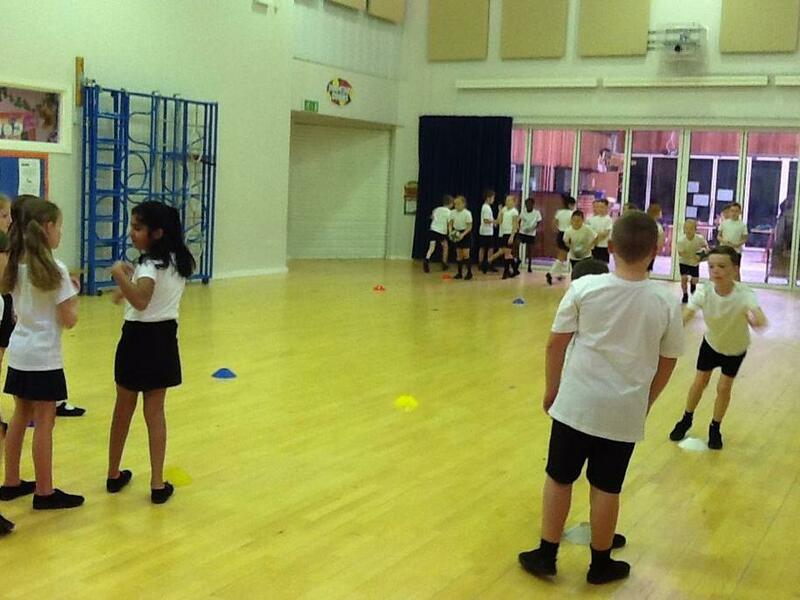 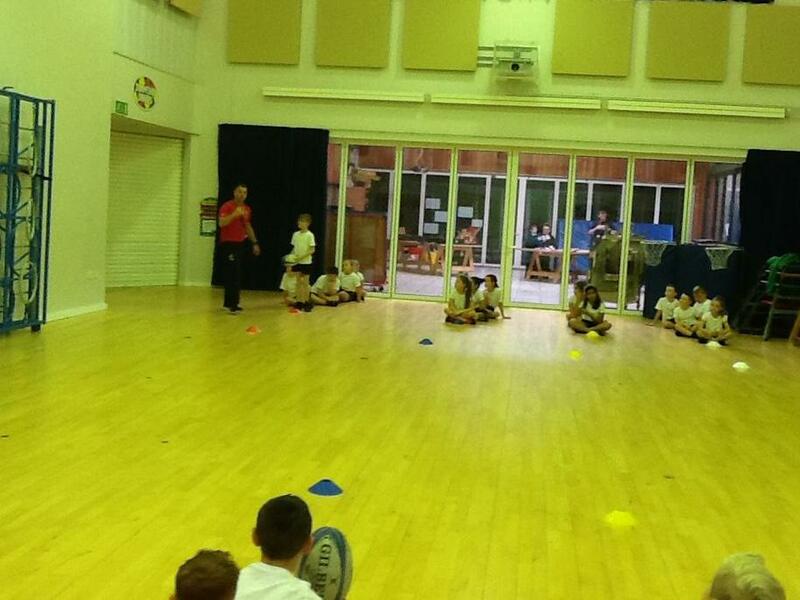 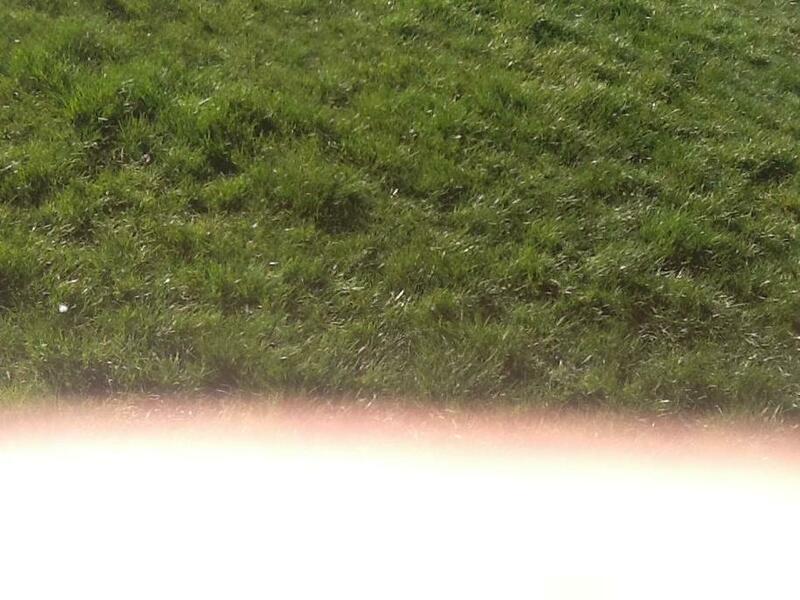 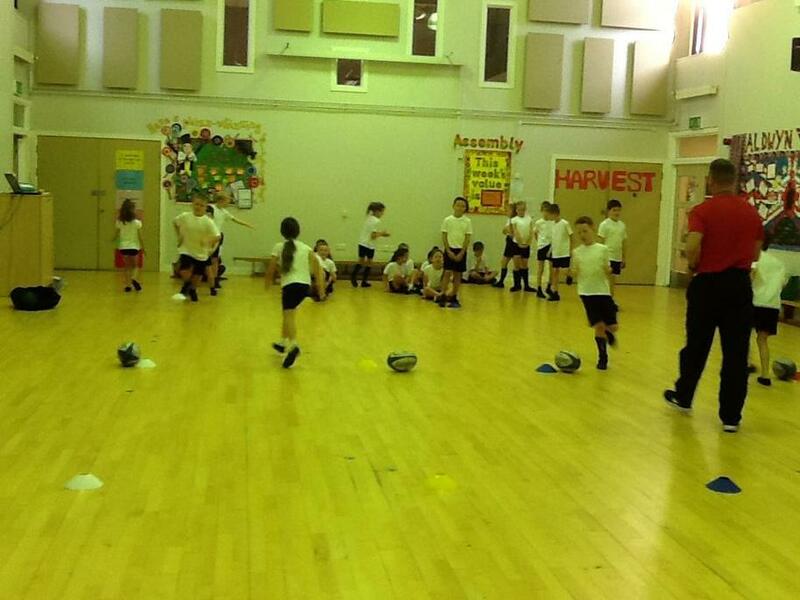 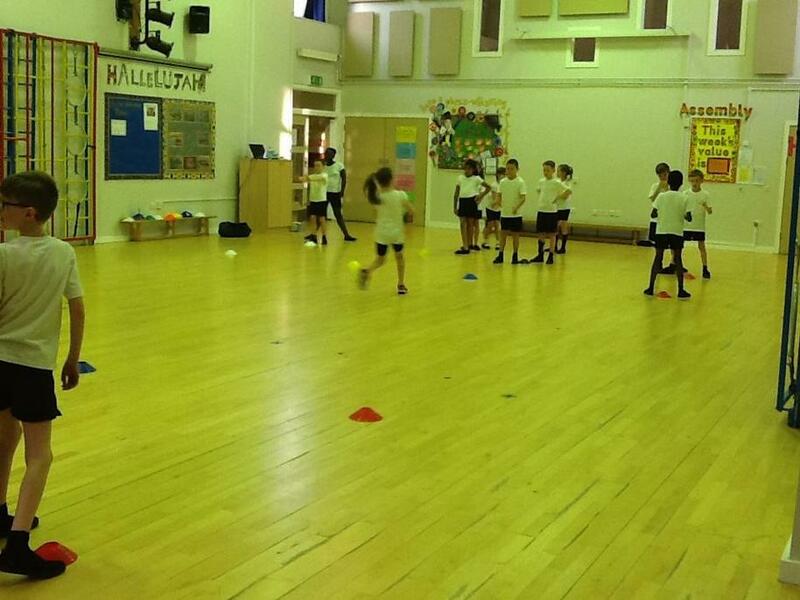 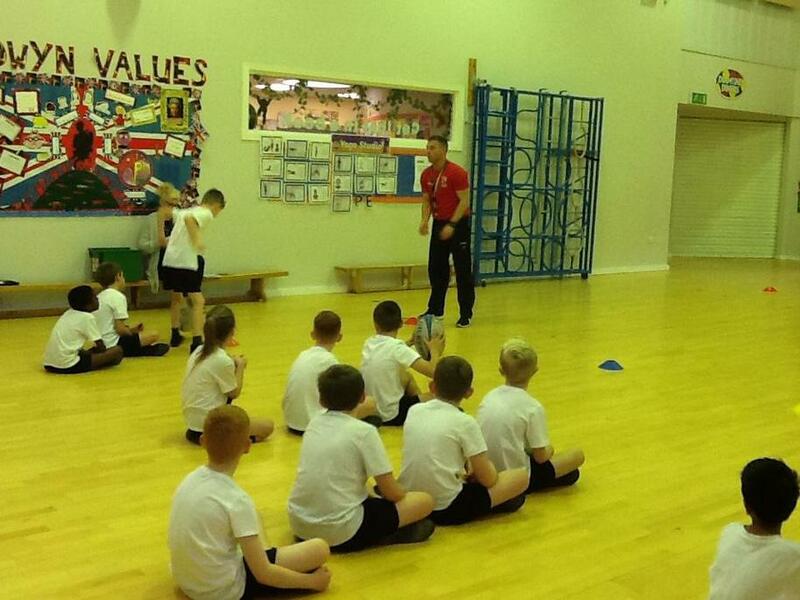 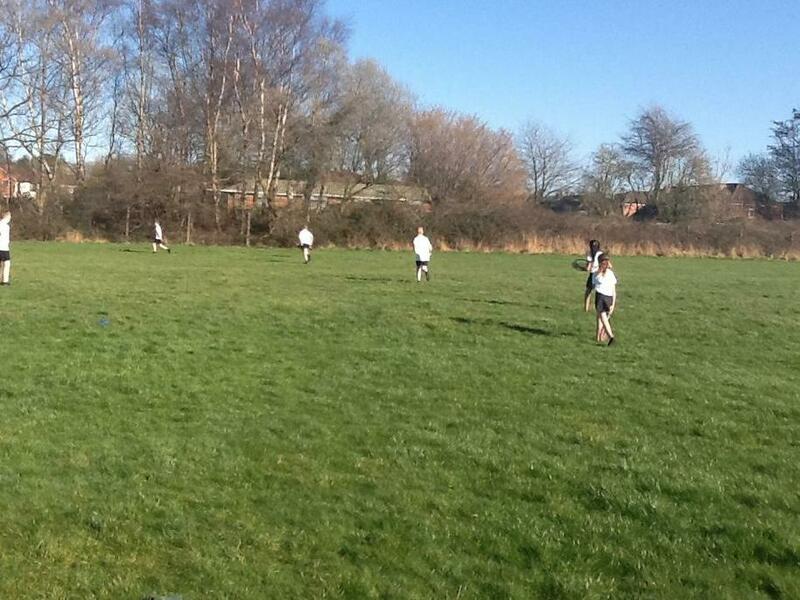 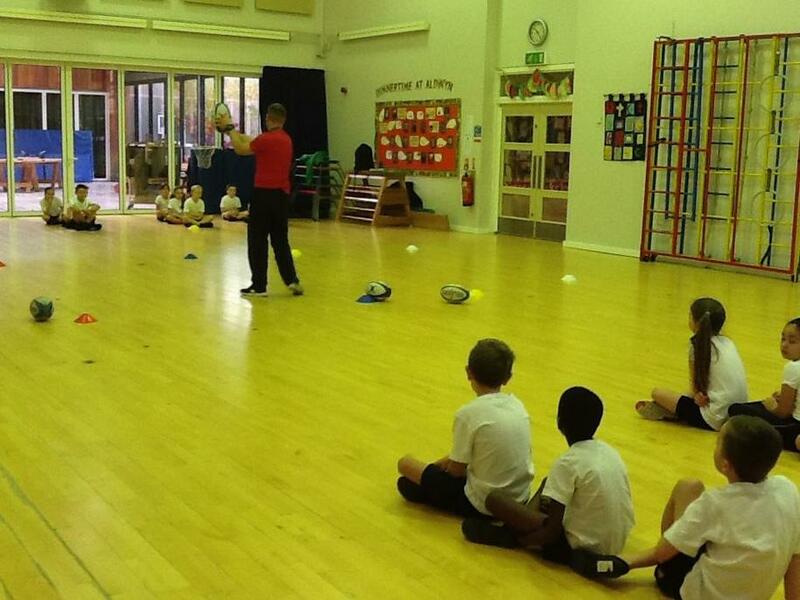 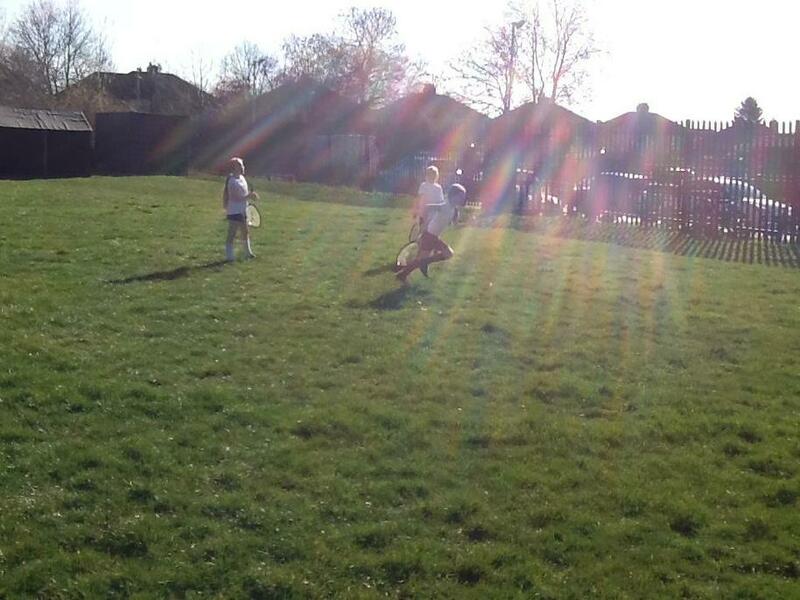 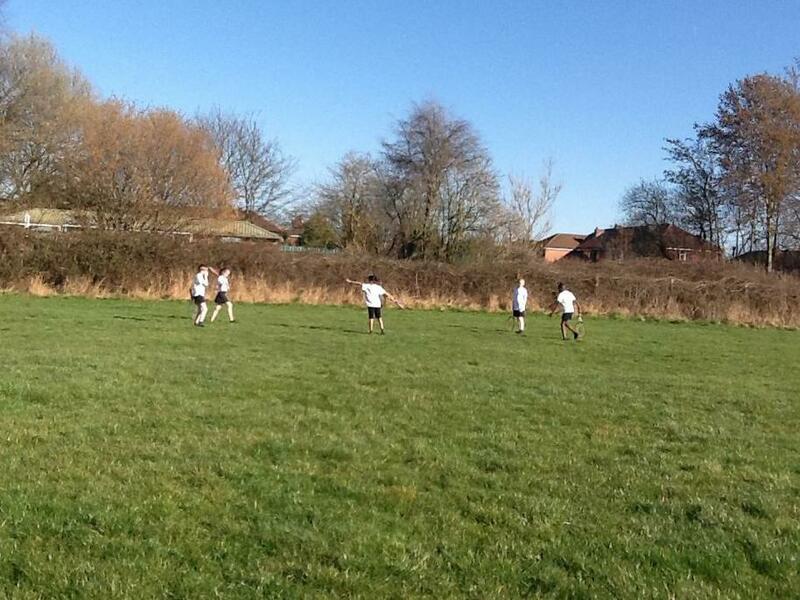 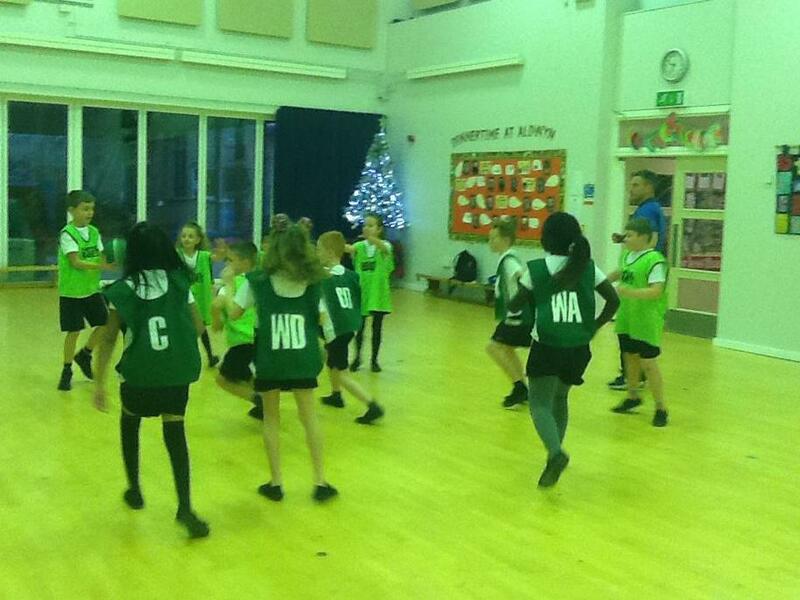 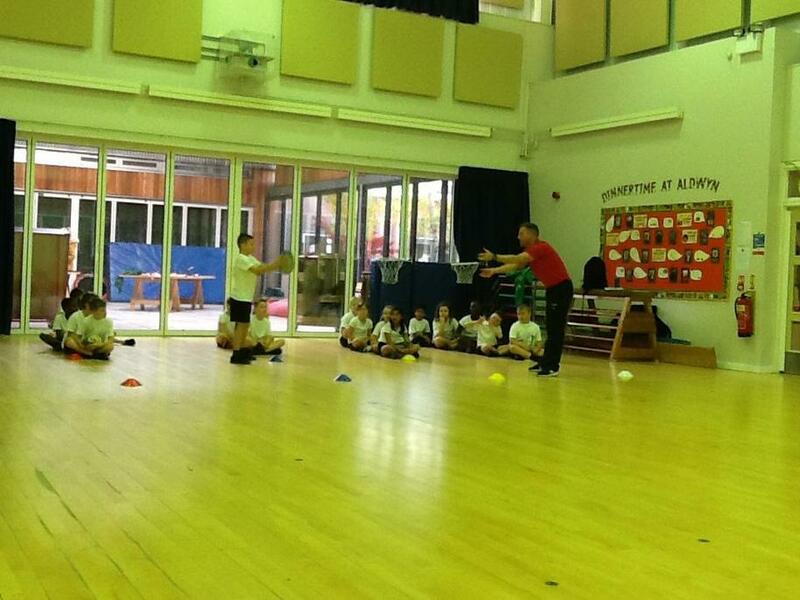 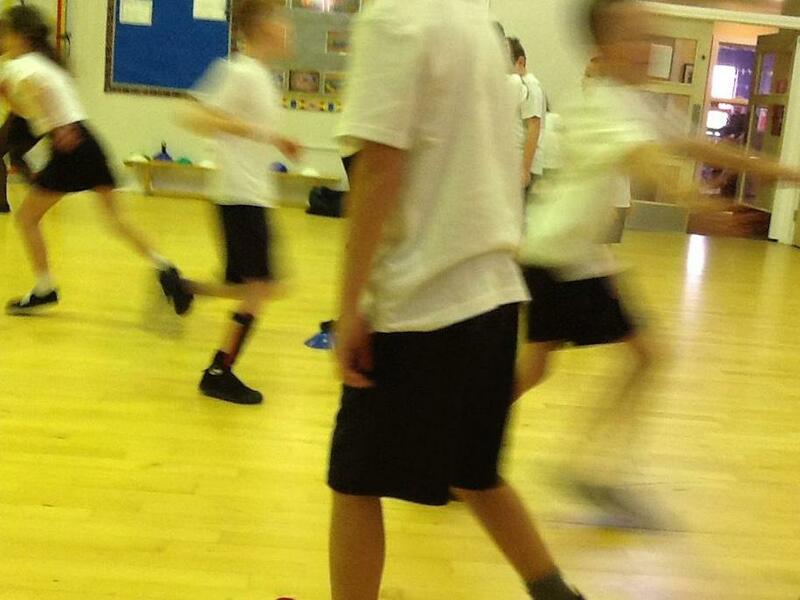 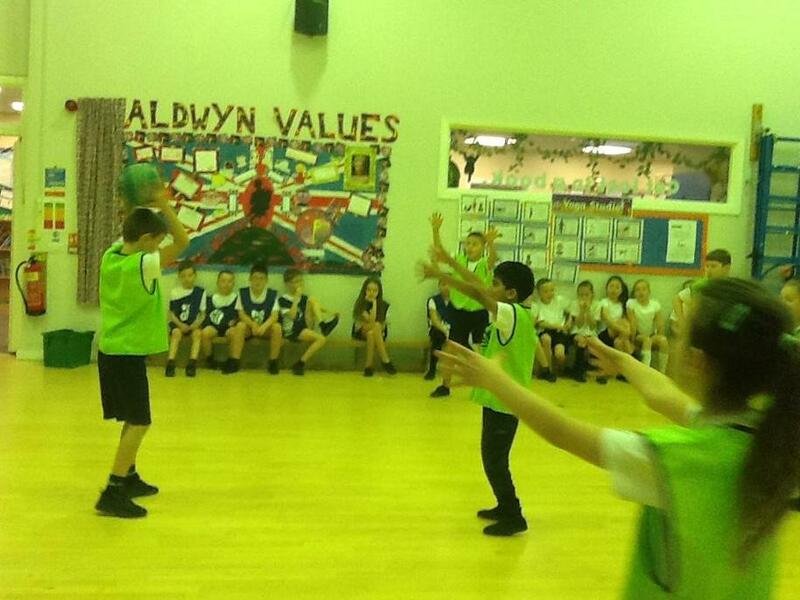 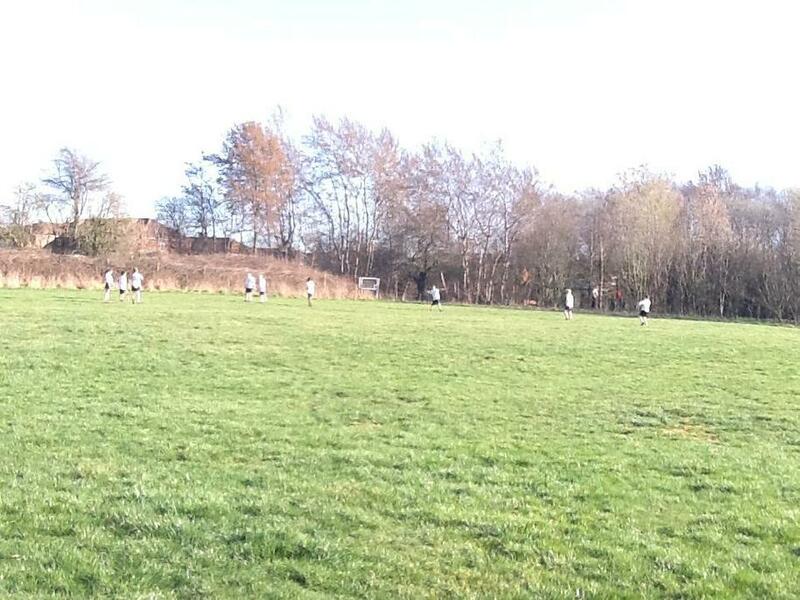 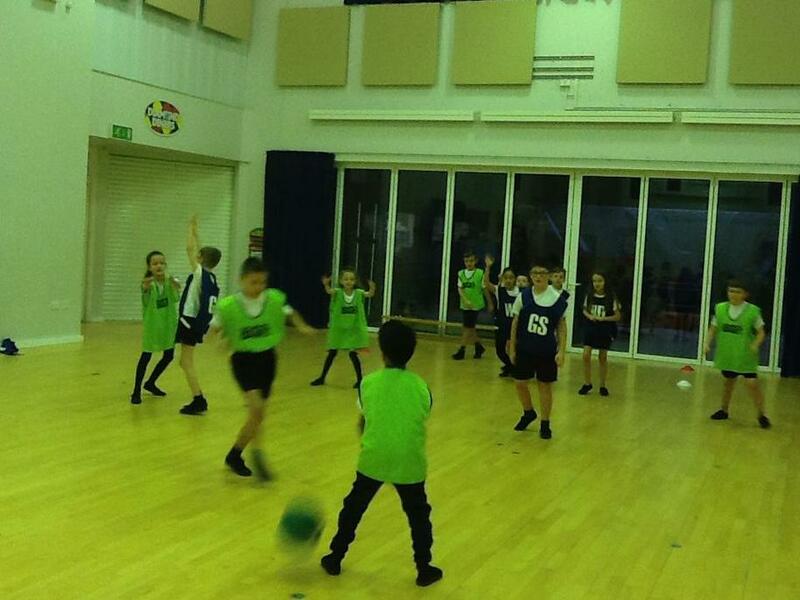 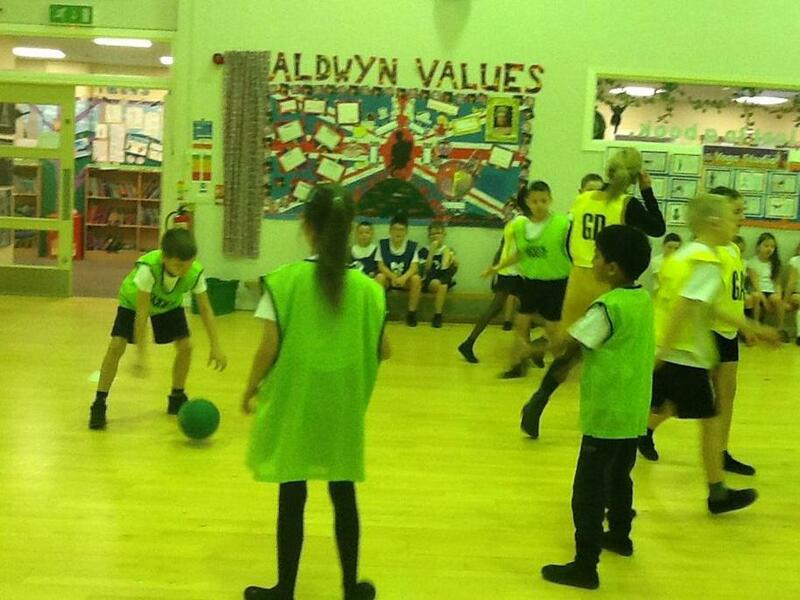 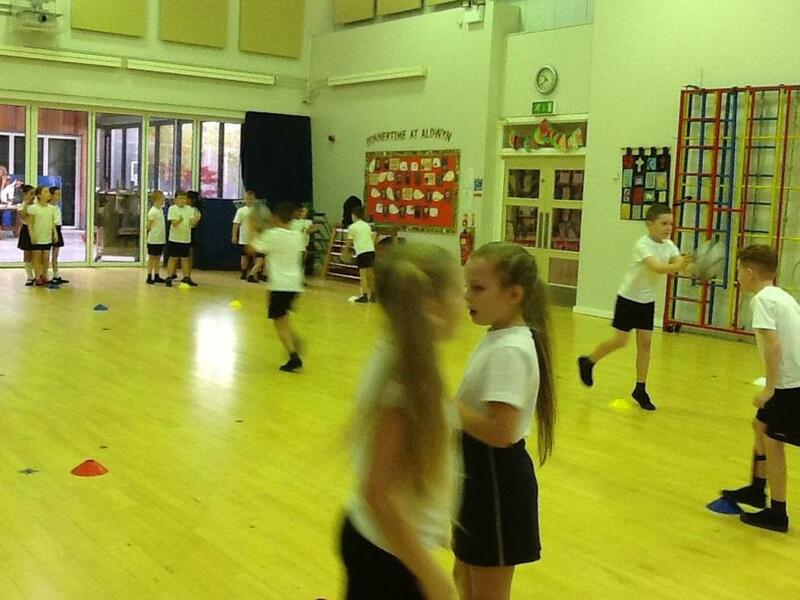 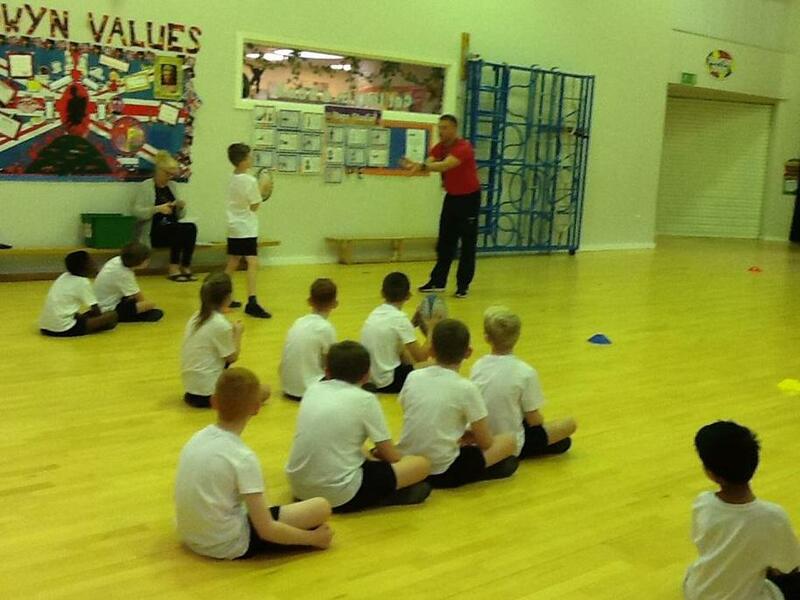 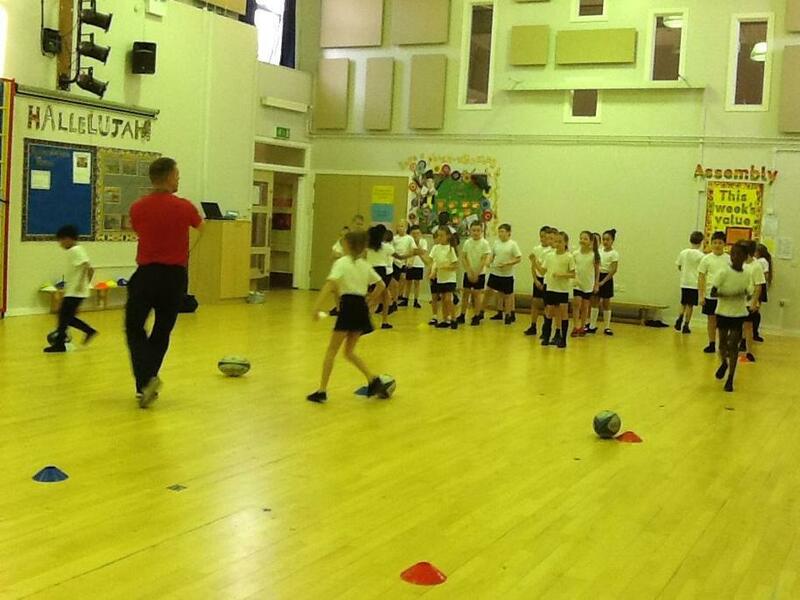 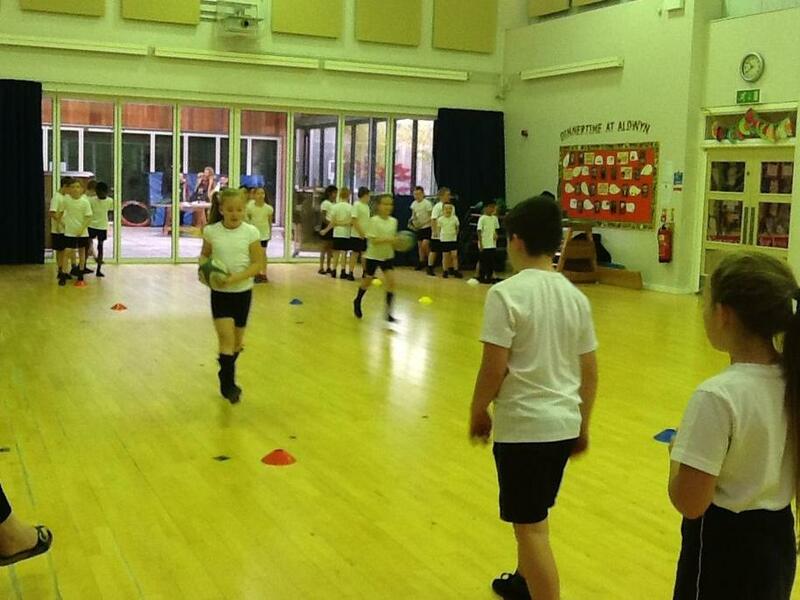 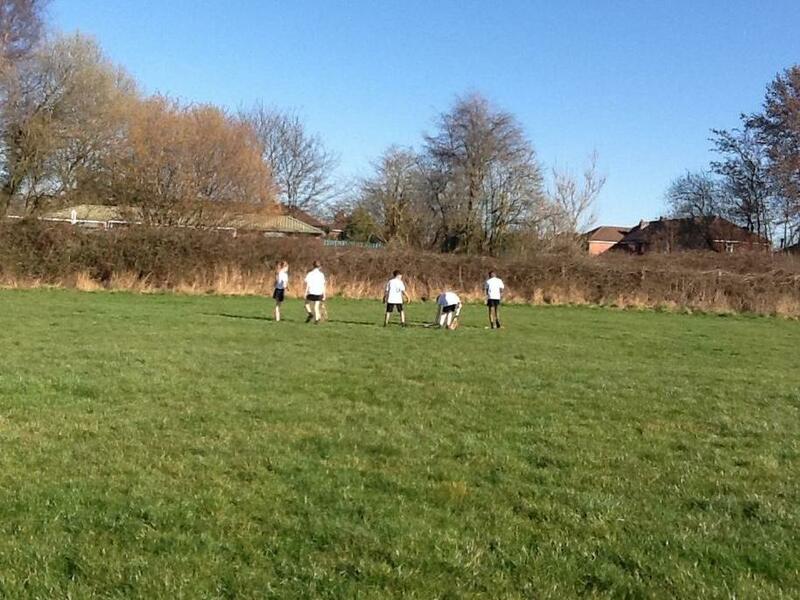 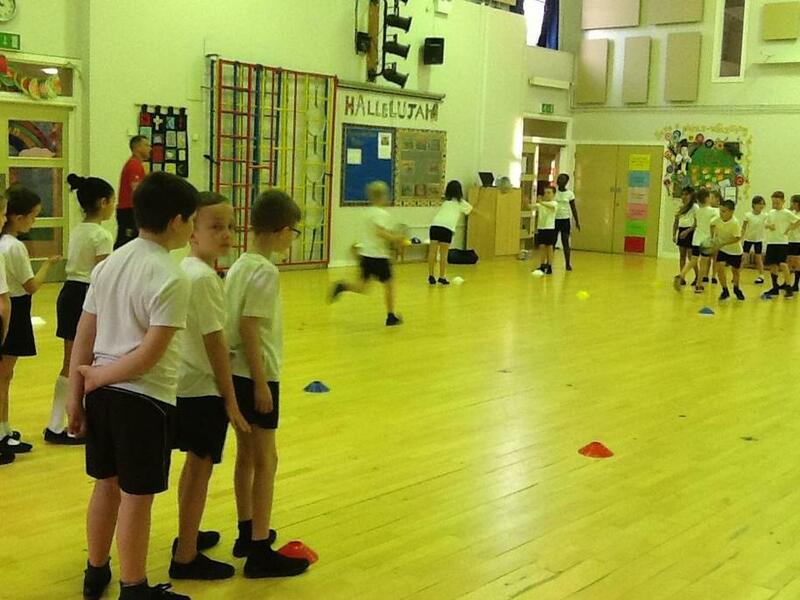 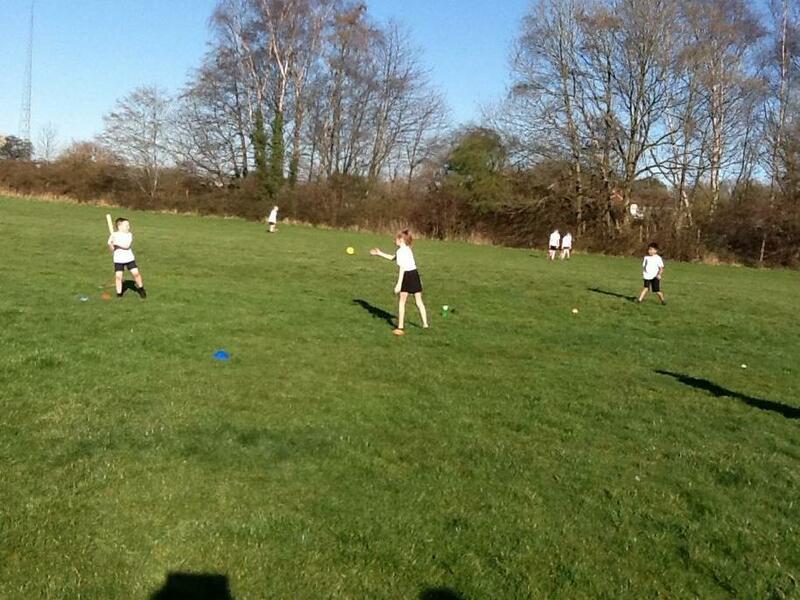 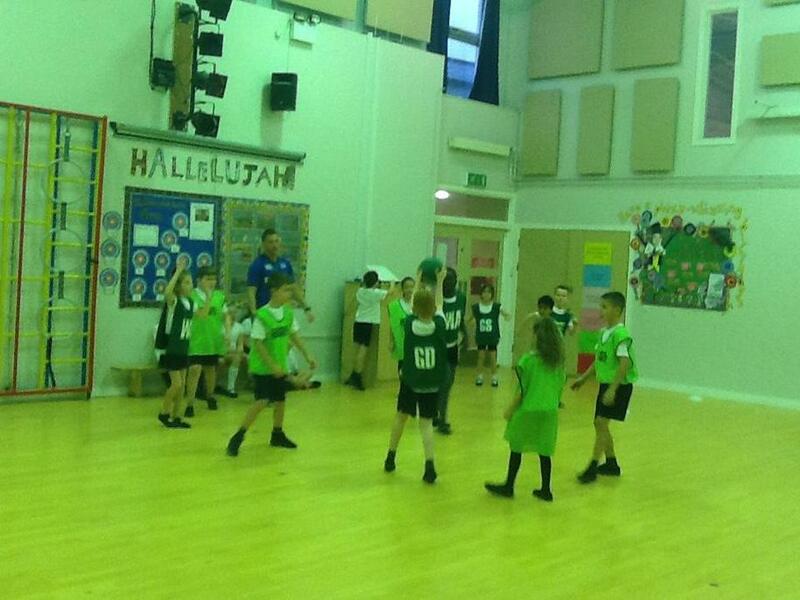 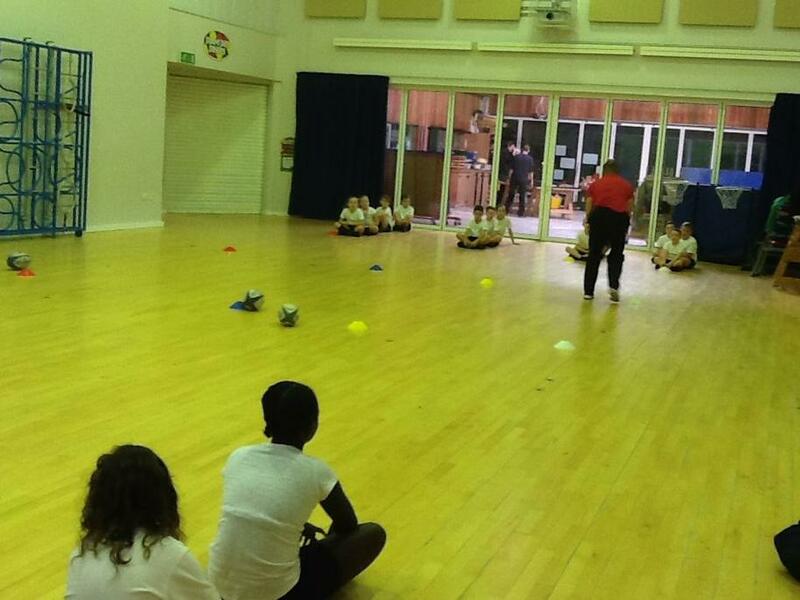 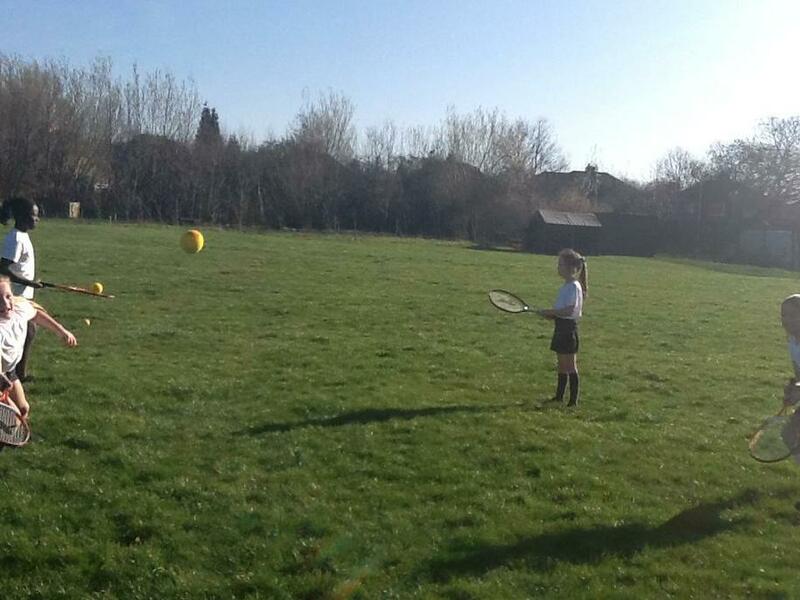 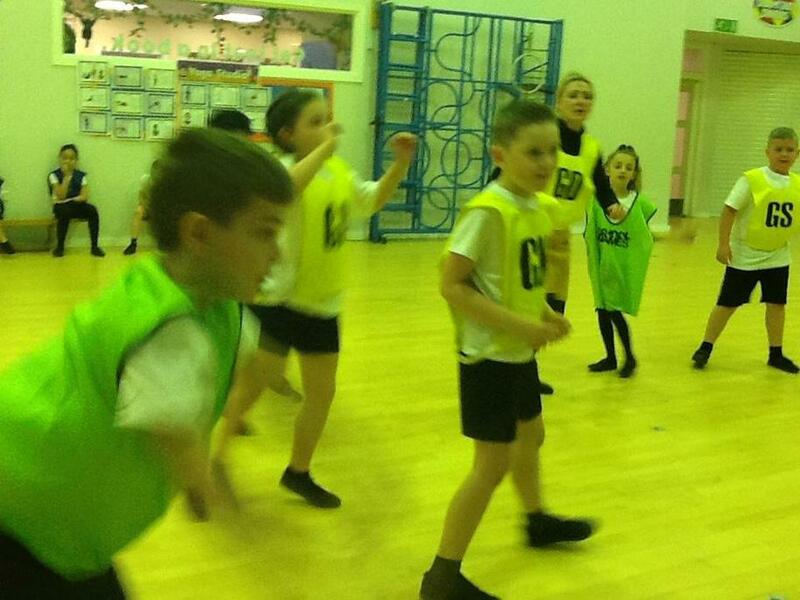 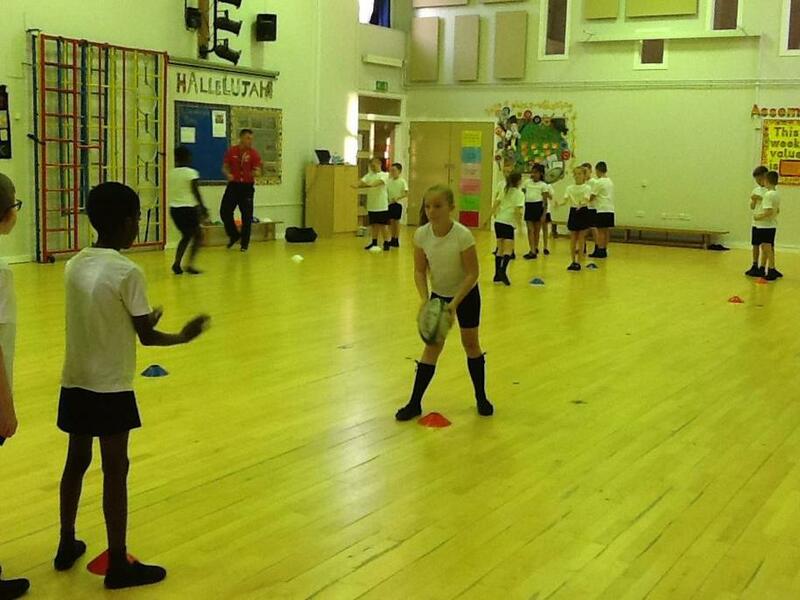 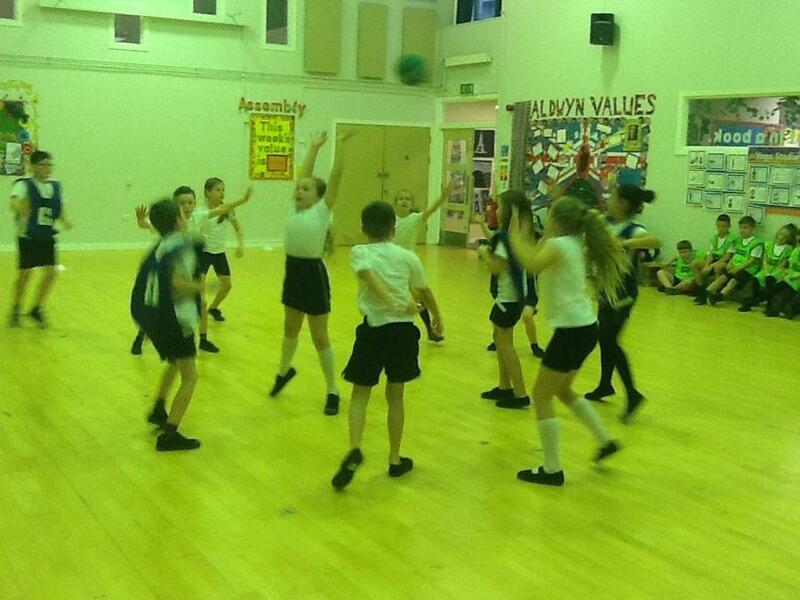 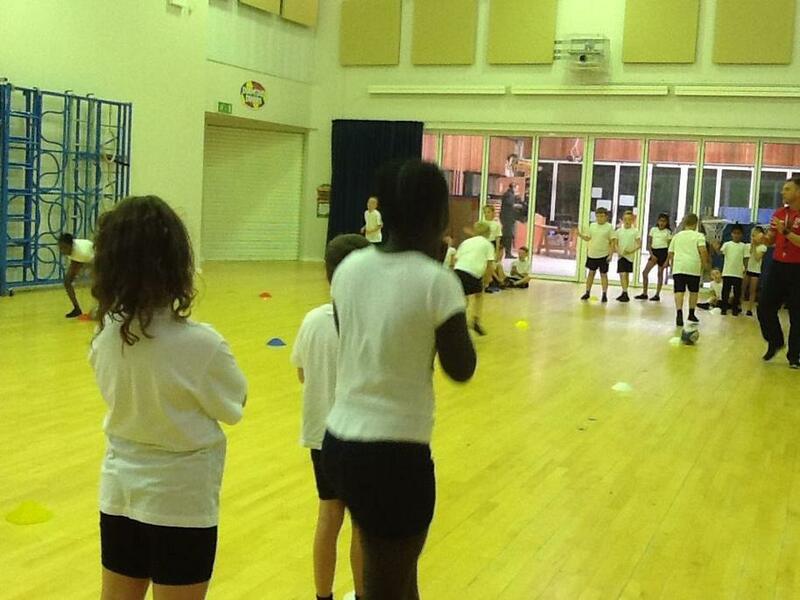 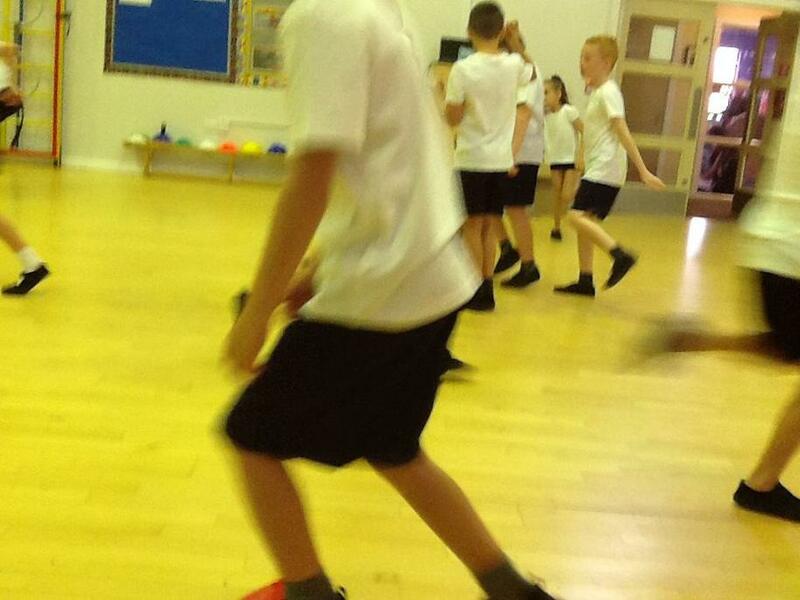 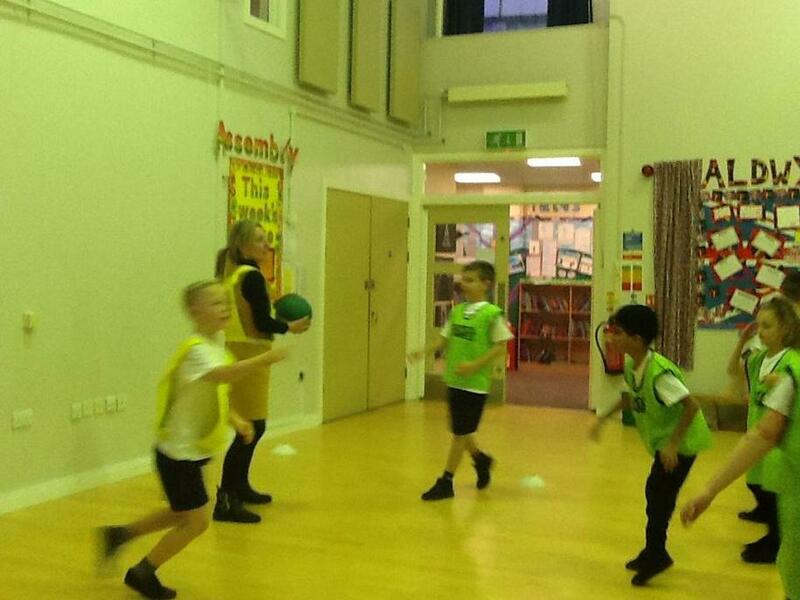 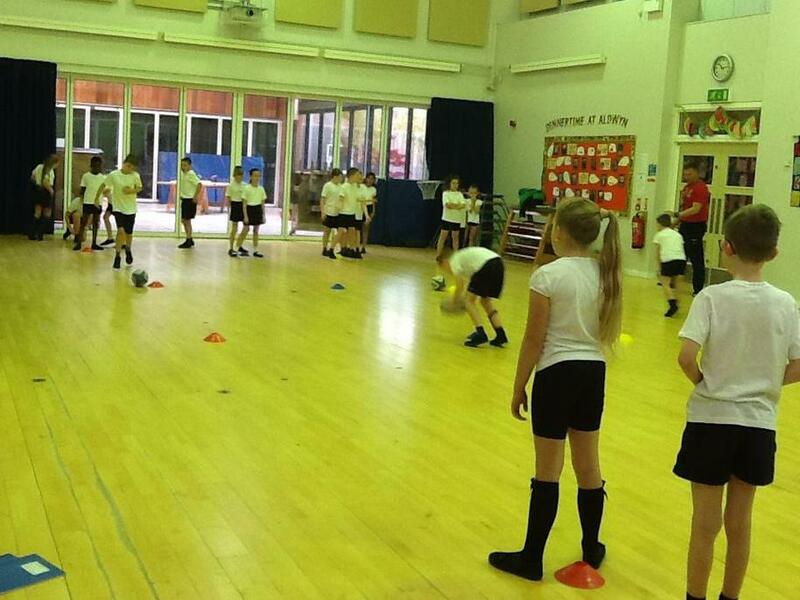 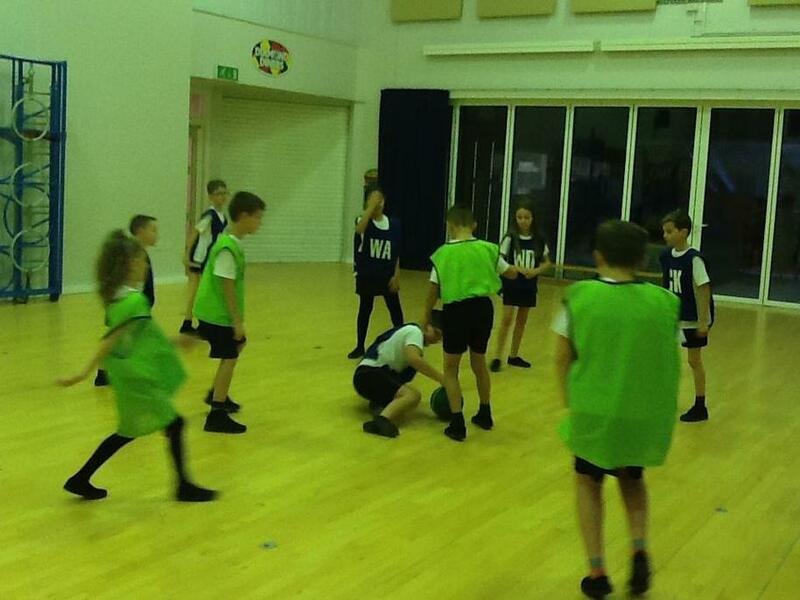 We have learnt invasion game skills ( 12 o'clock catch, pop pass, 6 o'clock pass and tri-scoring ) using rugby. 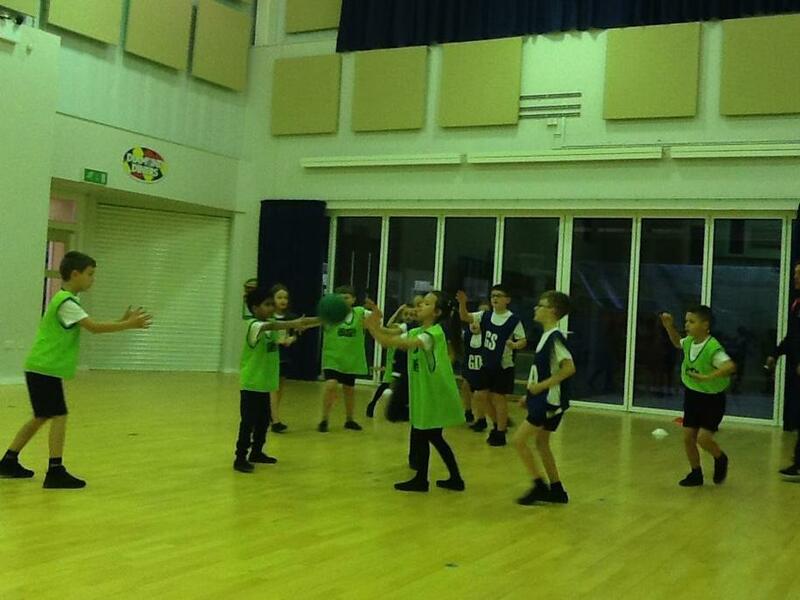 Today, Mr Rose taught us the importance of formation when playing team ball games. 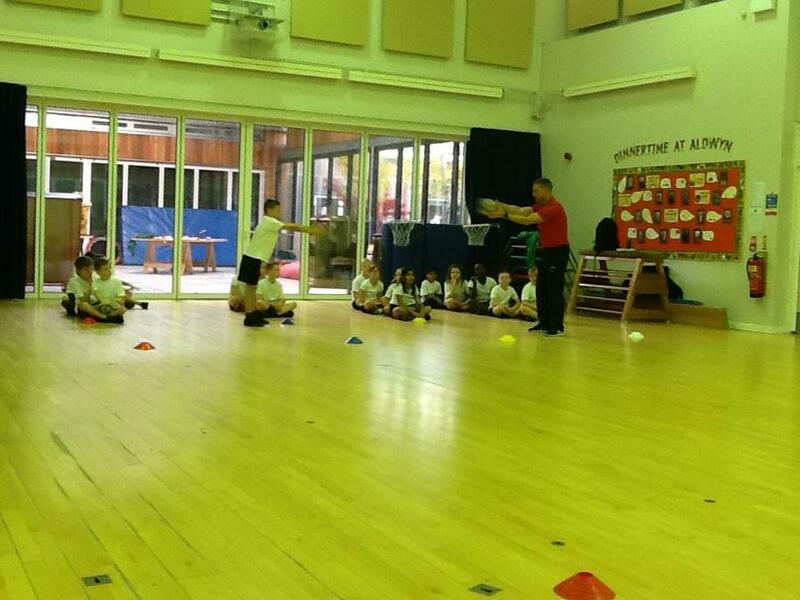 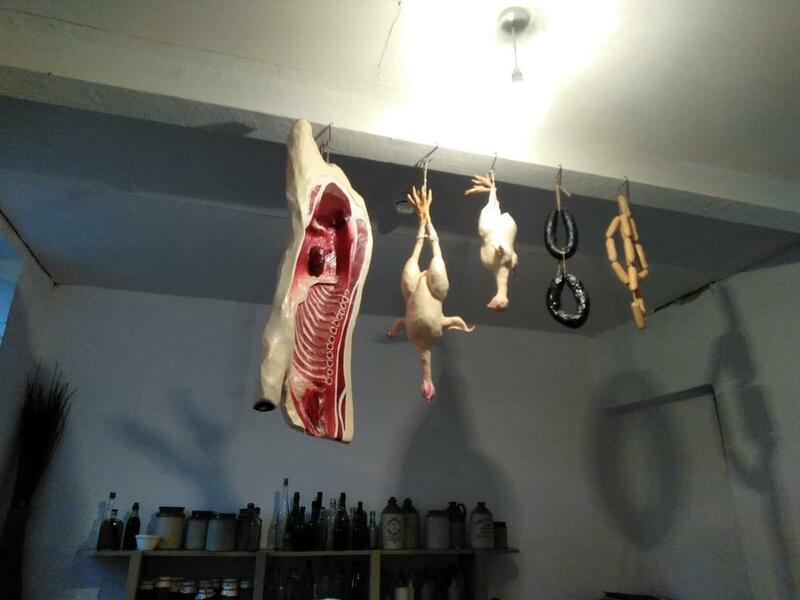 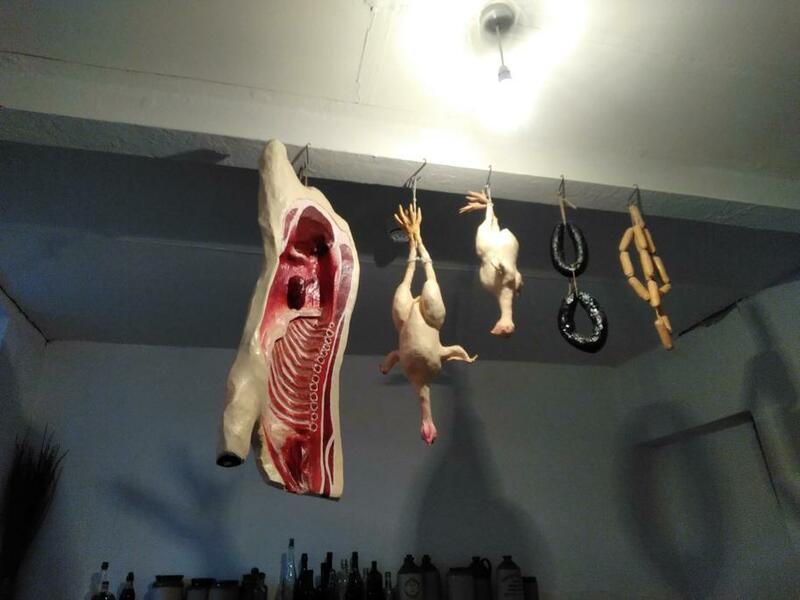 Today, Mr Rose taught our class the importance of 'Game Management.' 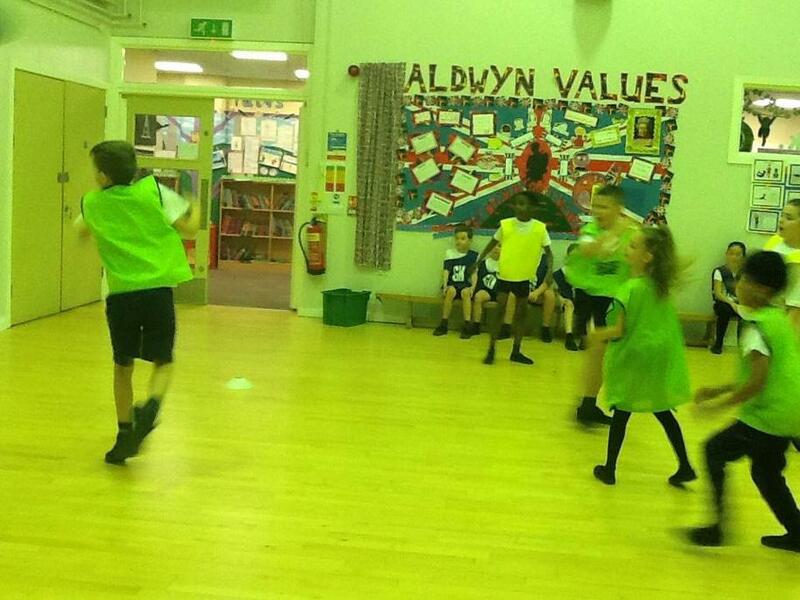 This is a strategy used to read the players on the opposing team, intercept the ball to win the game. 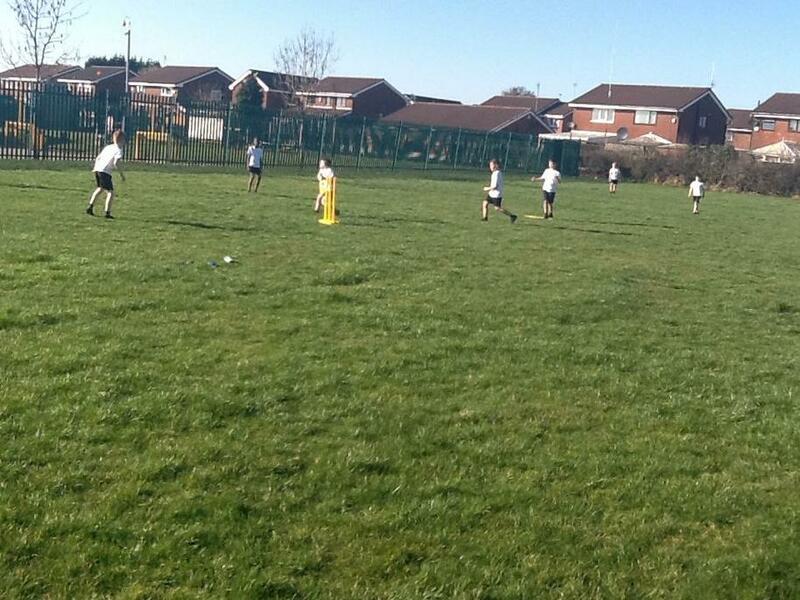 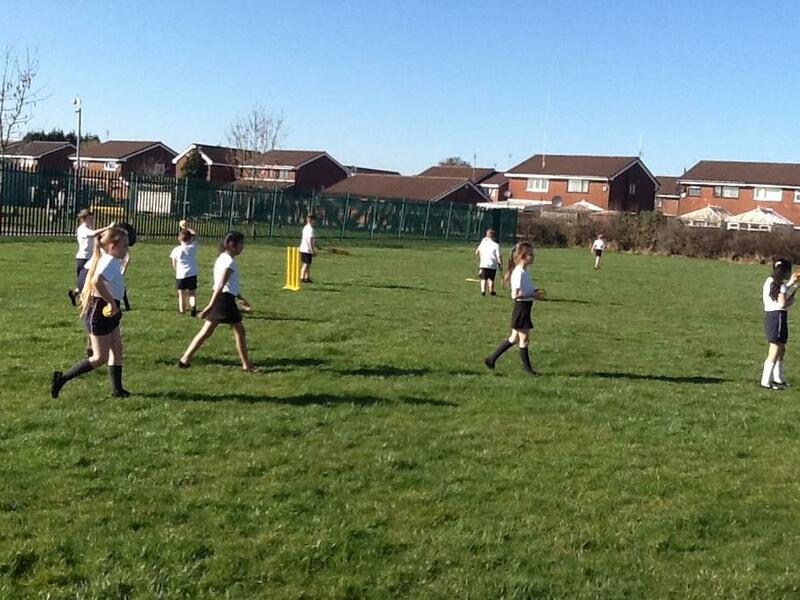 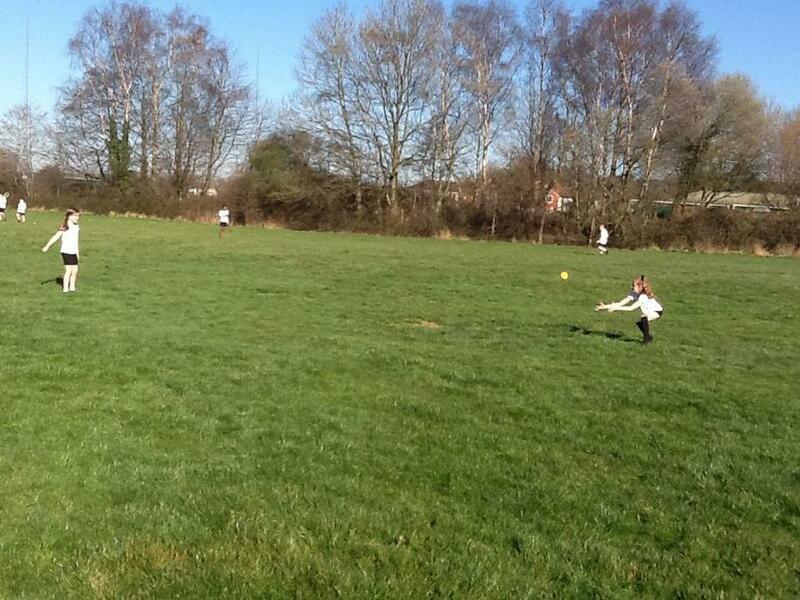 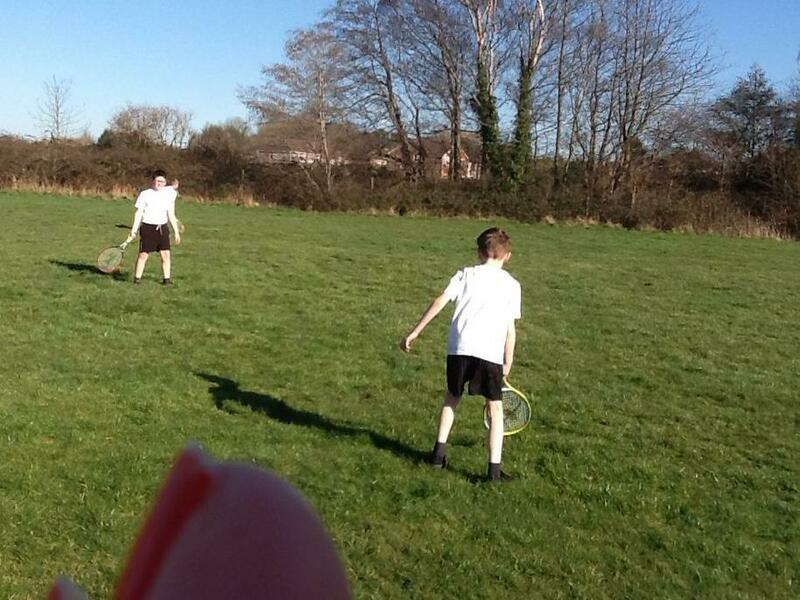 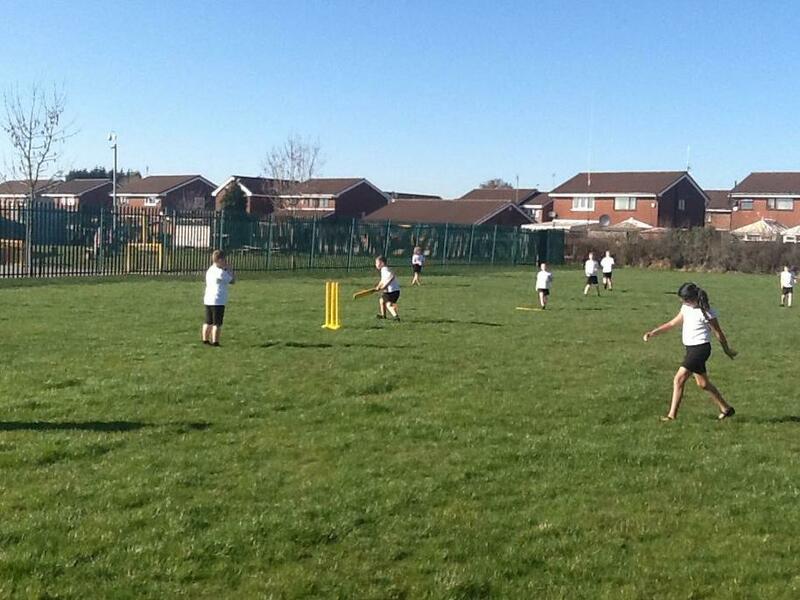 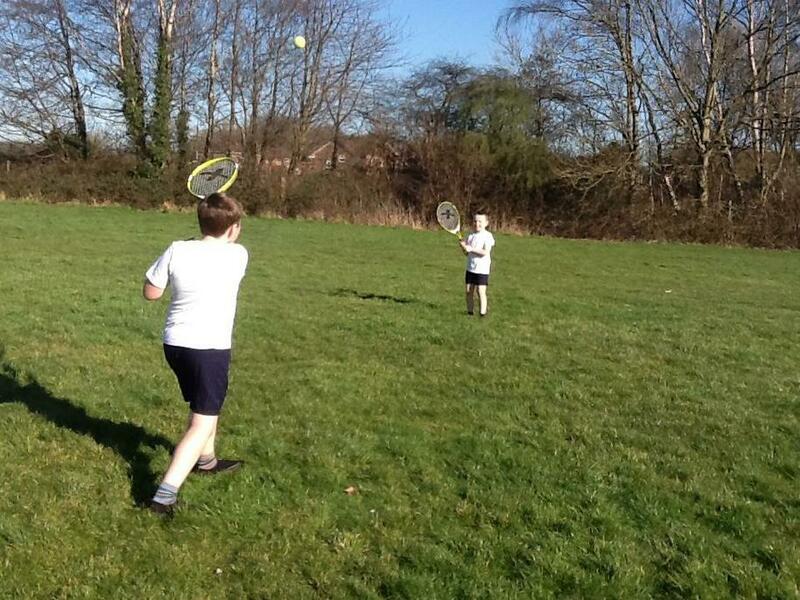 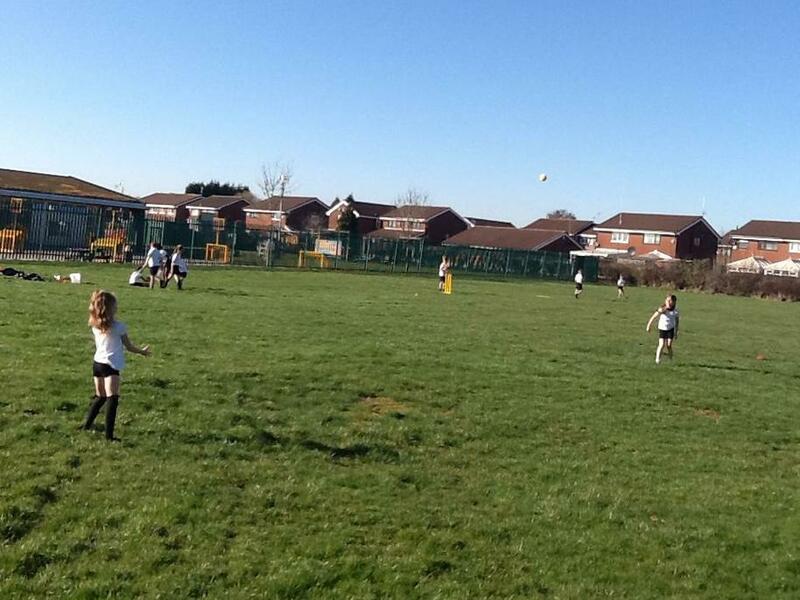 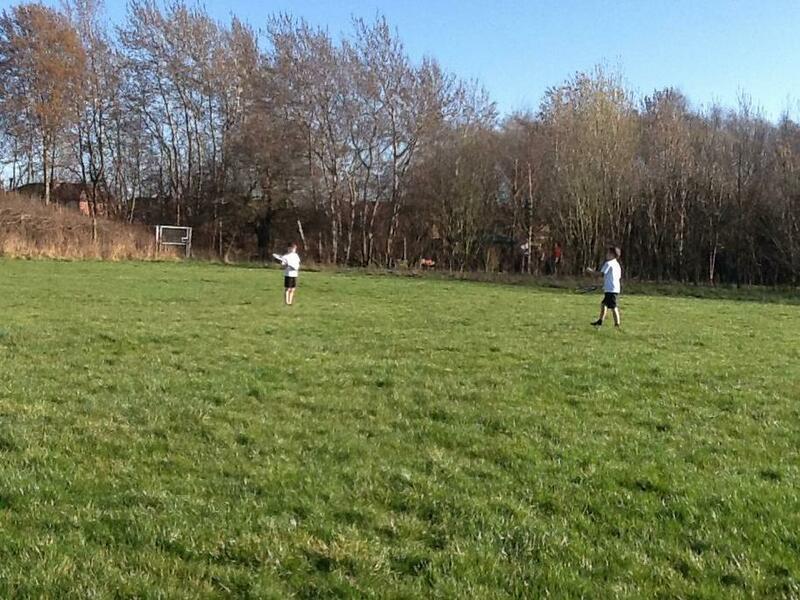 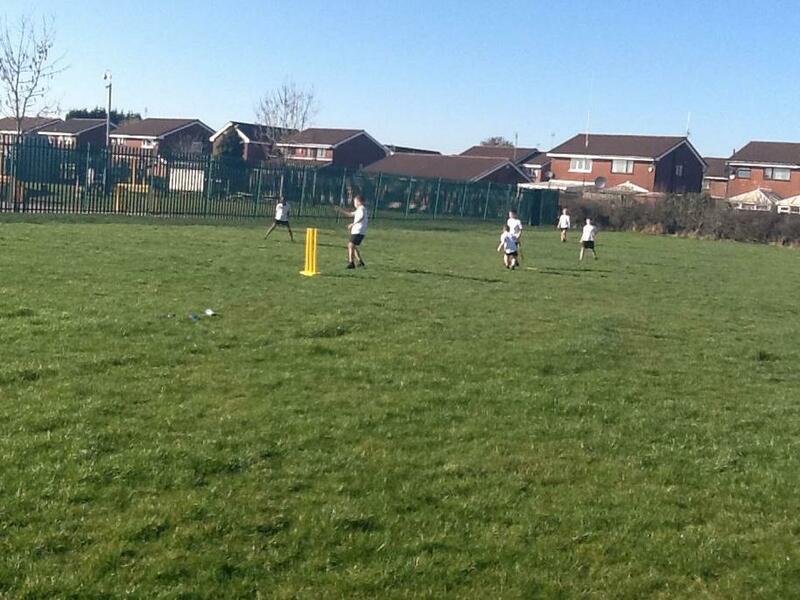 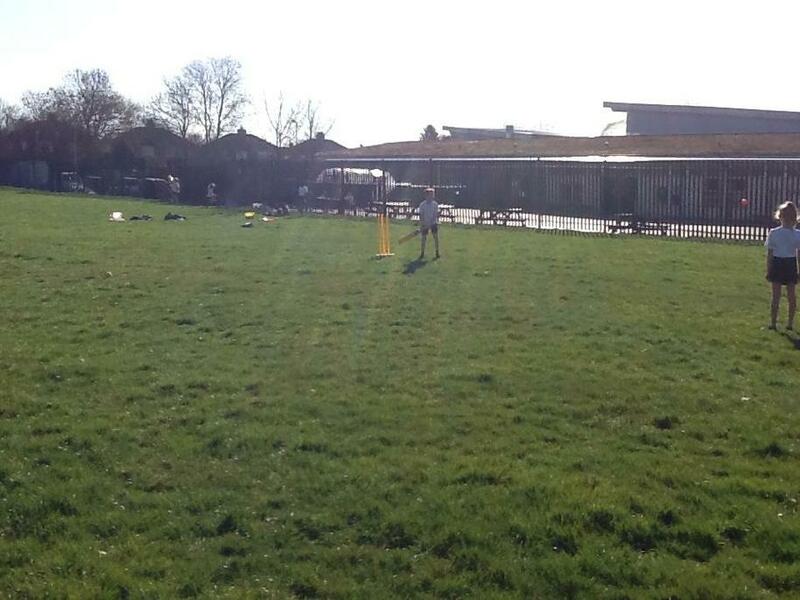 Today, our class were lucky enough to practise our bat and ball skills outside o n the school field. 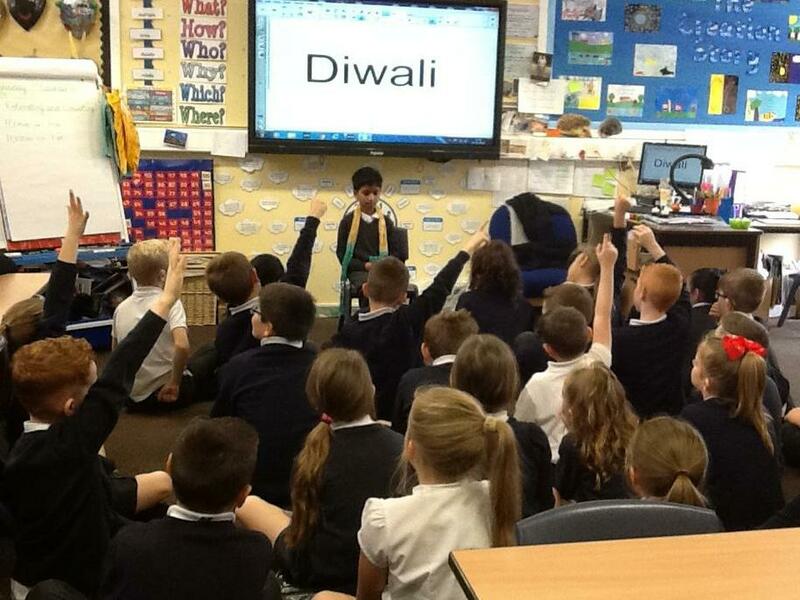 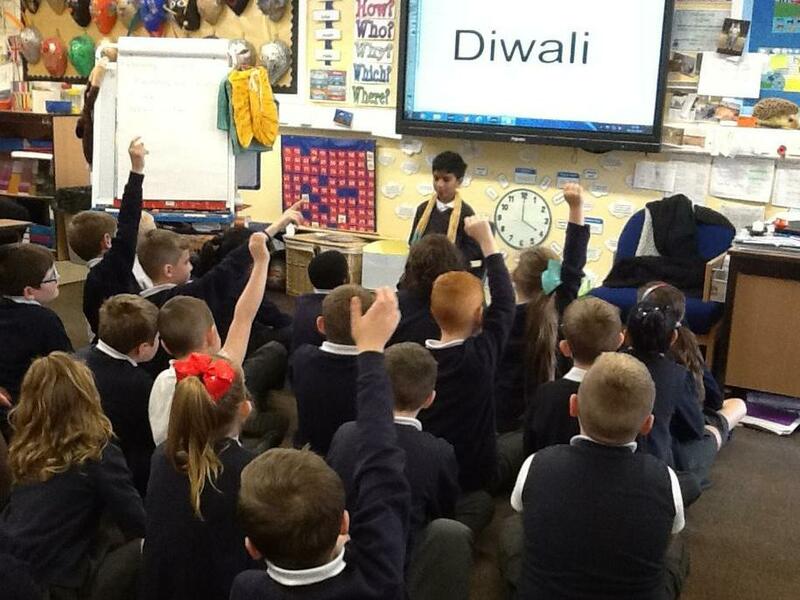 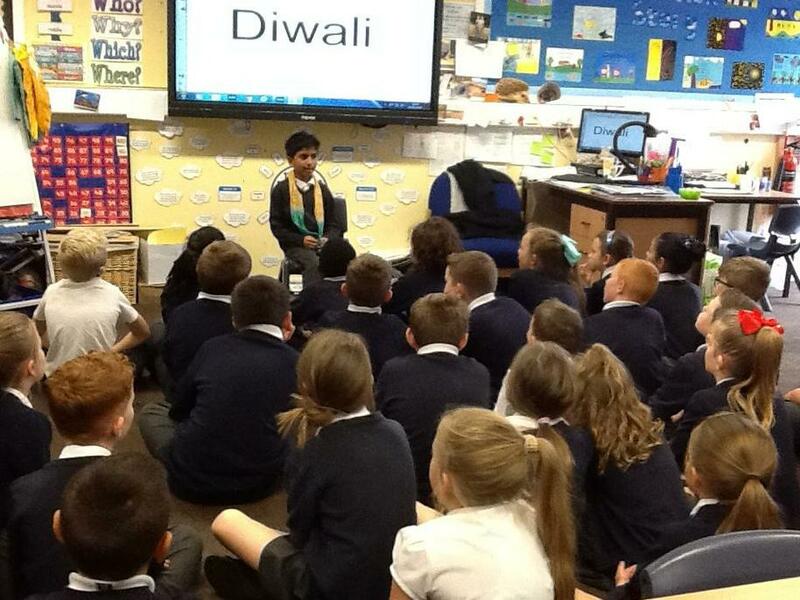 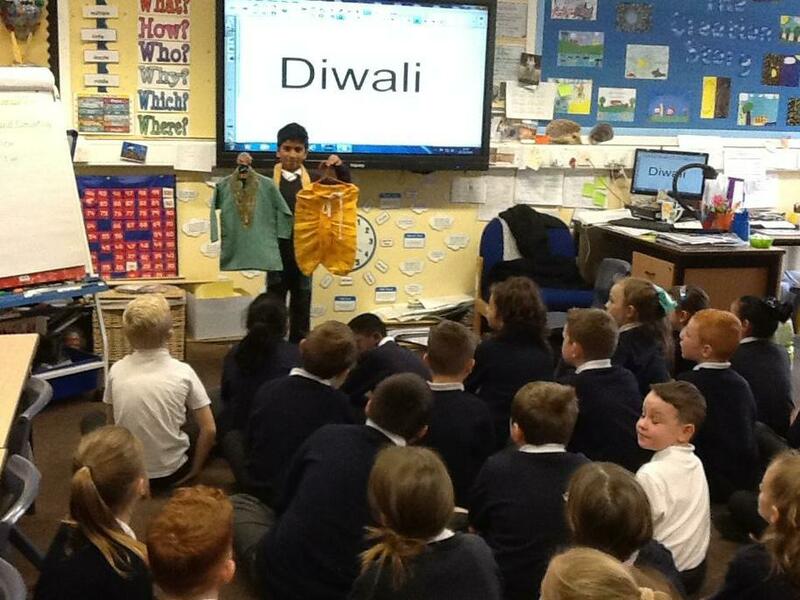 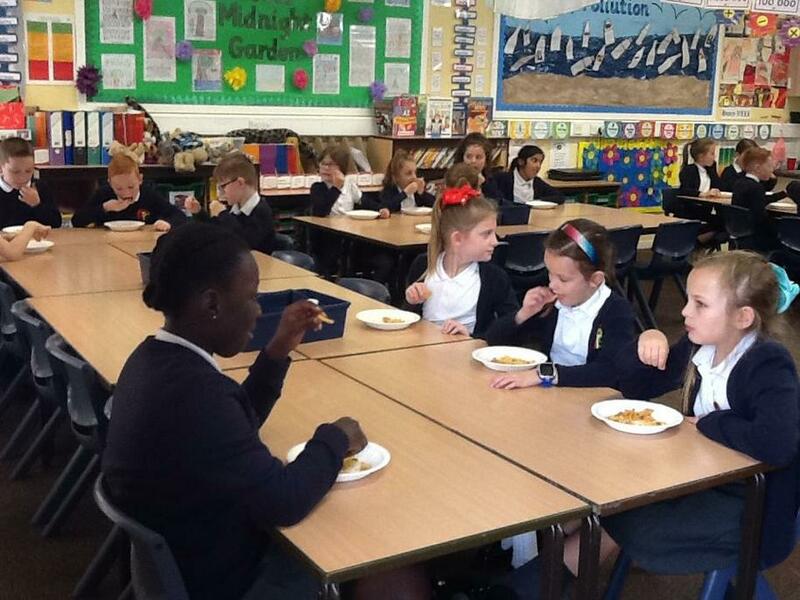 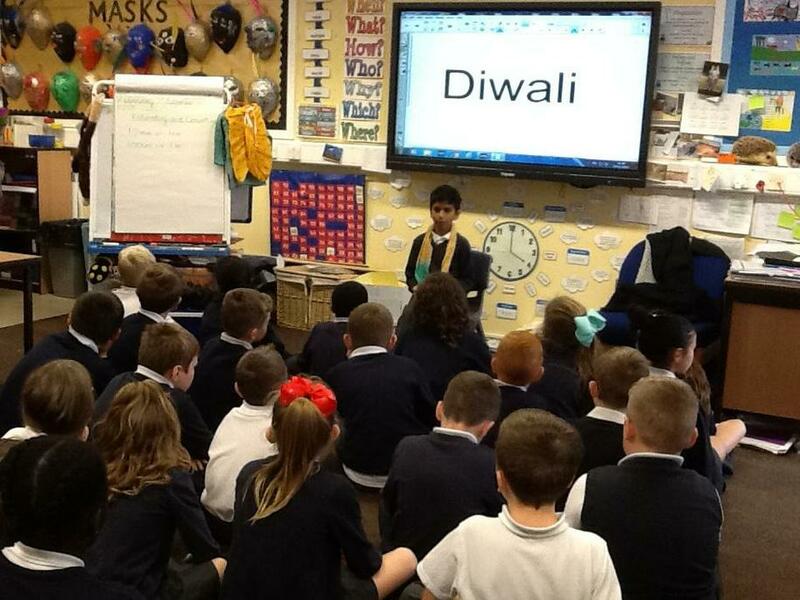 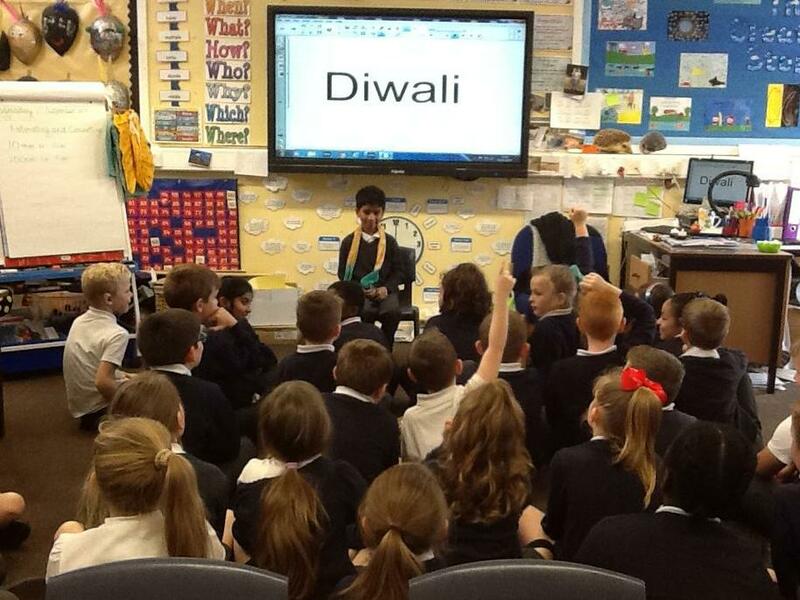 Today, Wednesday 7th November, we celebrated Diwali with Dhilan. 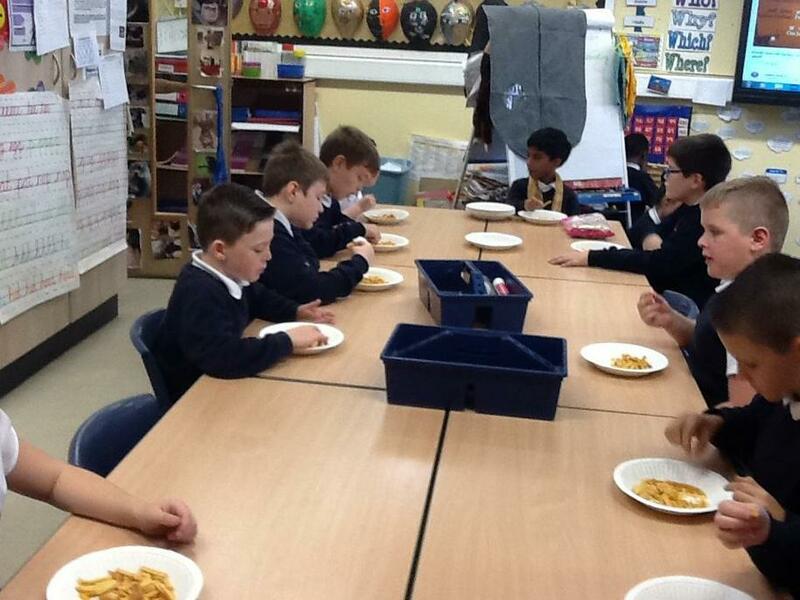 We tasted chakri, plain gathia, sev mamra and sakapara as we listened to Indian music. 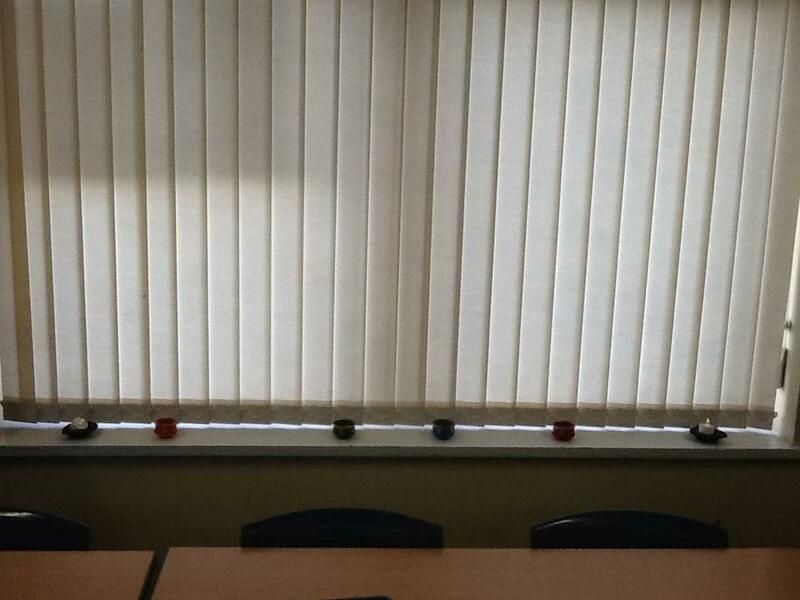 We placed candles on the window ledge to help guide Rama and Sita home. 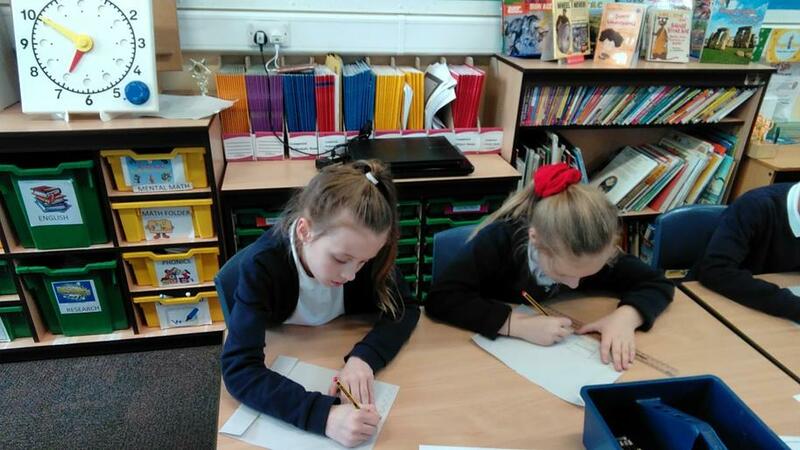 Our class, have finally designed and created calendars for 2019. 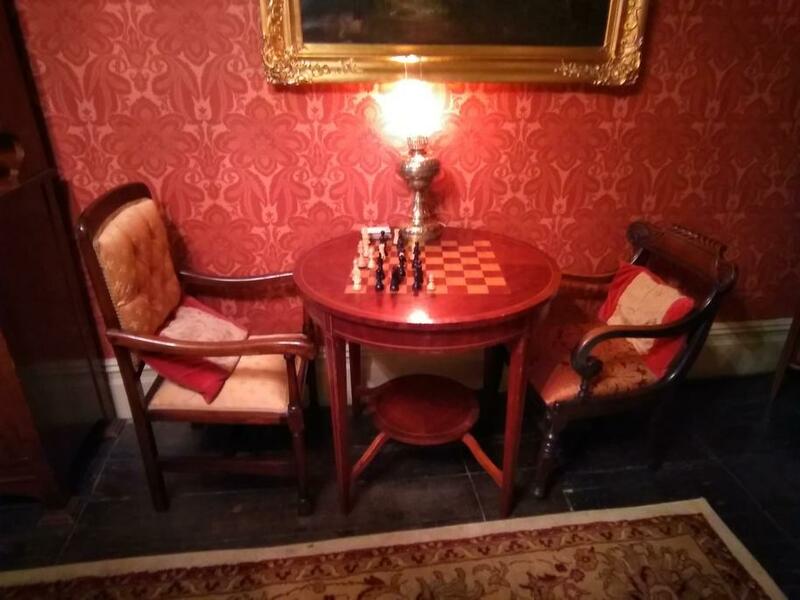 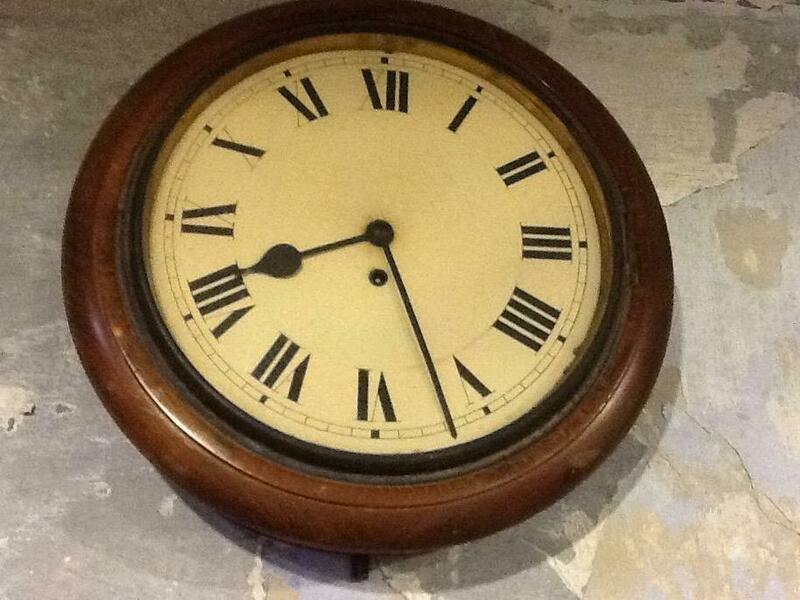 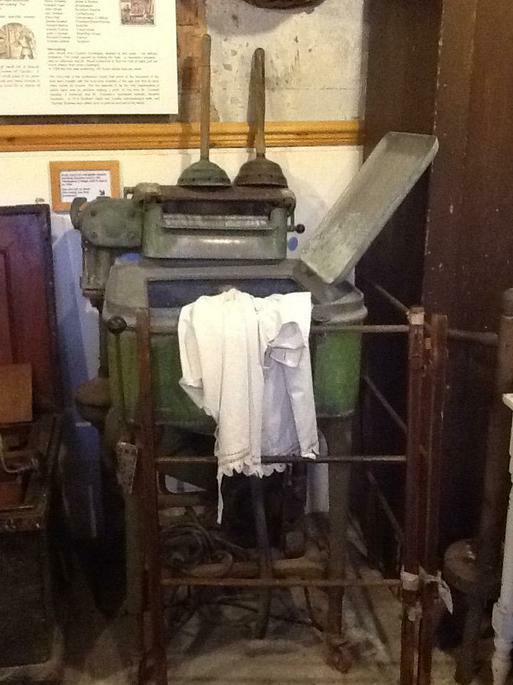 We will never be late for an appointment again. 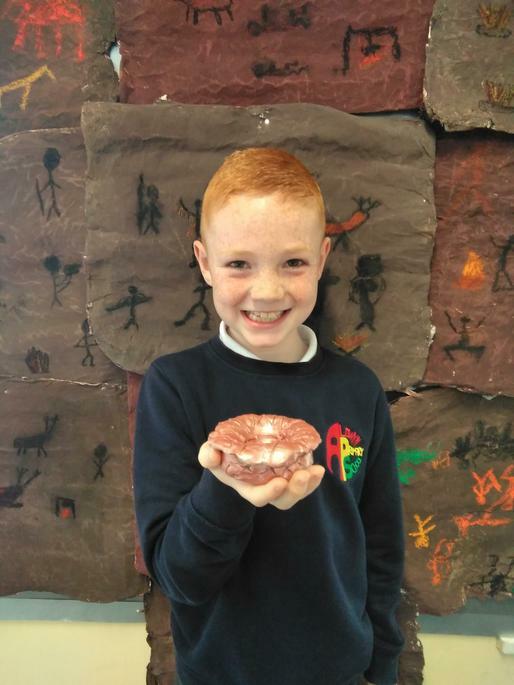 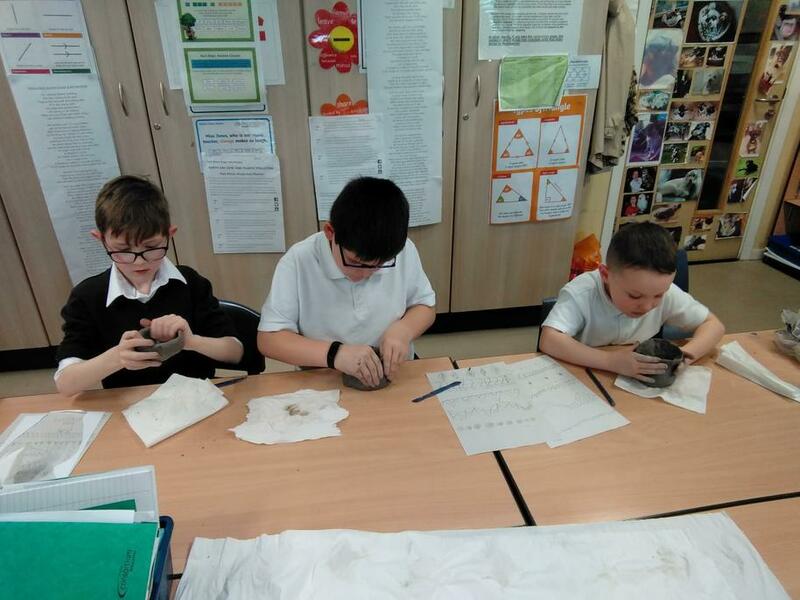 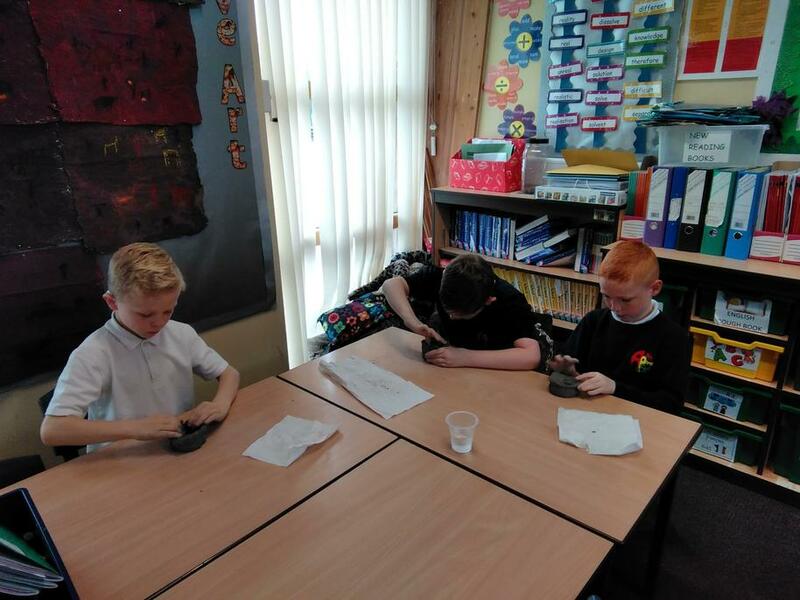 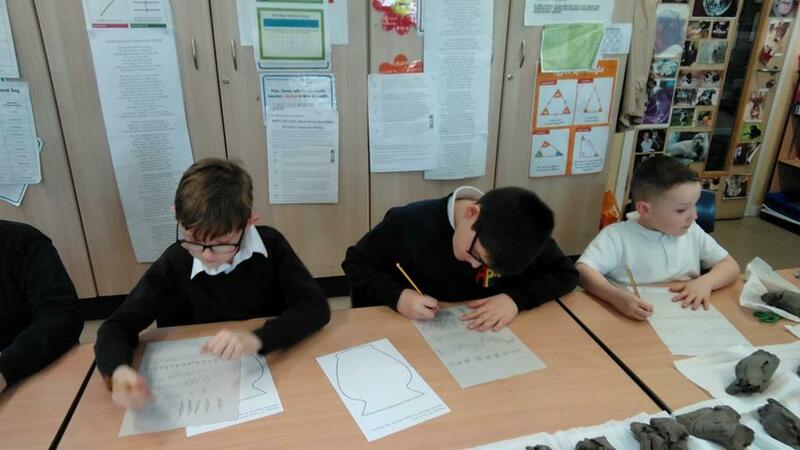 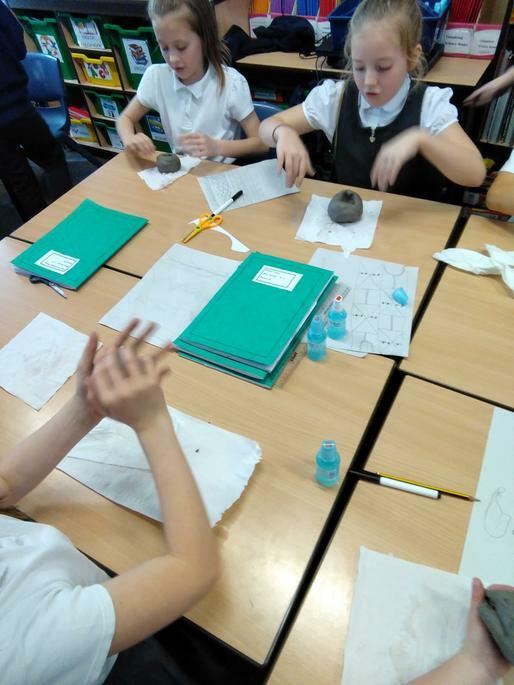 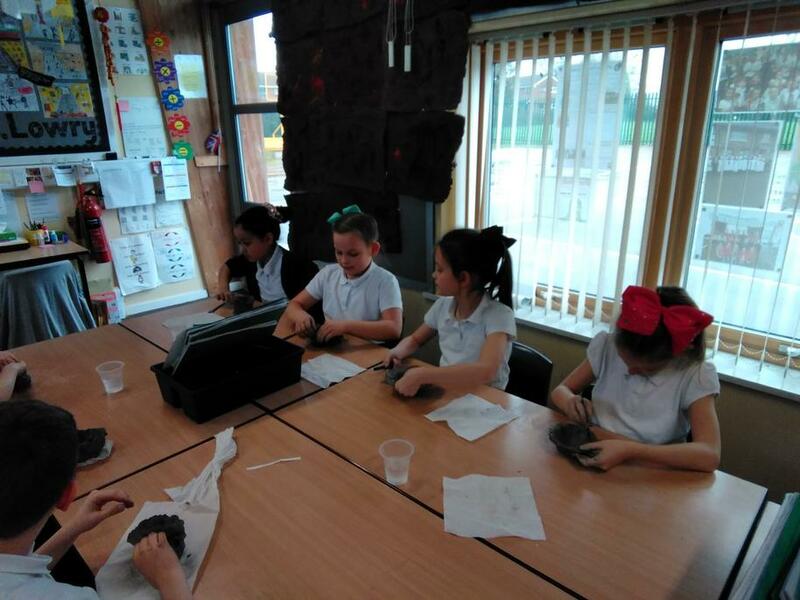 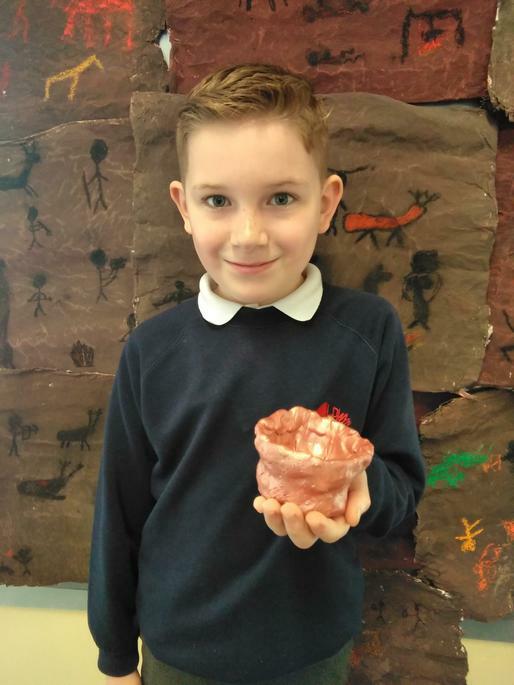 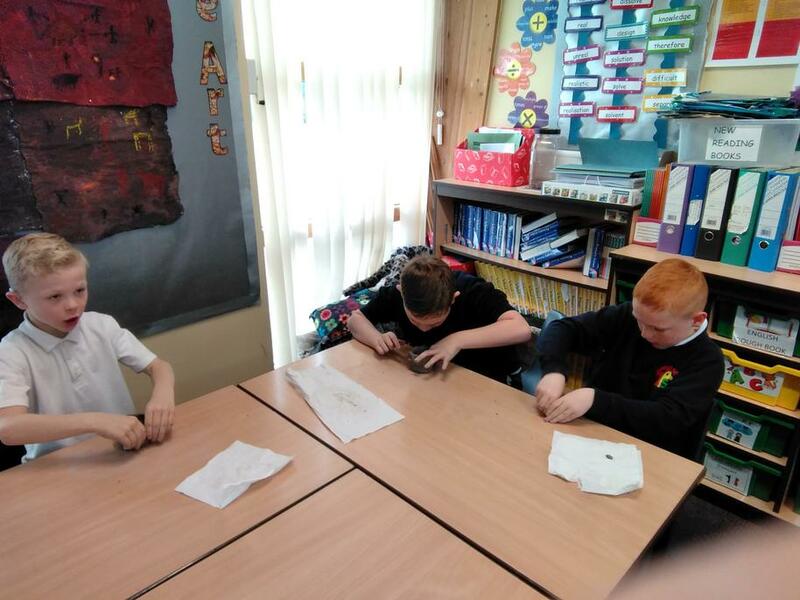 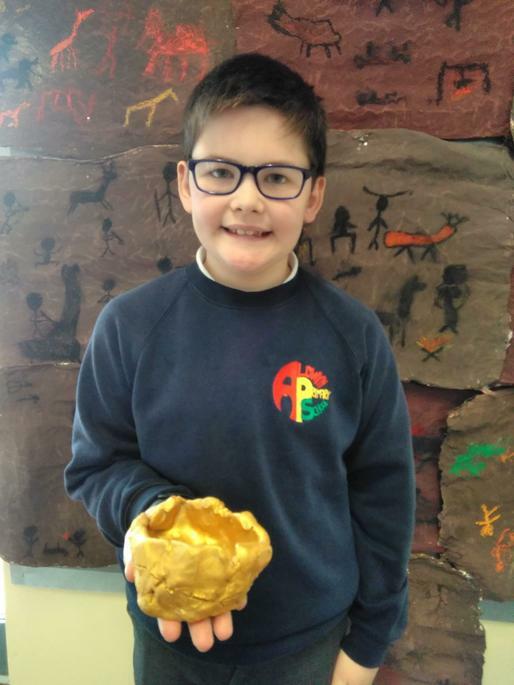 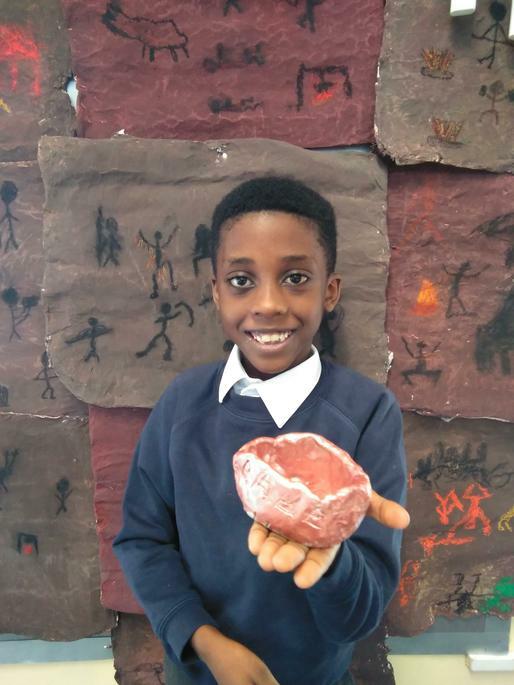 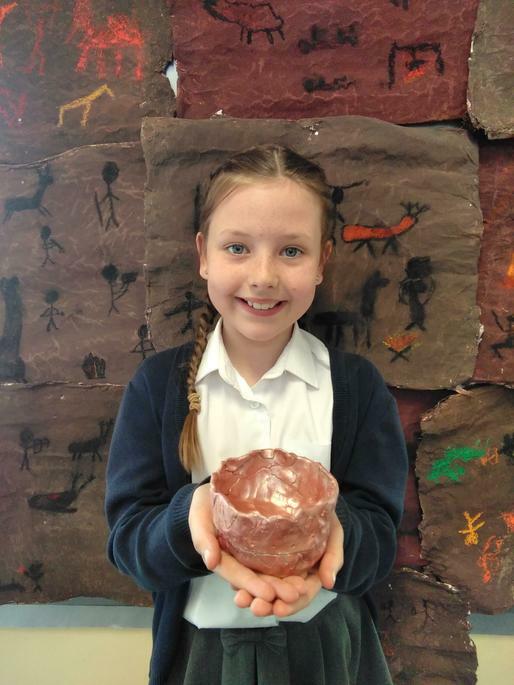 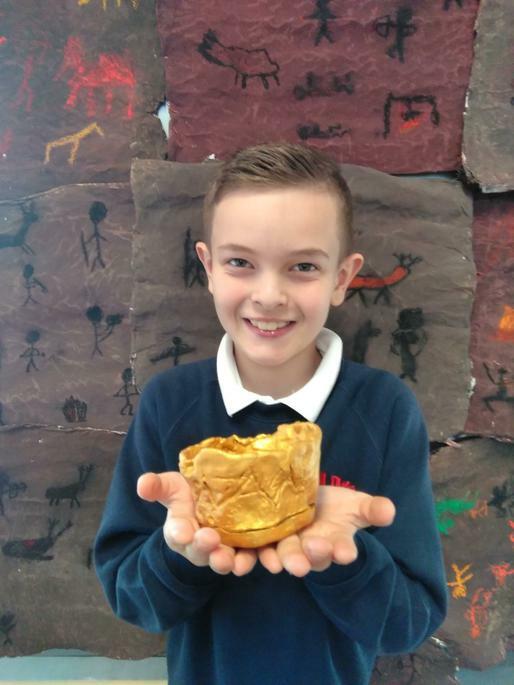 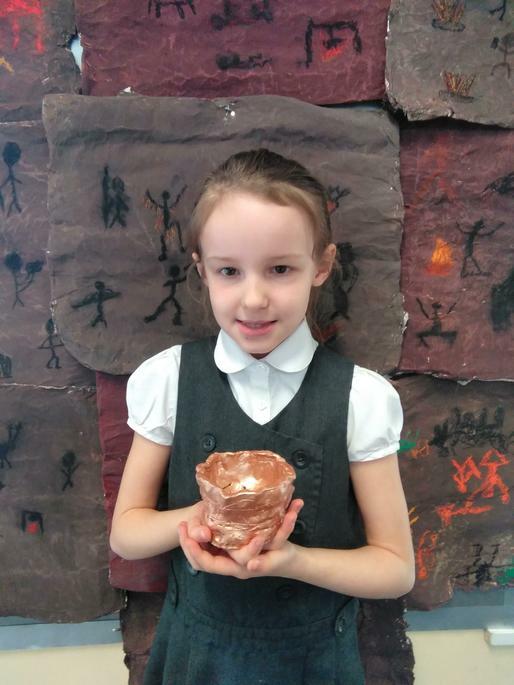 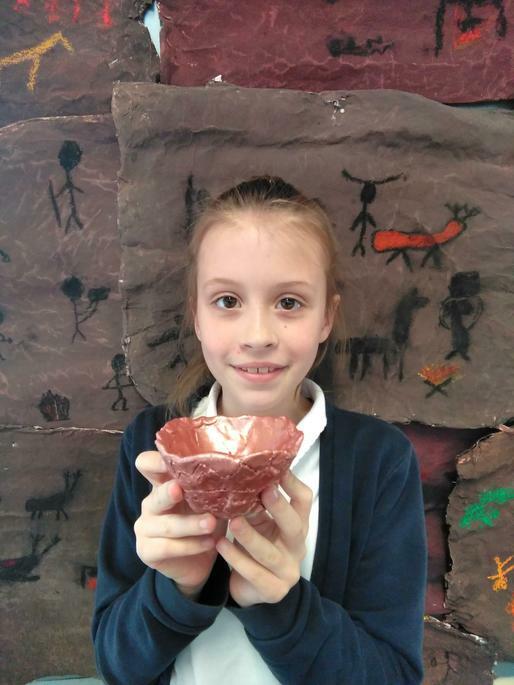 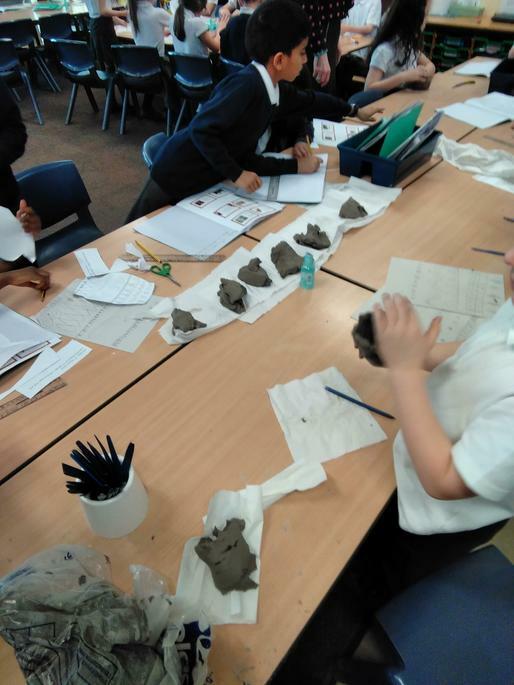 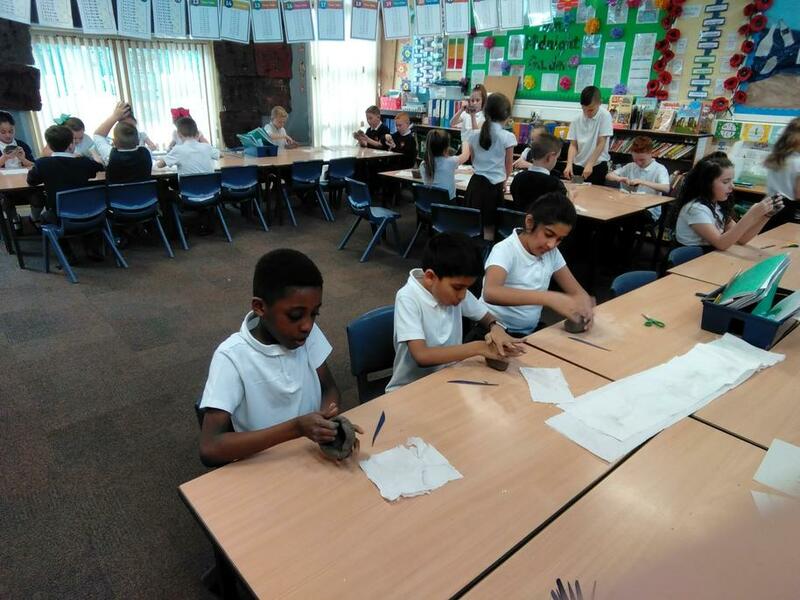 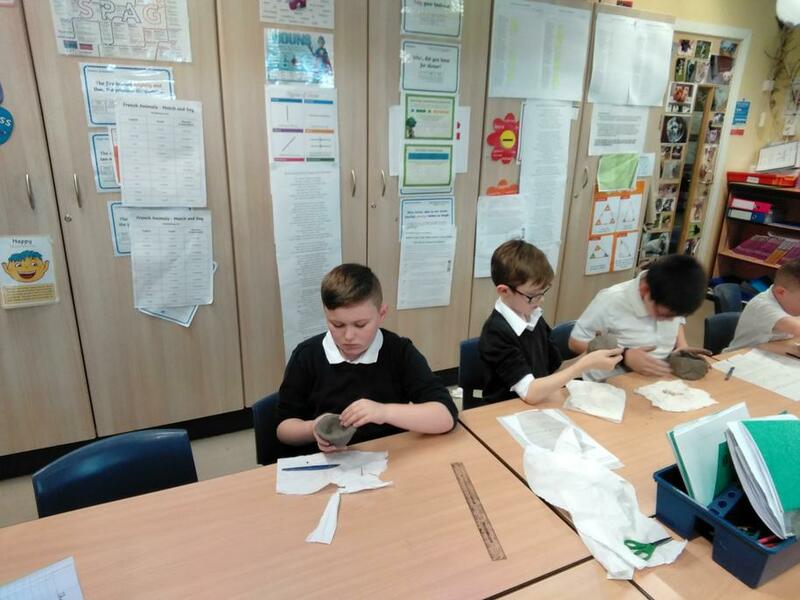 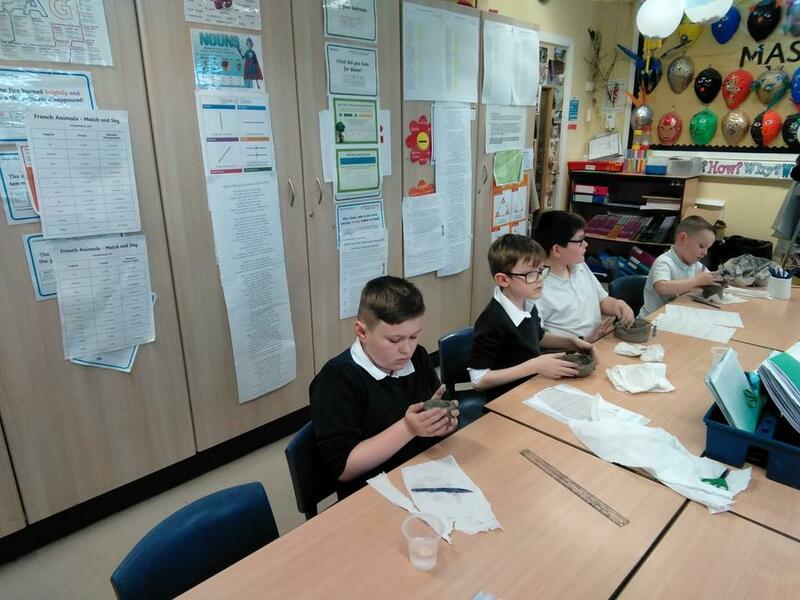 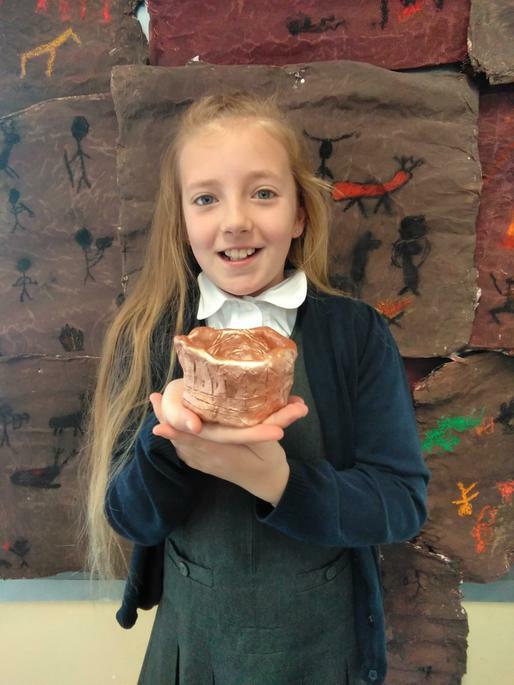 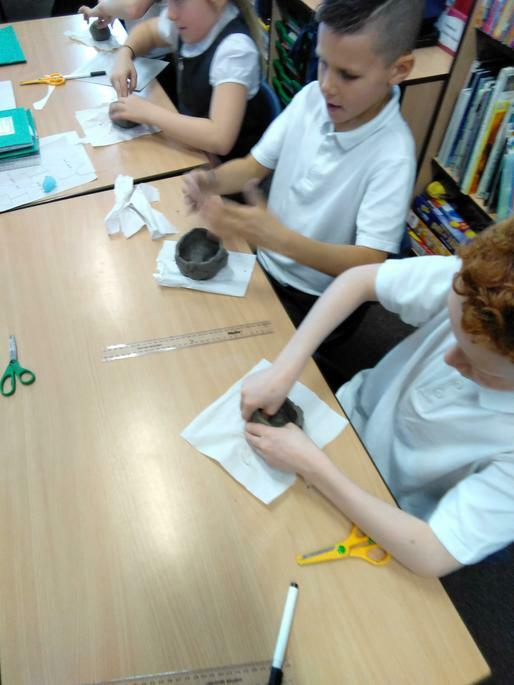 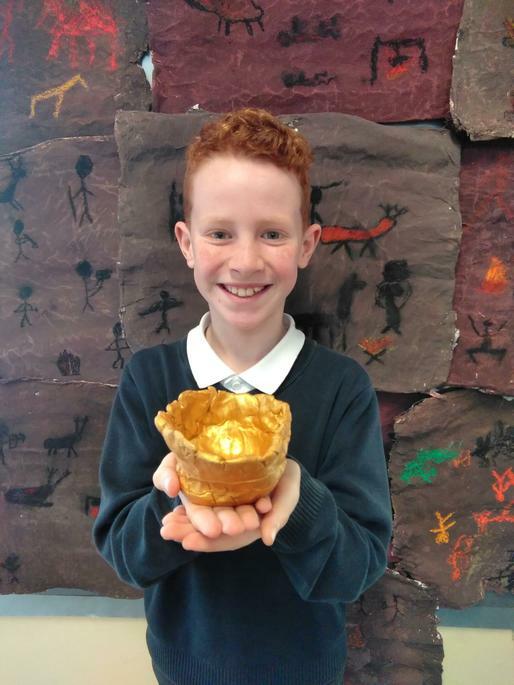 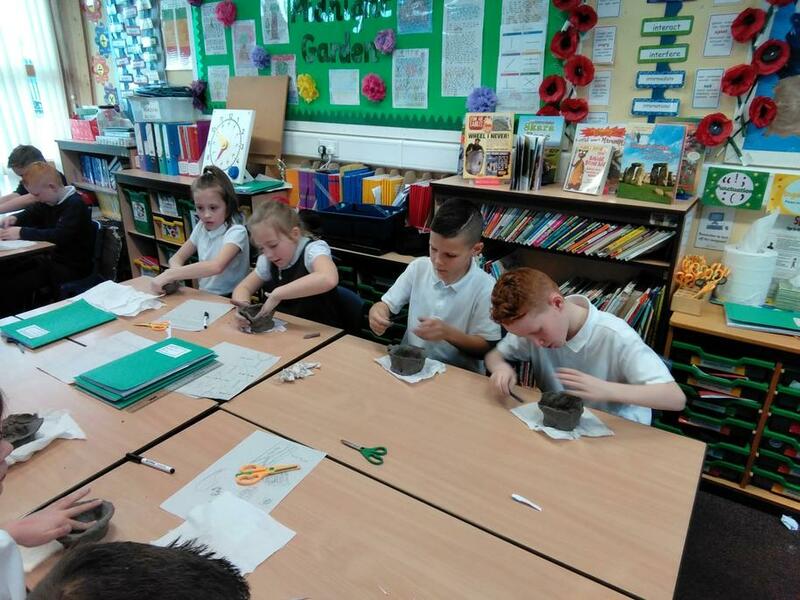 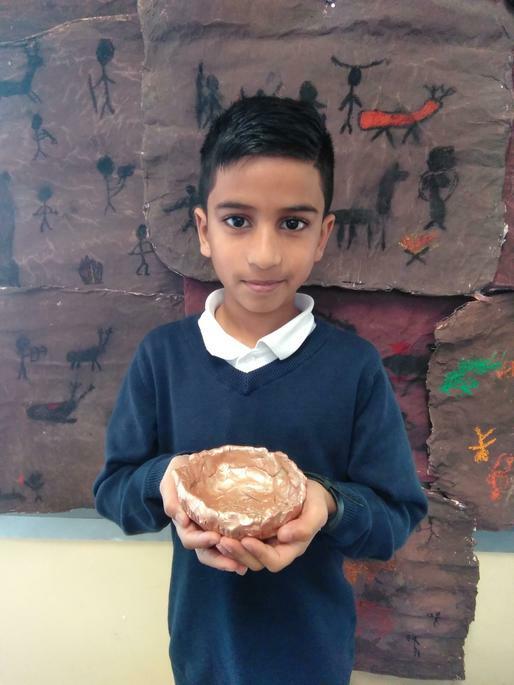 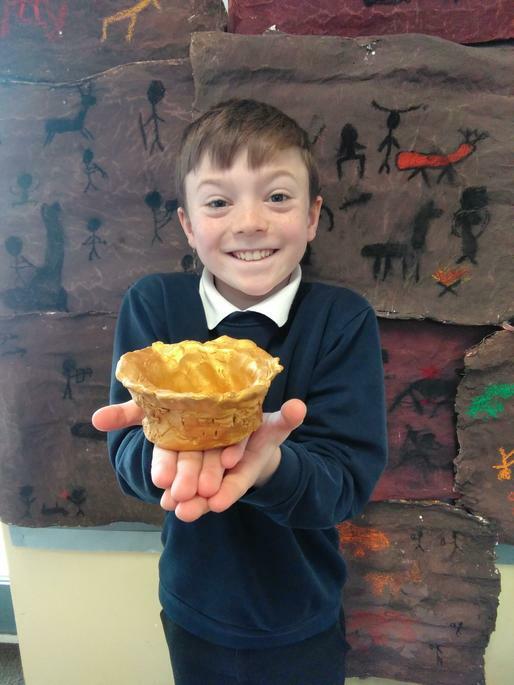 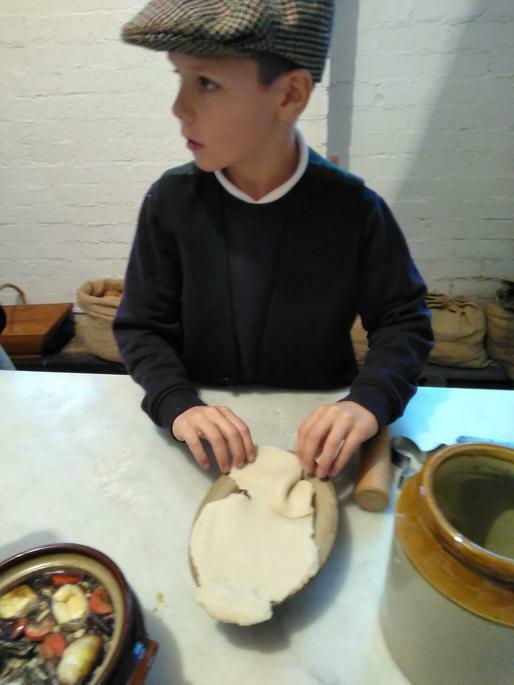 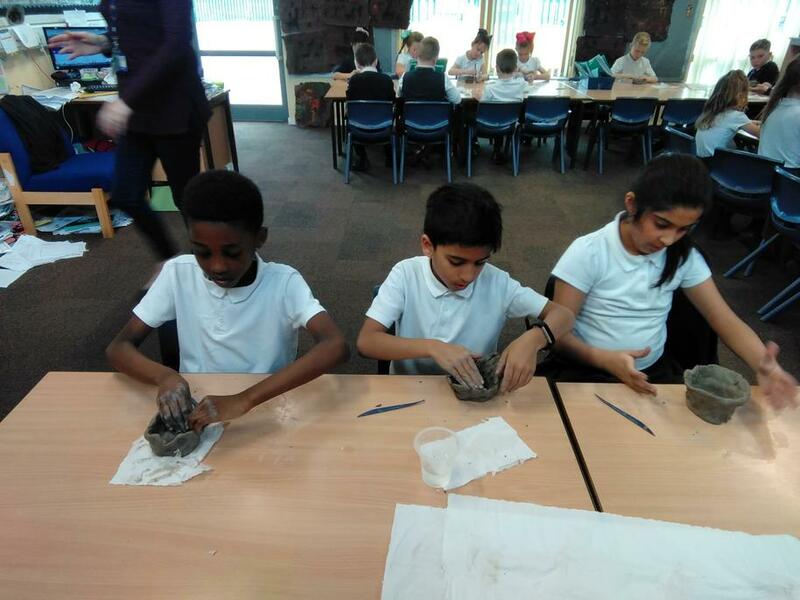 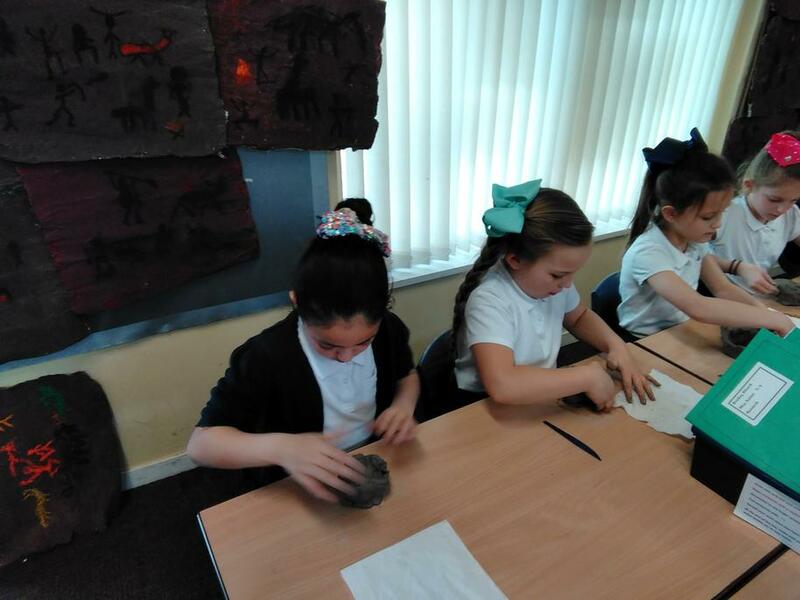 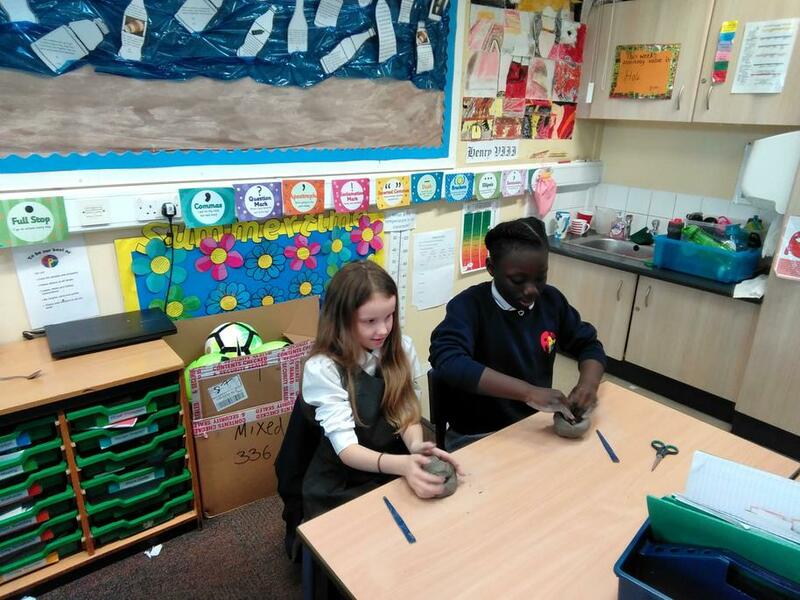 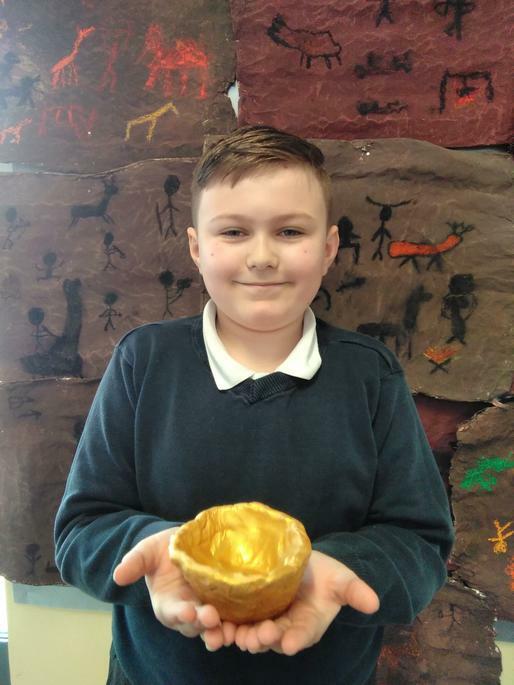 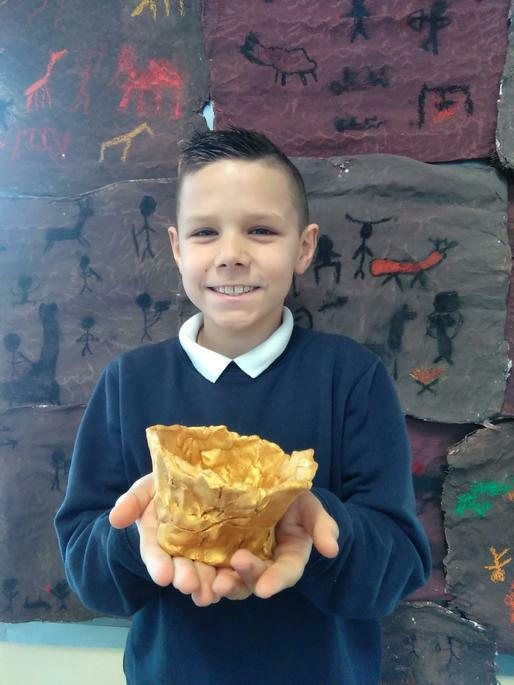 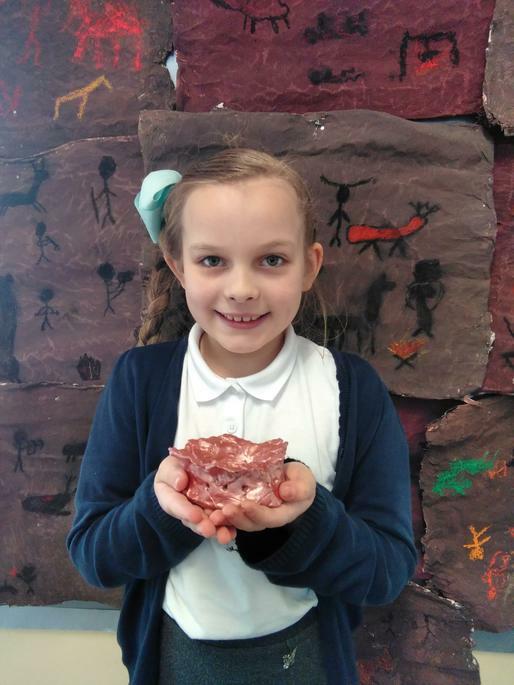 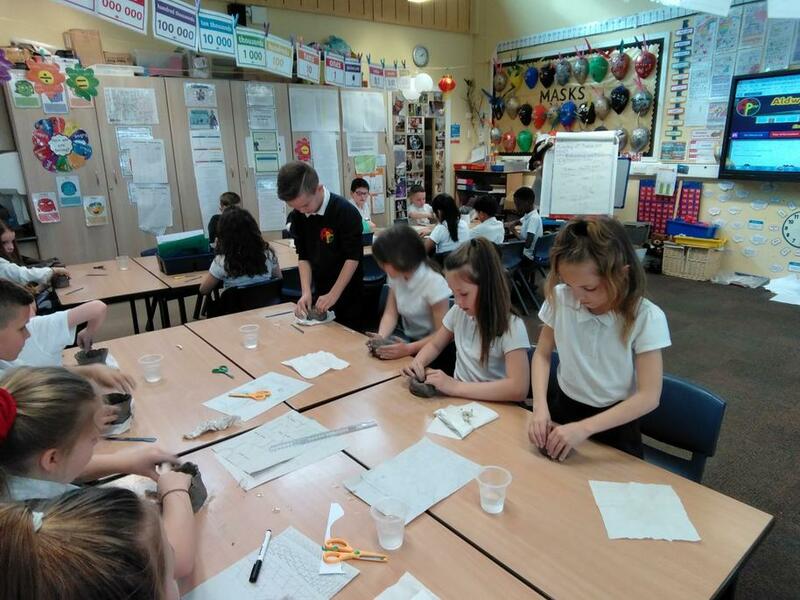 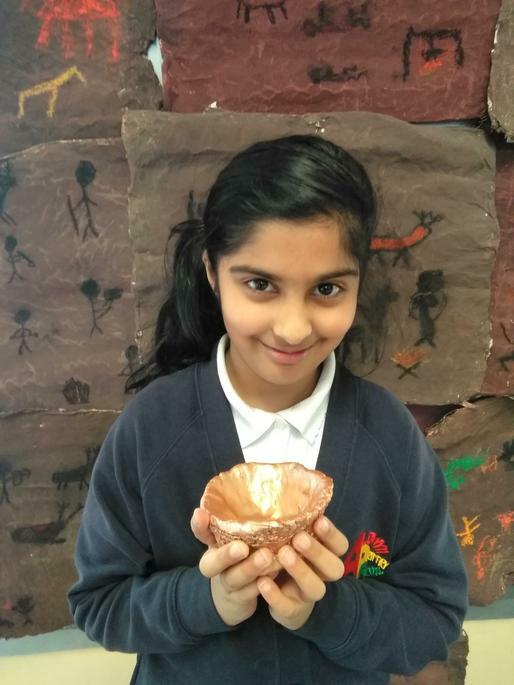 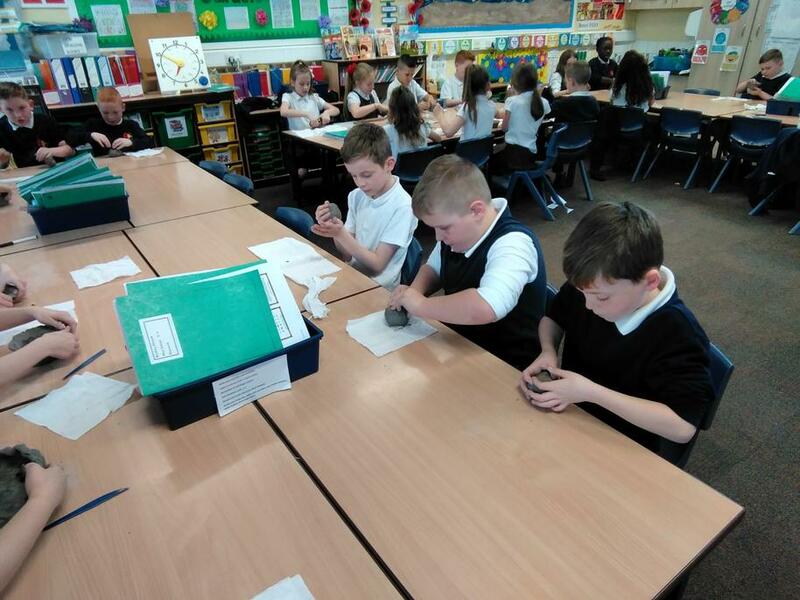 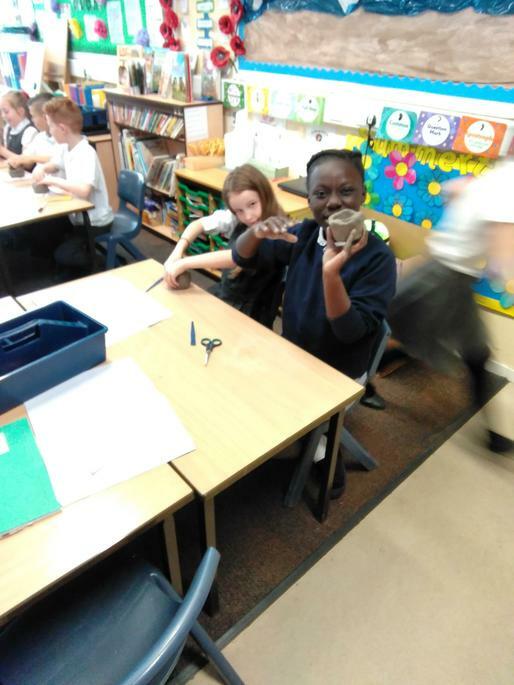 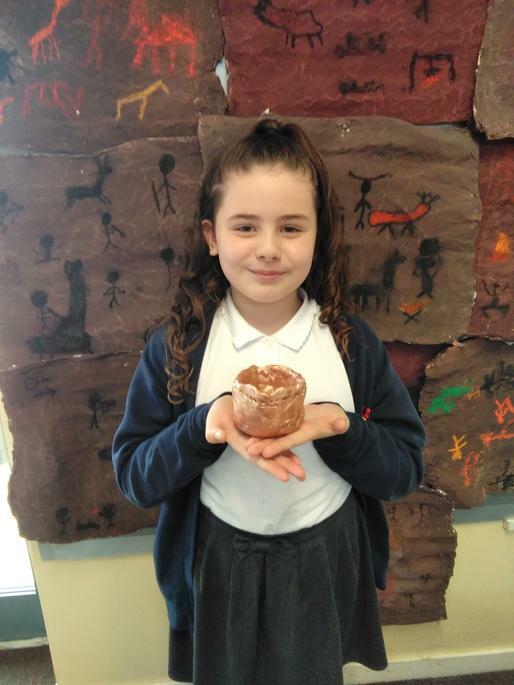 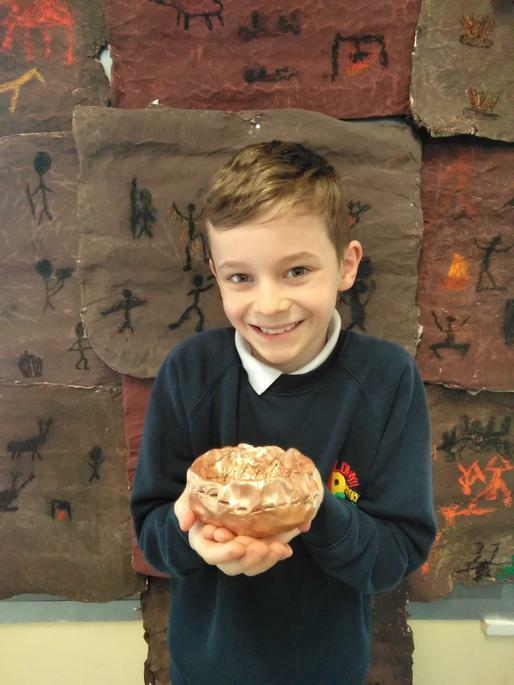 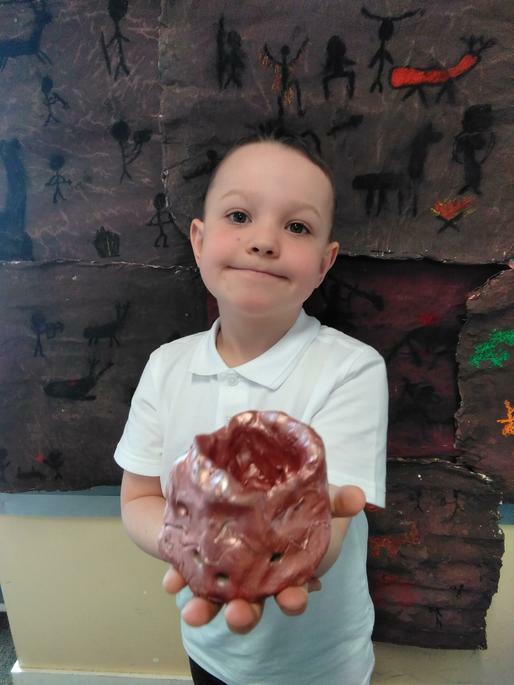 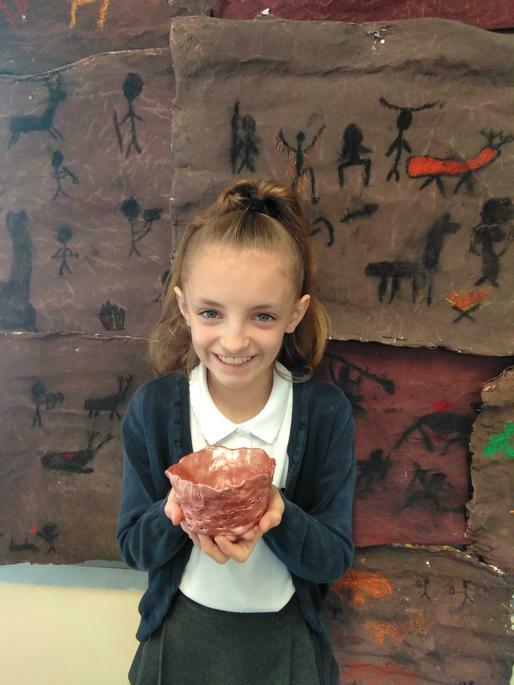 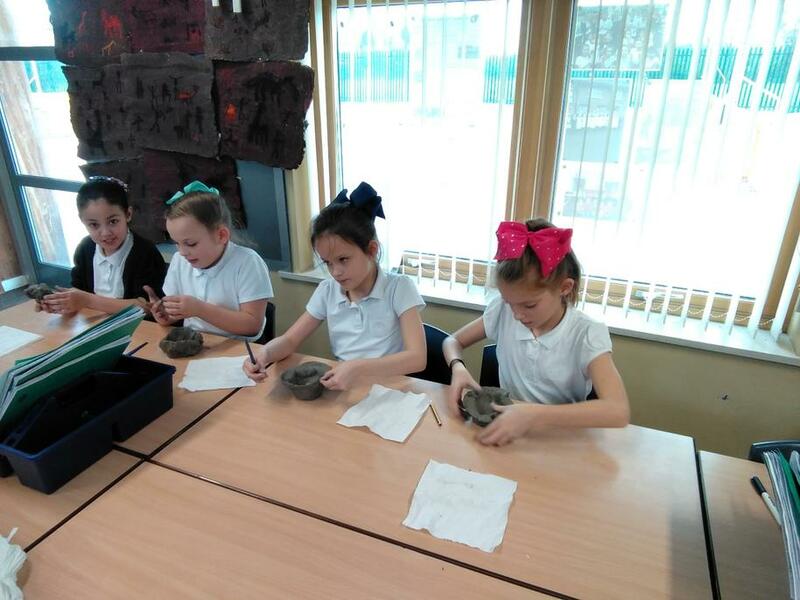 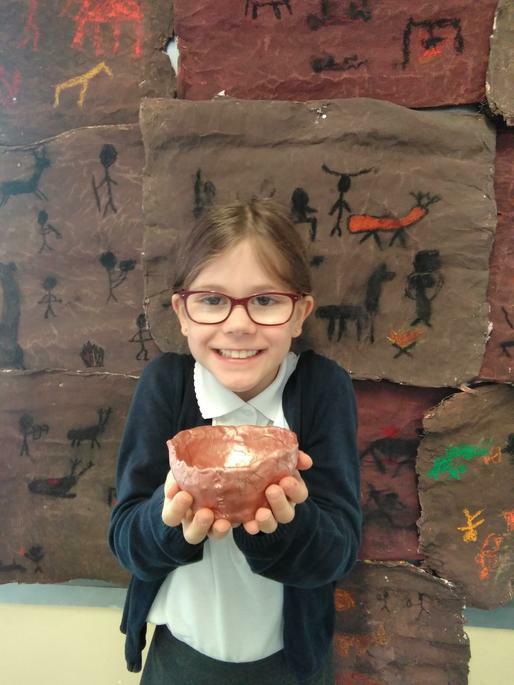 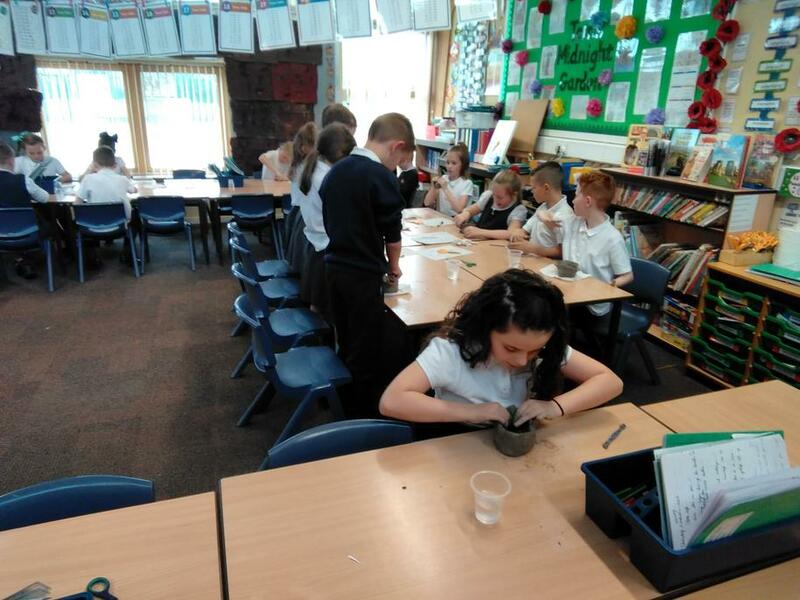 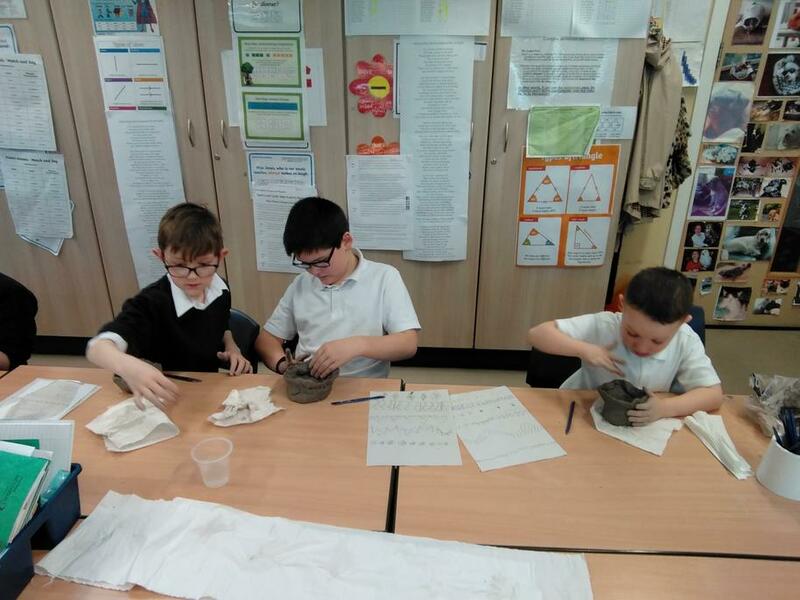 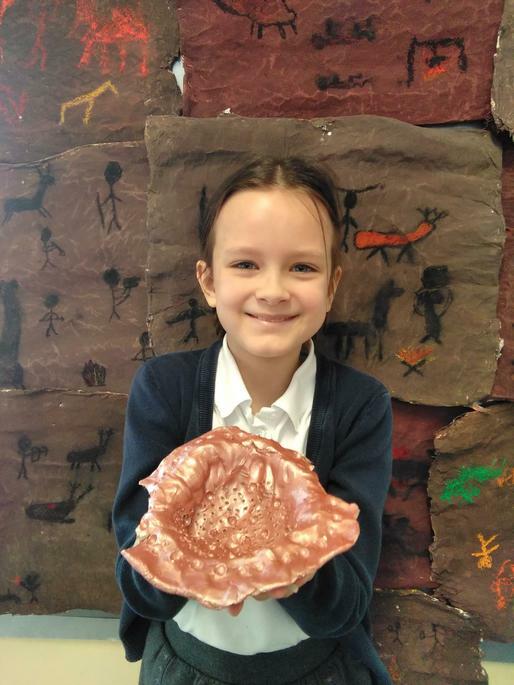 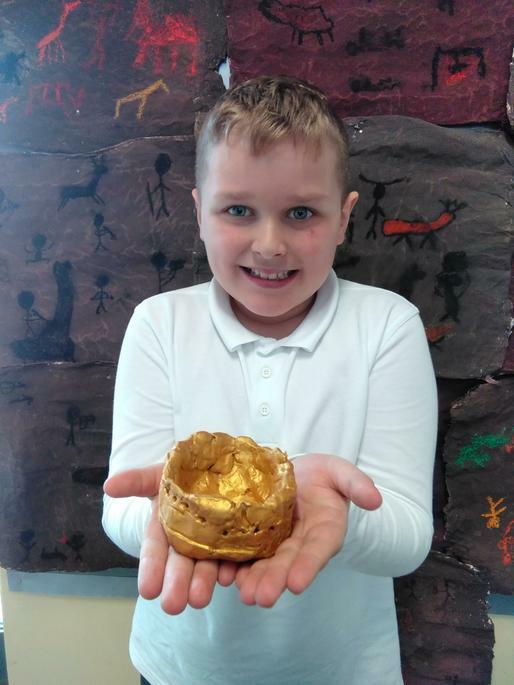 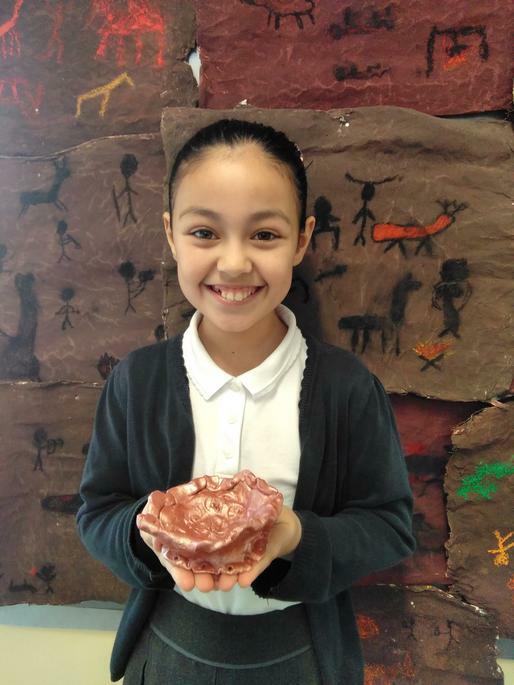 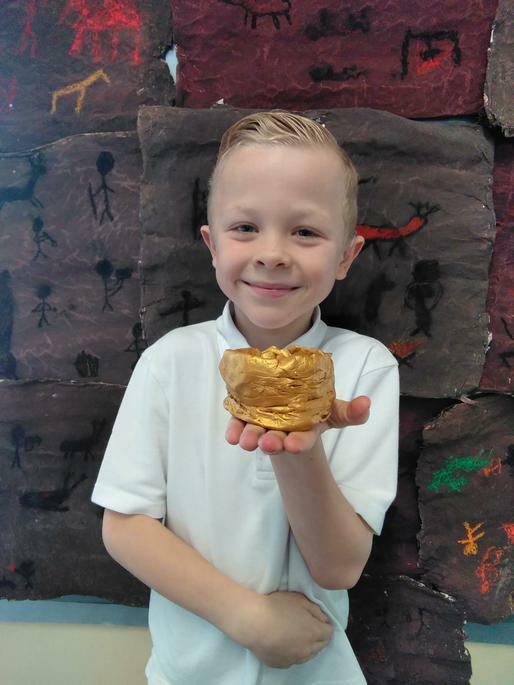 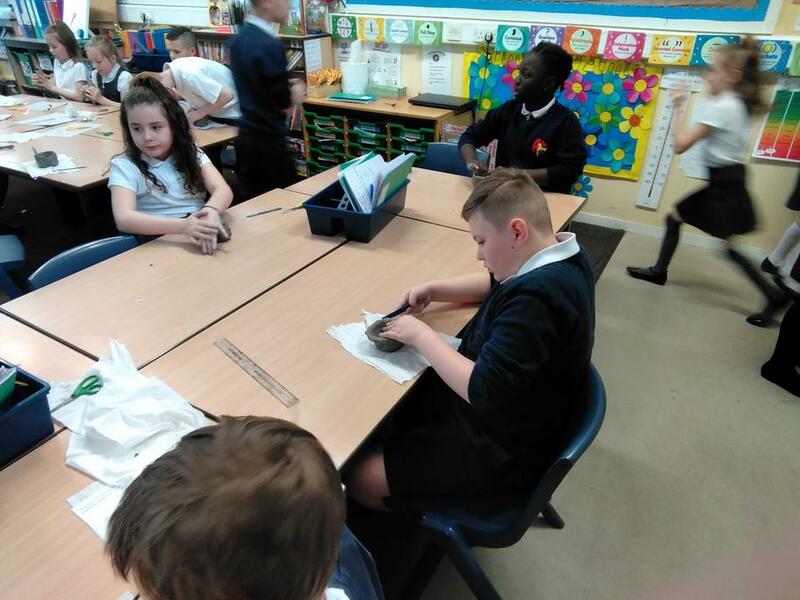 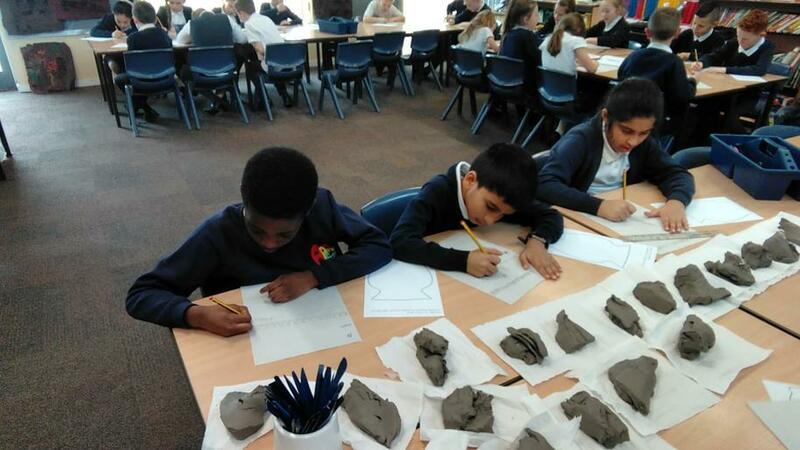 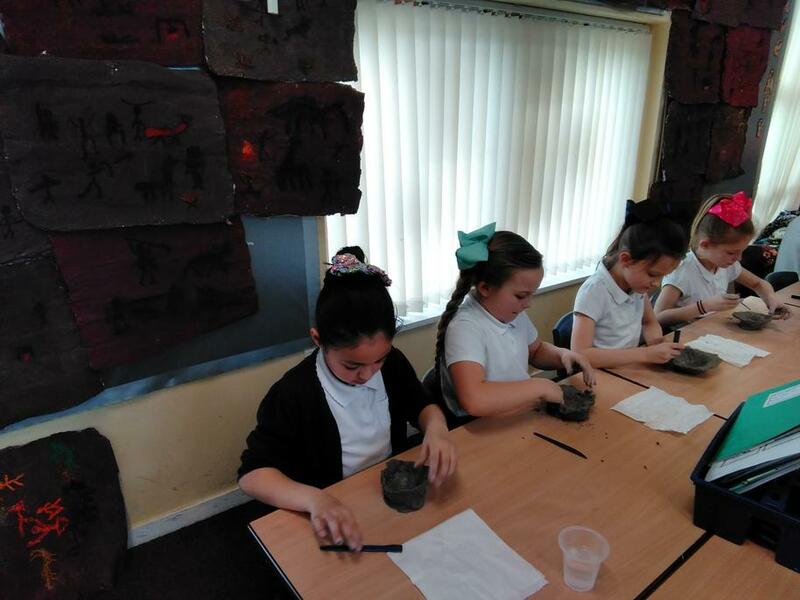 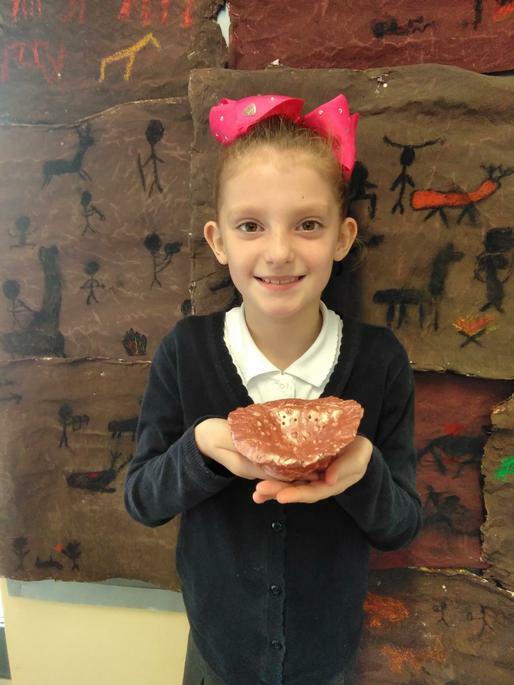 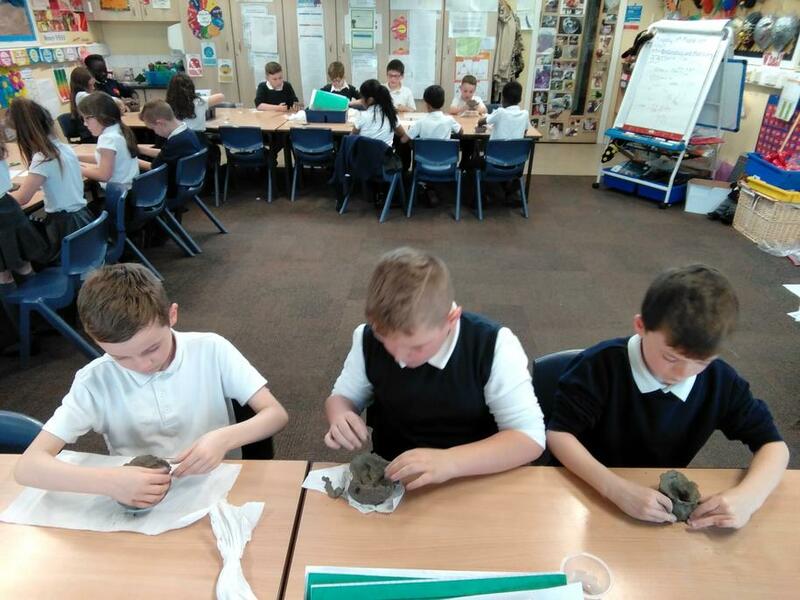 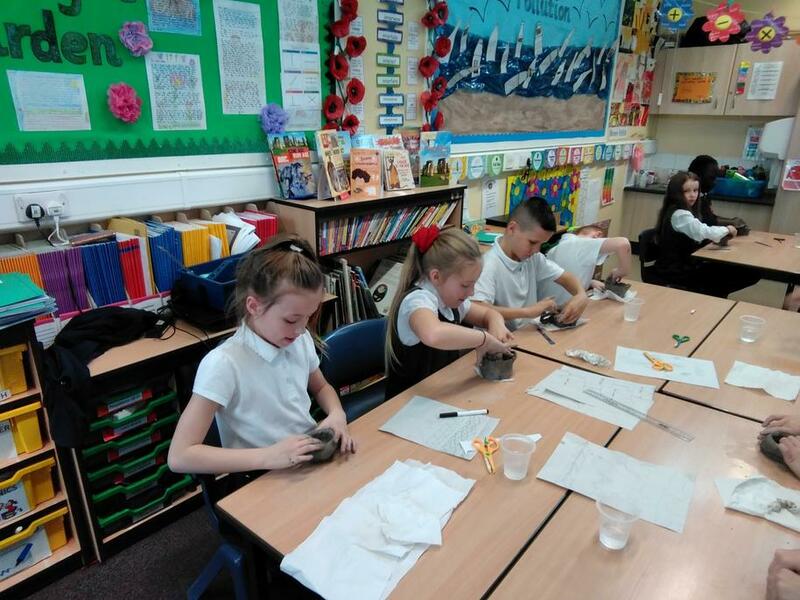 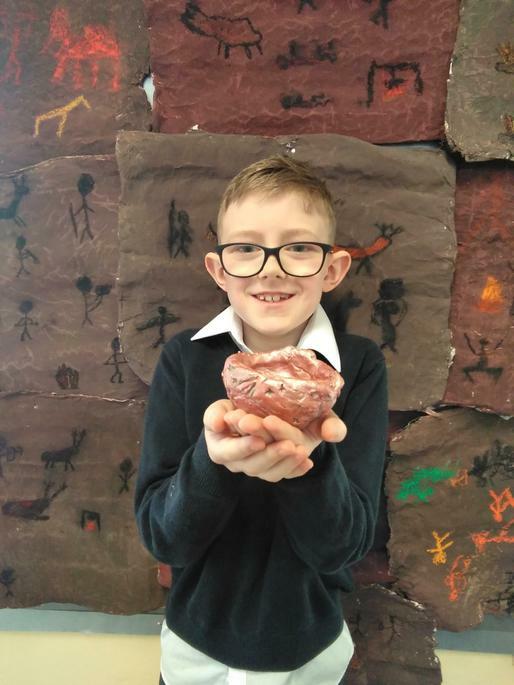 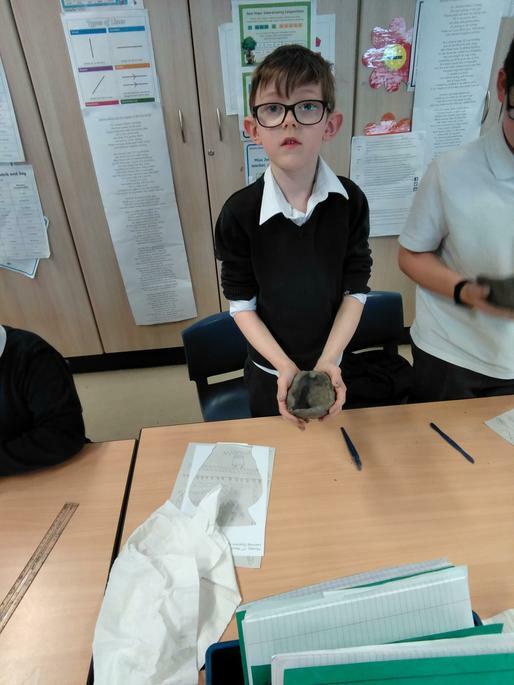 As part of our learning about the Bronze Age, we have designed and made a clay pot like the beaker people did during the Bronze Age. 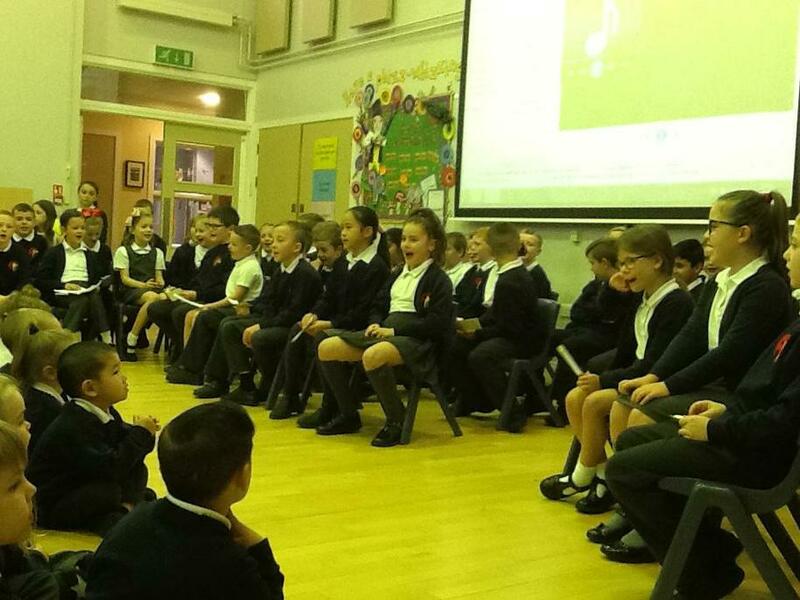 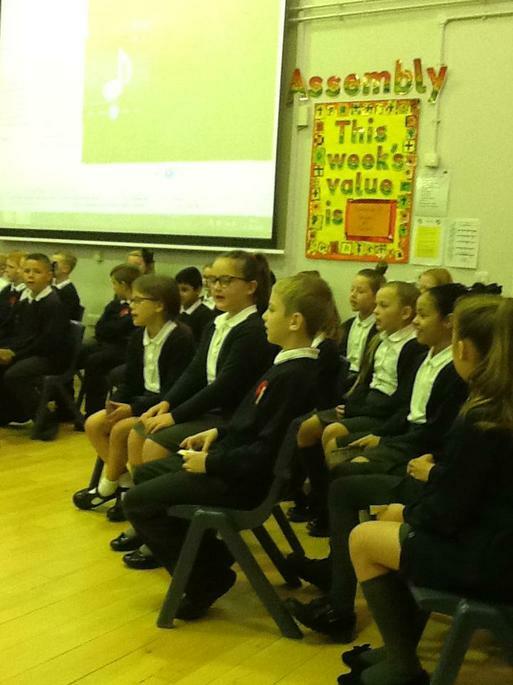 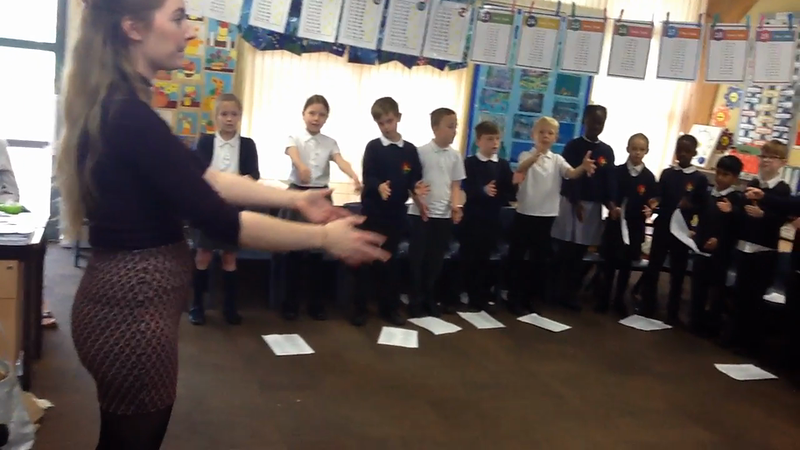 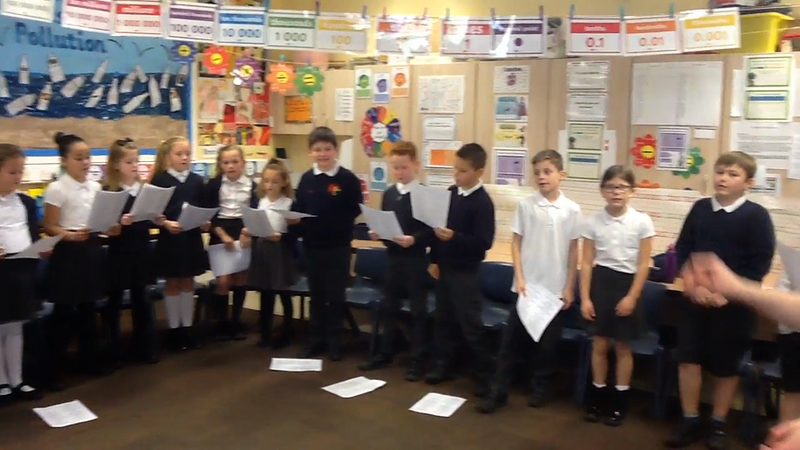 Today, year 4, had a singing workshop with Miss Mottershead. 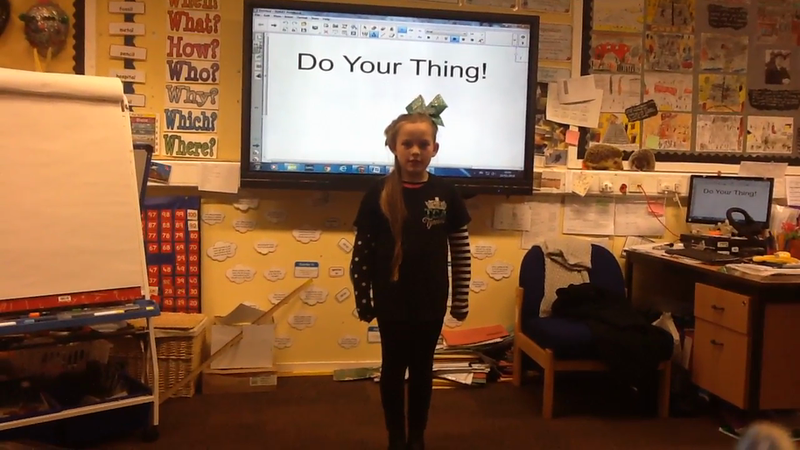 We warmed up our bodies and voices, then we learnt to sing Count On Me by Bruno Mars and This is Me from the Greatest Showman. 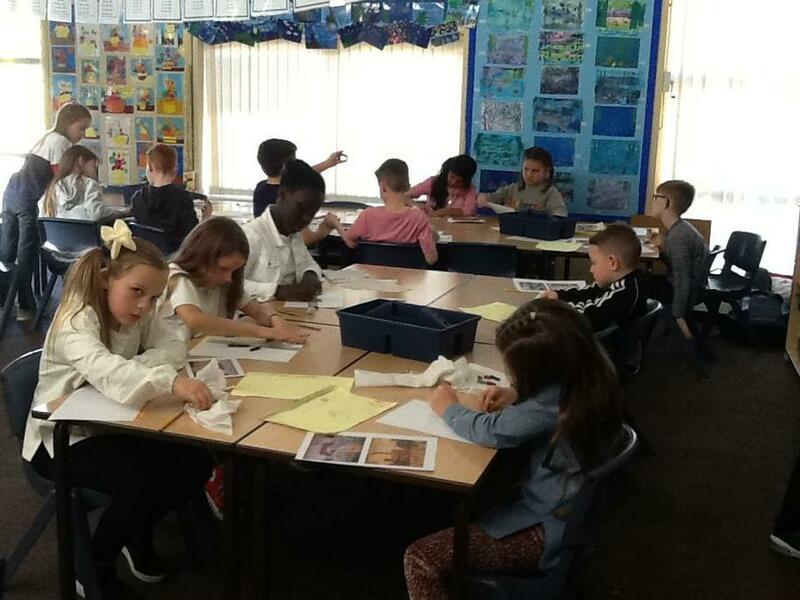 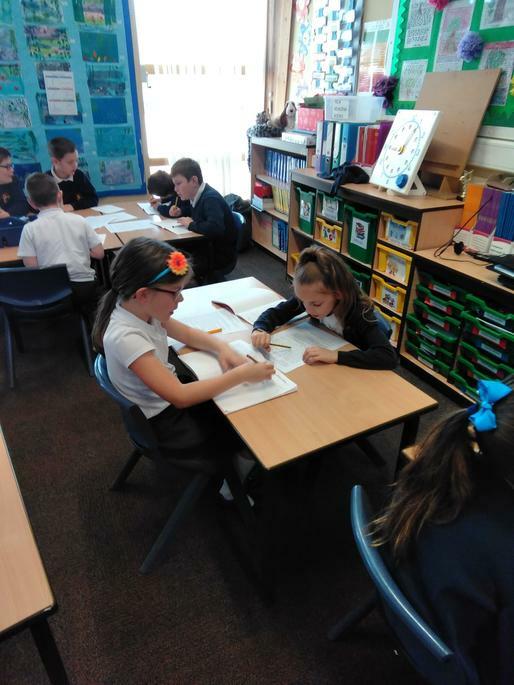 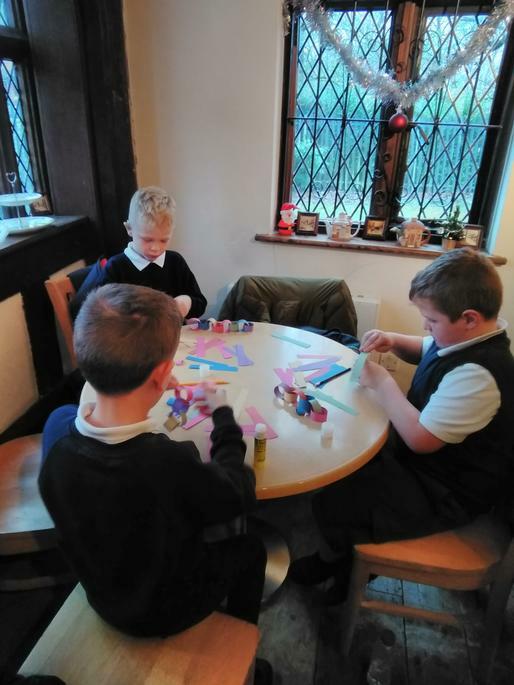 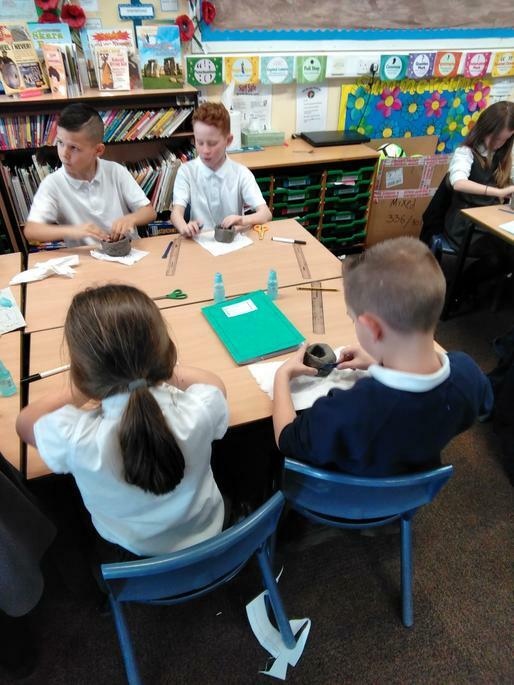 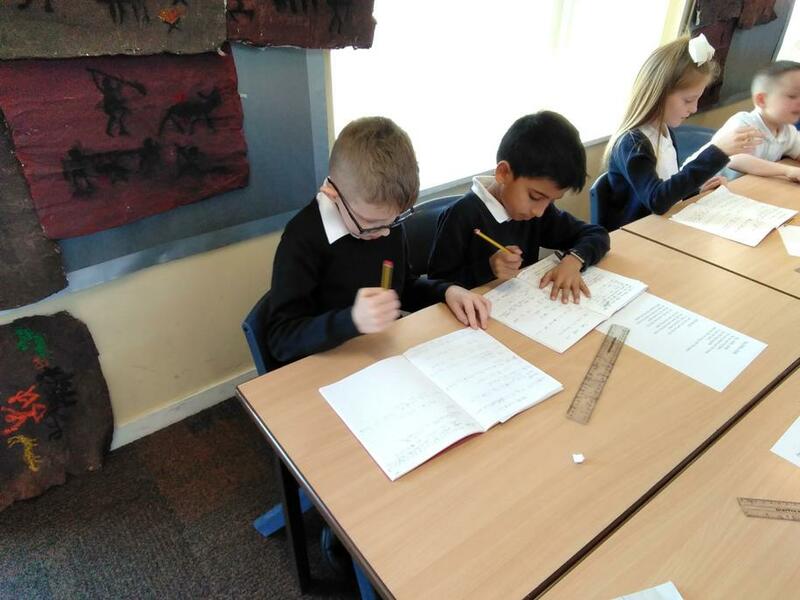 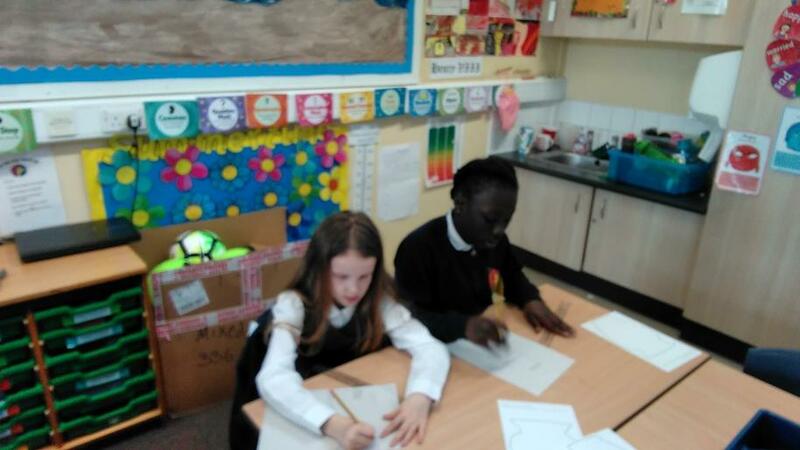 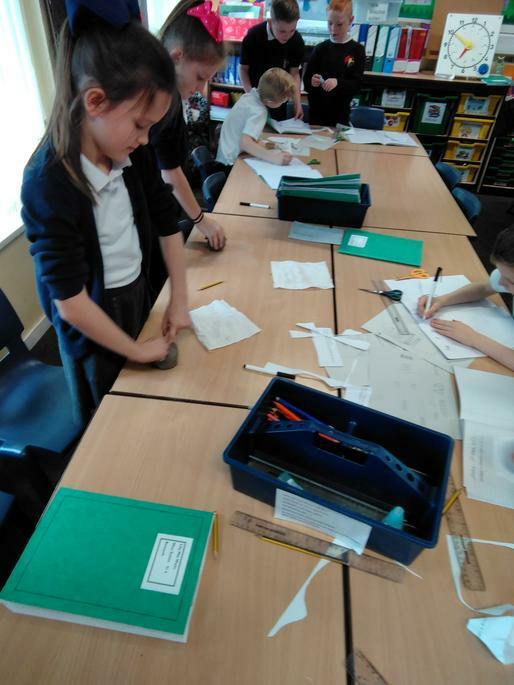 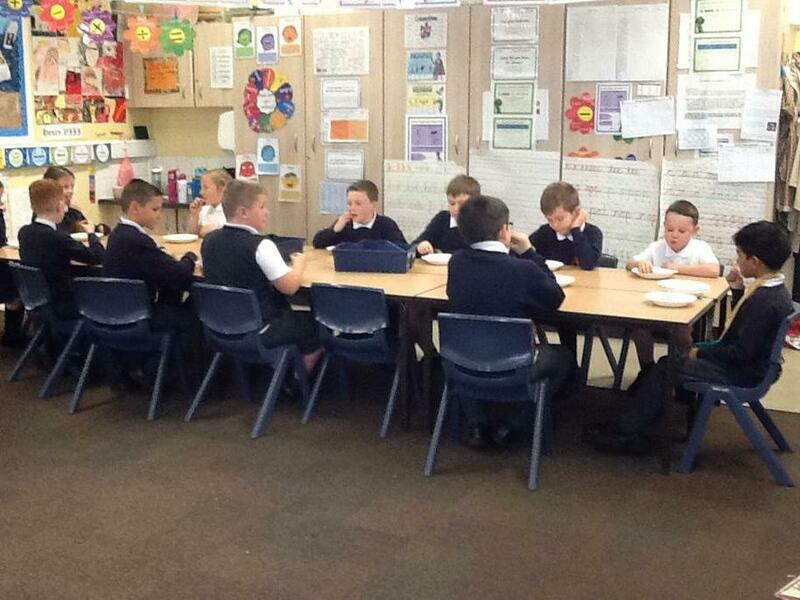 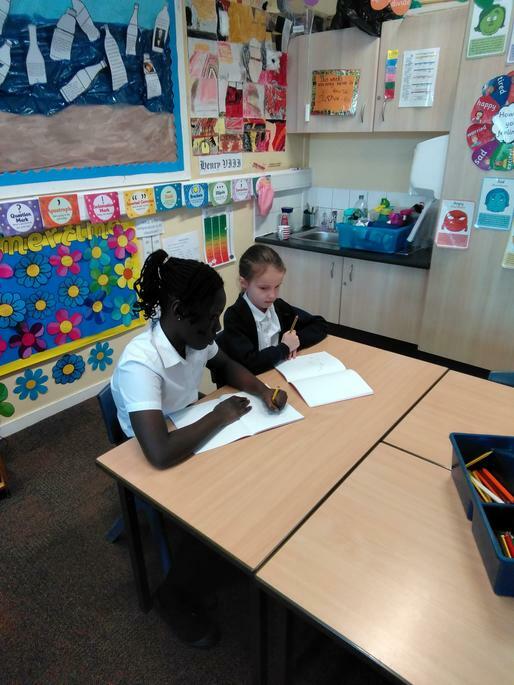 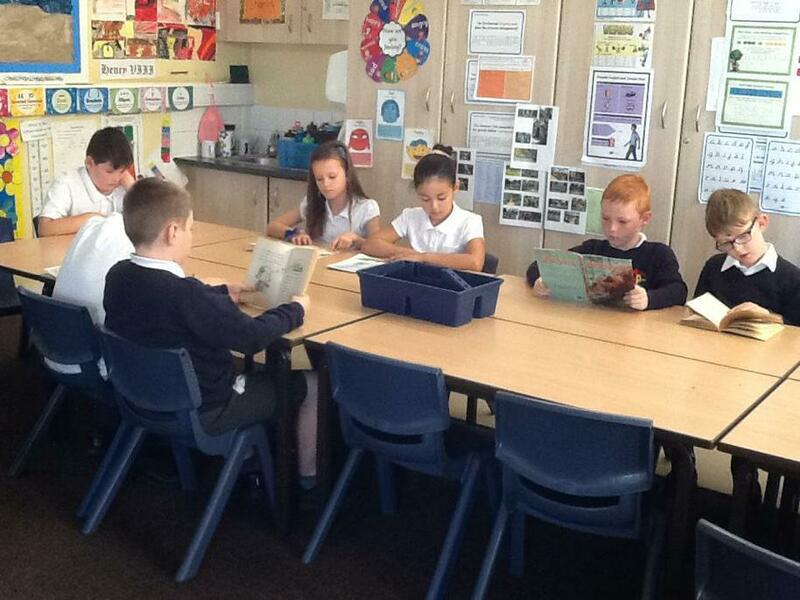 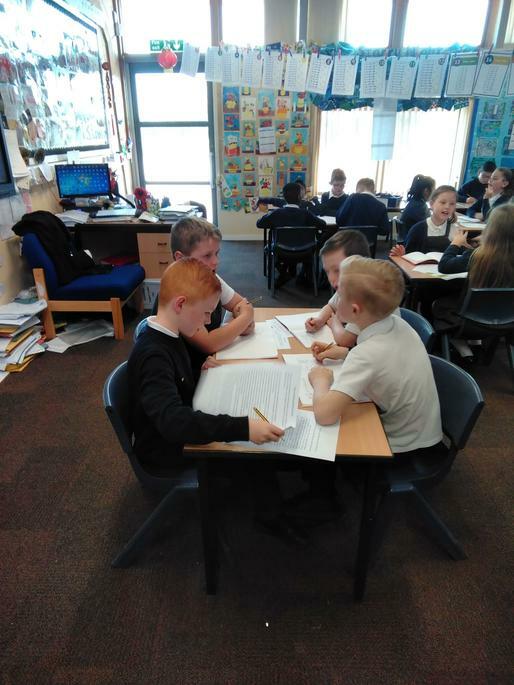 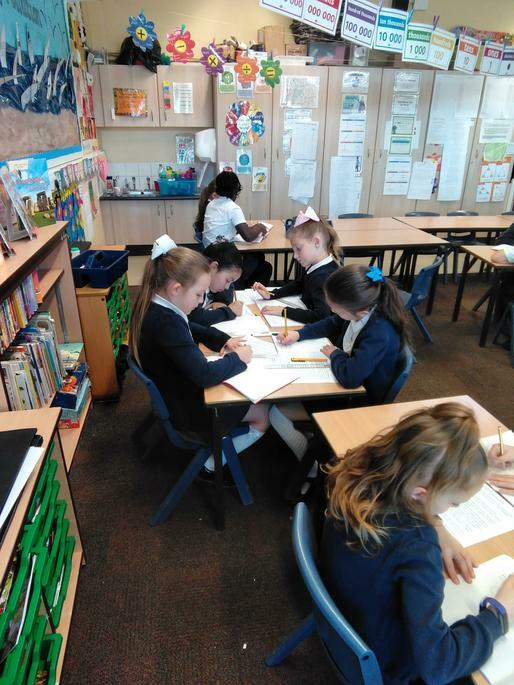 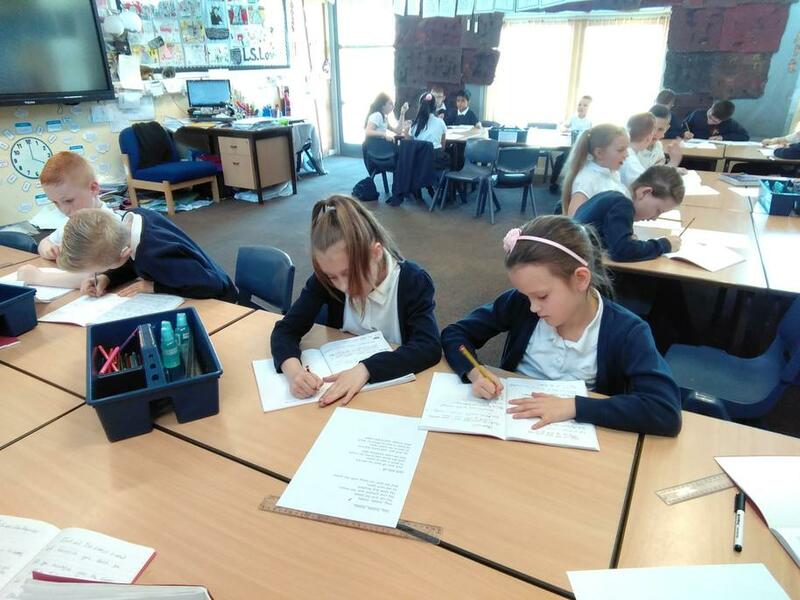 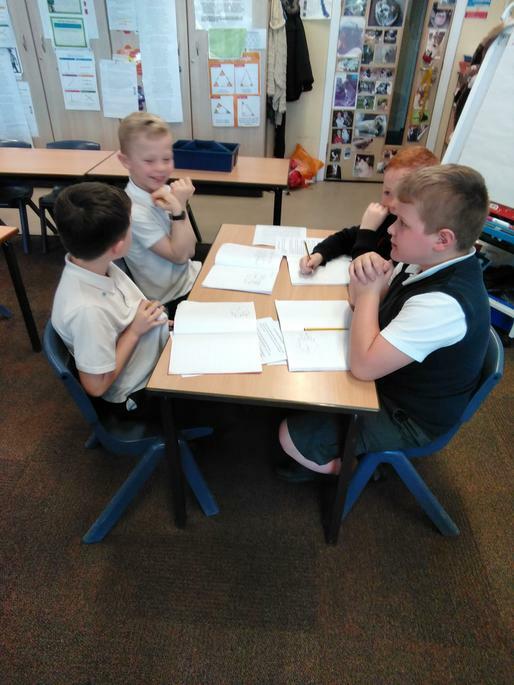 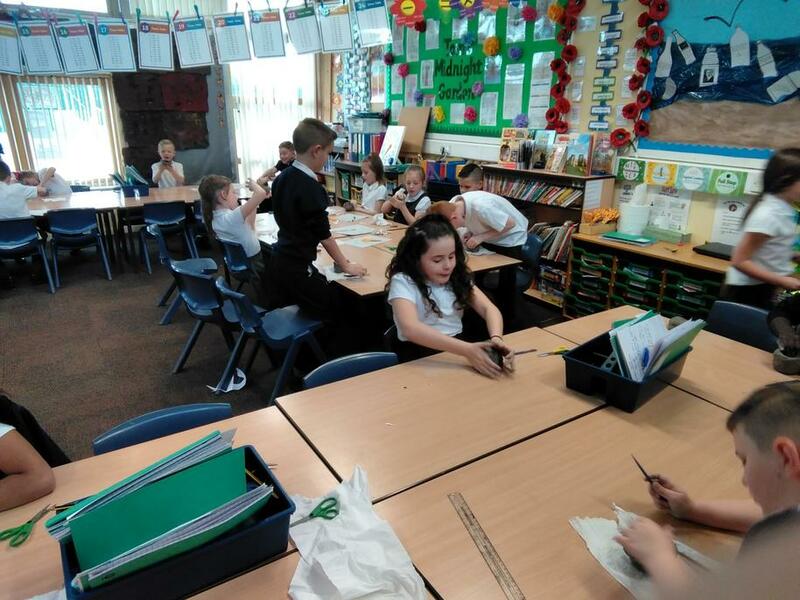 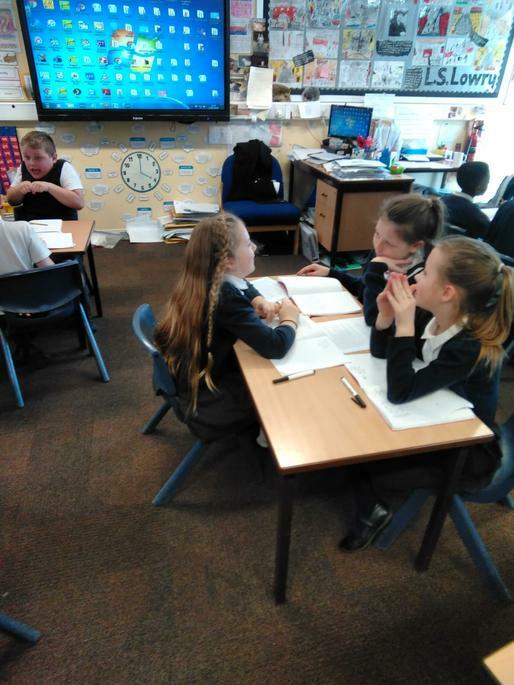 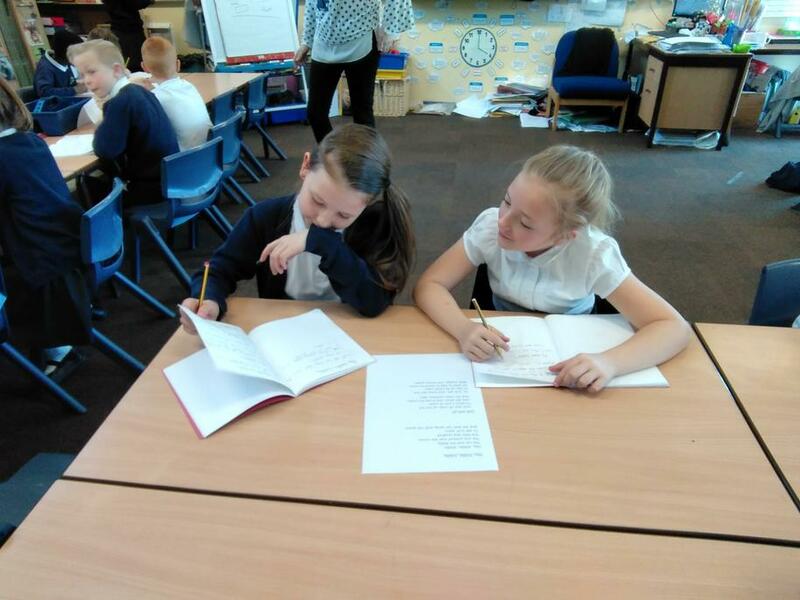 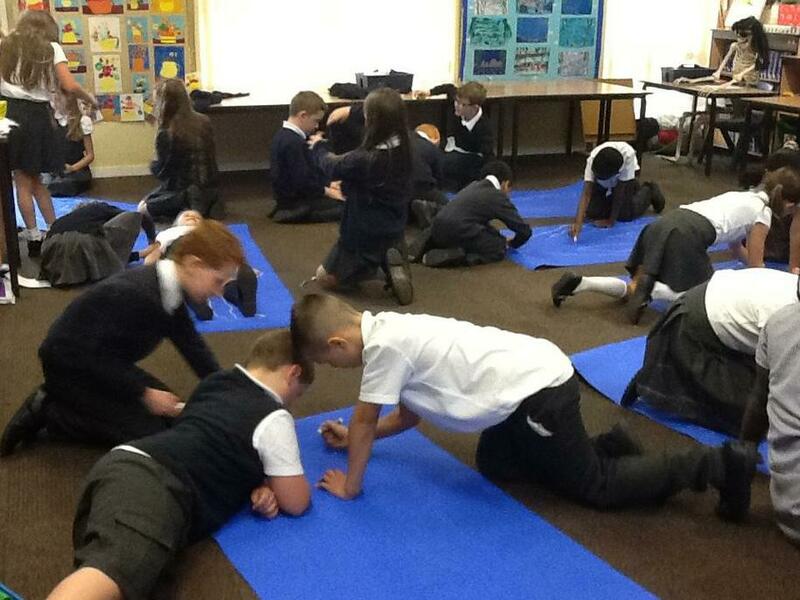 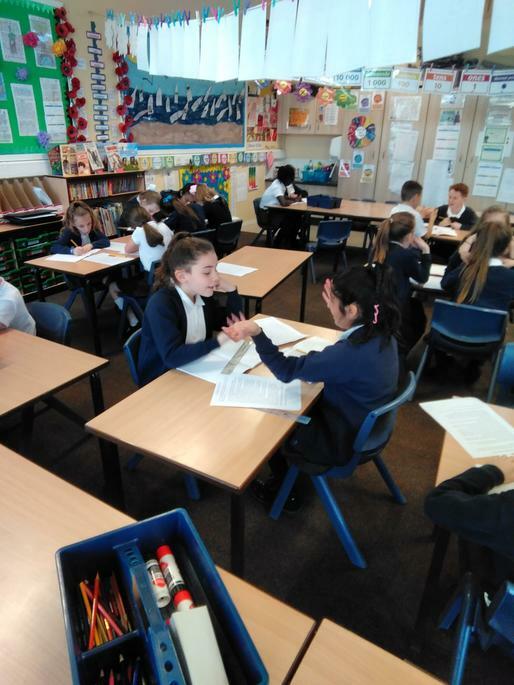 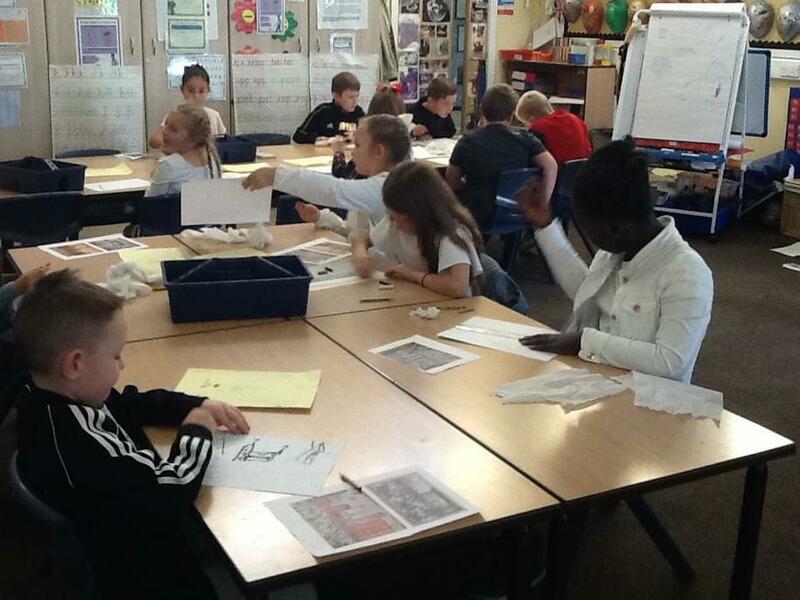 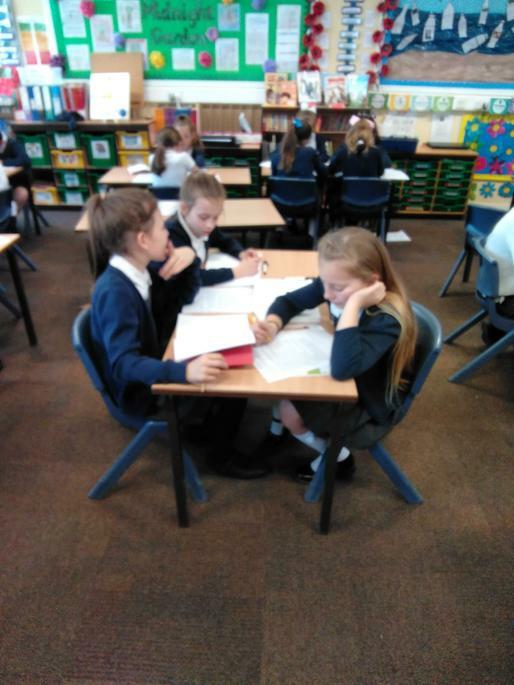 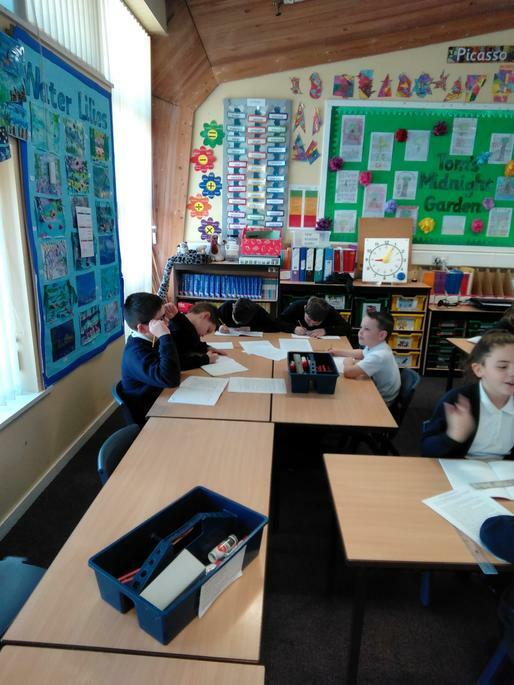 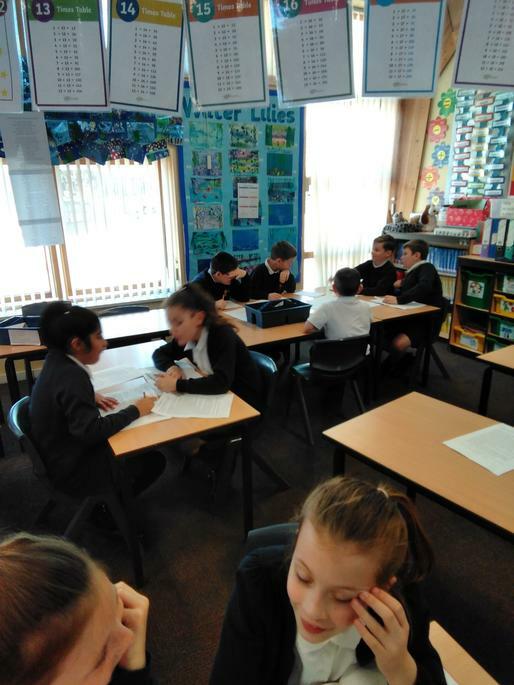 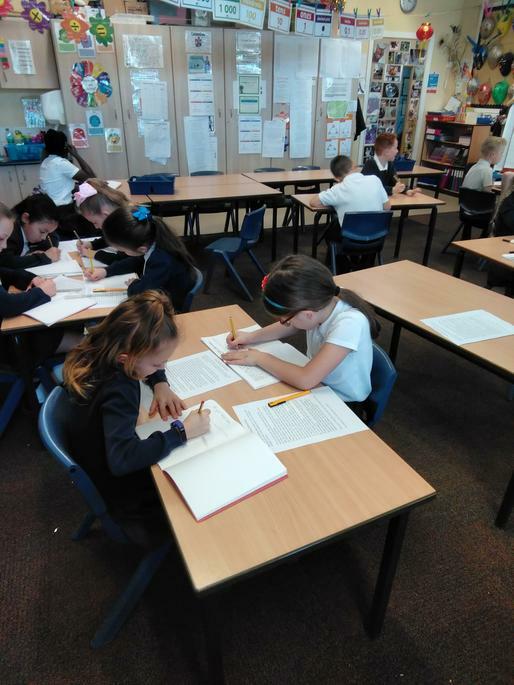 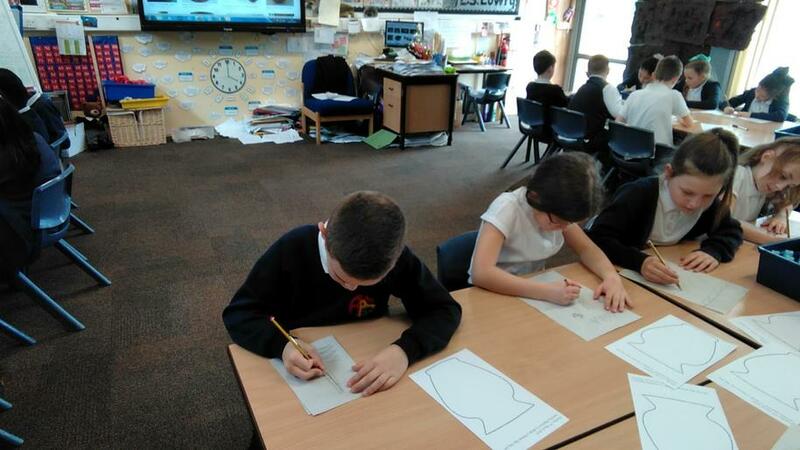 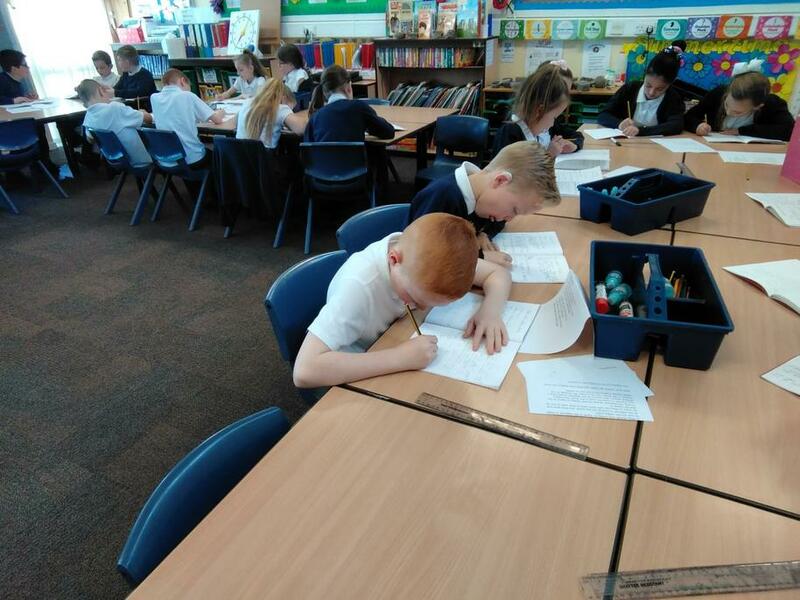 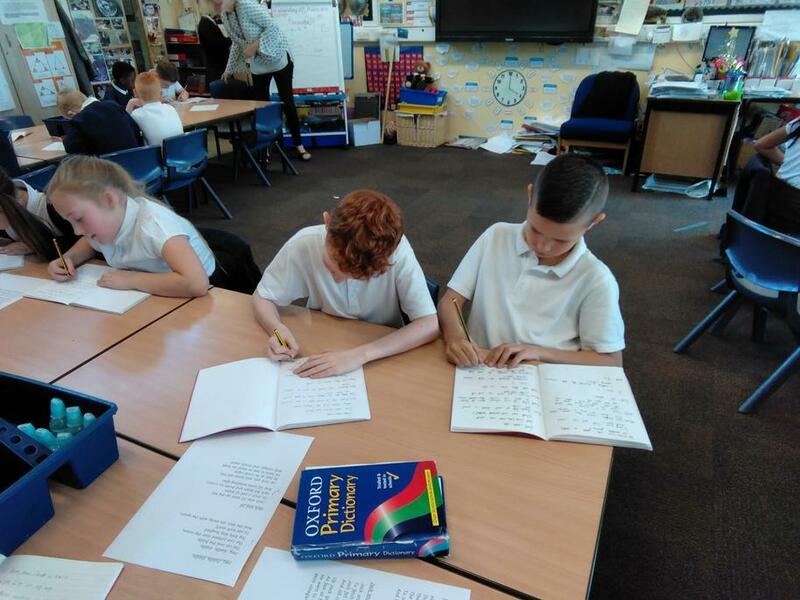 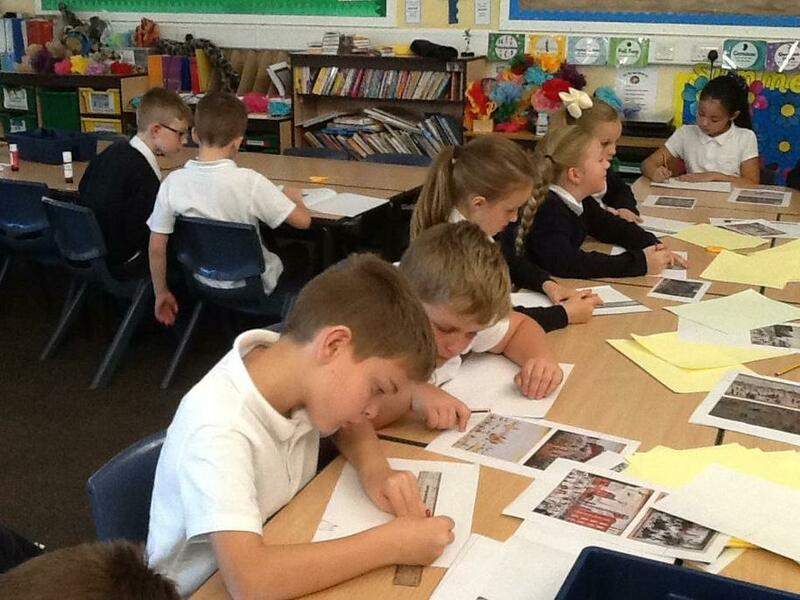 This term, our class are working with Mr Partington. 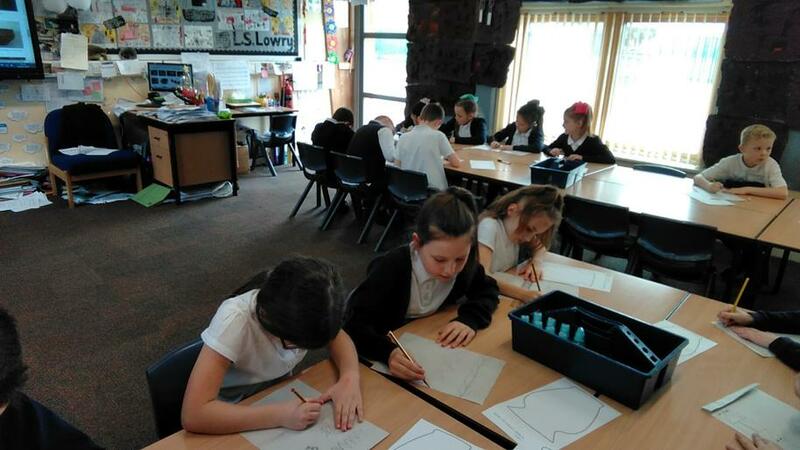 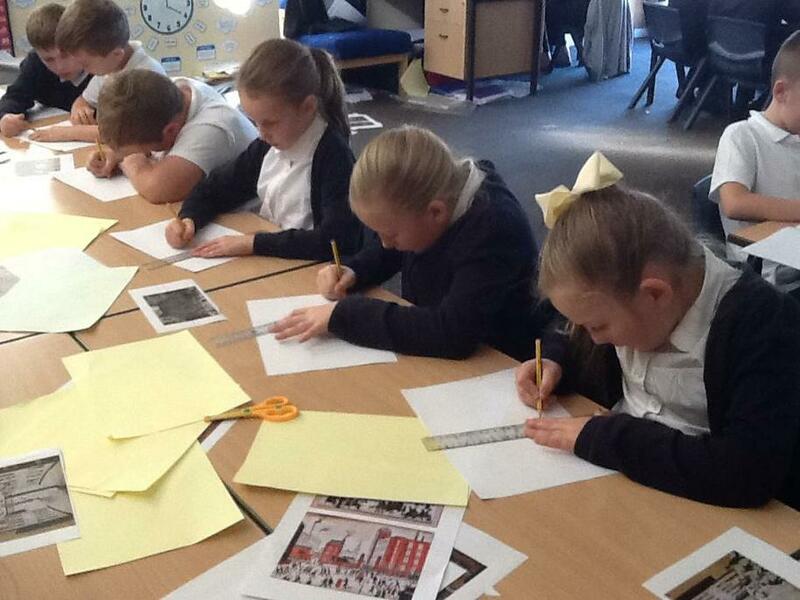 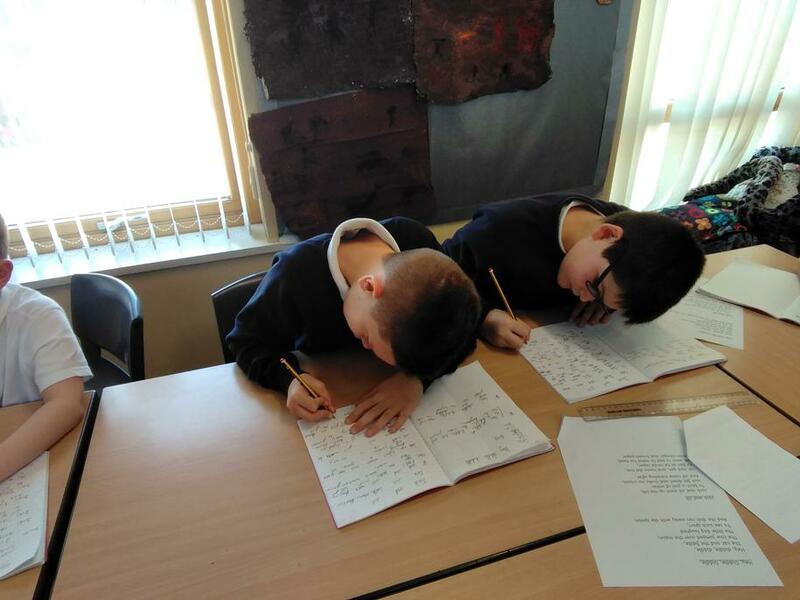 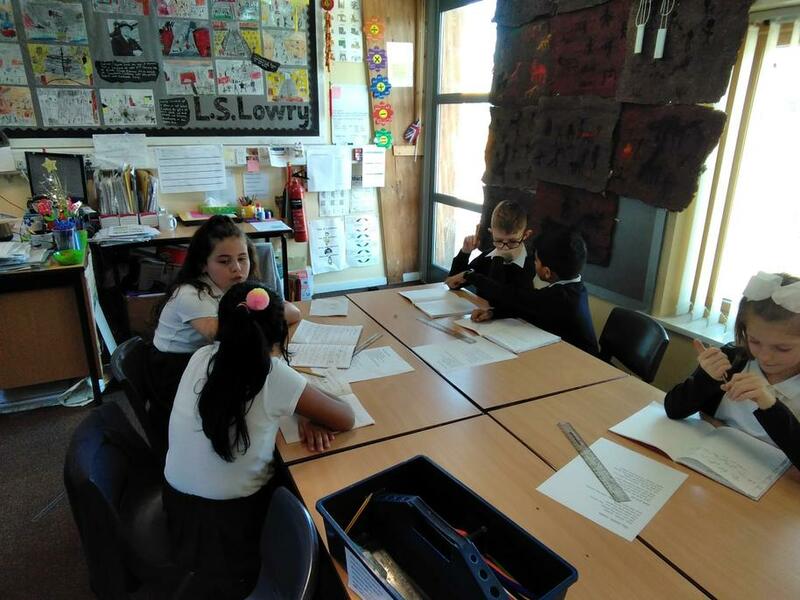 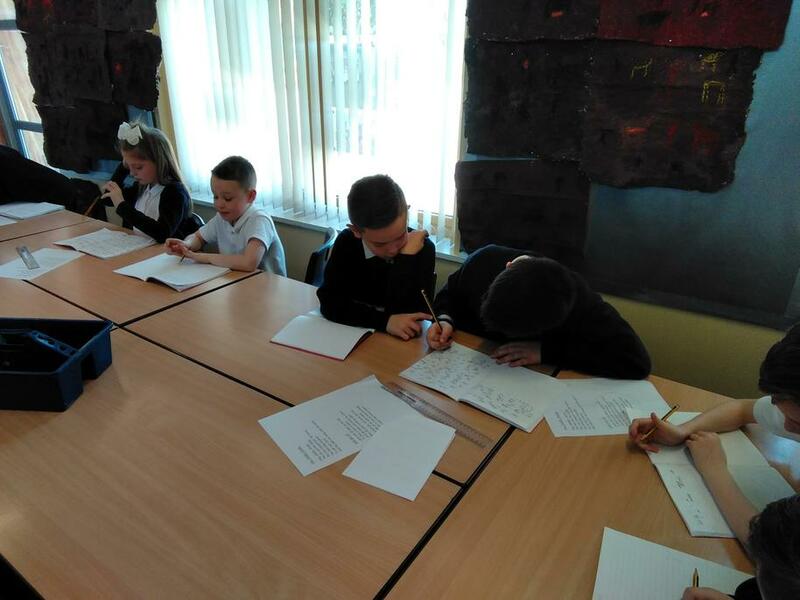 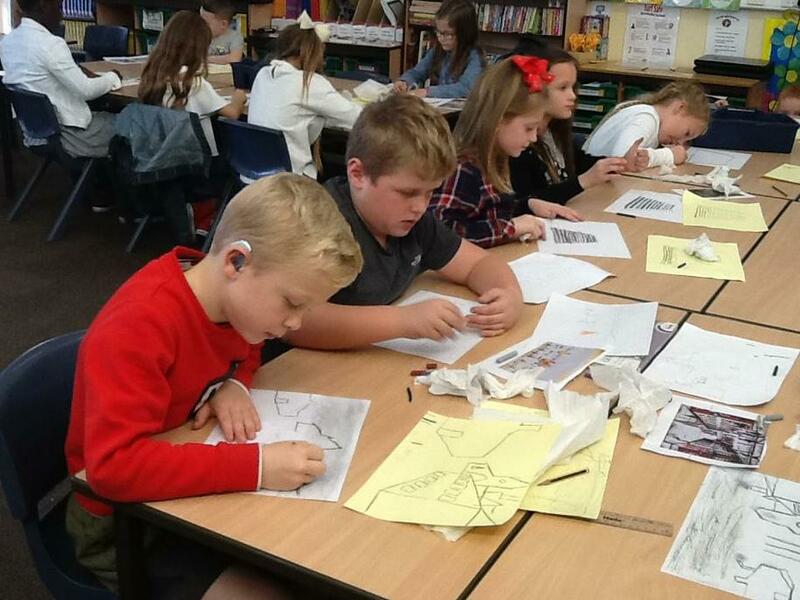 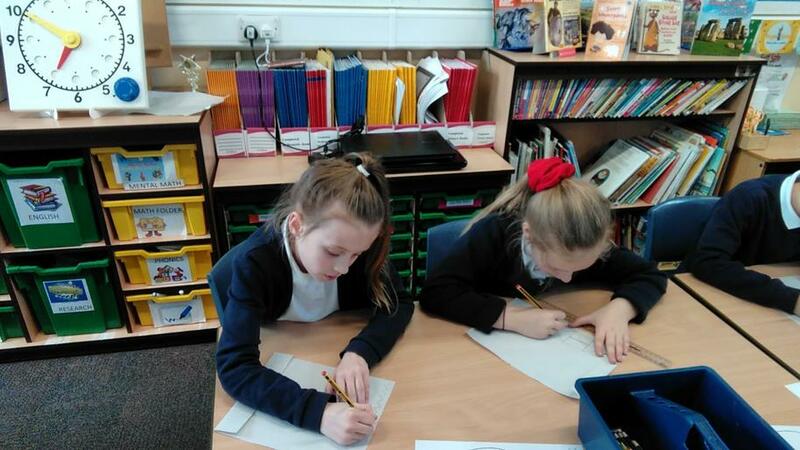 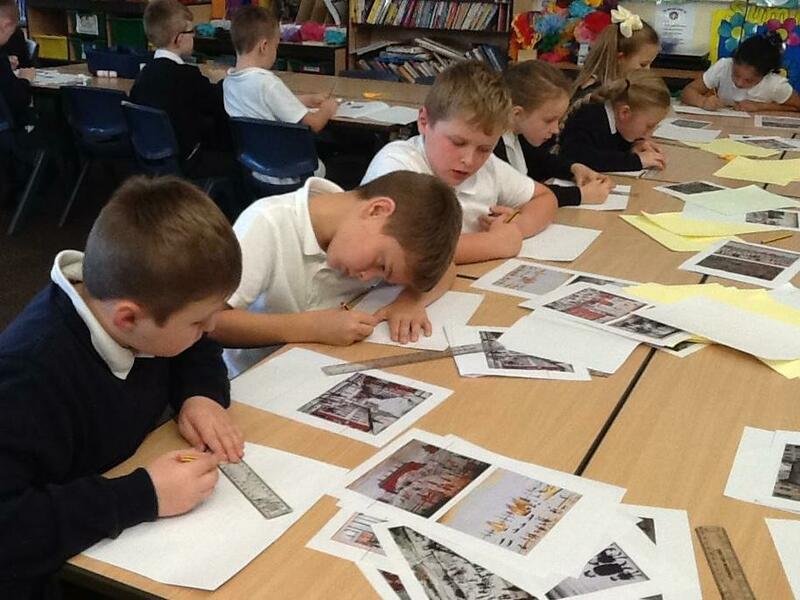 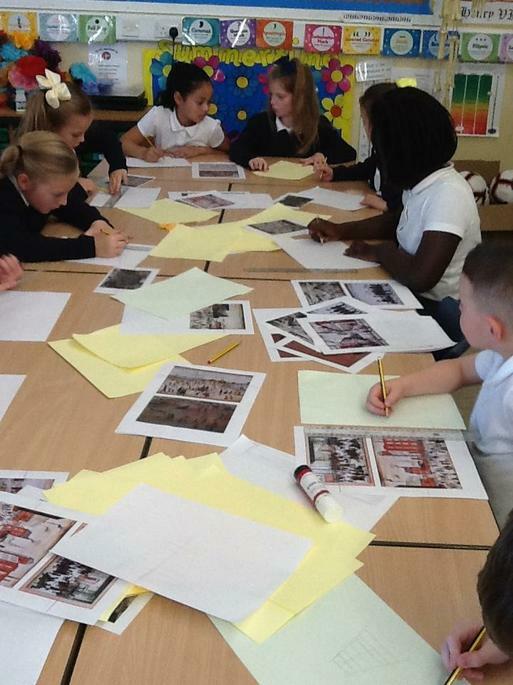 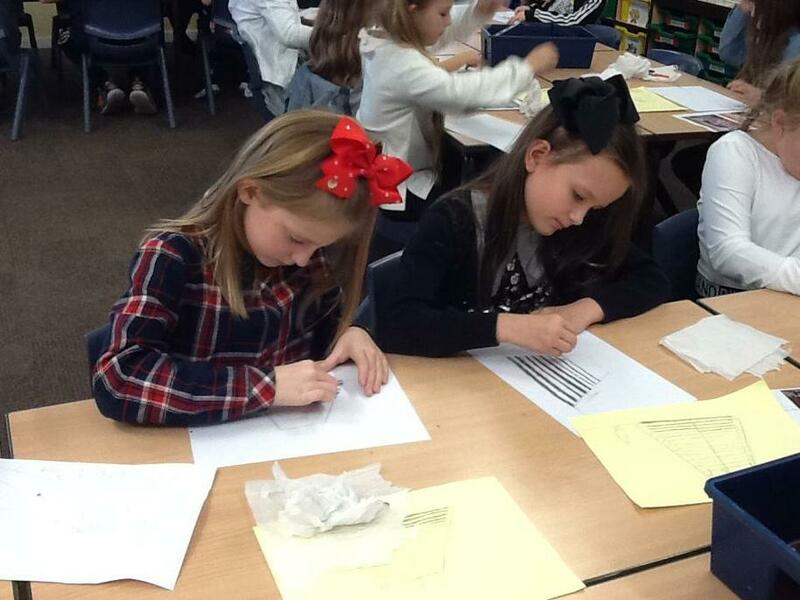 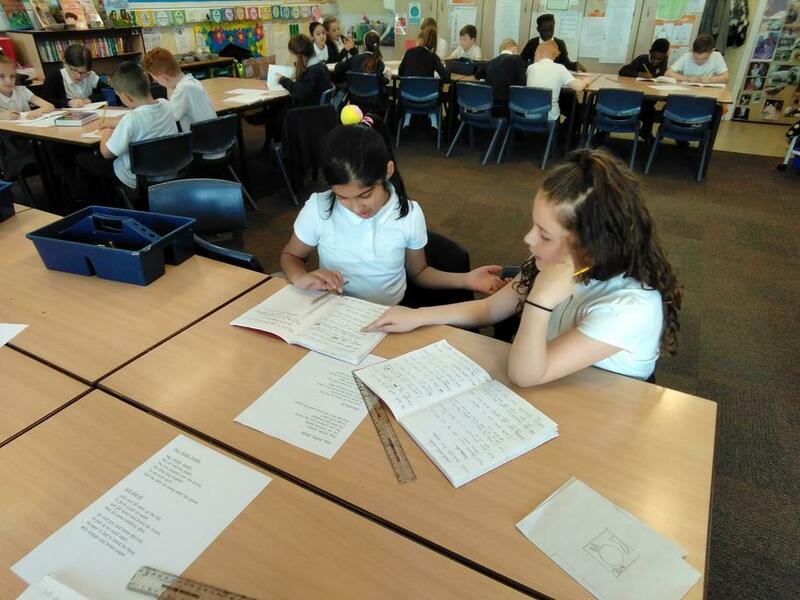 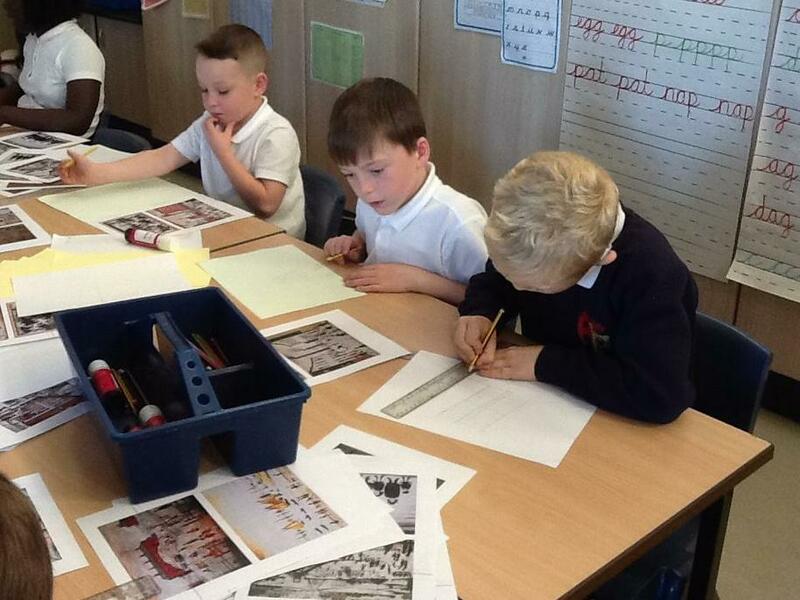 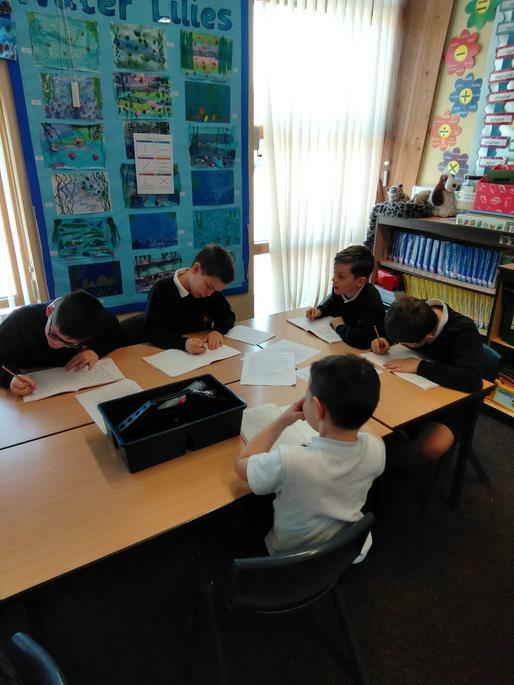 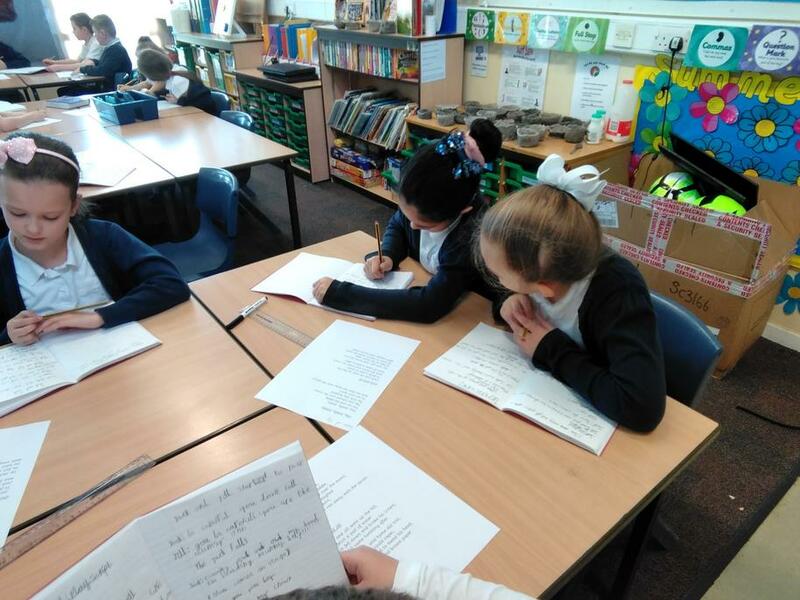 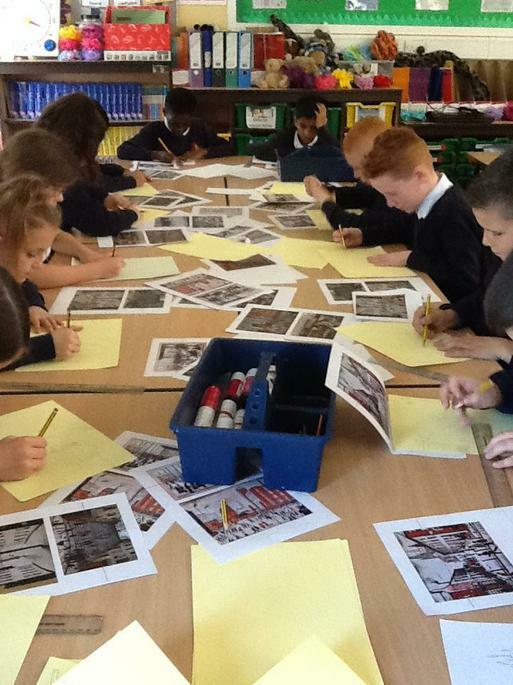 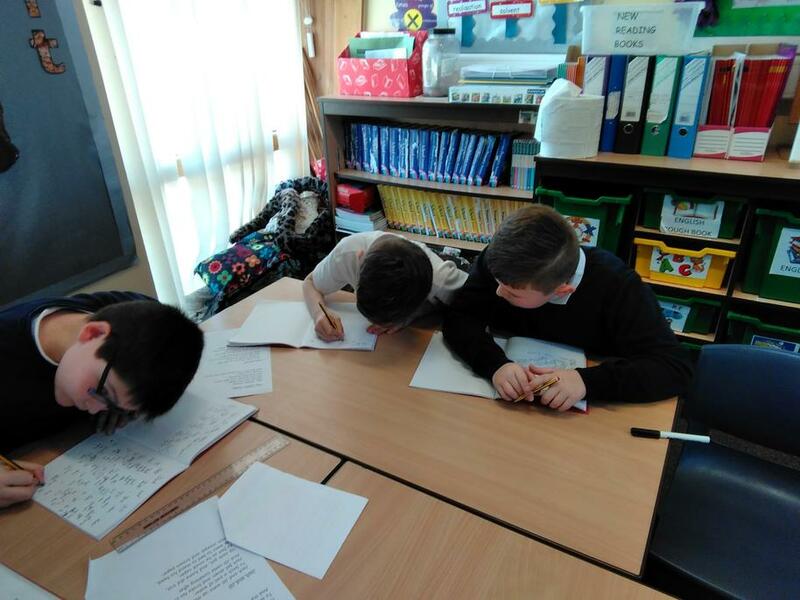 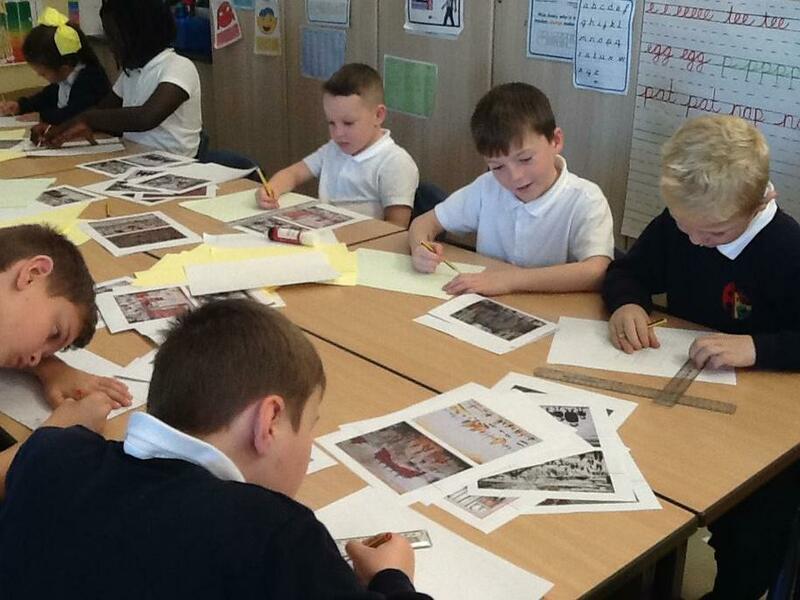 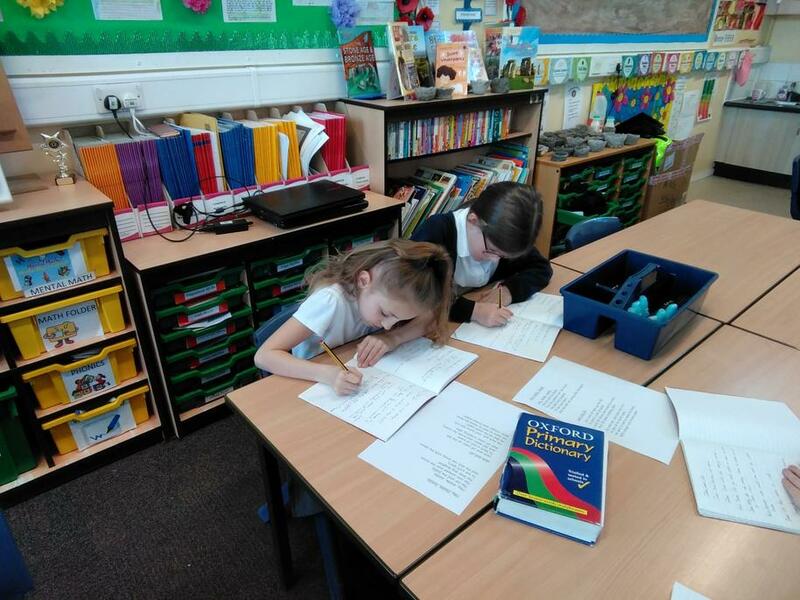 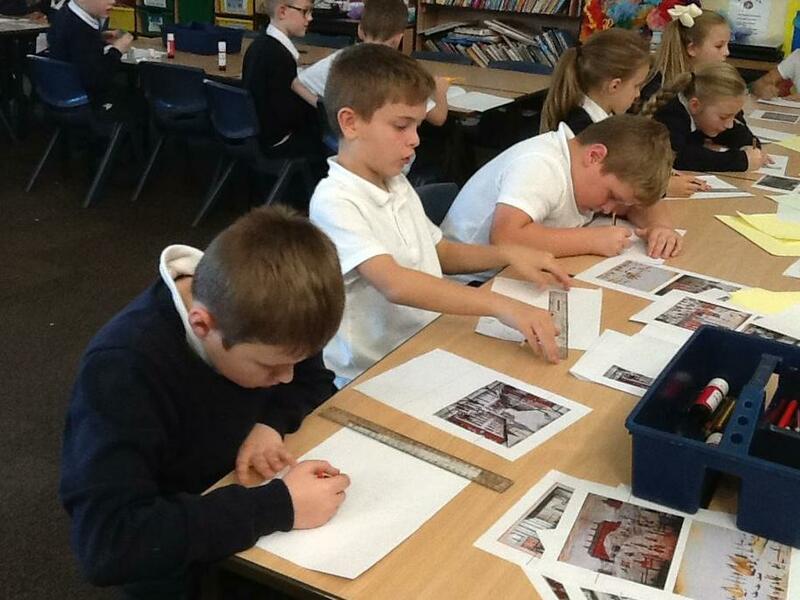 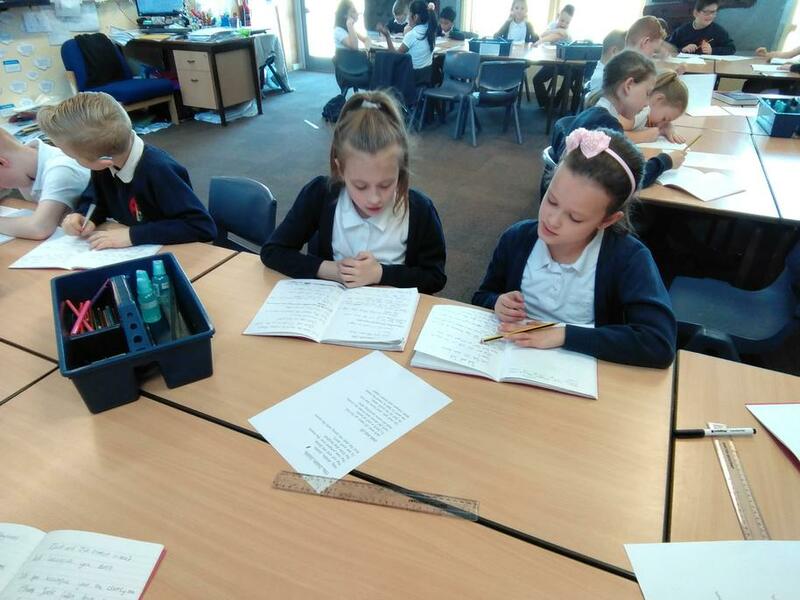 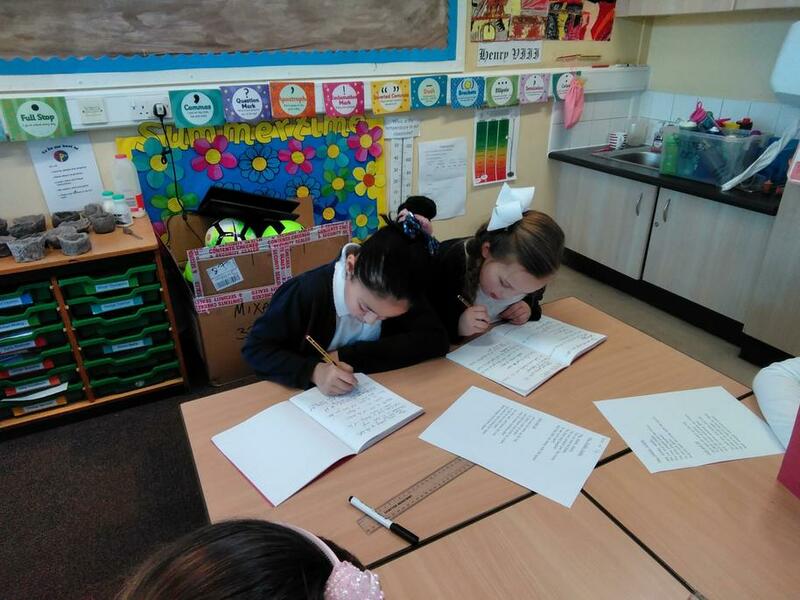 We are composing lyrics and singing about L. S. Lowry. 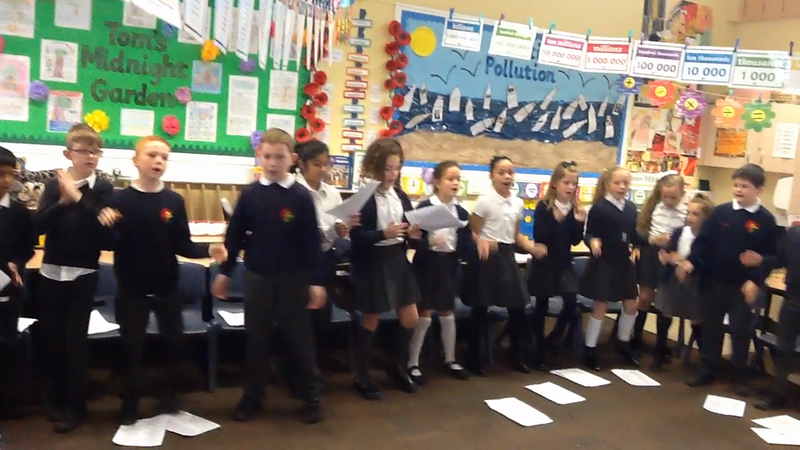 We are using chime bars to compose riffs for a performance at the end of term. 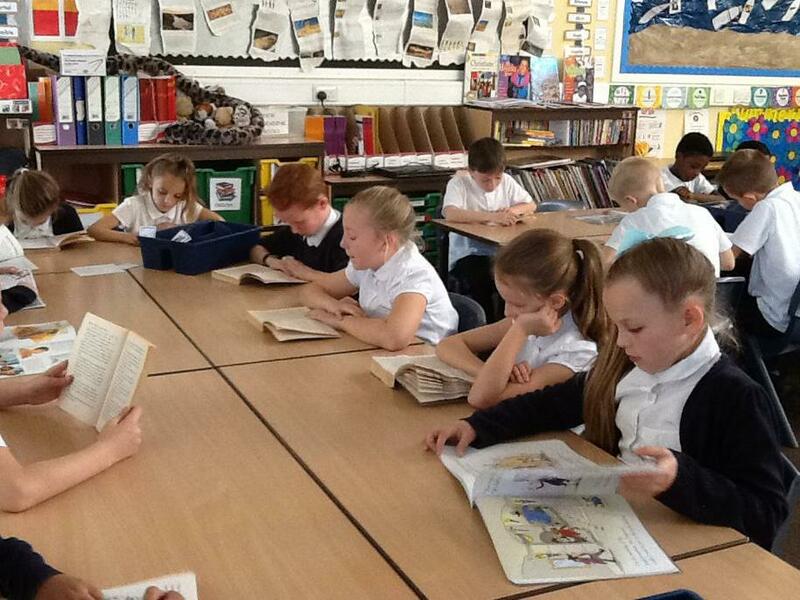 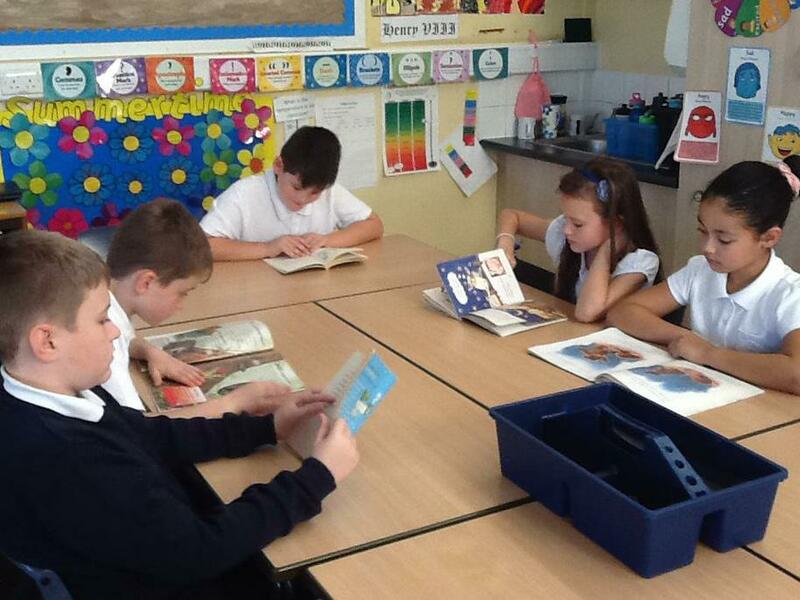 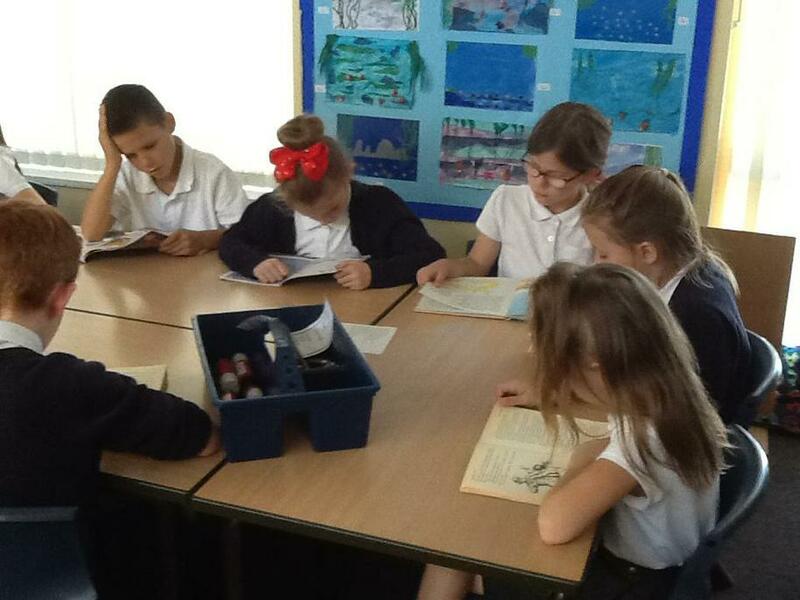 Every Thursday, our class visit the school library to choose a library book to read. 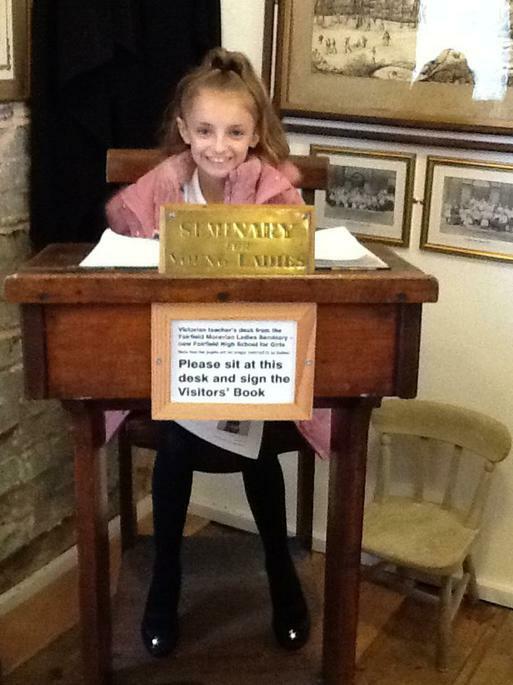 Our librarians are Scarlet and Lily. 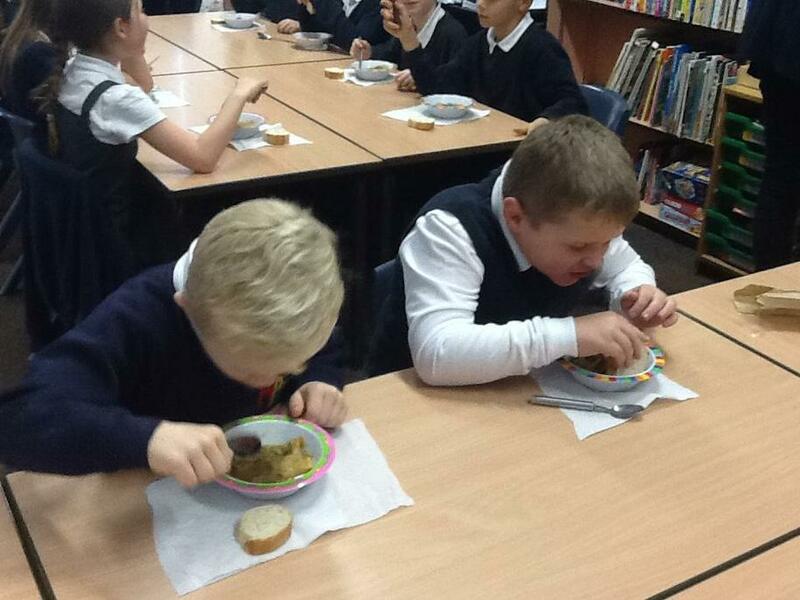 Today, our class supported 'Children in Need.' 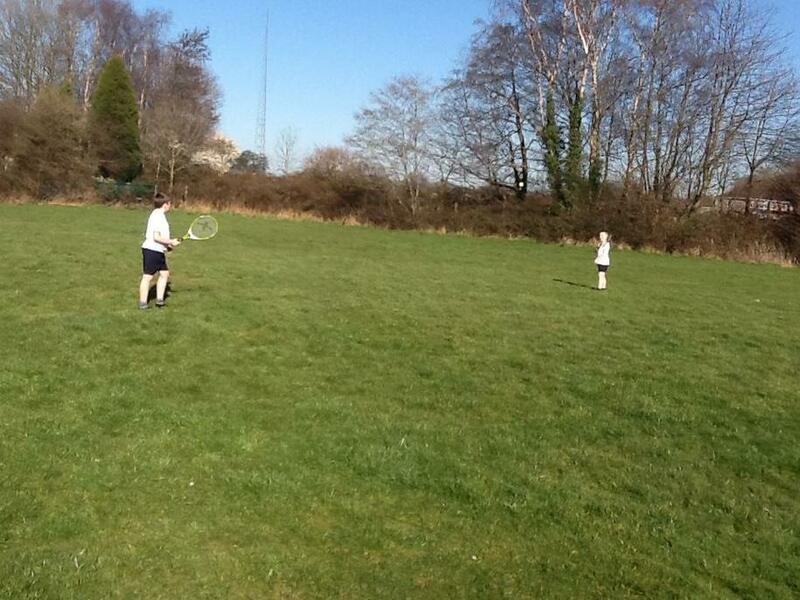 We did our own thing. 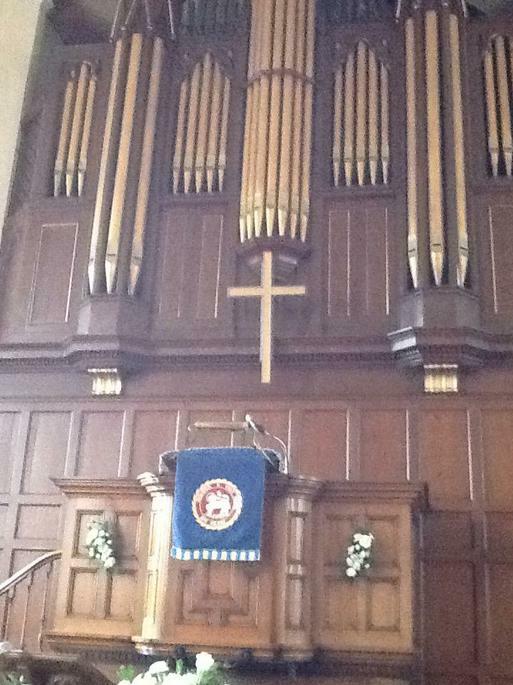 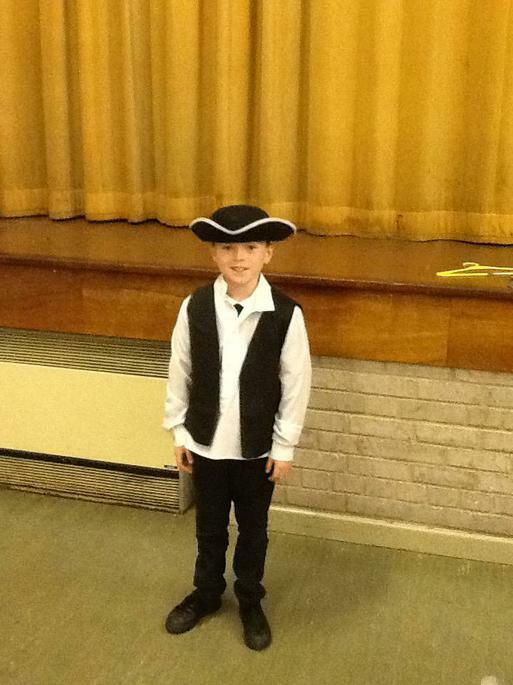 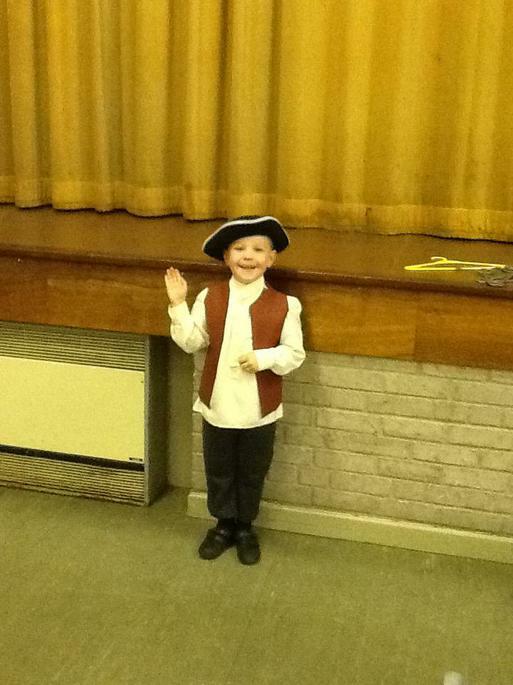 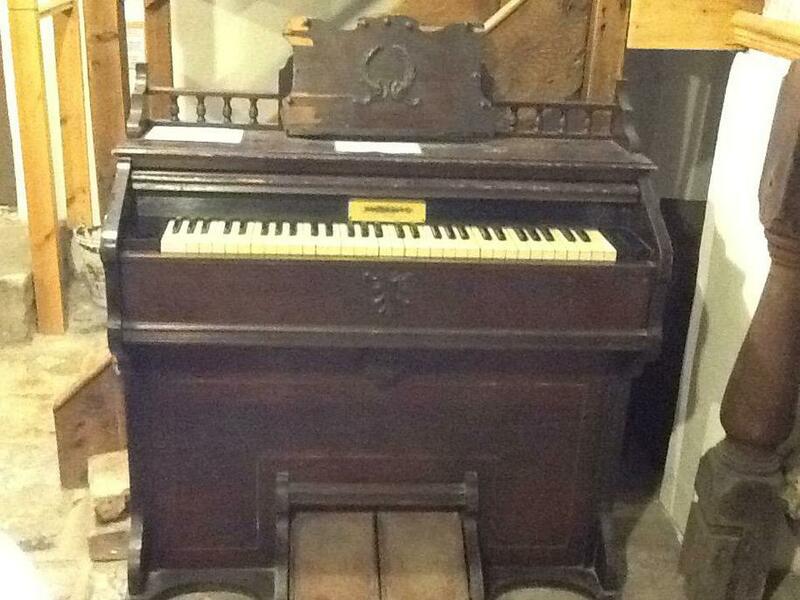 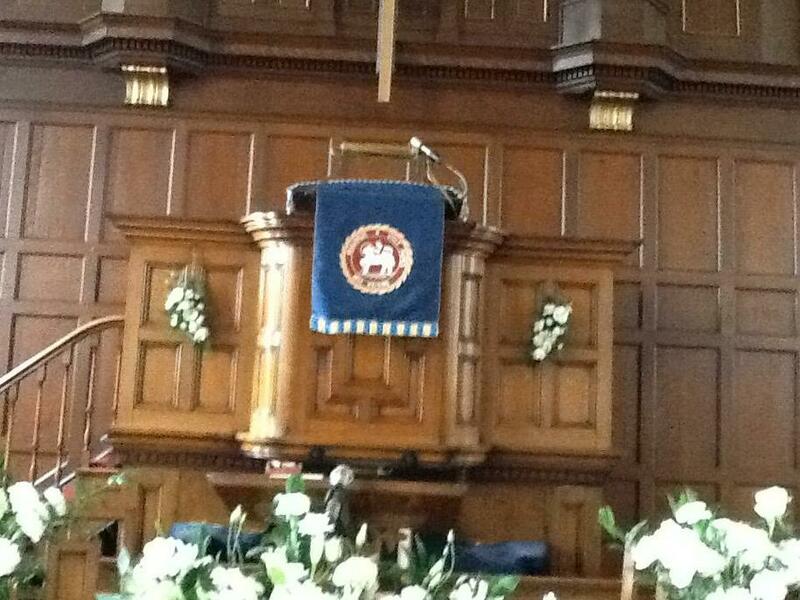 Dylan played 'Yankee Doodle' on the keyboard. 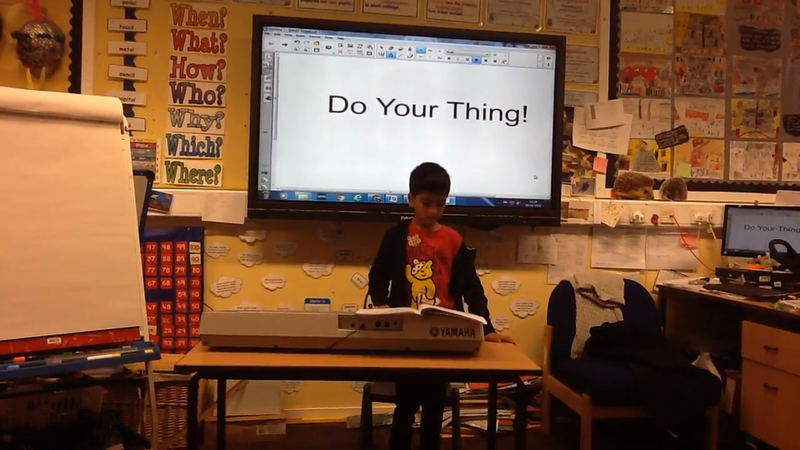 He can now play the keyboard with both hands. 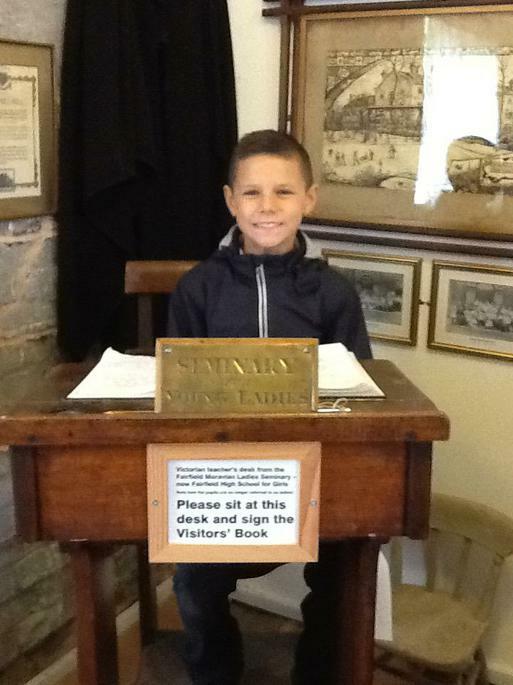 Finley is the best under nines bowler at Droylsden Cricket Club. 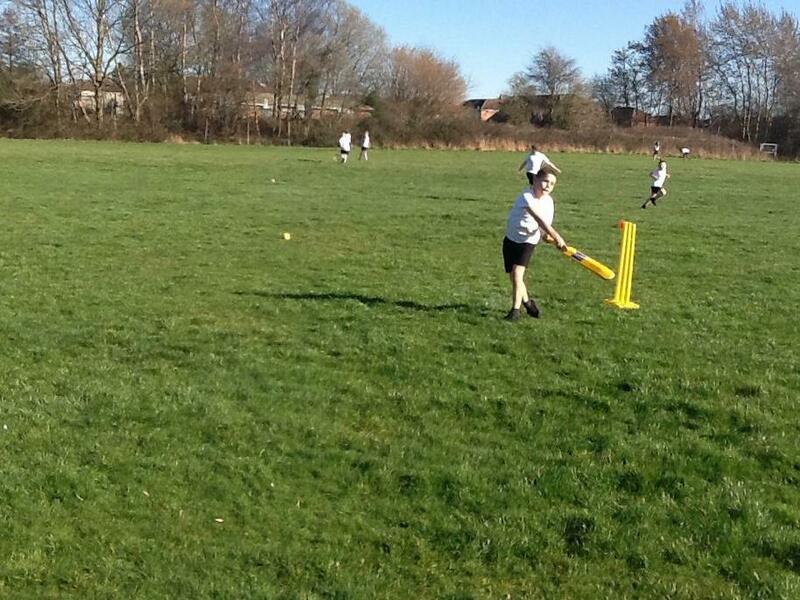 He has been playing cricket since he was four years old. 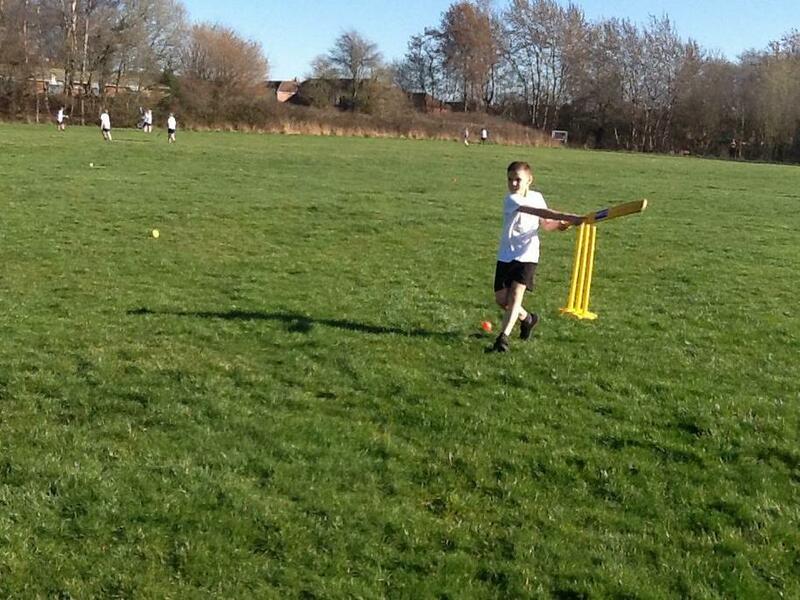 Eddie also plays cricket for 'Droylsden Cricket Club.' 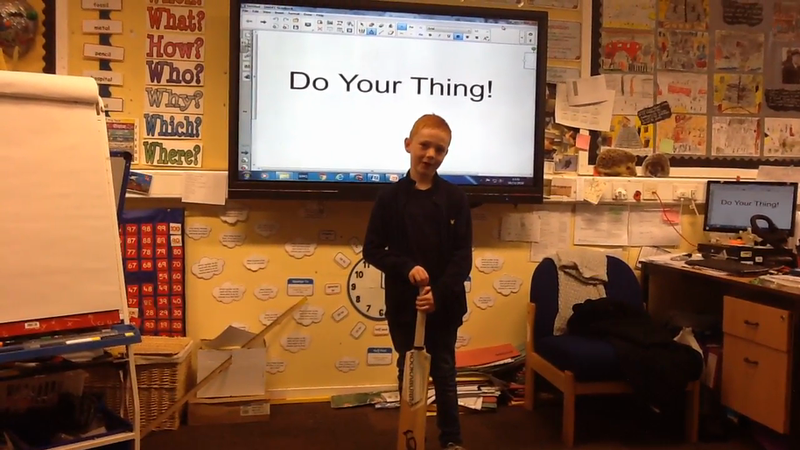 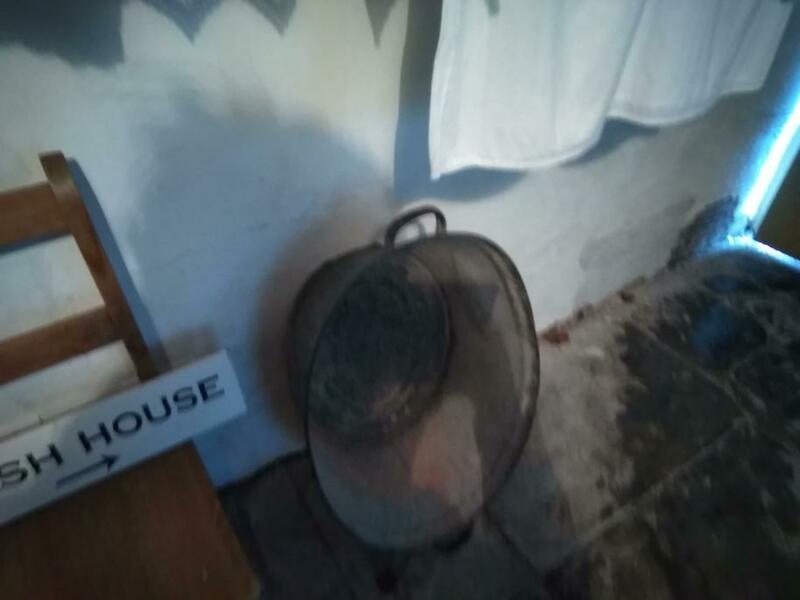 He demonstrated his batting technique. 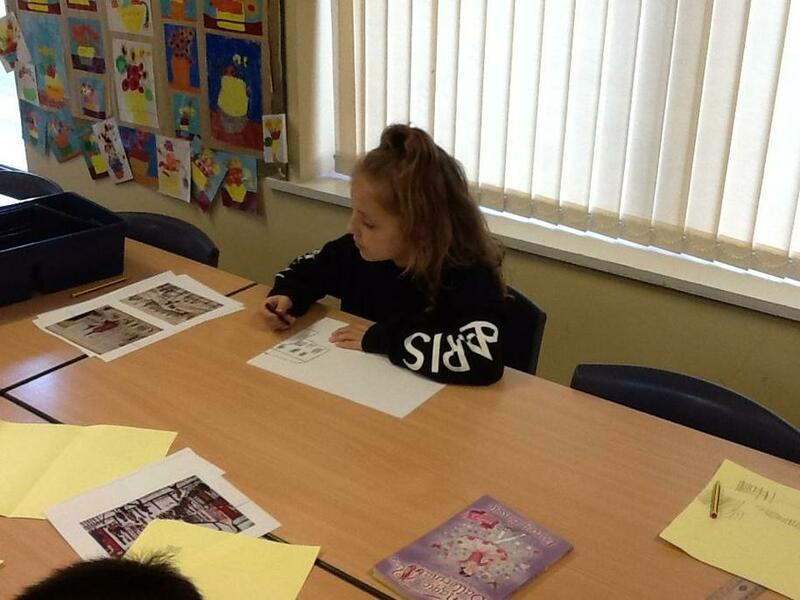 Lily-Mai attends T.C.A Tycoons. 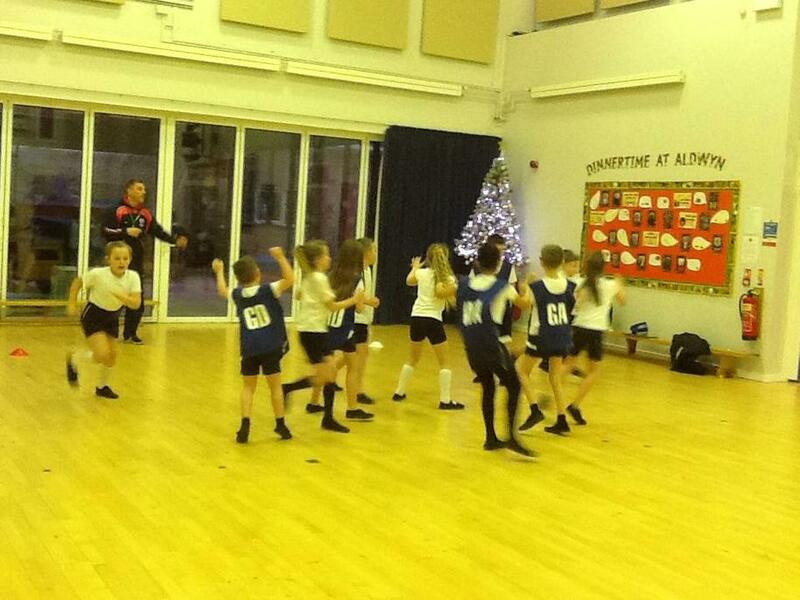 She demonstrated different jumps. 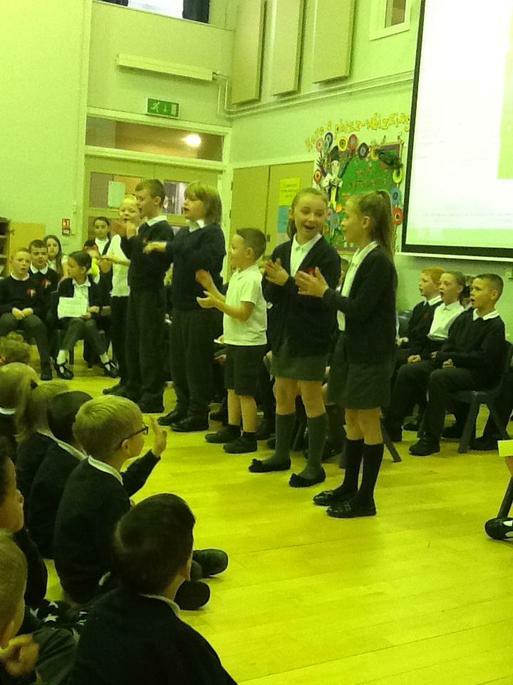 What a talented bunch we are.